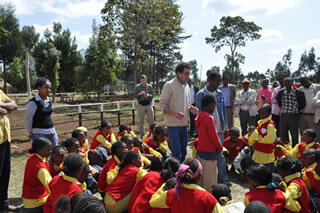 The site visit today was paid to Samire and Getet Elementary Schools. 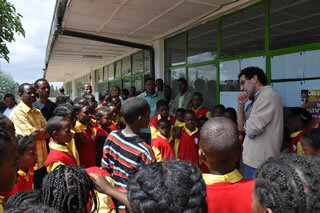 Both of these elementary schools are located farther away from the secondary school we visited yesterday. 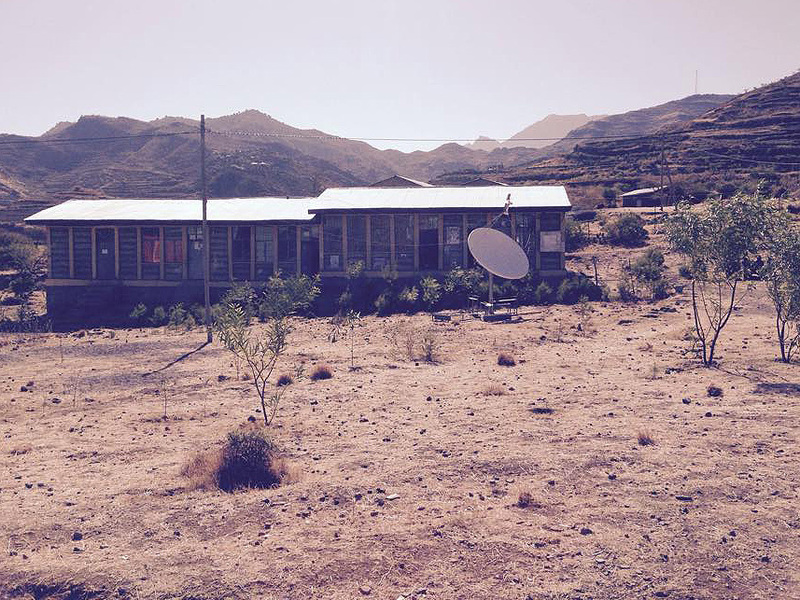 These schools are remote and isolated. 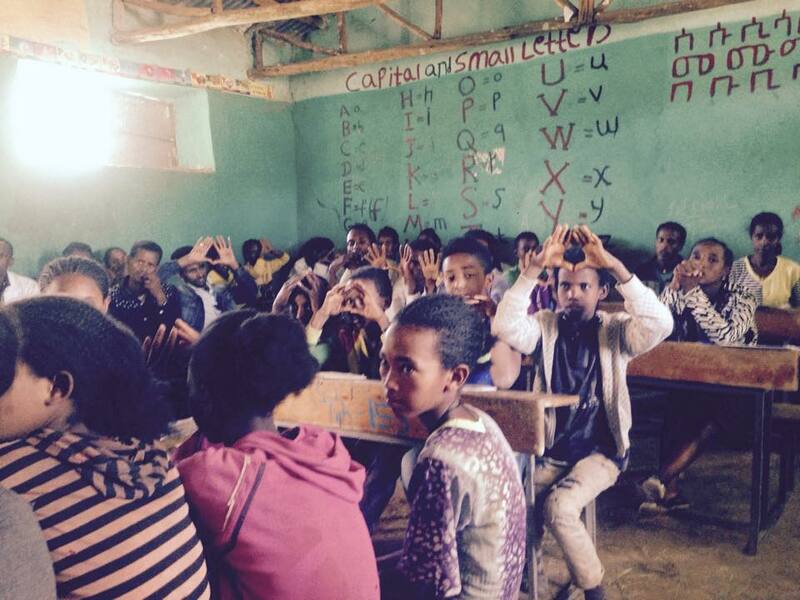 And the message here is that frequent follow up of these schools is very difficult given their location away from Mekele and the nature of the road that leads to them. 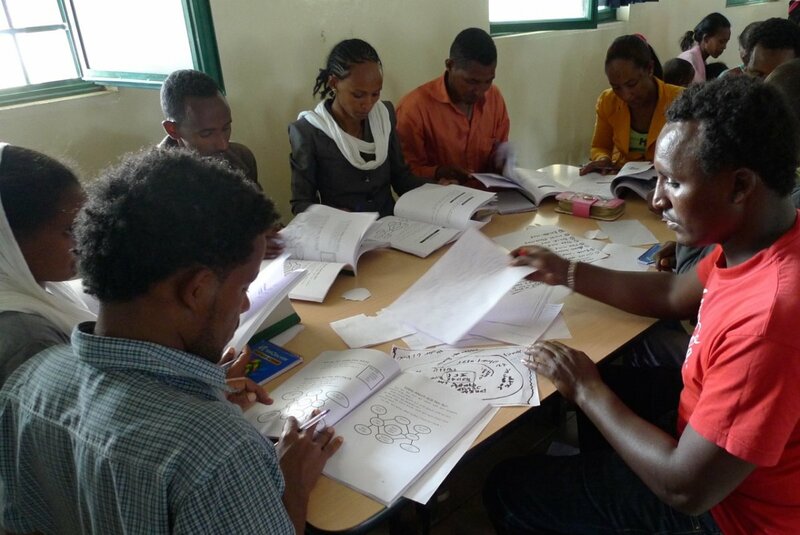 There are 31 teachers teaching in Samire elementary school of whom 12 took the two days training on thinking maps in Wukiro last October. 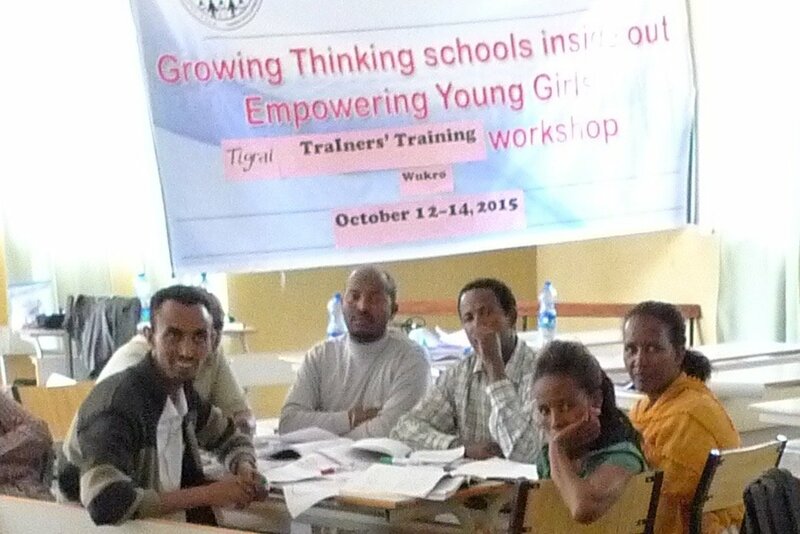 There is 1 ToT trainer who is at the same time the schools director whose name is Yisak. 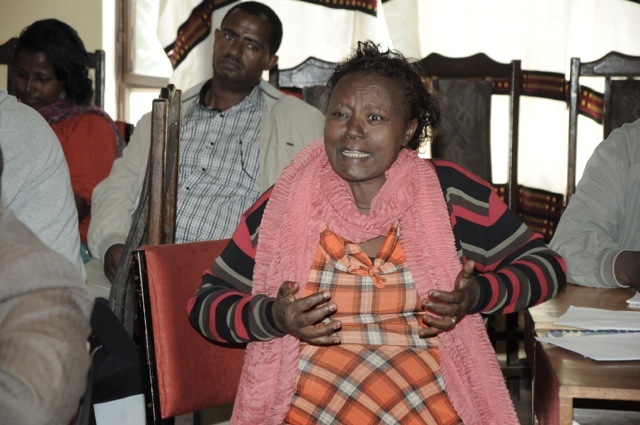 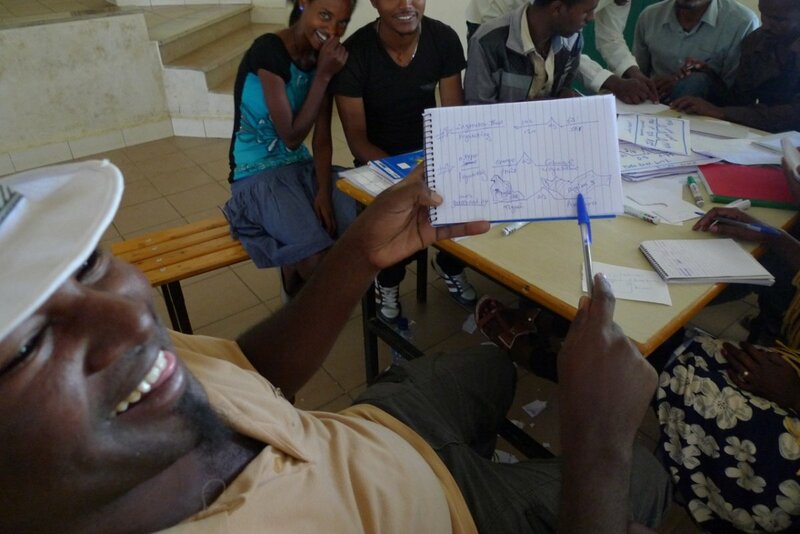 Robert easily remembers Yisak who was very active leading community building exercises in Wukiro. 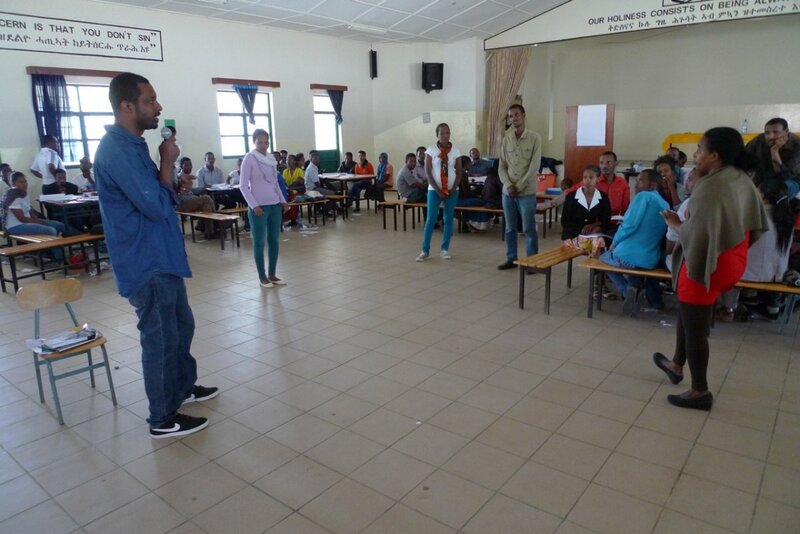 [Robert – ‘Yisak was very active with his team as a ToT and equally at ease working with the whole group of 400 teachers in the training. 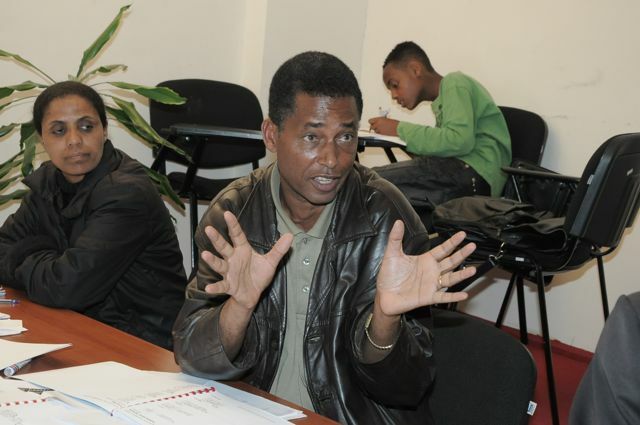 He is an example of the talent amongst the ToT’s that can become the leaders of expanding to schools throughout the region, and country.’]. 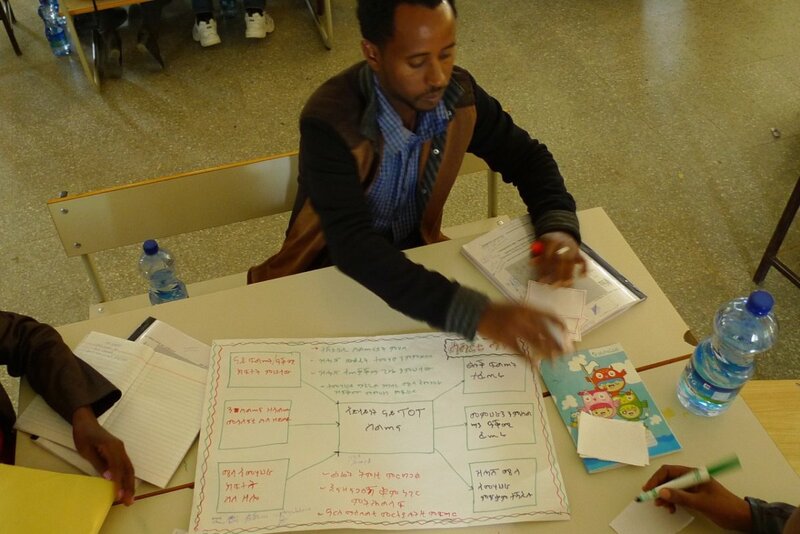 His school is one of the leading schools in terms of implementing Thinking Maps and actually using Thinking Maps. 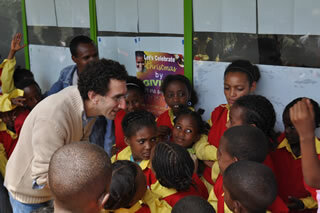 The other school was Getet Primary School. 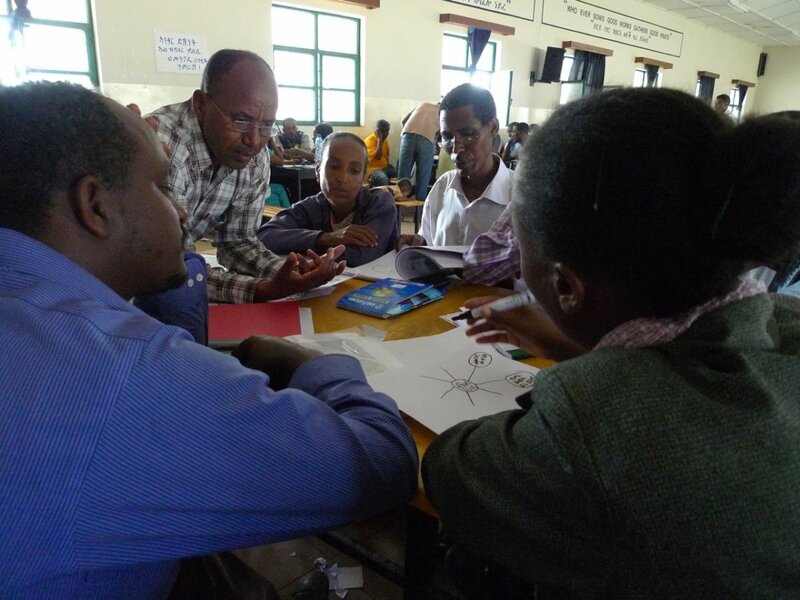 Getet Primary School had its director took part in the two day thinking maps training in Wukiro. 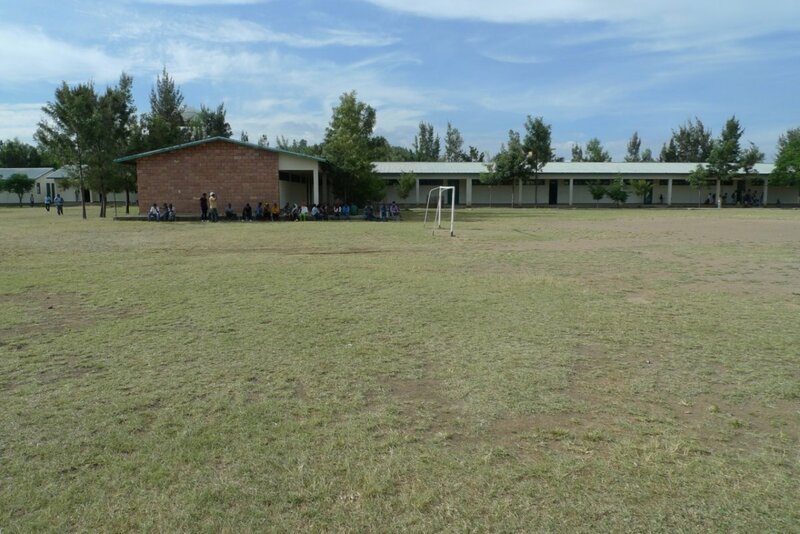 But later was transferred to a different school. 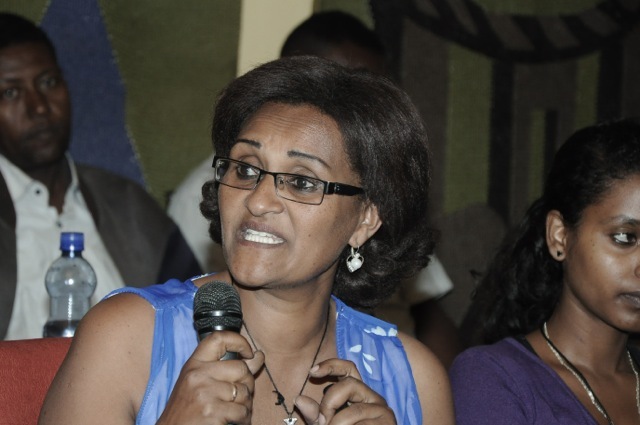 Currently there is an acting director. 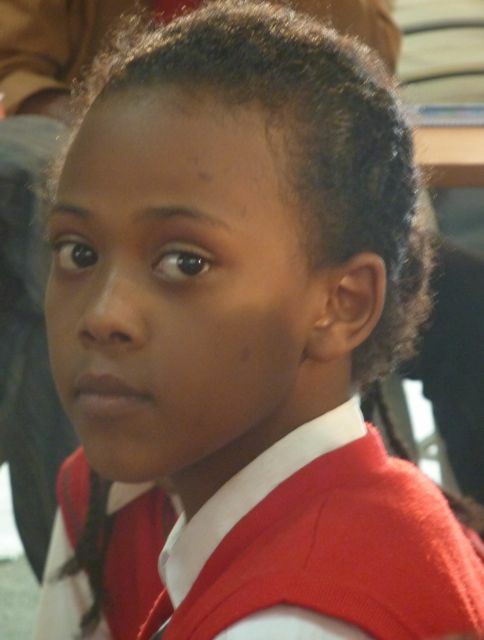 Her name is Etsayi. 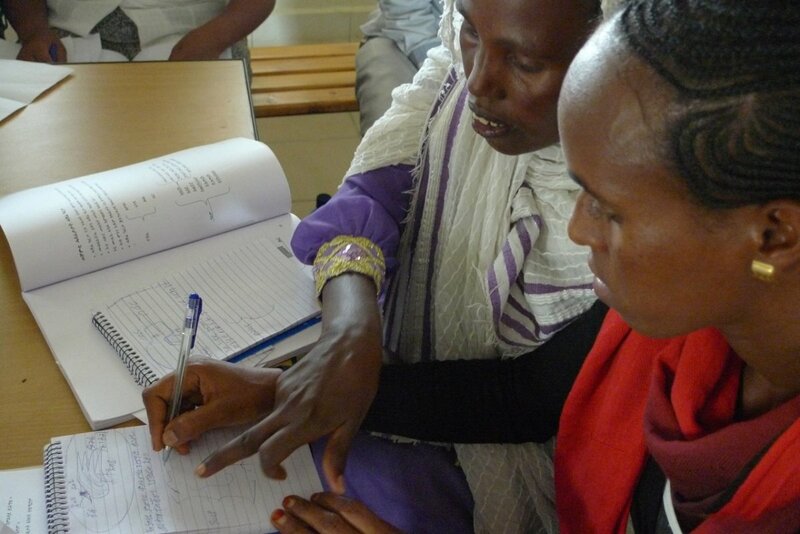 There are 38 teachers in the school of whom 13 were trained in Wukiro. 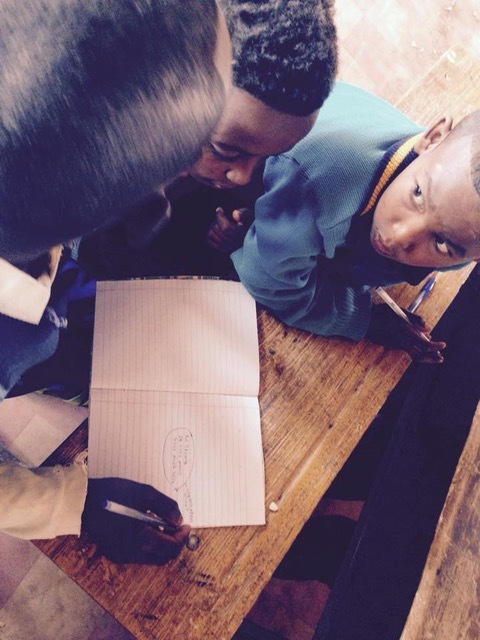 Then students were given homework. 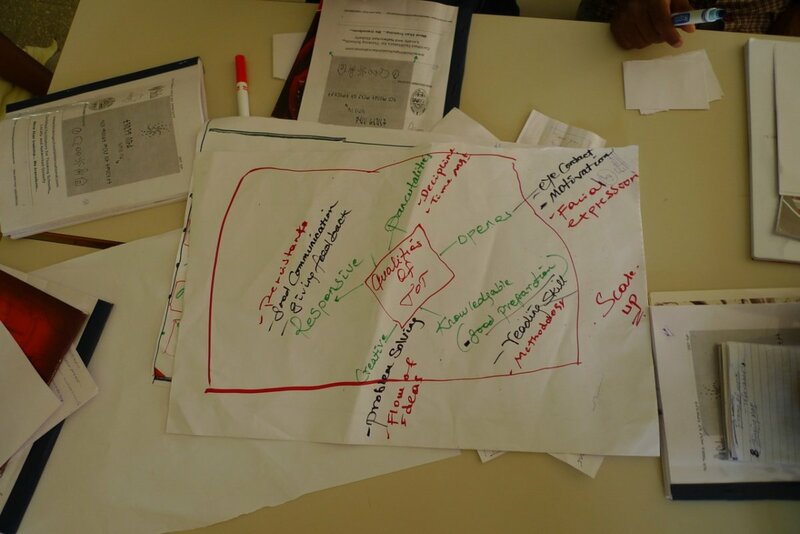 We began the training with a mini professional development as usual in which reviewed the thinking schools model and discussed the research basis of use of visual tools, followed by the collegial coaching model to do the demonstration lessons. 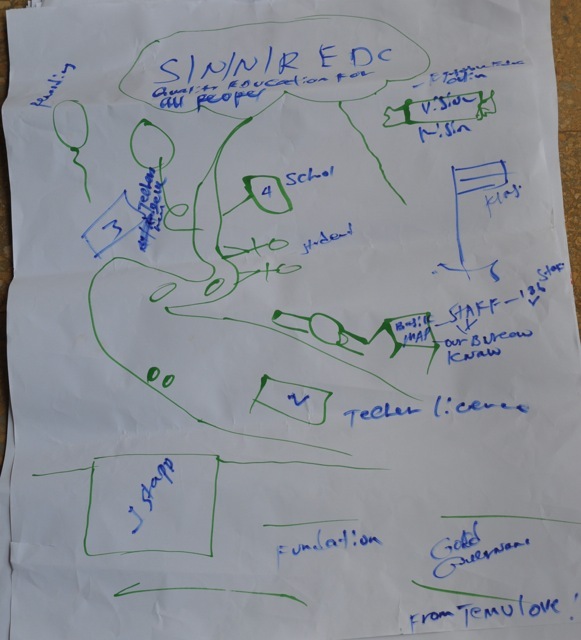 During the Debriefing session teachers reported that they have seen how they could actually use the maps with content in their class rooms. 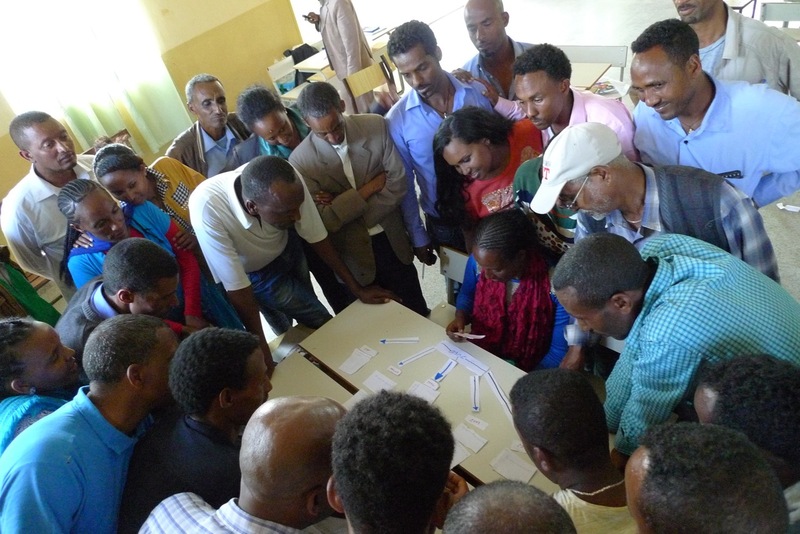 At Getet site, Atsede modeled the use of bridge map for seeing analogical relationships of different lines in geometry. 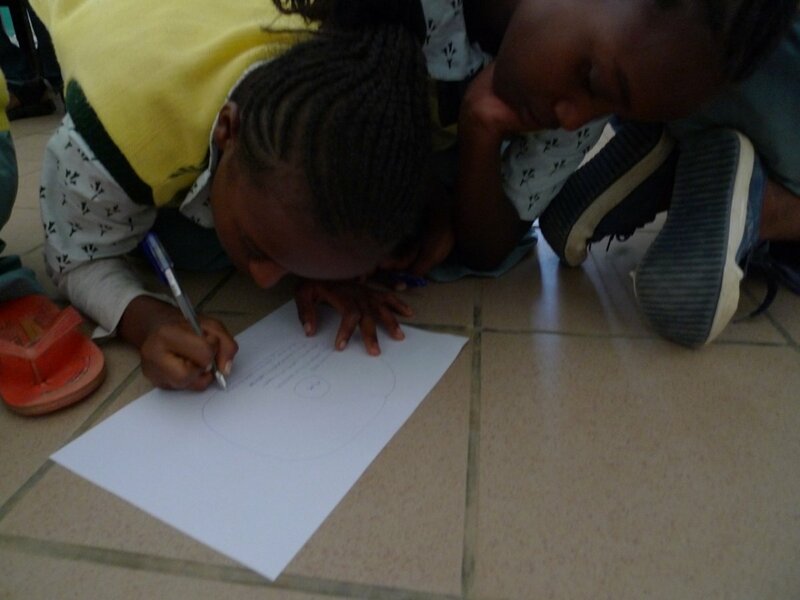 The lesson is about a circle and its dimensions (chord, diameter, tangent, radius). 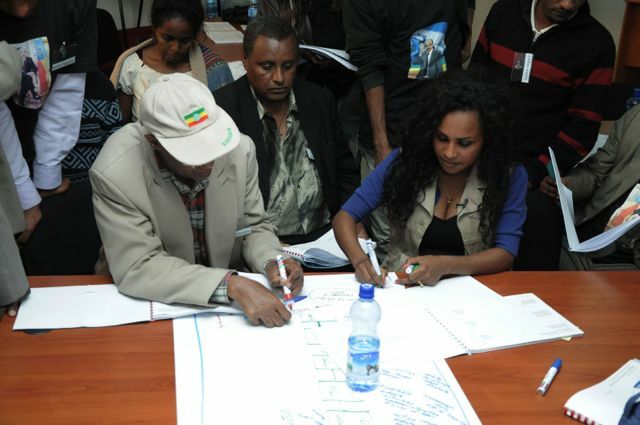 The model of Bridge Maps Atsede used with a student is such that a chord is drawn on the upper side of the bridge and its name and definition put in the lower side, as diameter is pictorially represented with its definition in the lower side as radius above and its definition below (see photo of this analogy). 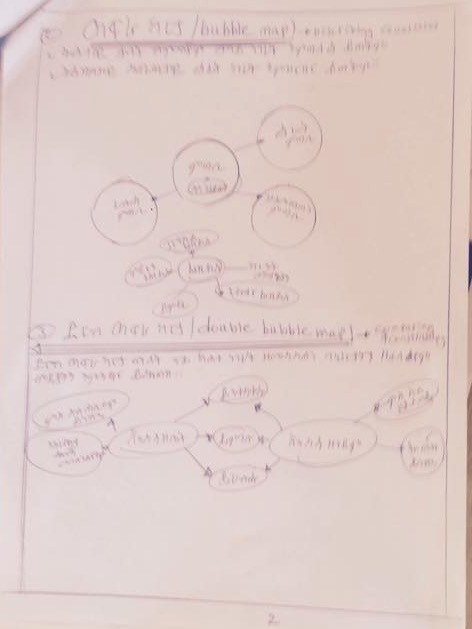 She modeled the use of Double Bubble Maps to compare and contrast a chord and a diameter which the students were later asked to work on their own in pairs and groups. 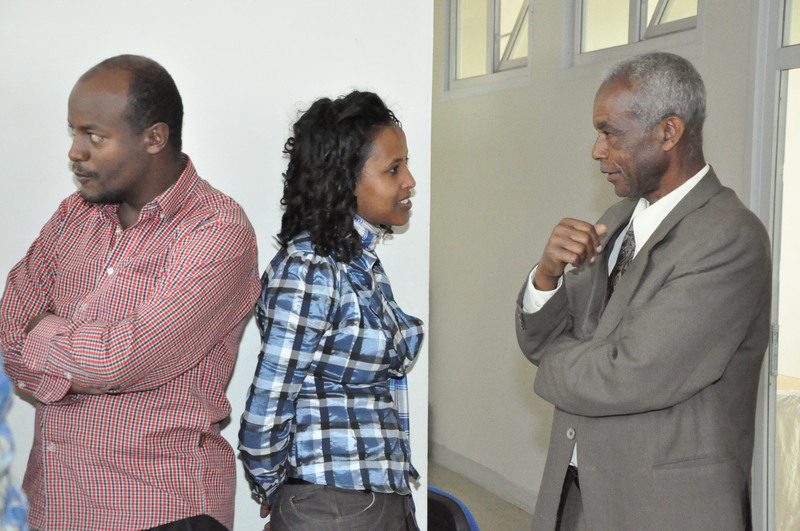 Final students were given chances to present their works before the class. 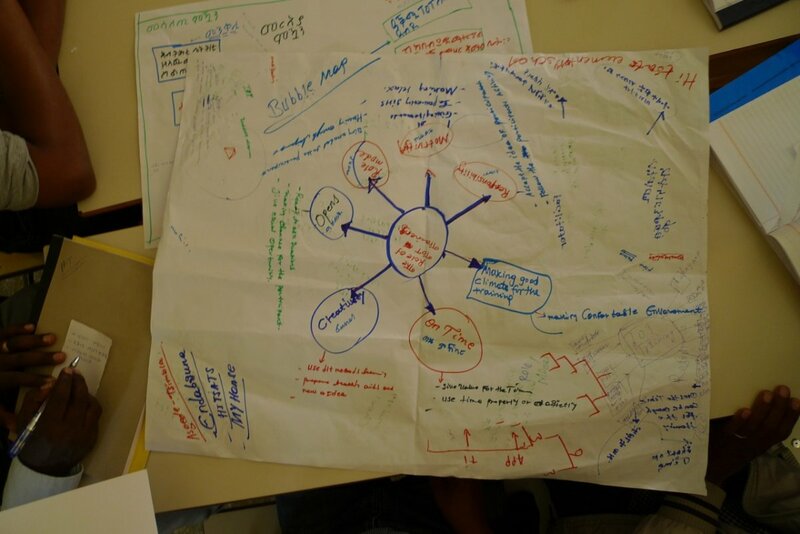 Information and concepts were consolidated. 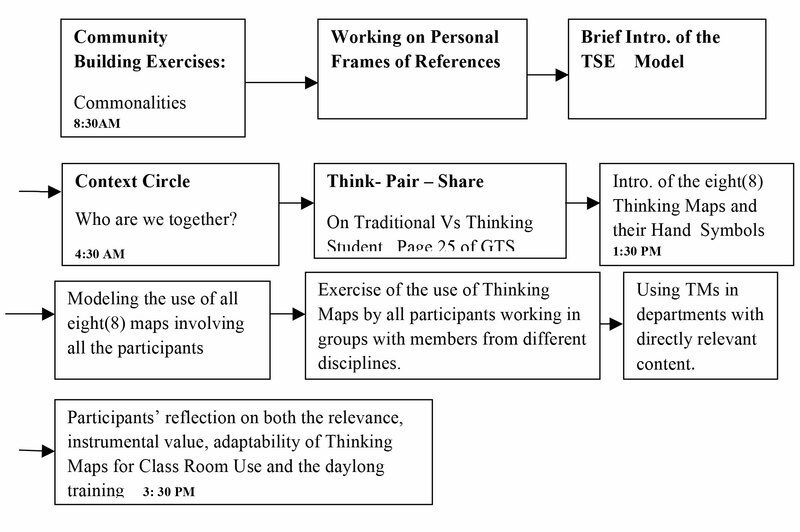 Ataede then introduced each of the eight thinking maps to all students in both cases modeling for the teachers how they could introduce the maps for their students . 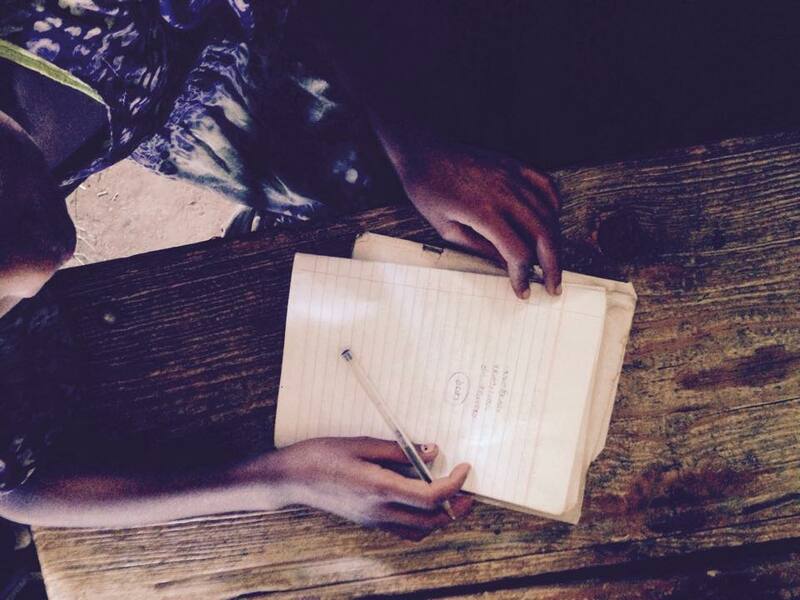 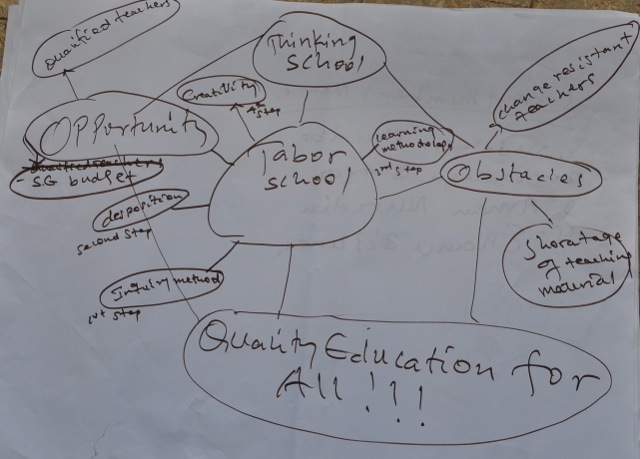 One important note is that trained teachers at Samire Elementary School have transferred their trainings or Thinking Maps to other teachers and have prepared handouts of Thinking Maps which they have shown. 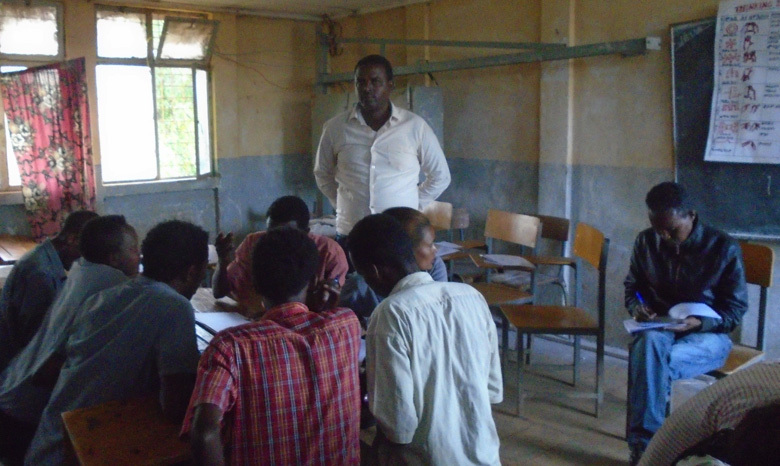 The school director of Getet primary school was assigned to other school he was one of the ToT trainers. 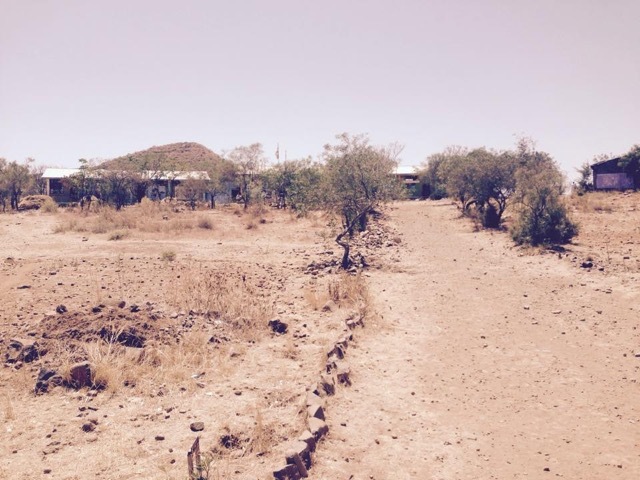 We would like to emphasis the fact that the remoteness and isolated locations of the school coupled with road quality may hamper frequent follow up and support for the schools. 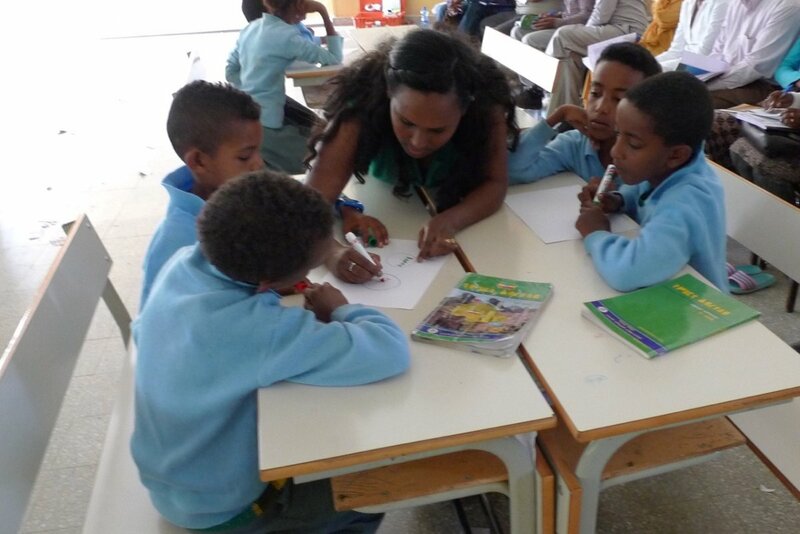 sharing photos from Ethiopian schools from my trips to Ethiopia collaborating with my Ethiopian colleagues Atsede and Dagim in schools there, including a photo of historic Aksum. 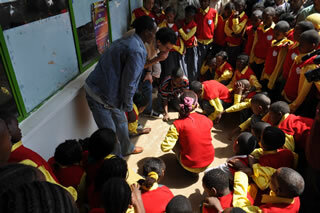 We continued our site visits today with an elementary school called Hayikmesay. 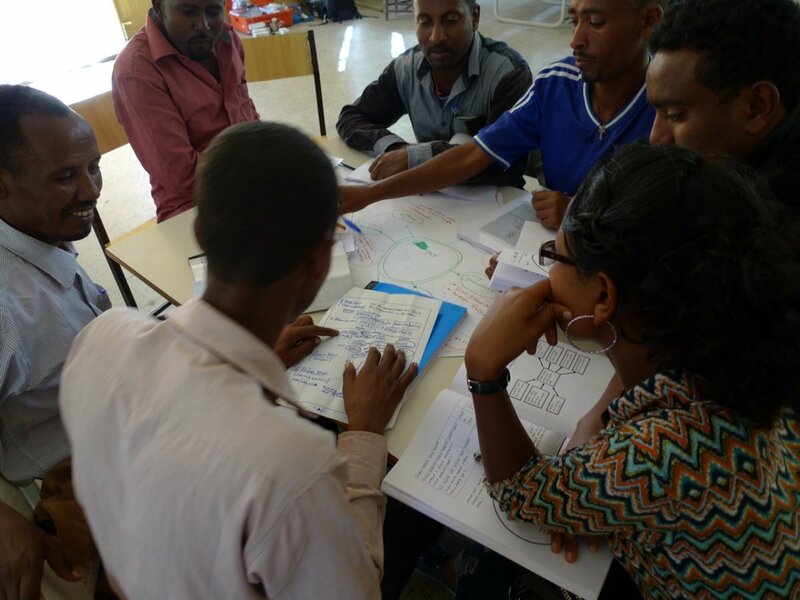 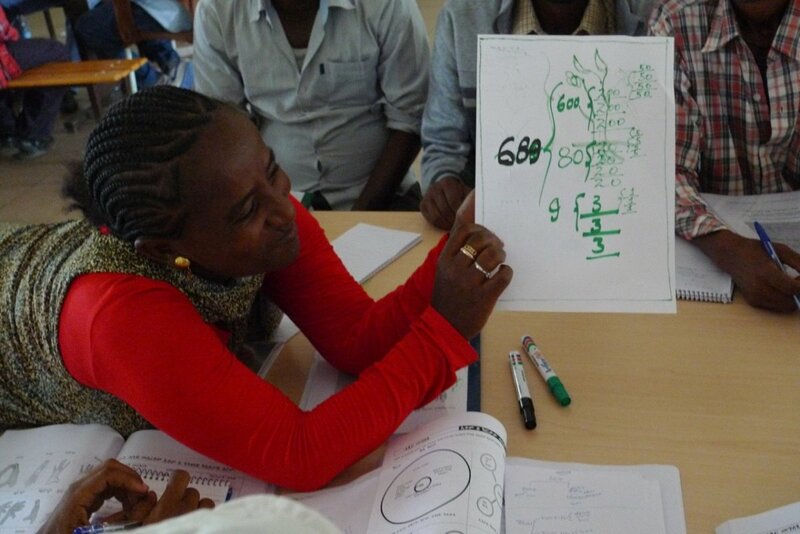 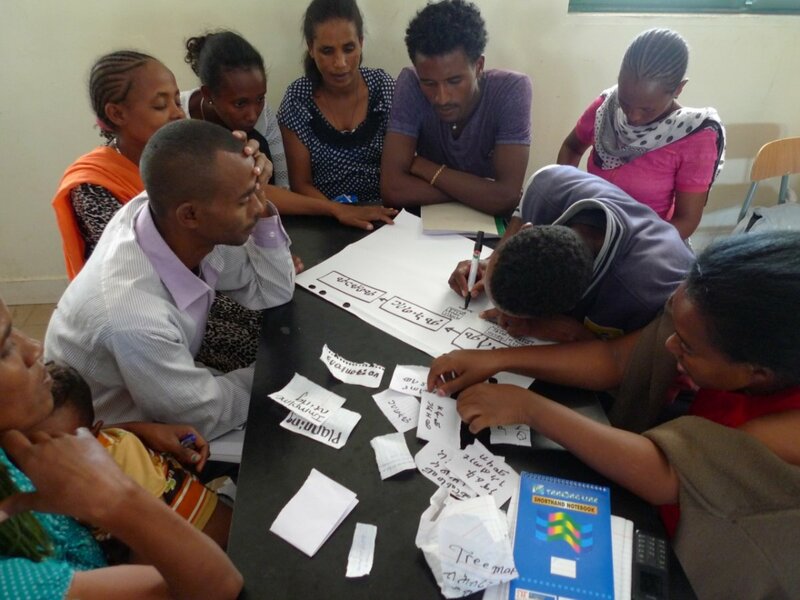 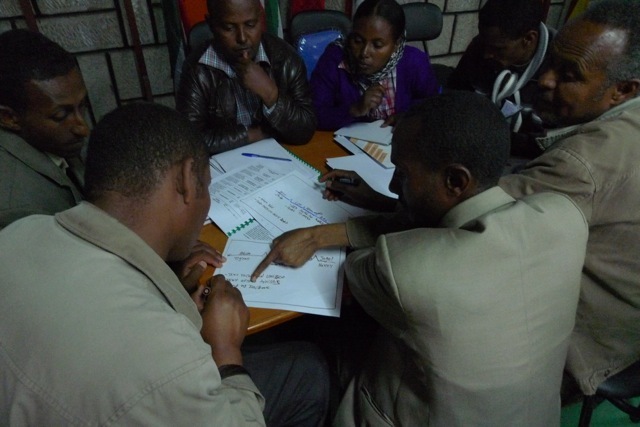 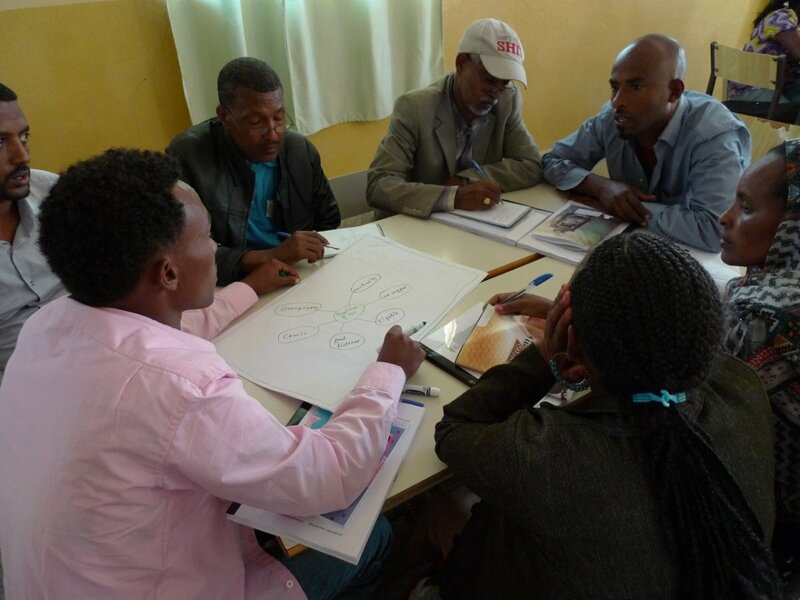 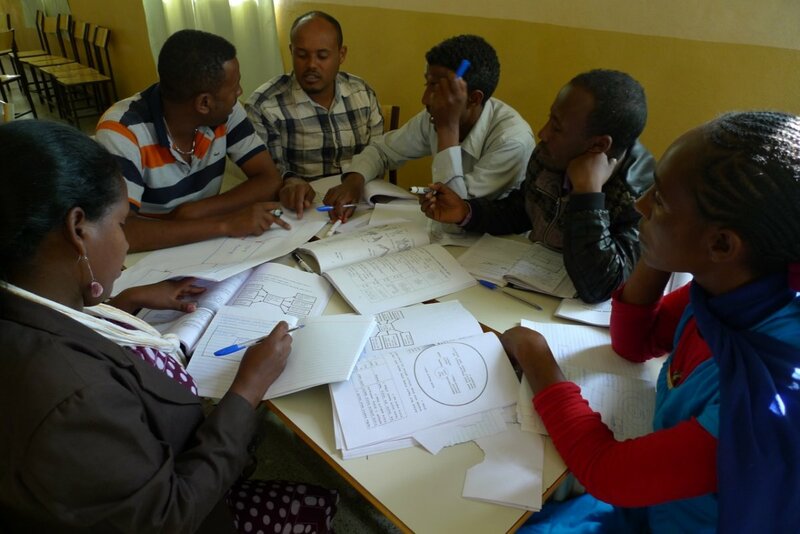 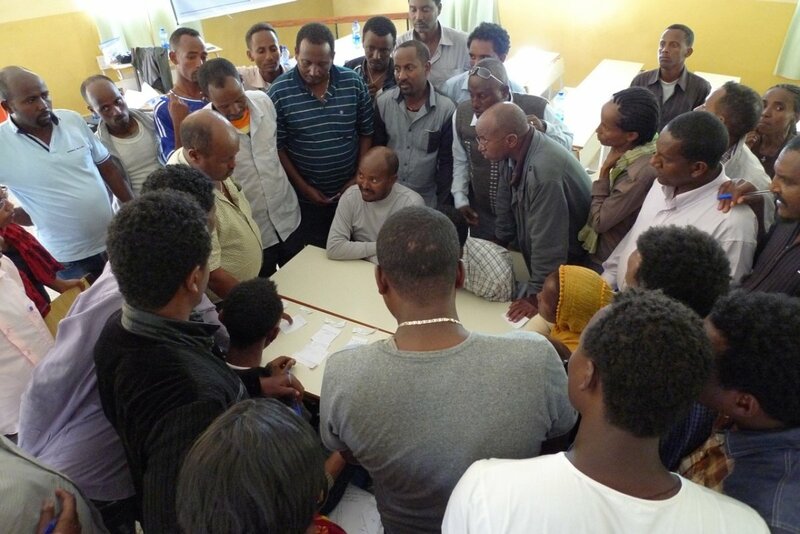 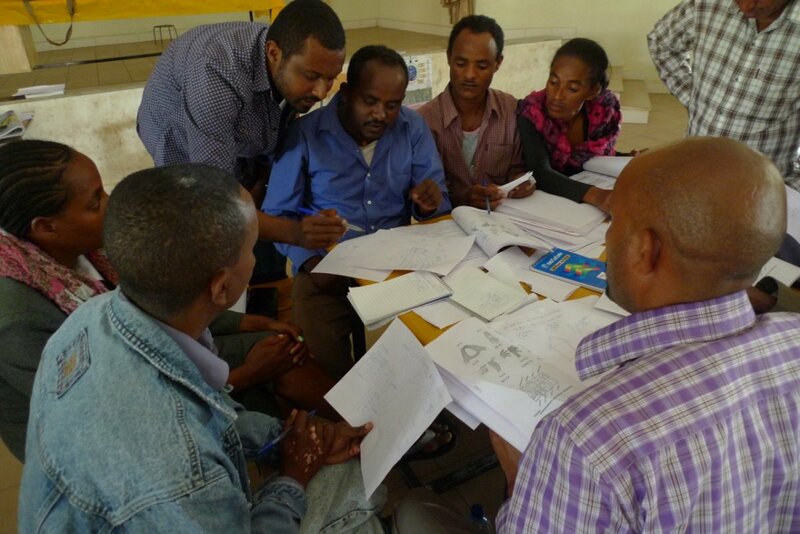 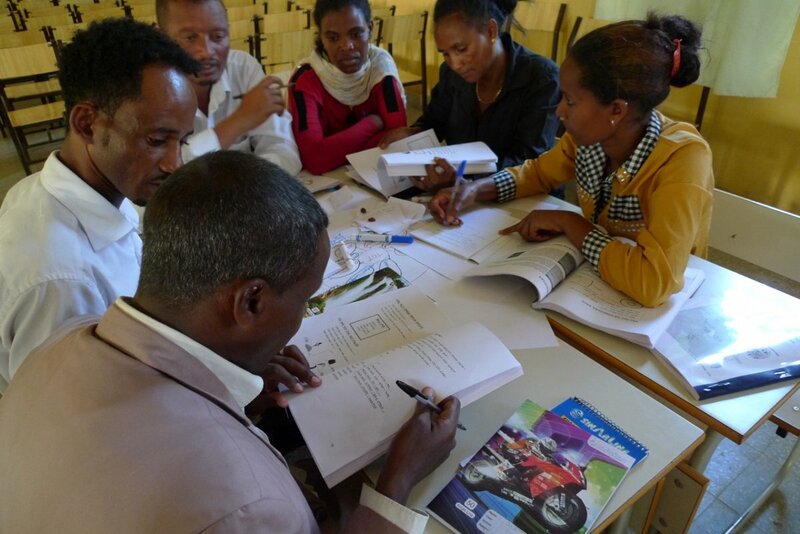 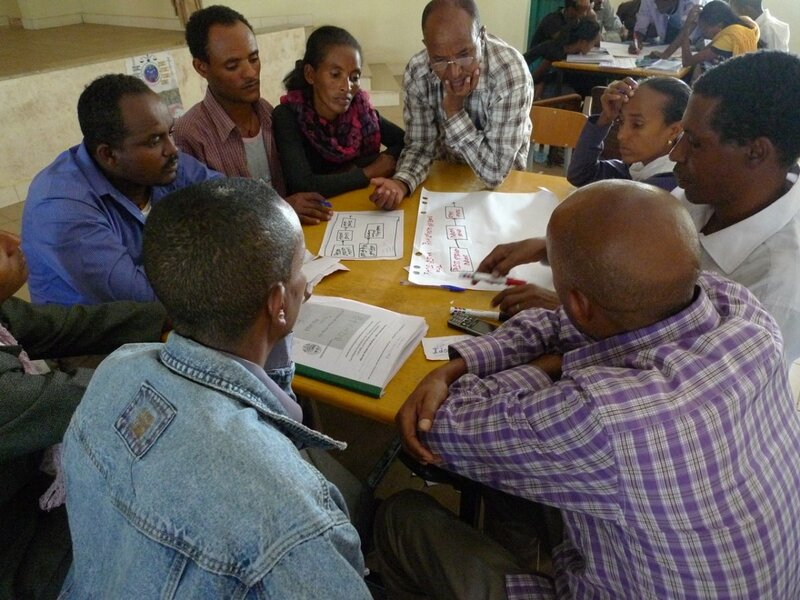 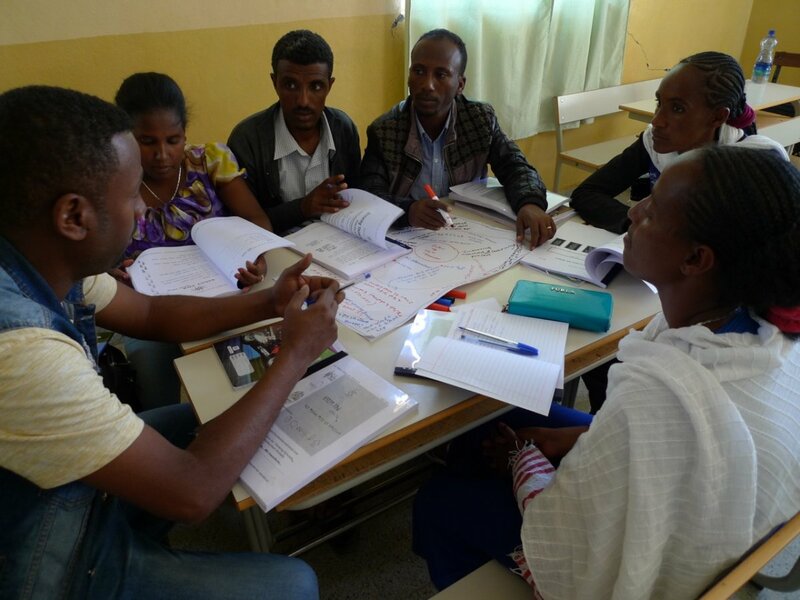 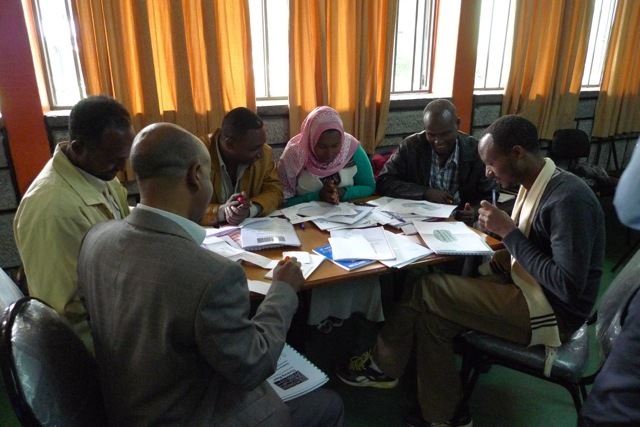 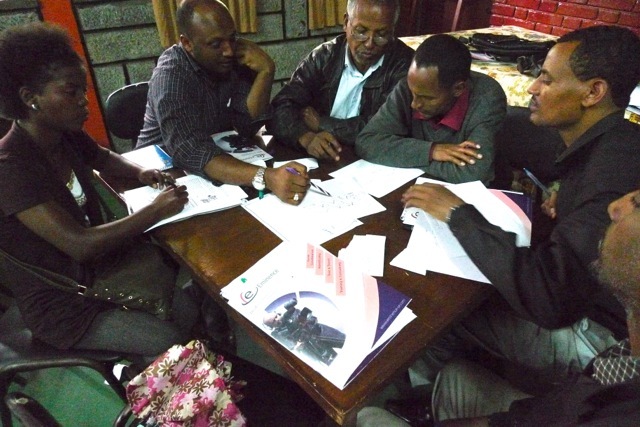 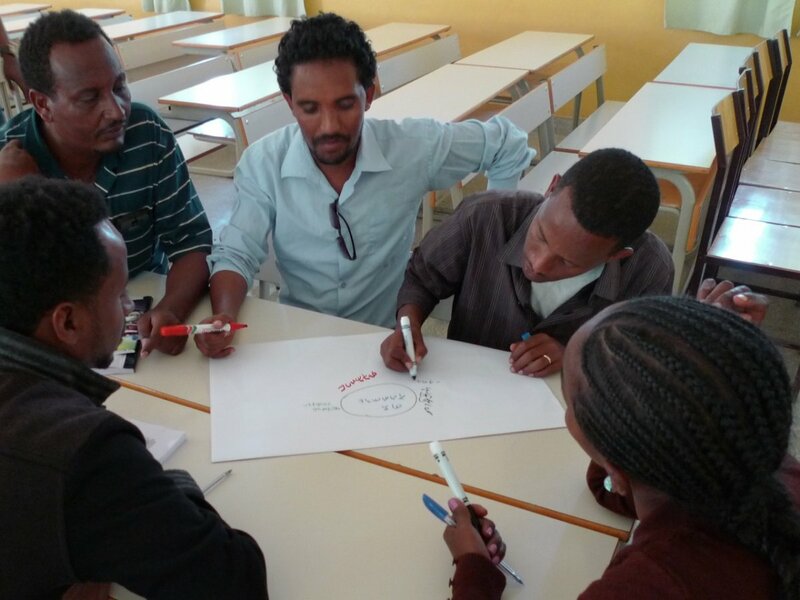 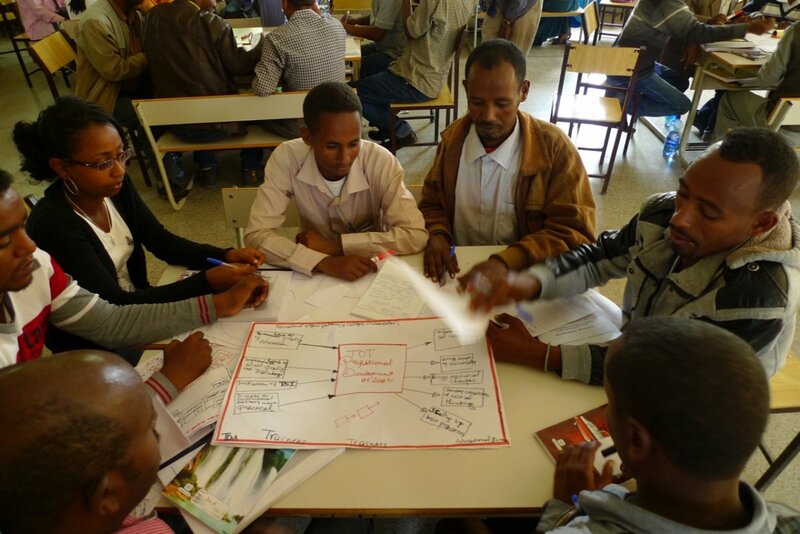 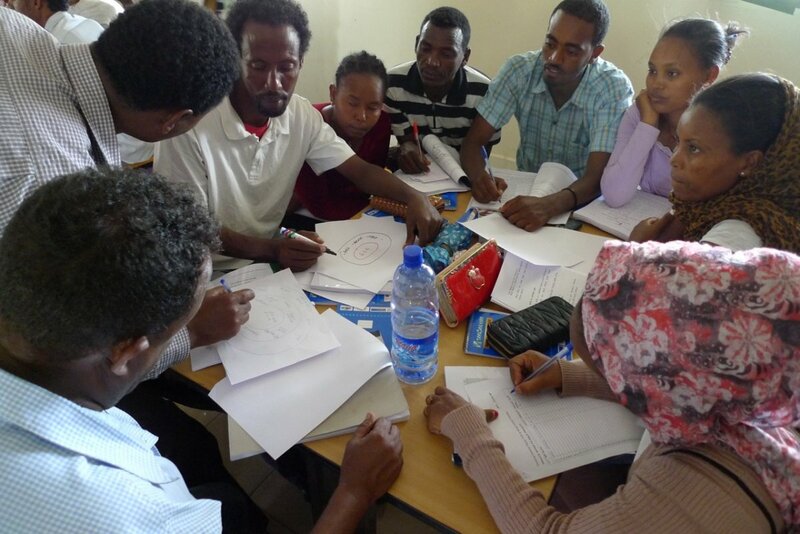 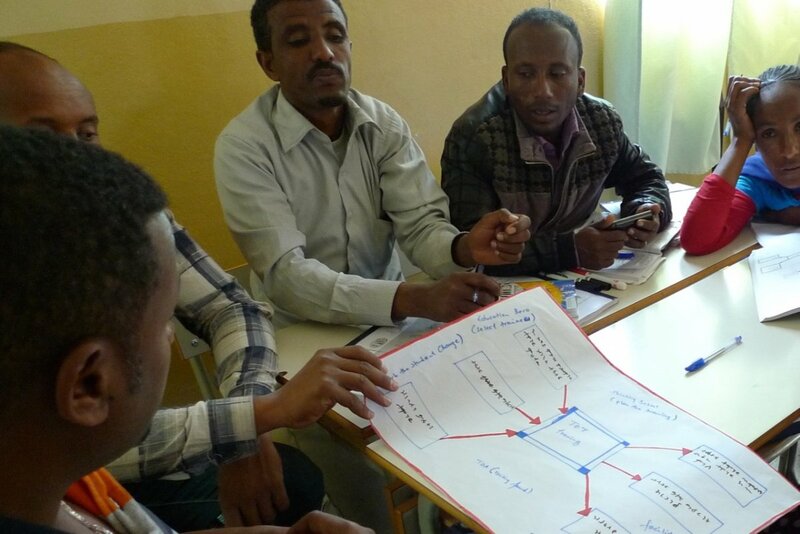 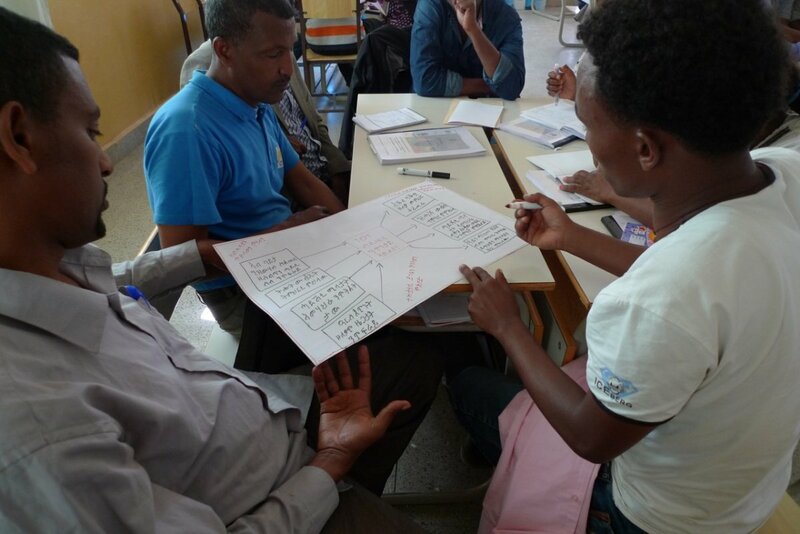 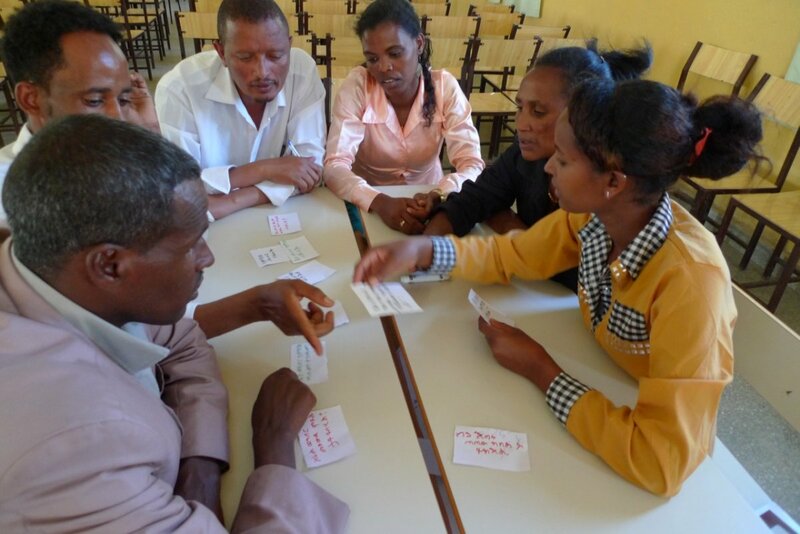 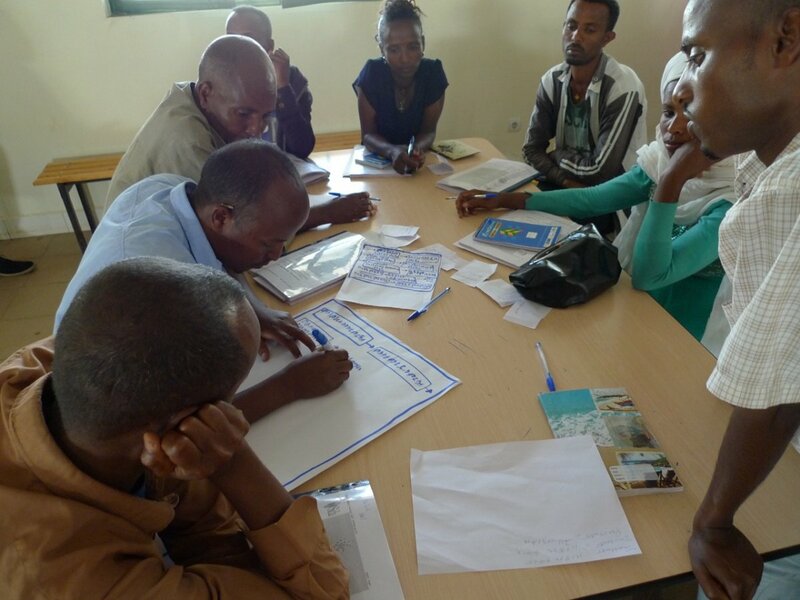 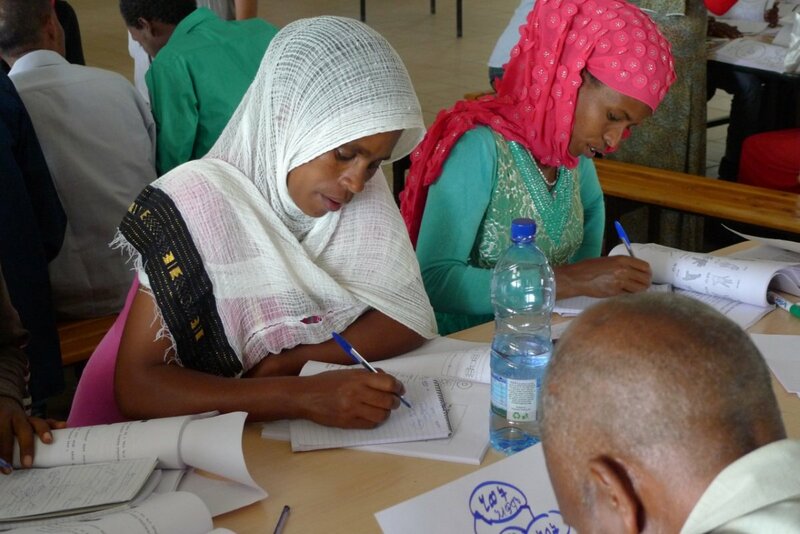 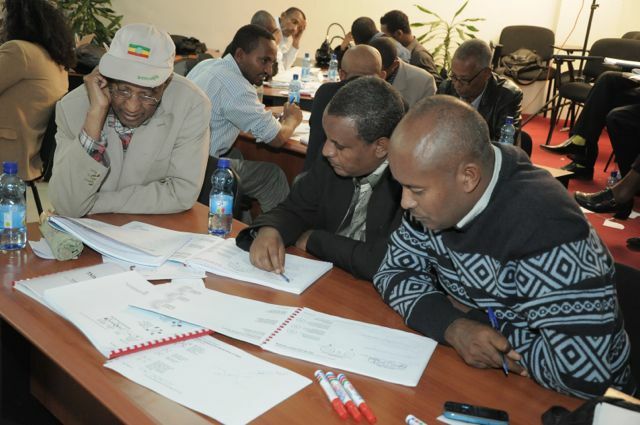 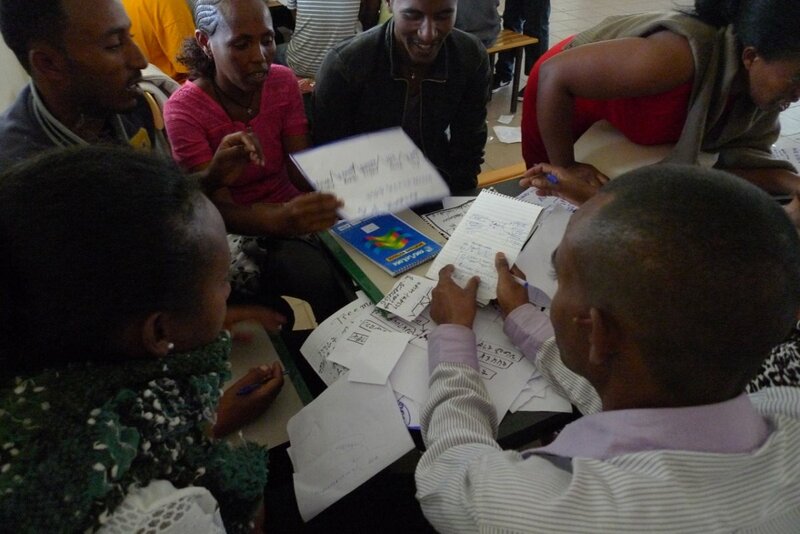 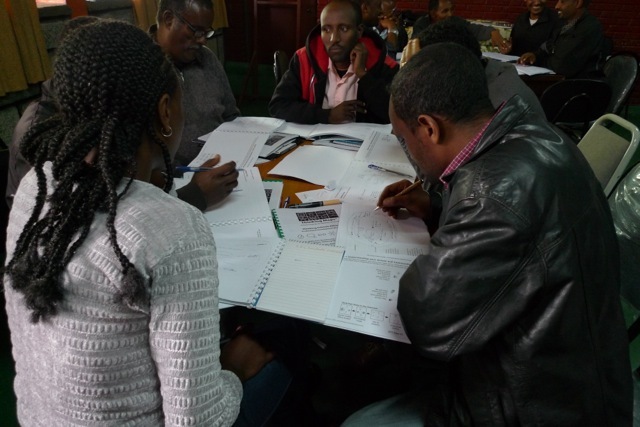 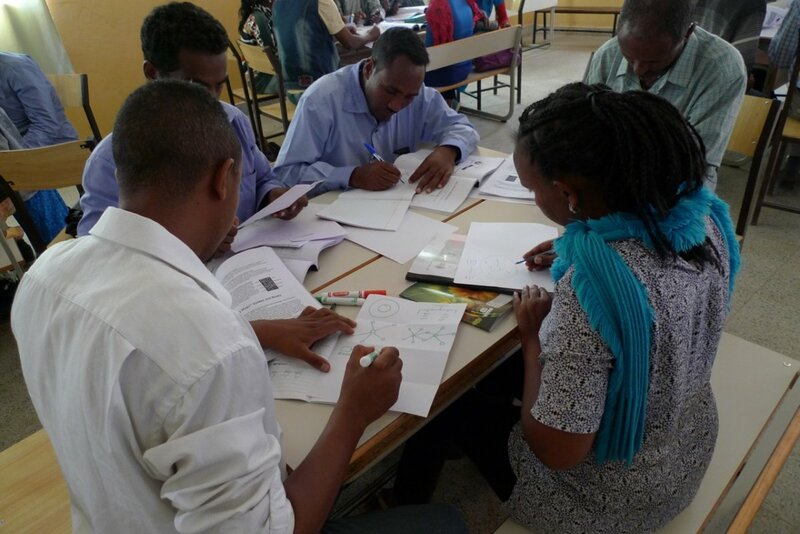 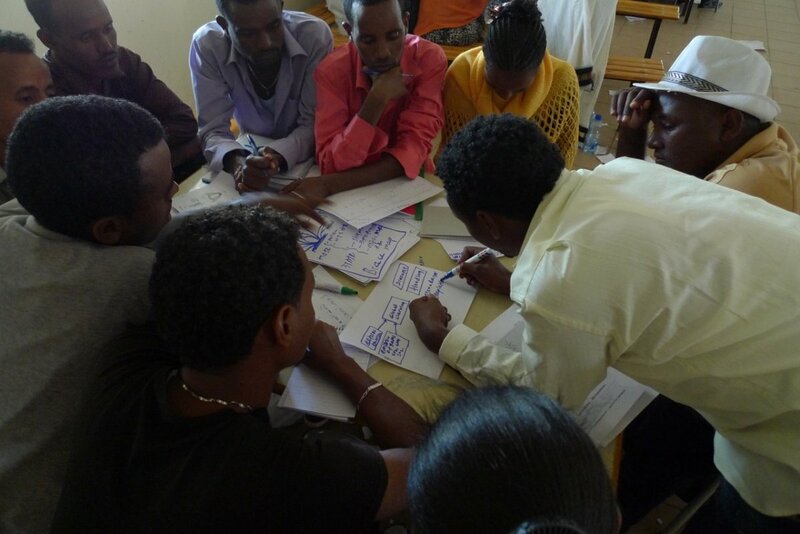 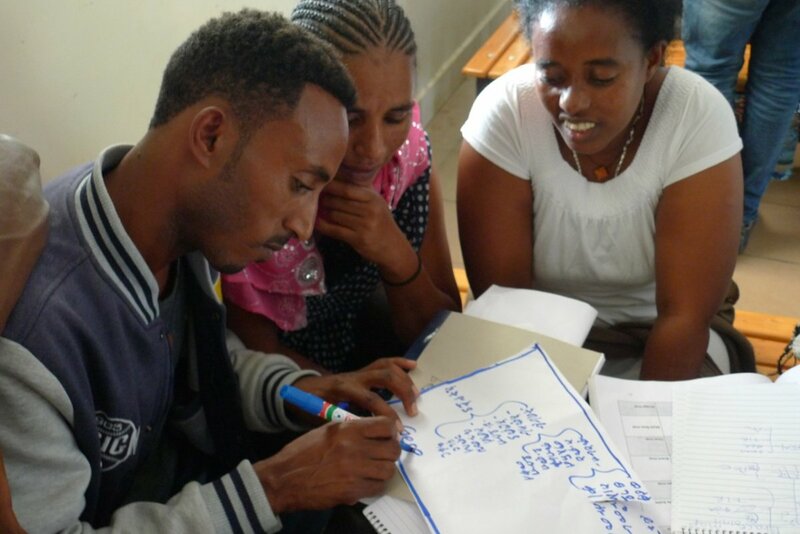 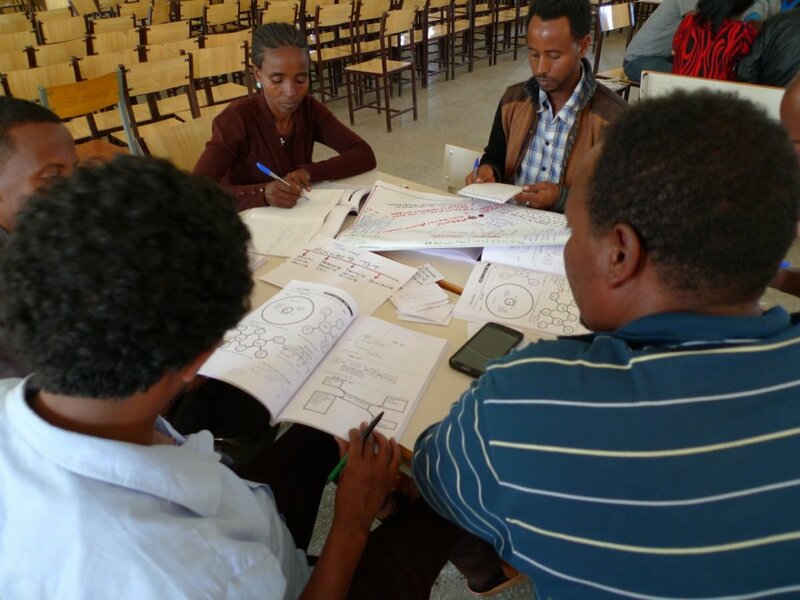 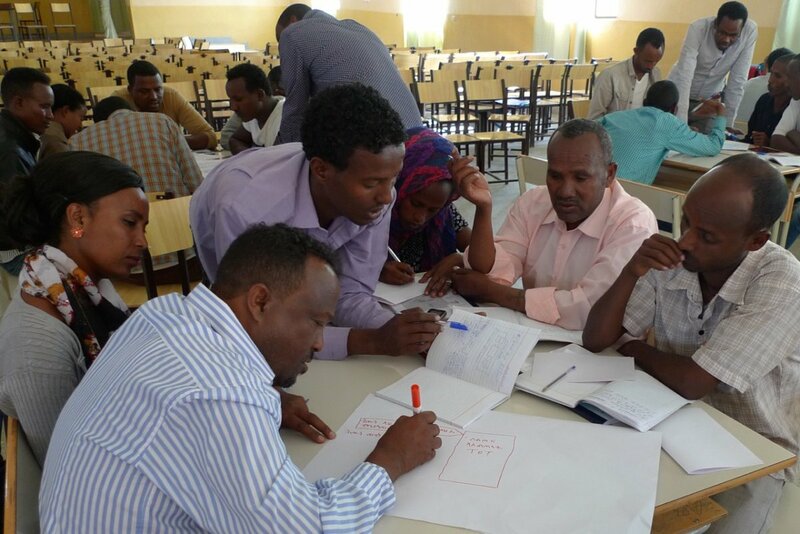 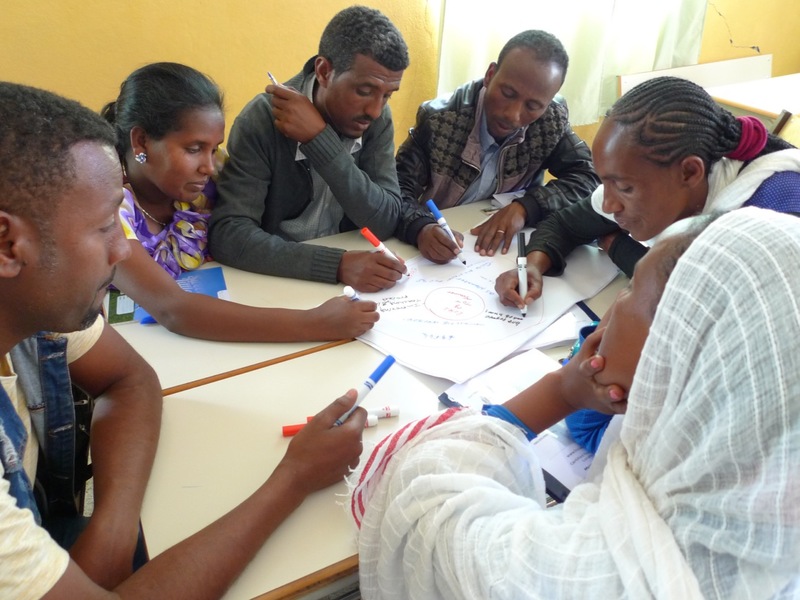 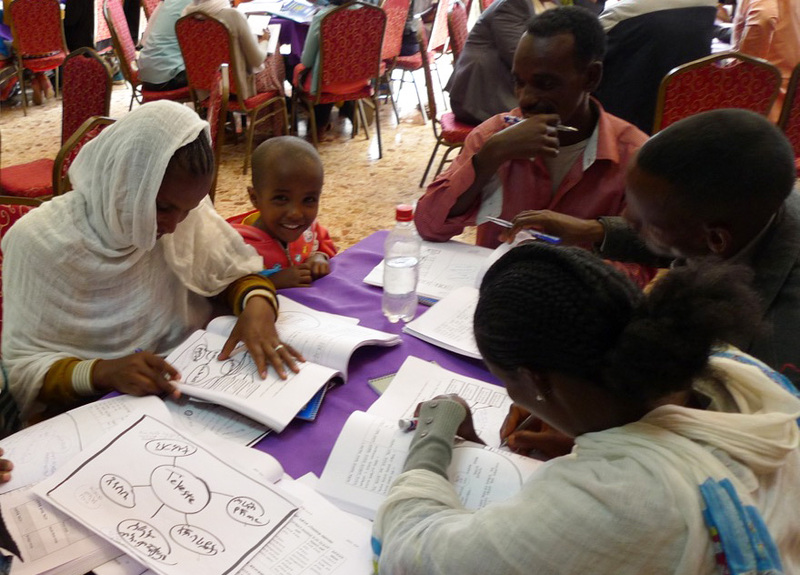 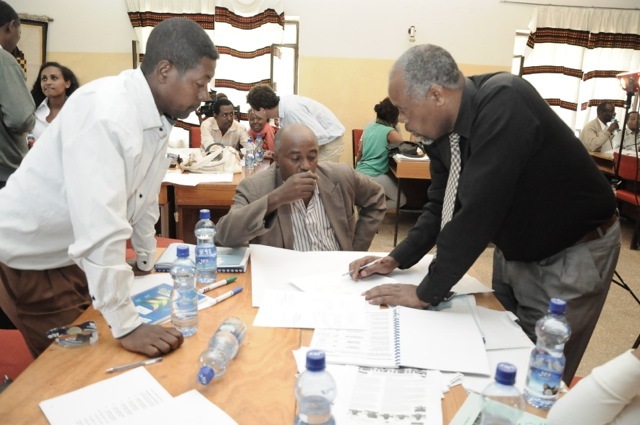 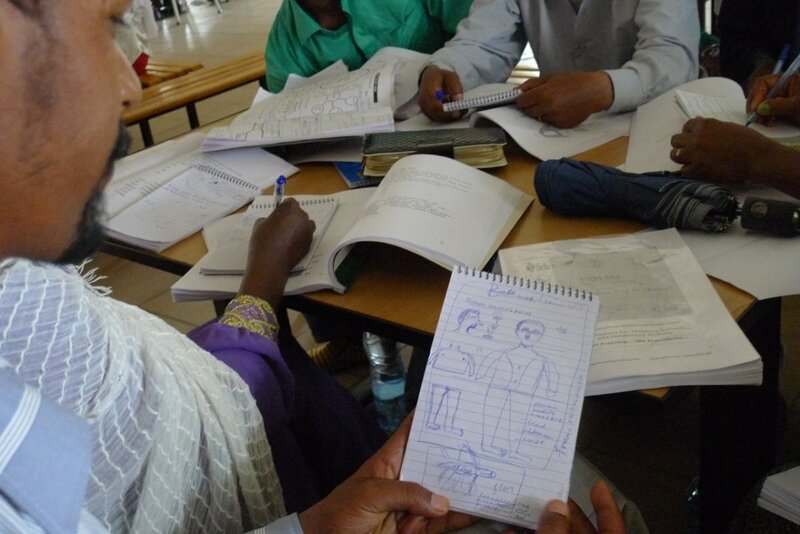 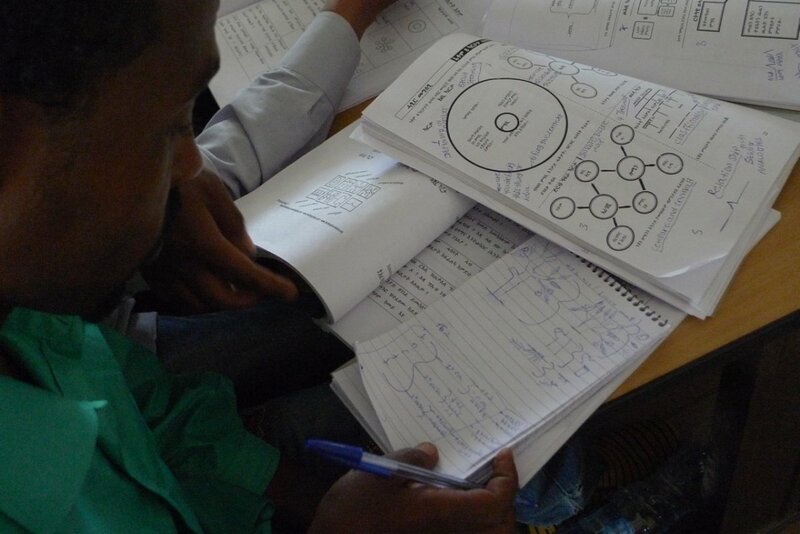 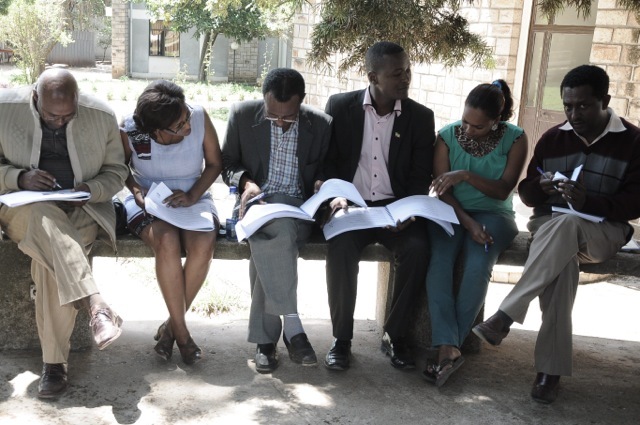 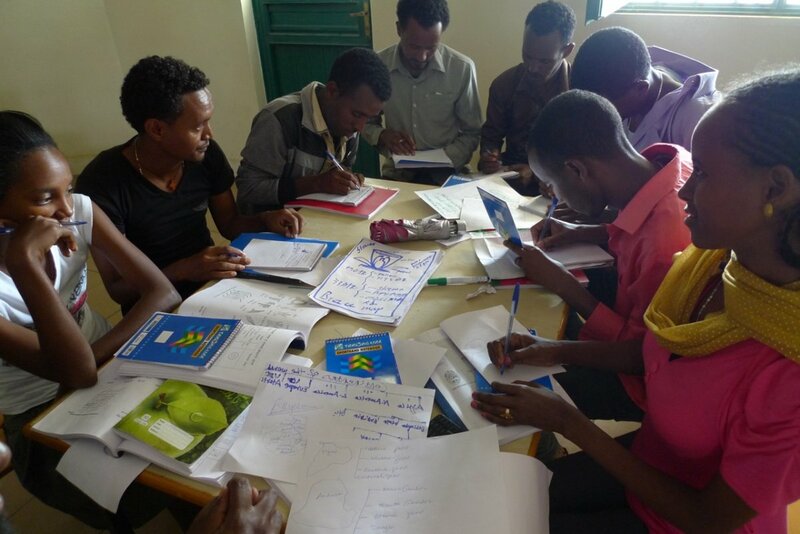 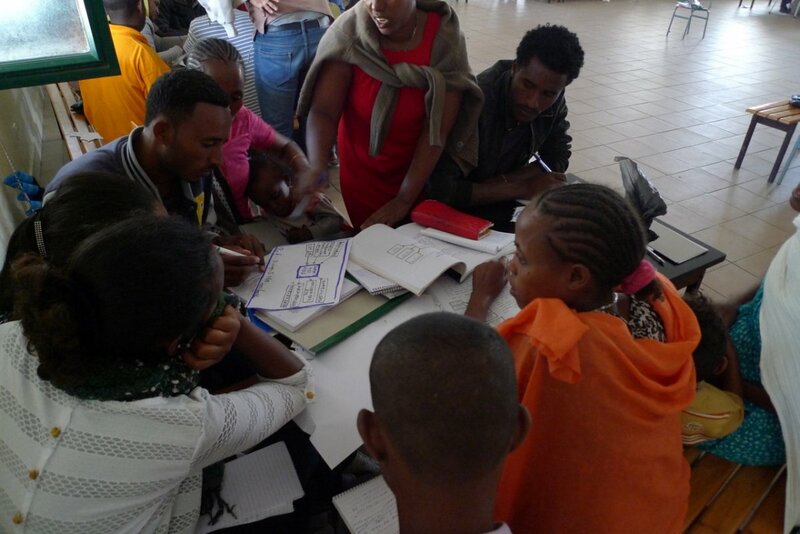 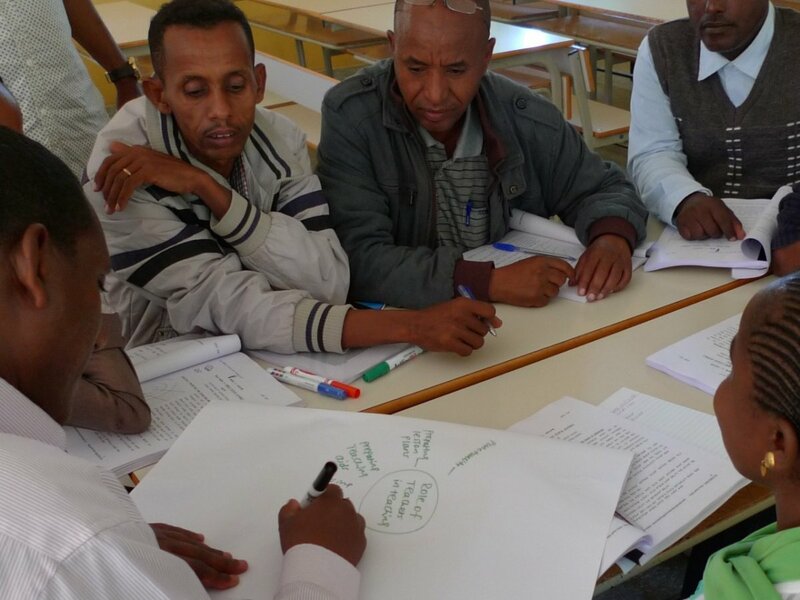 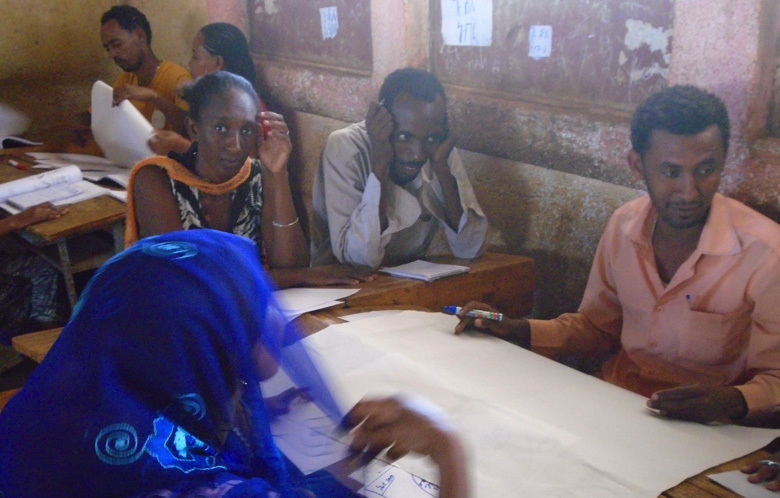 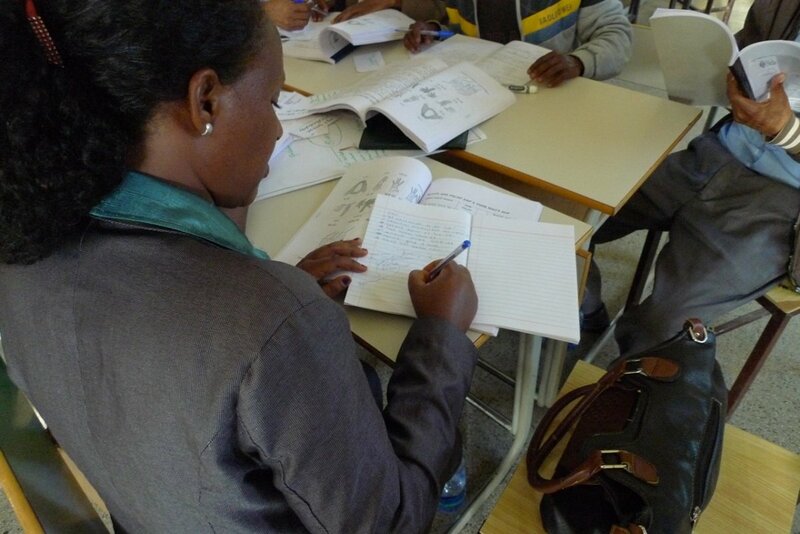 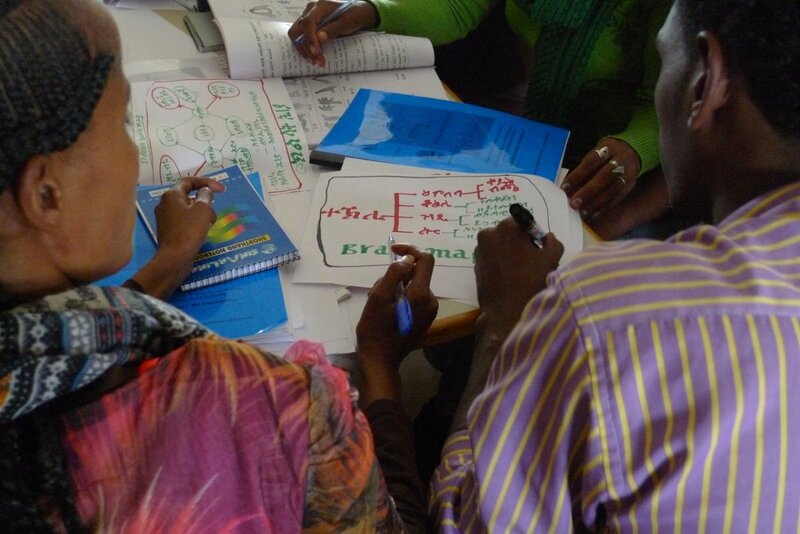 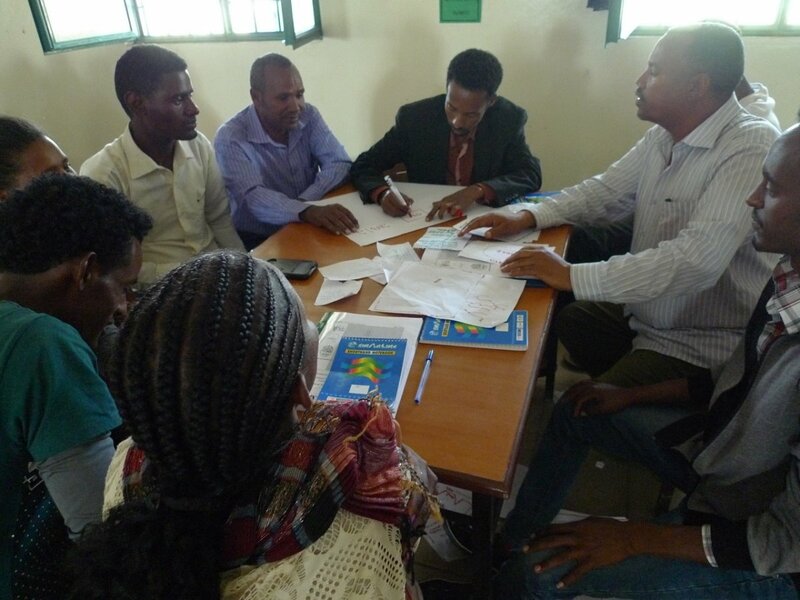 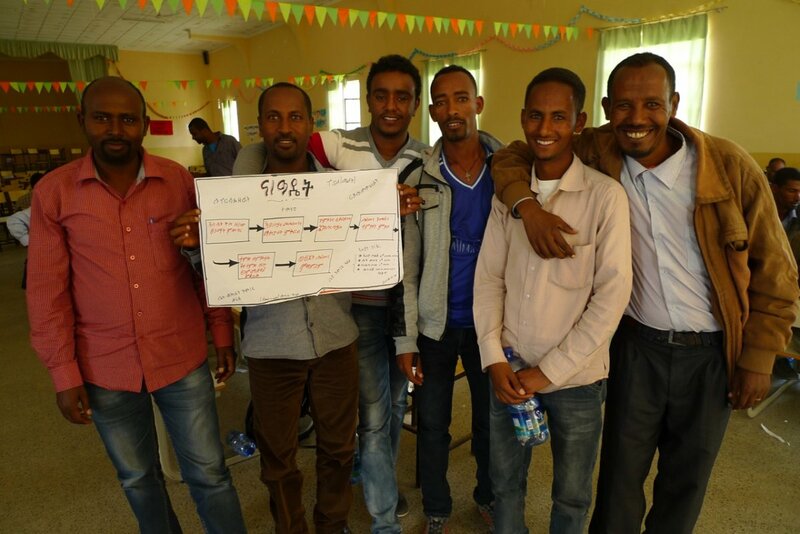 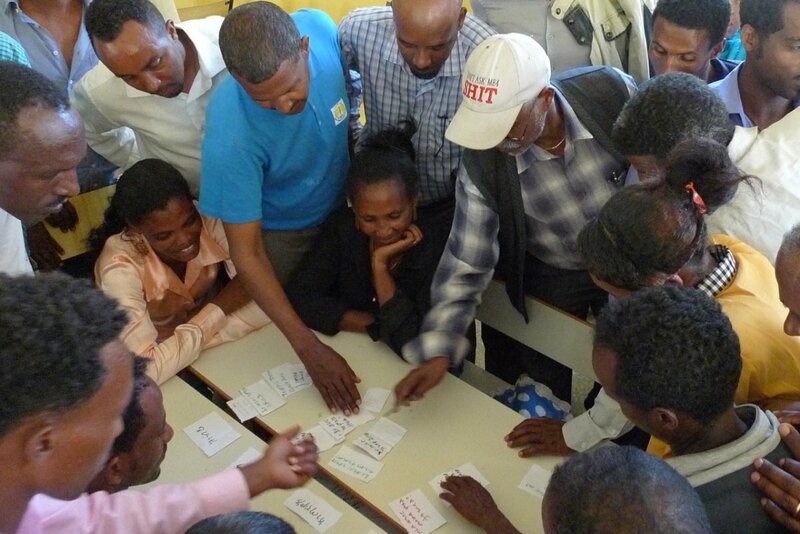 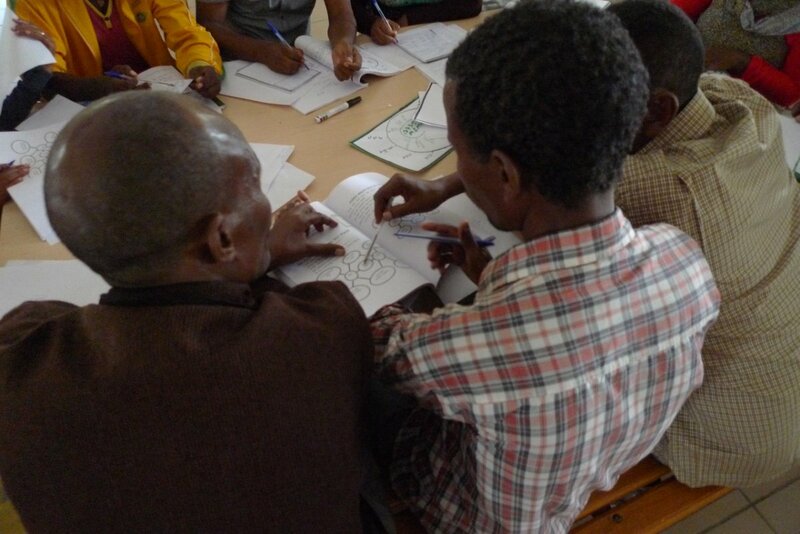 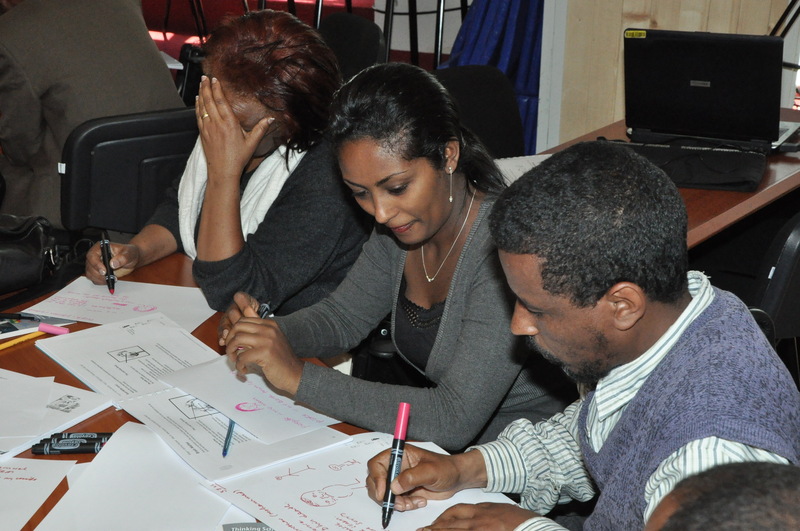 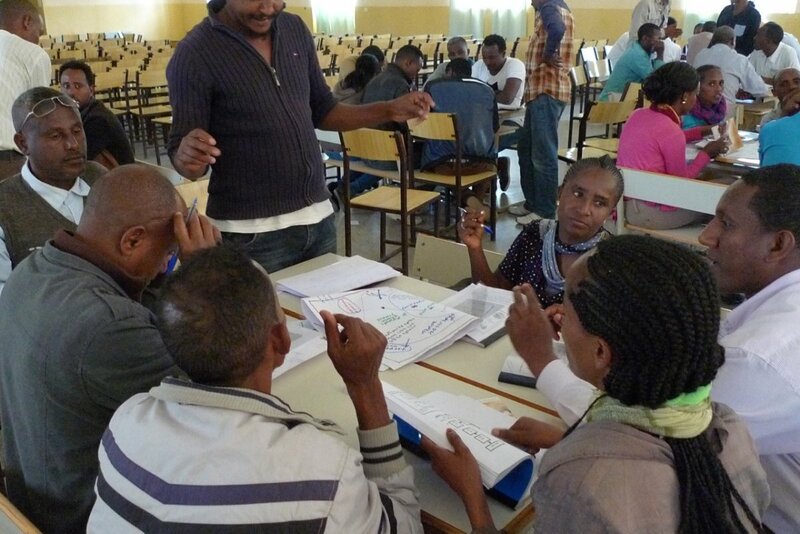 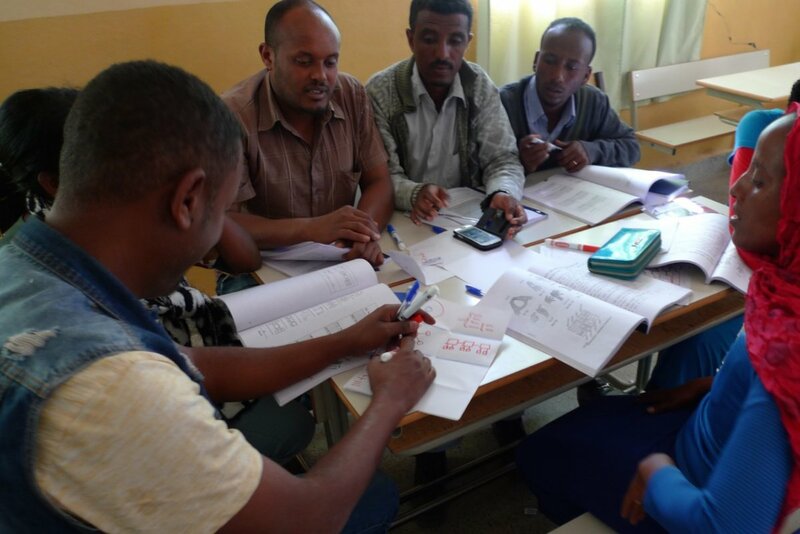 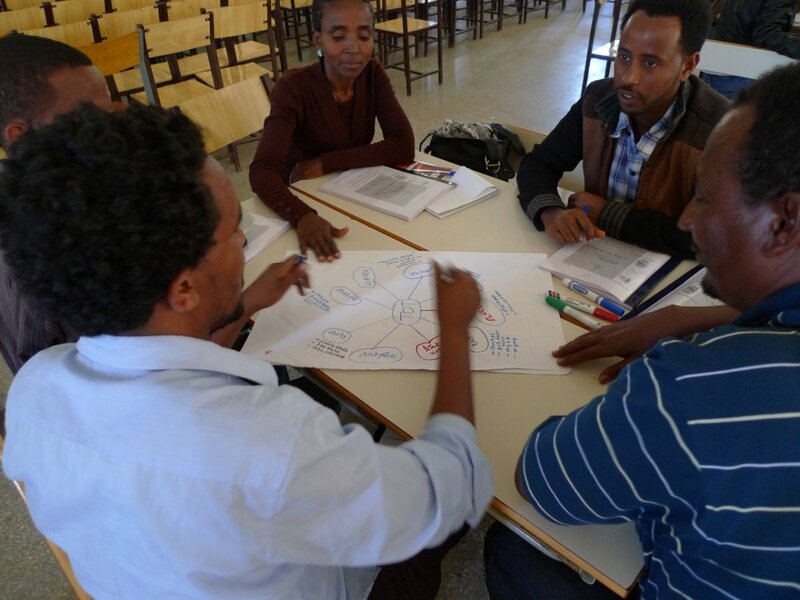 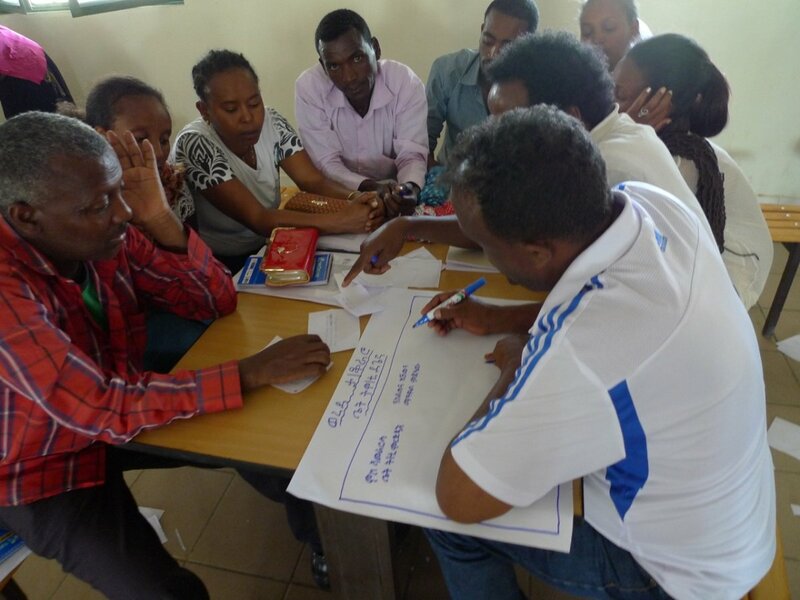 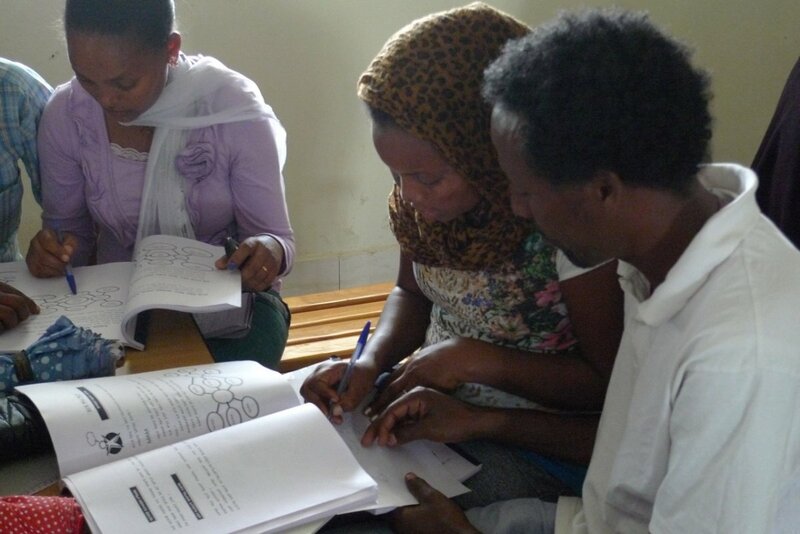 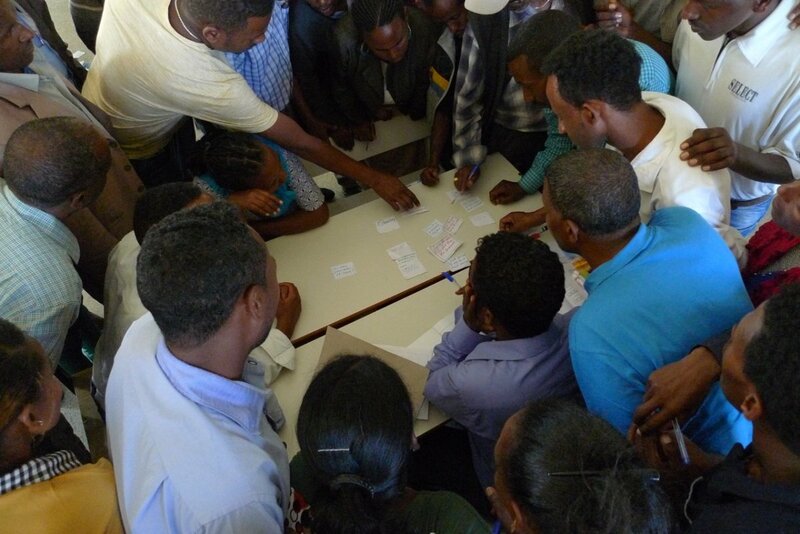 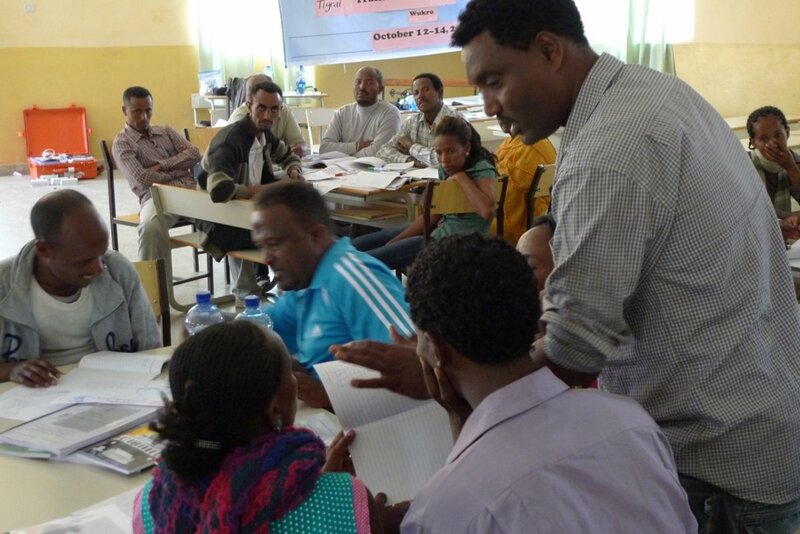 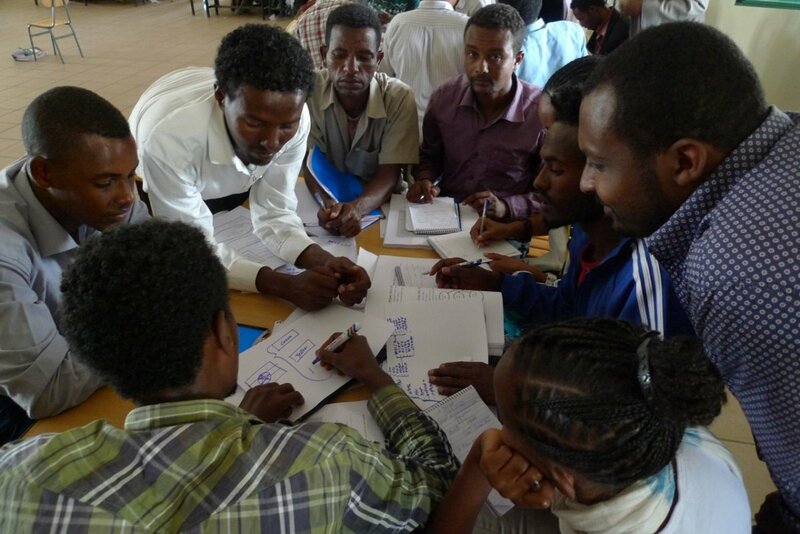 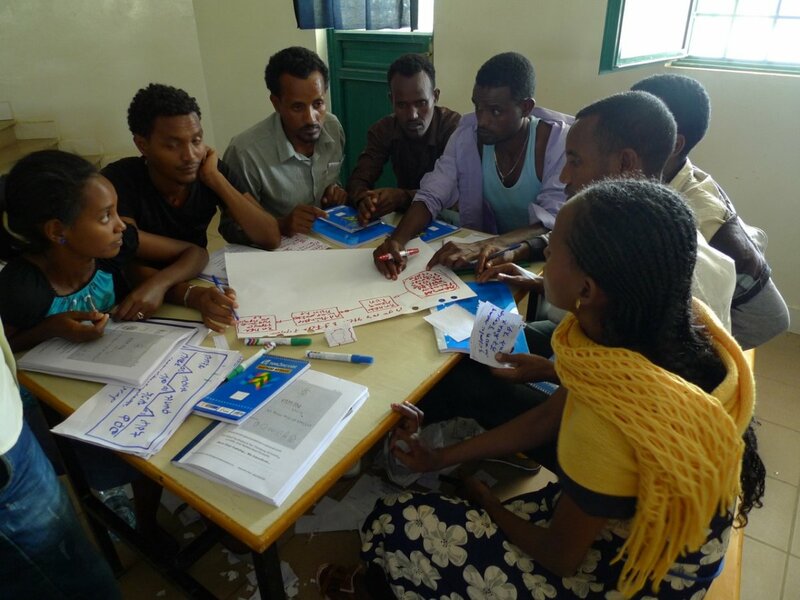 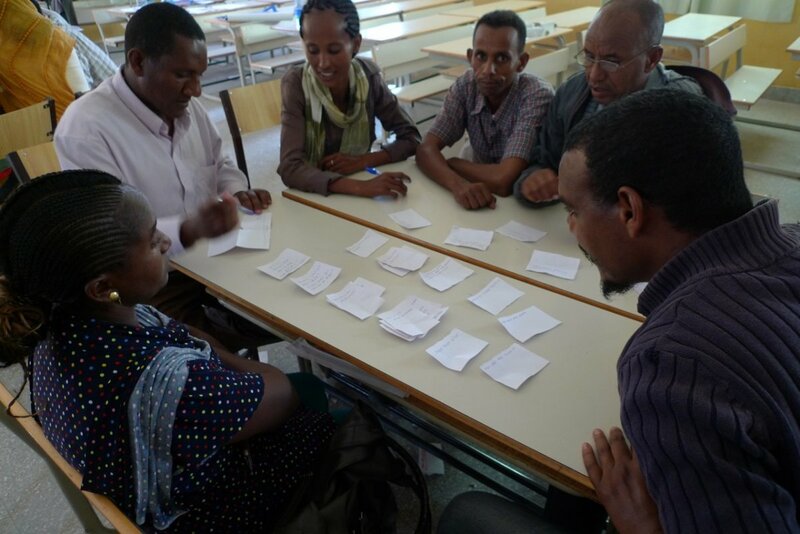 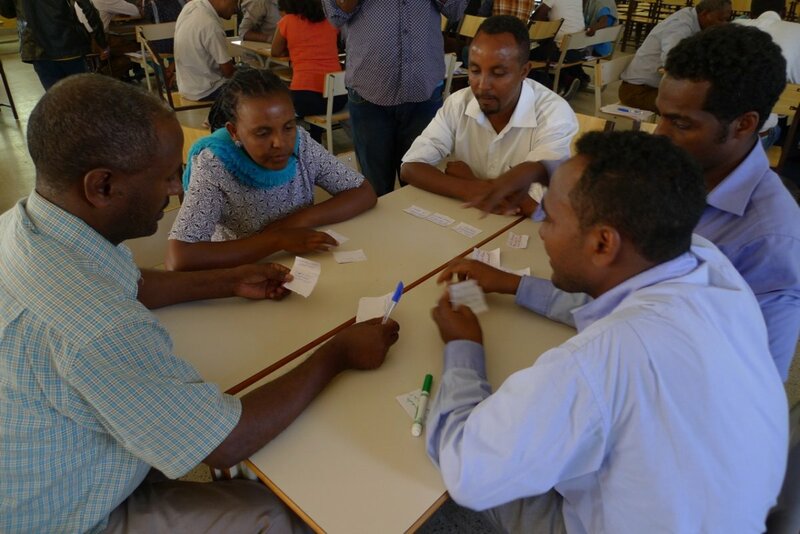 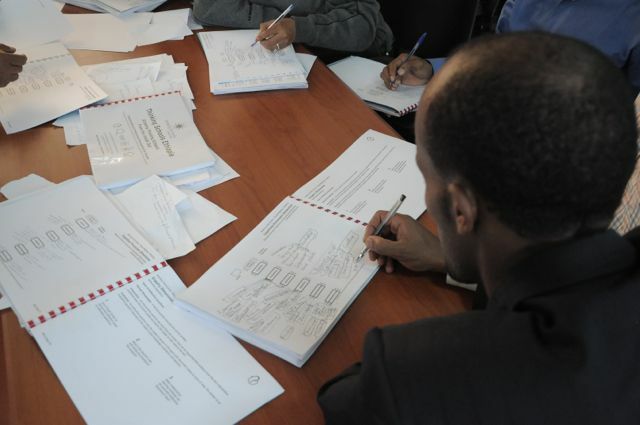 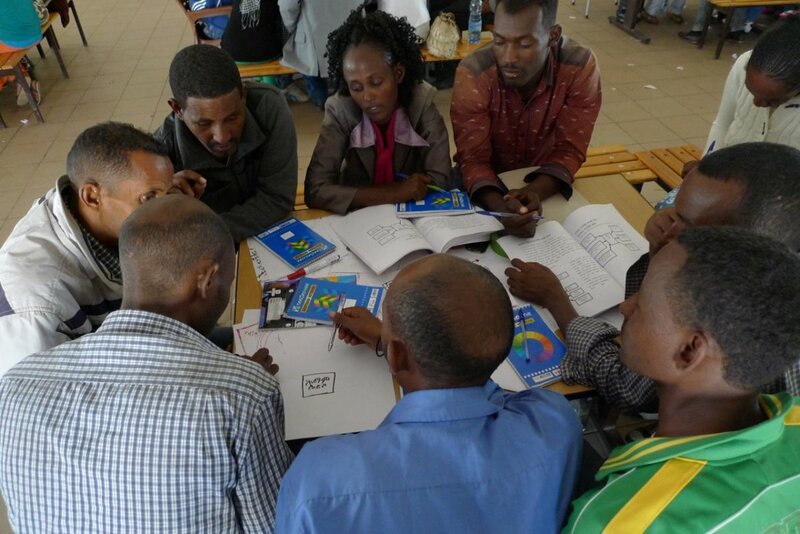 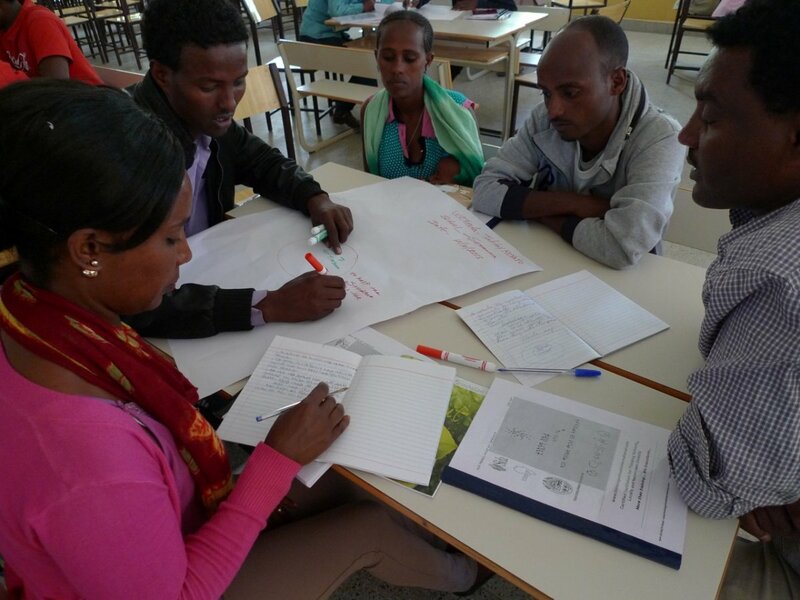 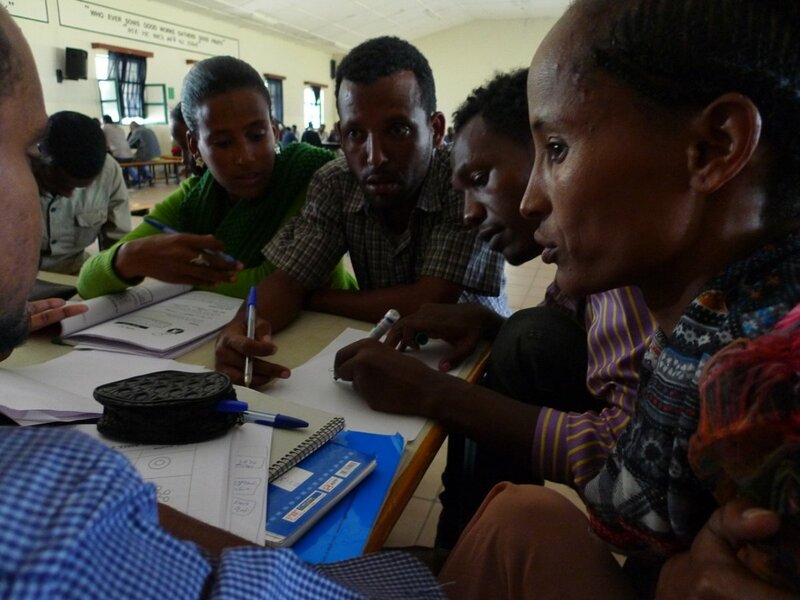 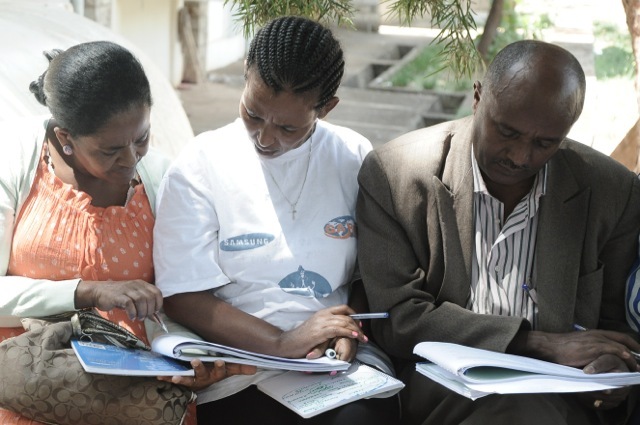 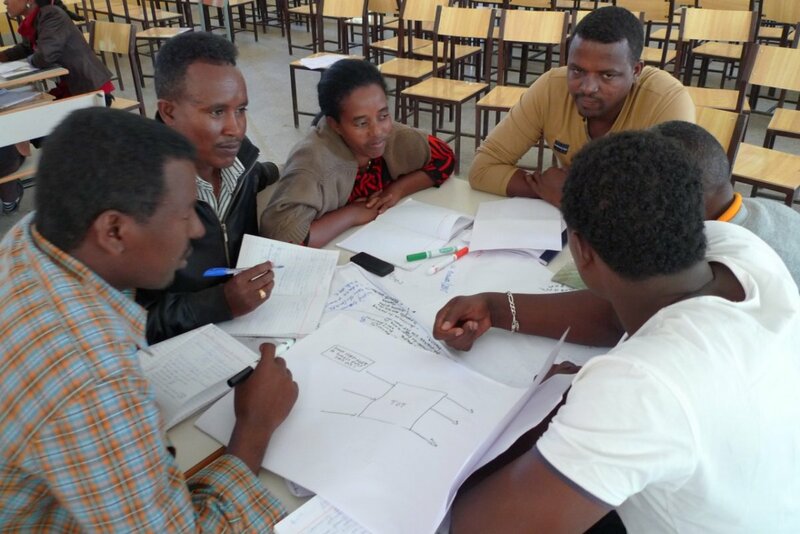 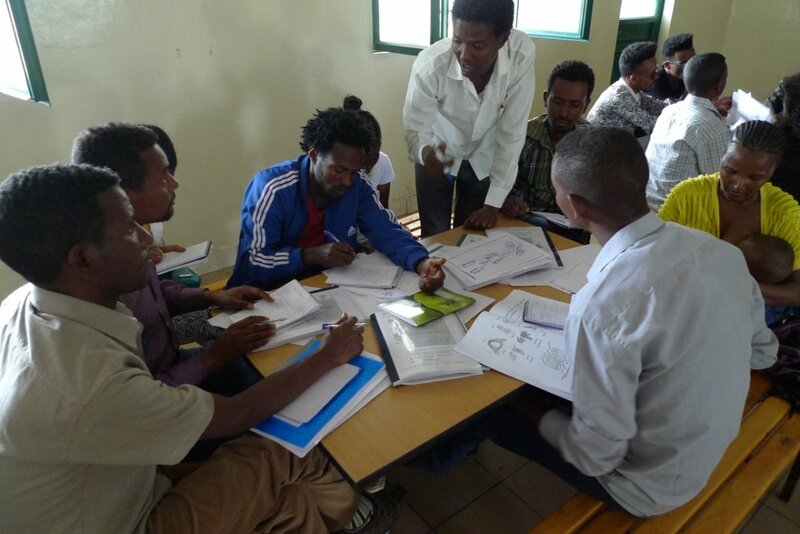 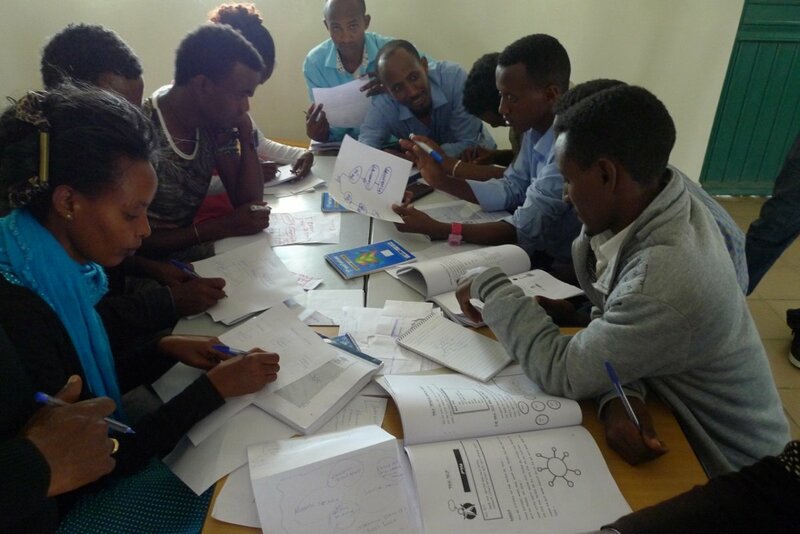 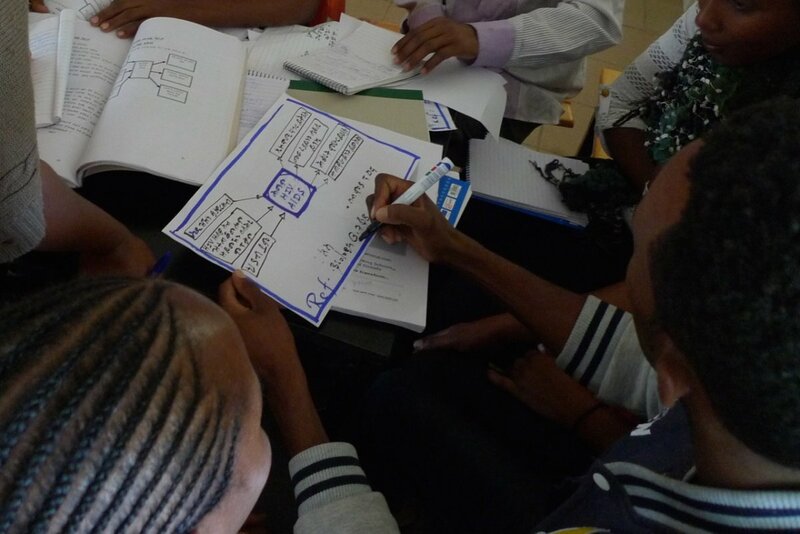 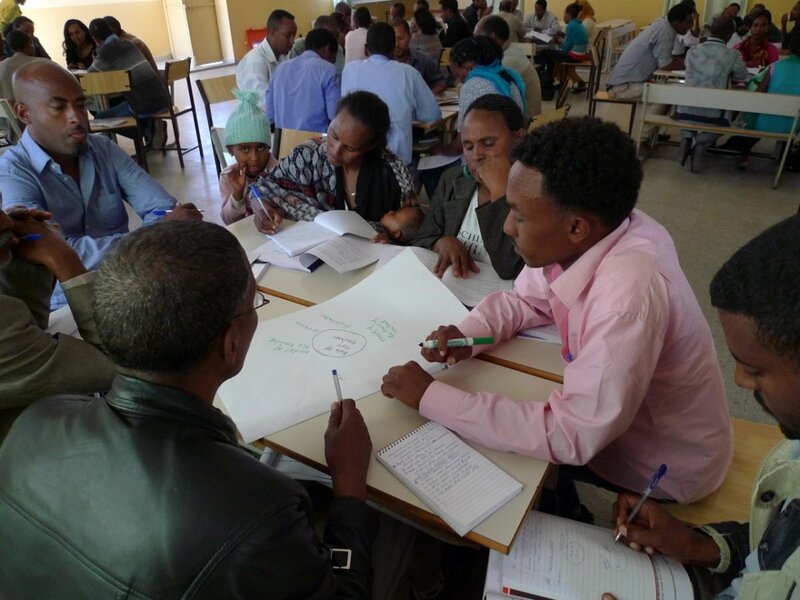 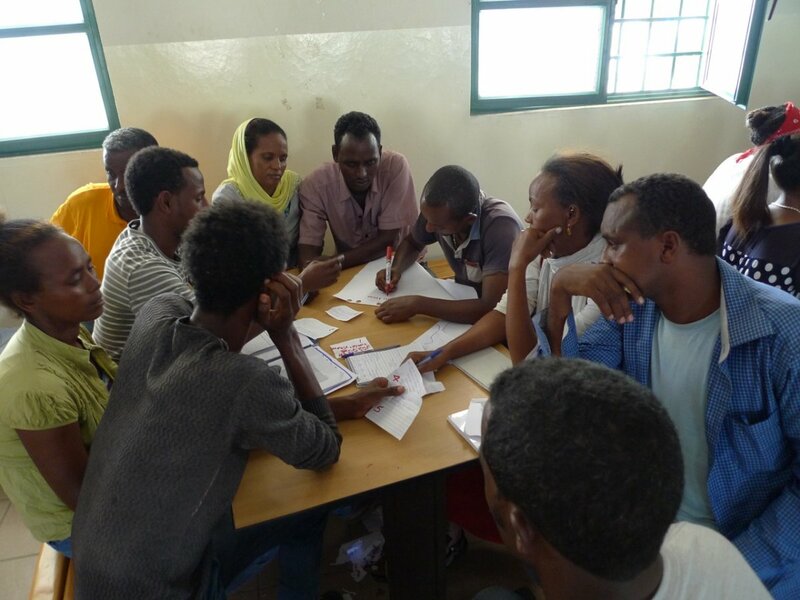 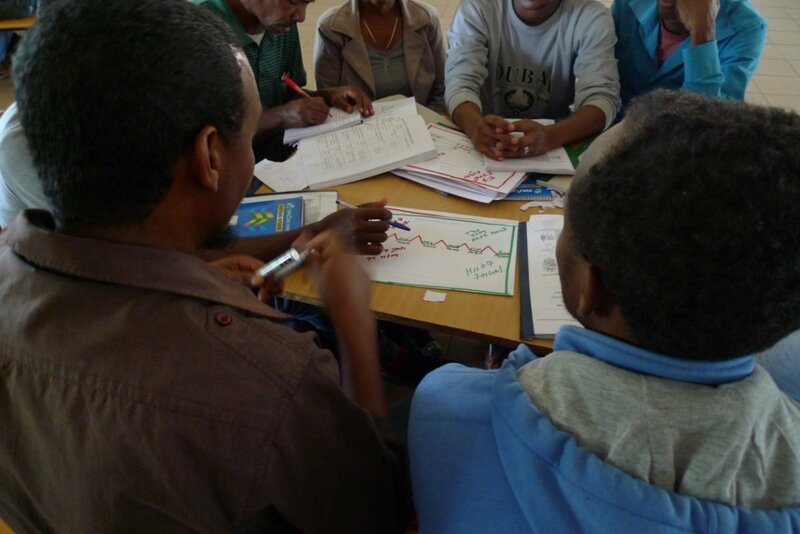 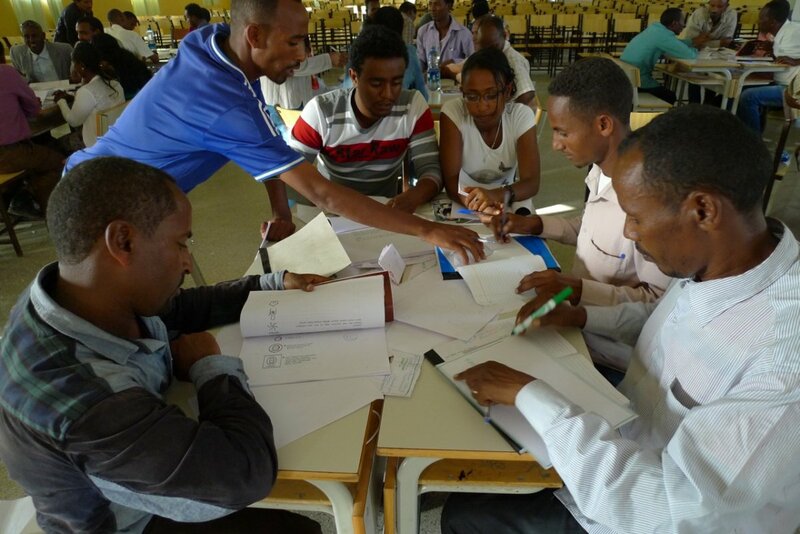 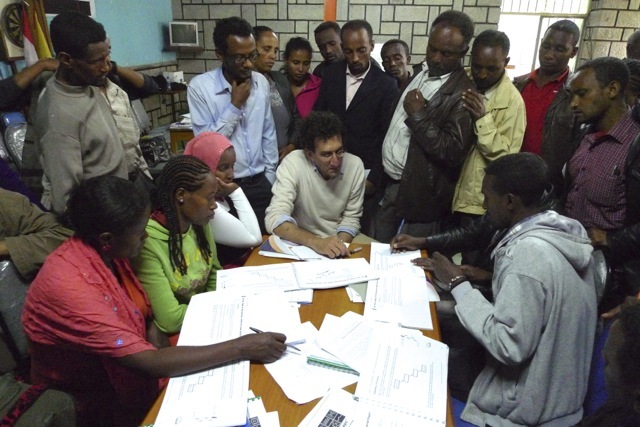 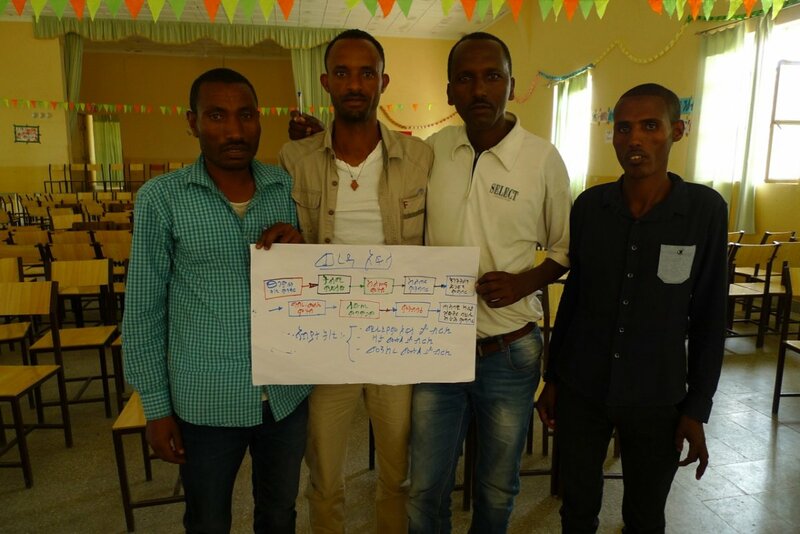 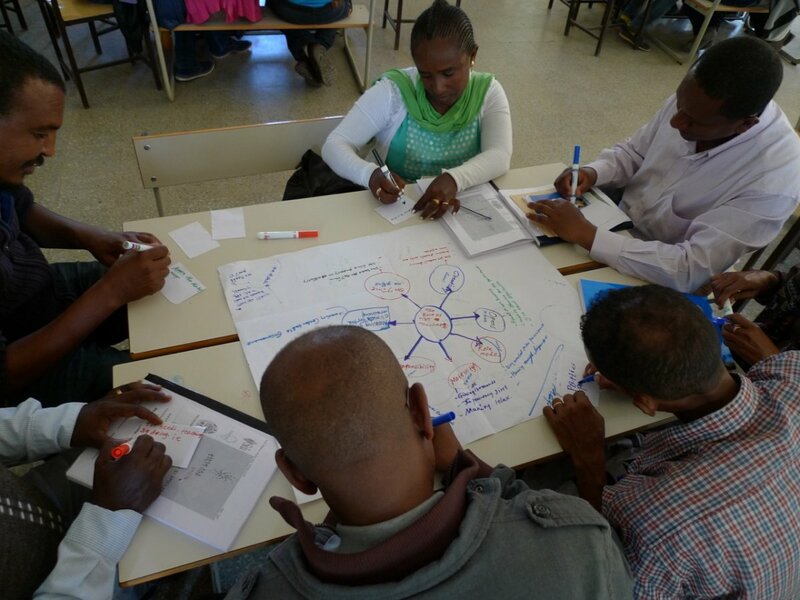 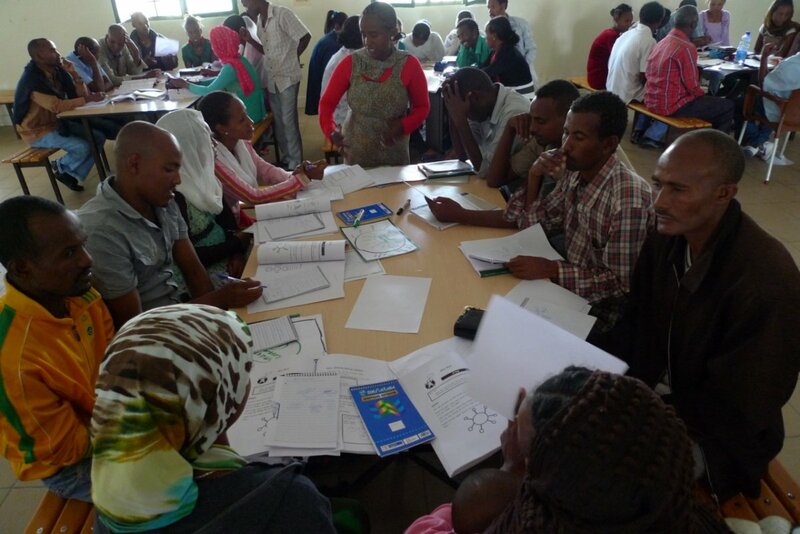 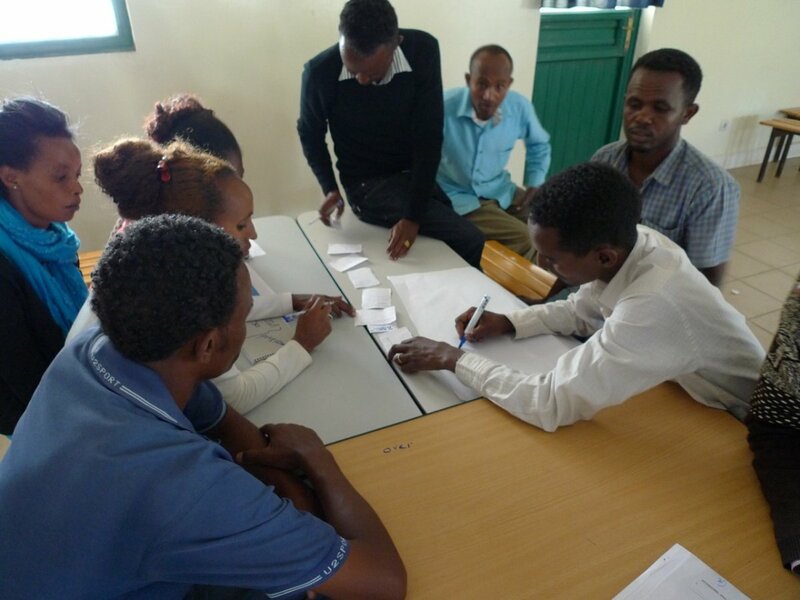 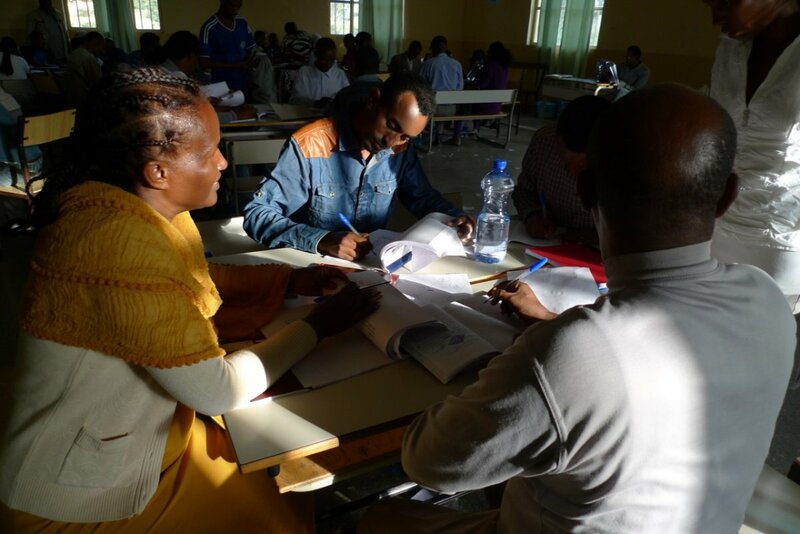 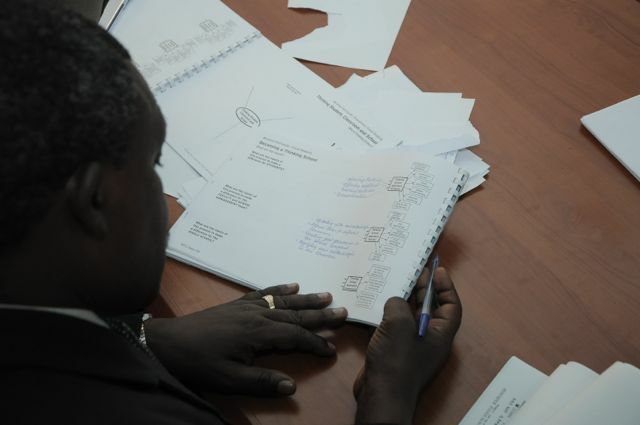 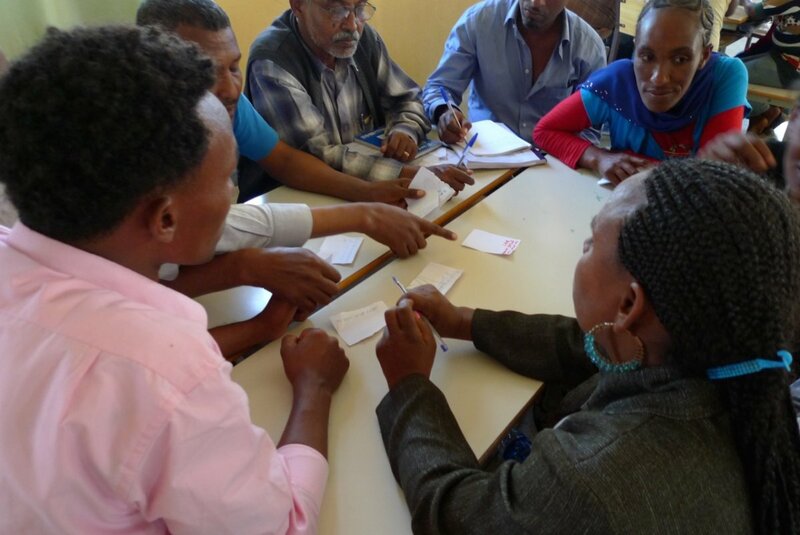 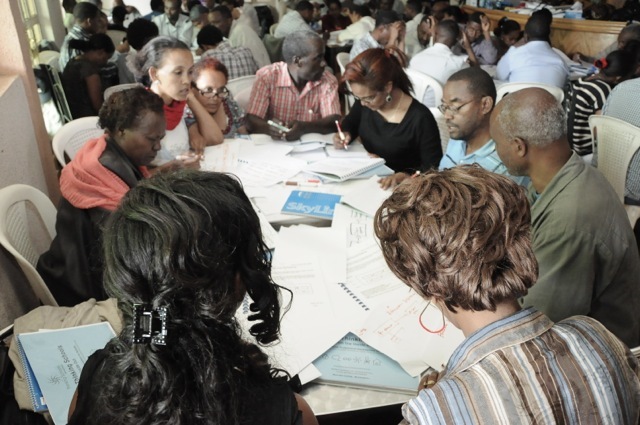 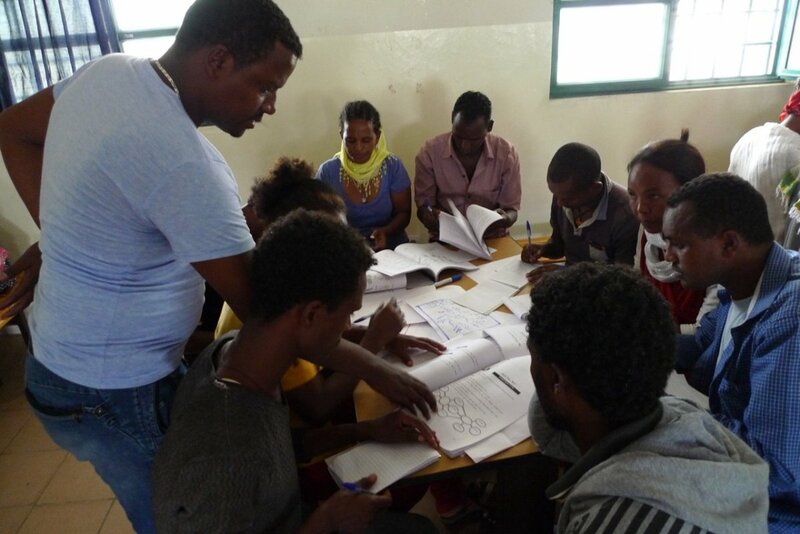 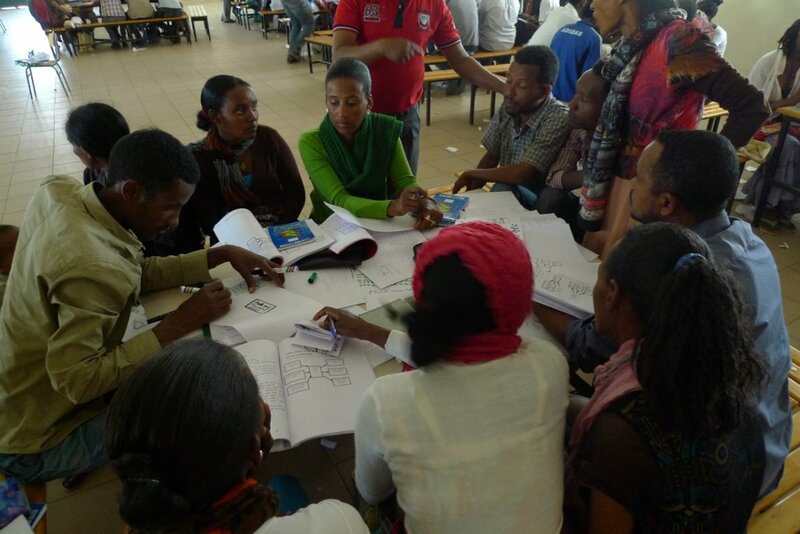 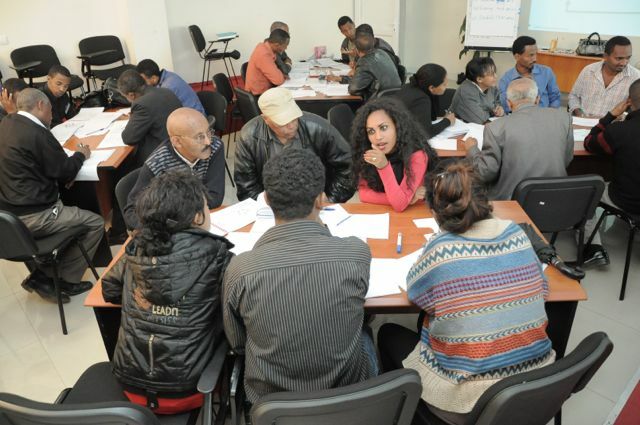 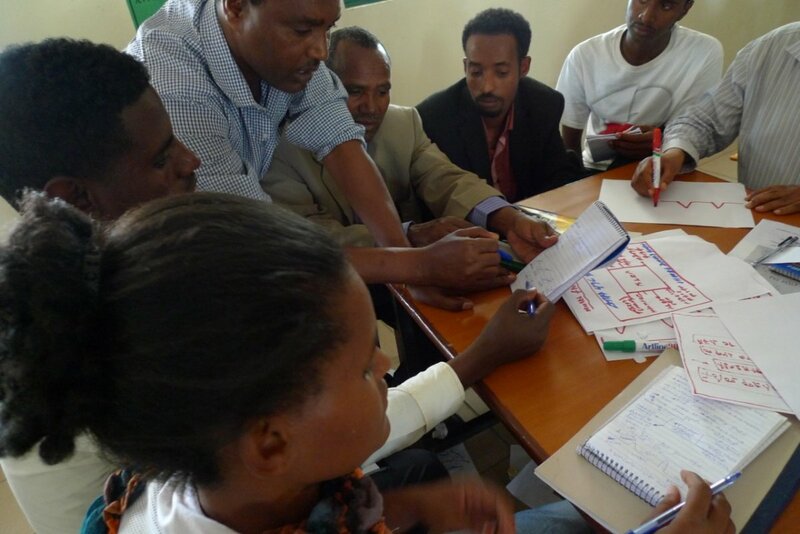 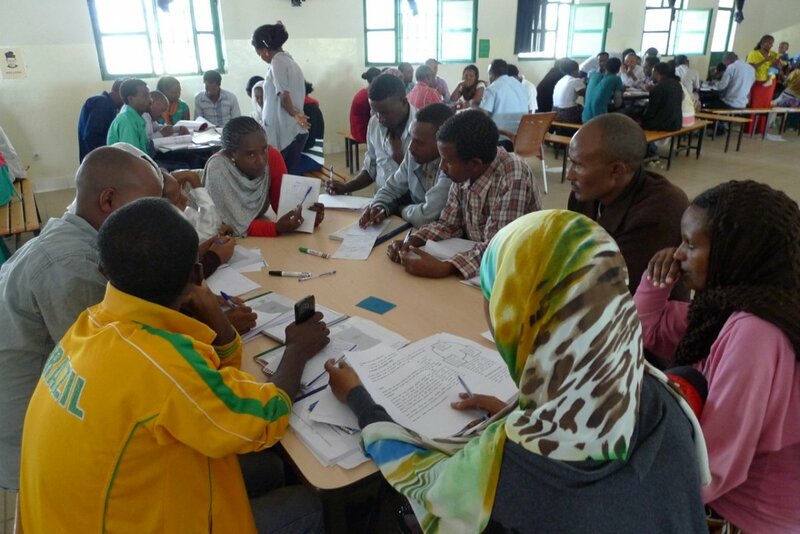 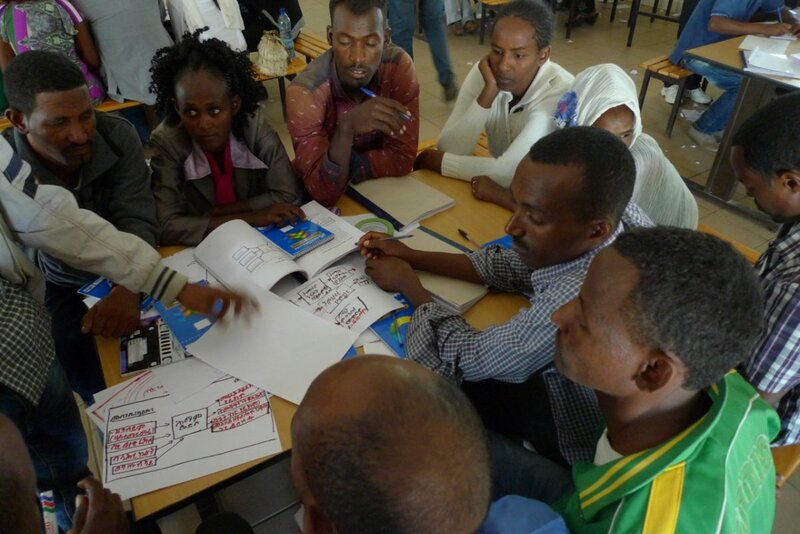 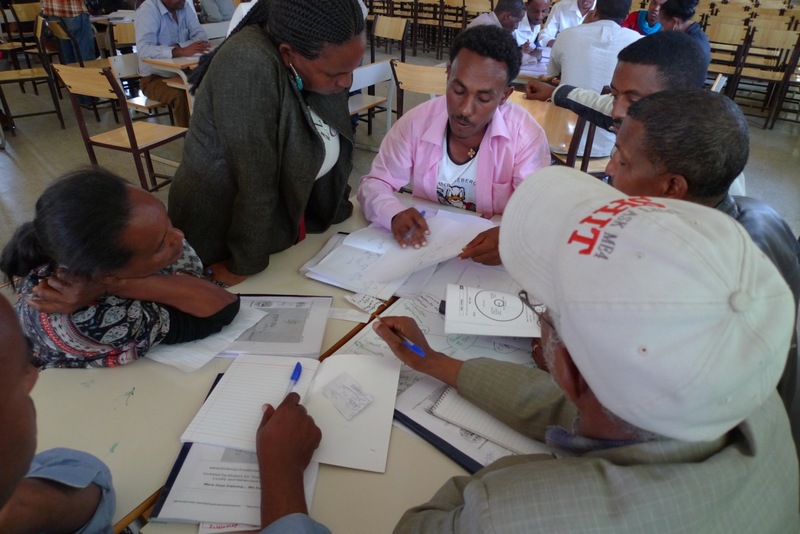 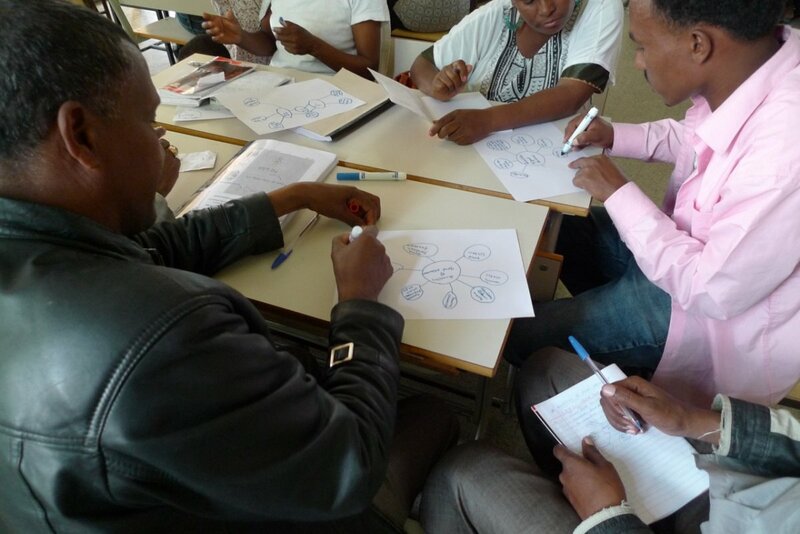 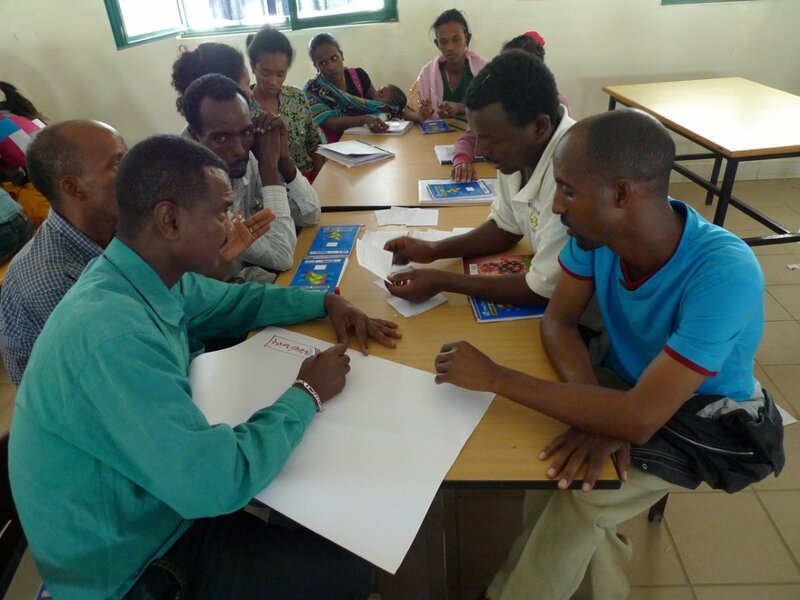 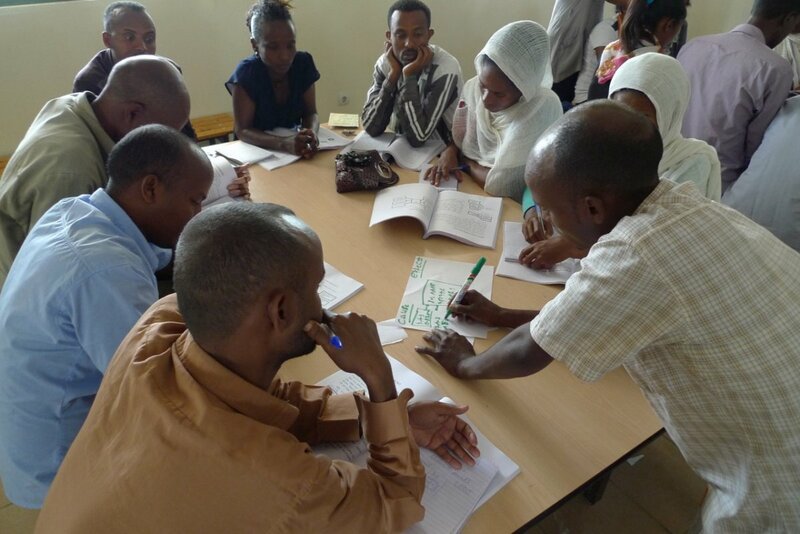 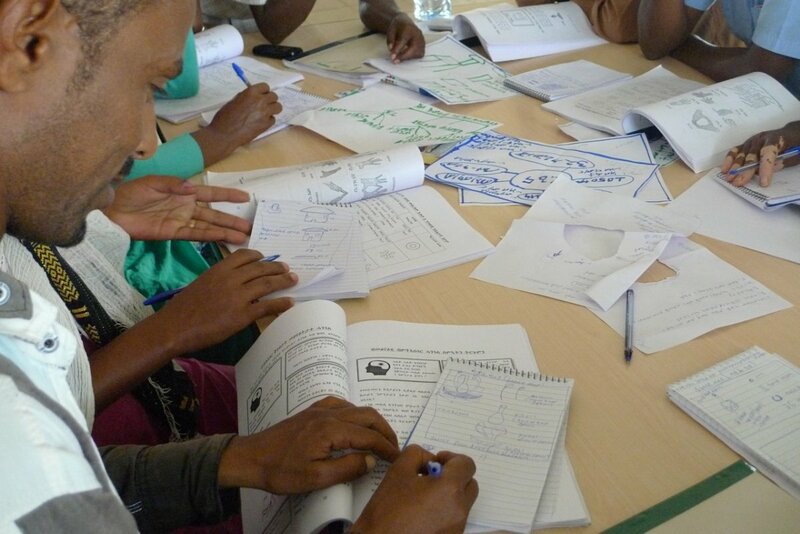 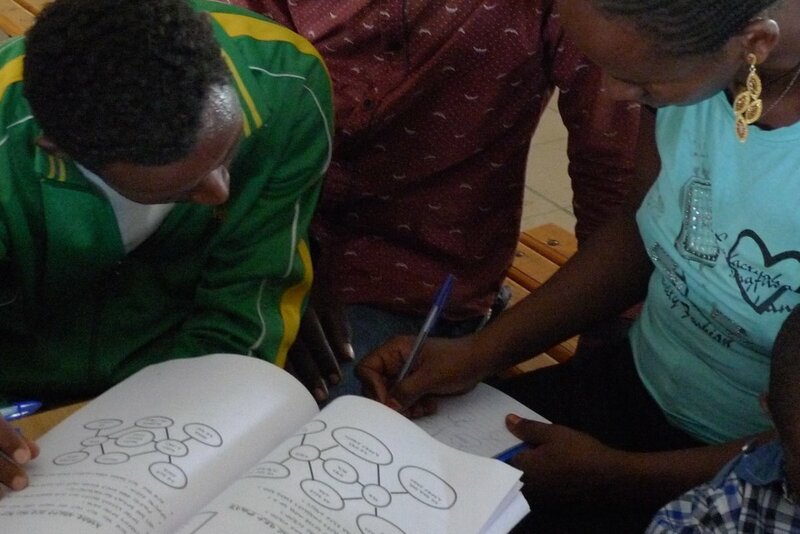 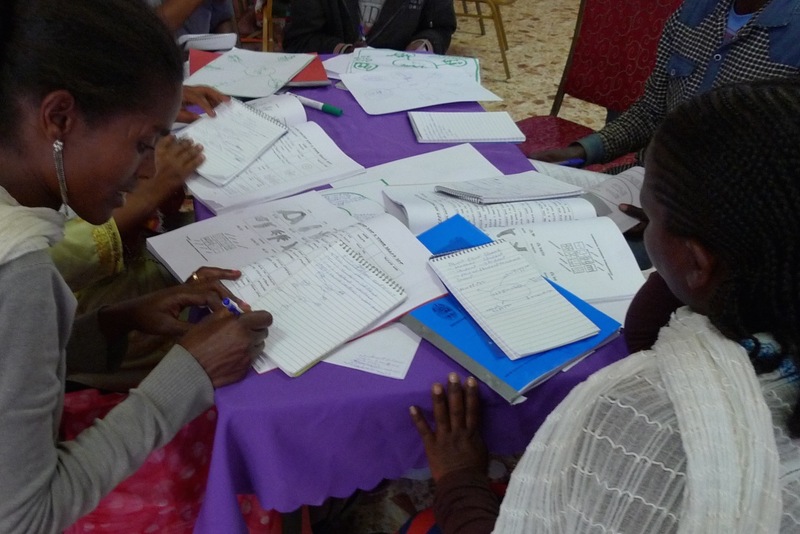 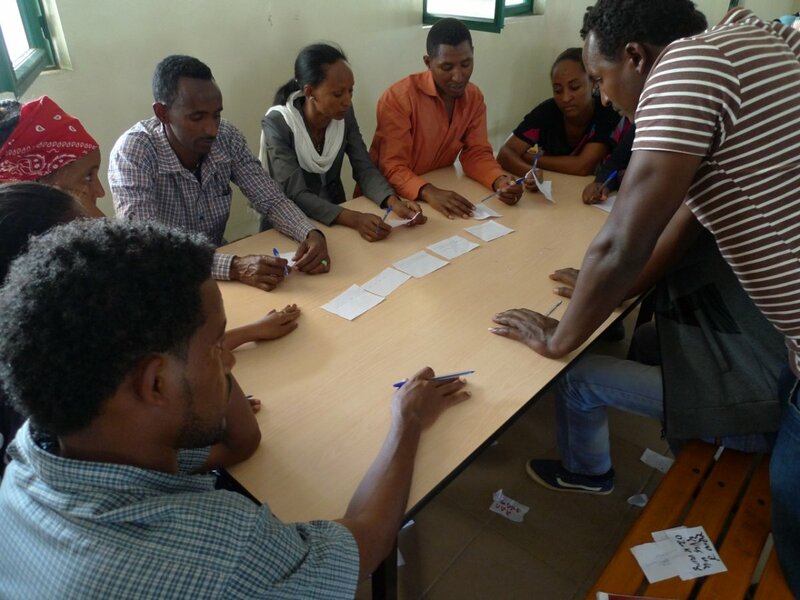 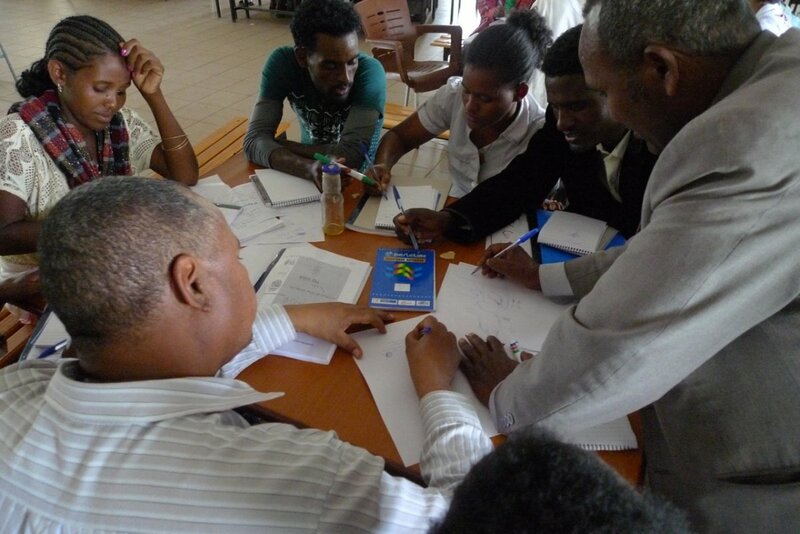 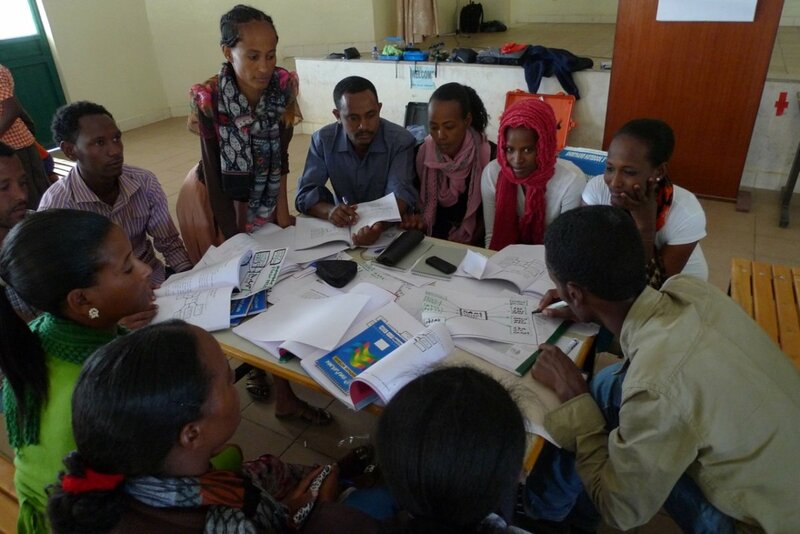 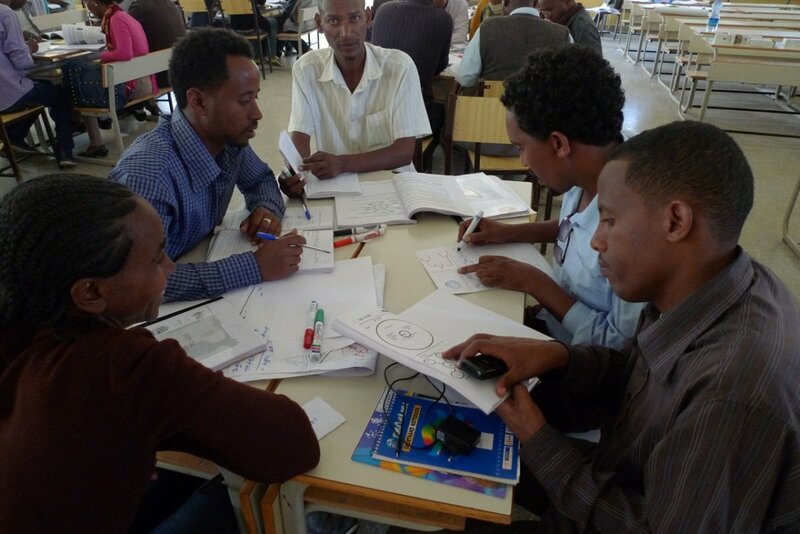 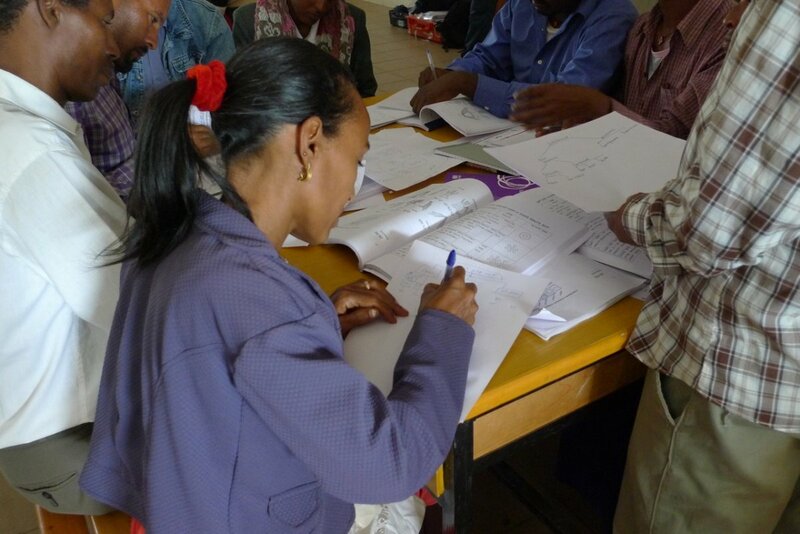 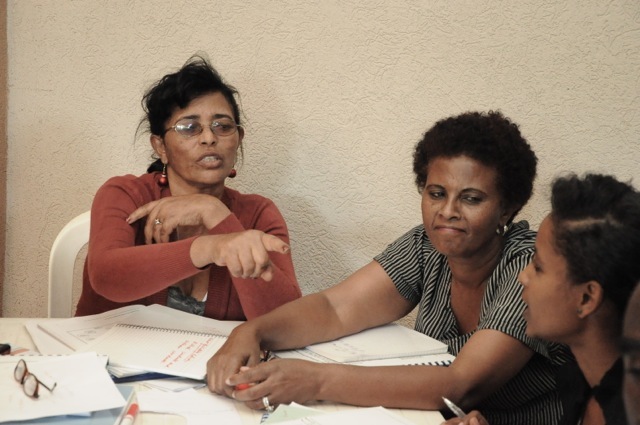 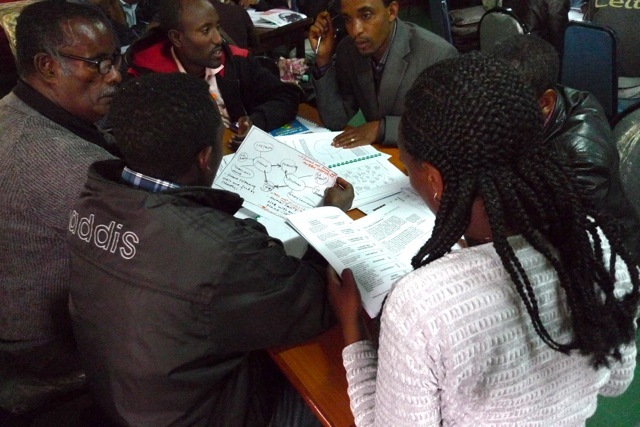 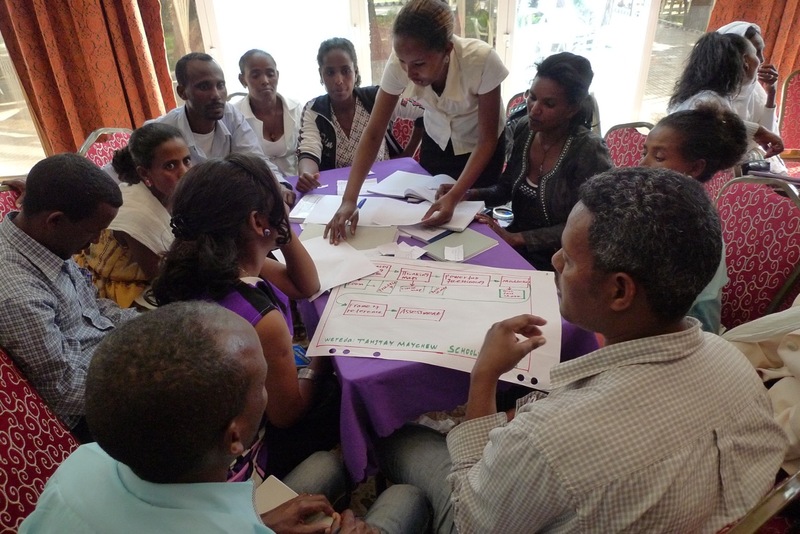 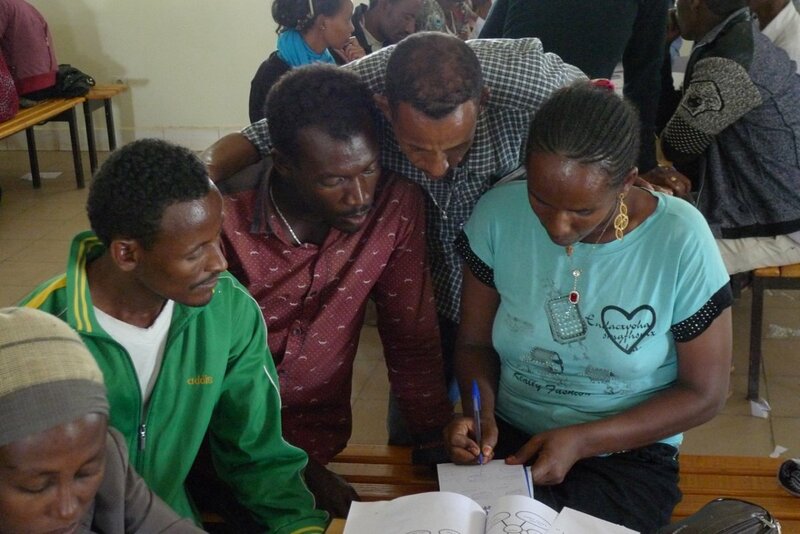 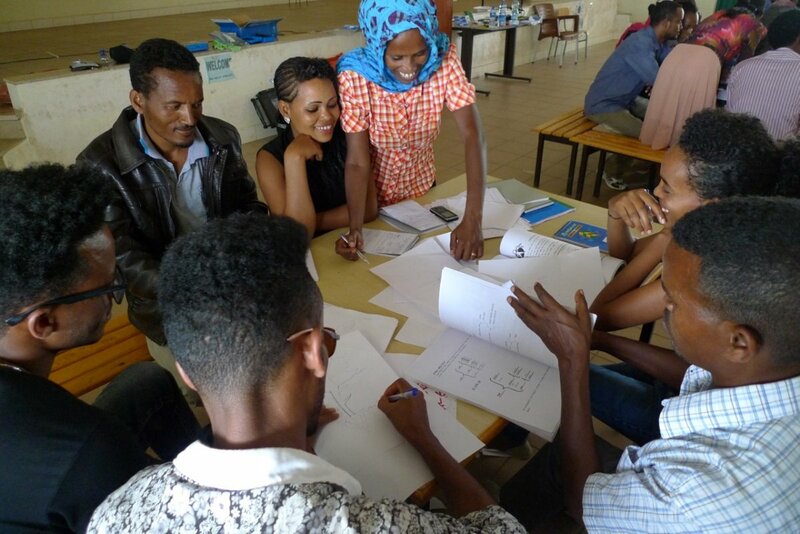 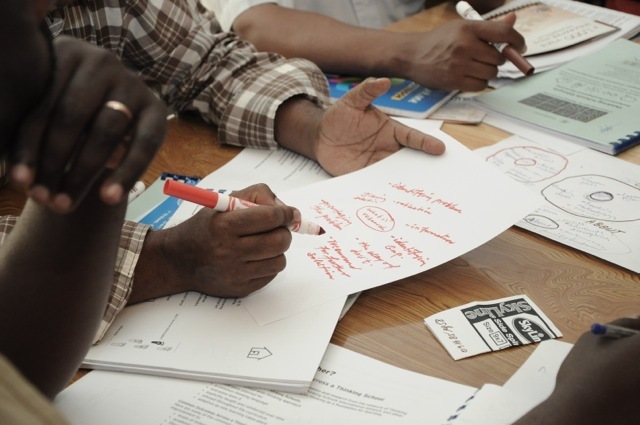 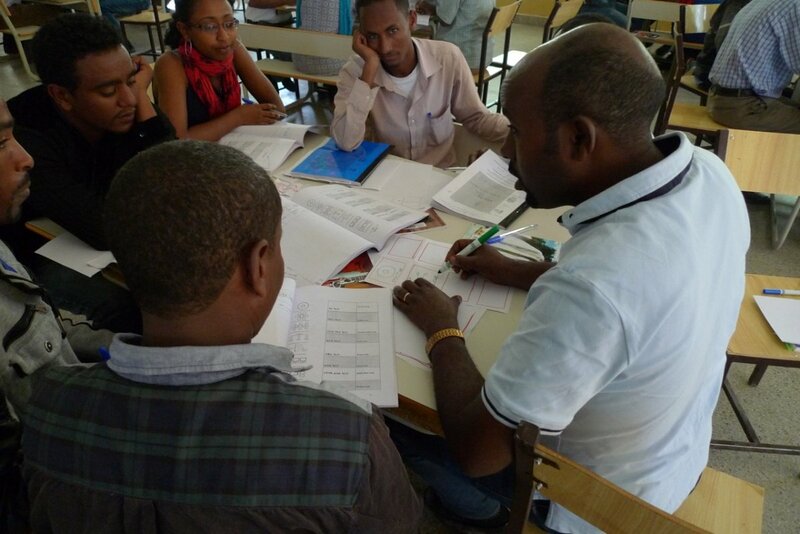 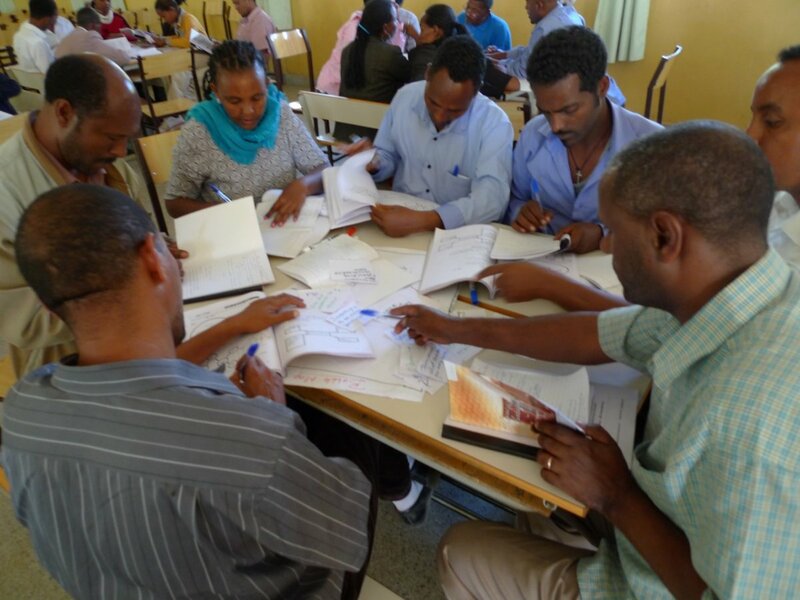 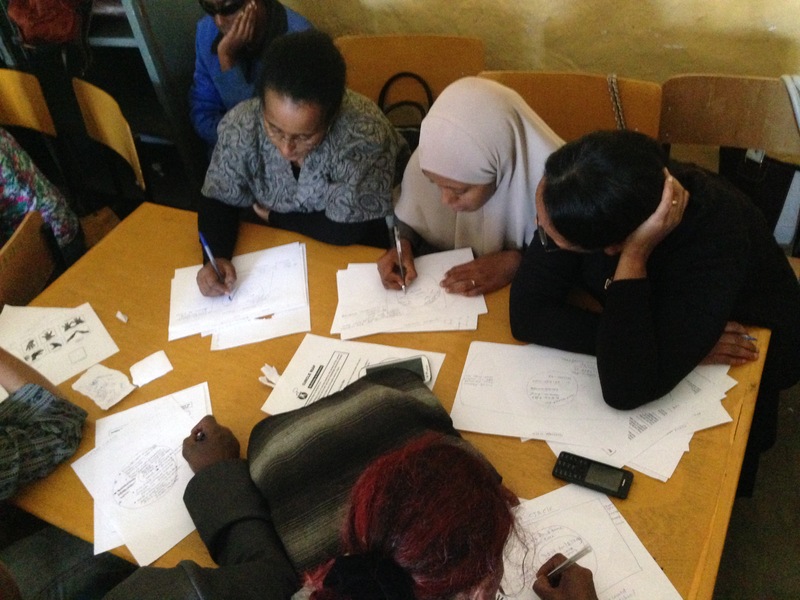 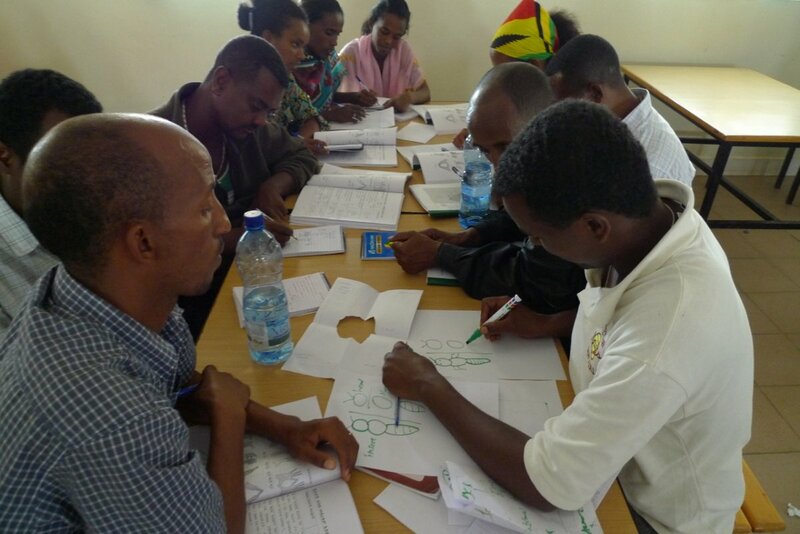 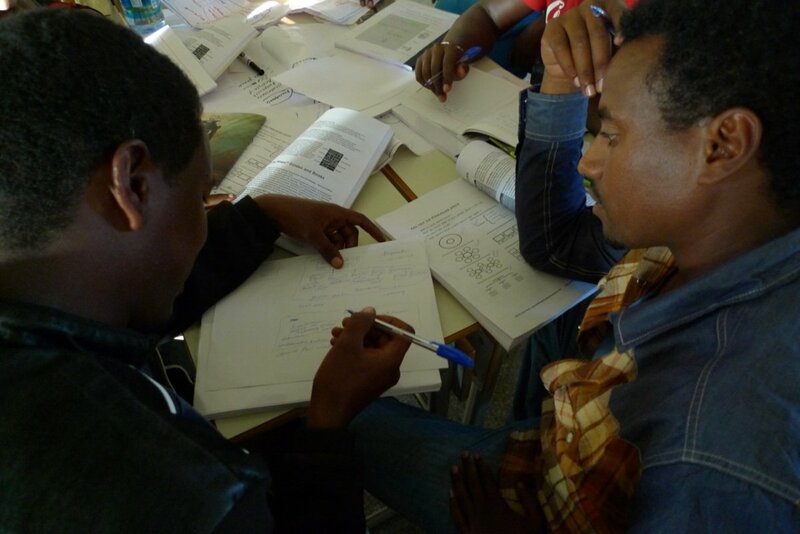 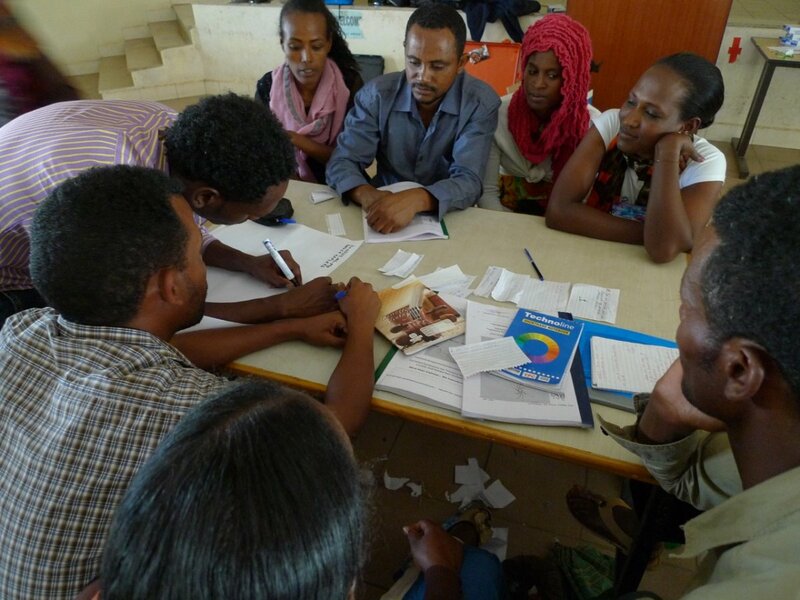 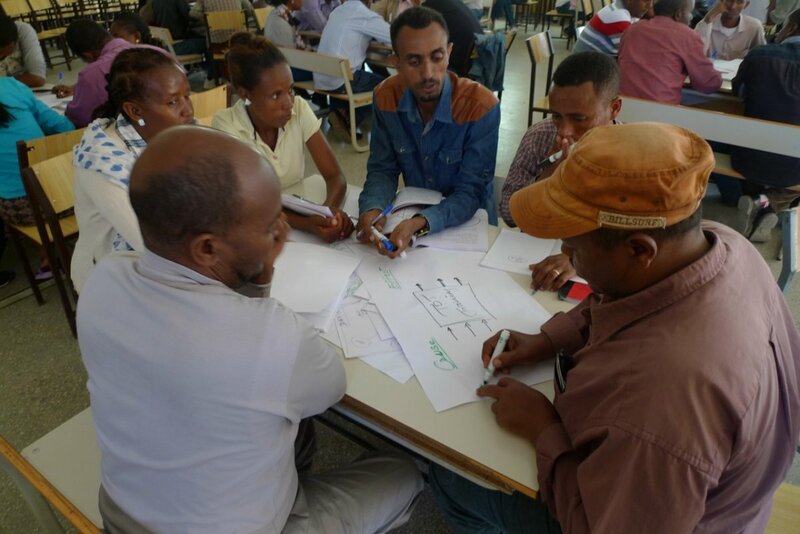 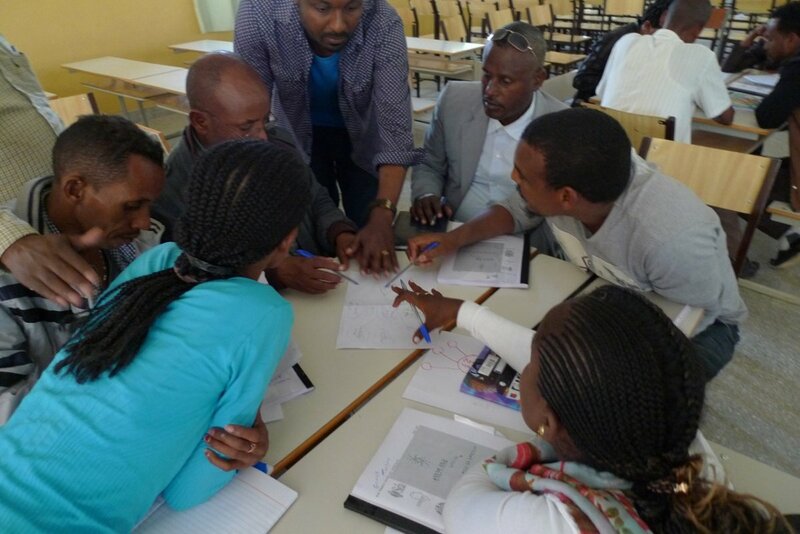 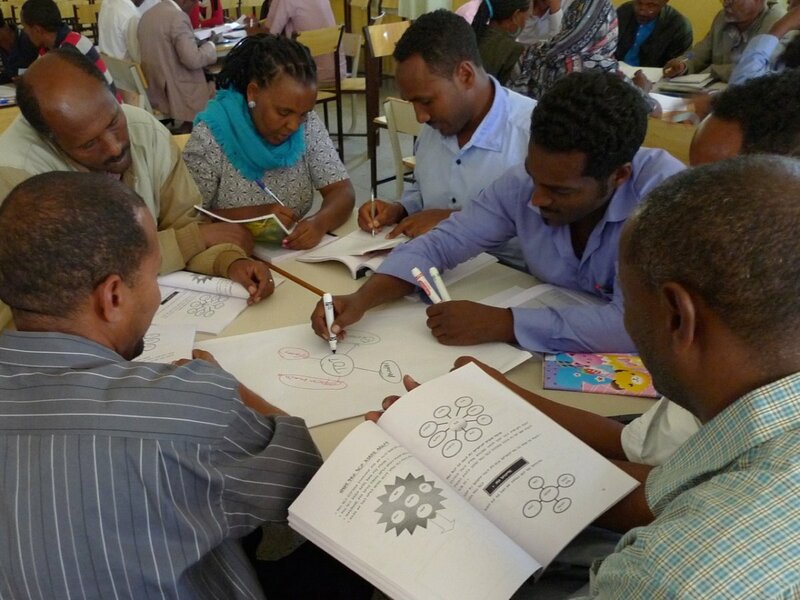 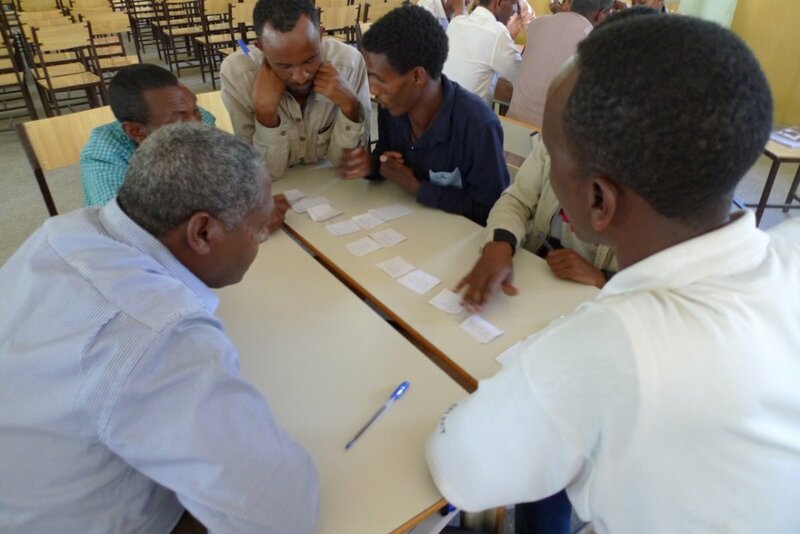 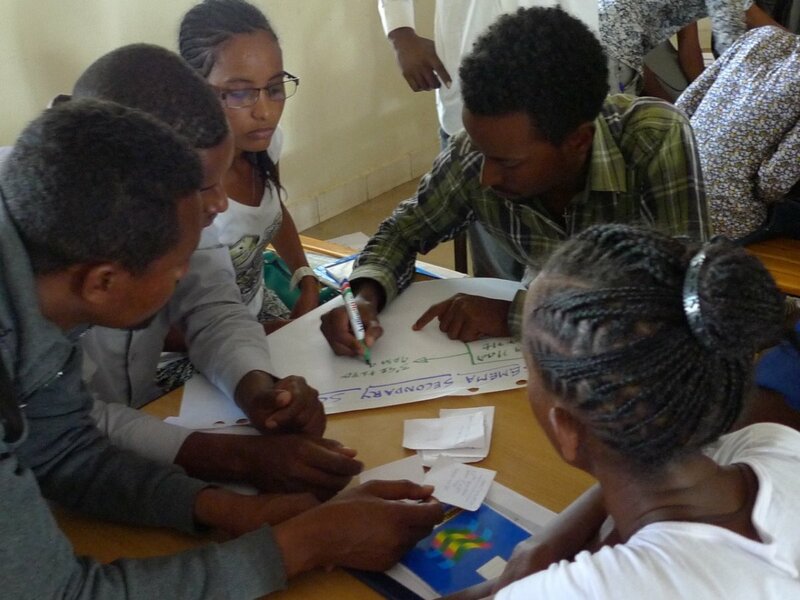 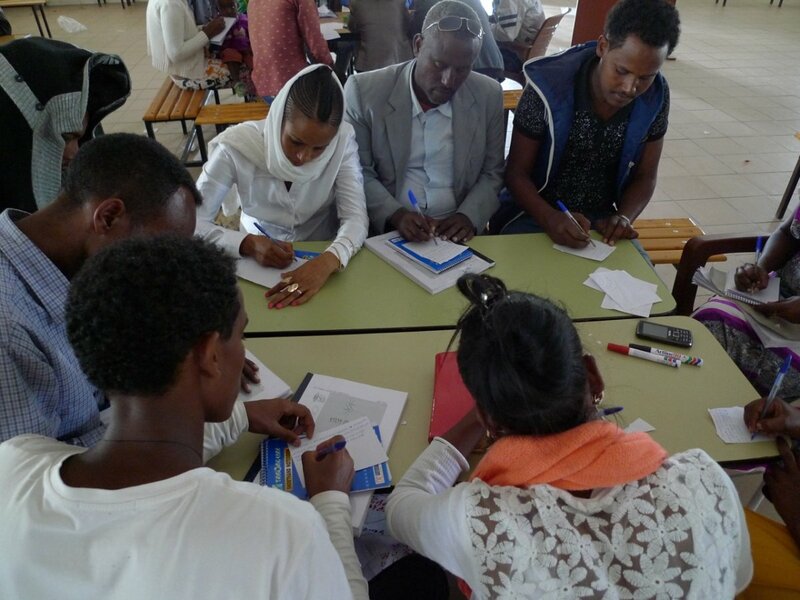 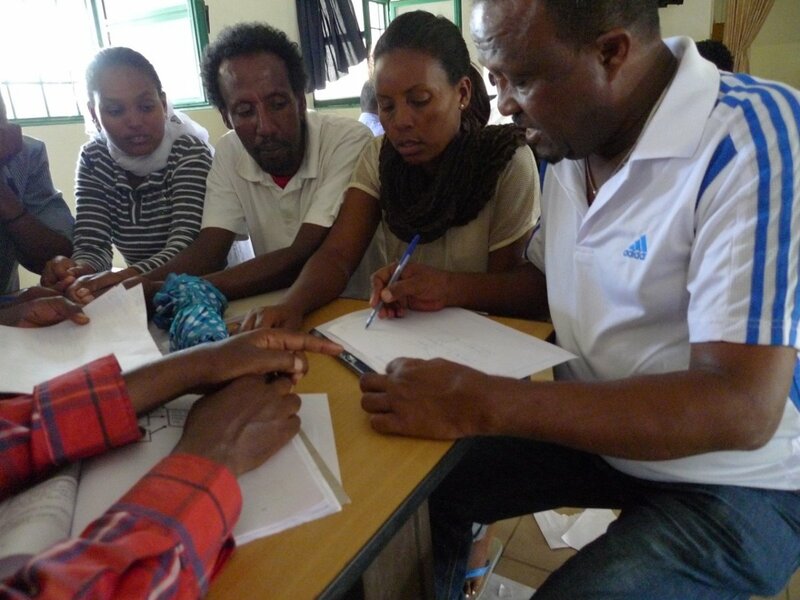 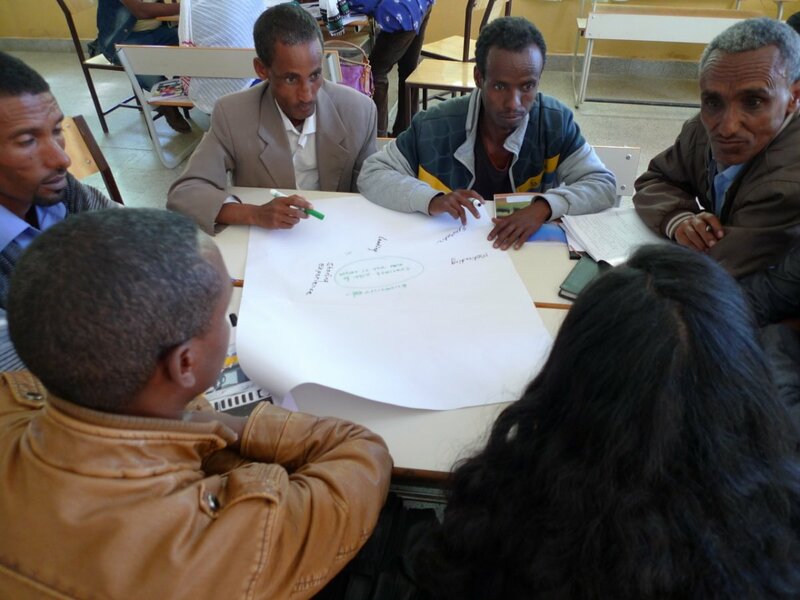 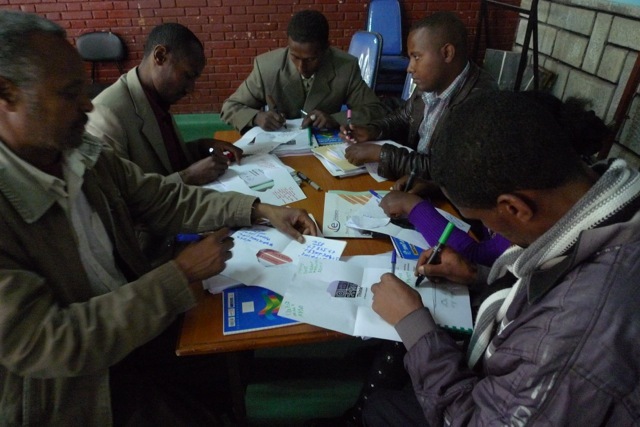 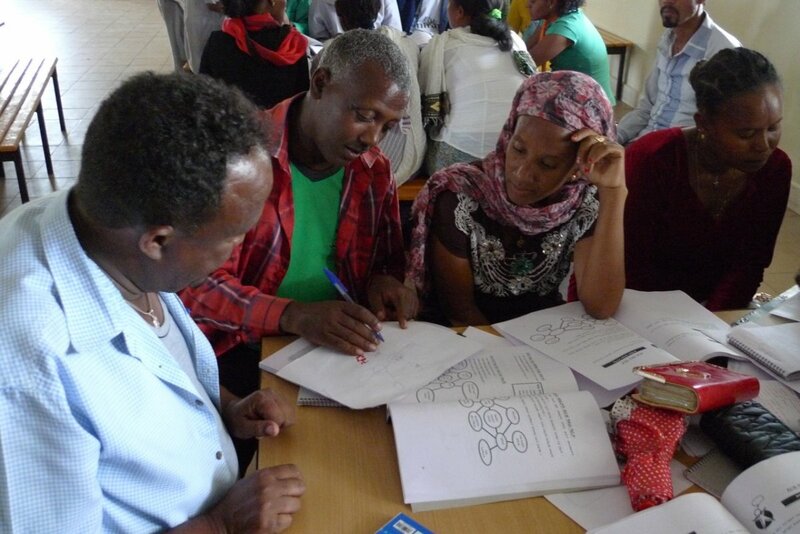 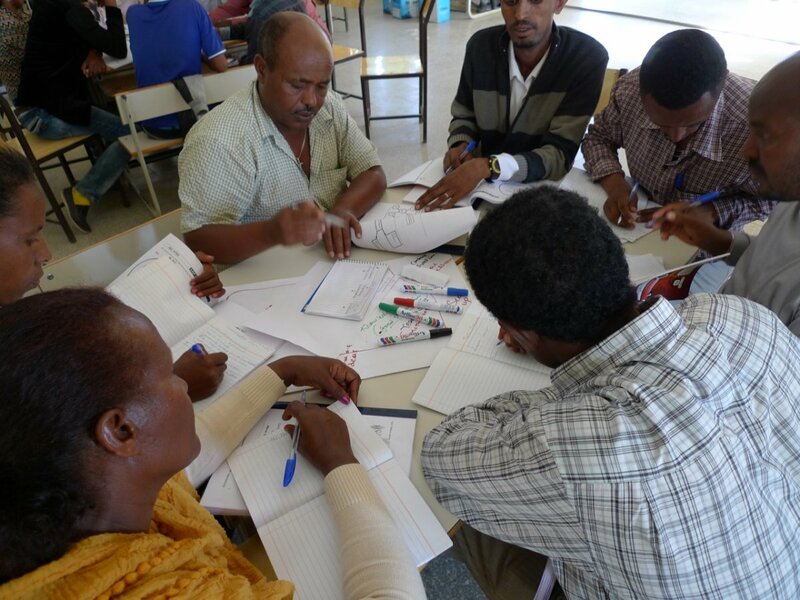 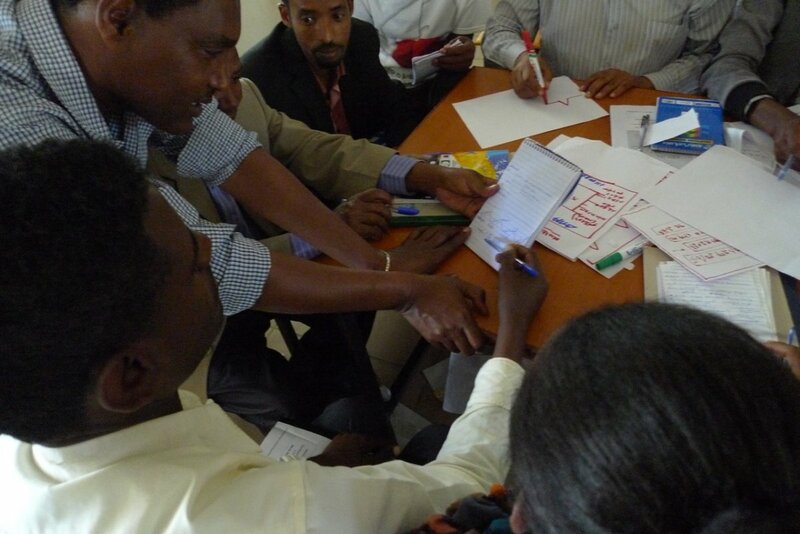 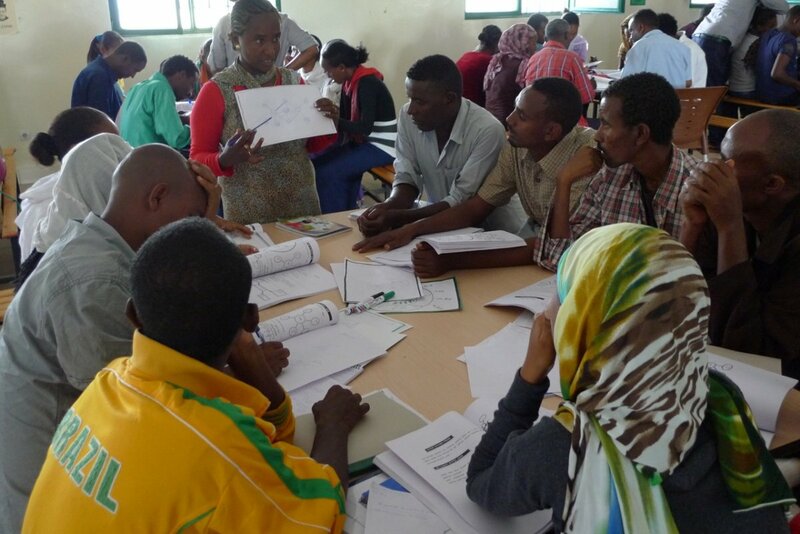 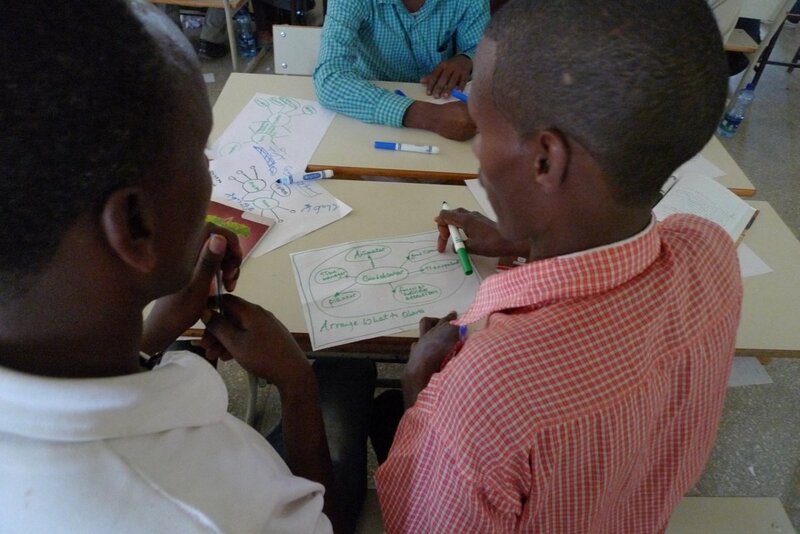 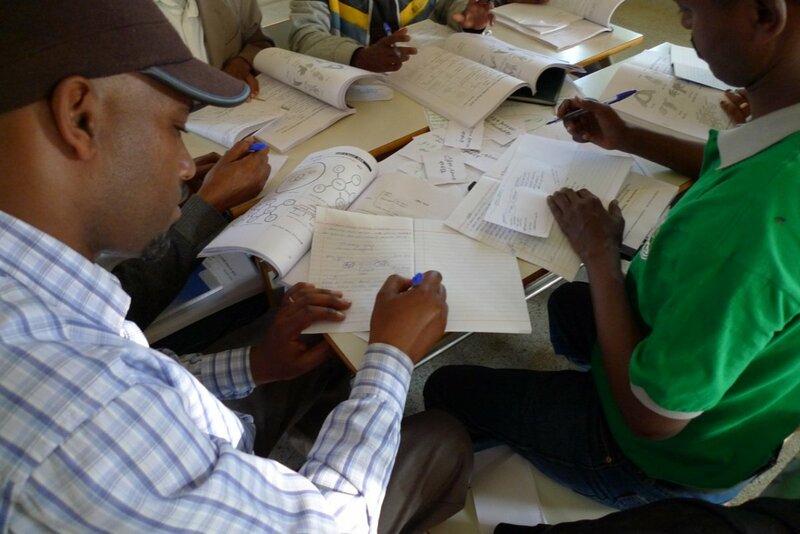 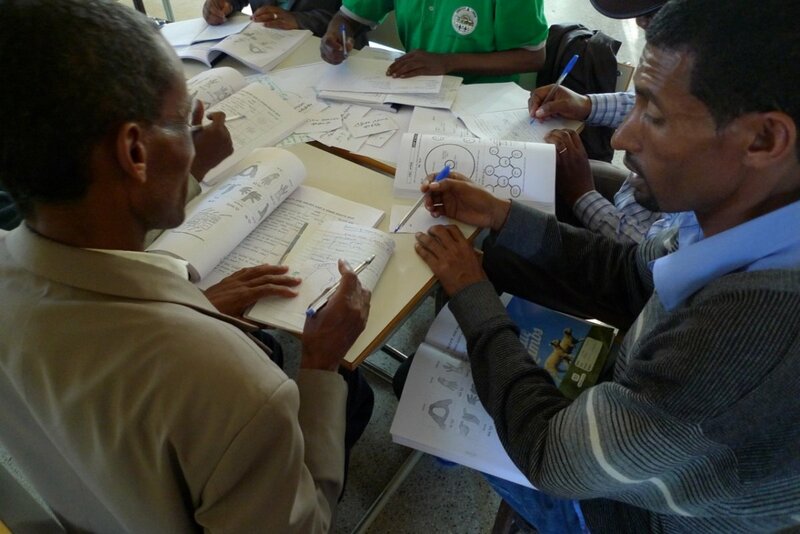 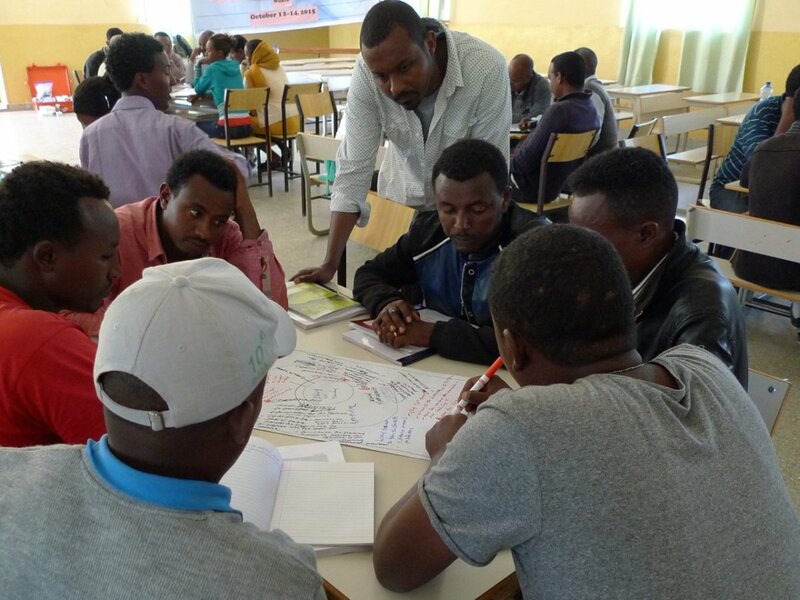 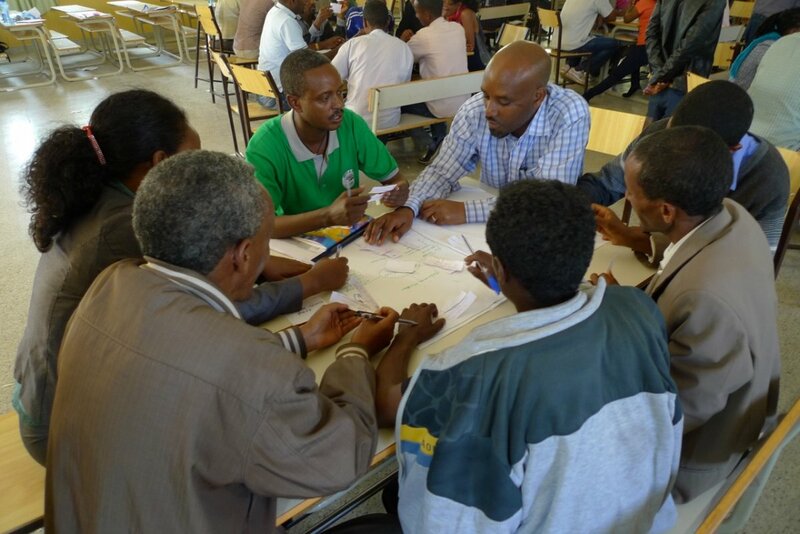 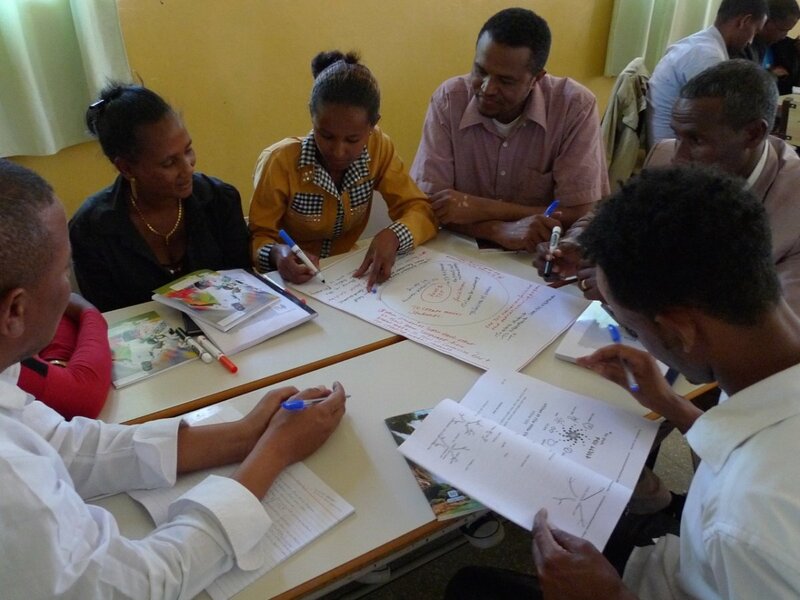 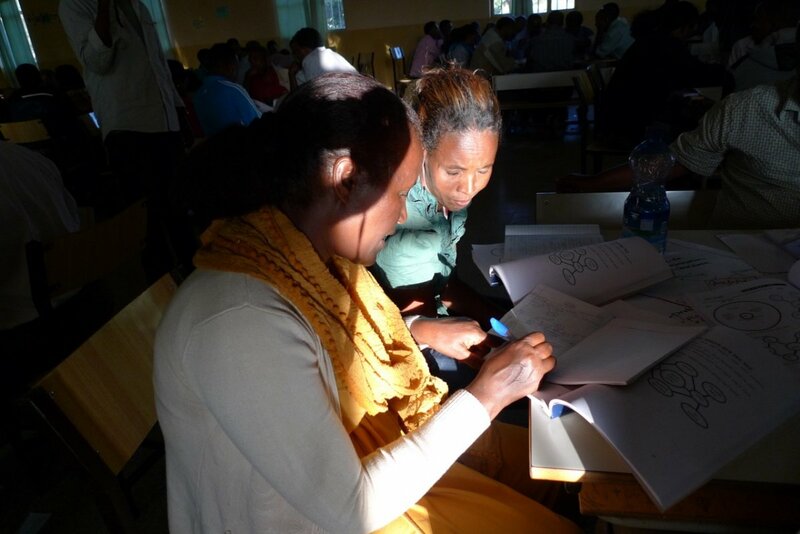 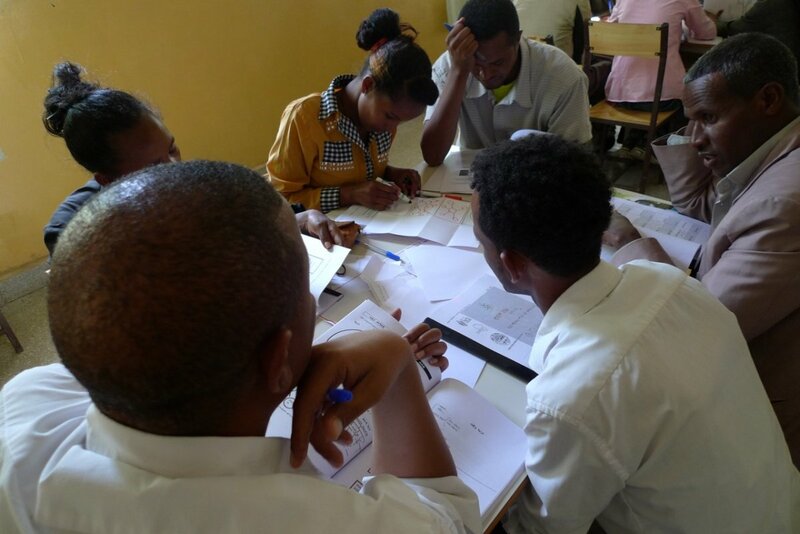 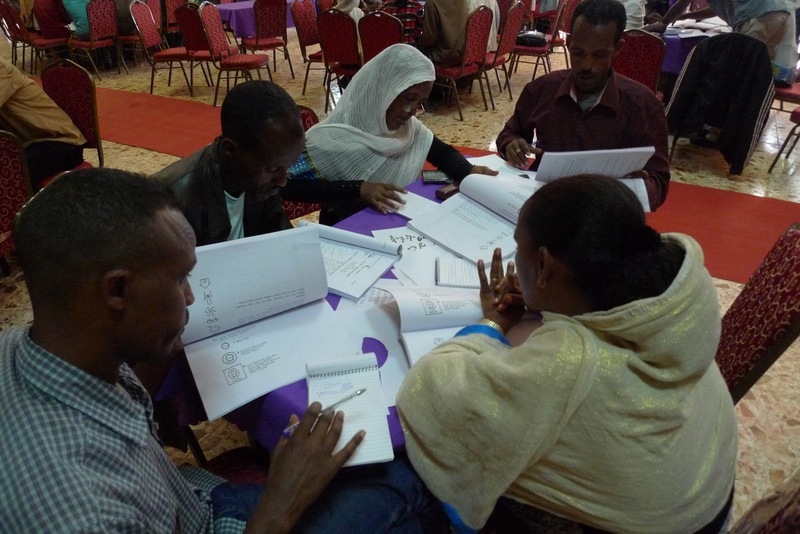 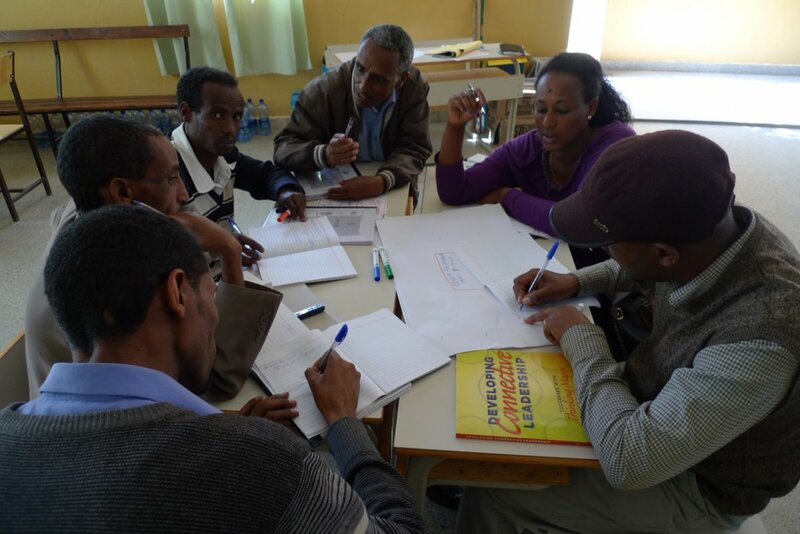 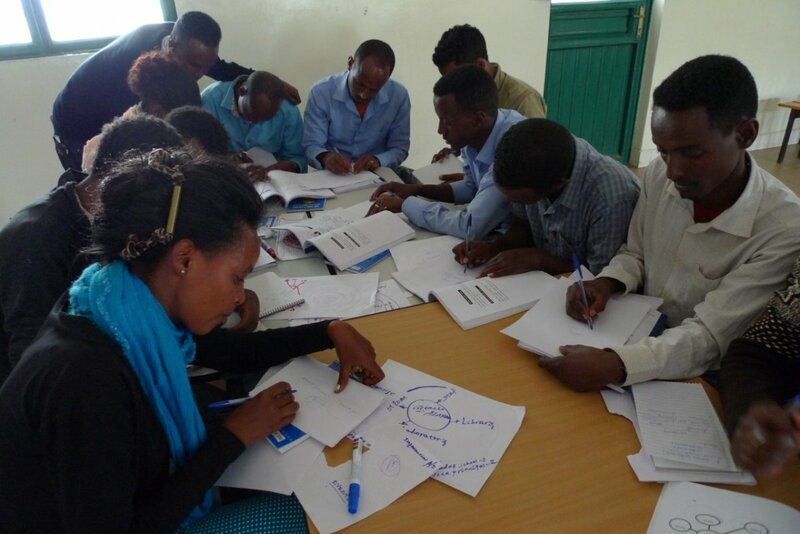 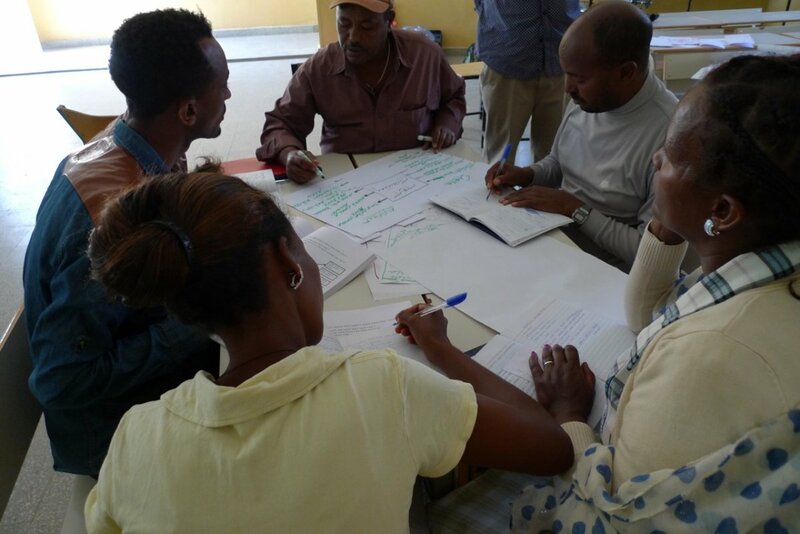 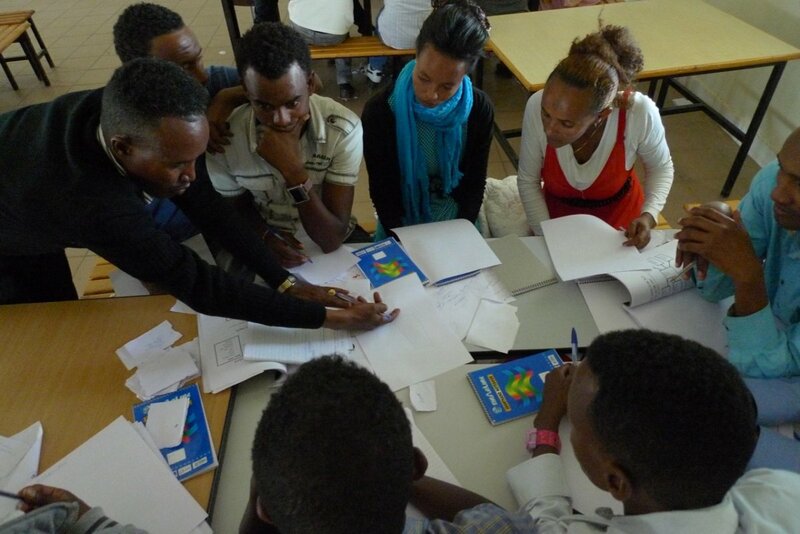 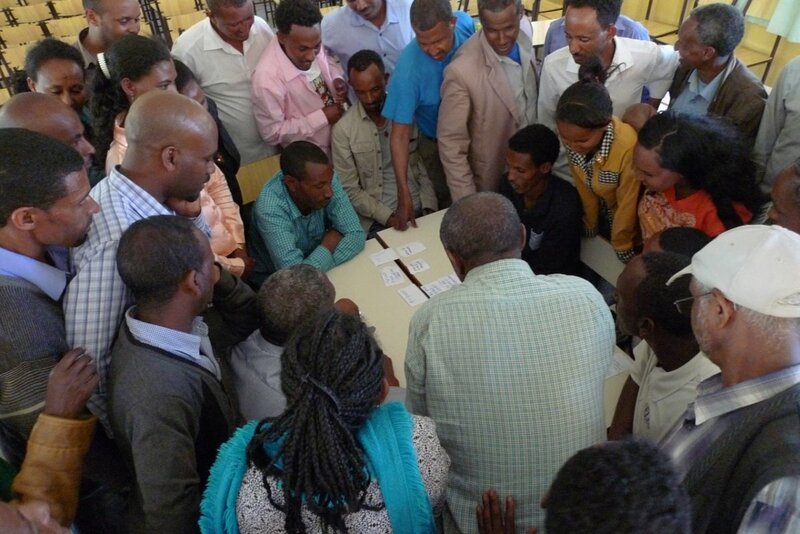 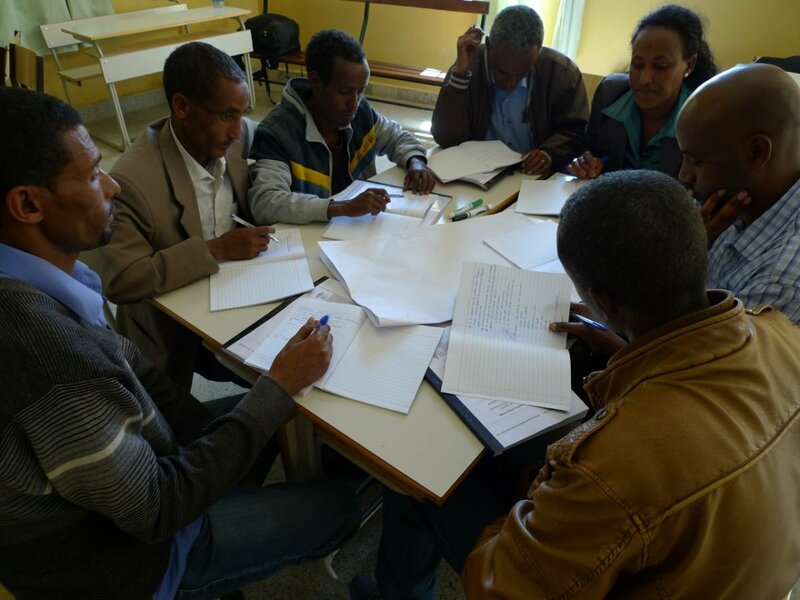 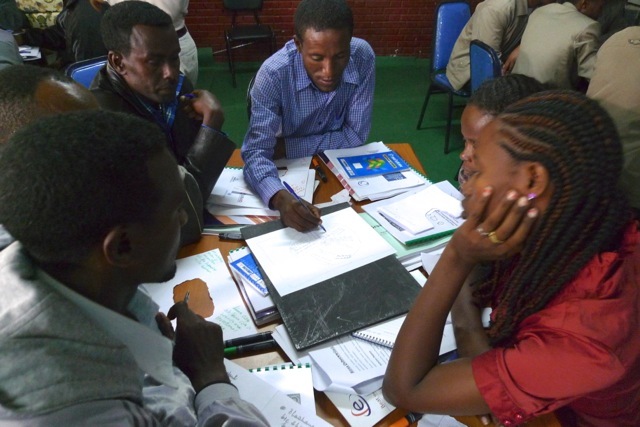 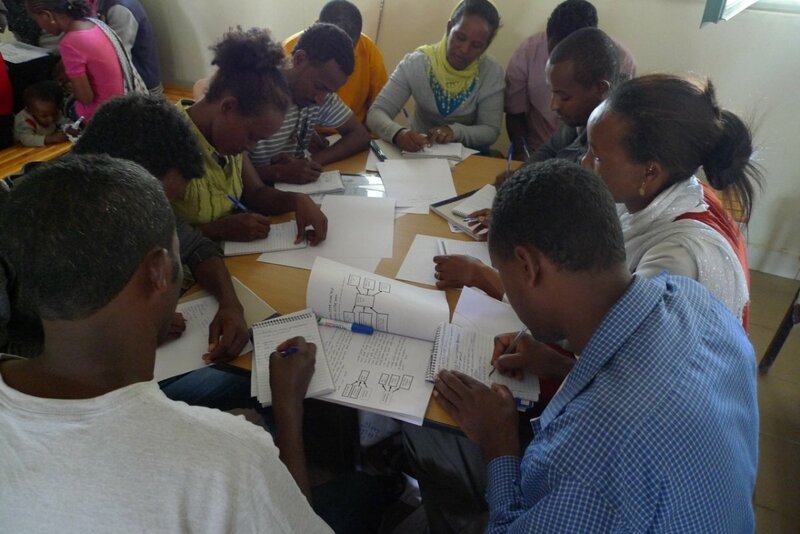 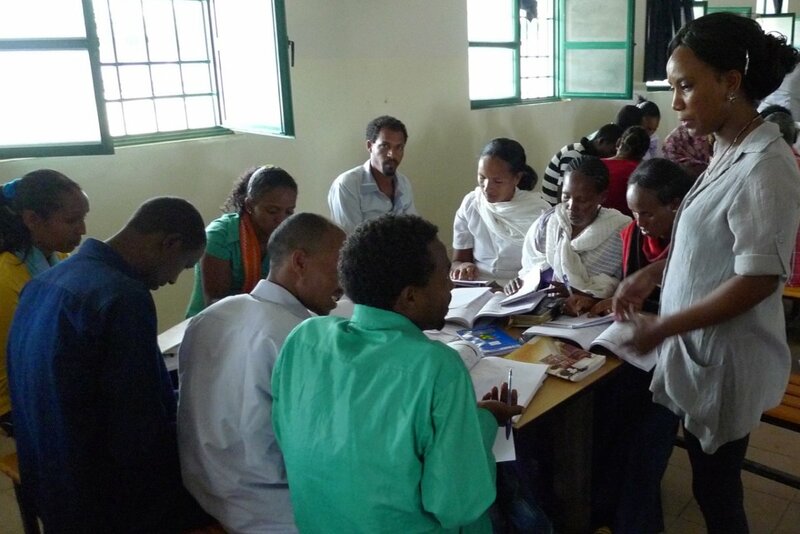 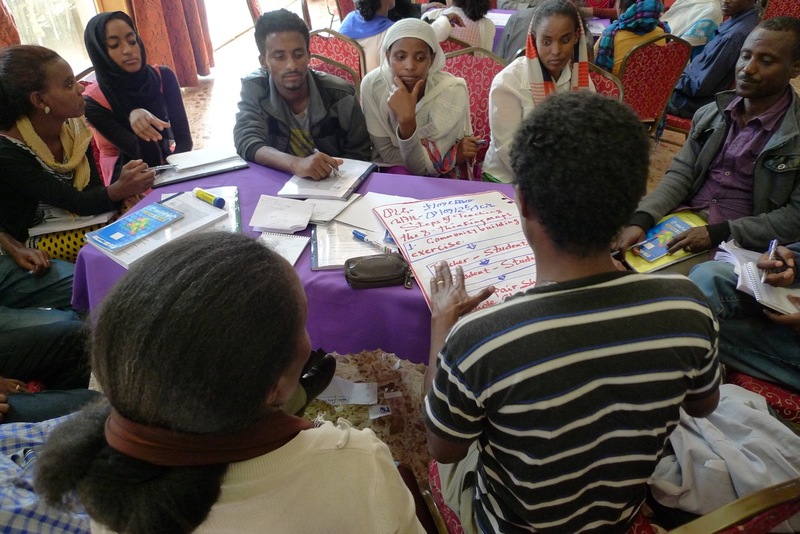 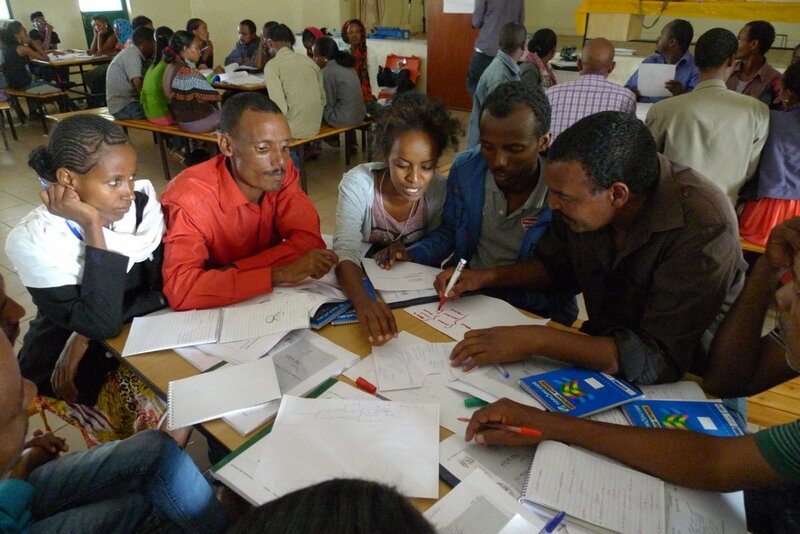 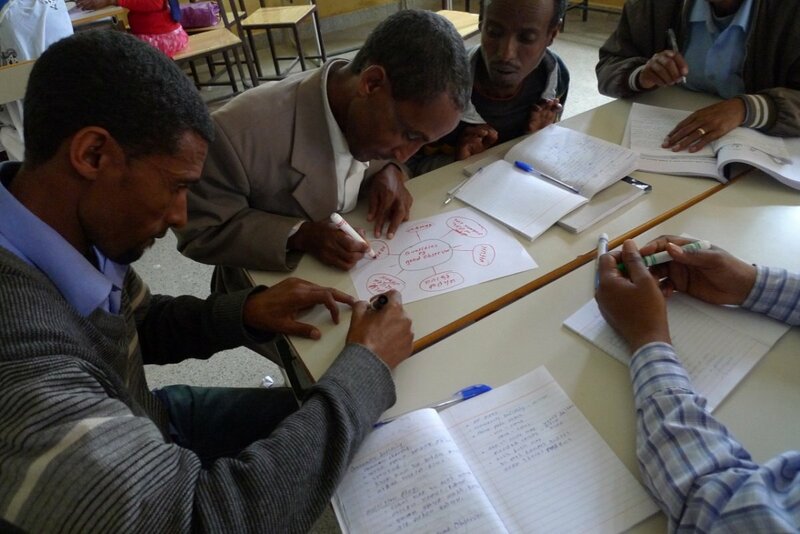 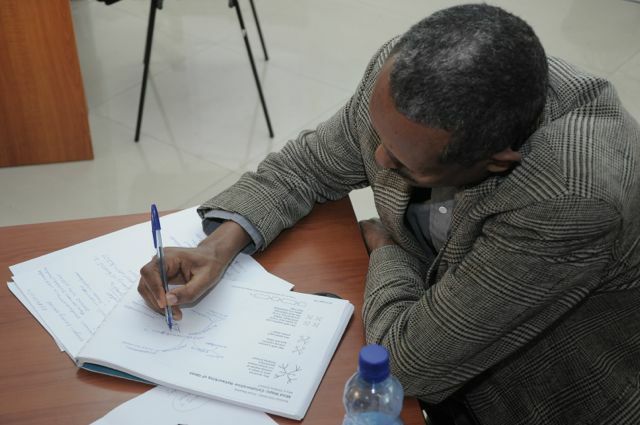 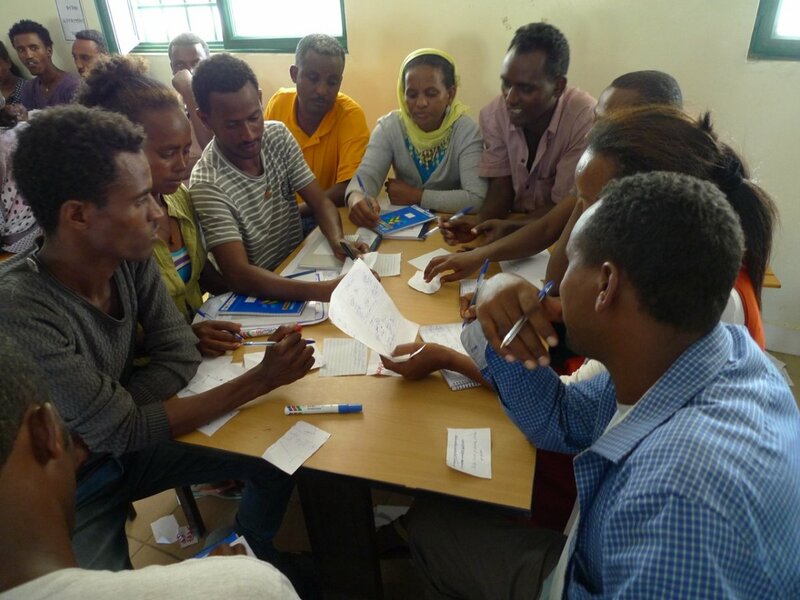 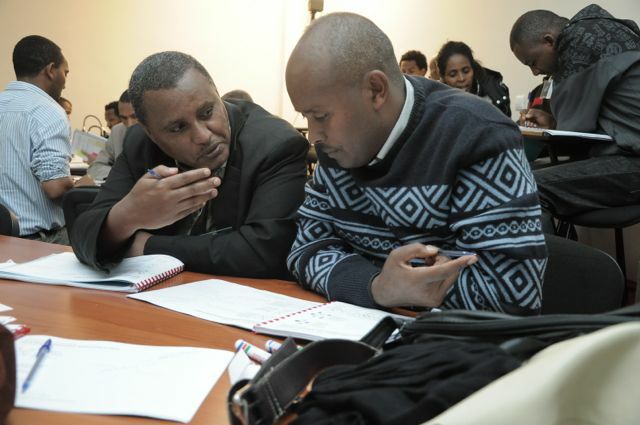 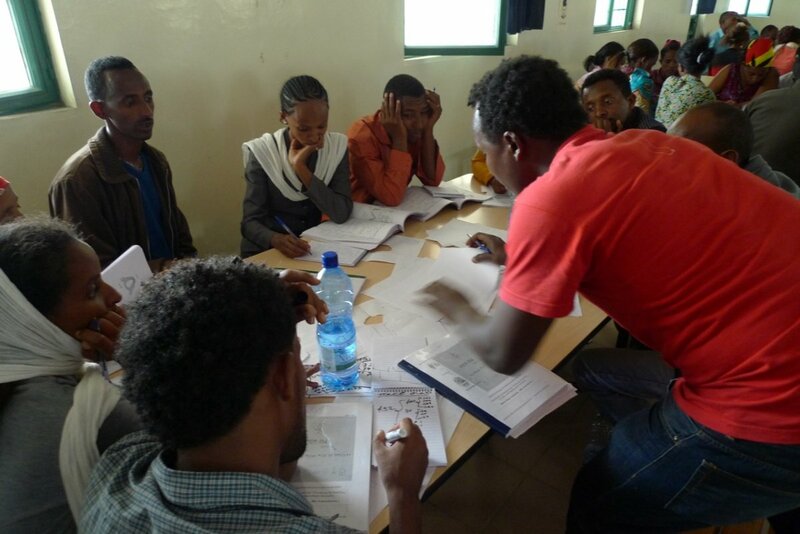 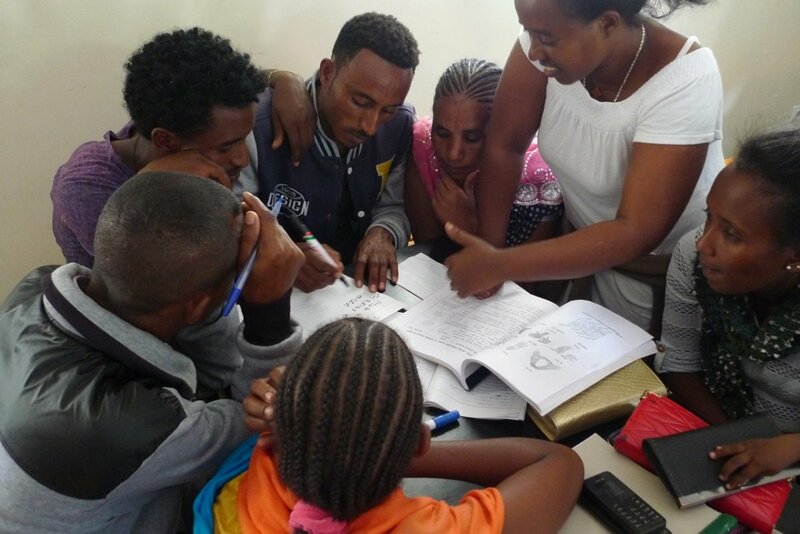 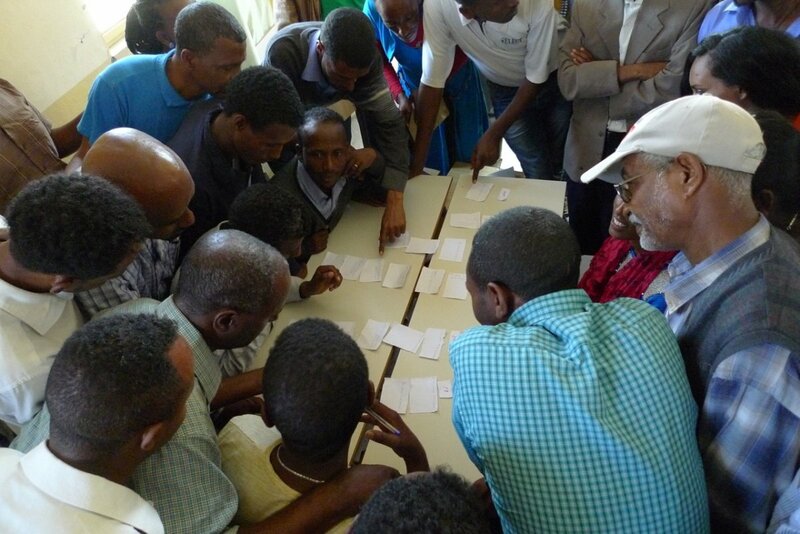 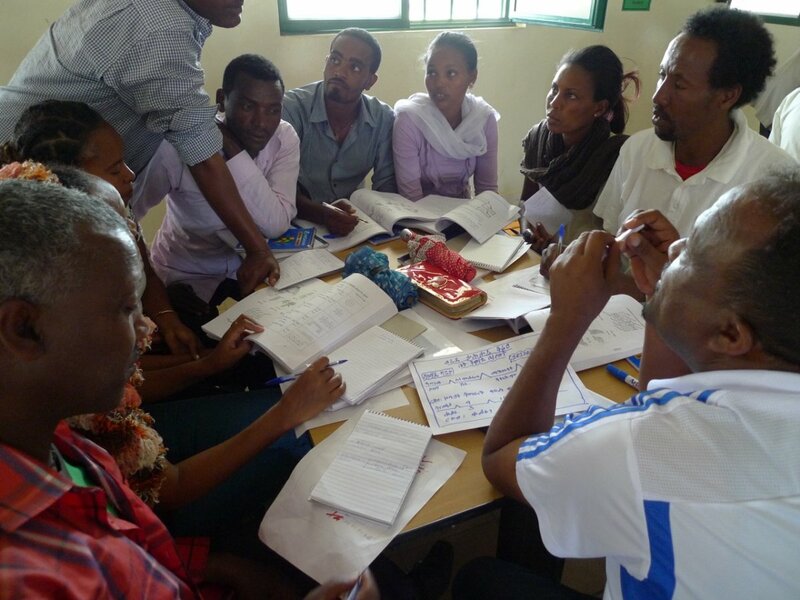 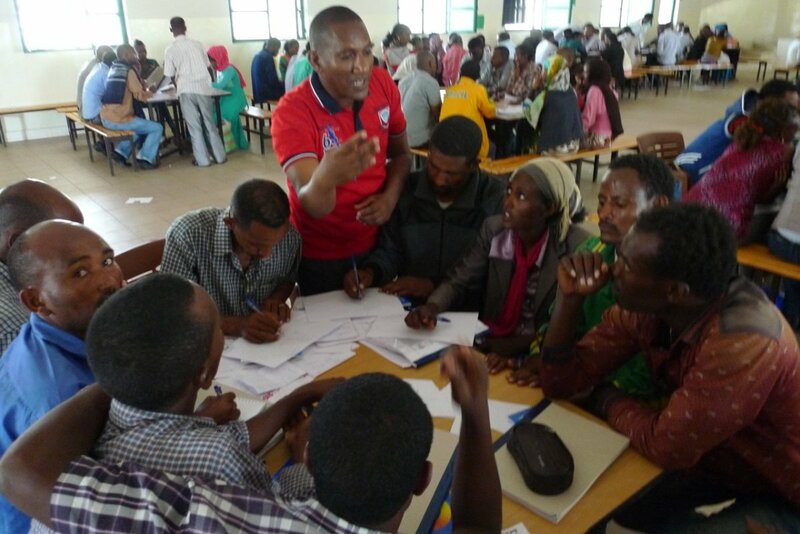 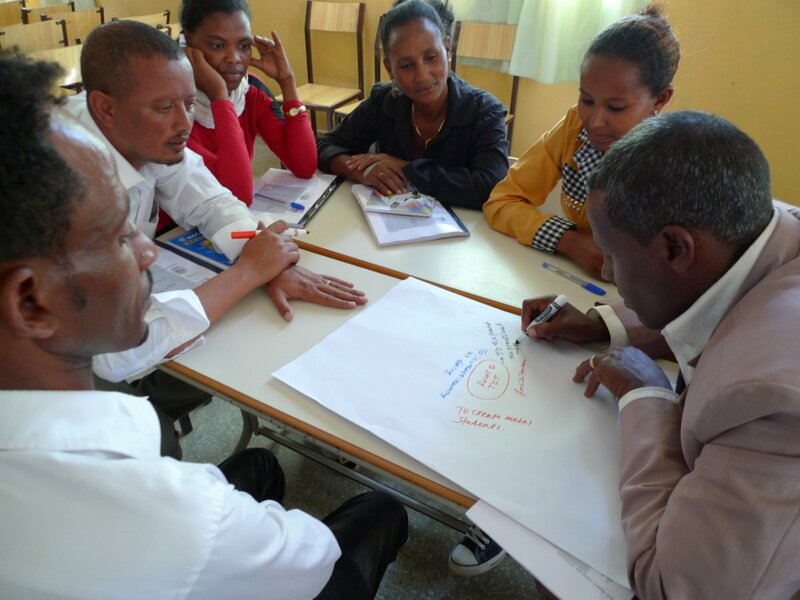 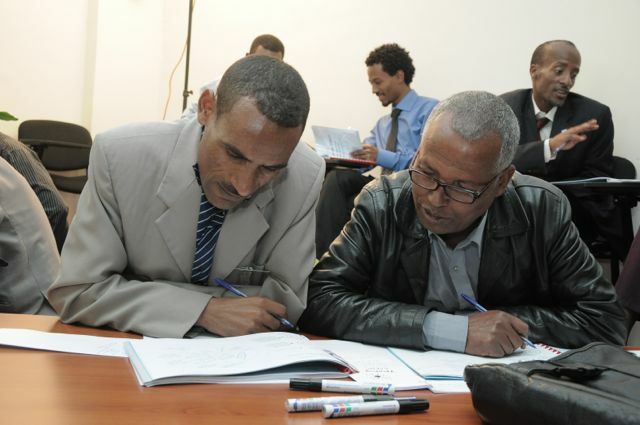 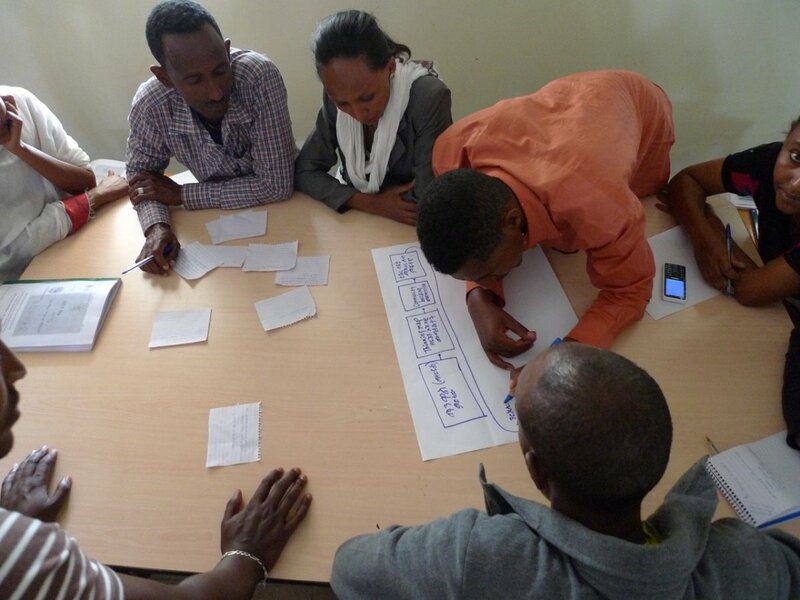 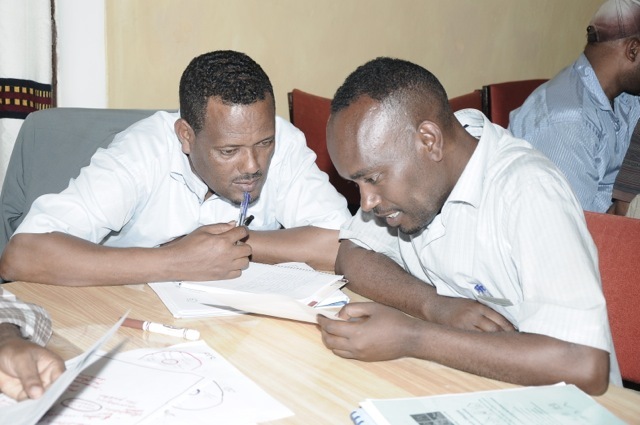 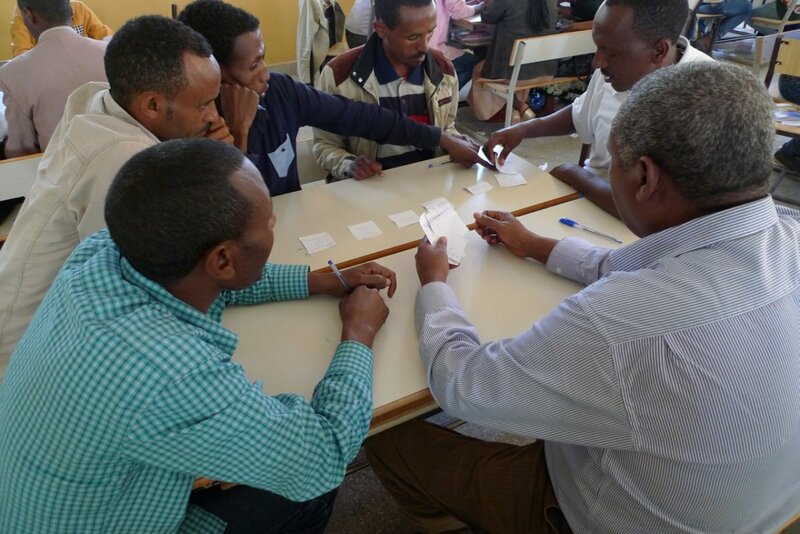 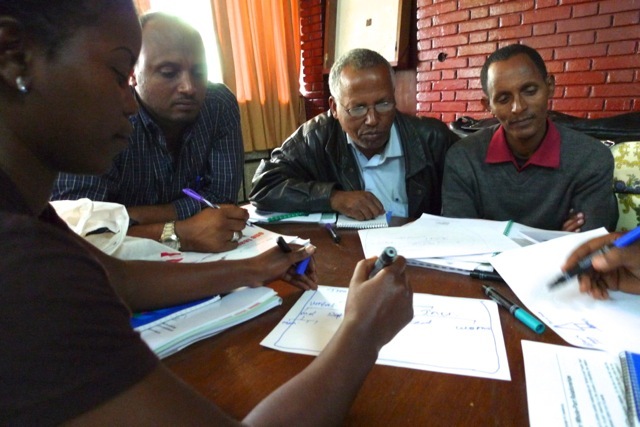 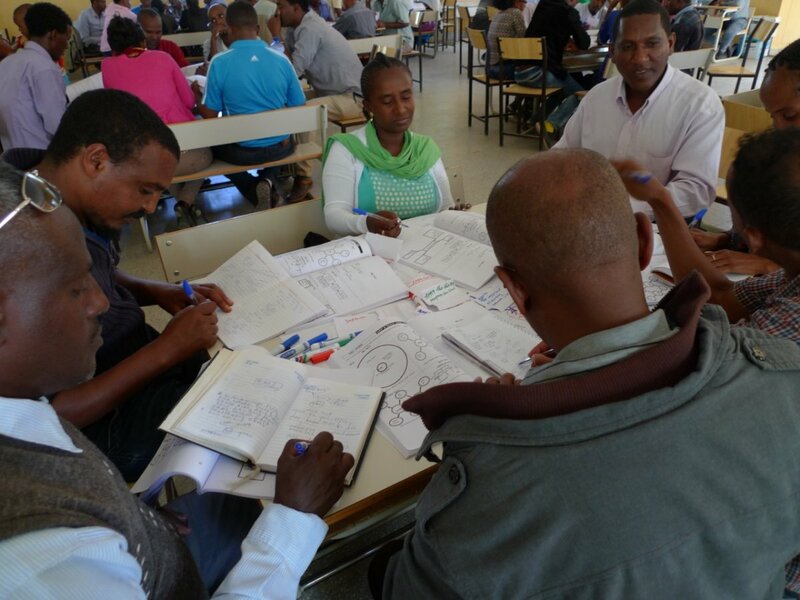 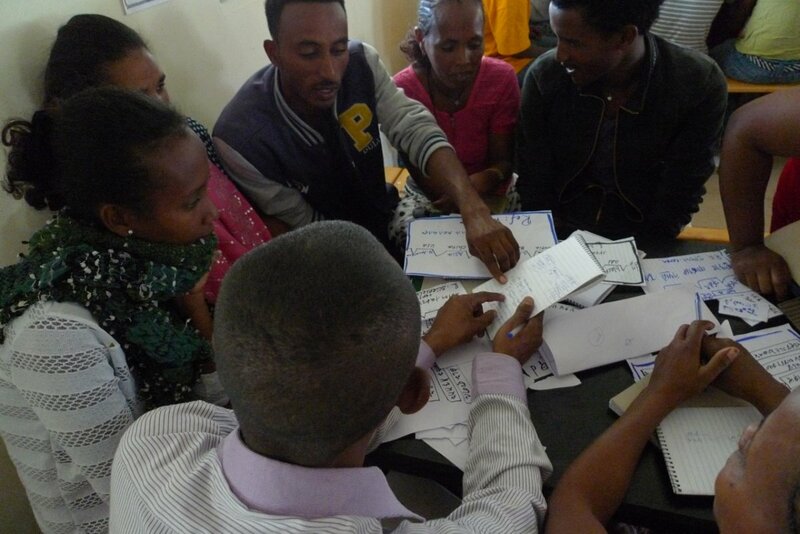 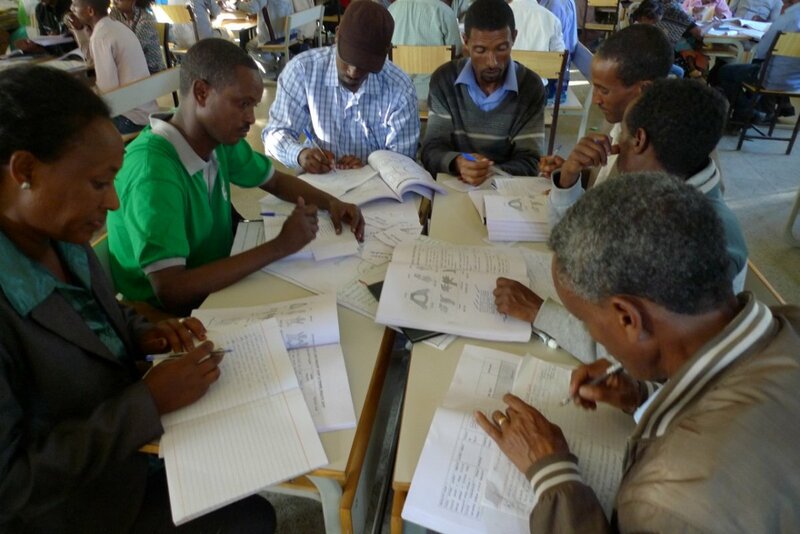 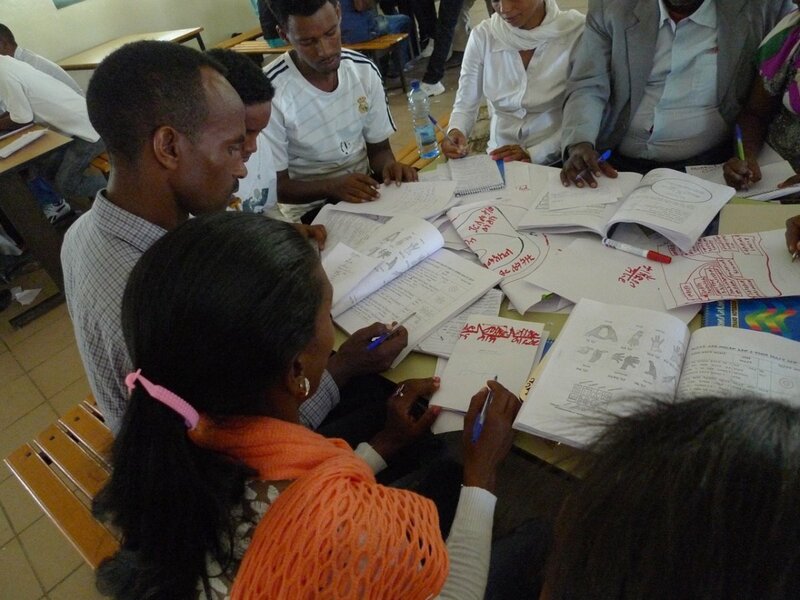 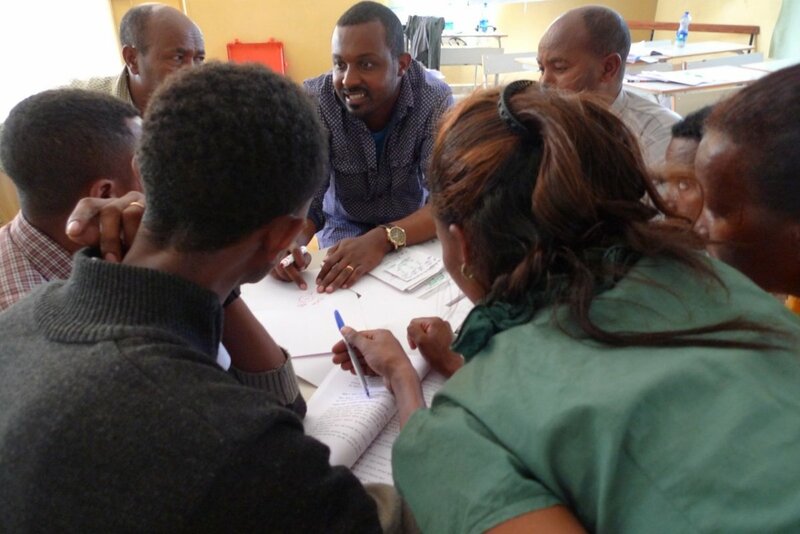 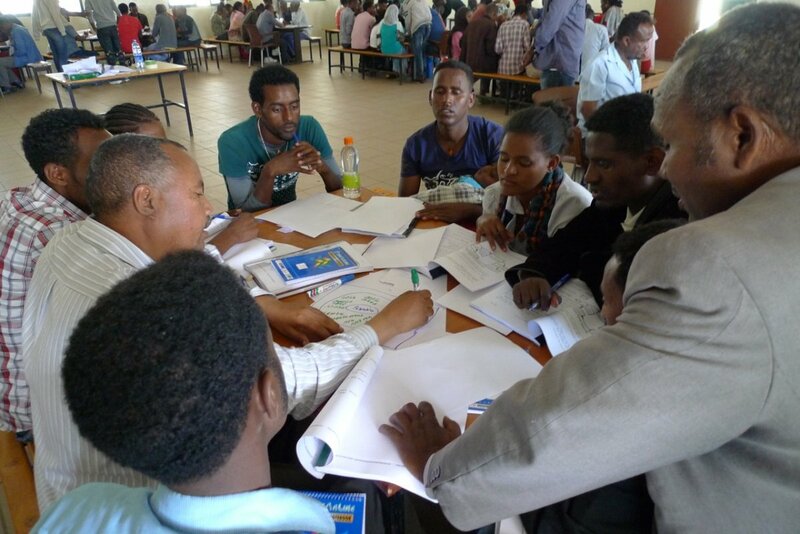 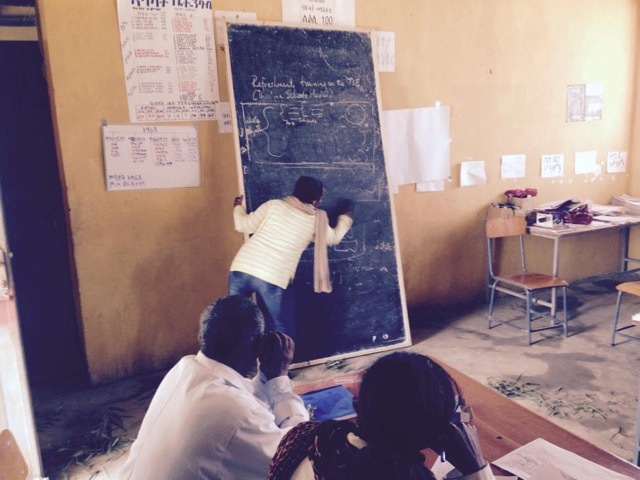 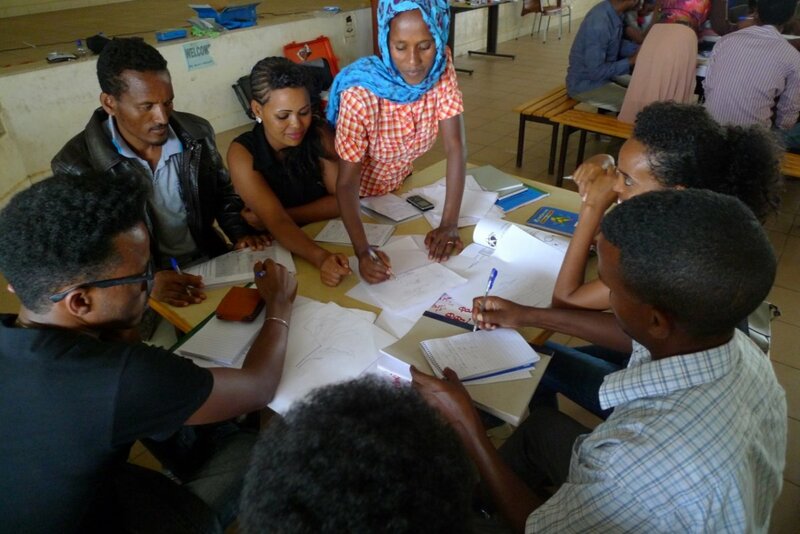 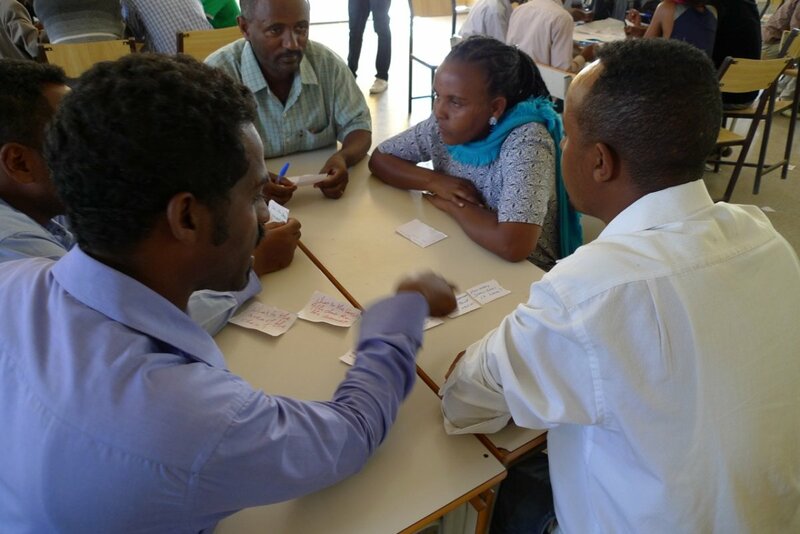 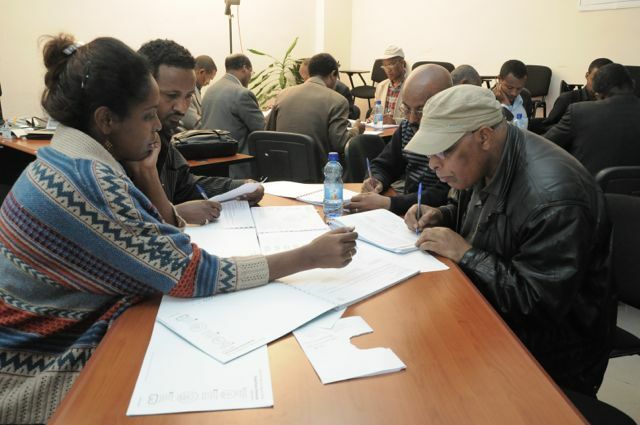 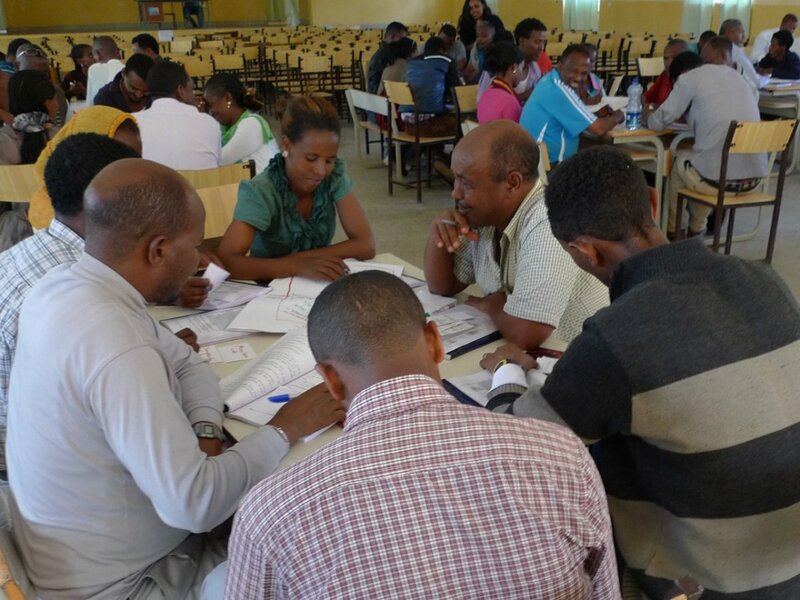 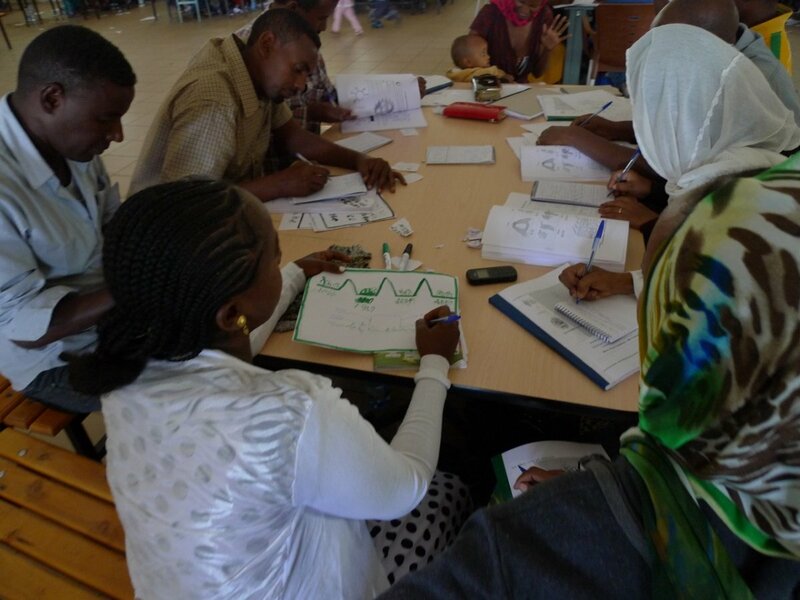 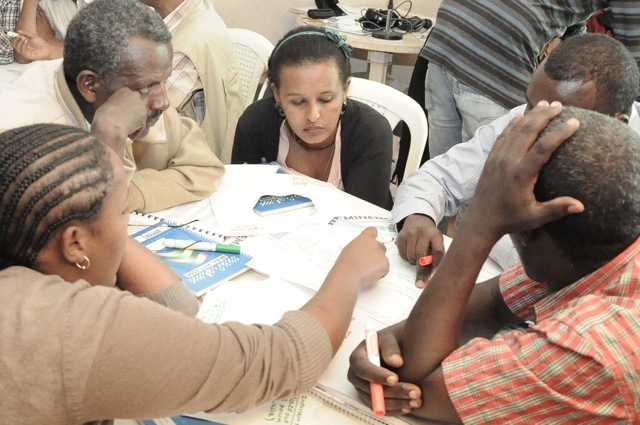 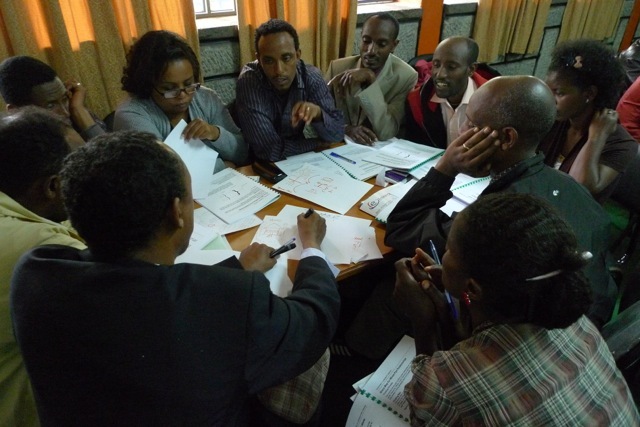 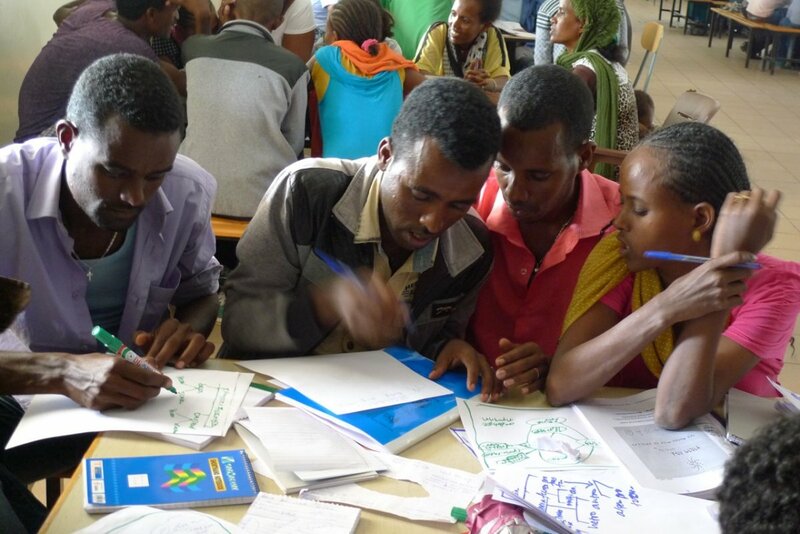 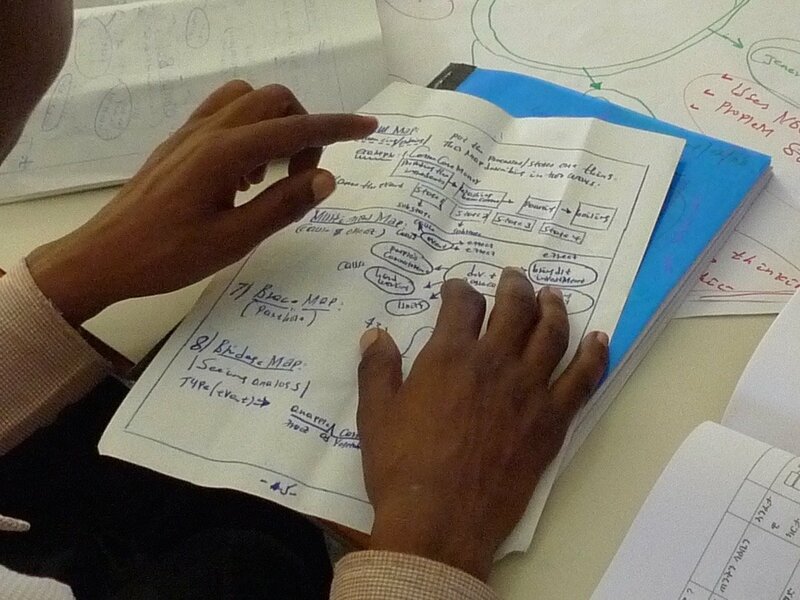 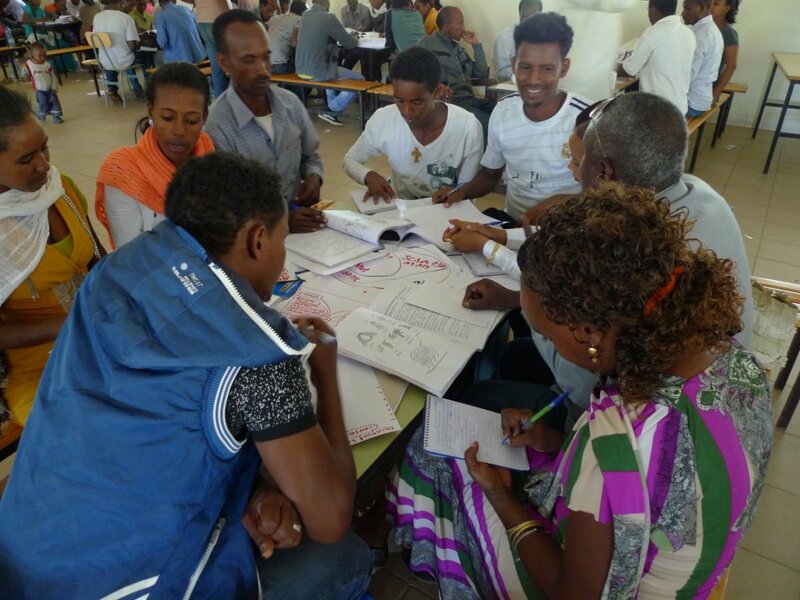 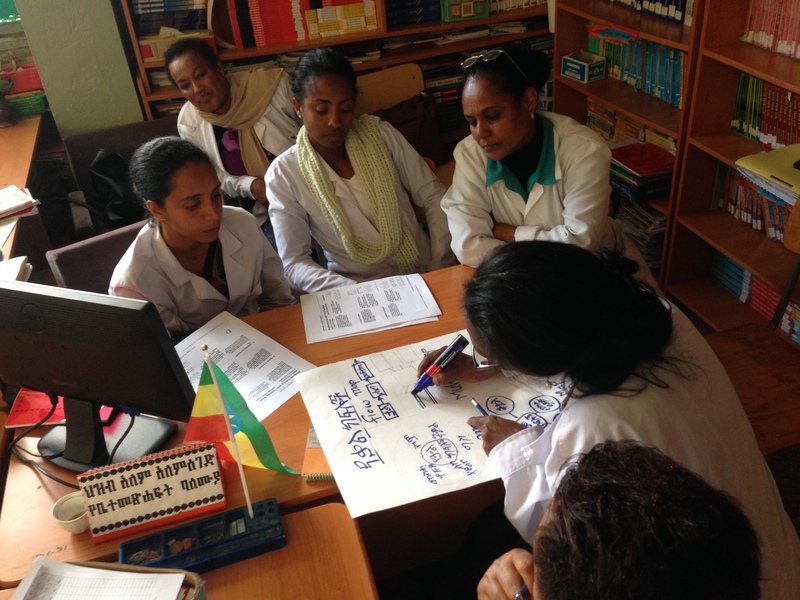 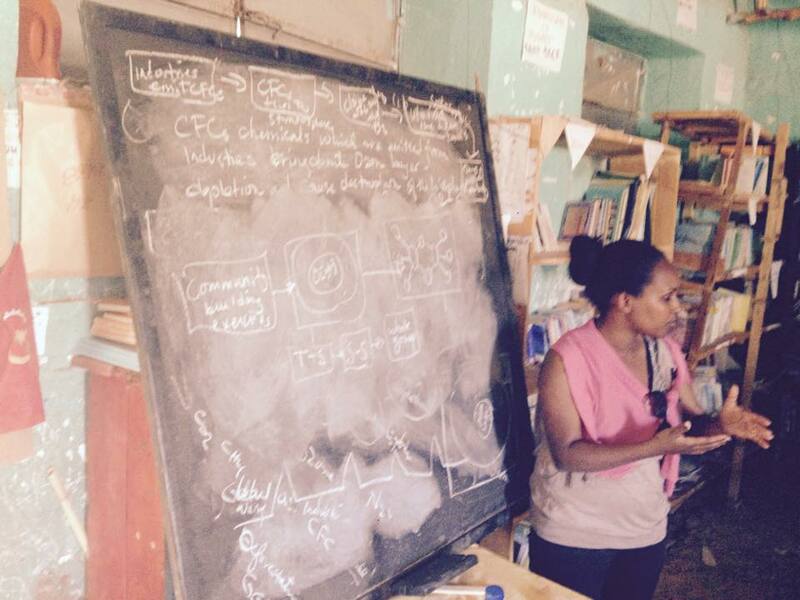 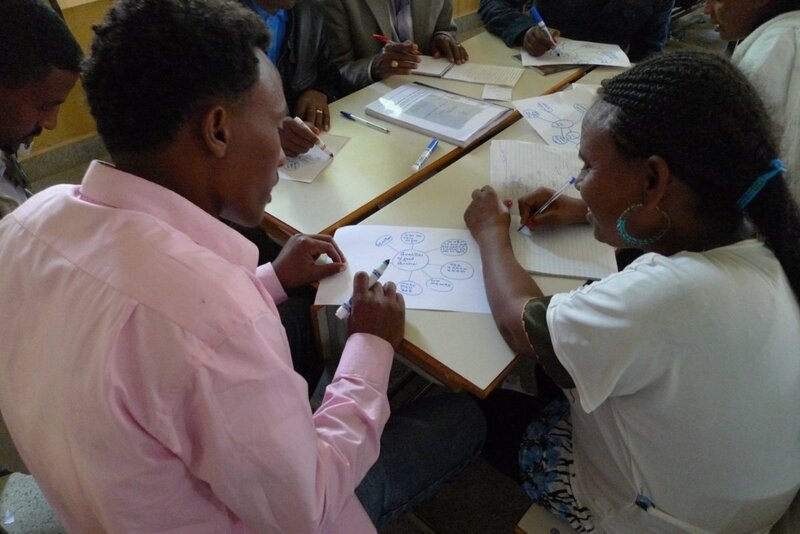 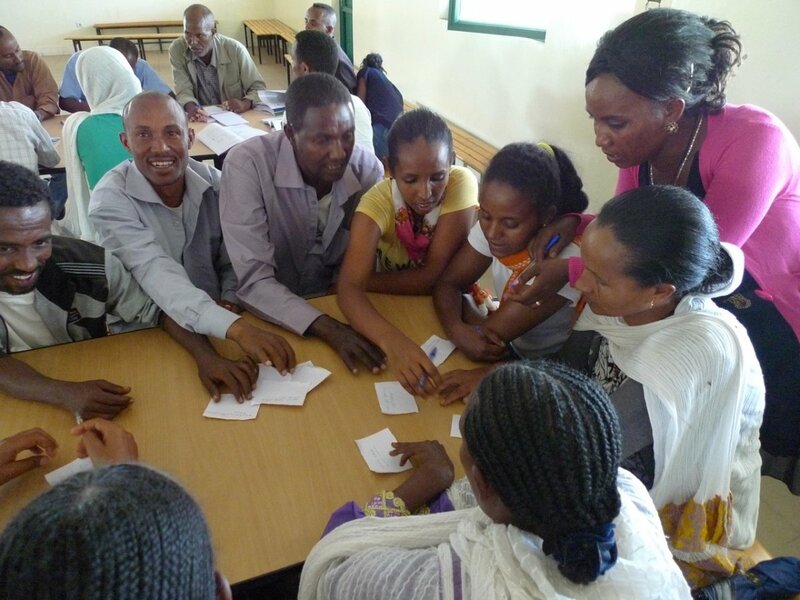 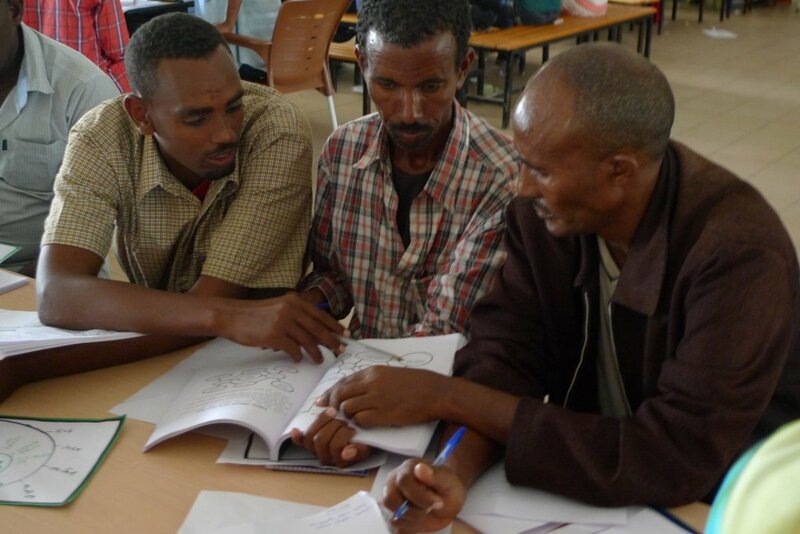 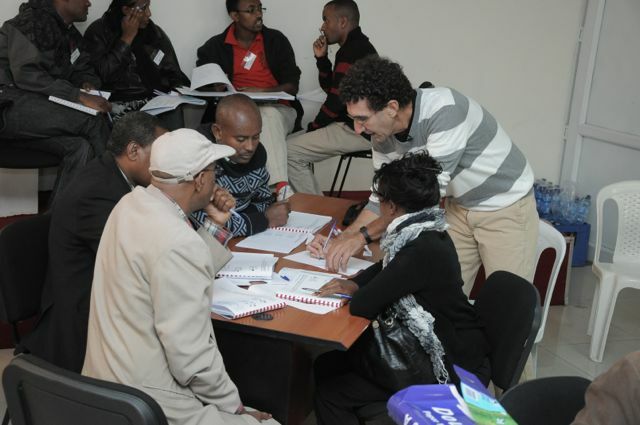 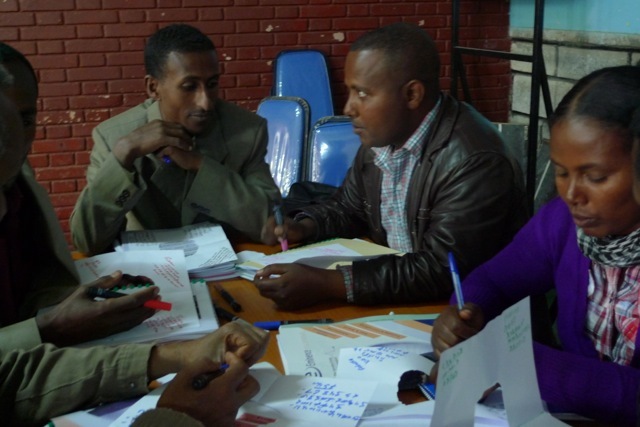 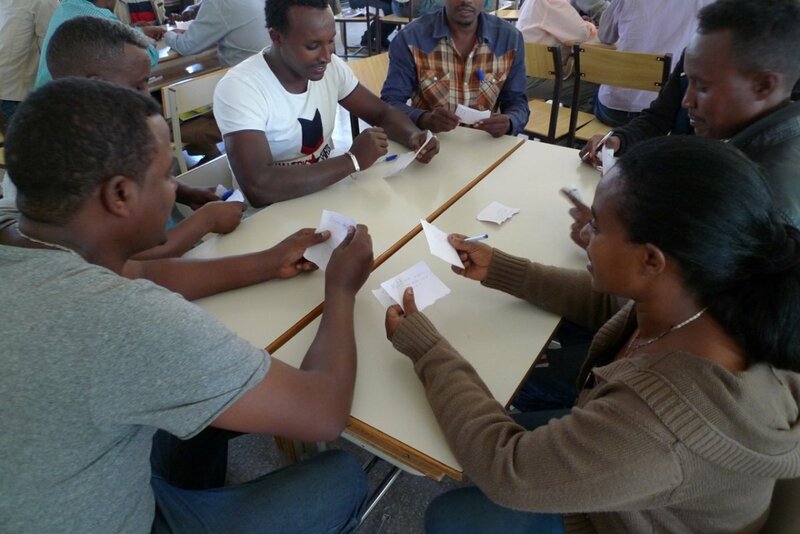 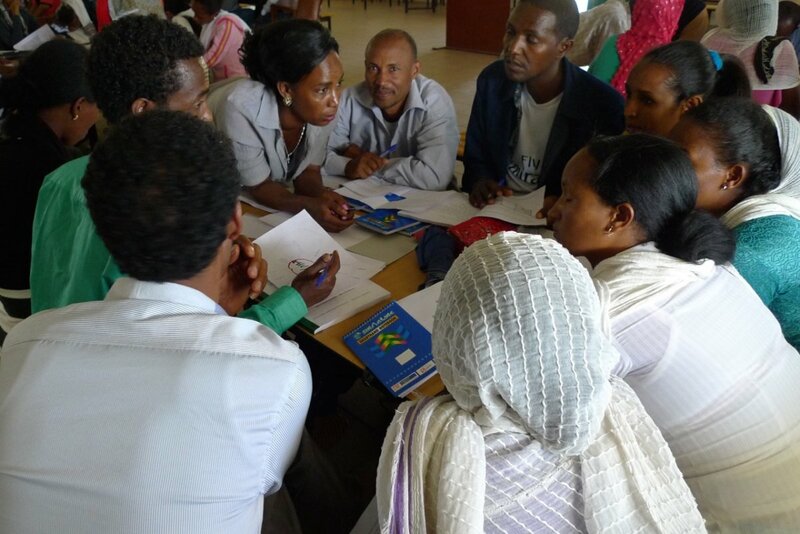 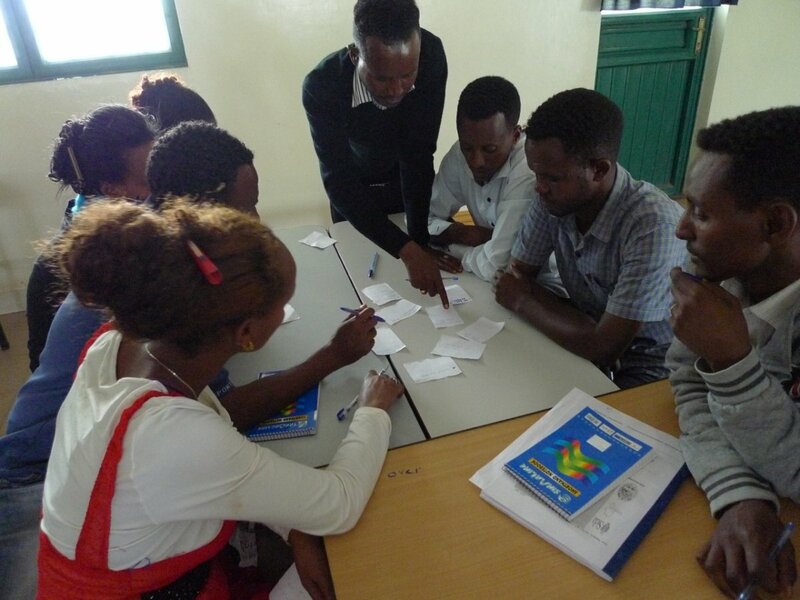 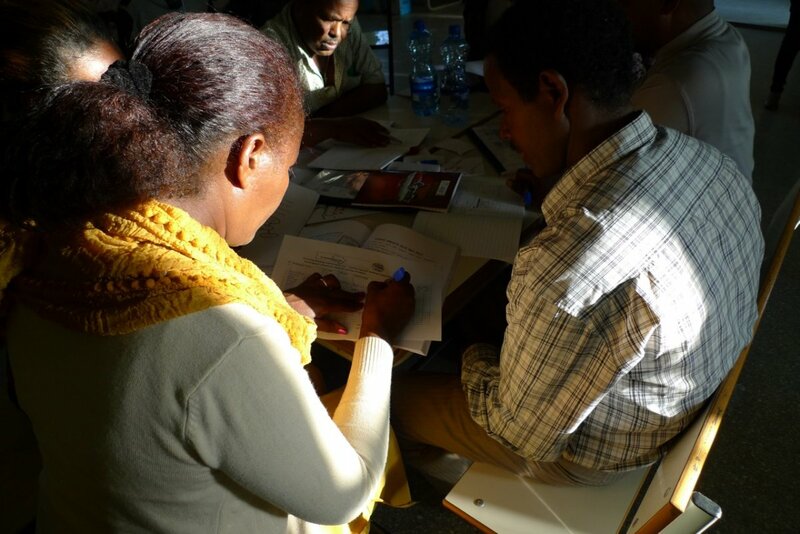 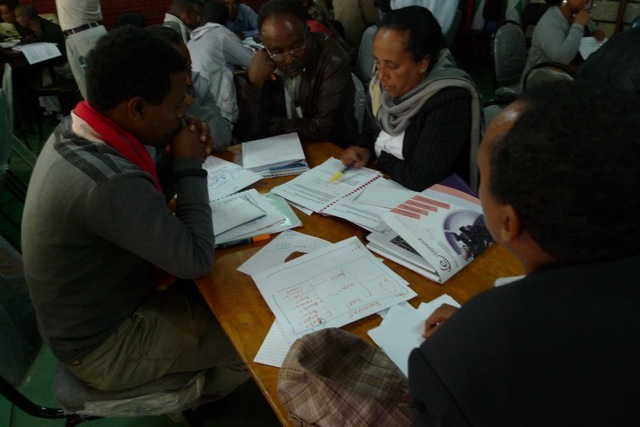 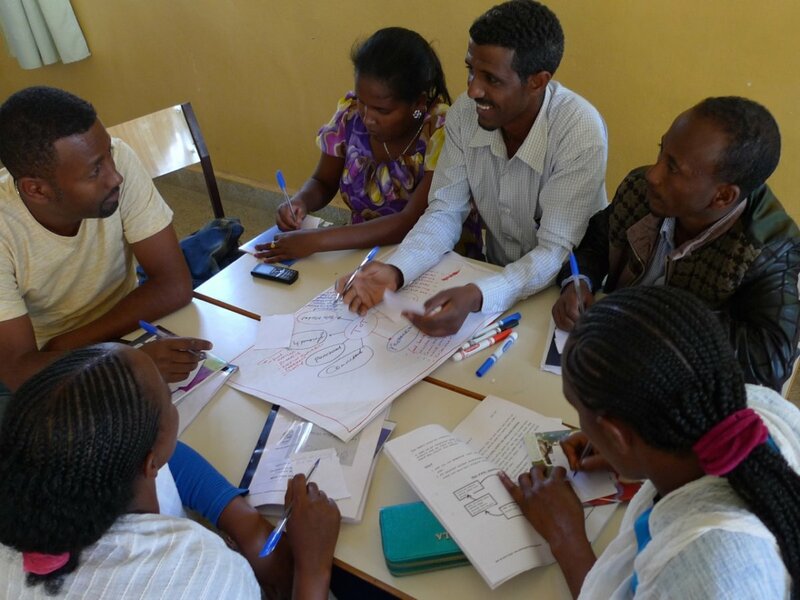 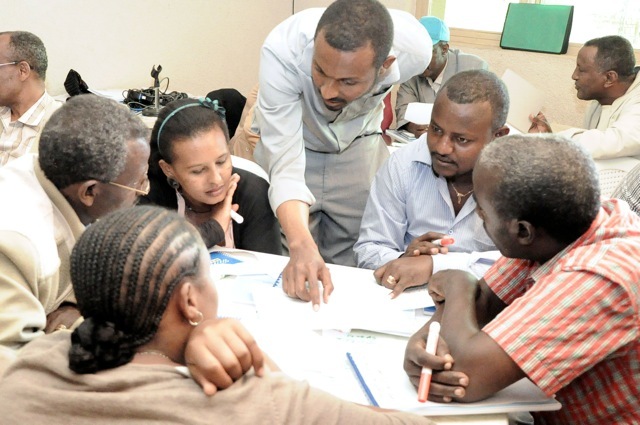 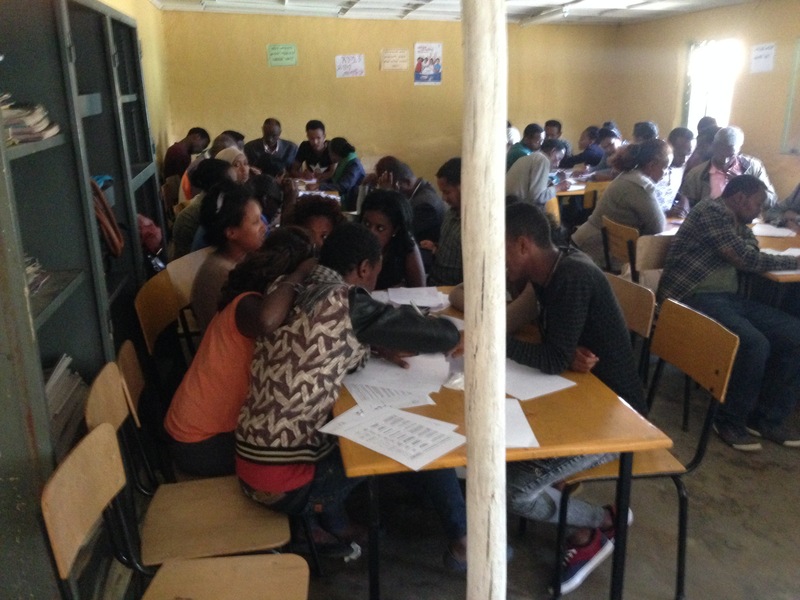 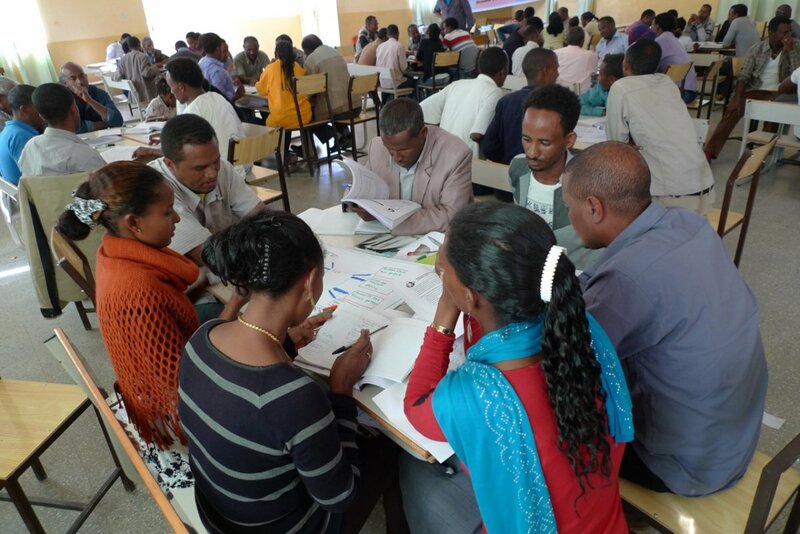 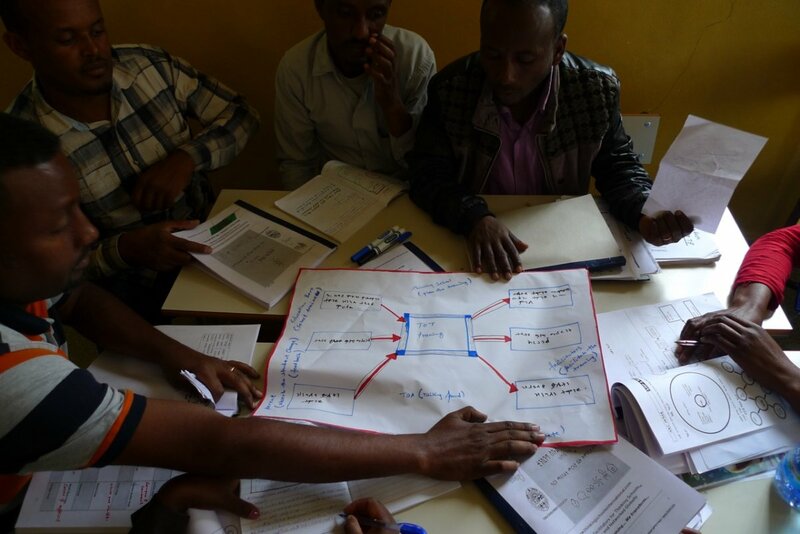 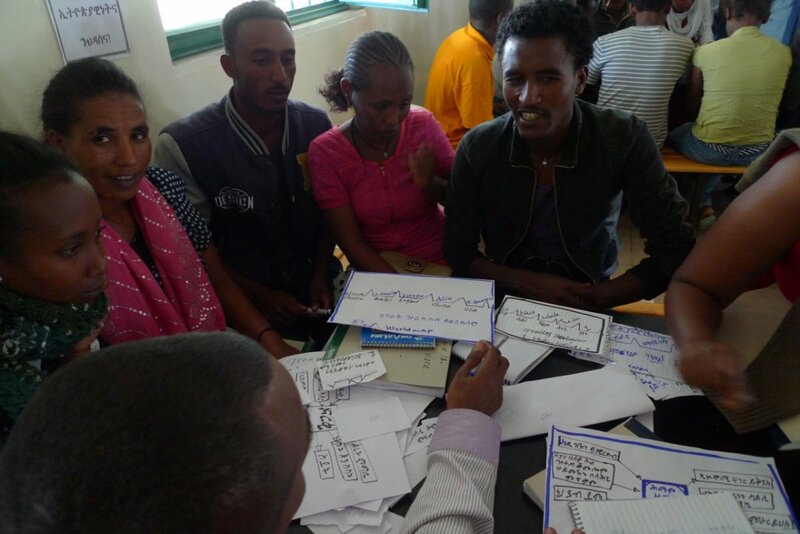 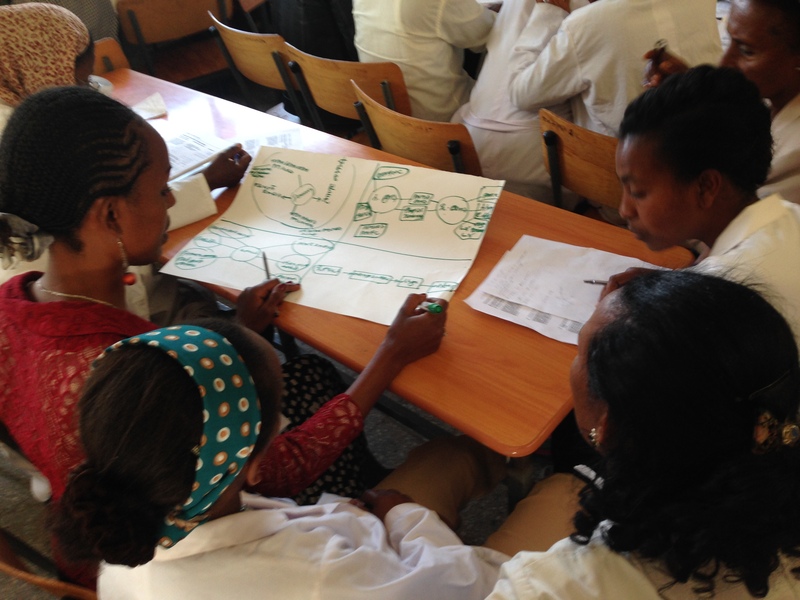 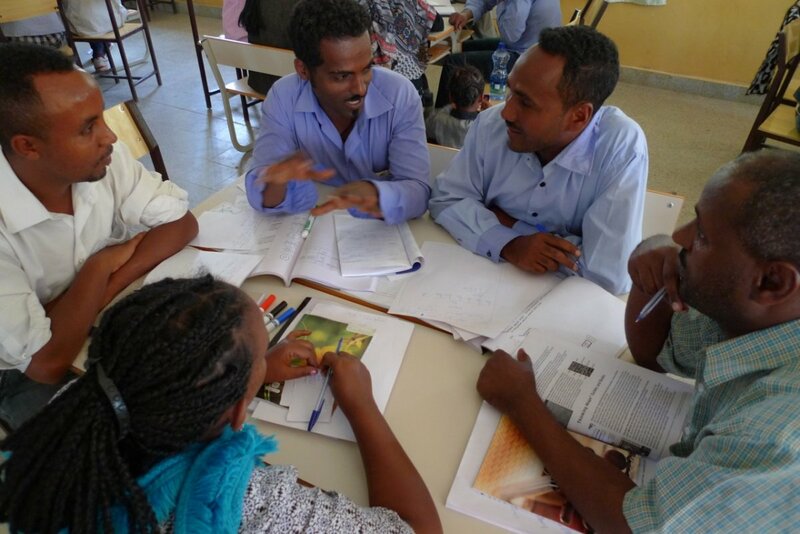 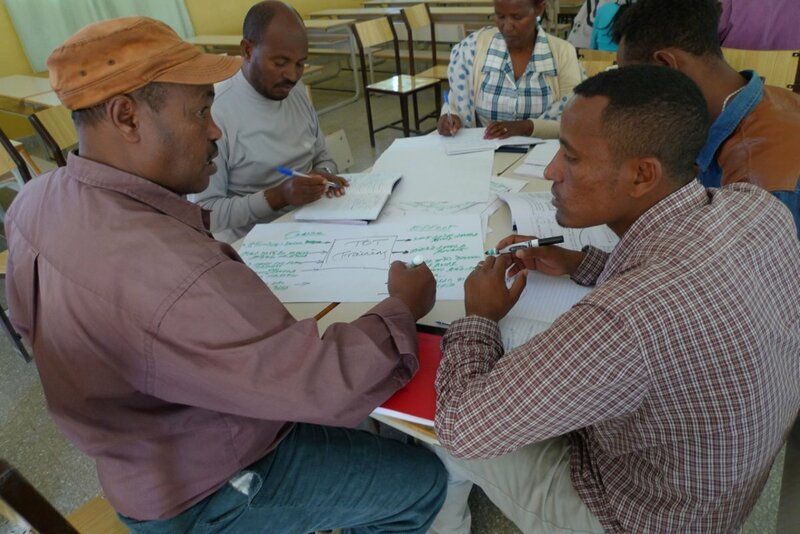 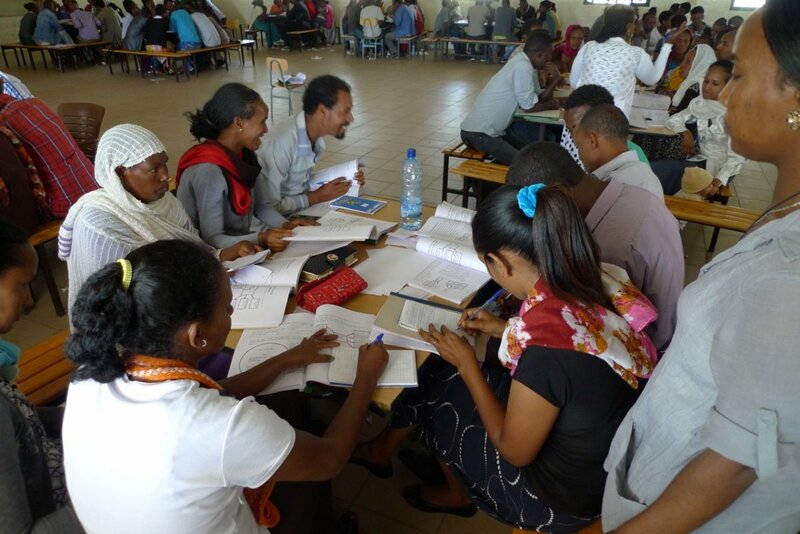 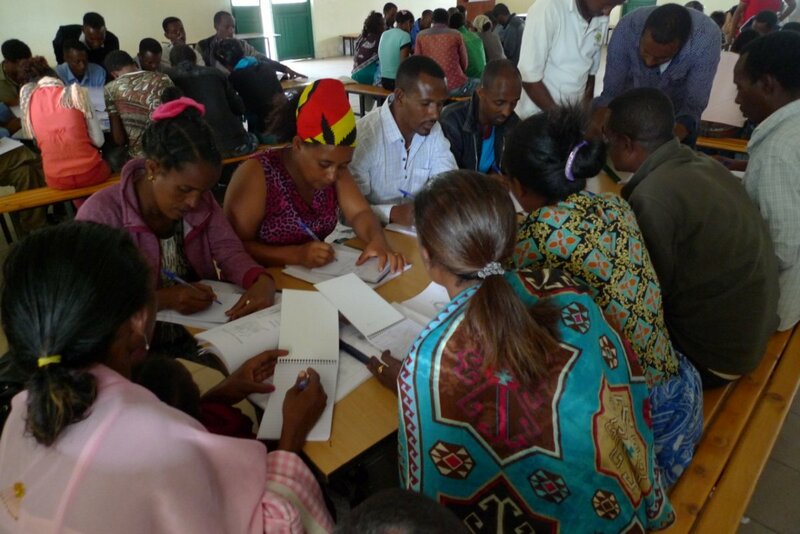 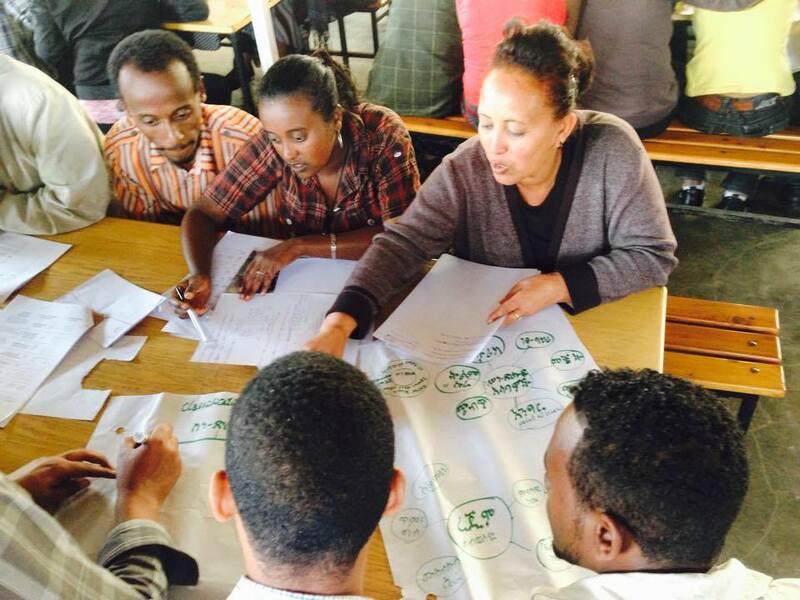 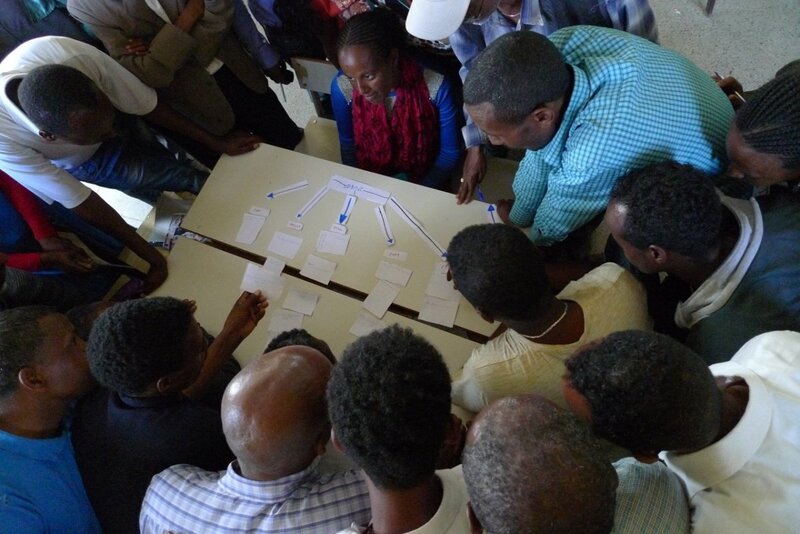 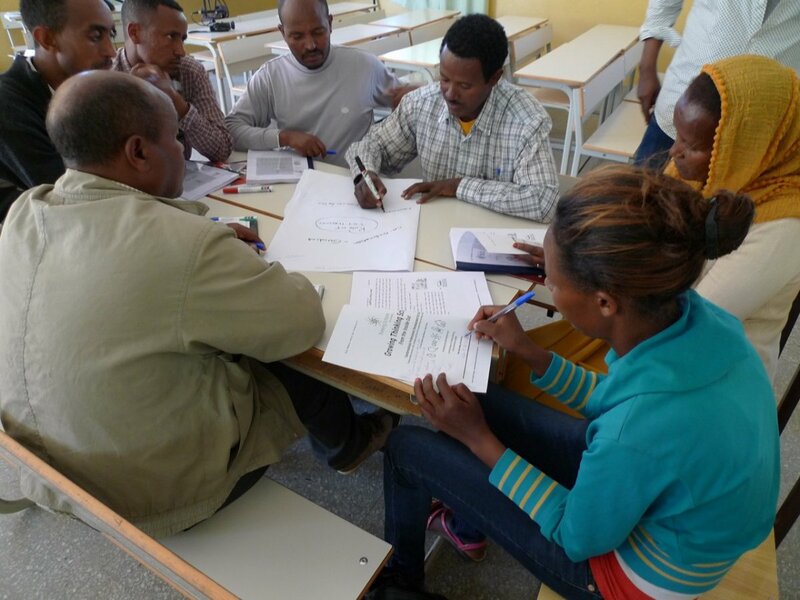 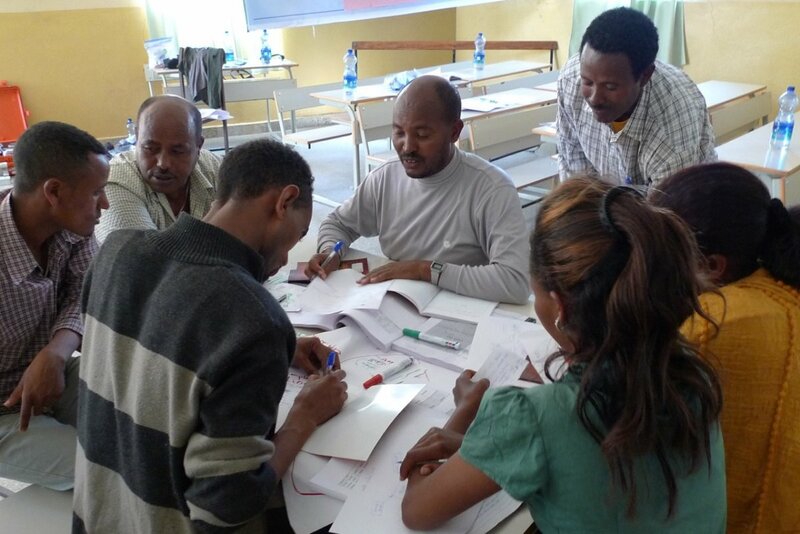 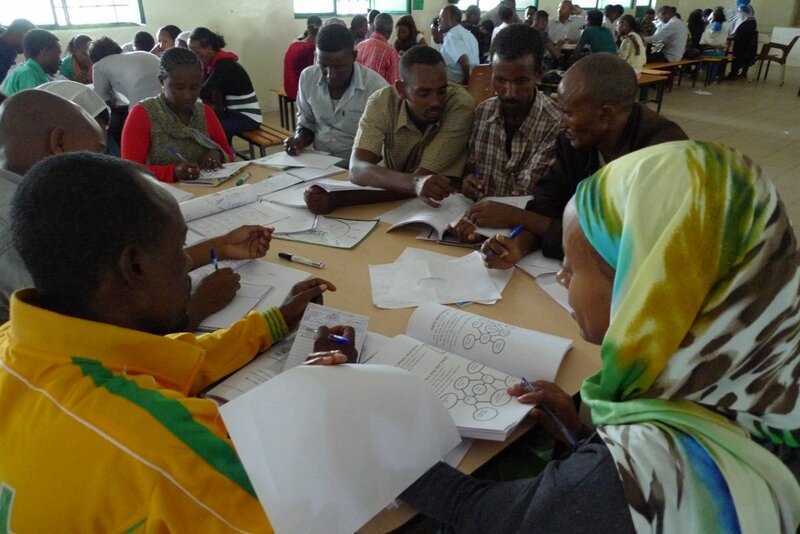 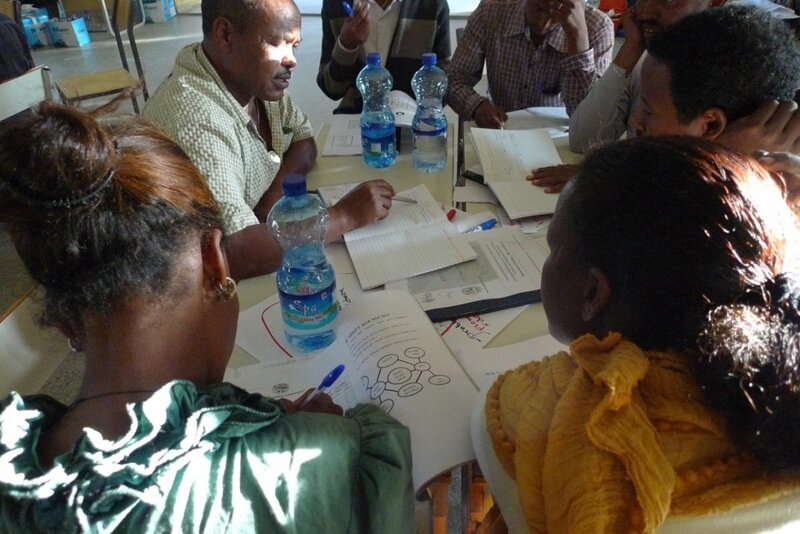 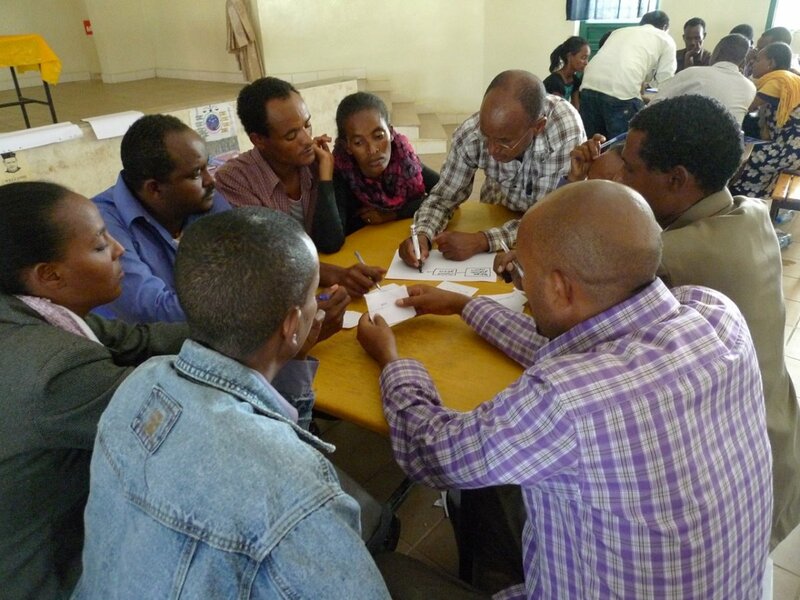 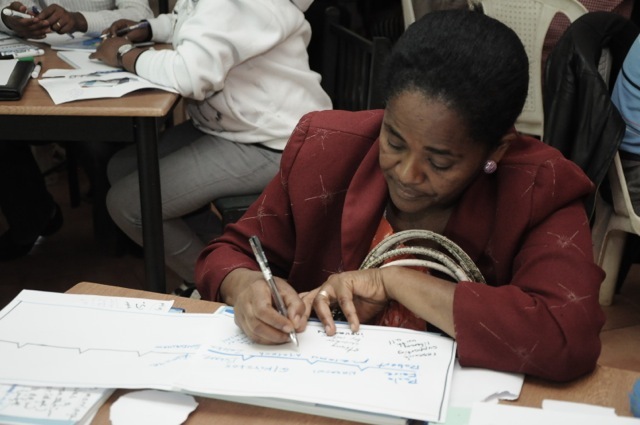 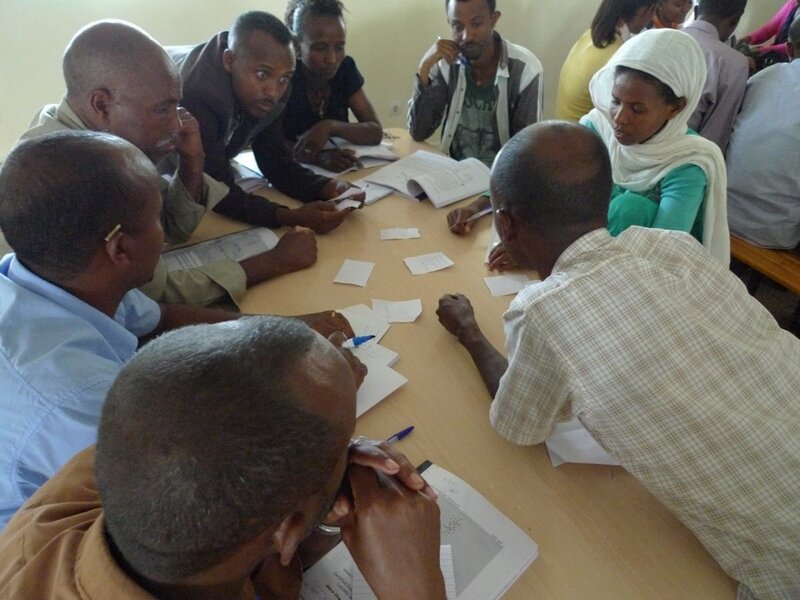 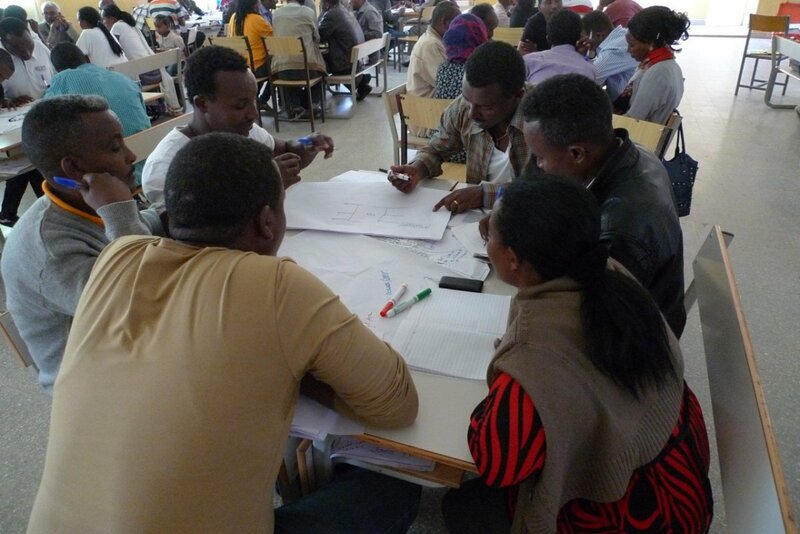 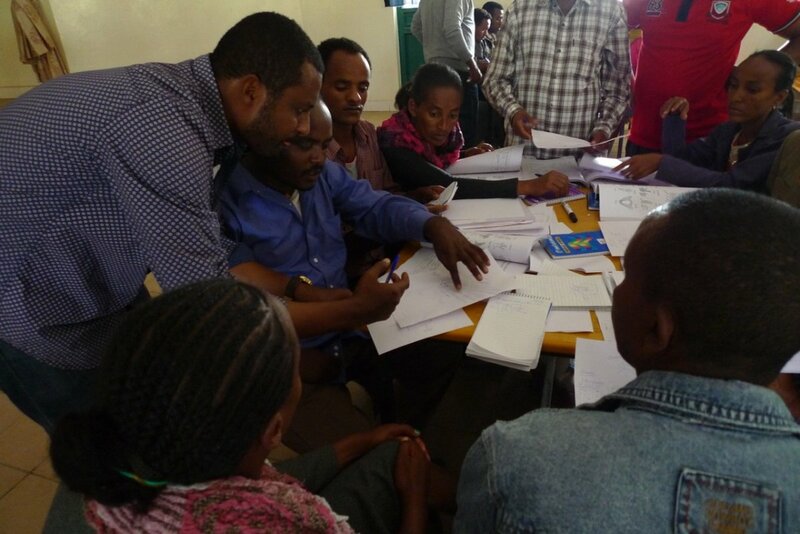 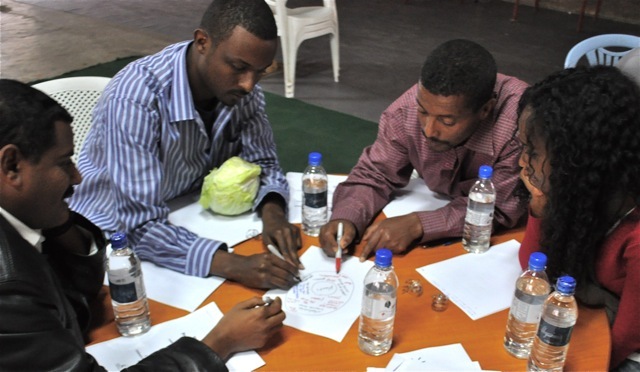 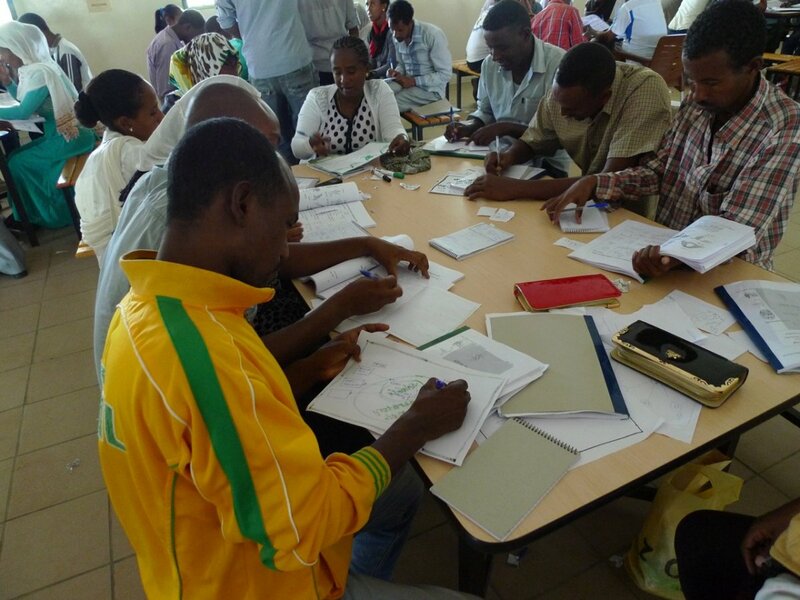 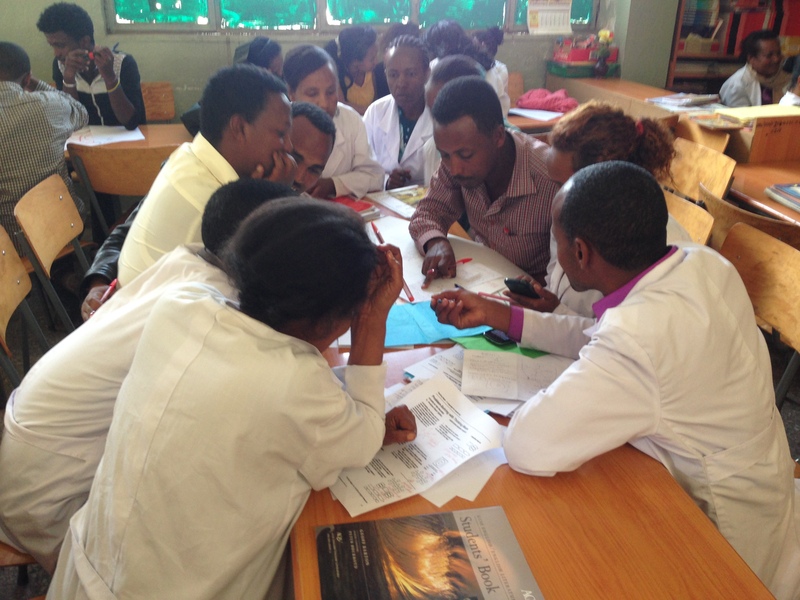 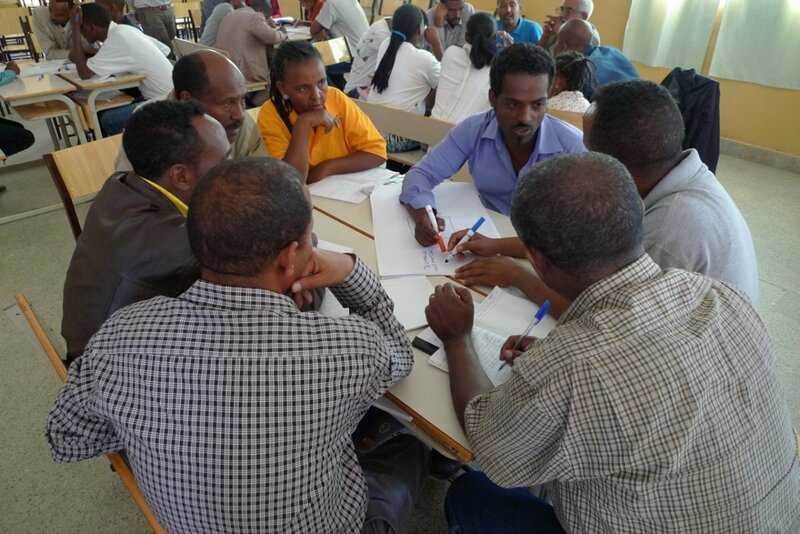 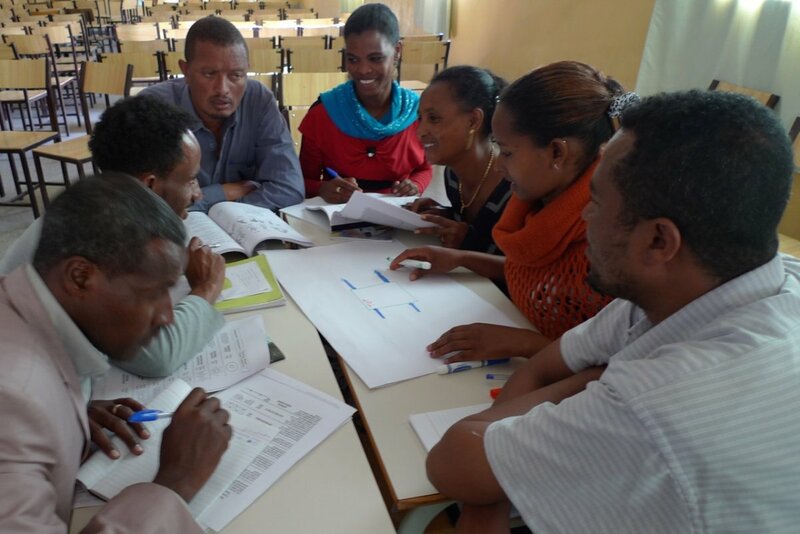 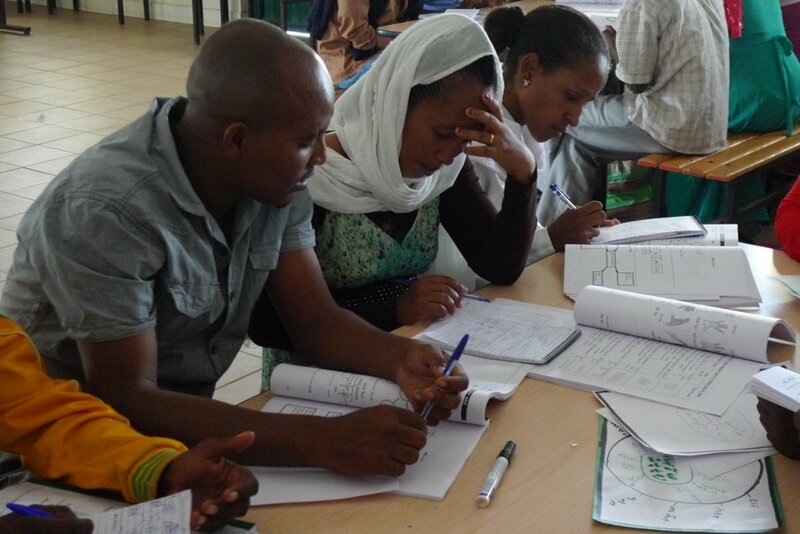 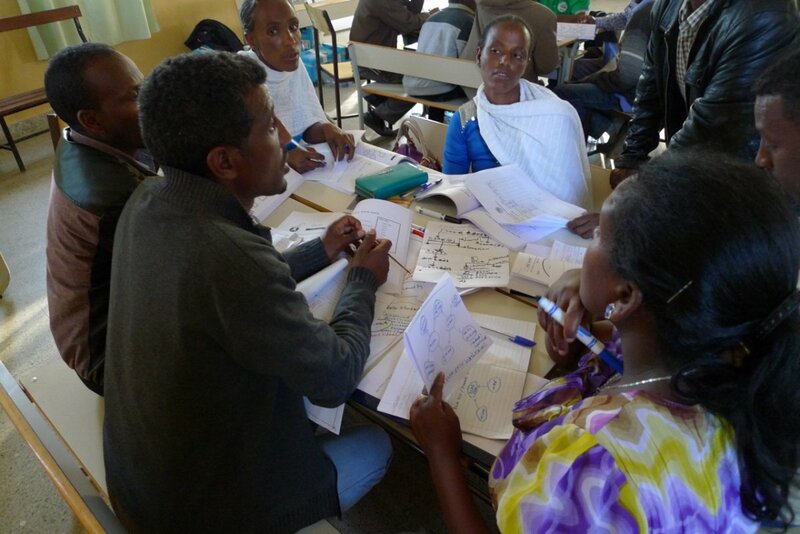 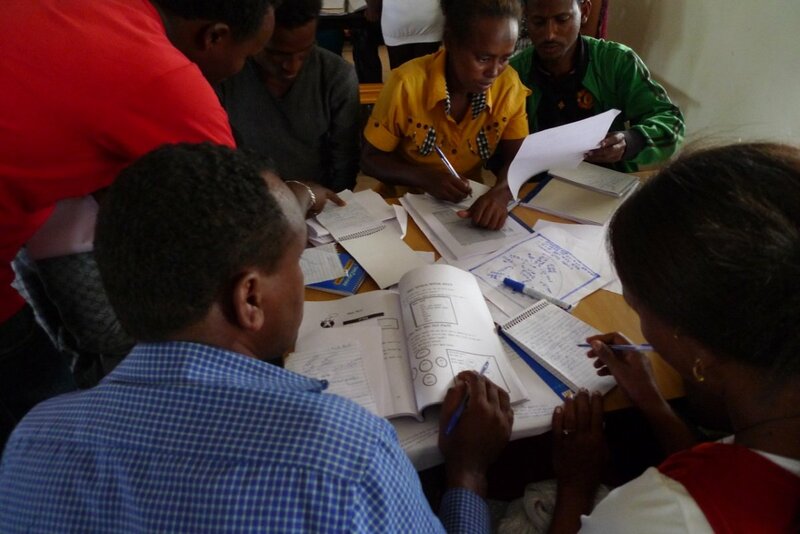 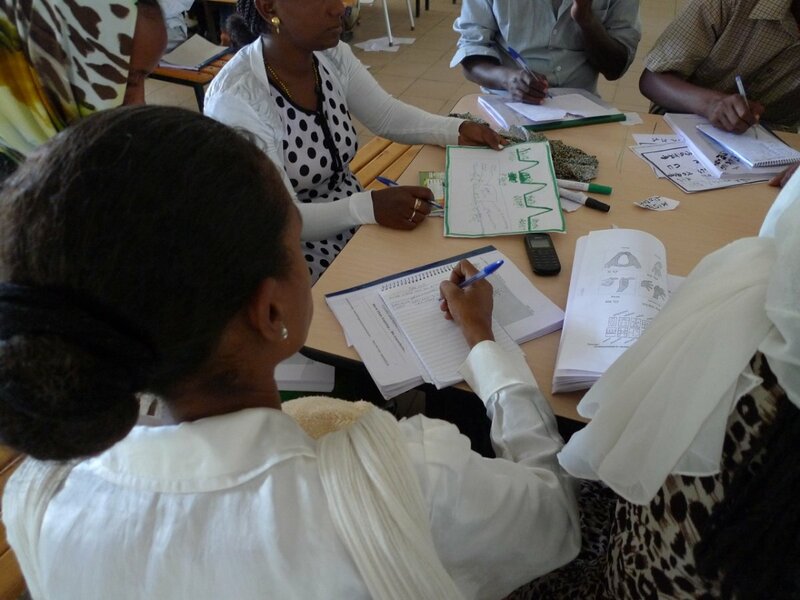 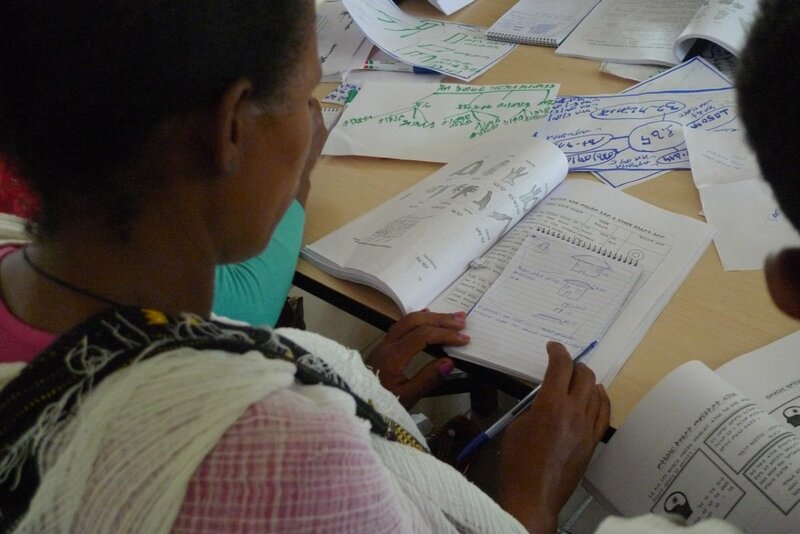 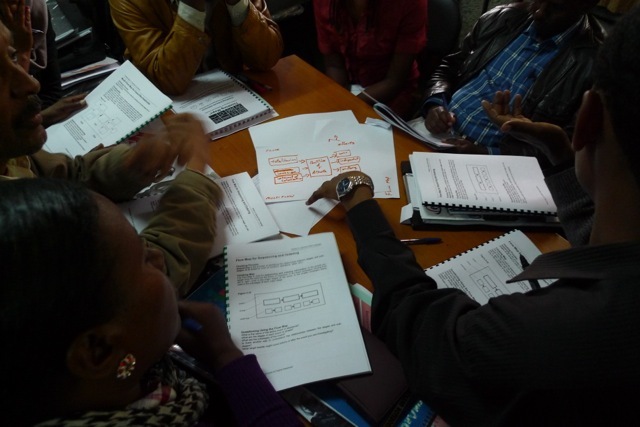 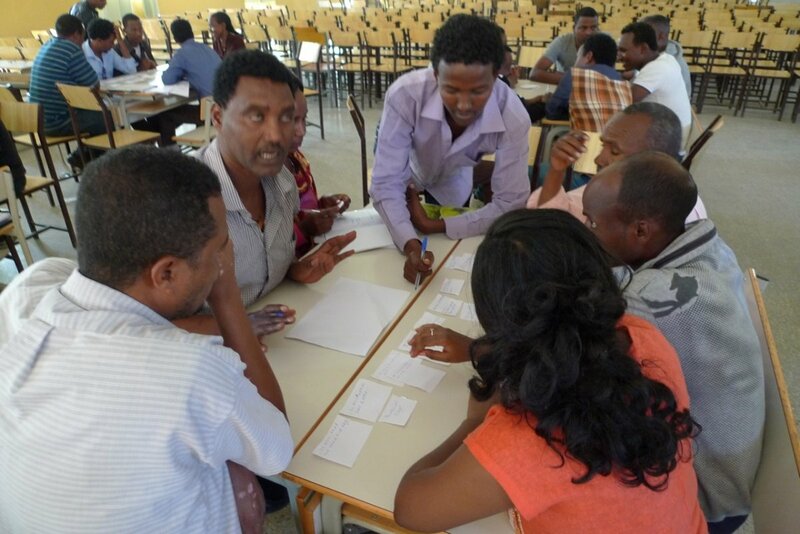 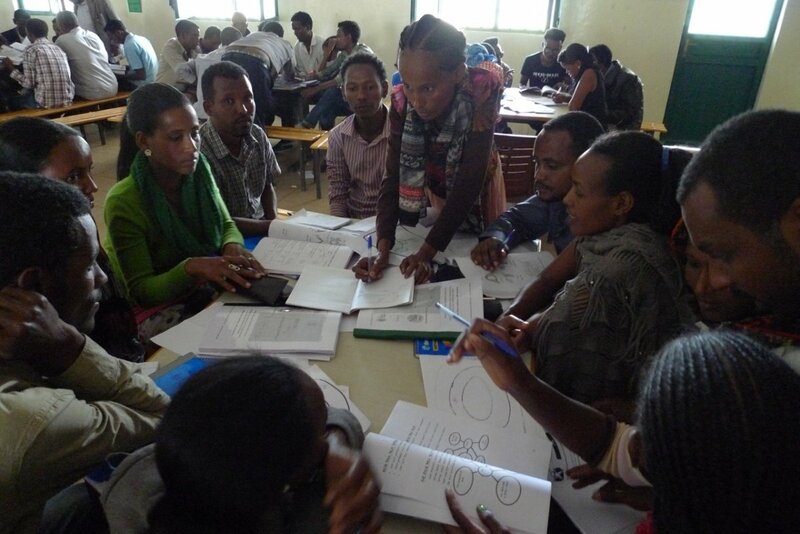 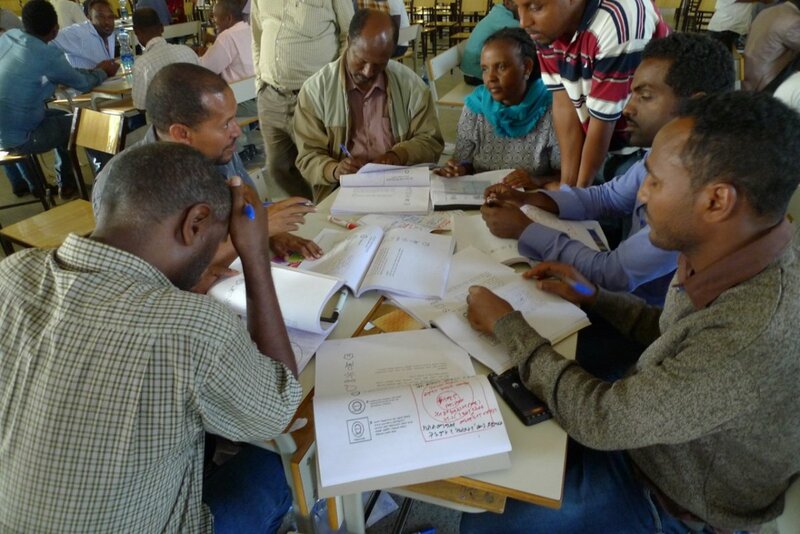 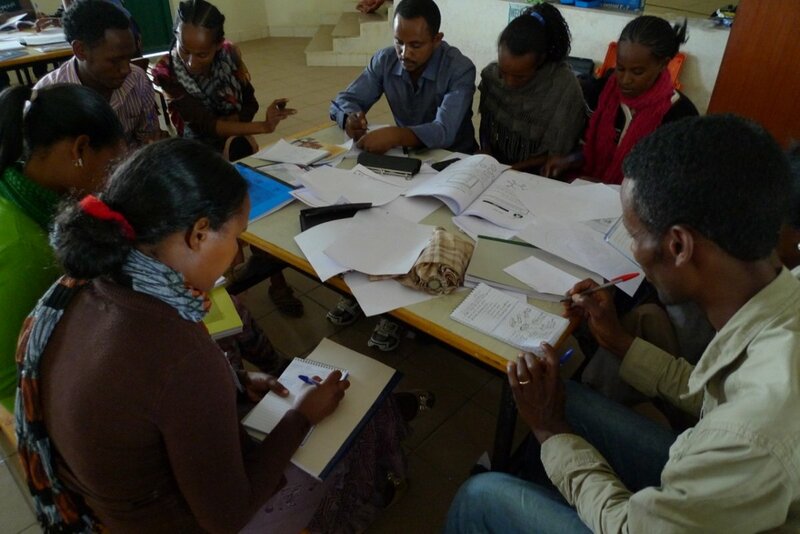 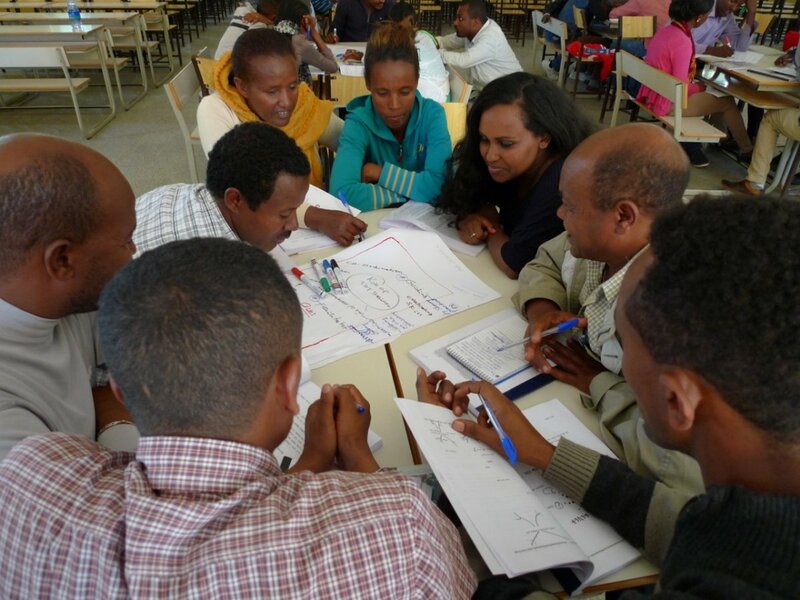 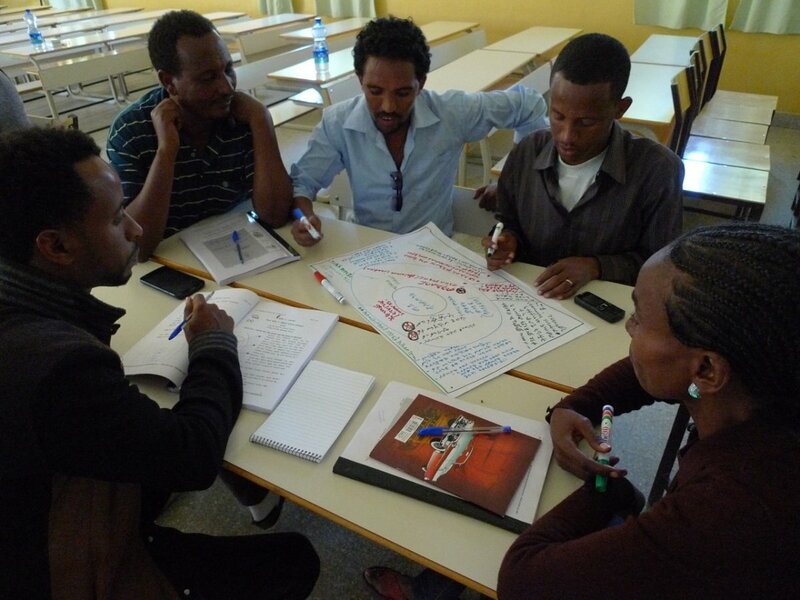 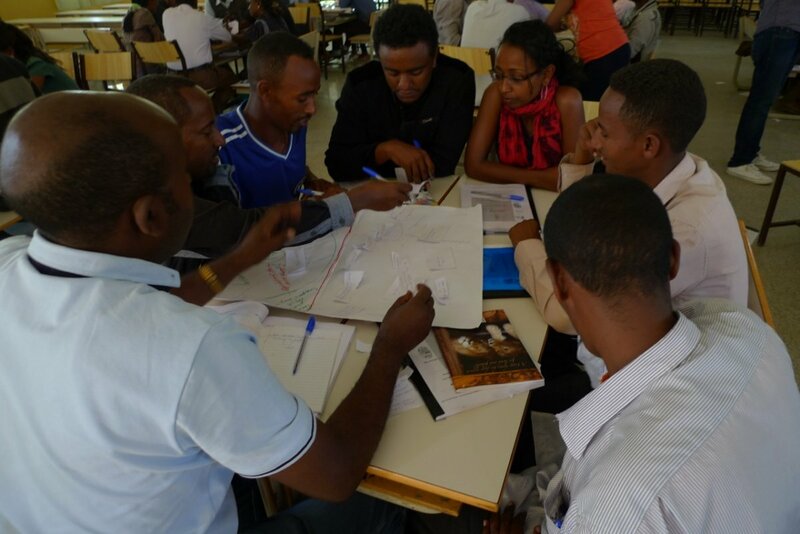 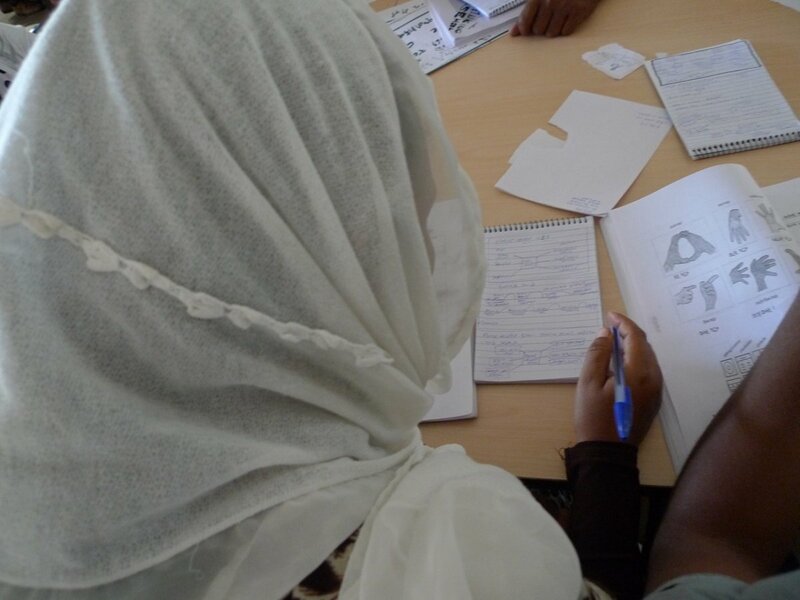 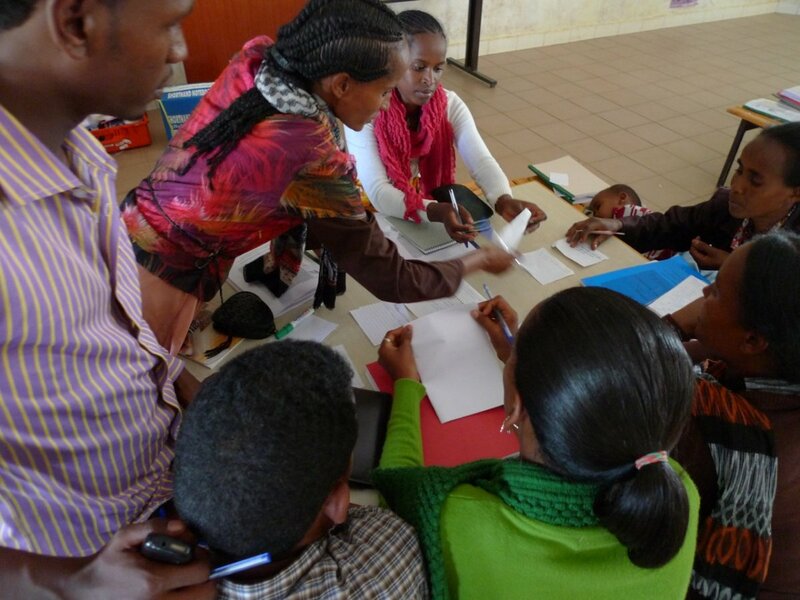 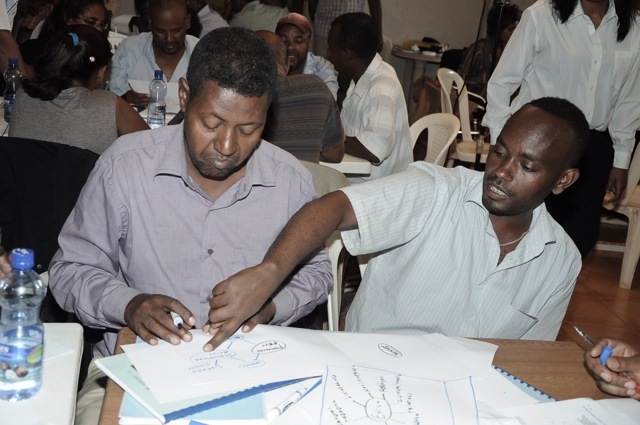 There are 35 teachers teaching in the school of whom 14 were trained in Thinking Schools Ethiopia methodologies with a focus on Thinking Maps. 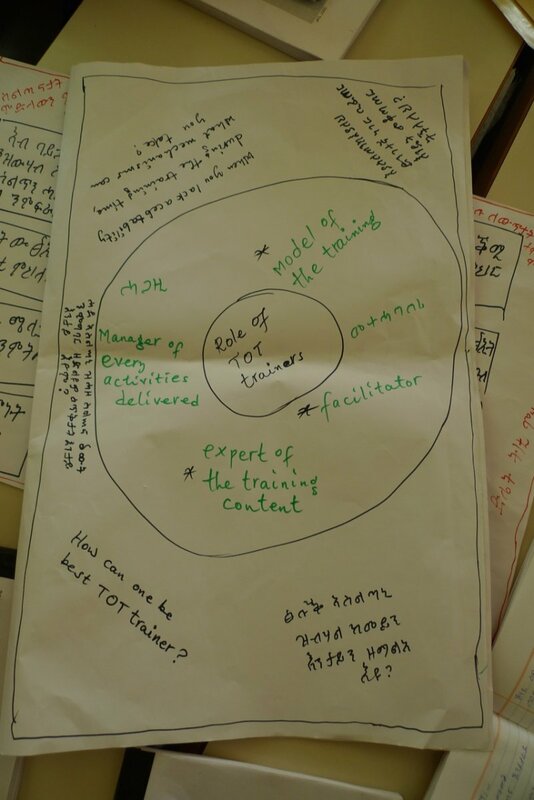 There is a ToT trainer from the school. 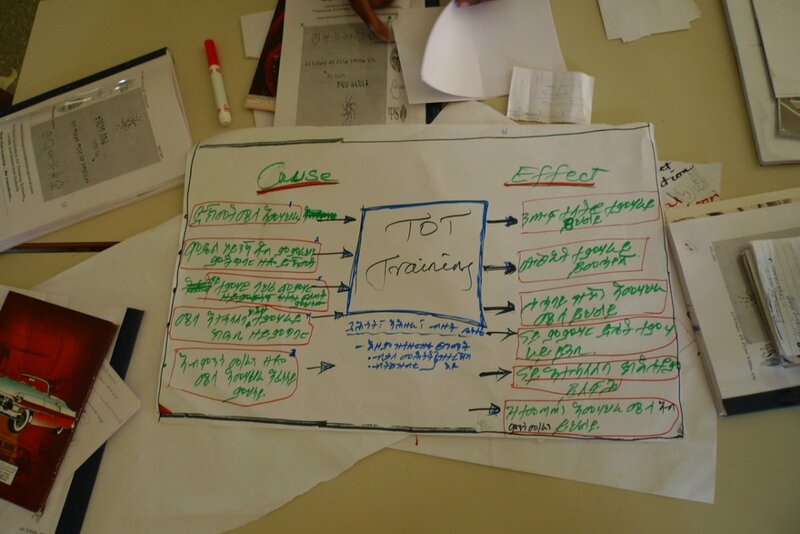 The ToT trainer in this case is a teacher himself. 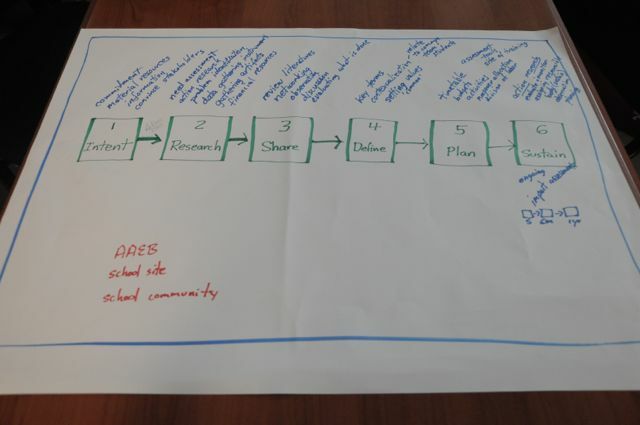 We had a meeting with the schools deputy director in which we explained why we were at the school, sharing the flow map (sequence map) of what the day is going to look like. 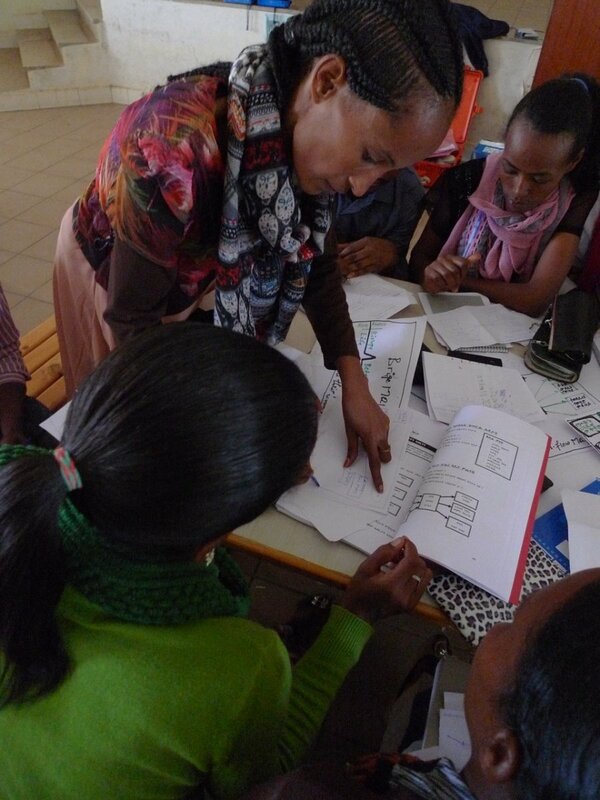 We did mini Professional Development training with the teachers. 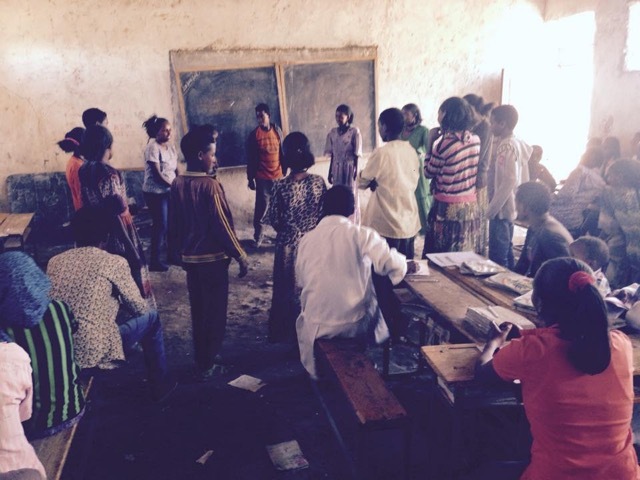 Then class room demonstration of lesson . 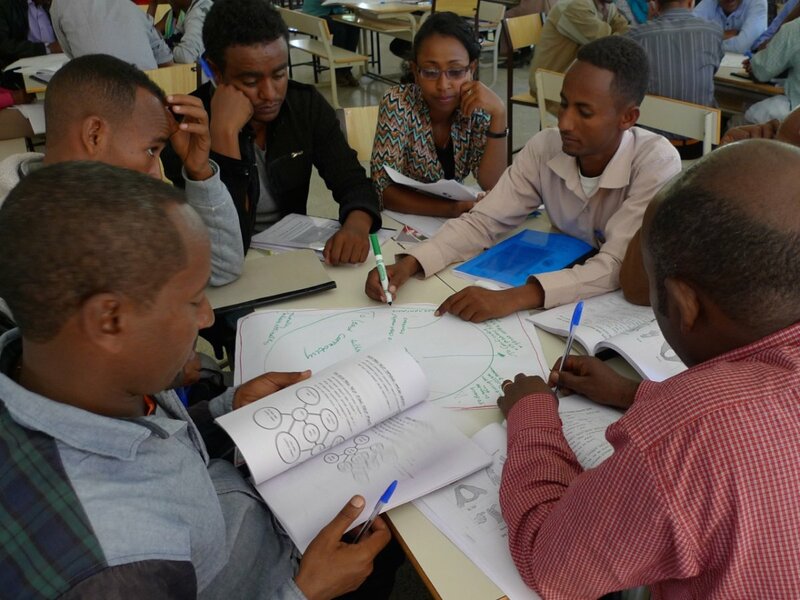 The class room demonstration followed the pattern: community building, modeling use of circle map, then modeling use of multi-flow map, intermittently having students work in pairs then in groups and while group discussion and finally giving students home work. 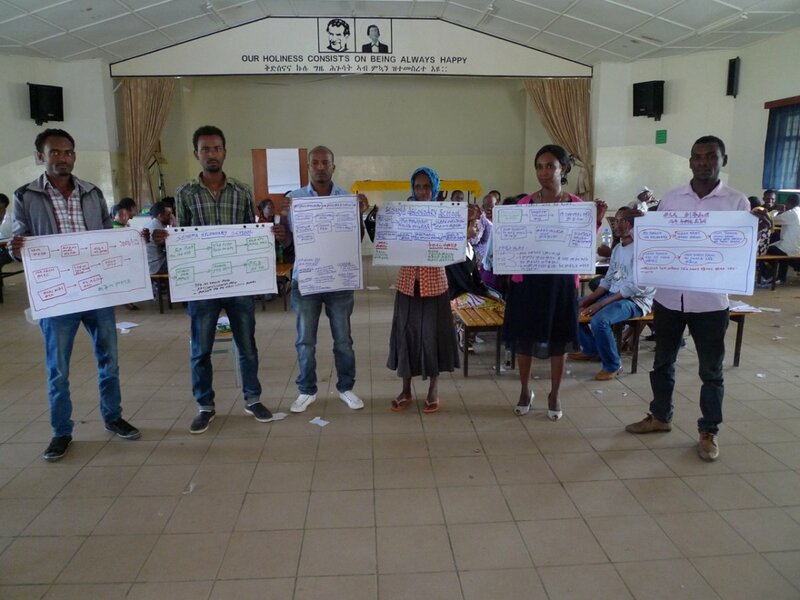 In the end Atsede introduced the students to all 8 maps, their hand symbols and the cognitive processes they represent modeling for teachers including how they could introduce their students all the eight maps. 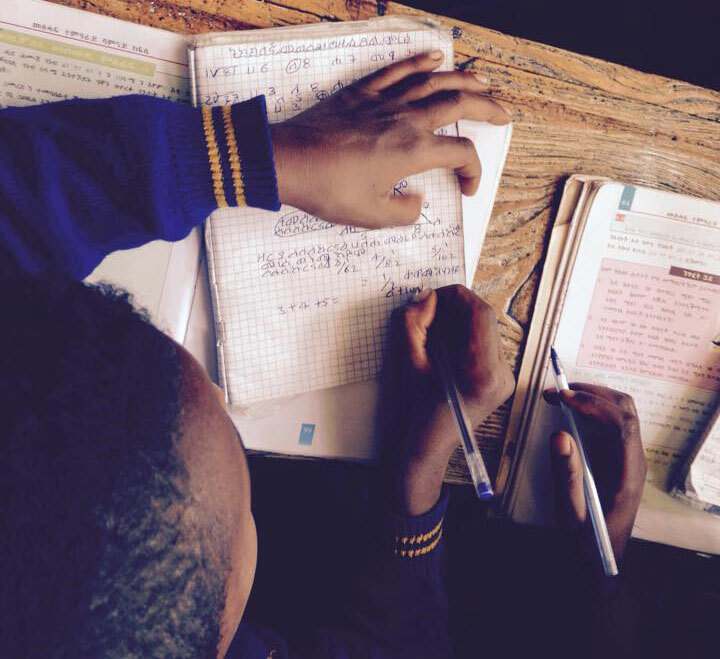 One challenge we have seen of teachers relates to what data with respect to outcomes are we in the demonstration lesson class to attend to, observe and reflect on? 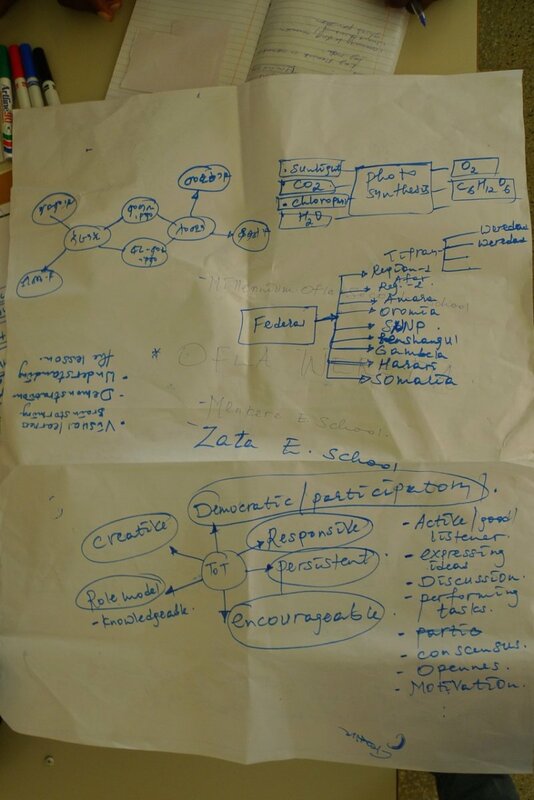 The outcomes of use of thinking maps are directly accessible to the observer, we believe, if the observer knows what to look for. 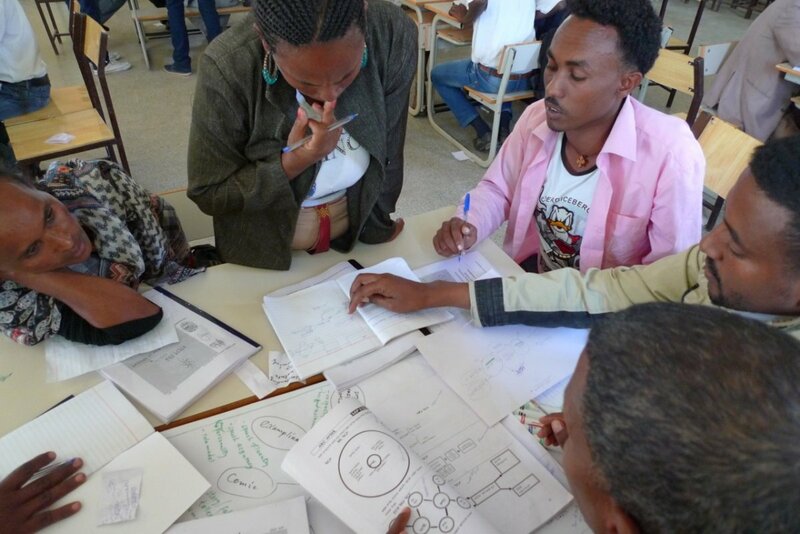 Students generate information, surface their thoughts, clarify and exemplify then in the frame of references, explain how they are seeing the content they are interacting with… The fact of students engaging with a content not easily seen by most teachers in demo-lessons. 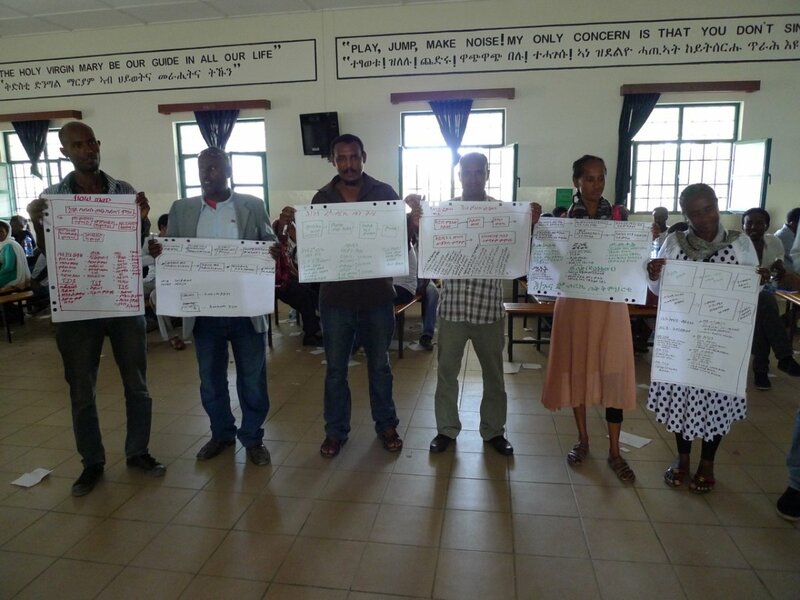 We do community building exercises and teachers feel relaxed, attain more energies for attending to discussions, energies for participation in the form of sharing thoughts but this often not thought as being explained in terms of the community exercises we do. 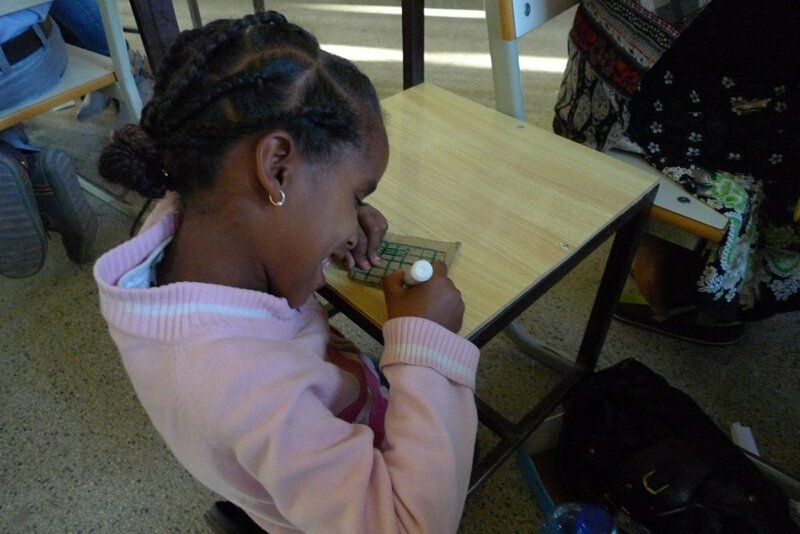 We believe this is extremely important for physically supporting the learning brain. 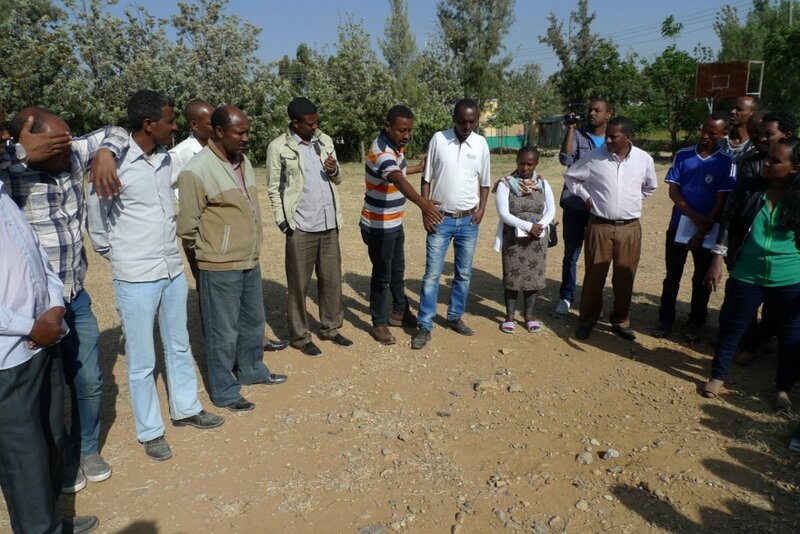 So we will consolidate upon observations about the values of community building exercises. 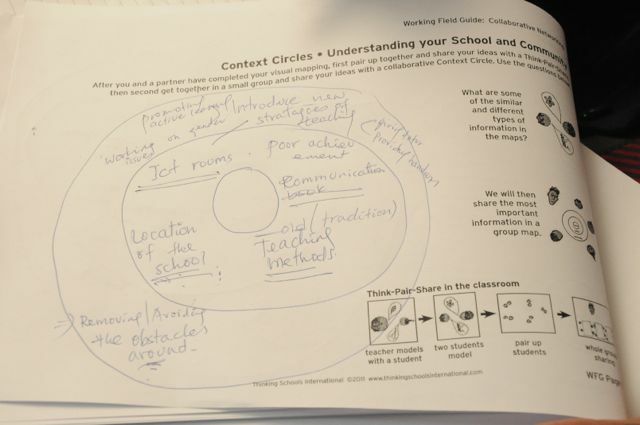 Emphasis on modeling the use of frames of references we believe will support adequate understanding of thinking maps and how they are used in upcoming site visits. 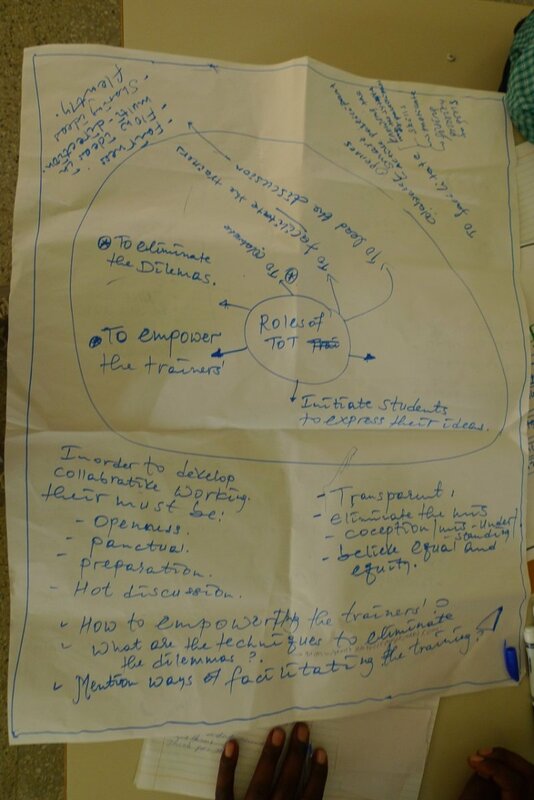 A fundamental challenge we believe still exists with regard to what to look for as outcomes of the intervention include the presumptive certainty, as part of the mental models of most teachers, I observed that an intervention (thinking schools model) should address and bring about the desired changes with respect to intelligences, competencies, skills and attitudes of a learner in all academic disciplines here and now. 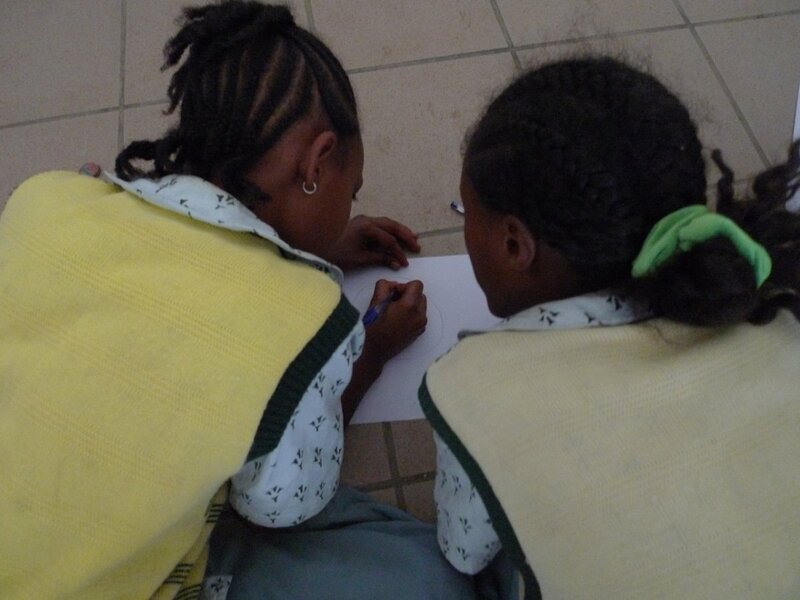 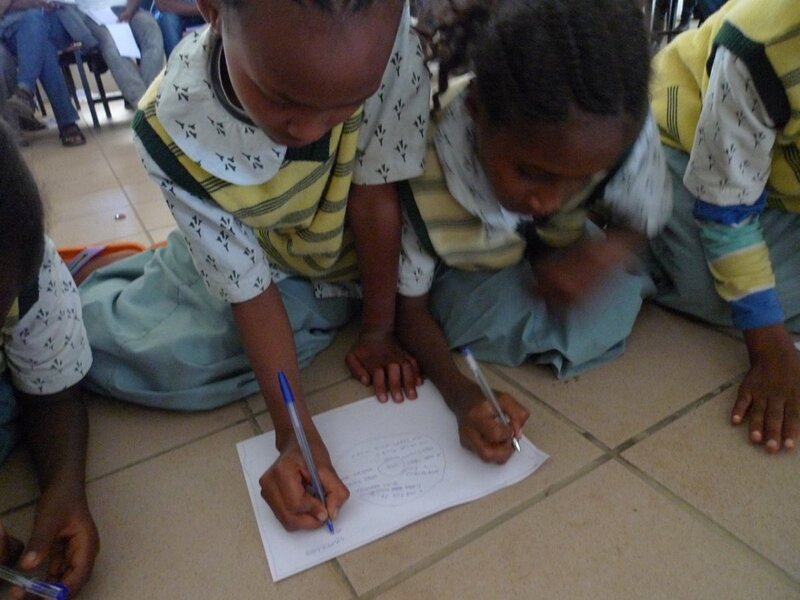 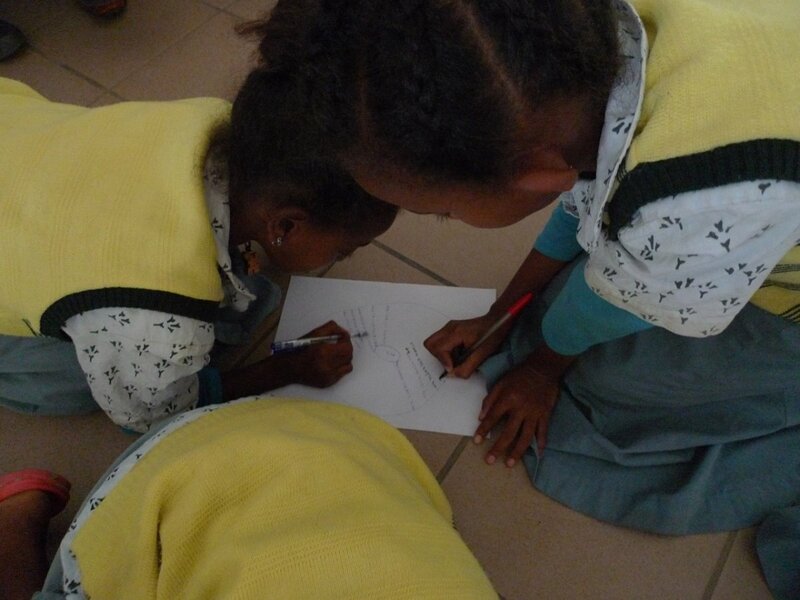 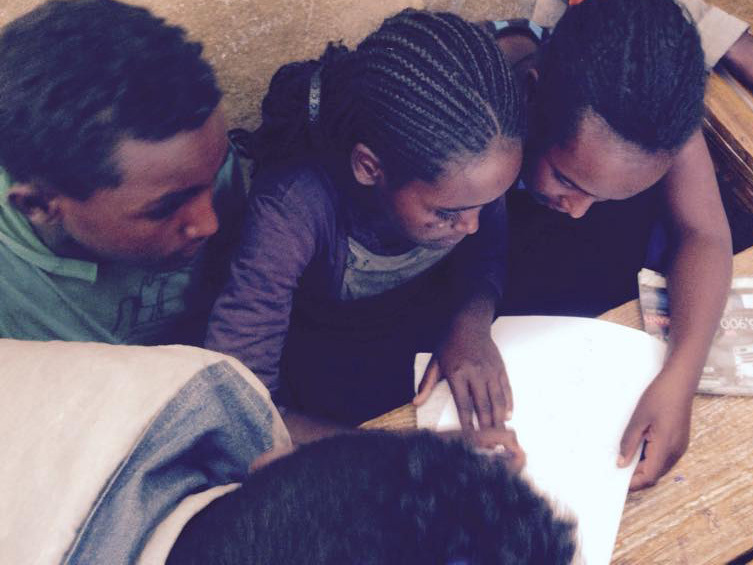 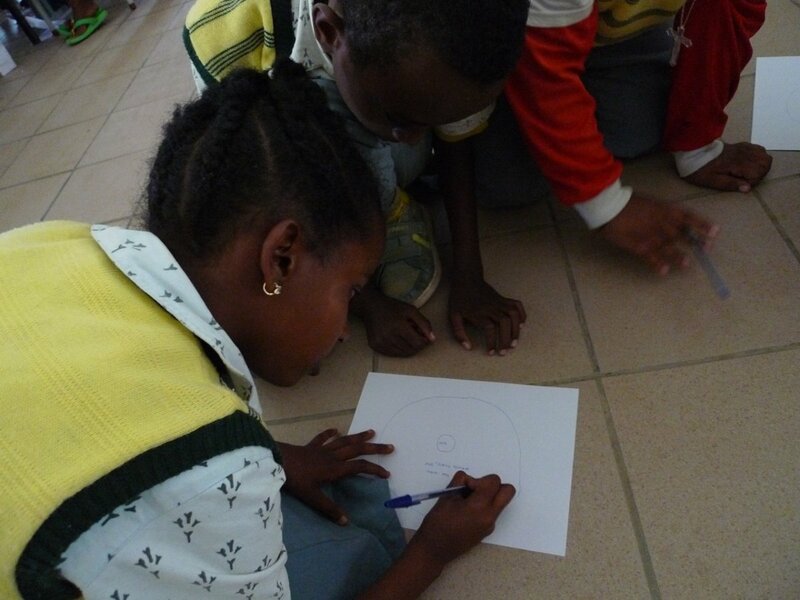 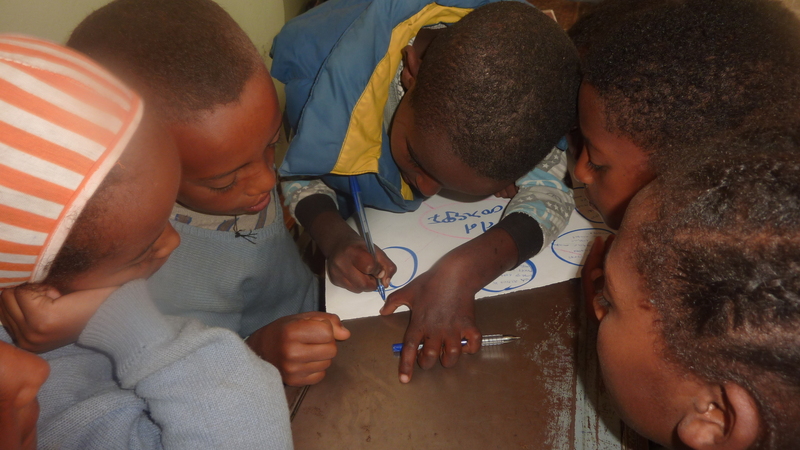 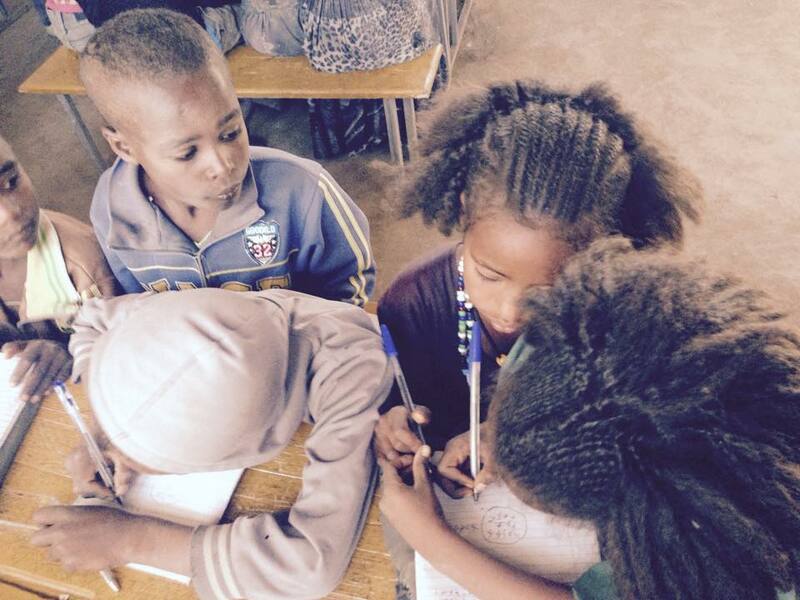 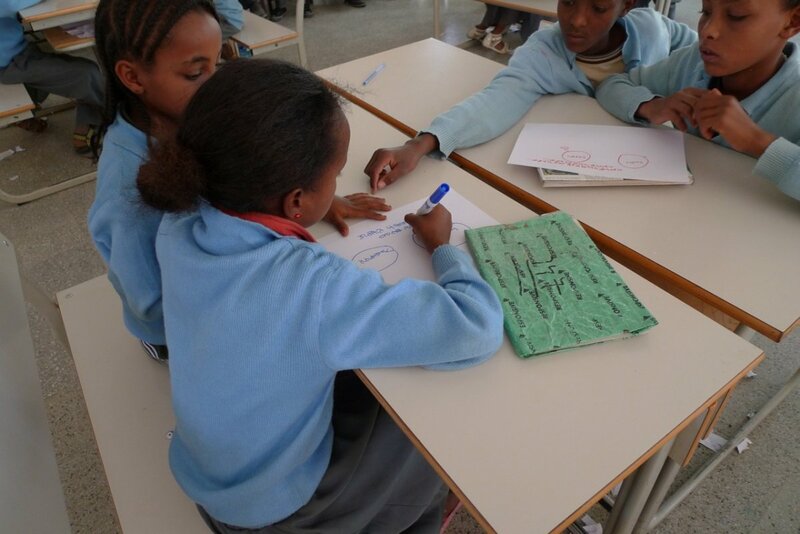 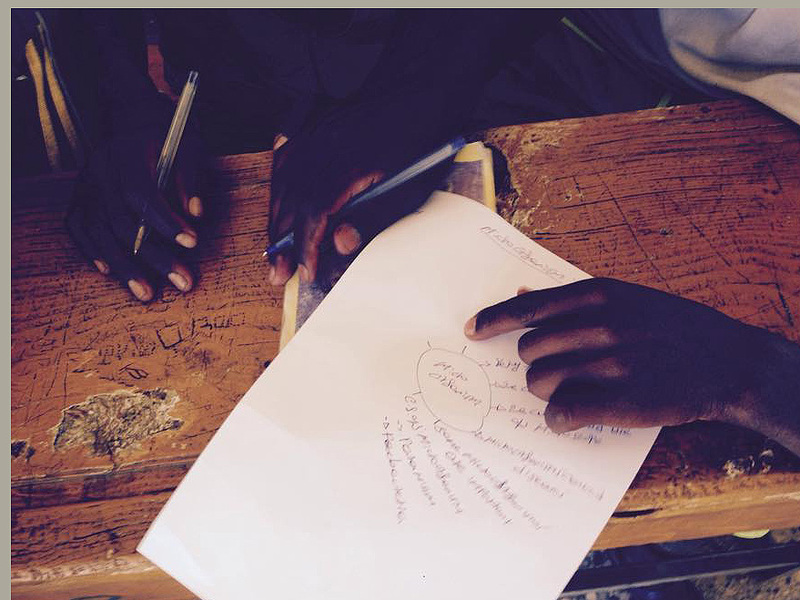 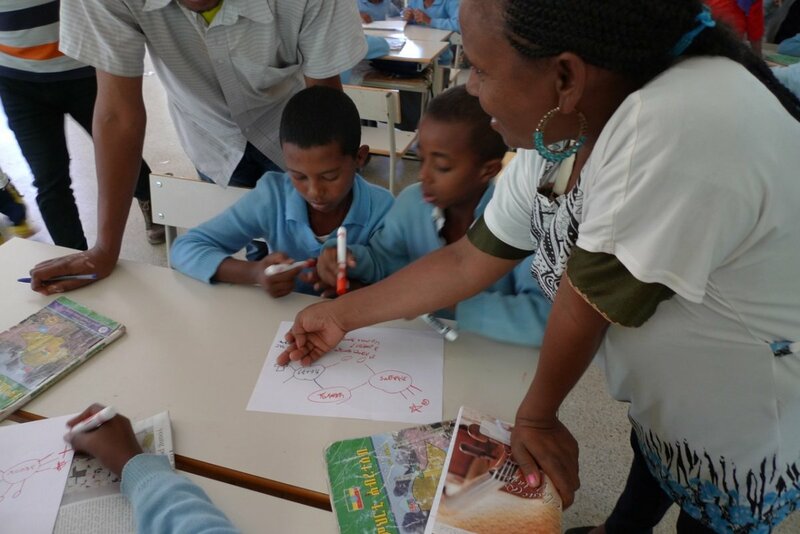 Students using a Bridge Map for showing relationships as part of a classroom lesson at Almaz Alemu Elementary School. 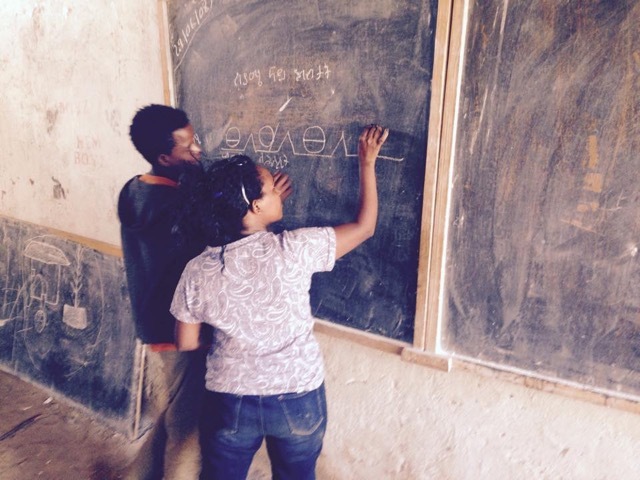 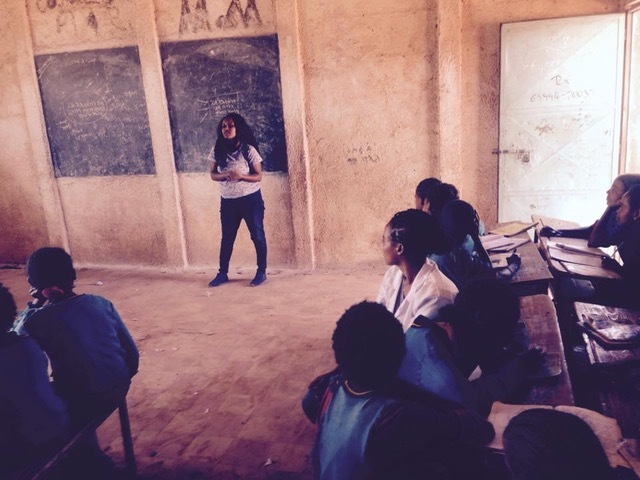 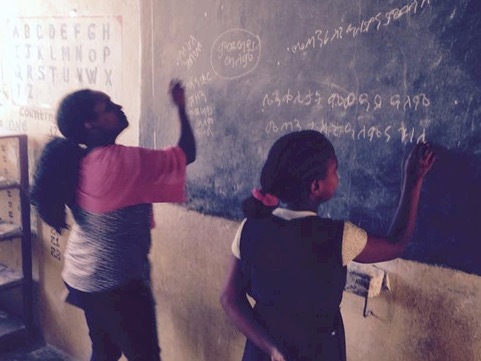 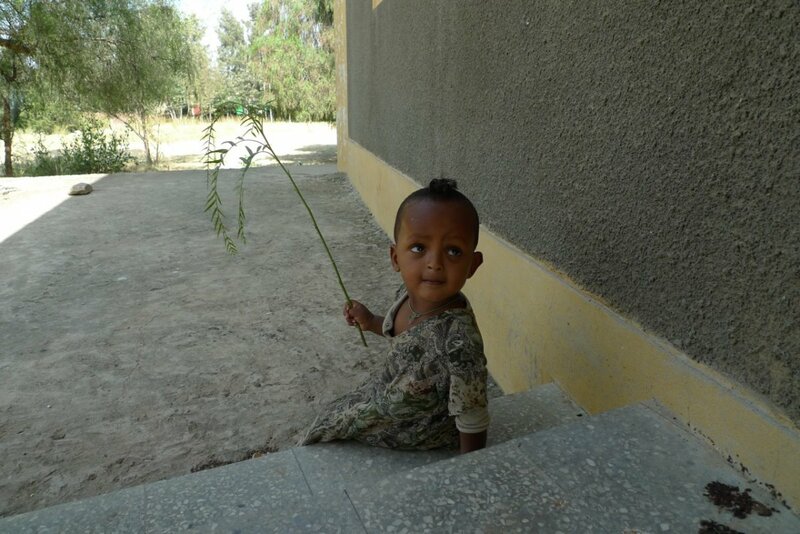 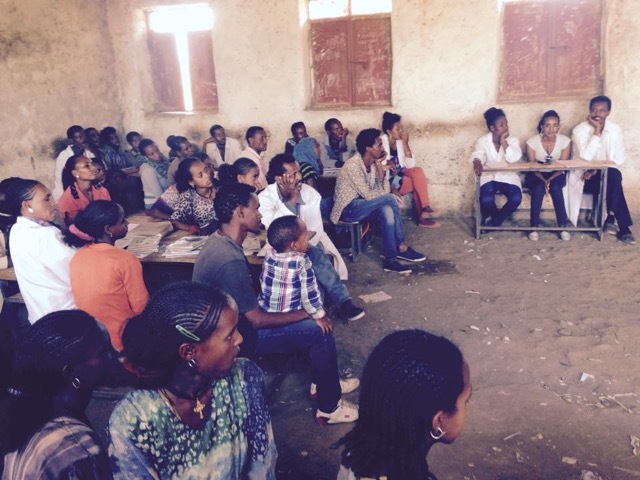 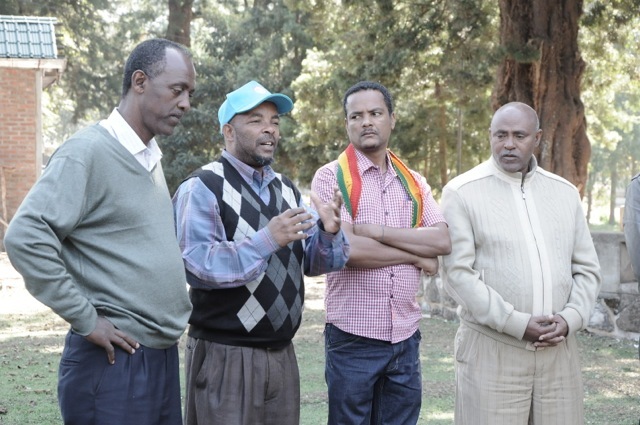 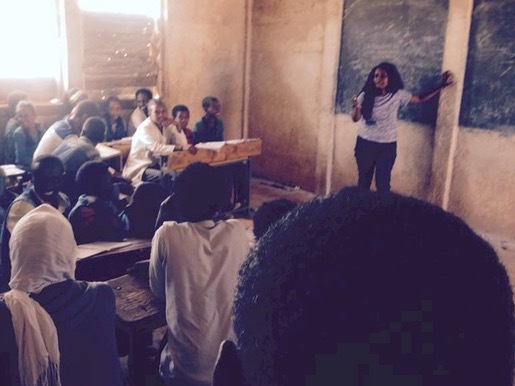 One of site visits in Maychew was paid to a school called Almaz Alemu (after a heroine in Tigrayan People’s Liberation Front’s (TPLF) fight against the Derg regime). 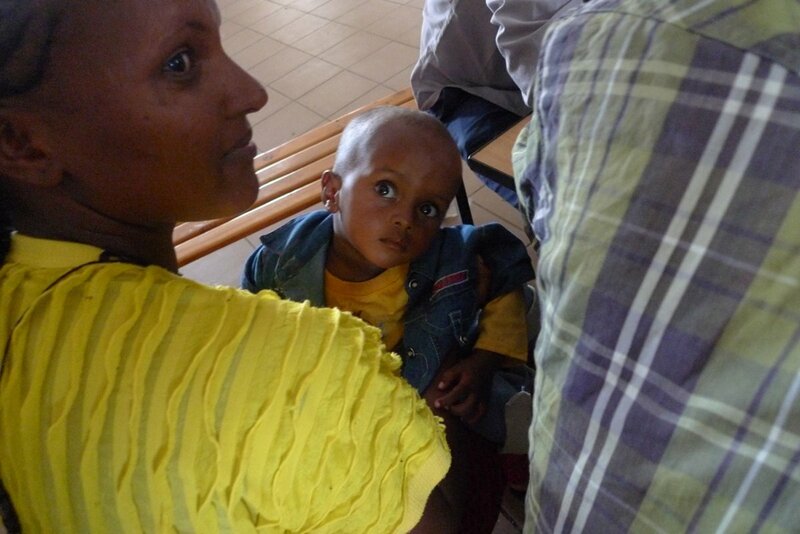 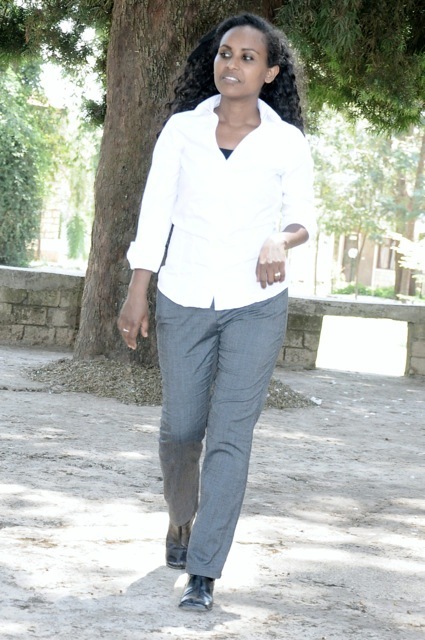 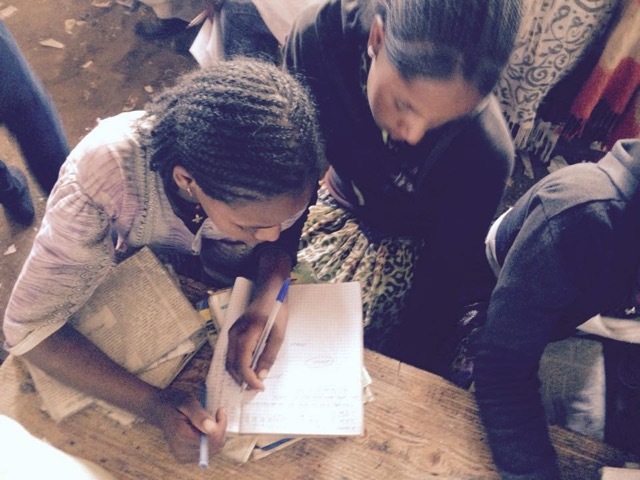 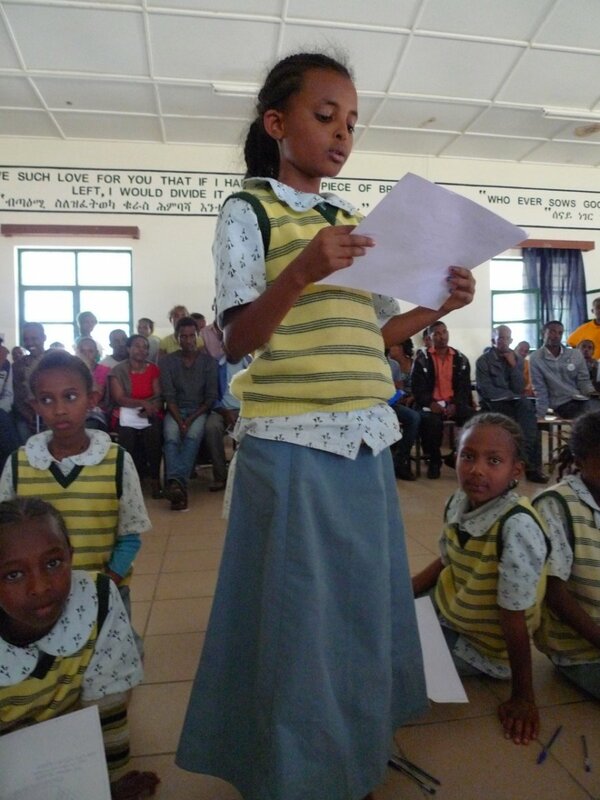 The school is presently led by a young woman named Atsede. 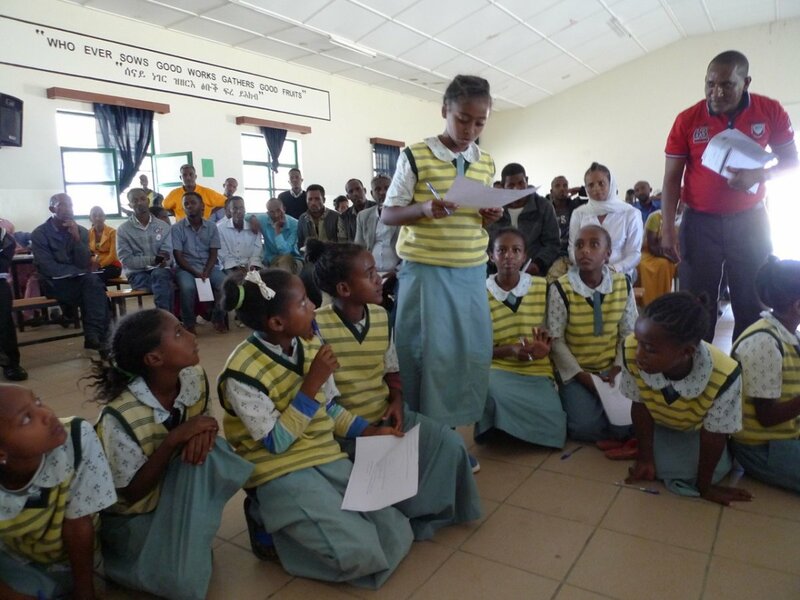 We have seen girls parliament at the school . 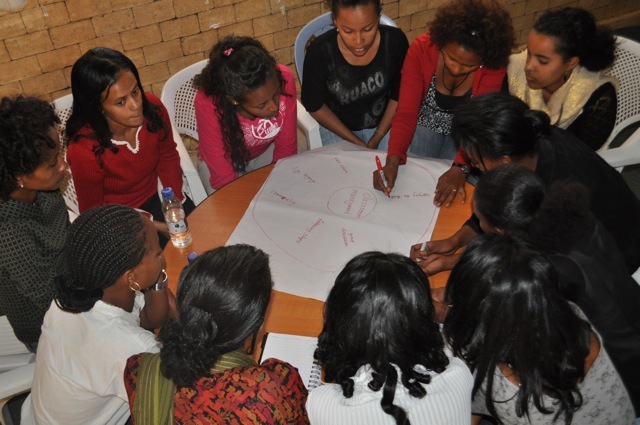 The parliament works for girls needs, rights, support, and acquiring of leadership skills. 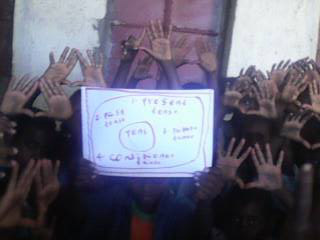 Students and educators showing the hand symbol for a Tree Map which is for categorizing. 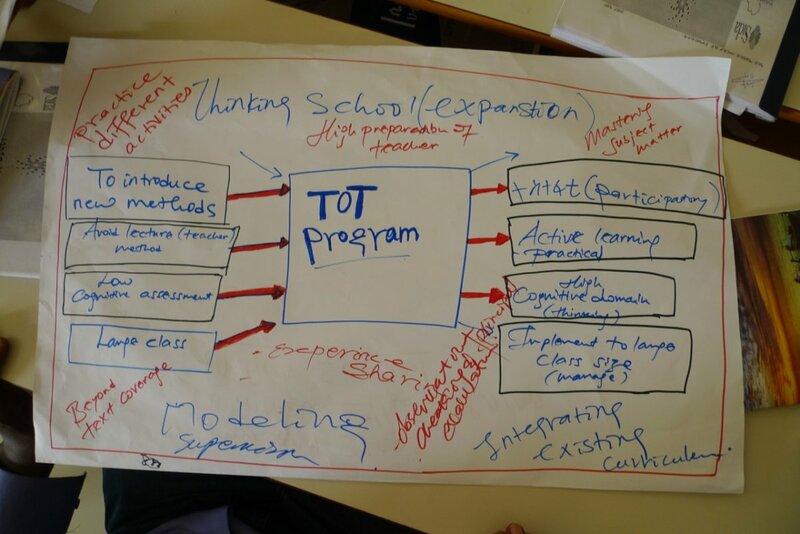 We did a mini professional development in which we reviewed the TSE model, briefly explained the research basis of use of visual tools and did collegial coaching and demonstration lessons . 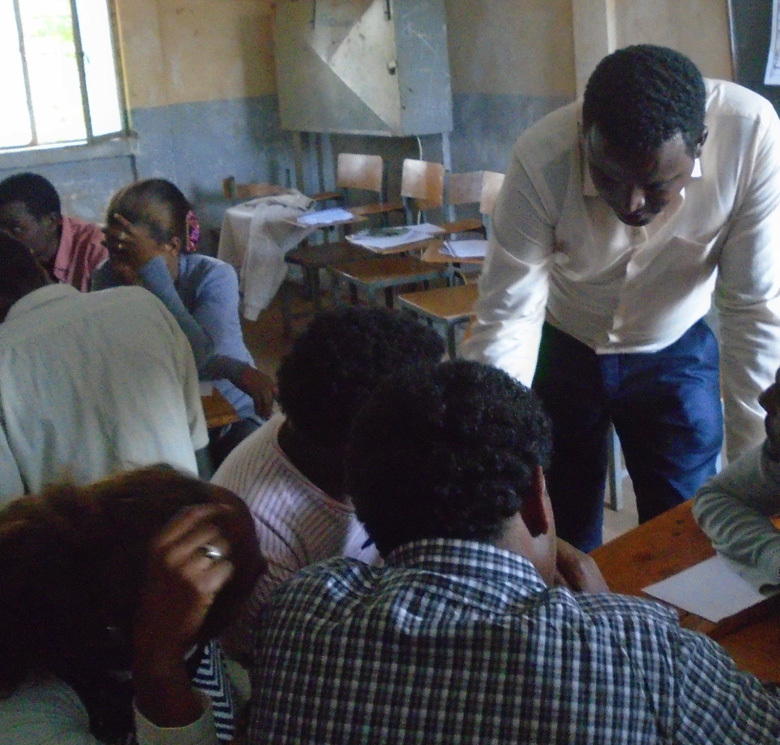 The demo lesson was about electric current and resistance. 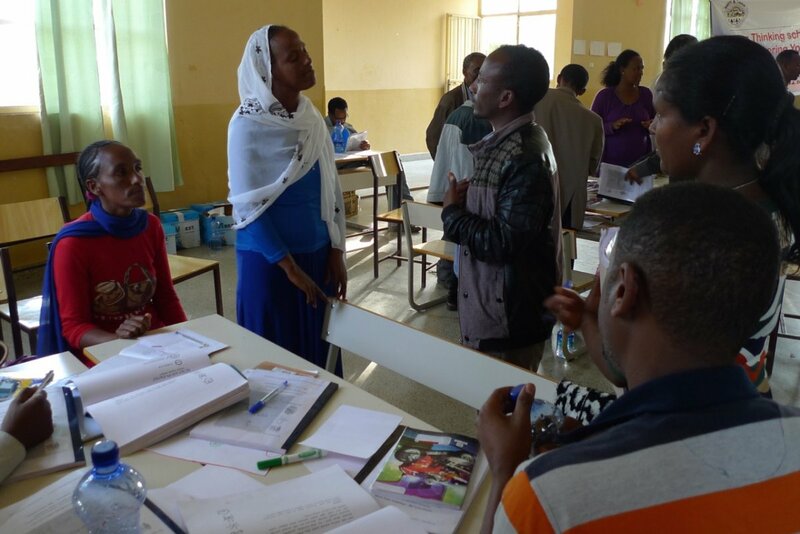 Atsede (a TSE trainer worked with a physics teacher to do the demo lesson). 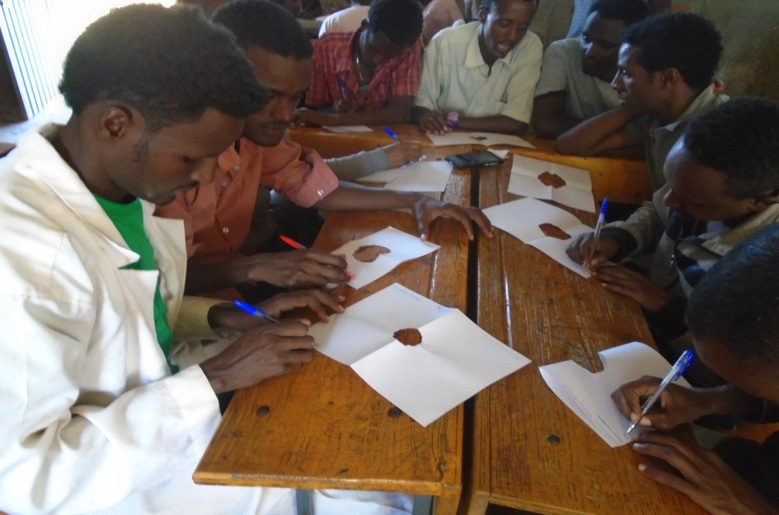 Atsede first modeled the use of circle map with a student to generate a wide range of information about electric current, conductors, and resistance. 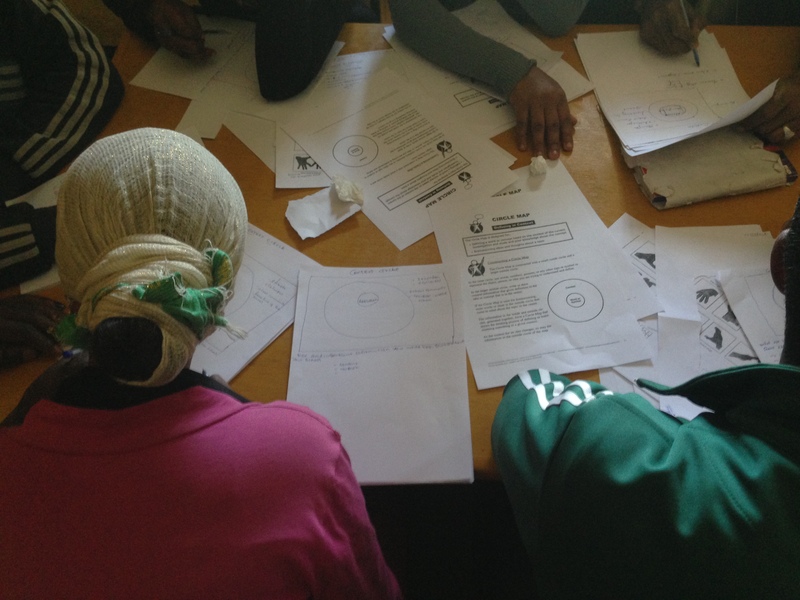 Then asked students to work pairs sharing information and ideas about electricity which was followed by groups sharing about their circle map on the content. 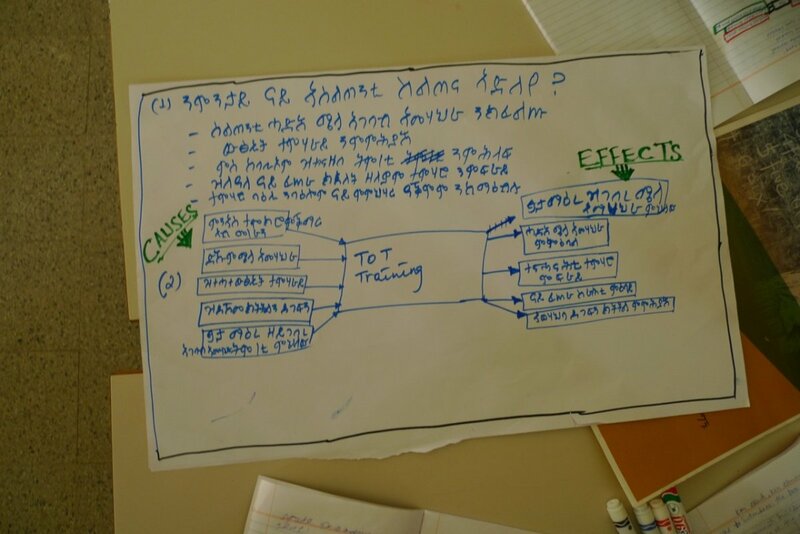 Subsequently Atsede drew a Bridge Map for thinking about relationships with types of circuits and resistance levels. 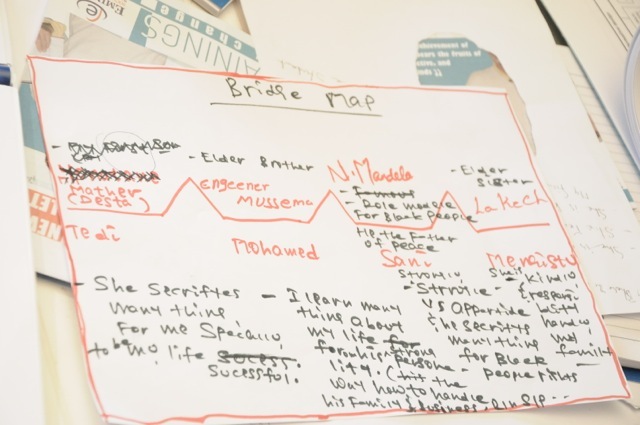 The bridge map was incomplete it was meant to be completed by students. 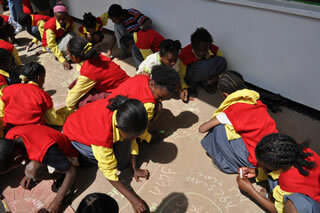 Then students tried completing it by taking turns writing on the black board. 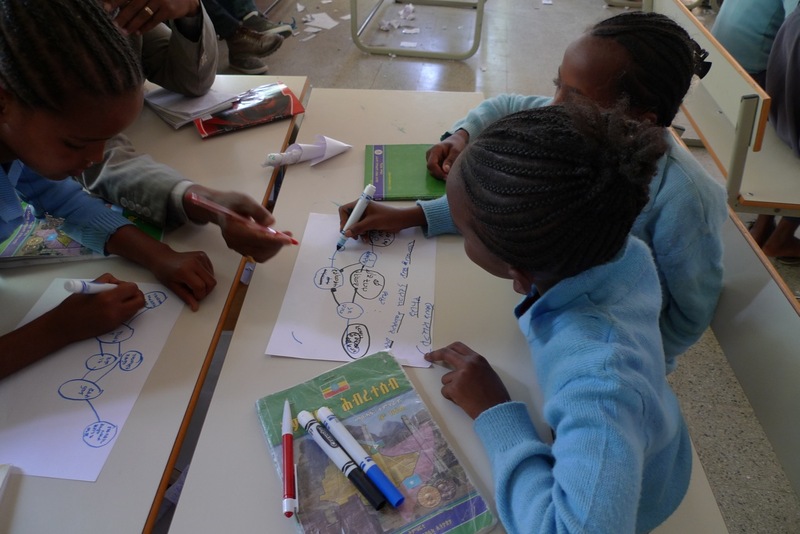 Students were then given assignment to complete the bridge map in their exercise books. 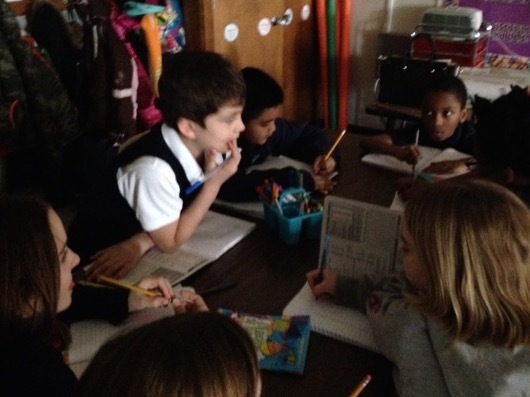 Teachers were observing what was happening taking notes, and writing questions as part of the Collegial Coaching model. 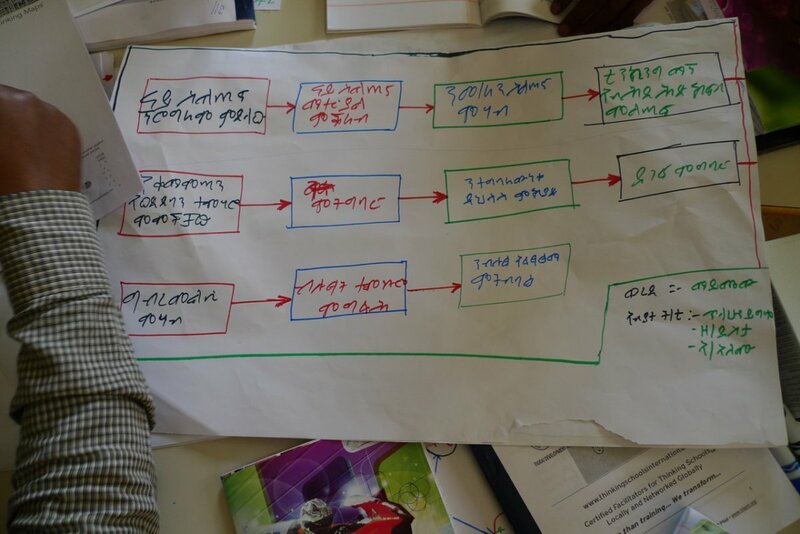 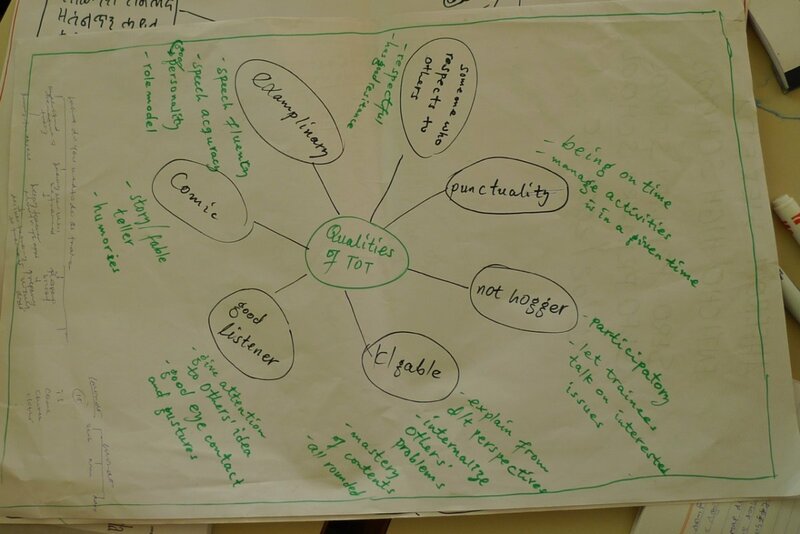 During the debriefing session teachers shared that the demo lesson has shown the potential use of the Thinking Maps for content areas which would otherwise have been seen simply unfit for mapping . 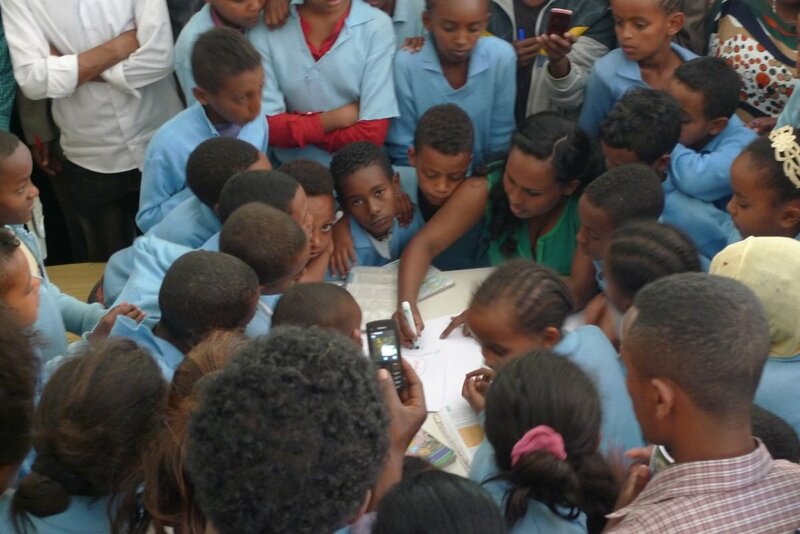 Teachers reported that they are now encouraged to start using the maps in their classes. 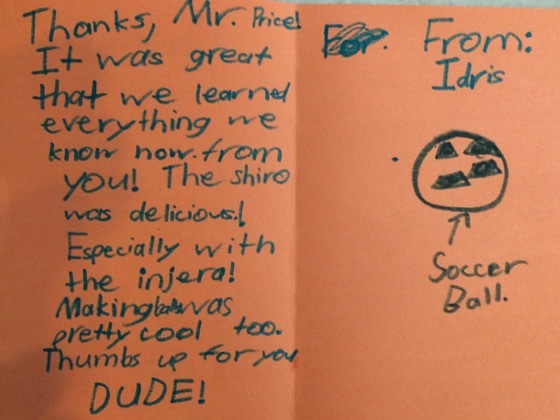 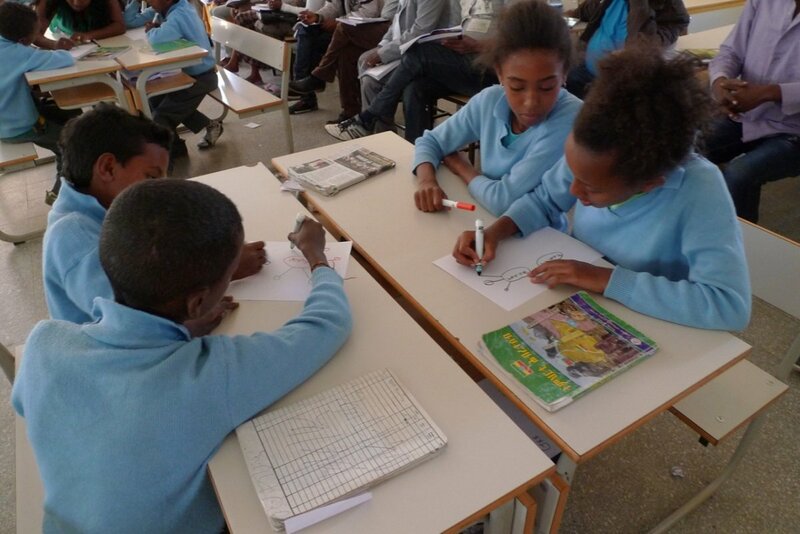 They said they have seen high levels of students engagement, collaboration, motivation to learn, and also recognize that students have much prior knowledge to contribute to learning. 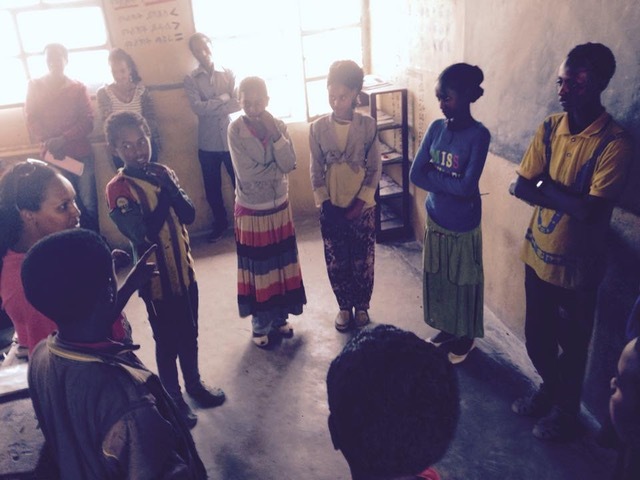 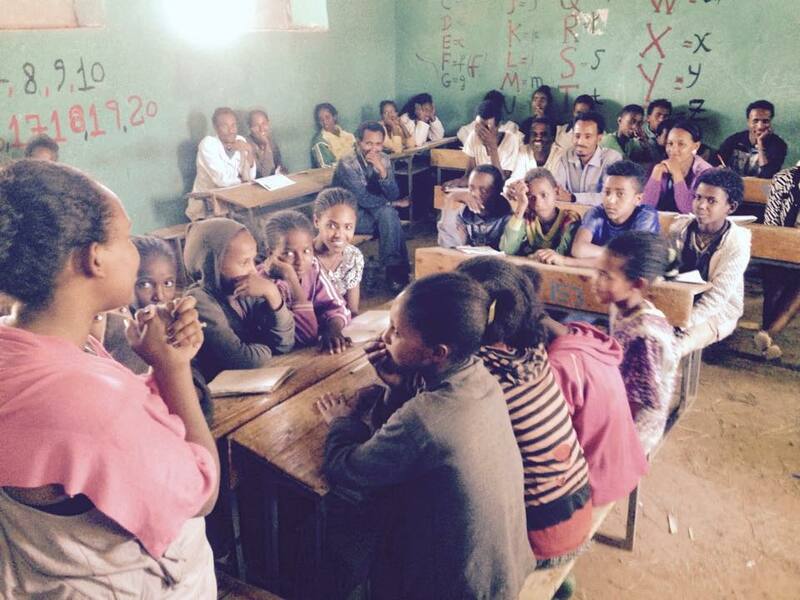 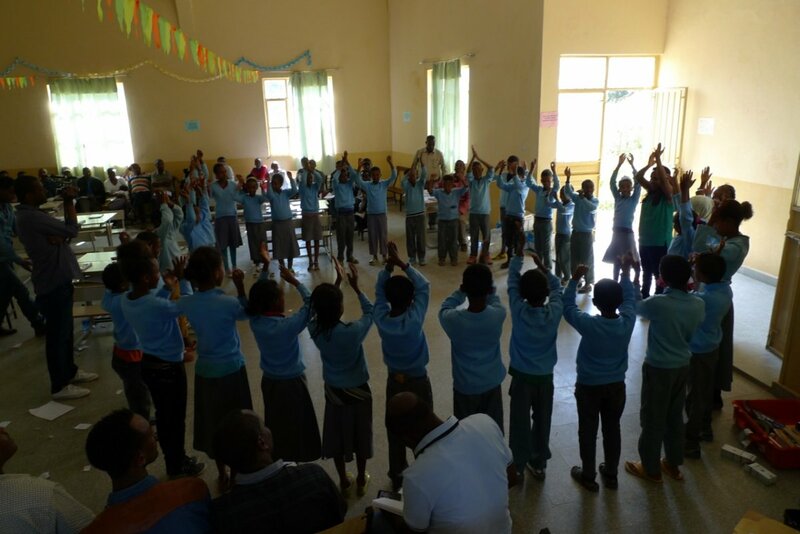 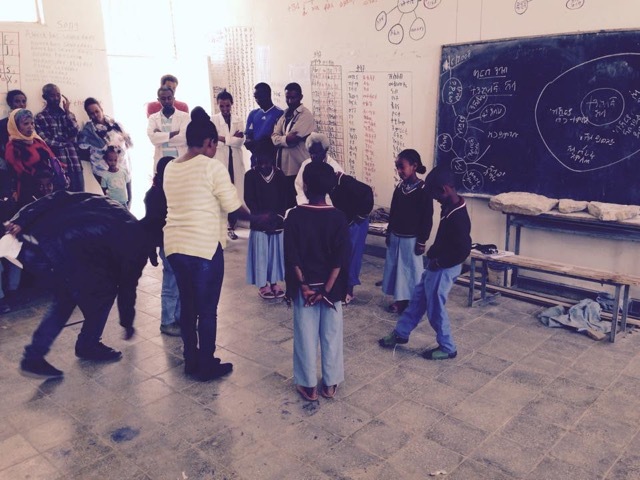 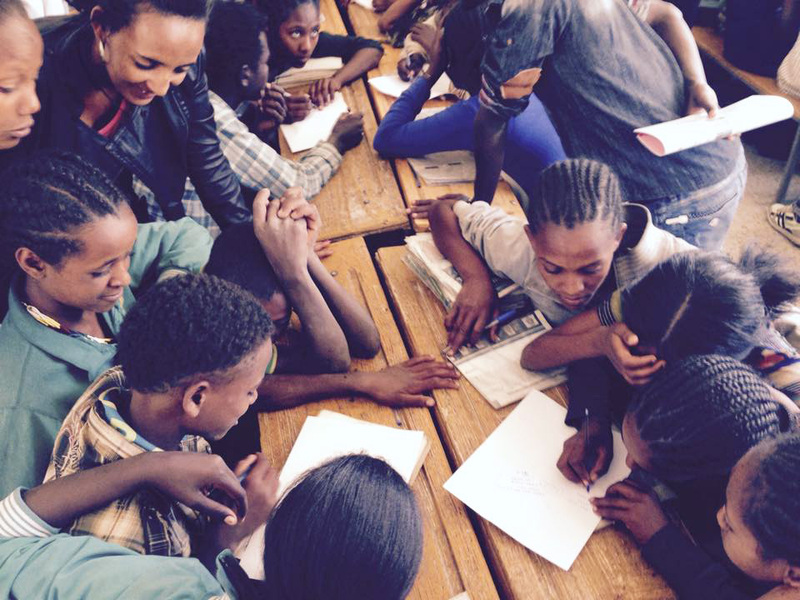 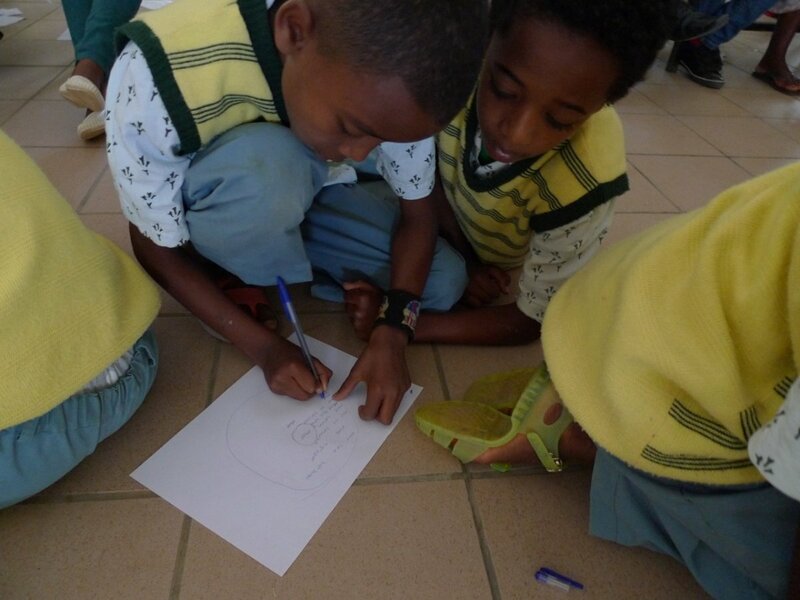 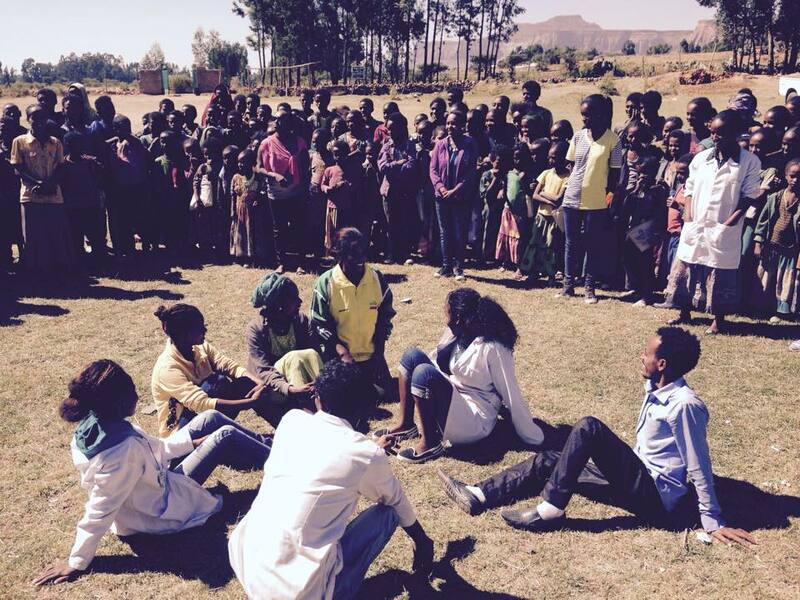 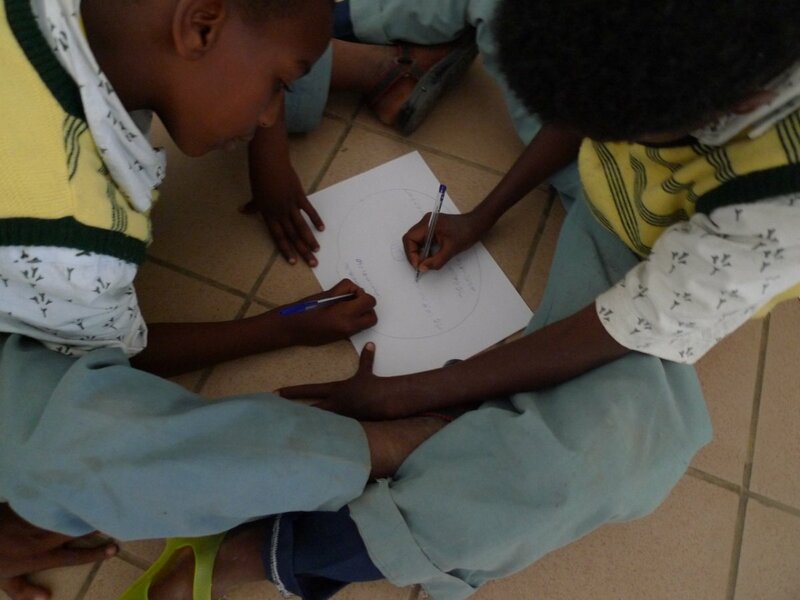 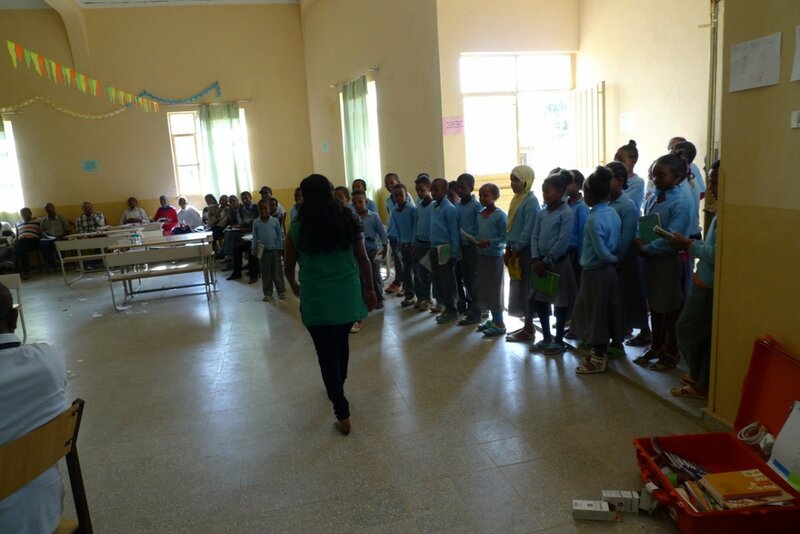 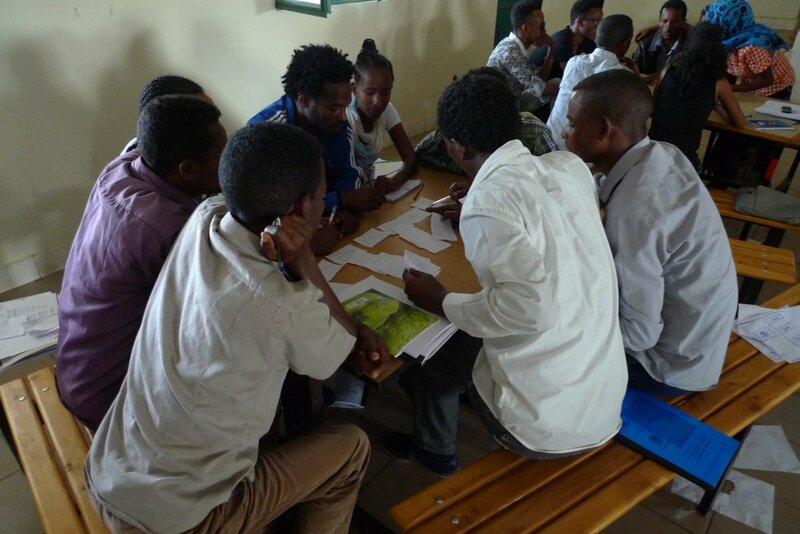 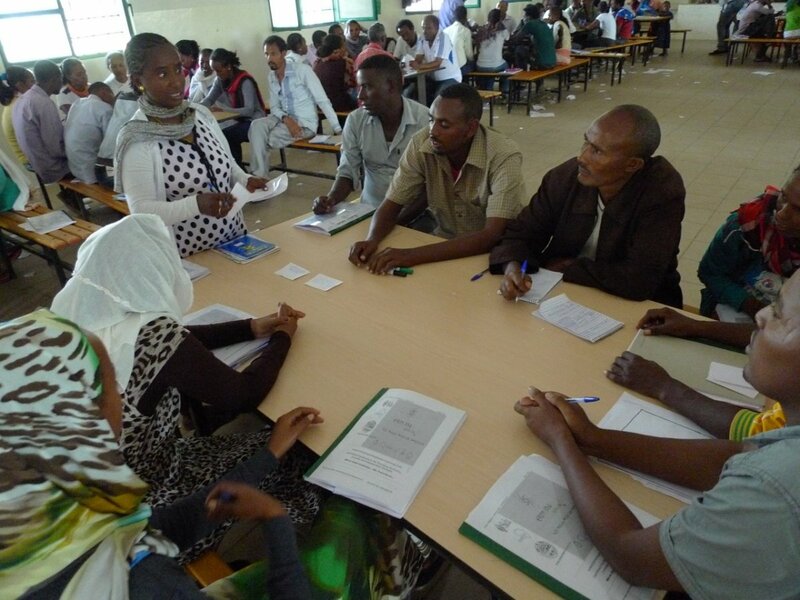 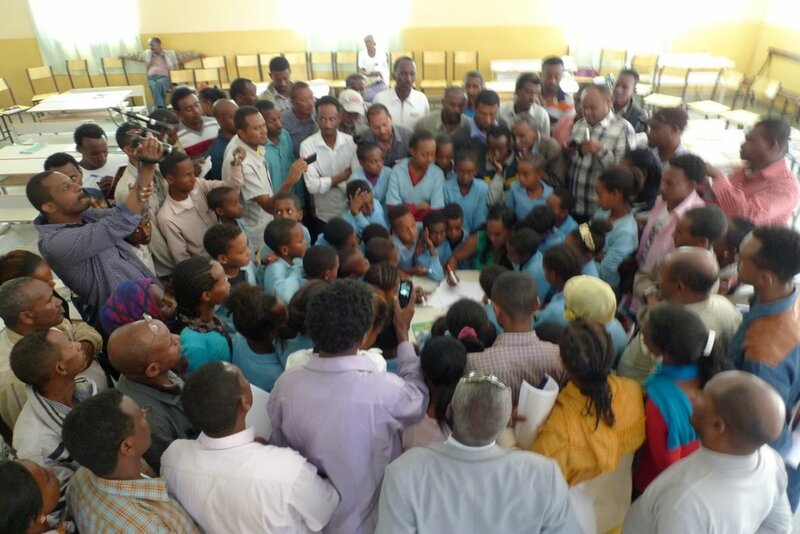 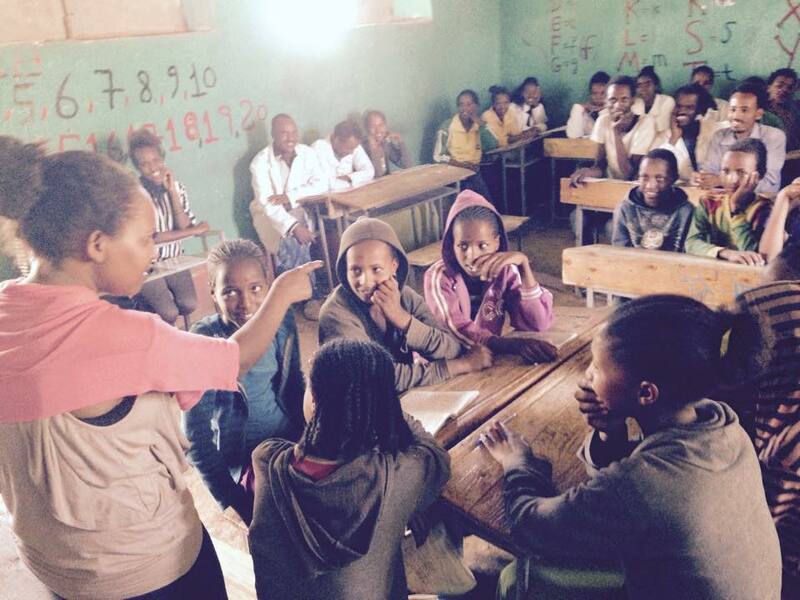 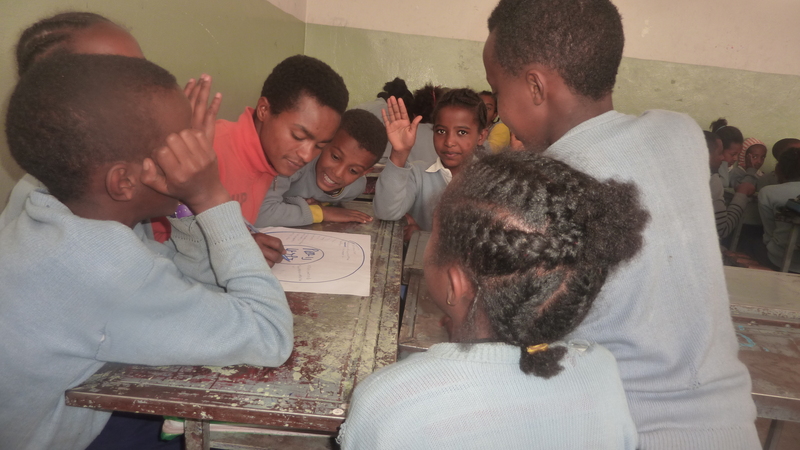 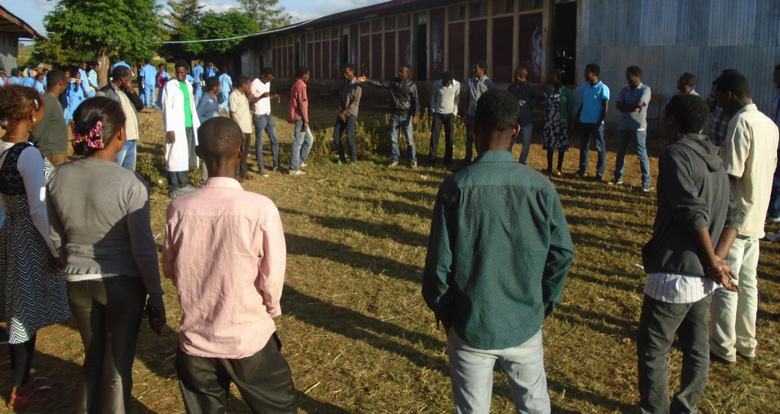 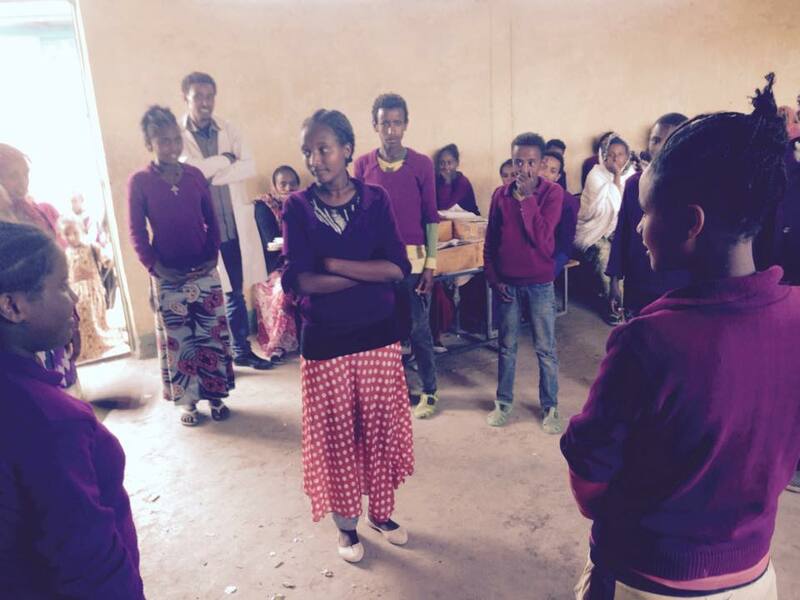 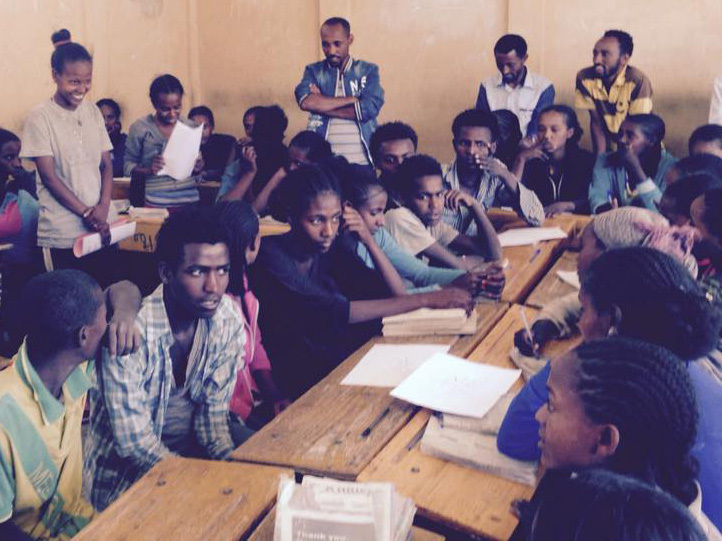 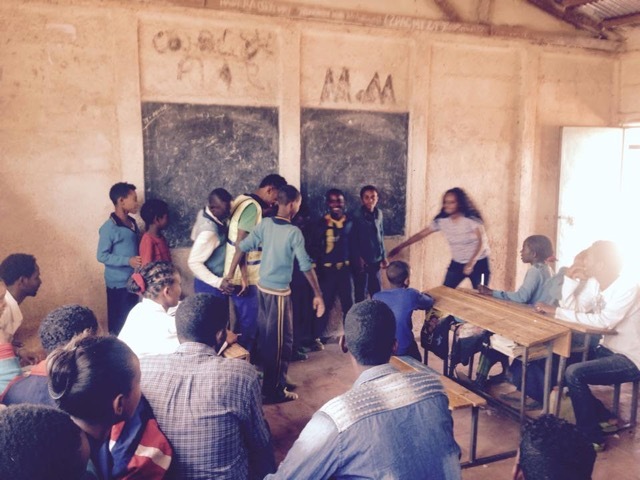 Atsede modeling a community building exercise with students at Almaz Alemu Elementary School, which is a key part of the TSE model. 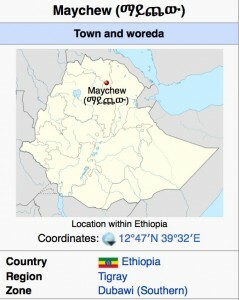 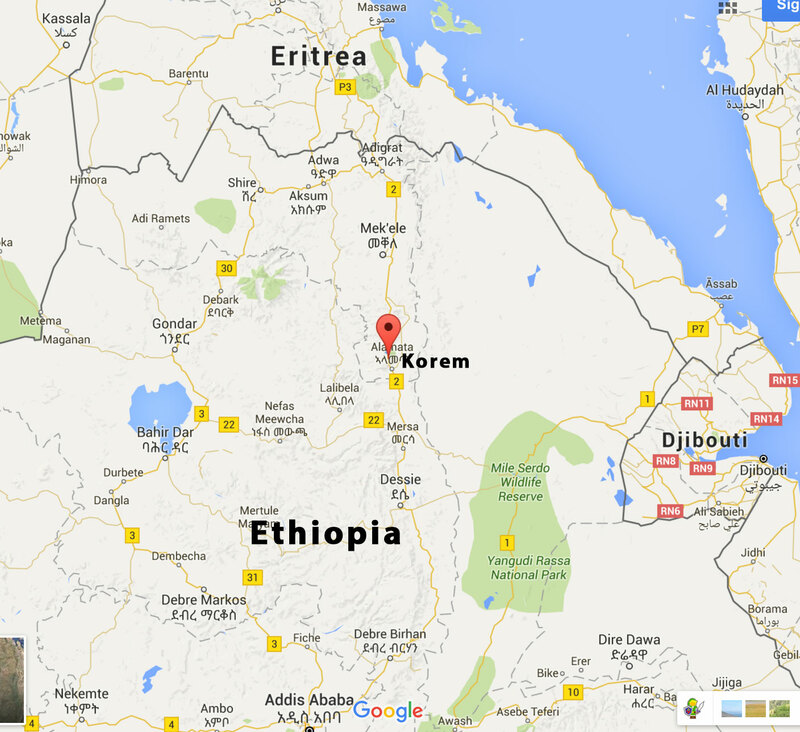 Maychew, also Maichew (Ge’ez: ማይጨው), is a town and woreda in the Tigray Region of Ethiopia. 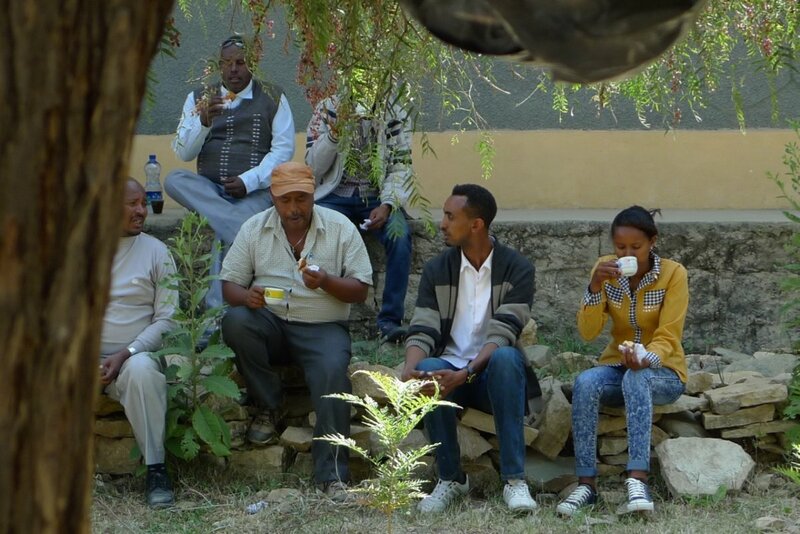 It is located at 665 km north of Addis Ababaalong Ethiopian Highway 1 which runs to Mekelle (the capital city of Tigray region) with an altitude of 2479 m. According to Ethiopia’s agro-ecological setting, Maychew and its environs are classified under the Weinadega (semi-temperate zone). 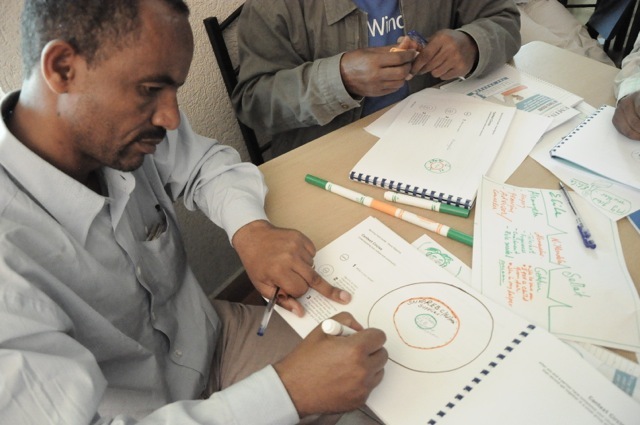 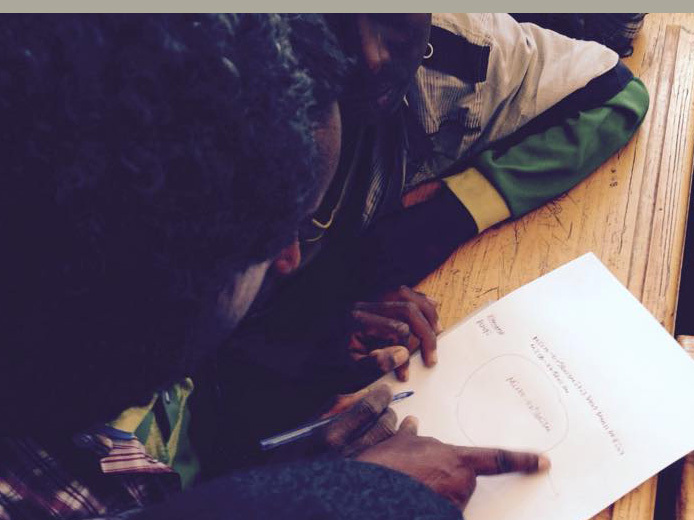 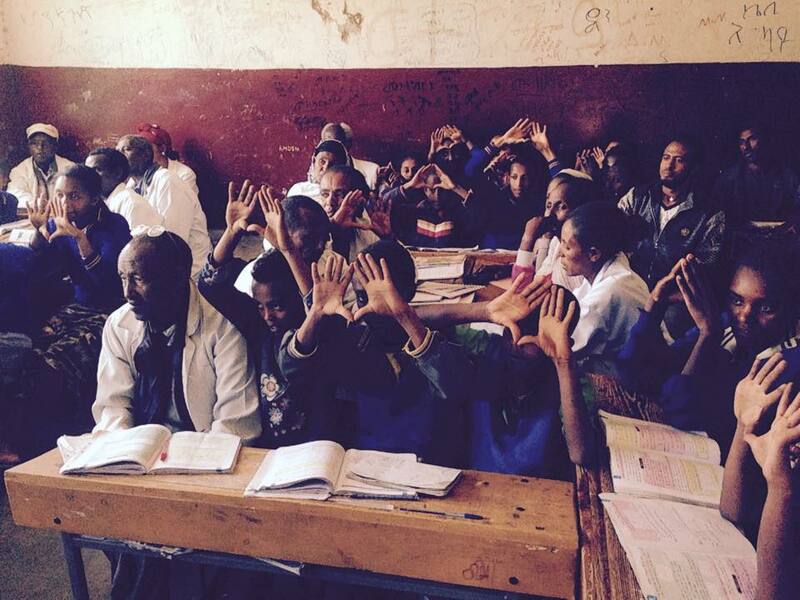 Almaz Alemu educators modeling the hand symbol for the Double Bubble Thinking Map used for comparing and contrasting. 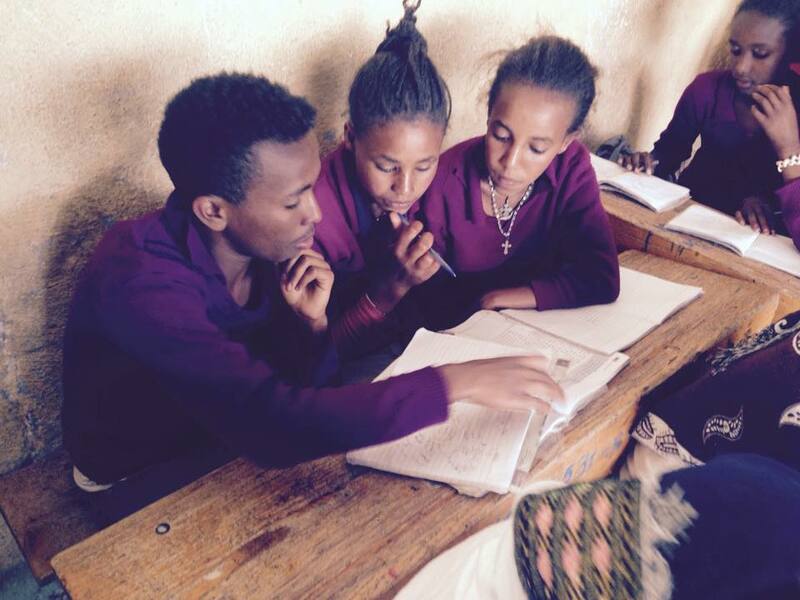 Millennium Secondary School in Korem, Tigray, Ethiopia. 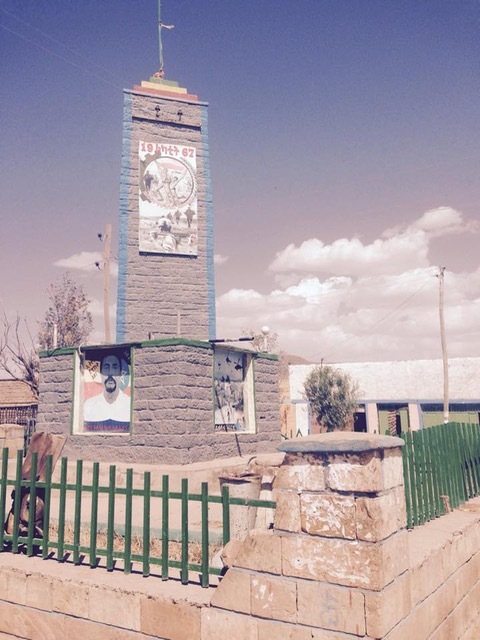 Tigray is in Northern Ethiopia. 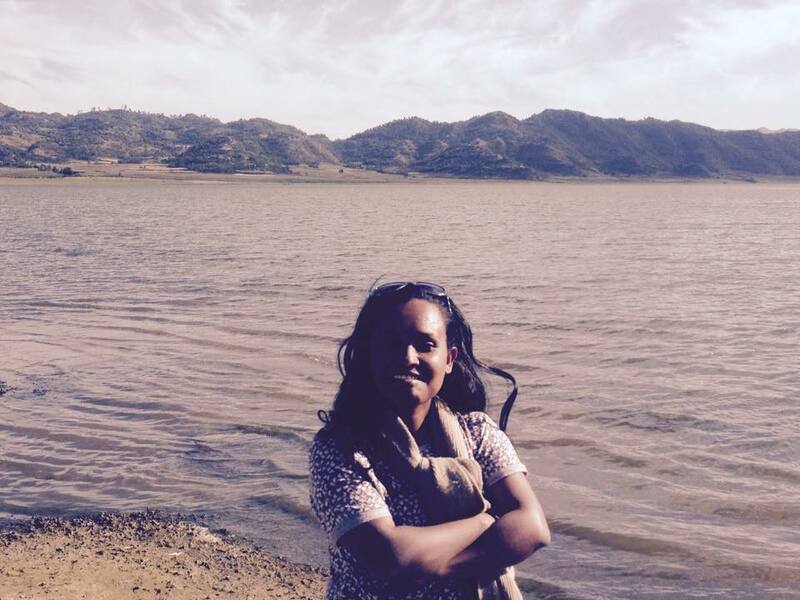 Millennium Secondary School is remote and isolated from the town (Korem is the name of the town – see photos below including of Lake Ashenga in Korem). 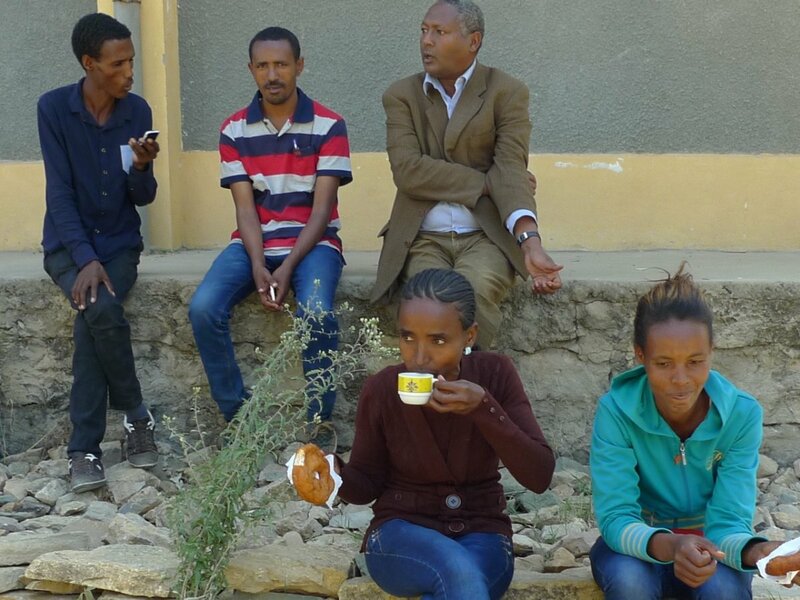 We travelled to the school driving a road twisting now and then (a very high detour) down a very high relief (an extremely rugged terrain along a steep side of a mountain and valley zig-zagging uplands and lowlands. 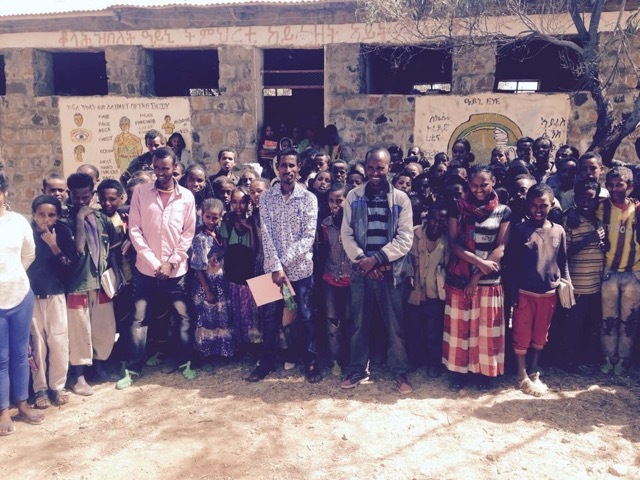 In the end we reached the very isolated and remote school in a very small village (easily counting the number of households). 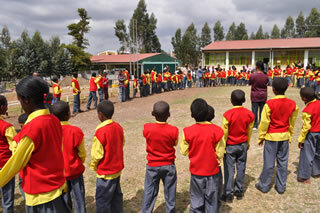 Students and teachers at Millennium Secondary School. 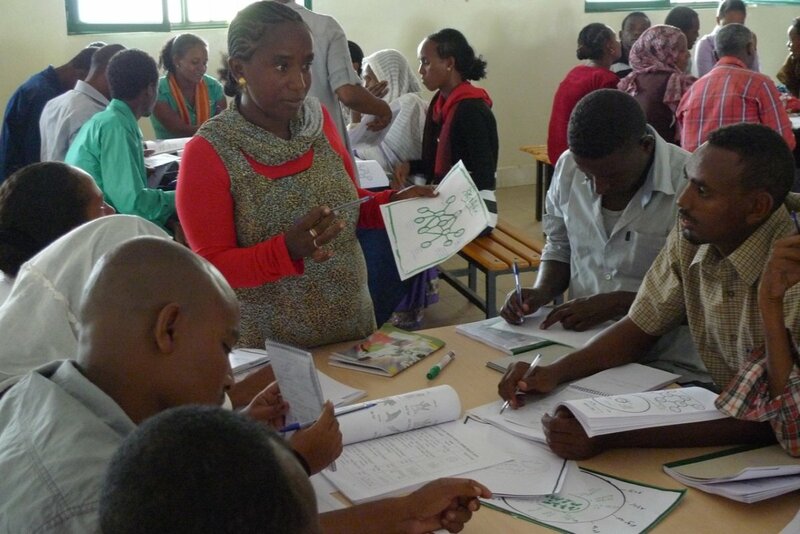 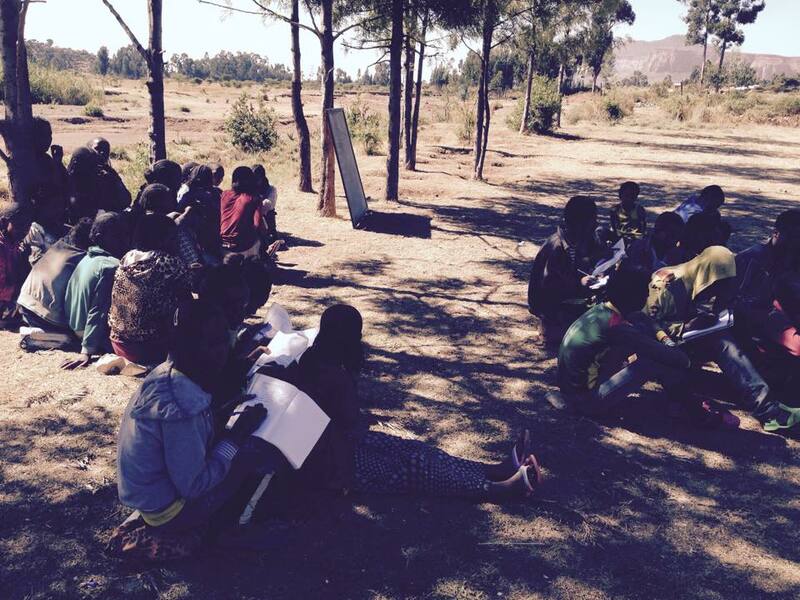 The total number of teachers working at the school are 22 of whom 11 of them were trained previously. 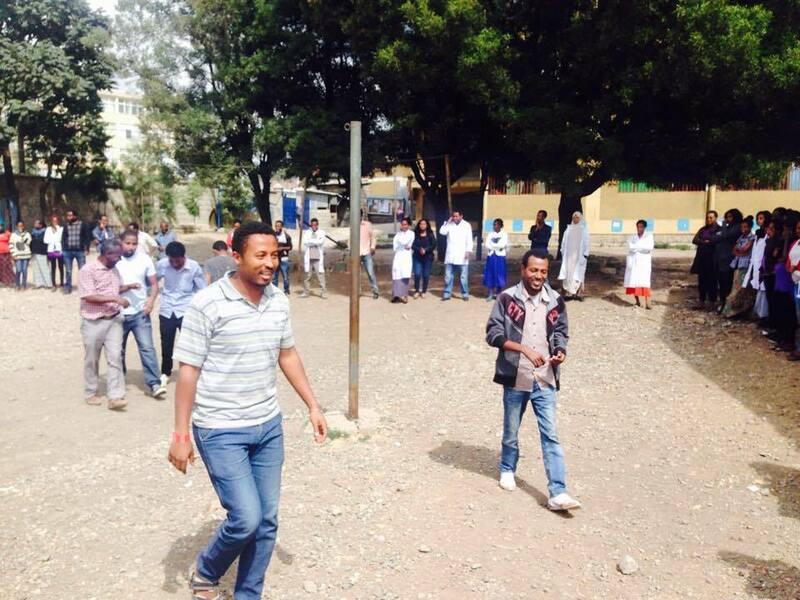 We were told that 3 of the trained teachers were transferred . 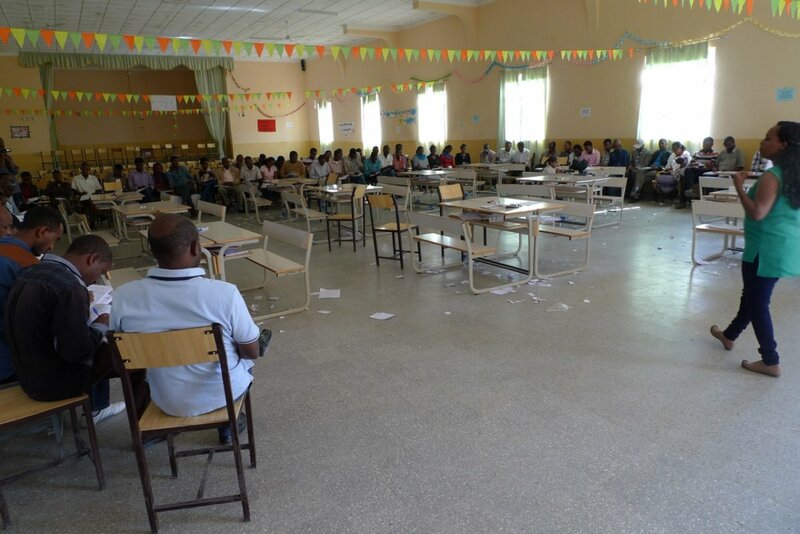 So the number of teachers who are trained remains 8. 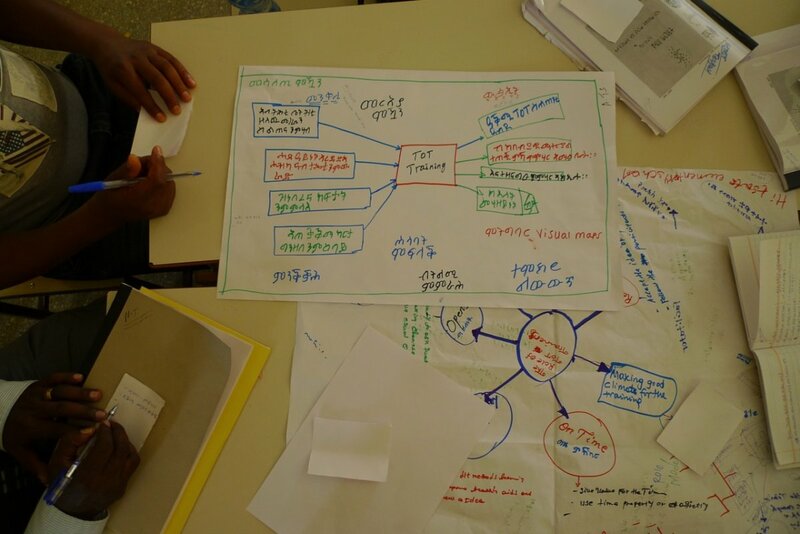 Students using Thinking Maps at Millennium Secondary School. 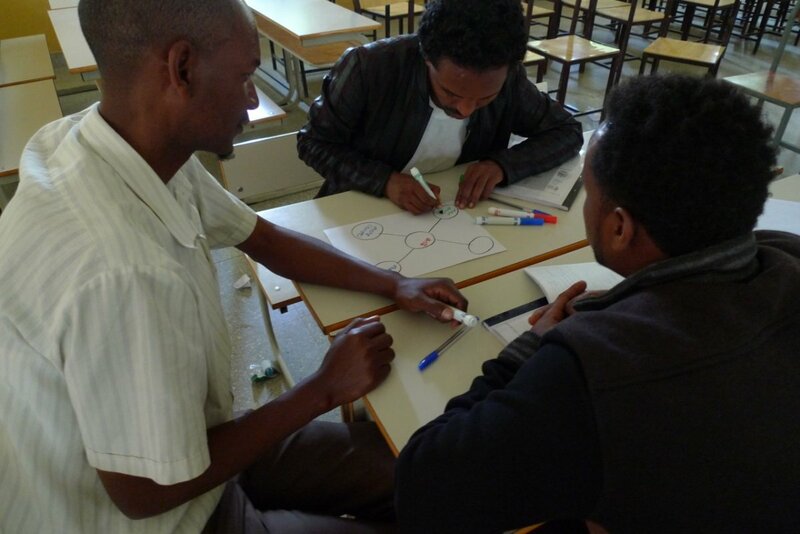 The day began with a mini professional development training including a review of the Thinking Schools Ethiopia (TSE) model, thinking maps, research basis of use of visual tools and principles of TSE model. 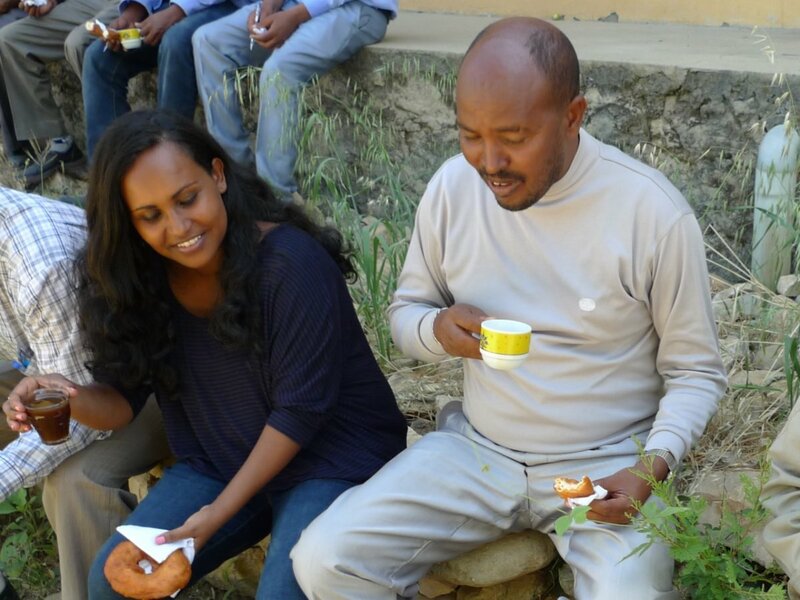 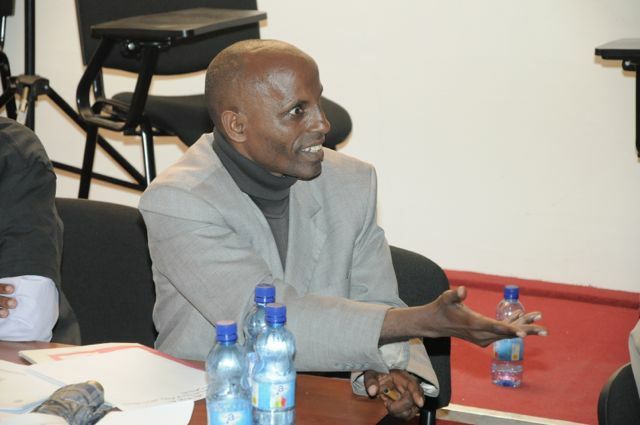 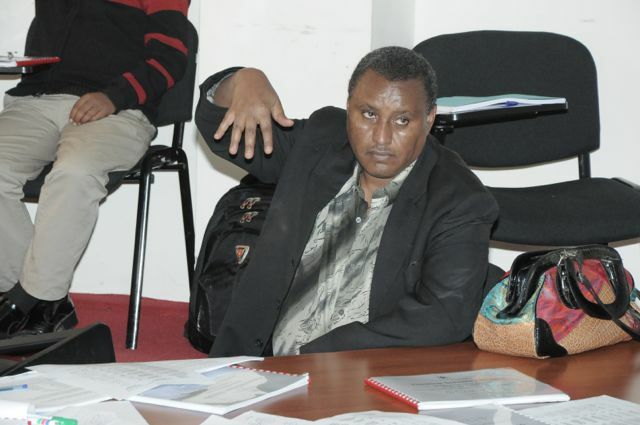 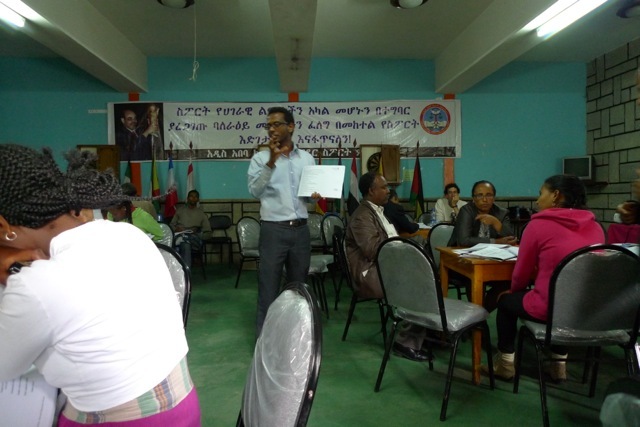 Atsede Tsehayou, Thinking Schools Ethiopia co-lead trainer at Lake Ashenga in Korem. 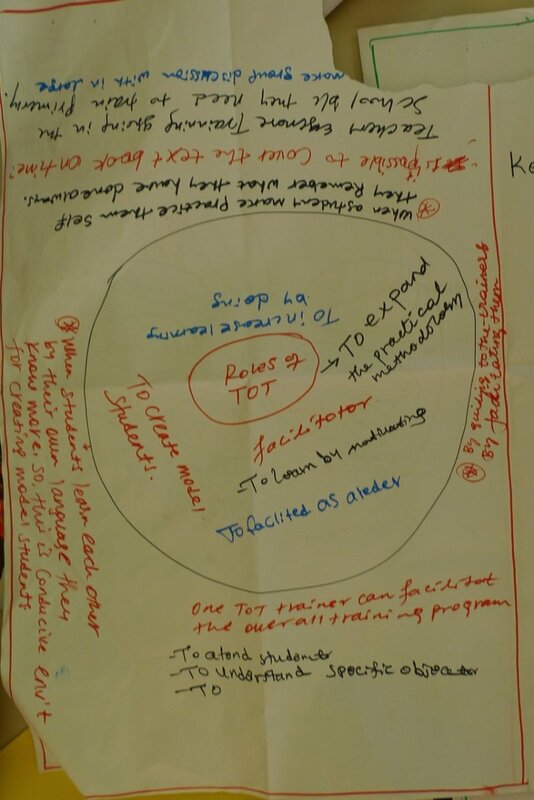 We modeled the collegial coaching model, where teachers observe a teacher doing a demonstration lesson. 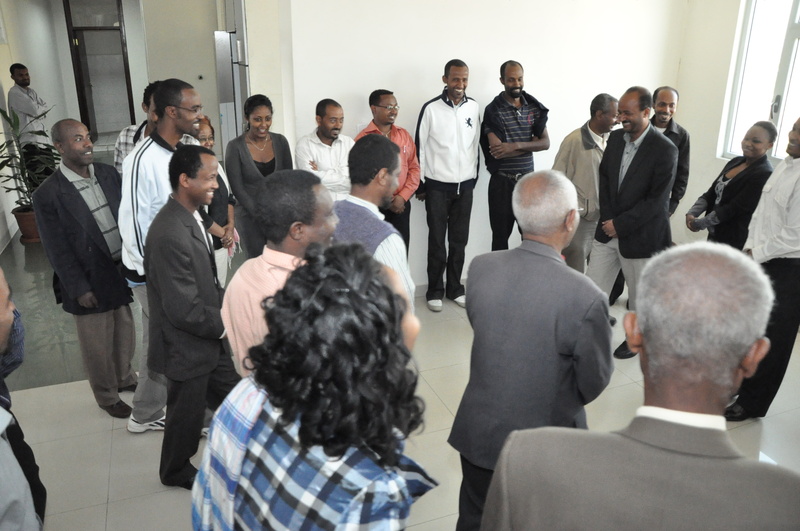 For the modeling the TSE trainers did a demonstration lesson. 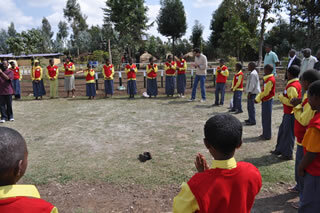 It begins with a briefing of the lesson, then doing the demonstration lesson, followed by a debriefing with the teachers. 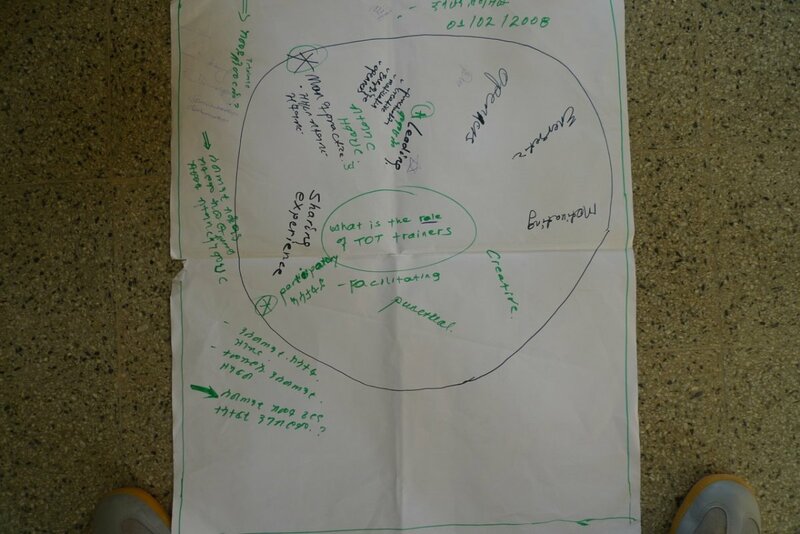 At the briefing we shared a lesson about microorganisms (Biology for Grade 9 lesson in the week), shared how to introduce the Circle Map, Double Bubble Maps with the content and how I would model think-pair-share (teacher-student; student-student; whole class), brief sharing of two examples of group works, proceeded with modeling using a Double Bubble Map to compare and contrast (useful verses harmful micro organisms). 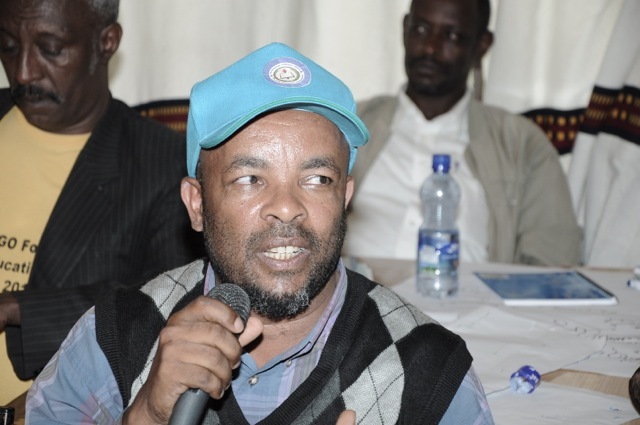 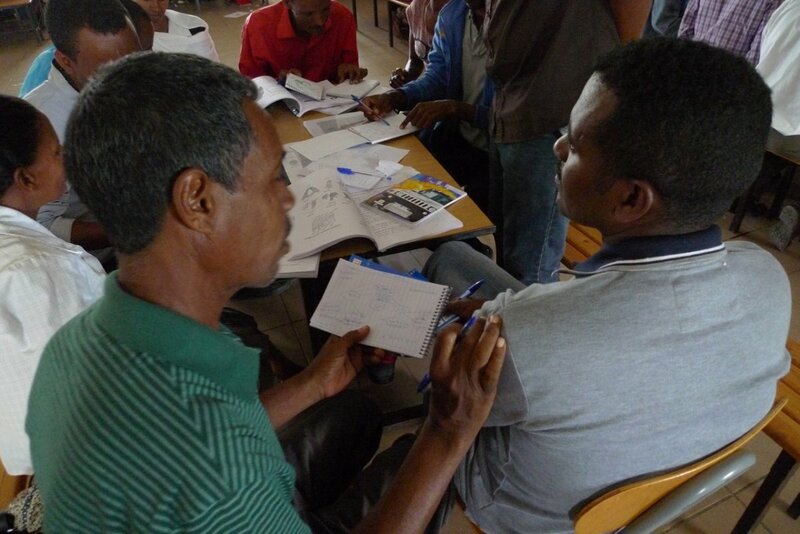 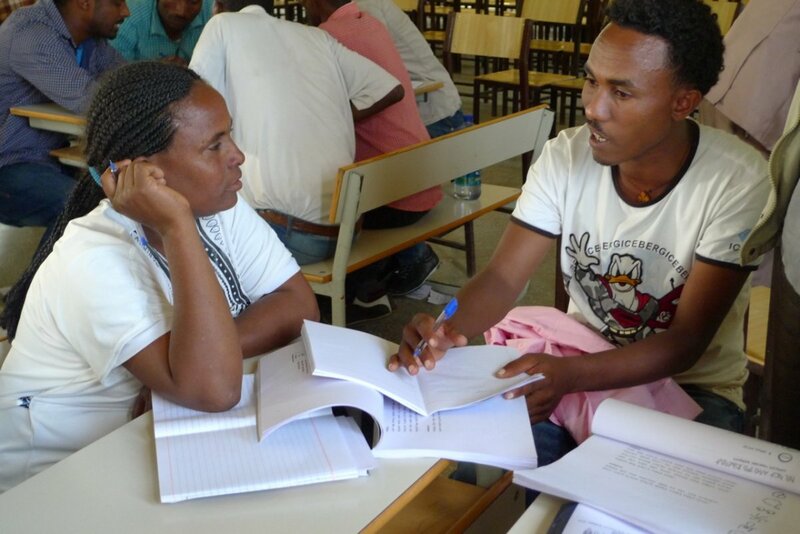 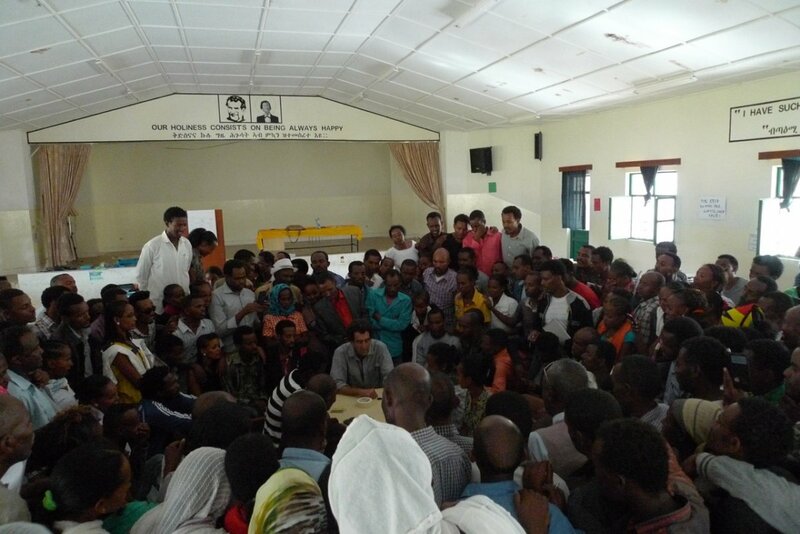 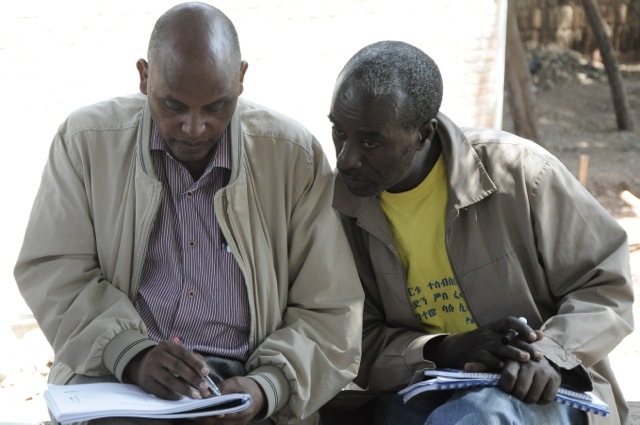 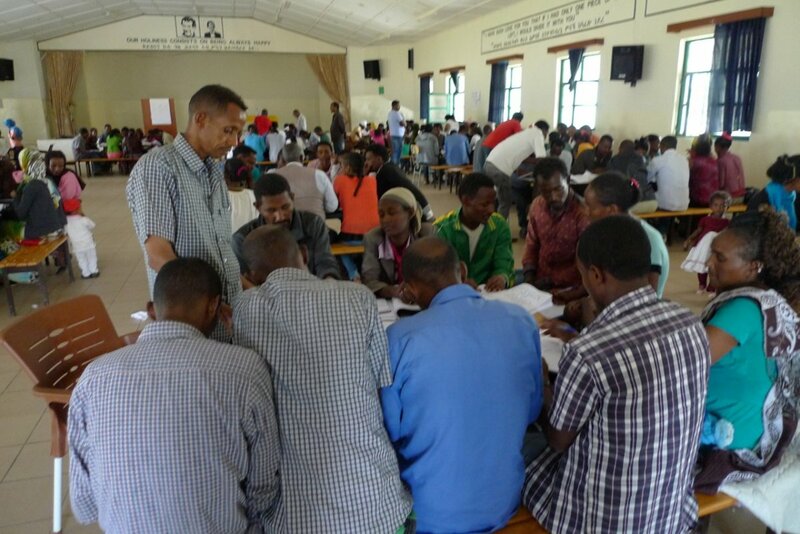 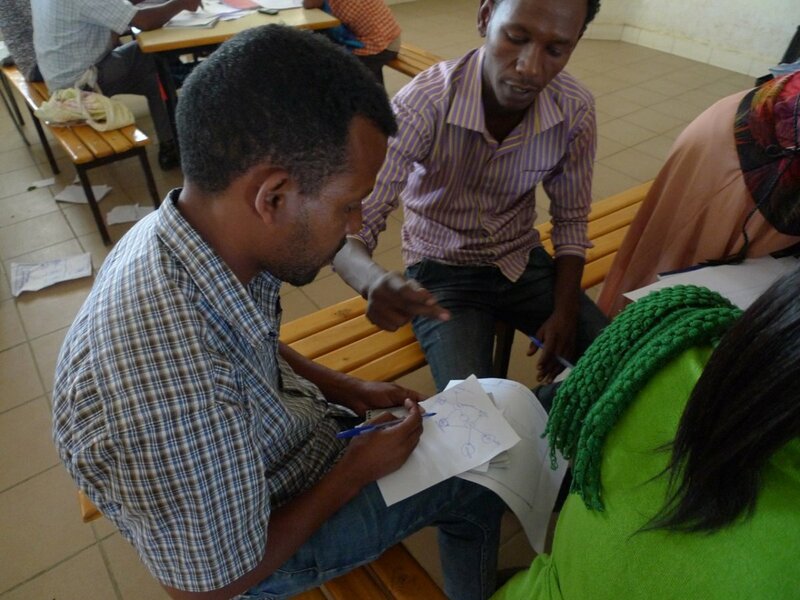 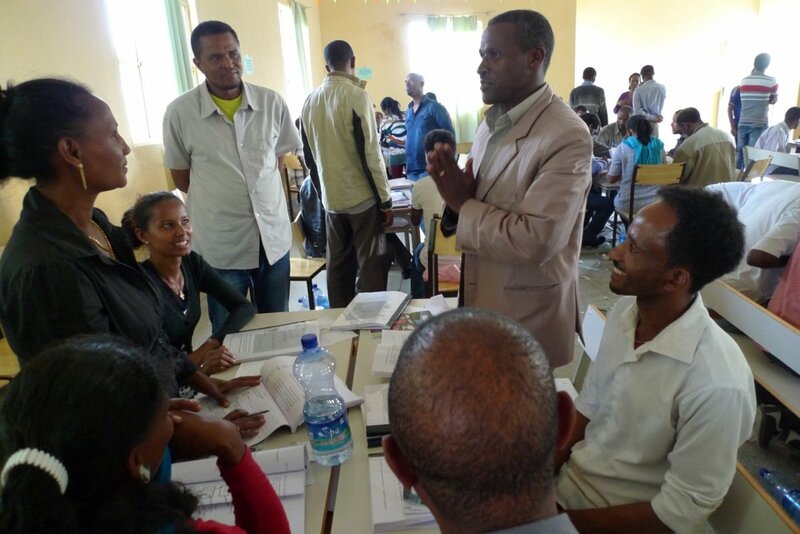 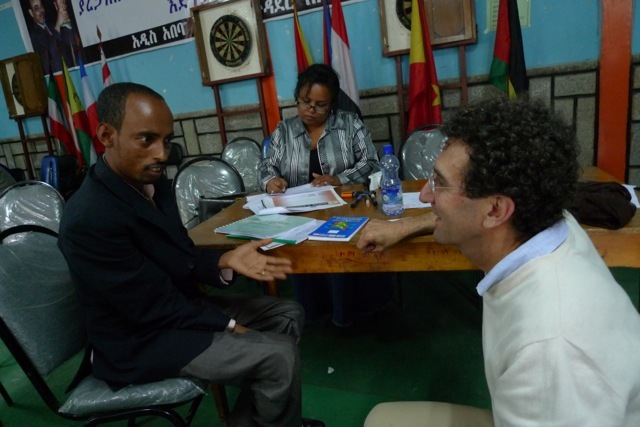 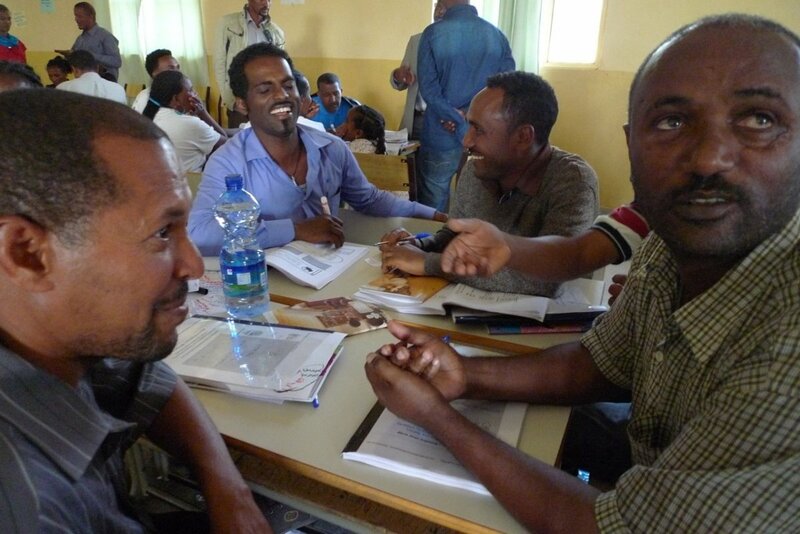 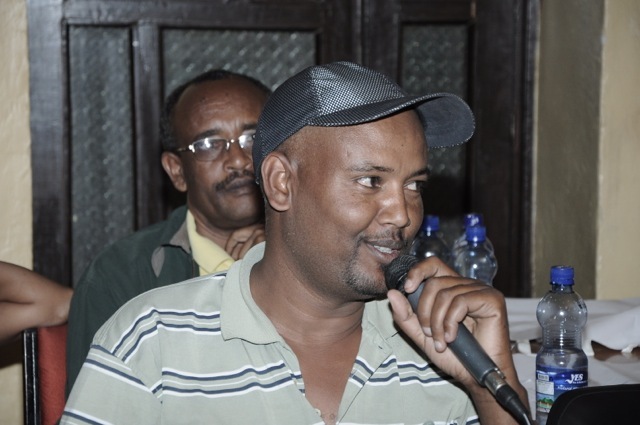 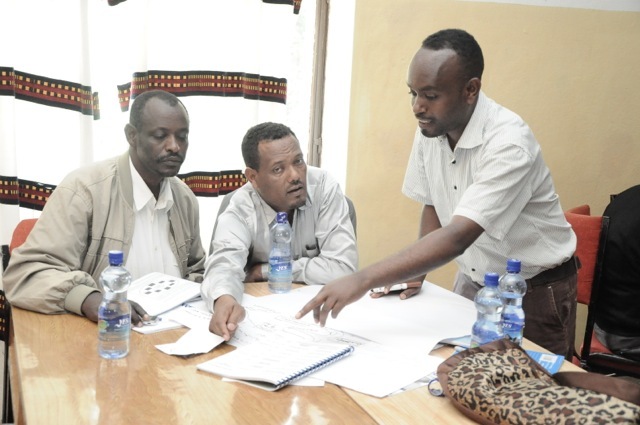 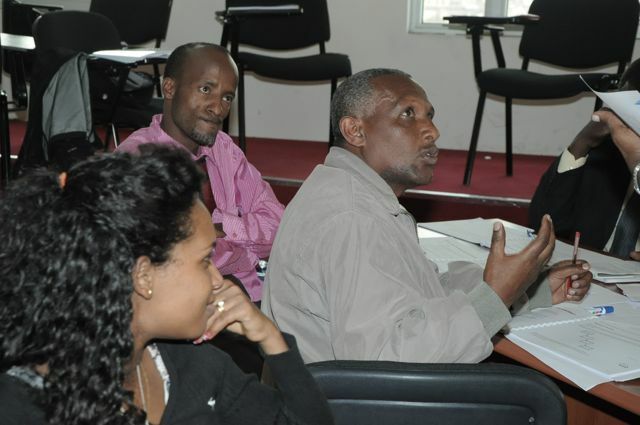 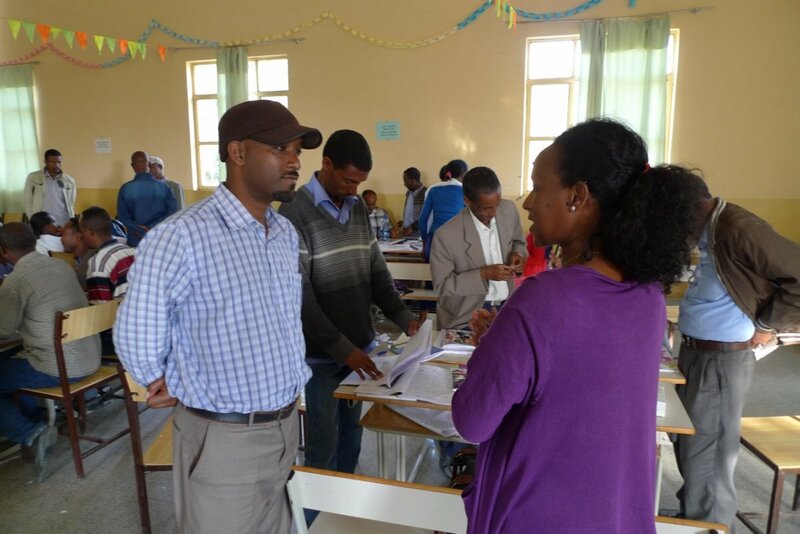 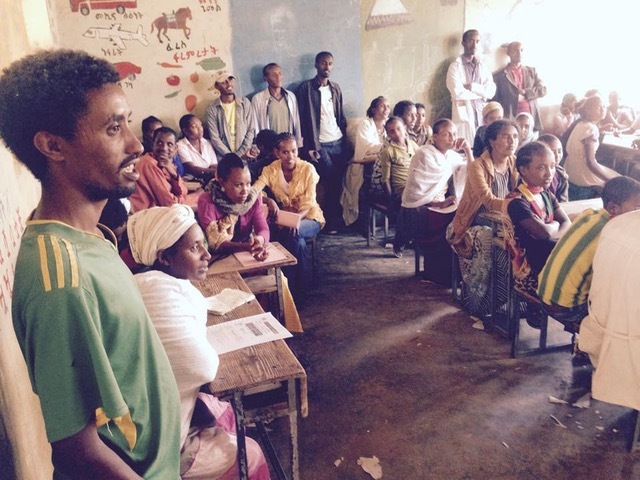 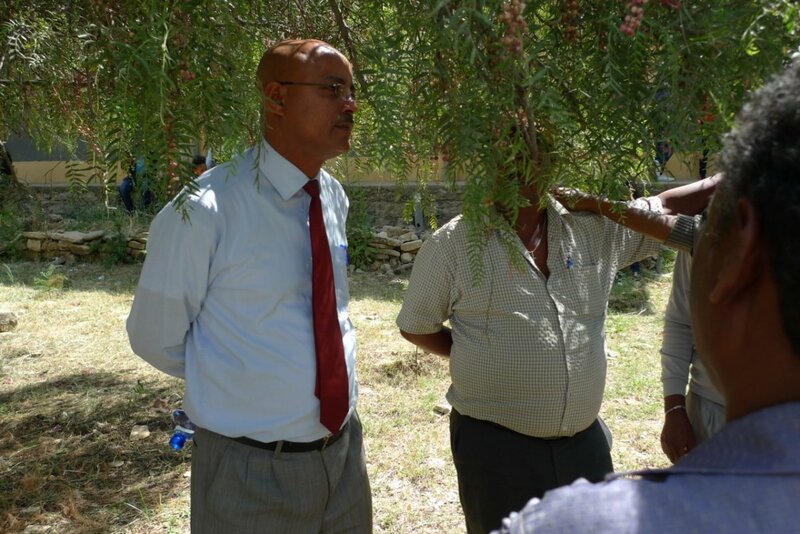 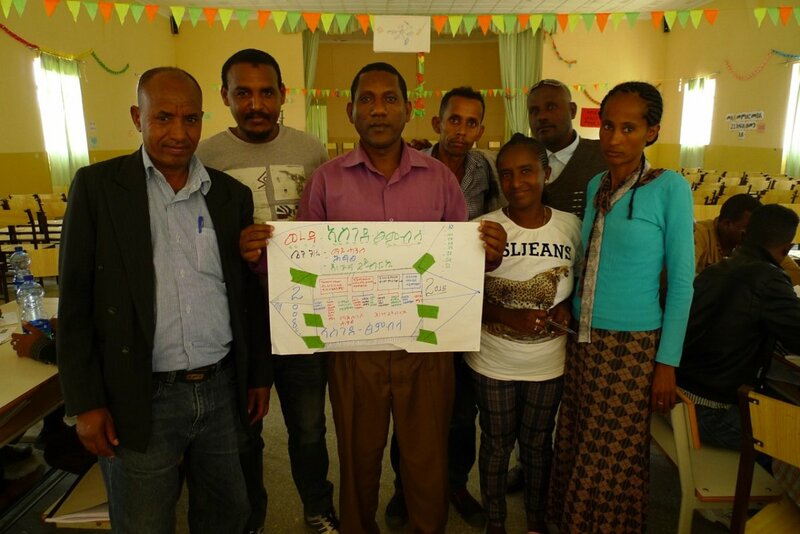 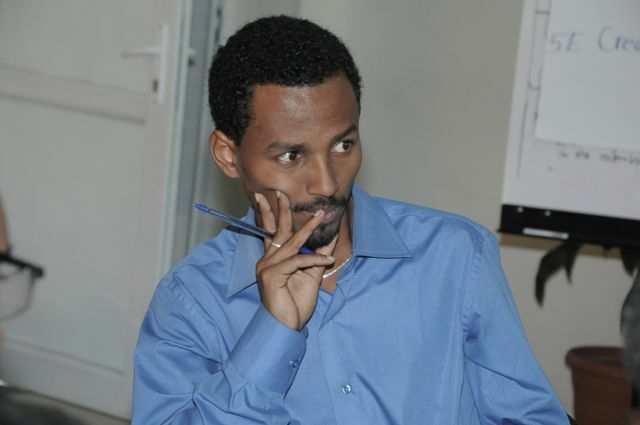 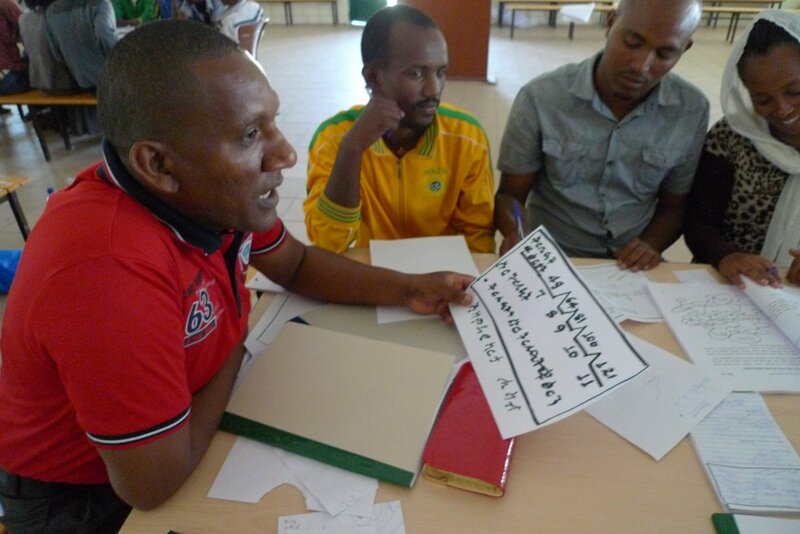 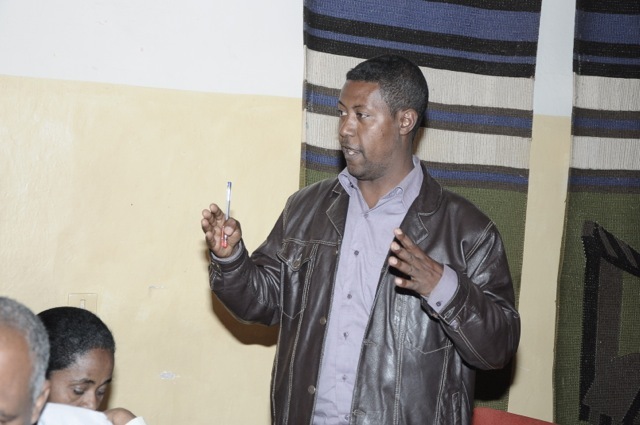 Dagim Melese, Thinking Schools Ethiopia co-lead trainer at Lake Ashenga in Korem. 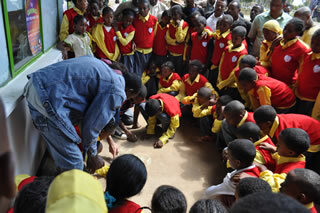 We then did a demonstration lesson with the students with the teachers observing. 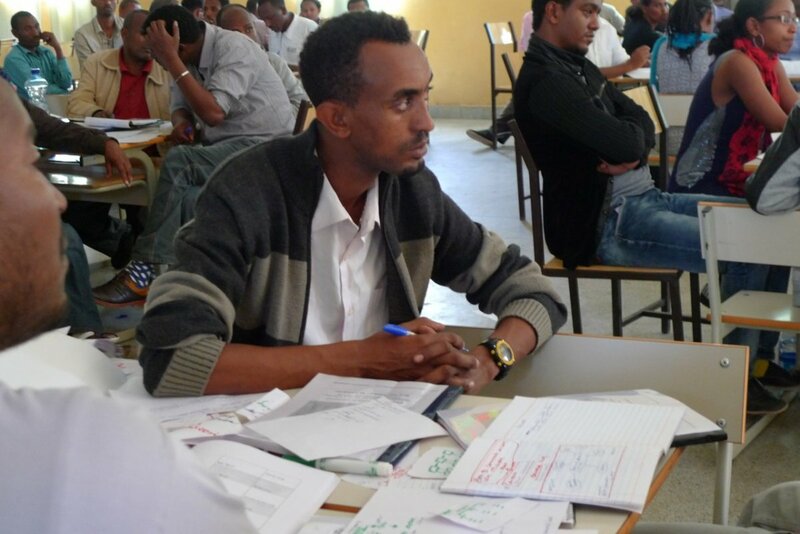 The teachers take notes on positive observations and questions they have from their observations of the demonstration lesson. 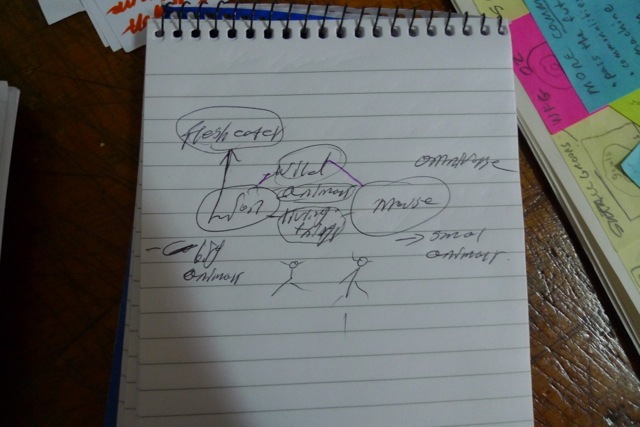 It was agreed about the need to introduce the Thinking Maps to students . 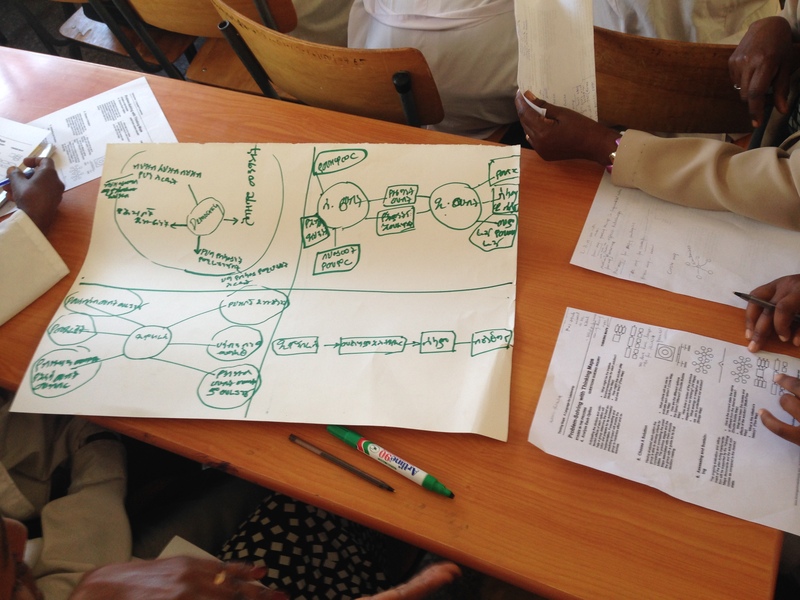 Teachers were ready to start using Thinking Maps flexibly first then more regularly. 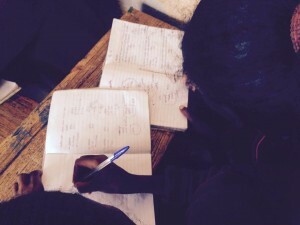 Questions: How do we manage time? 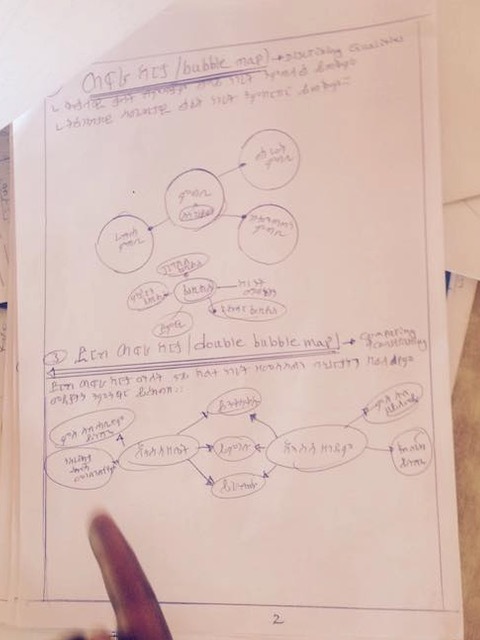 “once thinking maps become language among all the students. 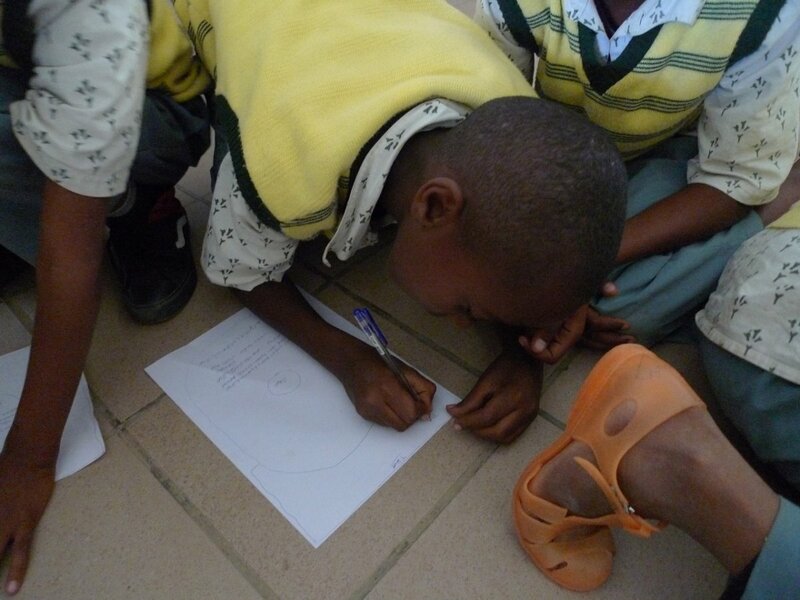 The degree of automaticity with which they construct maps gets higher lessening the time it takes to facilitate group work.”We asked what time does it take you to tie your shoelaces? 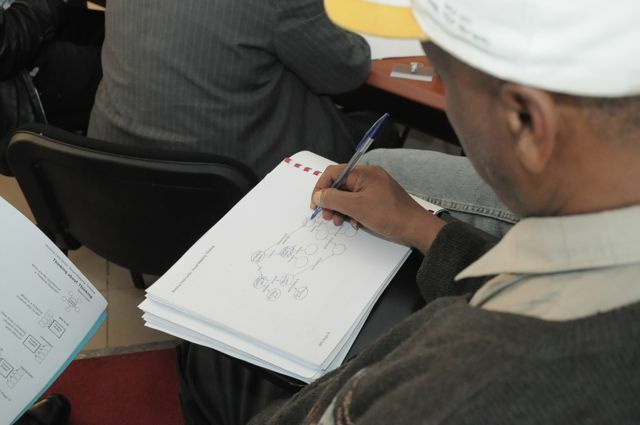 how difficult is driving for an experienced driver? 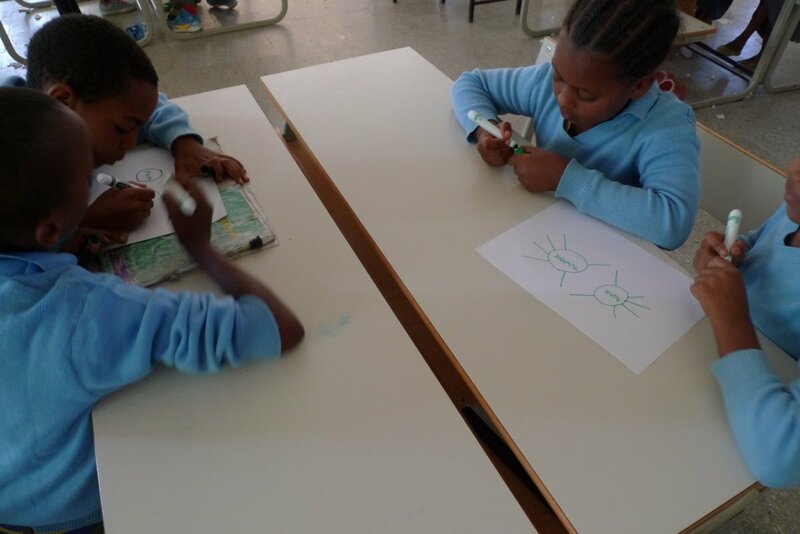 Once we learn how to use them, we do it fast.So the key is to experiment using them in our class room. 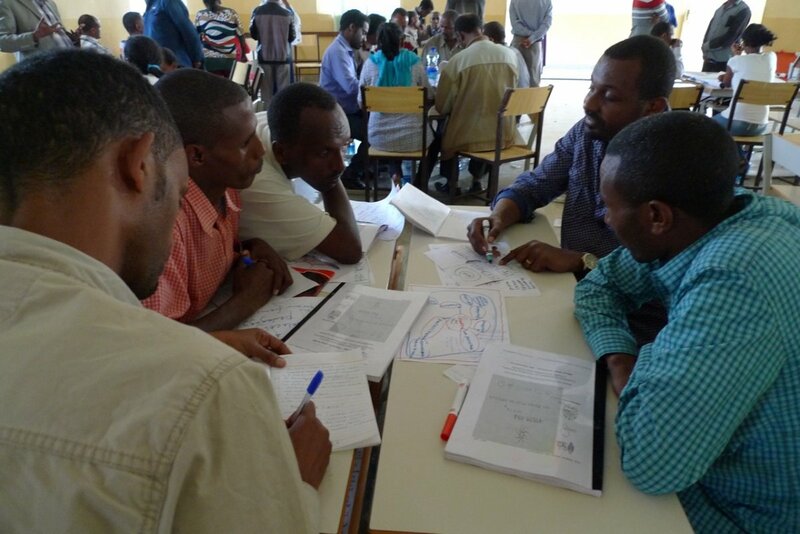 In time we will develop expertise in using the maps . 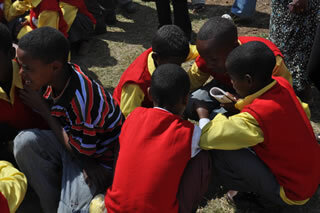 What did we see today? 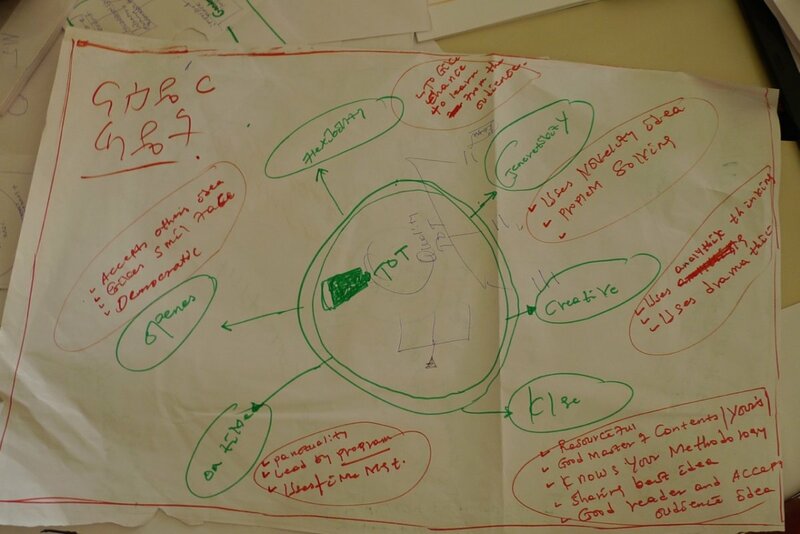 What is something we learned today which we will use to refine site visits to come? 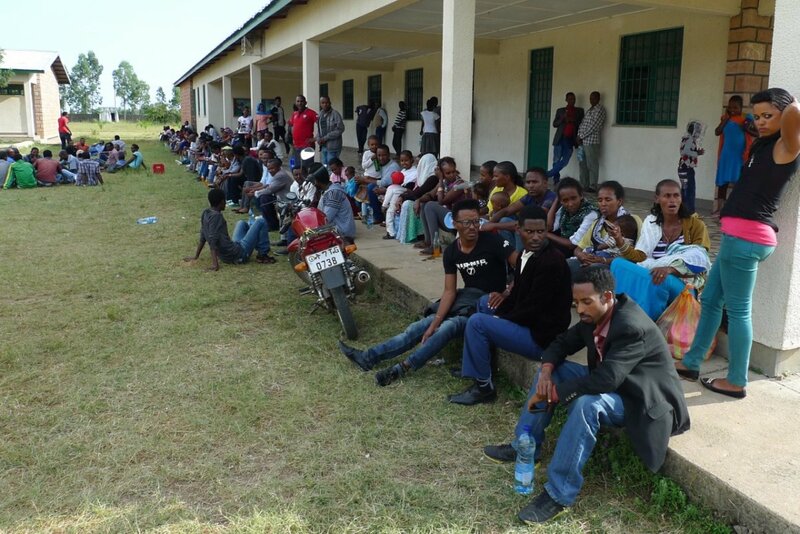 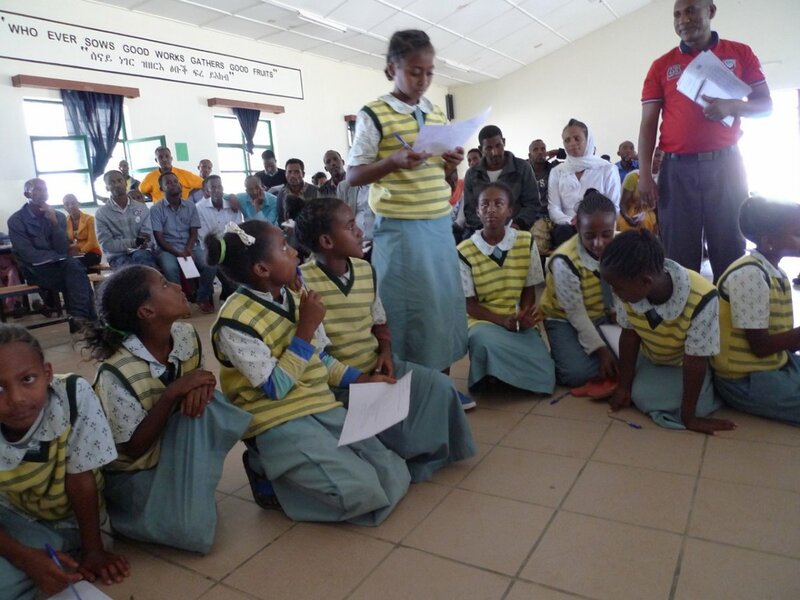 Students of grade 9 enter secondary schools after having spent 8 years of their academic life learning subjects in Tigirigna and English as a subject on which they usefully perform poorly. 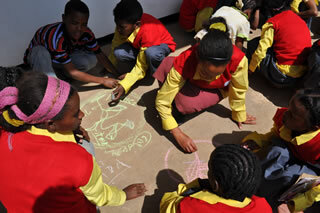 This is true of other schools in other regions too. 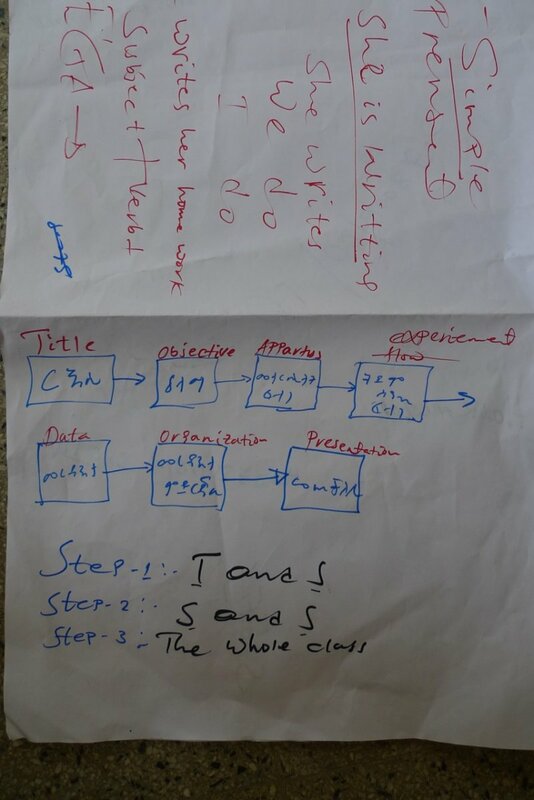 Now, the biology lesson on Microorganisms is written on English and teachers are supposed to teach in English. 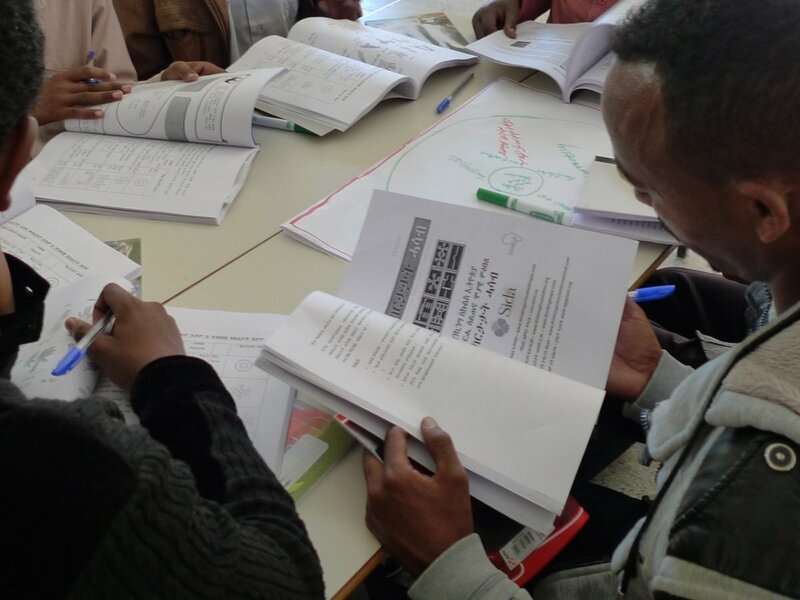 I started teaching it in English but it prevented students from actively taking part in the discussions and participation. 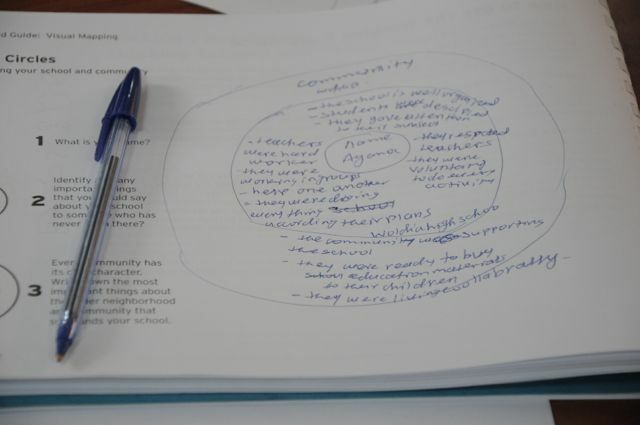 A student writing in a circle maps with me clearly exhibited this problem. 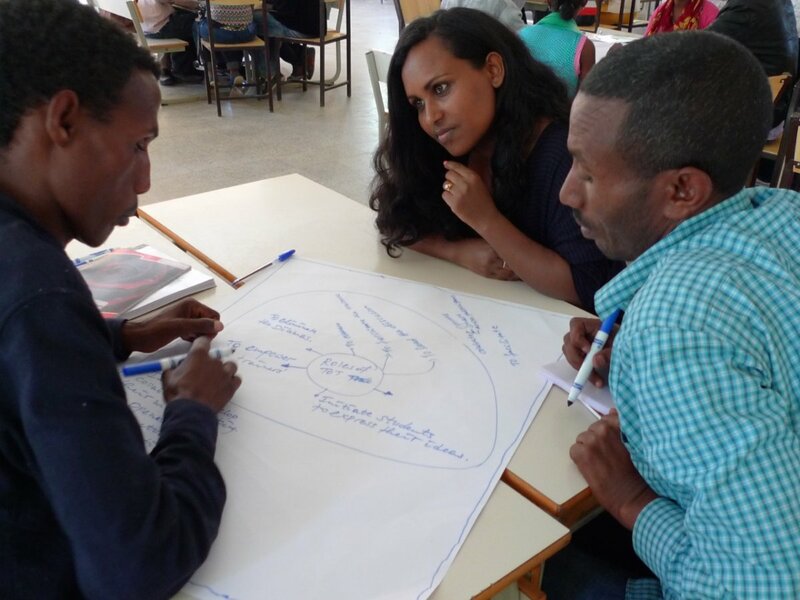 How do all the educators understand prior knowledge that the knowledge she/he has about microorganism is still a stock of knowledge – prior knowledge – even when it is communicated in Tigirigna? 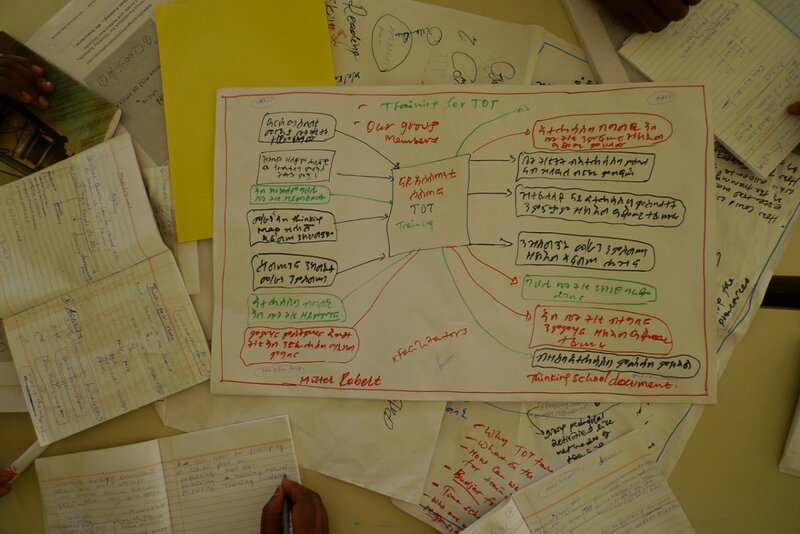 This is where the Thinking Maps need to be seen as a thinking and language bridge. 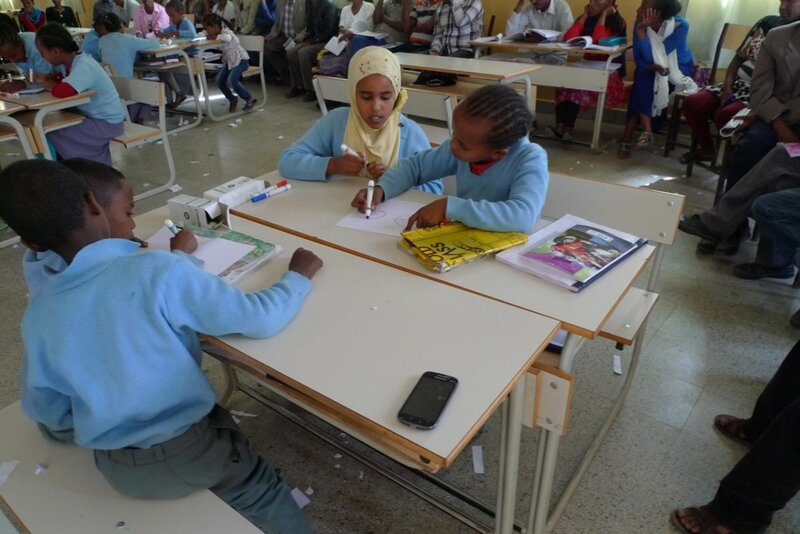 Students have the knowledge, but simply because they are not able to share in a different languages or communicate with other languages they fail to precisely respond to exam questions written in English hence, score less on exam, and assessed as low achievers. 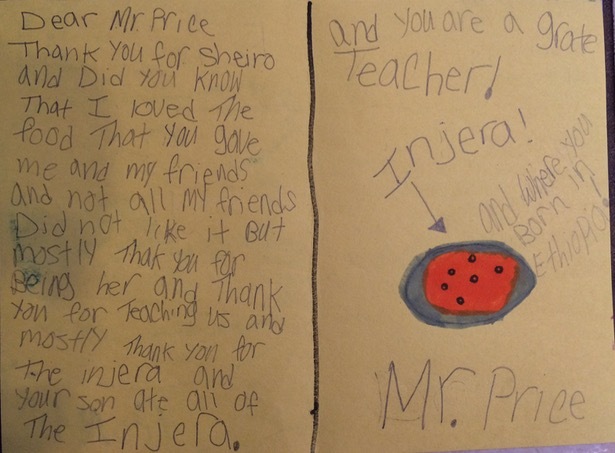 This needs to be internalized and understood by educators to then best support the students. 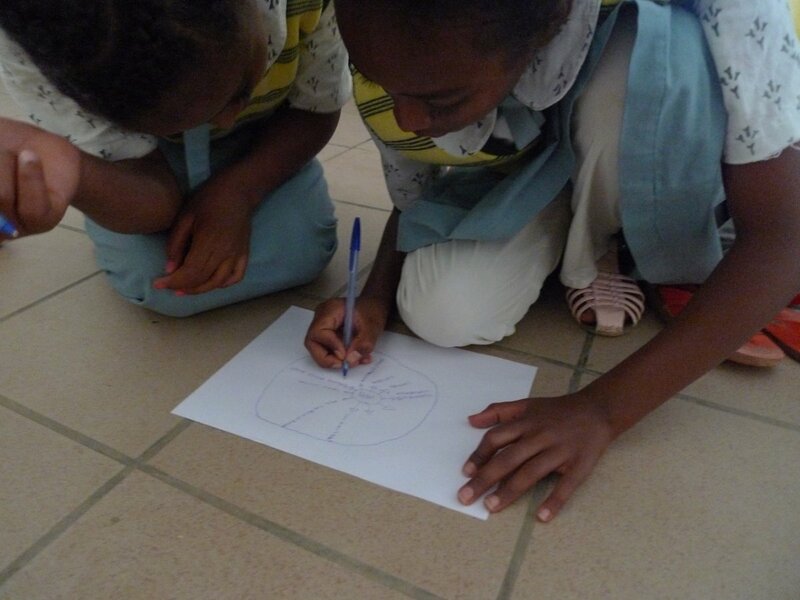 Students modeling the hand symbol representing the cognitive process of compare and contrast for a Double Bubble Map. 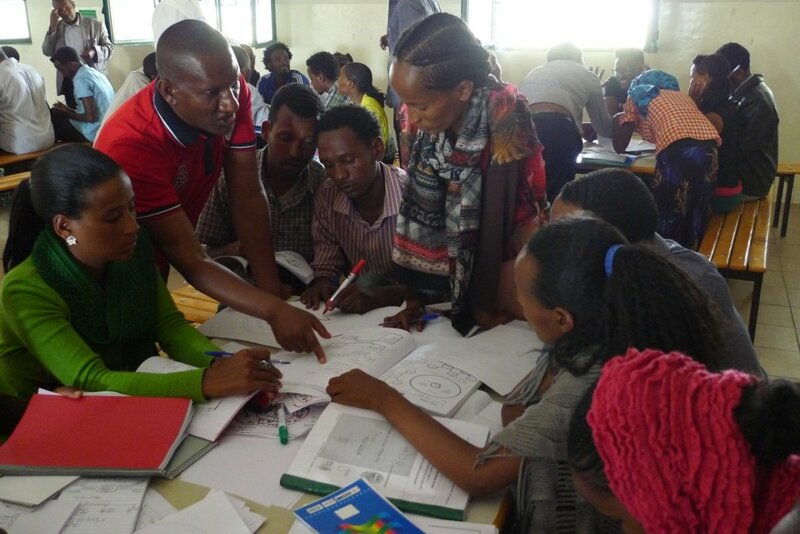 Teachers participating in the school site professional development actively involved with students on their learning and implementation of Thinking Maps. 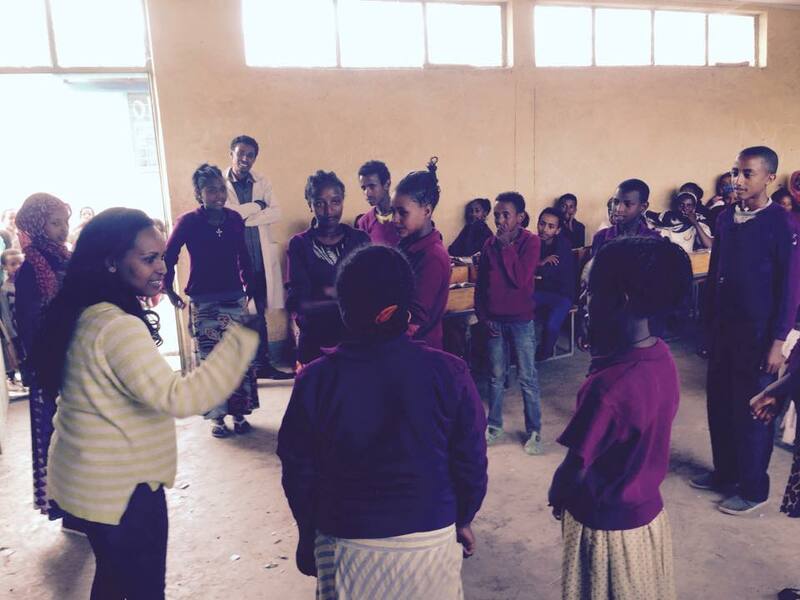 Zelalem Desta Elementary School is a long established school that was built in the Ethiopian Calendar year of 1947 (1954 Gregorian Calendar). 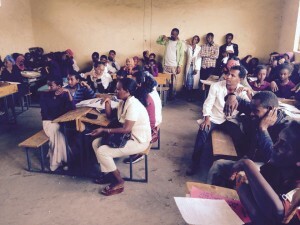 There are 27 teachers teaching in the school . 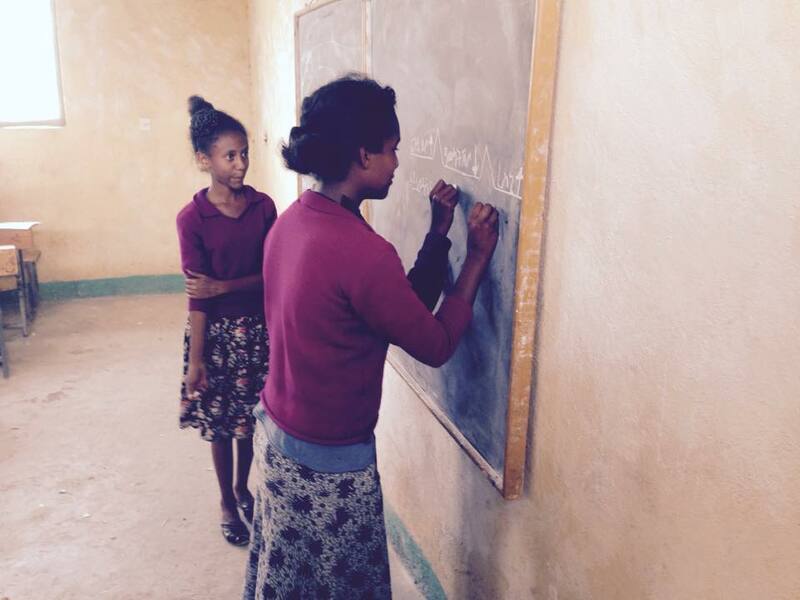 We were informed that due to lack of trained teachers the school had to call back retired teachers to work in the vacant capacities . 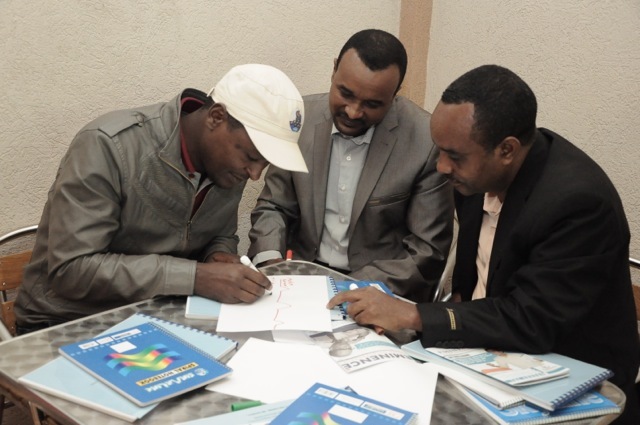 Of the 27 educators of the school approximately half of them took part in the two days Thinking Maps training held in October. 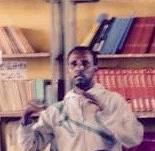 There is only 1 Trainer of Trainer from the school who is at the same time the schools director. 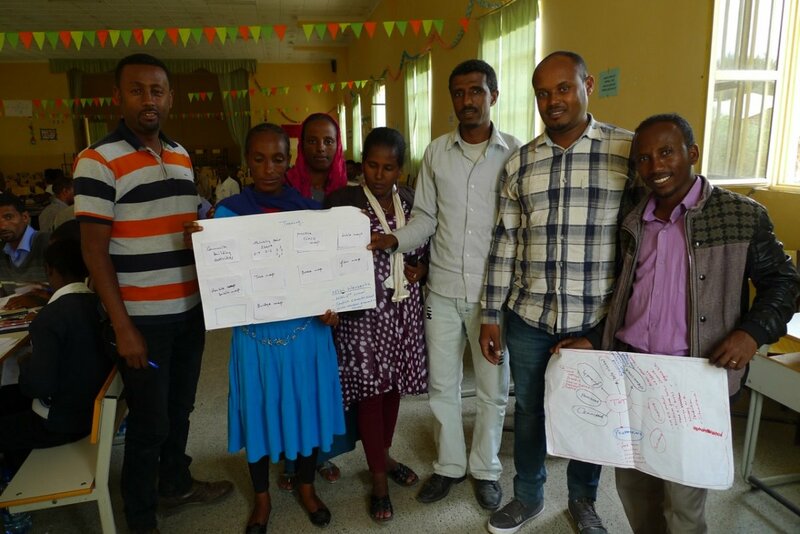 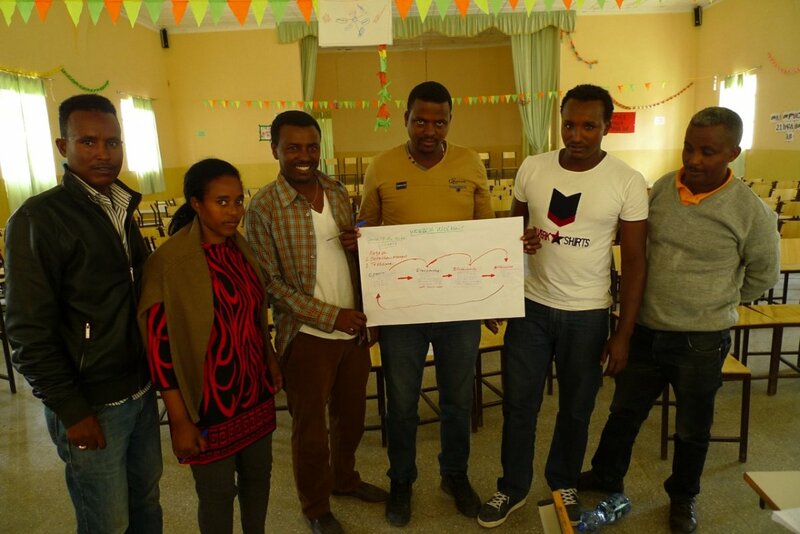 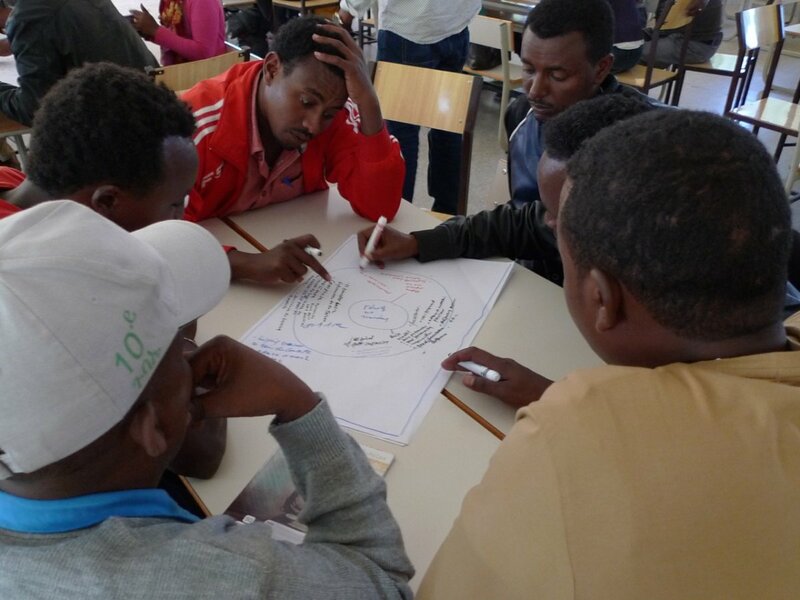 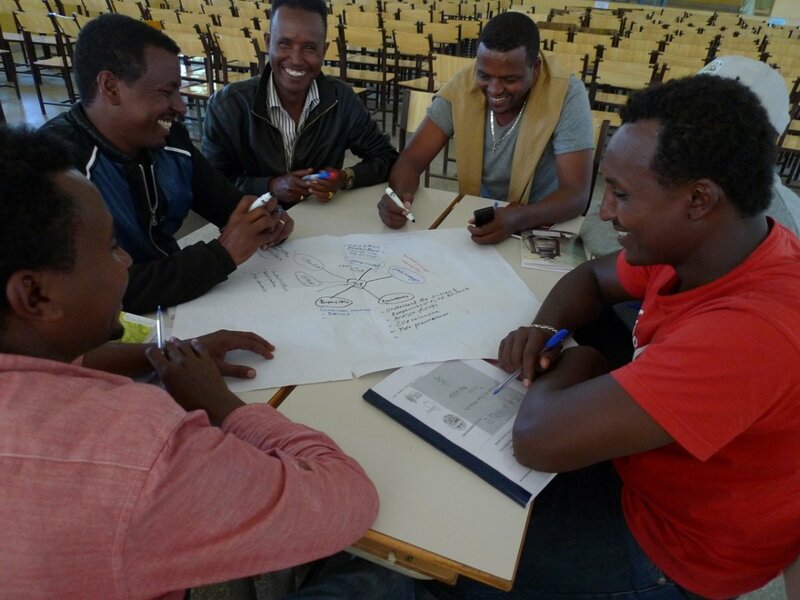 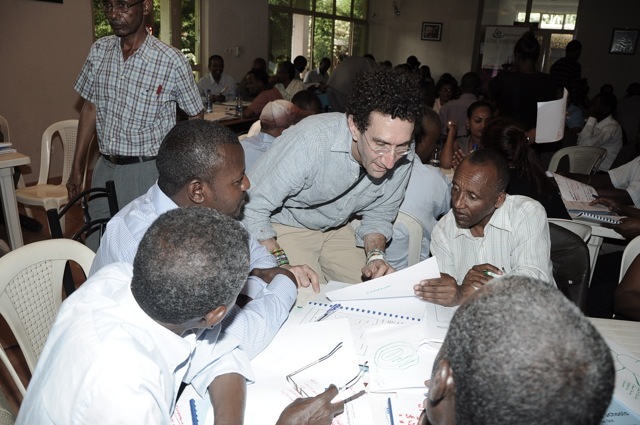 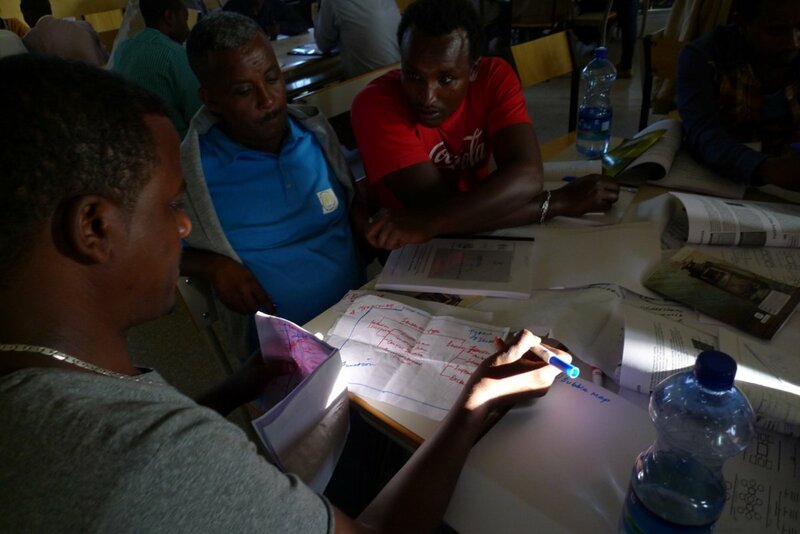 In October the Trainer of Trainers received an additional 4 days of Thinking Schools Ethiopia training including Thinking Maps, Community Building, Inquiry and Leadership skills. 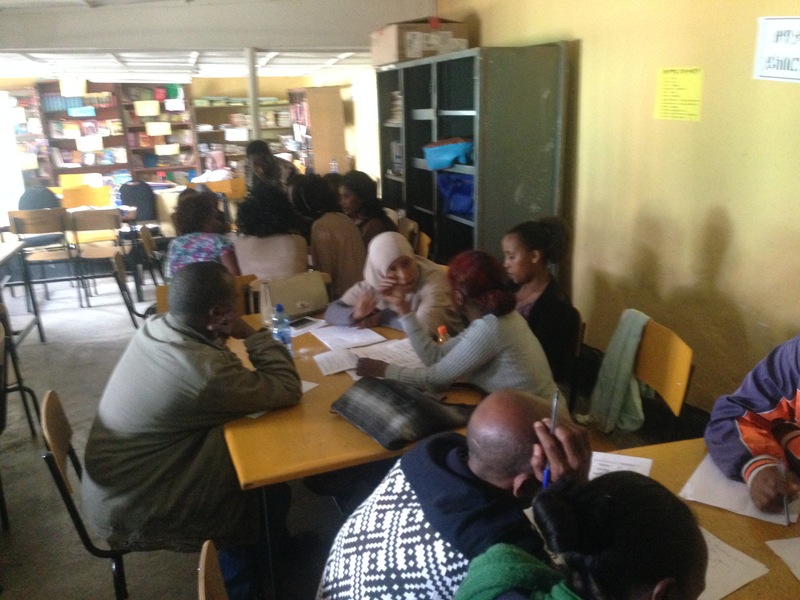 We followed site visit procedures which includes mini professional development sessions, collegial coaching, classroom demonstration lessons which include teacher briefing and debriefing . 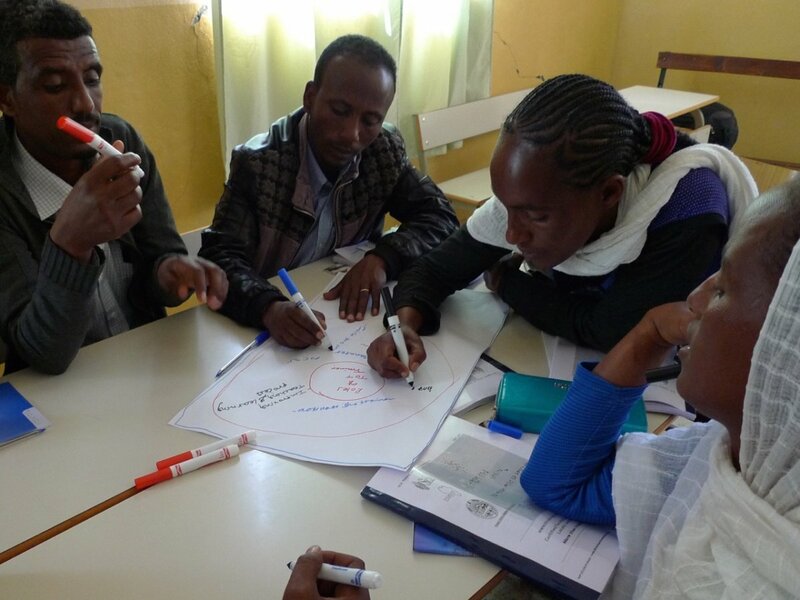 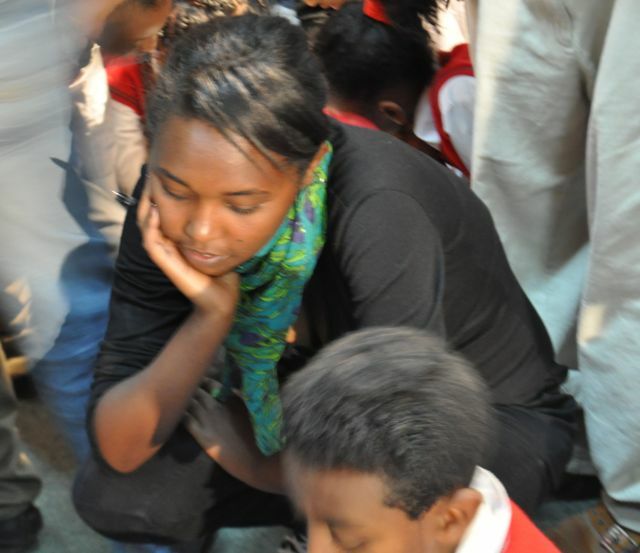 Play the video above of a student and Thinking Schools Ethiopia co-lead Country Trainer modeling the Circle Map (Thinking Maps) to students and many observing teachers. 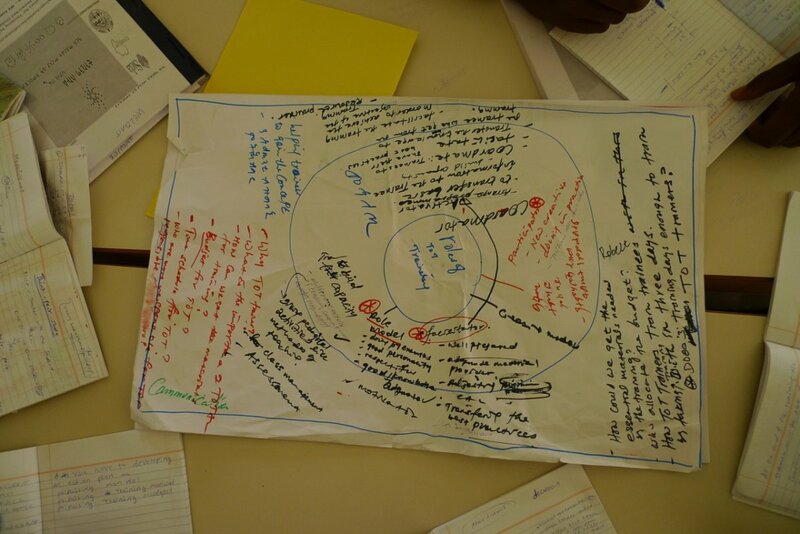 Lessons were done with a content from a subject teachers would think difficult to use thinking maps to explore, analyze, compute, and discuss on and about. 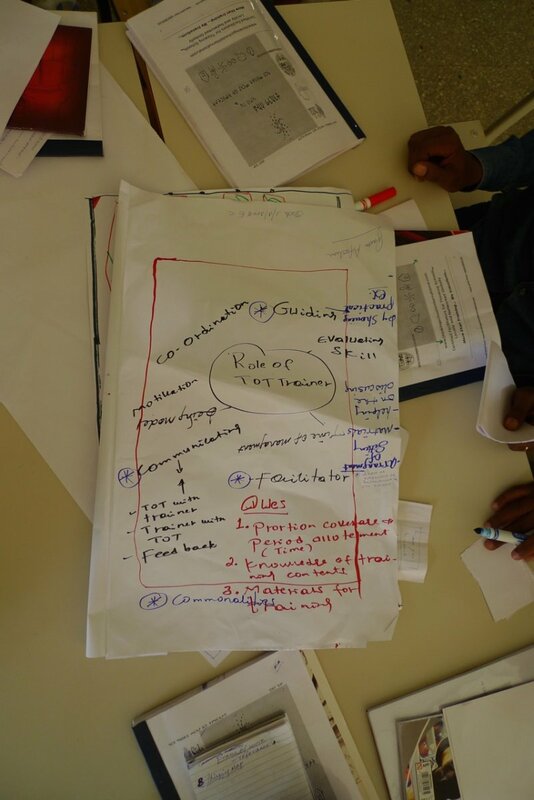 We also were convinced that doing demo lessons with subject teachers collaborating with us is helpful to encourage them use maps in real classrooms . 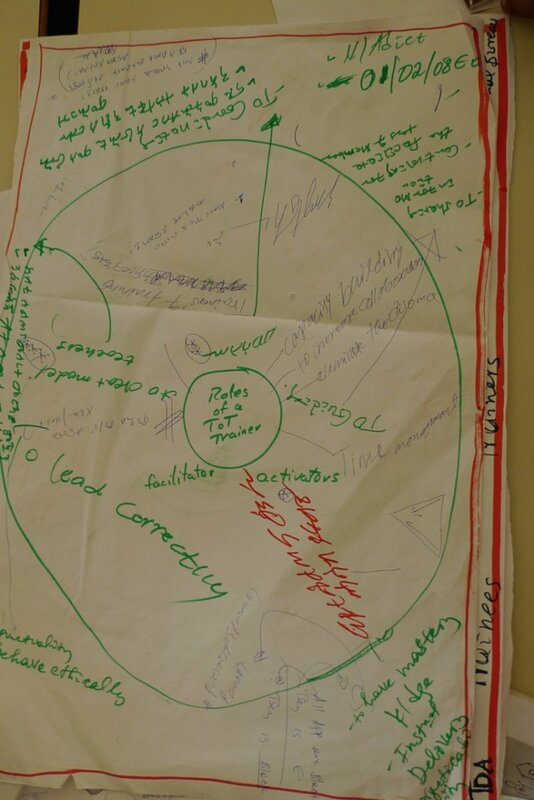 A key observation was seeing Thinking Maps posted on walls of all classrooms which models the interest in whole school implementation by the Trainer of Trainer and school leader. 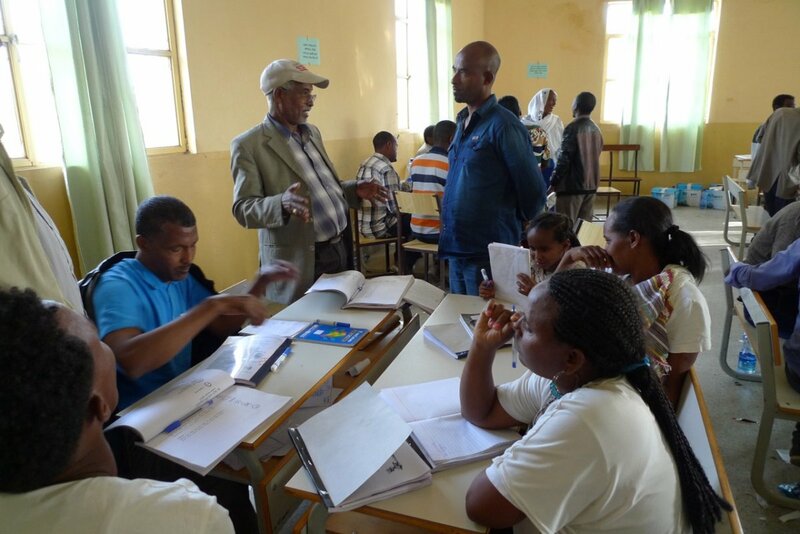 Our site visits continued with Menkere and Zata primary schools along with my co-country Thinking Schools Ethiopia trainer Atsede Tsehayou. 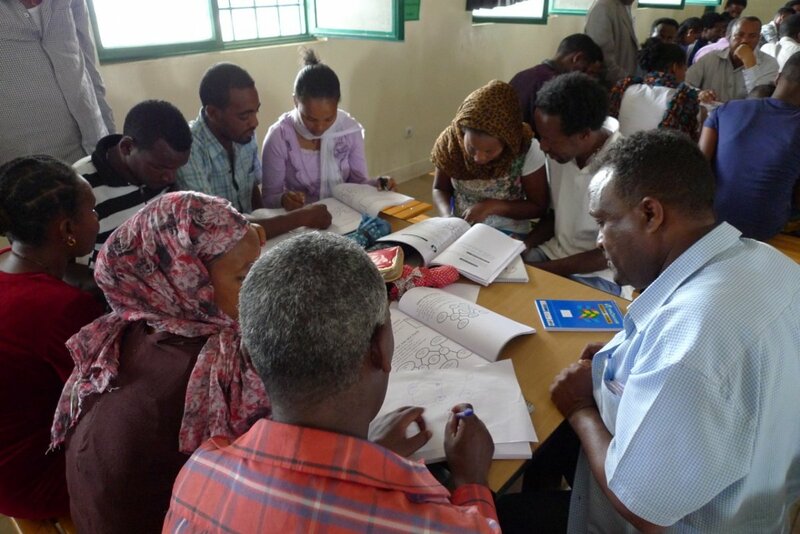 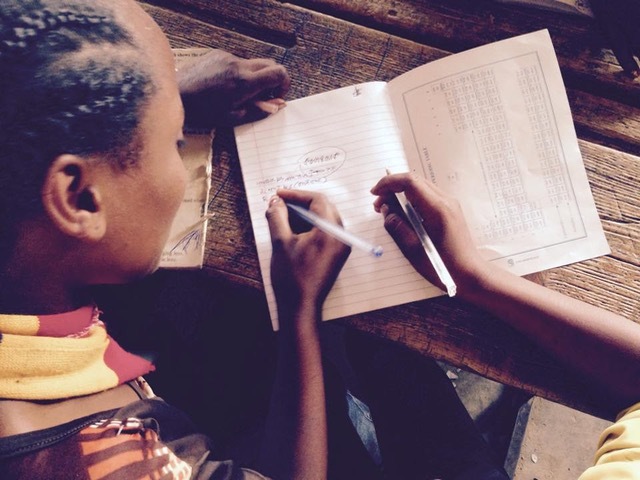 A total number of 28 teachers teach at Menkere Primary School with a focus on the continual training of the use of Thinking Maps in the classrooms. 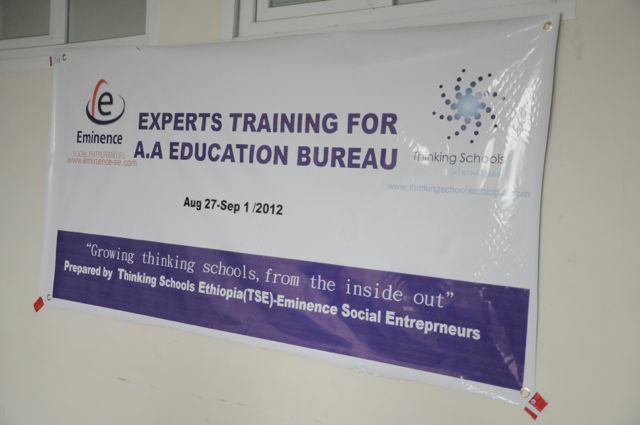 We saw the need to do a brief professional development training for the educators. 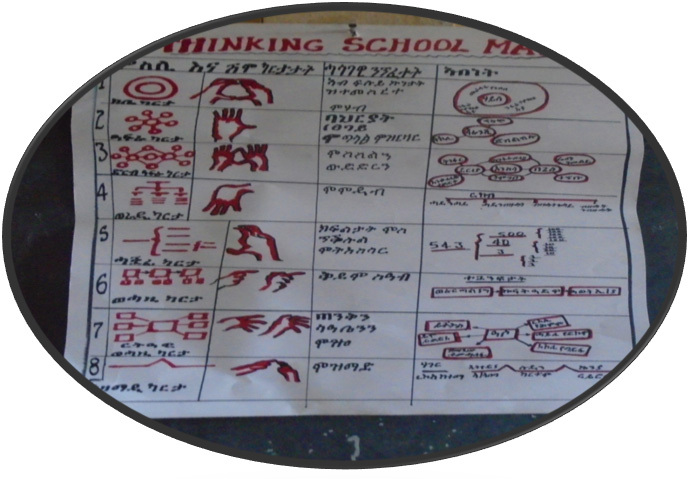 Brief review of the principles of the Thinking Schools Ethiopia (TSE) model was followed by discussion on research basis of Visual Tools (Thinking Maps). 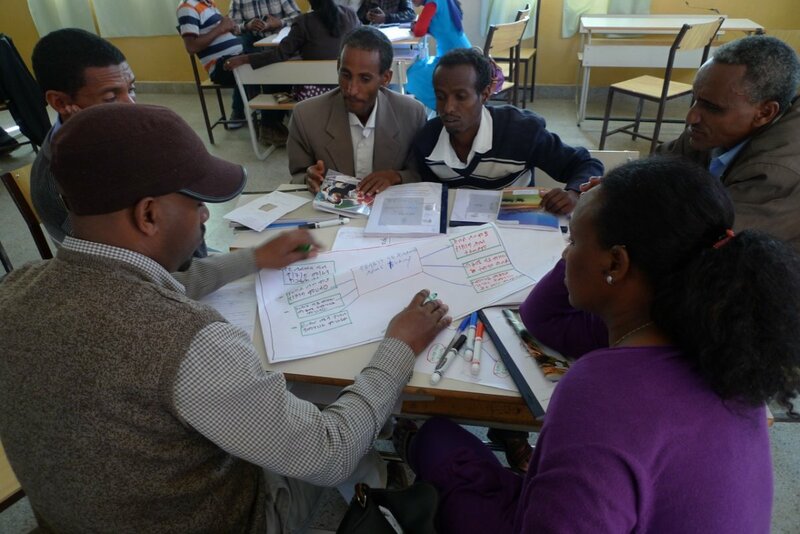 Atsede modelled collegial coaching with the teachers. 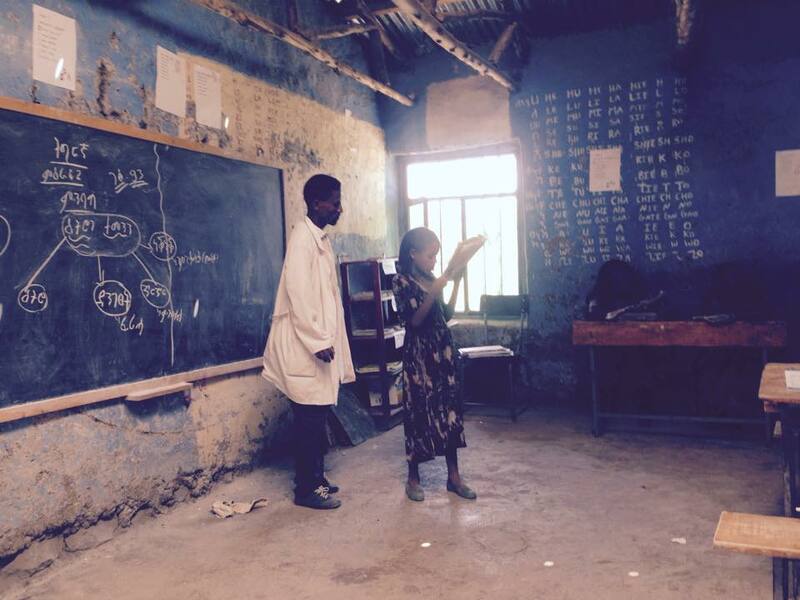 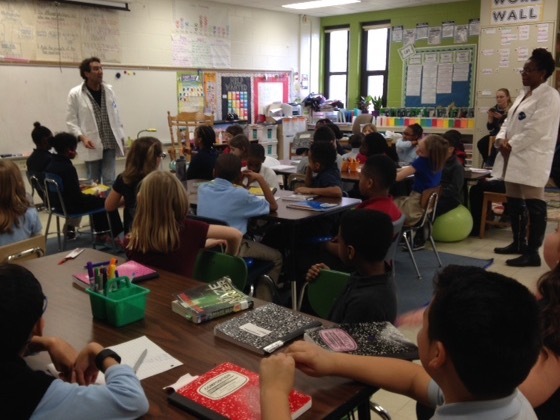 This model has teachers observing a short lesson by a peer teacher. 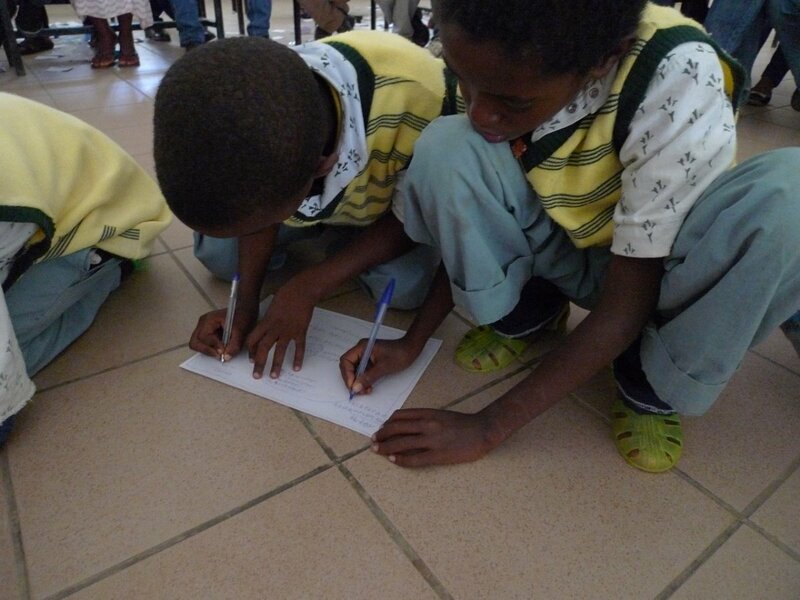 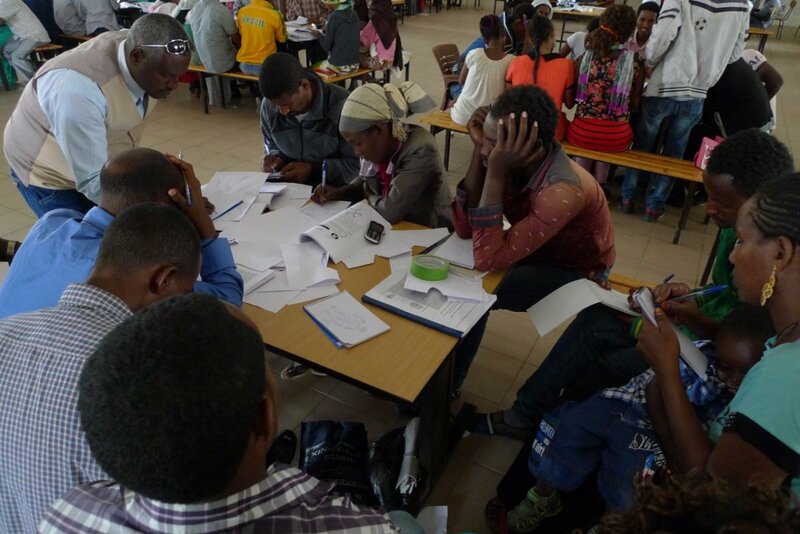 They observe positive aspects of the lesson and also write down questions to share at the debriefing. 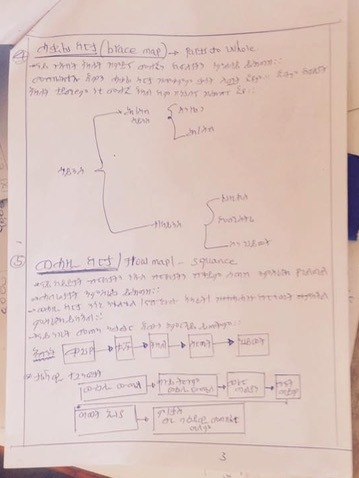 Atsede shared the plan of her demo lesson (sequence of the lesson). 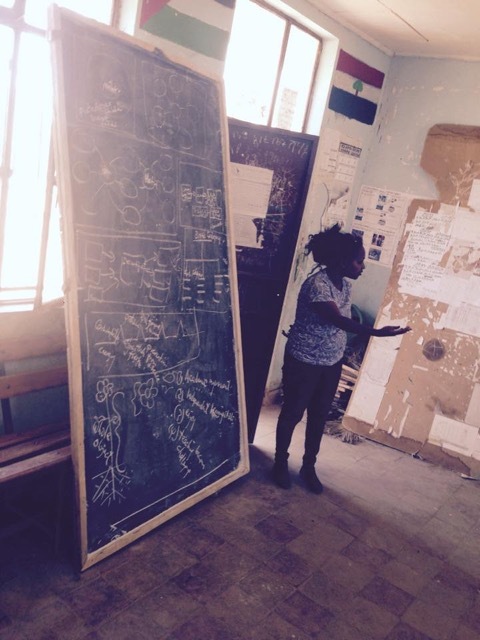 She followed the briefing by doing her demo lesson before all the educators. 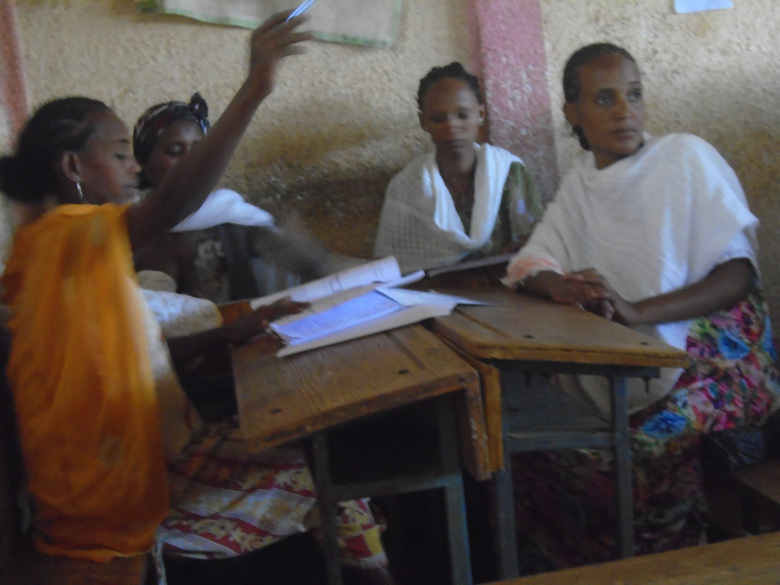 She then facilitated a debriefing after the demo lesson where teachers shared their positive observations and questions. 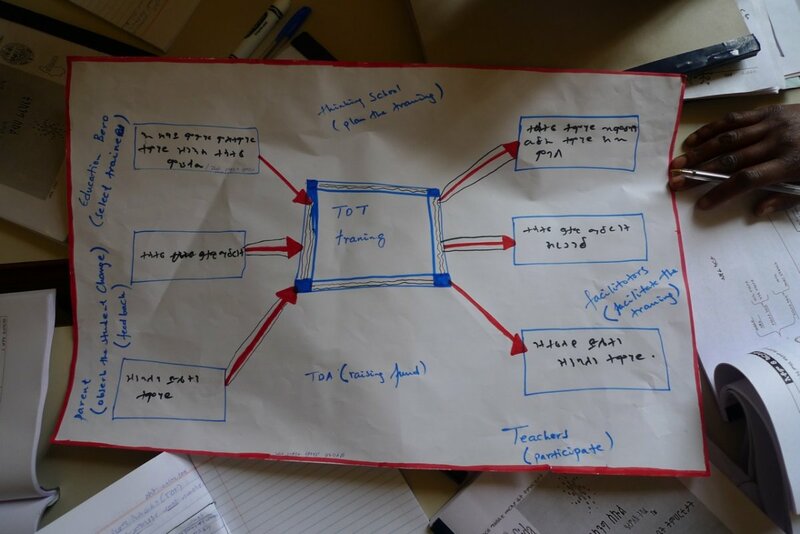 The urgency with which Thinking Maps need to be transferred to students. 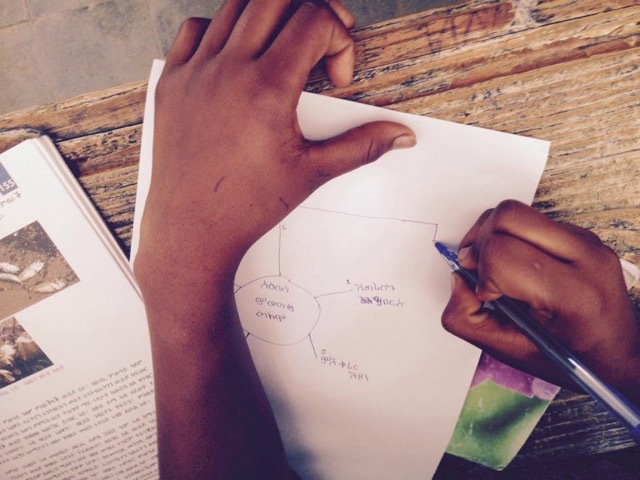 Facilitate conditions for students so as to support them using Thinking Maps creatively in their classroom assignments, home works, and with projects. 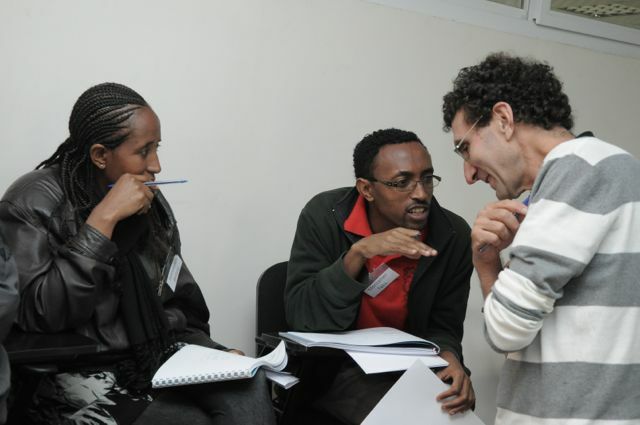 learn from each other experimenting demo lessons and refining practices . 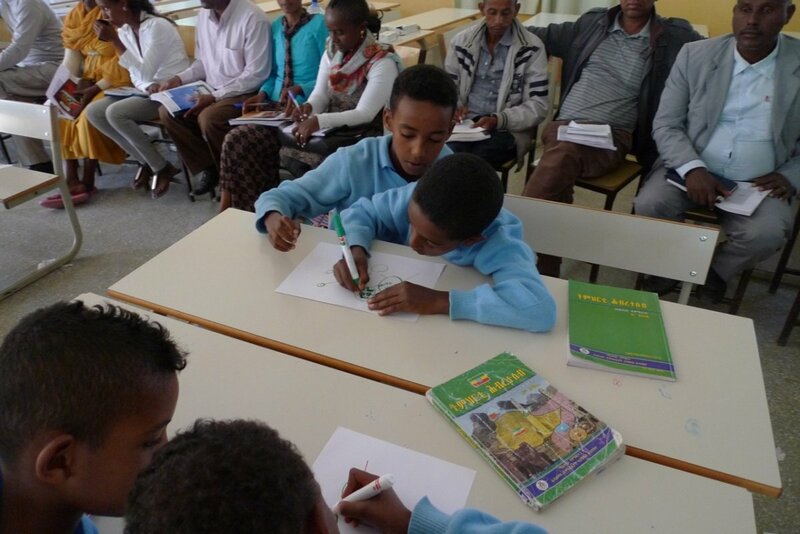 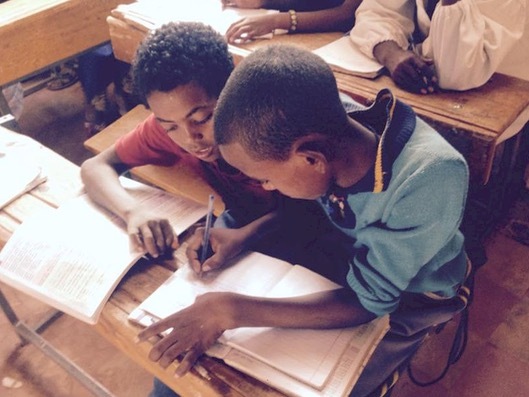 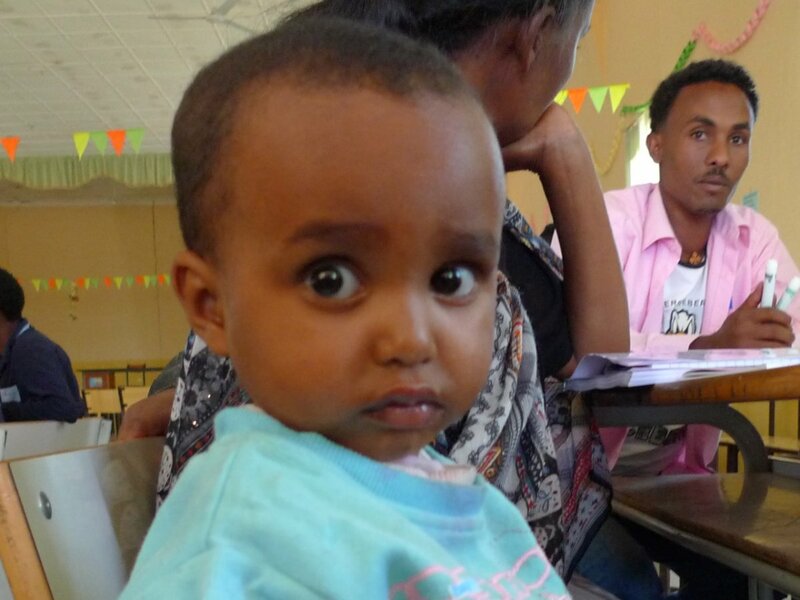 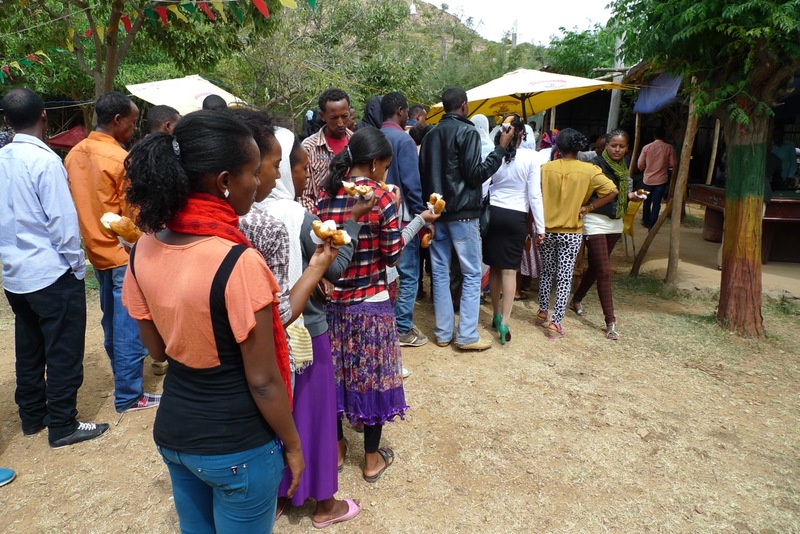 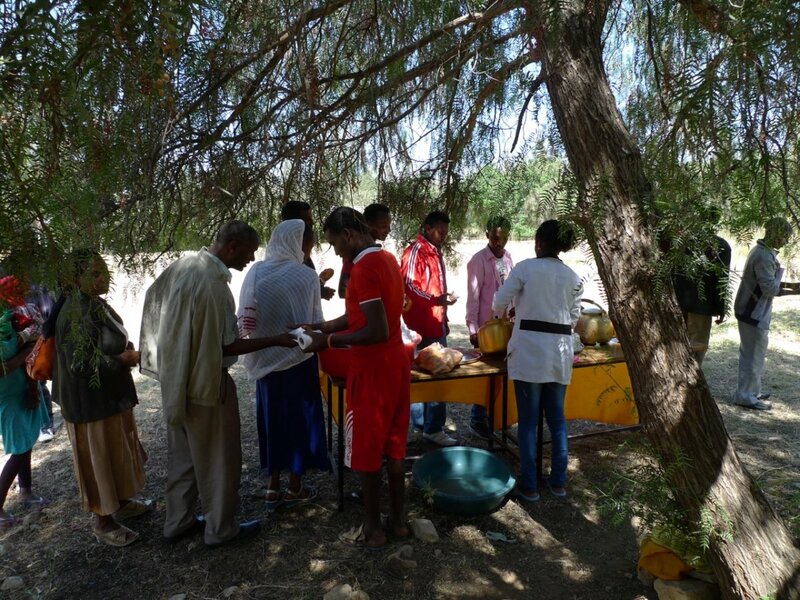 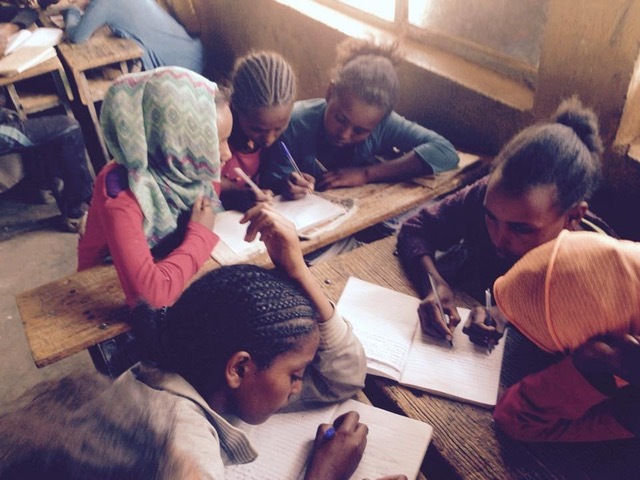 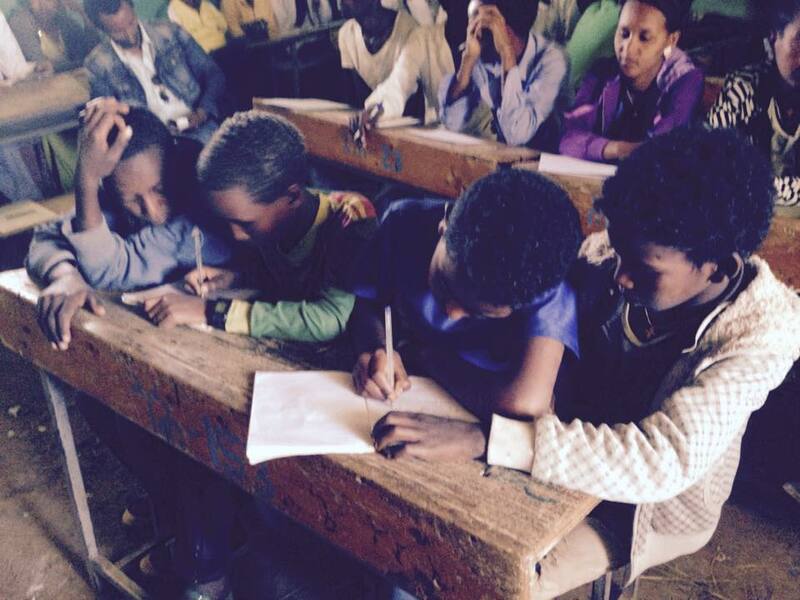 The Thinking Schools Ethiopia project in Tigray is a collaboration with Tigray Development Association (TDA) and Thinking Foundation supported by funding administered by Initiative Africa and granted by Sida (Swedish Development Agency). 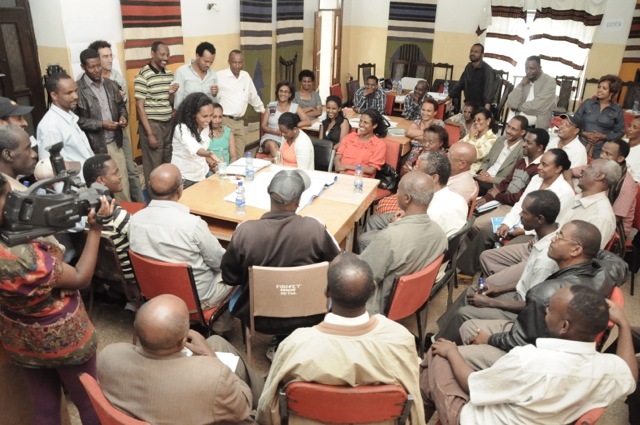 Read more at the Tigray Development Association website, Initiative Africa website and Thinking Foundation website. 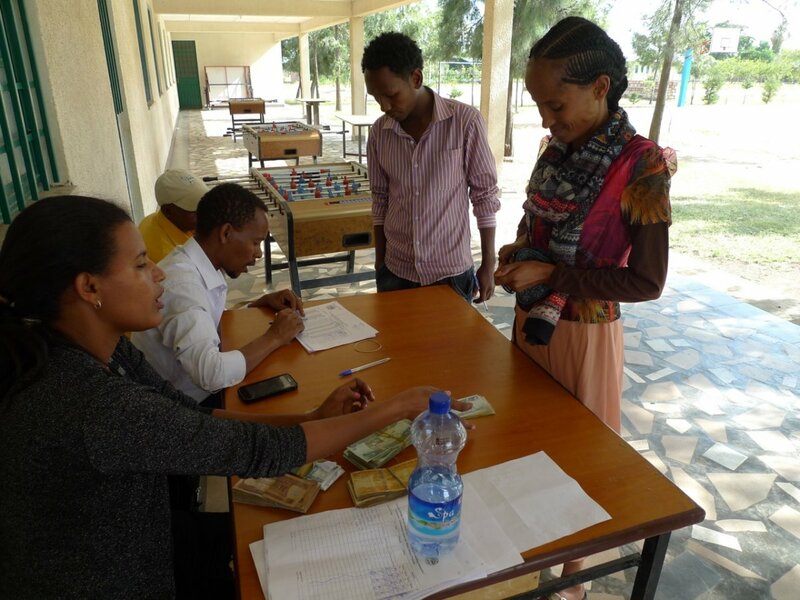 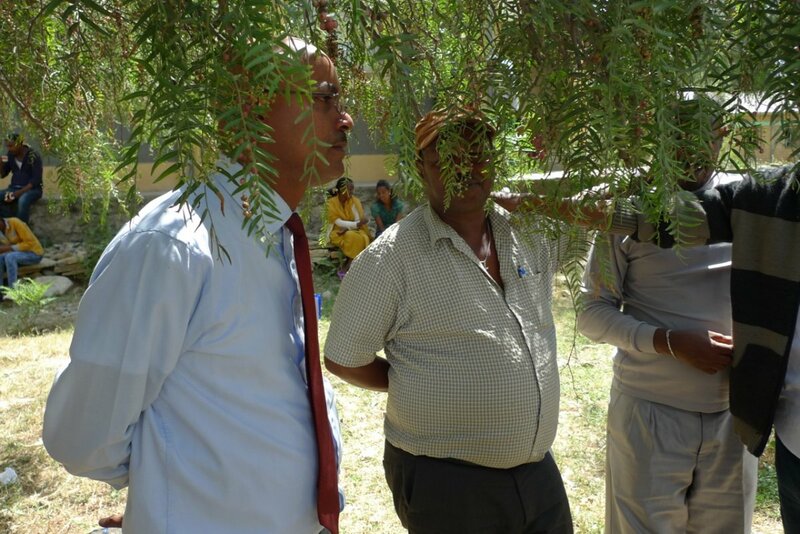 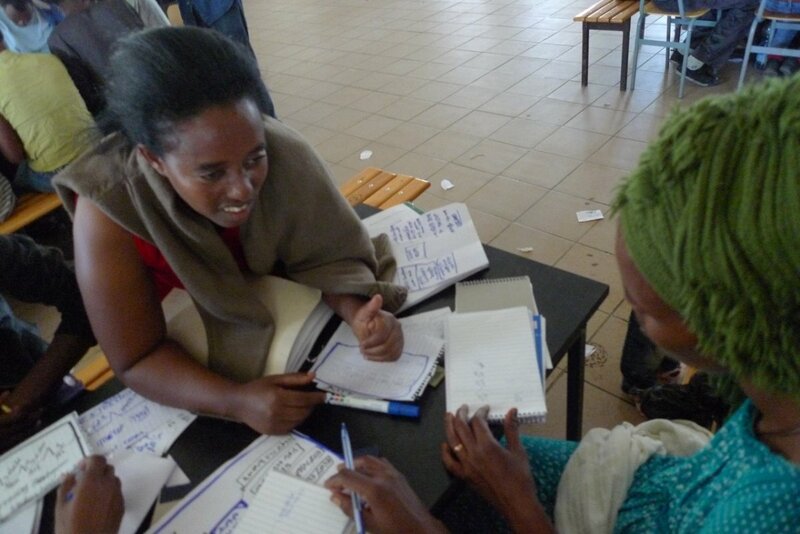 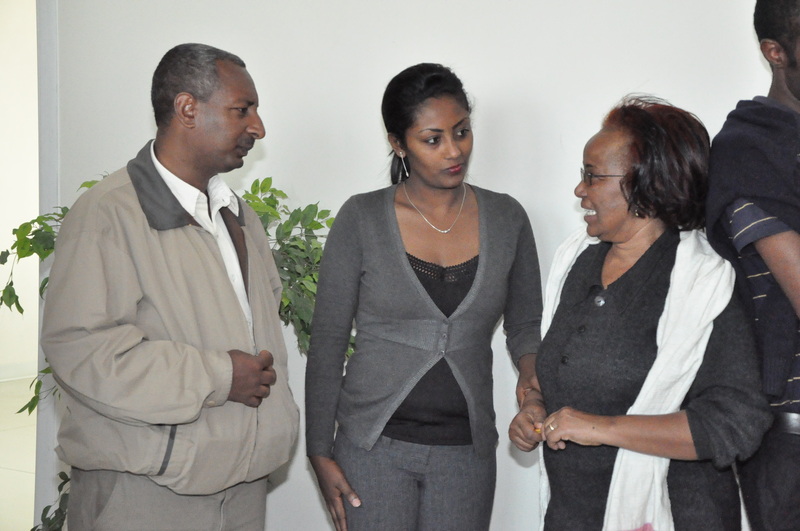 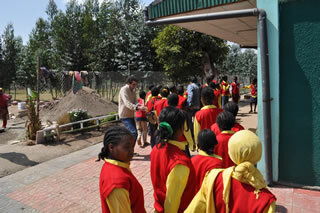 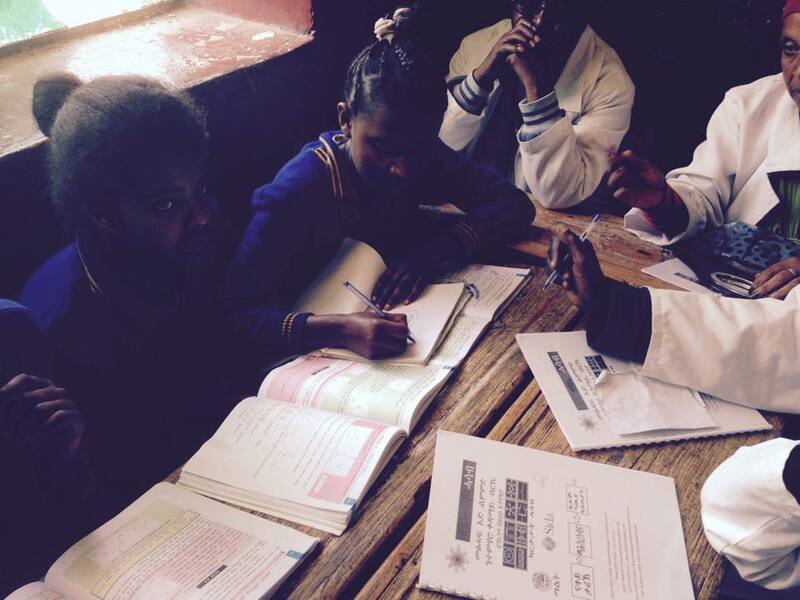 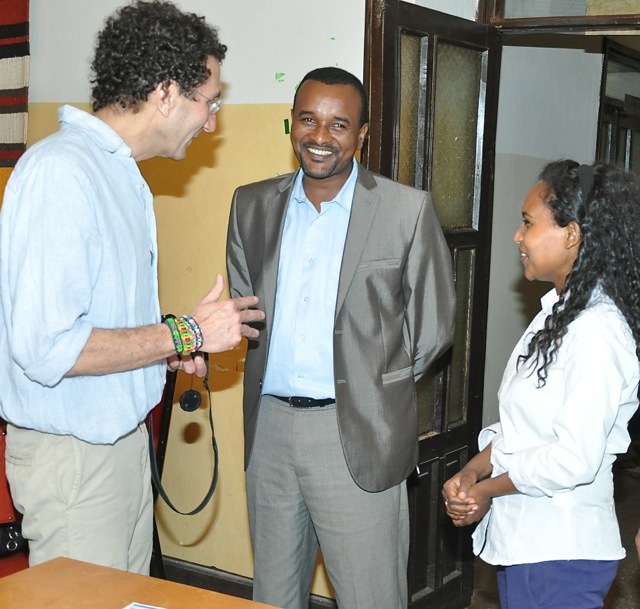 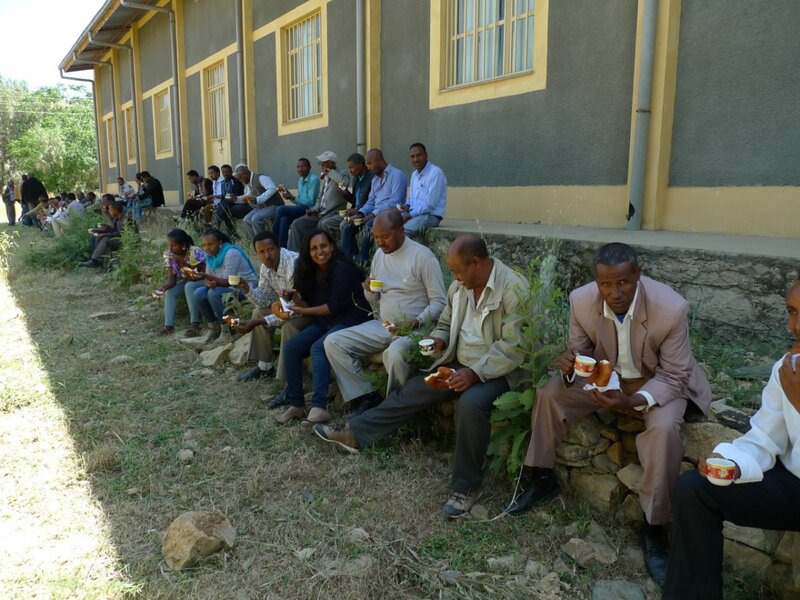 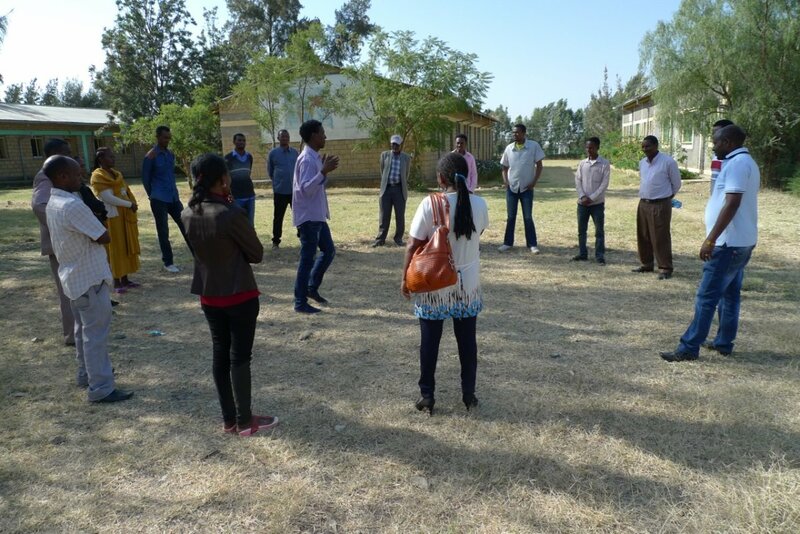 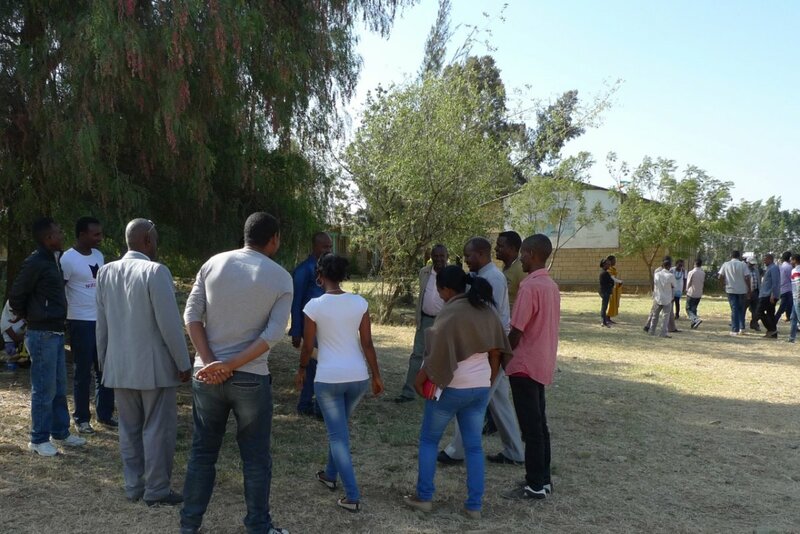 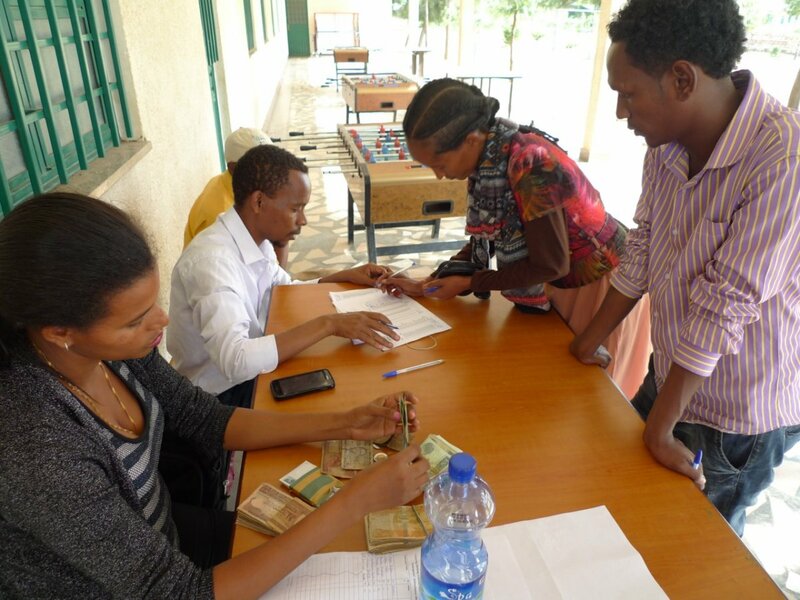 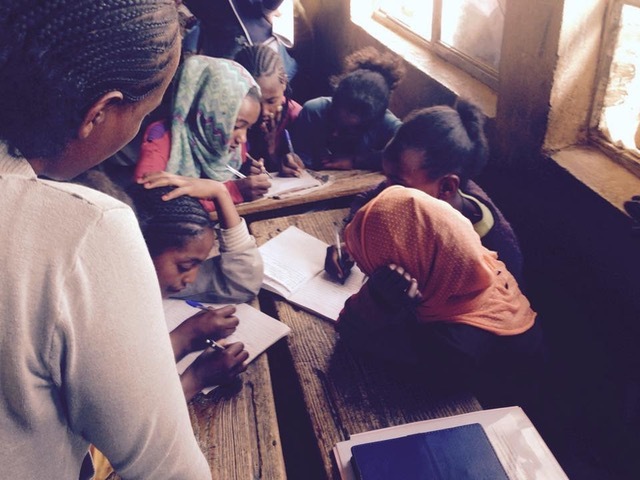 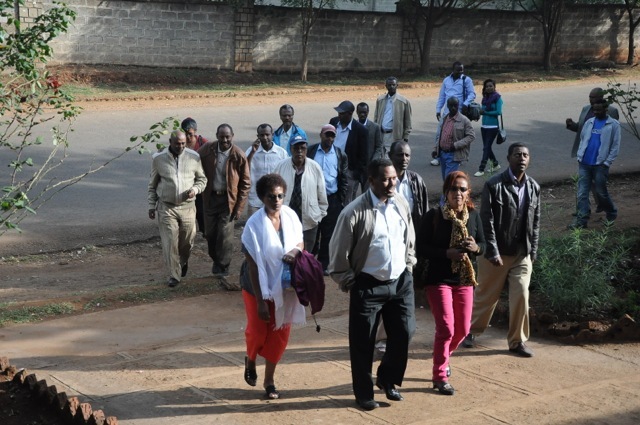 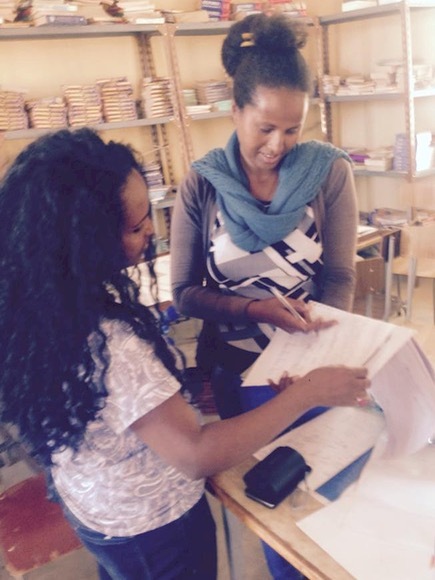 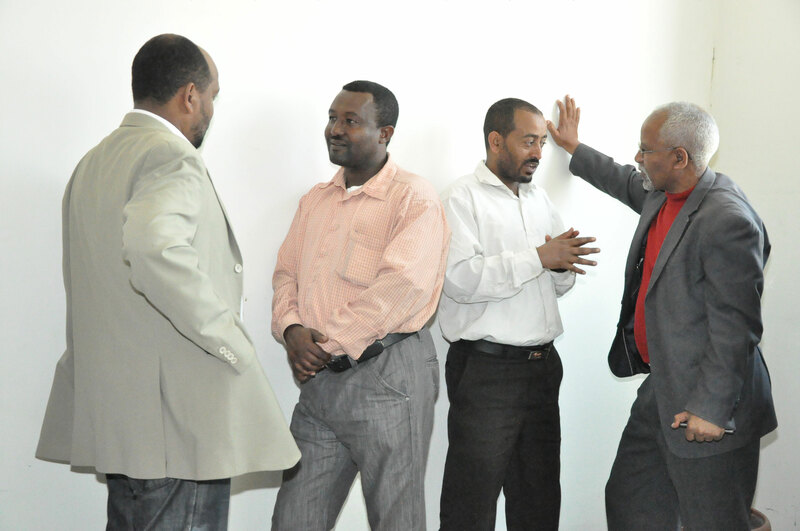 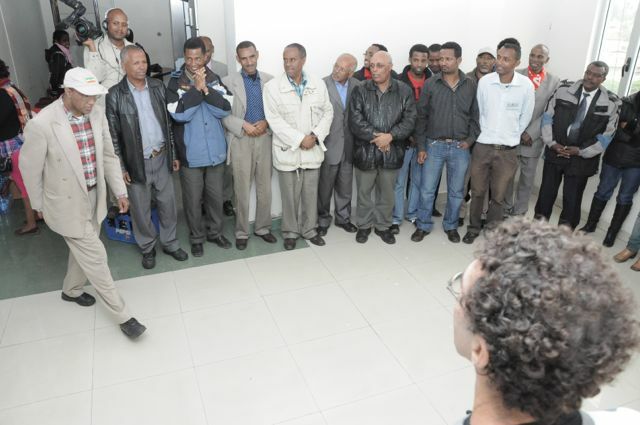 Hayelom Elementary School was paid a site visit by Thinking Schools Ethiopia (TSE) trainers. 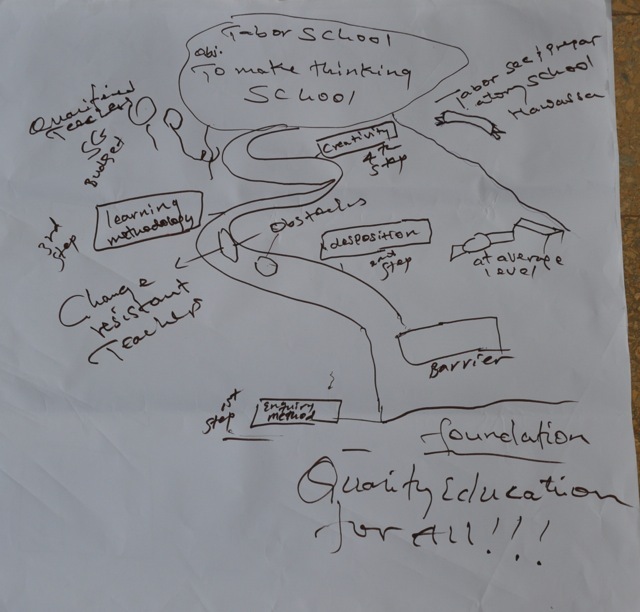 The site visits was aimed to support whole school implantation of thinking maps for facilitating students thinking and learning in all the subjects taught . 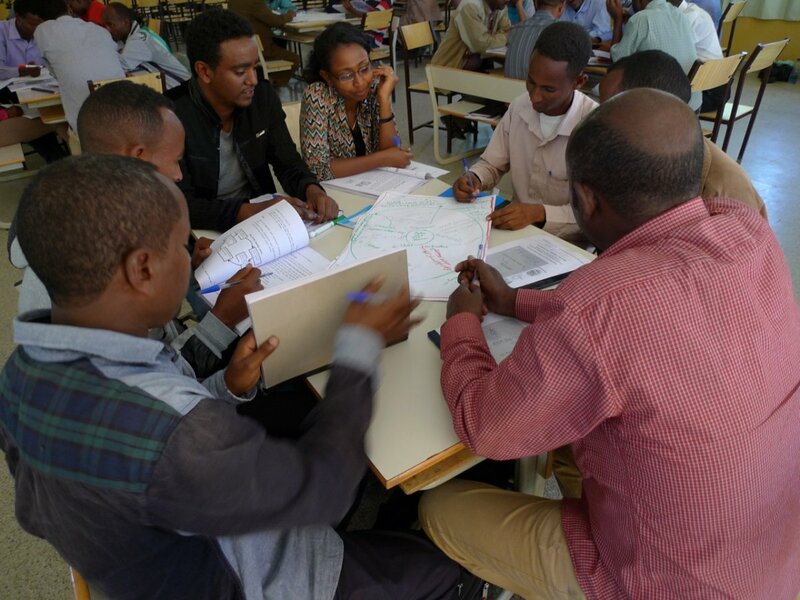 The site visit began with professional development (morning session in which the TSE model was reviewed and a refreshment training on thinking maps was conducted). 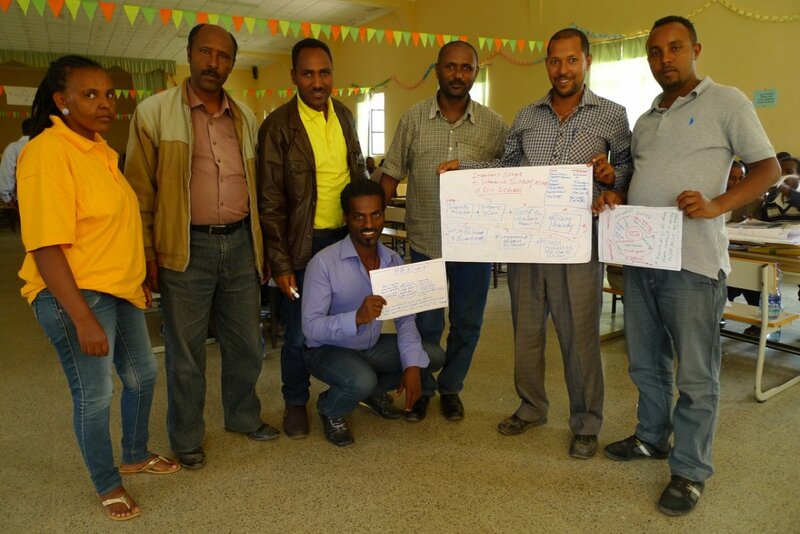 TSE trainers appreciated and were encouraged by the collaborative spirits, the level of seriousness and purposefulness with which the teachers were engaged, and their reflectiveness and feedback on the training. 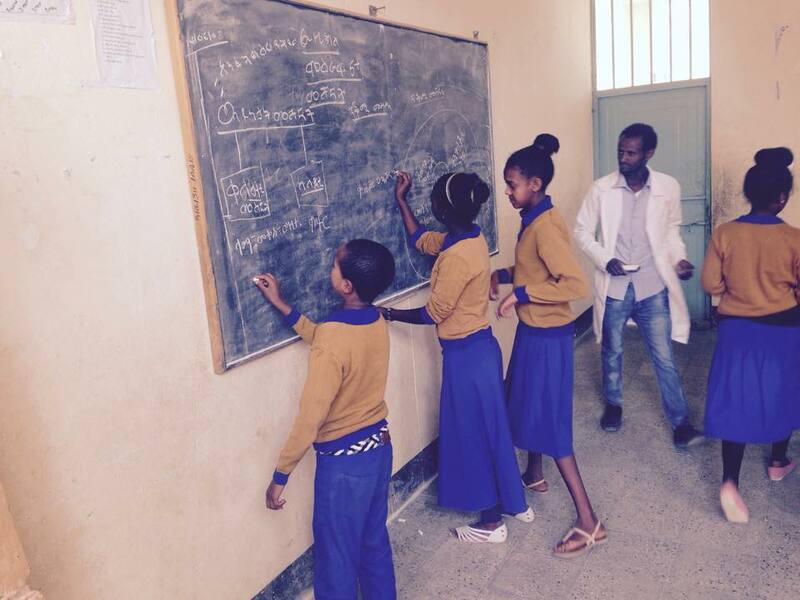 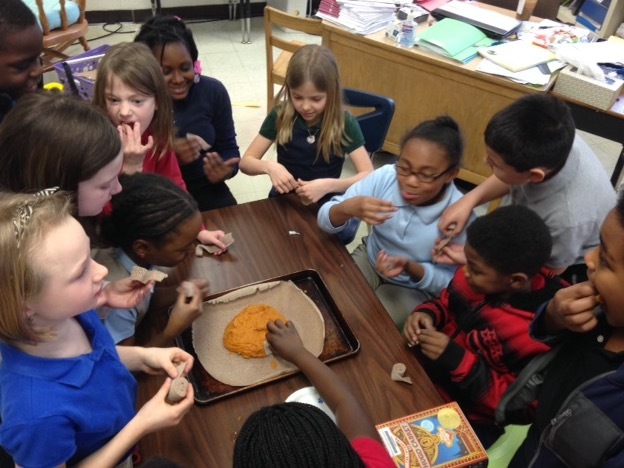 Hayelom Elementary School is one of the 37 laboratory schools TSE is providing support for. 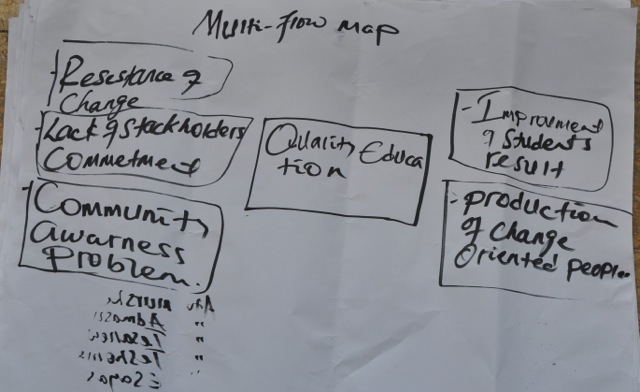 The teachers have been using the maps and now intensifying its use in class rooms with flexibility and creativity for sharing experience of model of excellence with the other schools in the project. 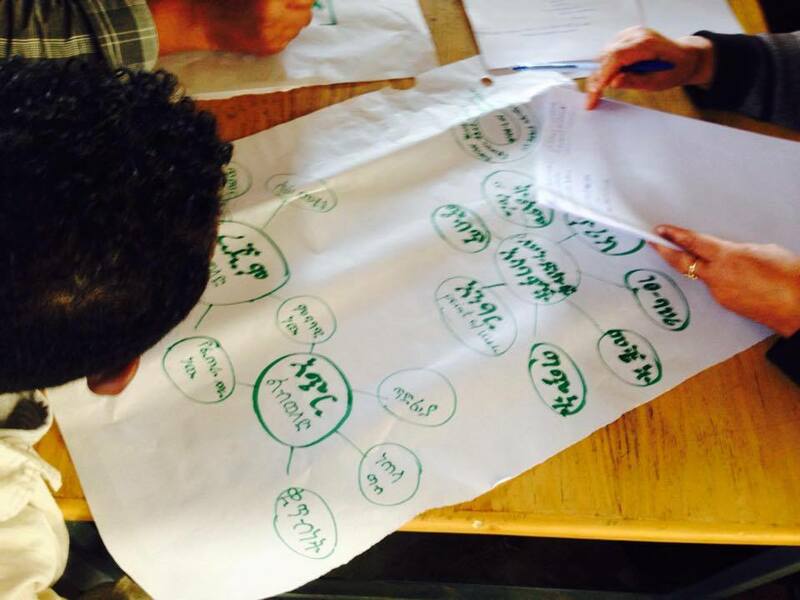 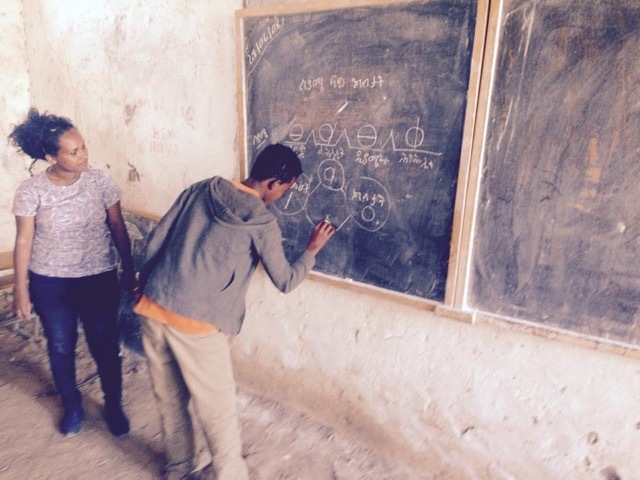 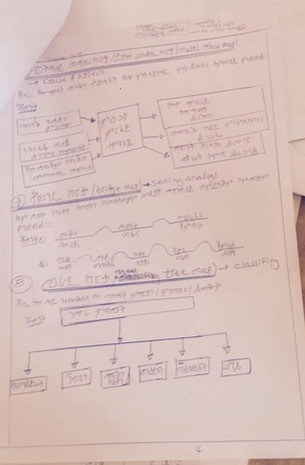 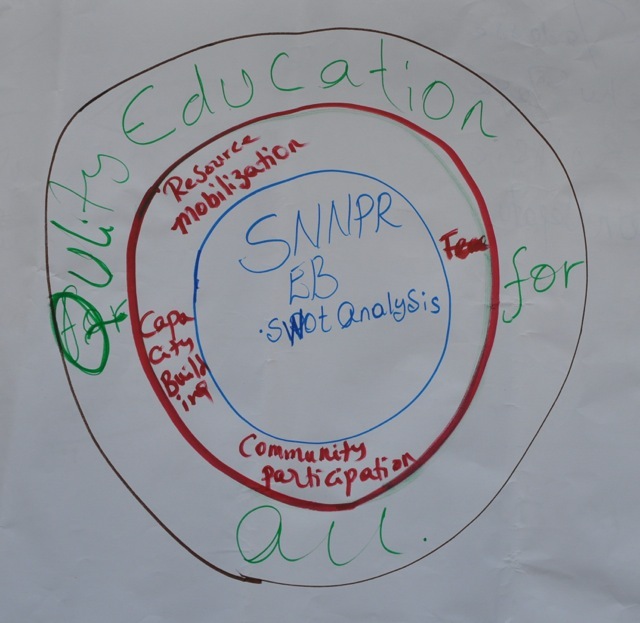 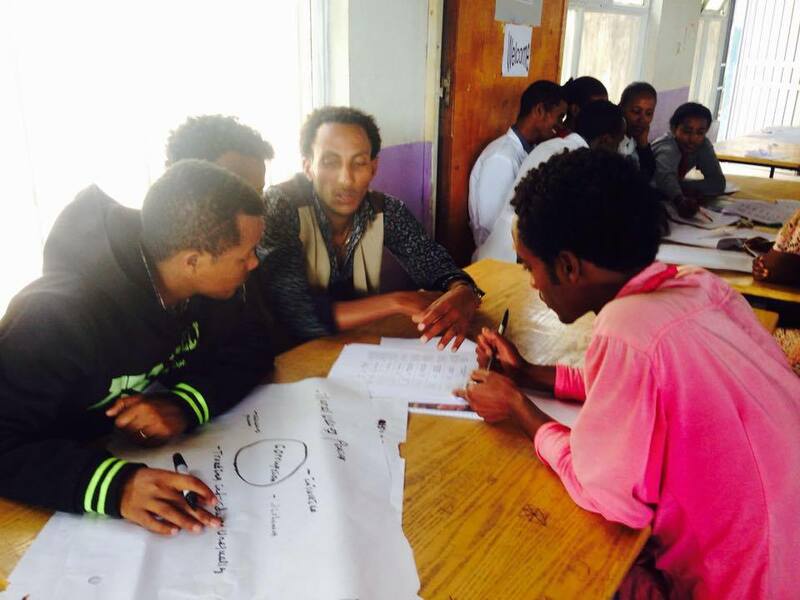 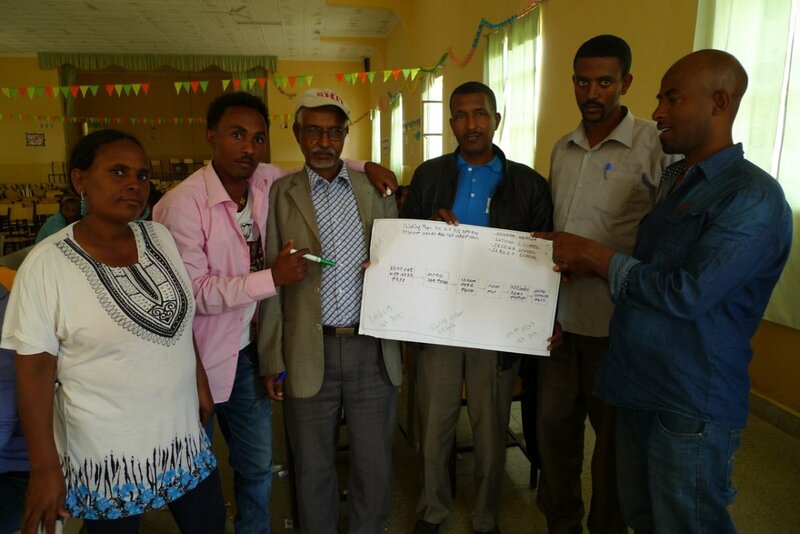 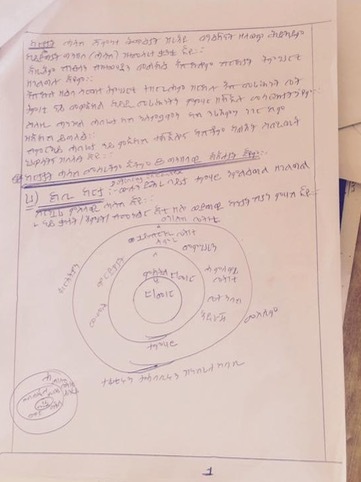 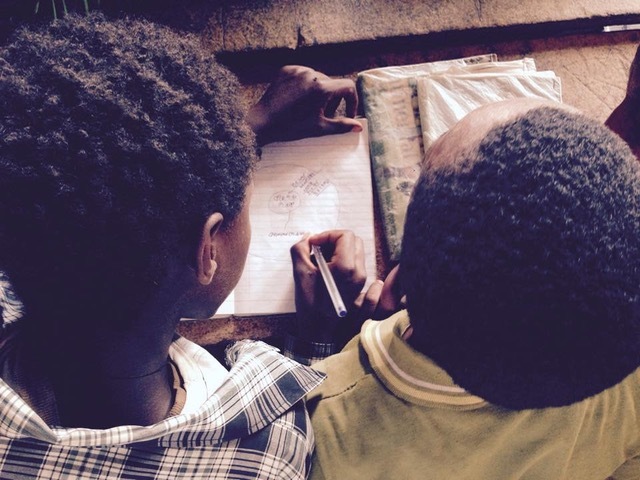 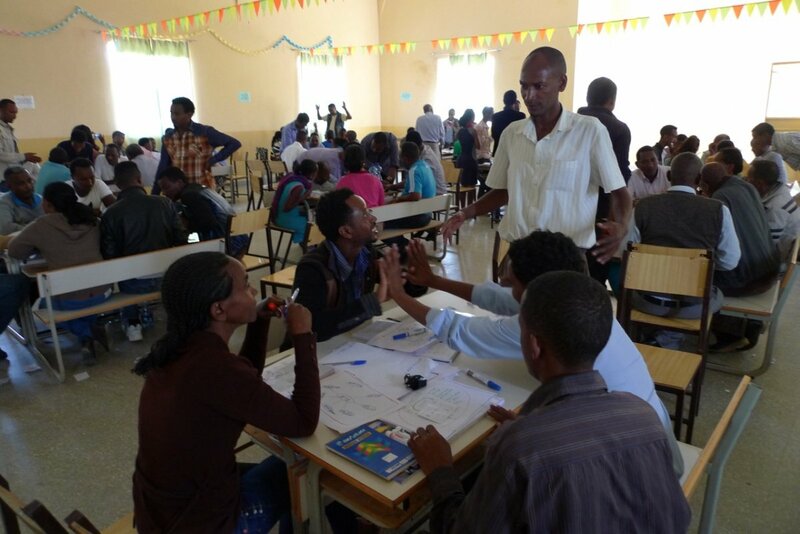 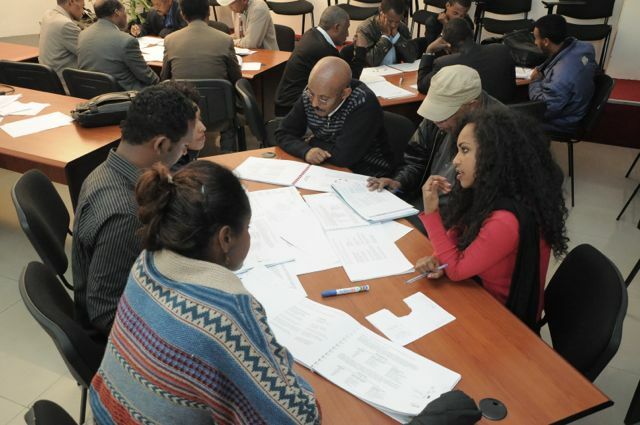 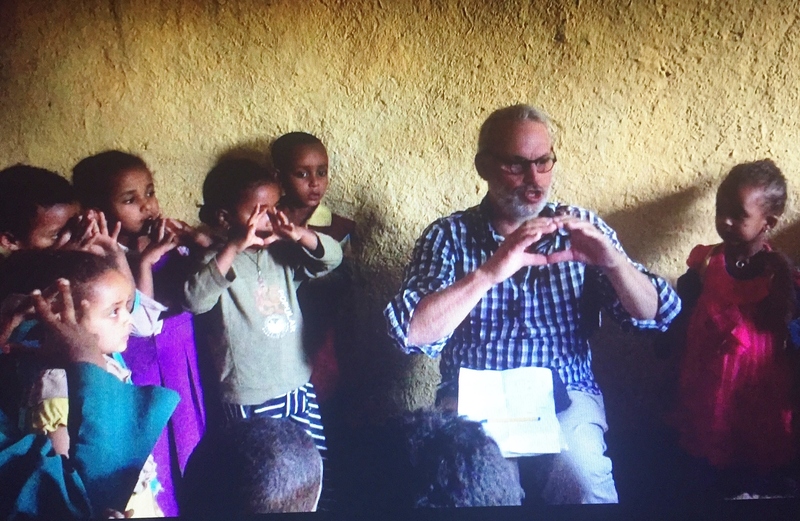 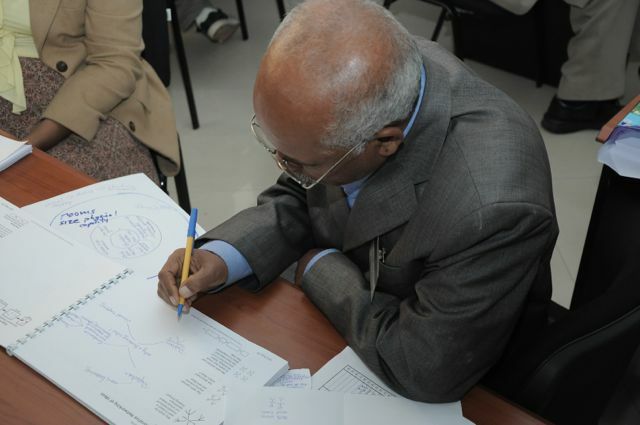 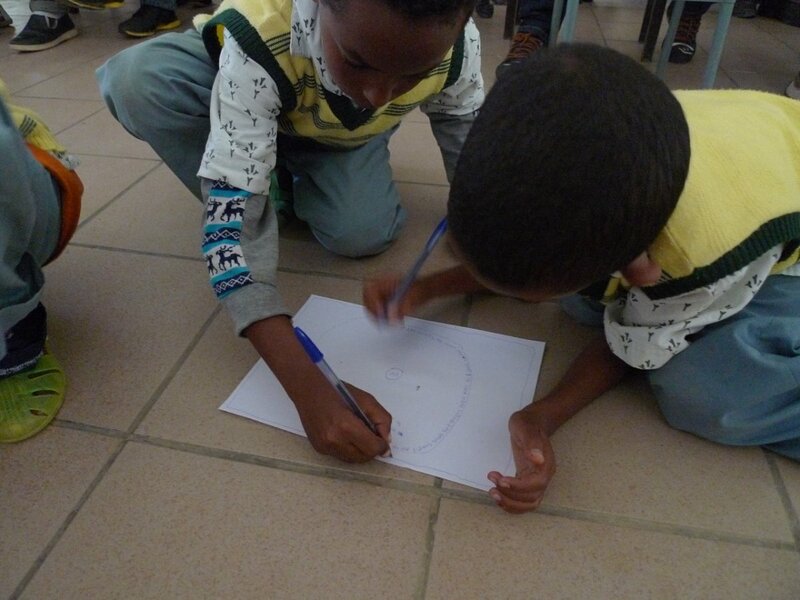 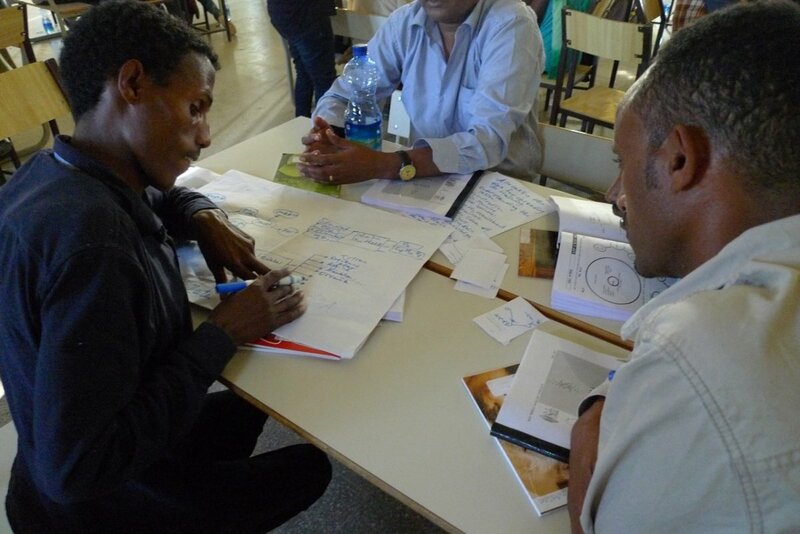 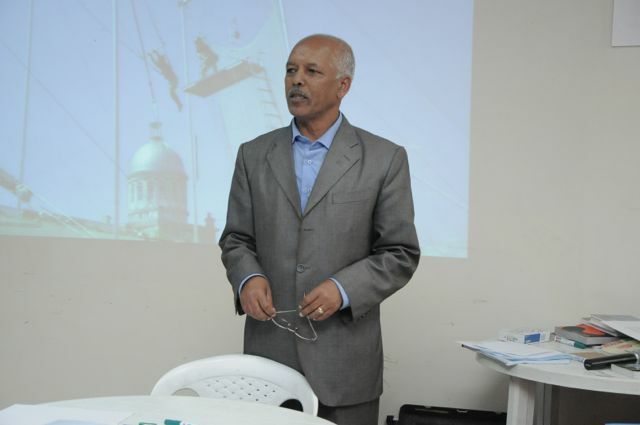 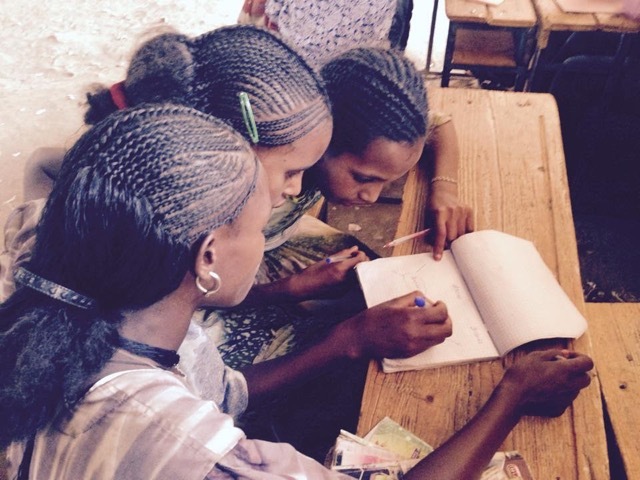 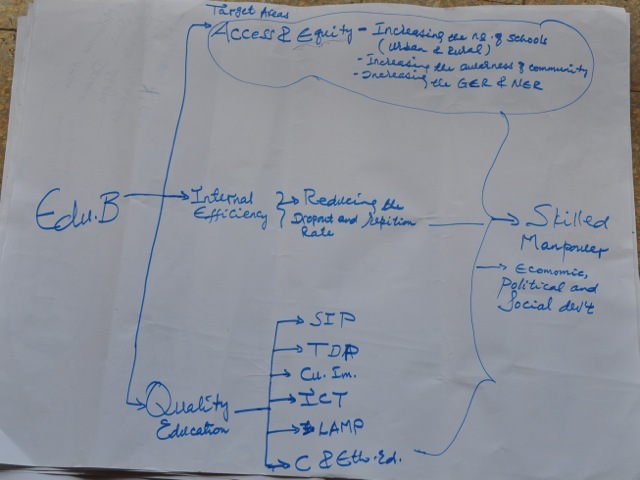 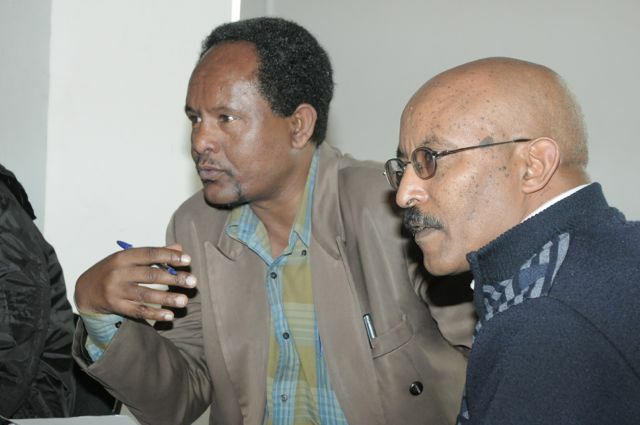 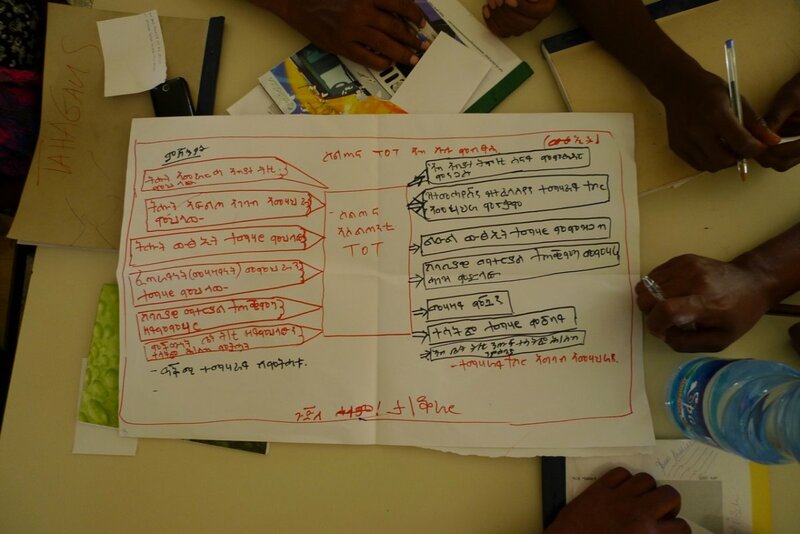 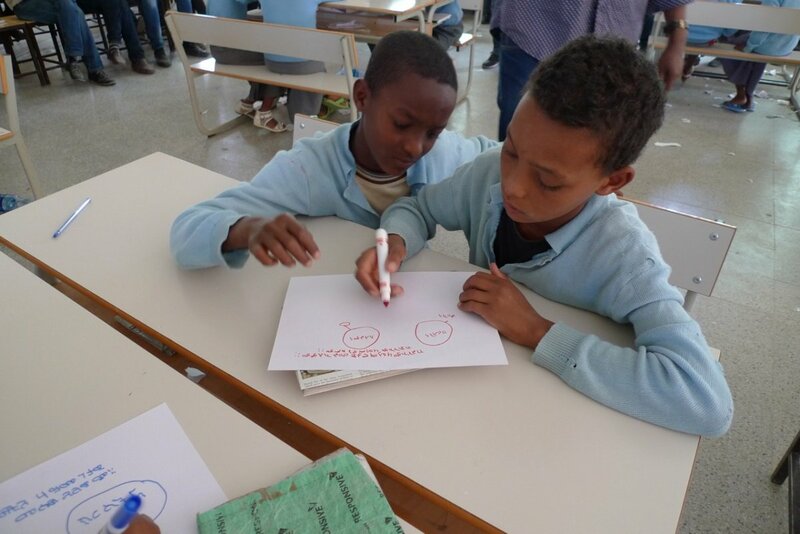 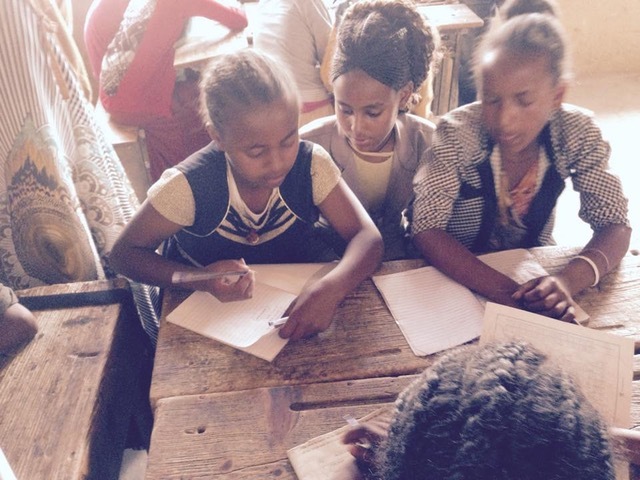 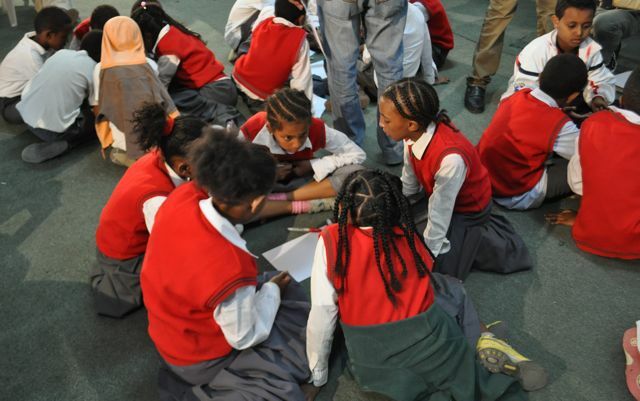 Thinking Schools Ethiopia—Thinking Schools Tigray began a third phase with ongoing scaffolding support for whole school systematic implementation of Thinking Schools pedagogy including Thinking Maps across all disciplines and at all grade levels. 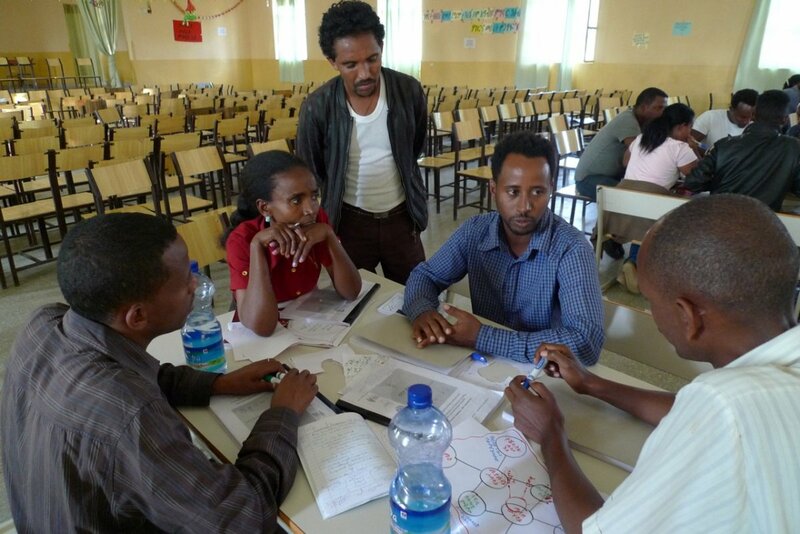 Thinking Schools Ethiopia – Tigray is a collaboration of Tigray Development Association and Thinking Foundation for 37 model schools in 12 Woredas located in all 7 zonal administrations with funding administered by Initiative Africa for a Girl’s Empowerment Whole School Change grant from Sida (Swedish Development Agency) that began as a grass roots project by Robert Seth Price along with lead country trainers Atsede Tsehayou and Dagim Melese. 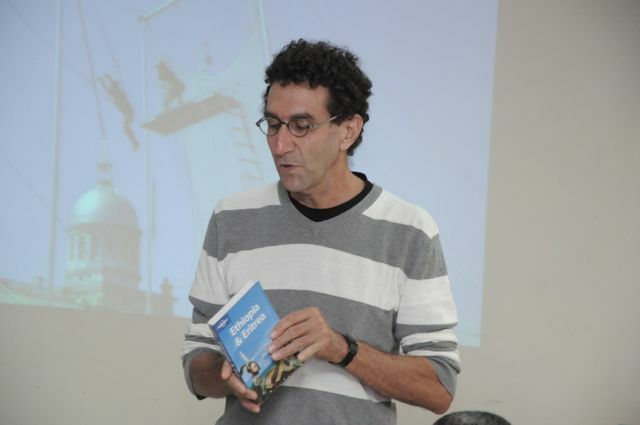 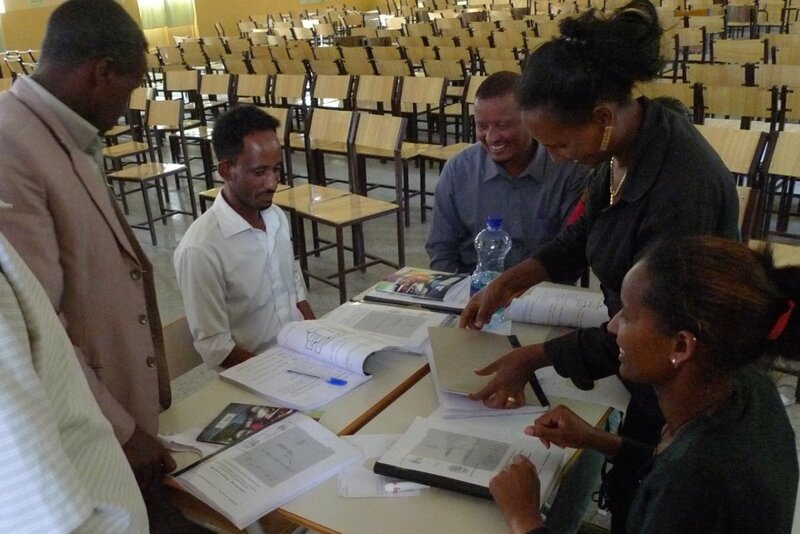 Read the chapter on Ethiopia in the Corwin Press book Pathways to Thinking Schools. 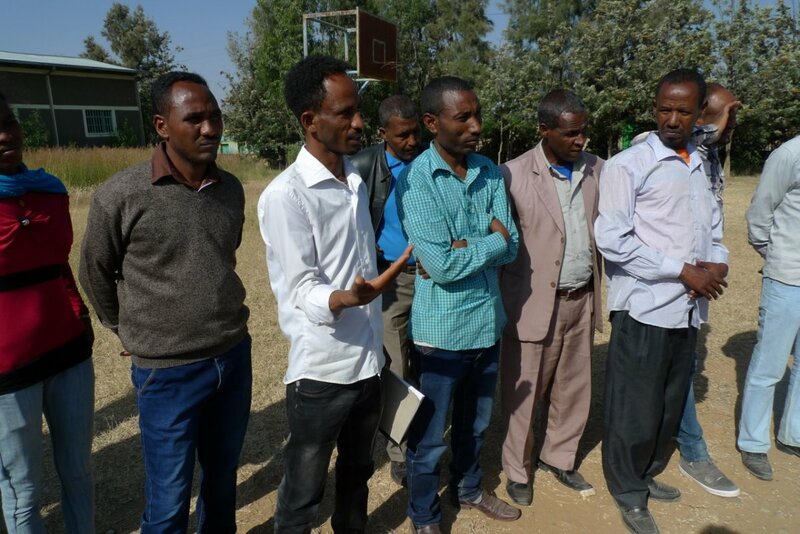 The scaffolding support began being provided to Kalamino Special High school located in the regional capital – Mekelle. 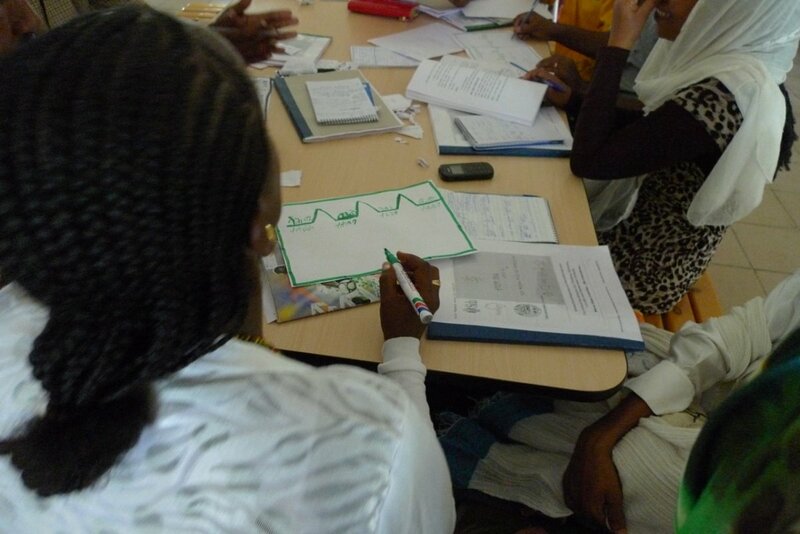 On site school support includes collegial coaching, brief refreshment / reinforcement training and class room demonstration of lessons modeling the actual use of Thinking Maps in real class rooms with students employing other interrelated pedagogical techniques and tools. 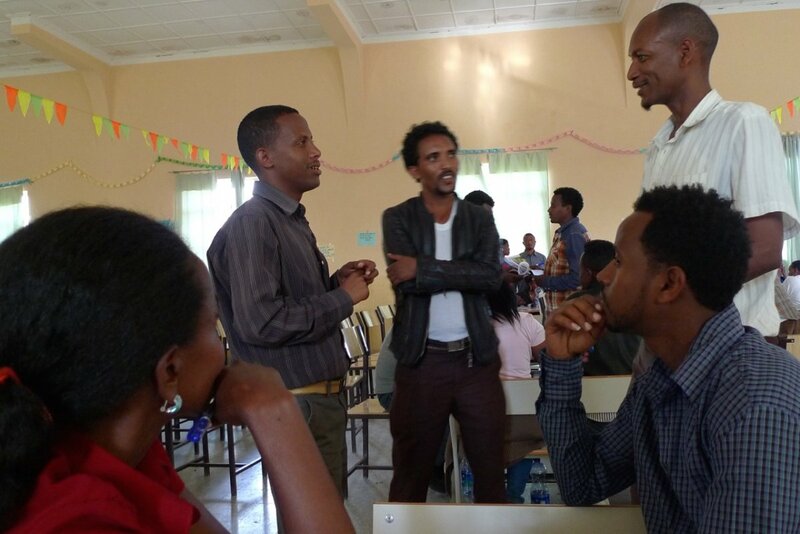 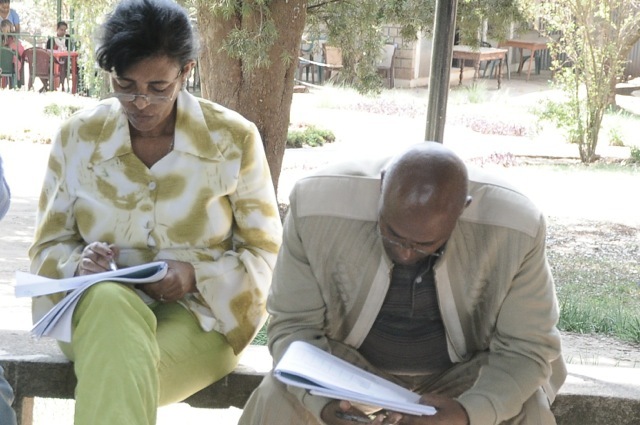 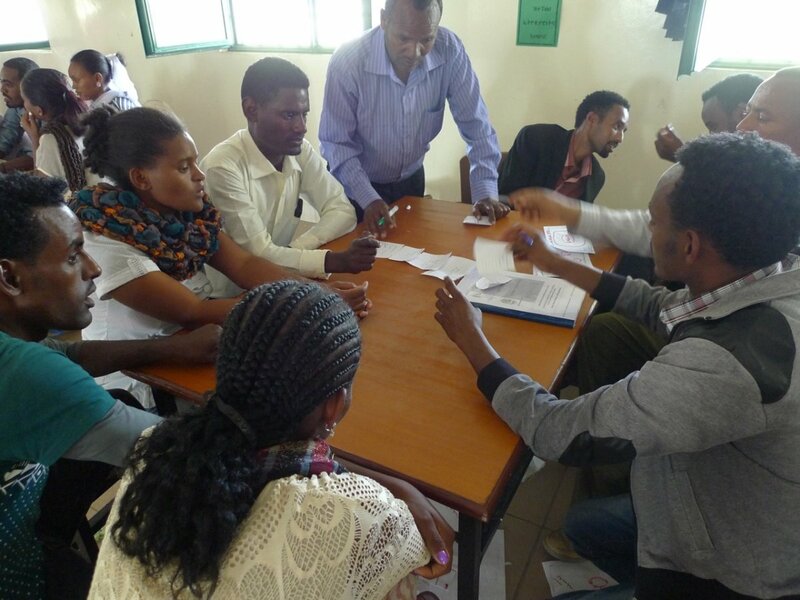 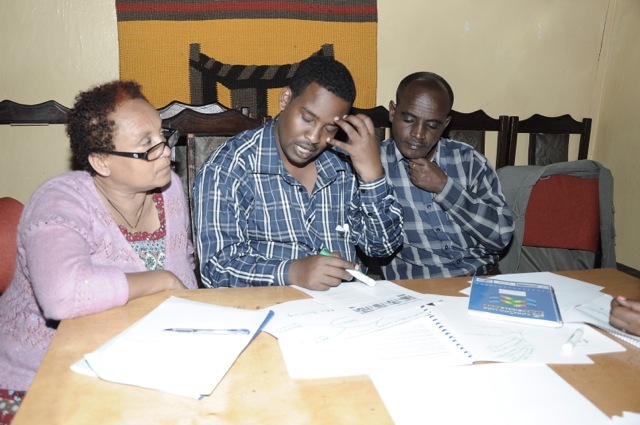 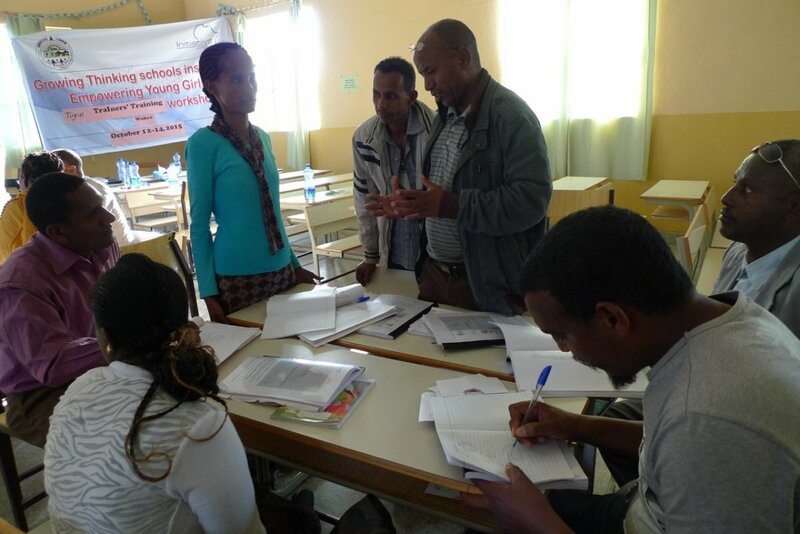 Thinking Schools Ethiopia (TSE) trainers (Atsede and Dagim) began on Feb. 22, 2016 working with the educators of Kalamino High School for strengthening the whole school implementation of the maps and documentation of impacts on such dependent variables as student engagement, levels of independent learning skills, literacy and communication skills and others. 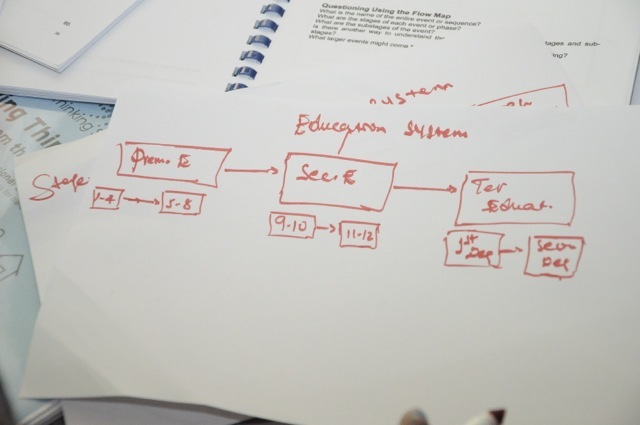 The on site schools support is believed to motivate and encourage intensive class room use of Thinking Maps and support better practices of student centred techniques / methods . 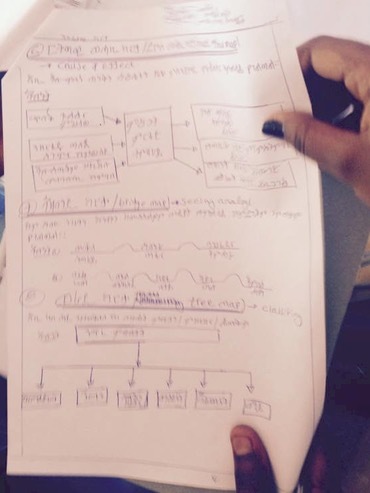 Following are photos taken of the site supports. 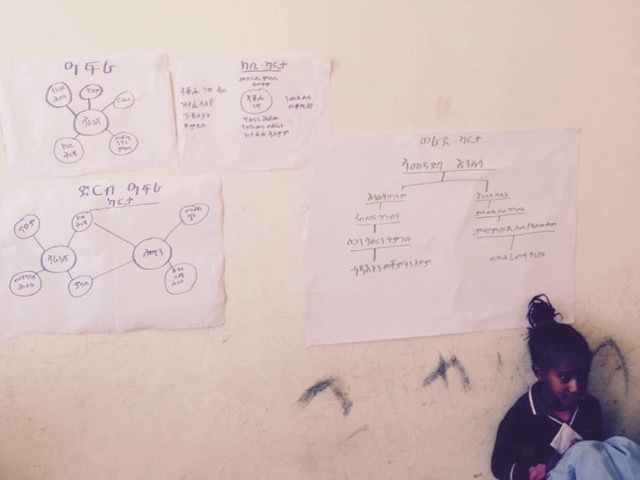 Site visit at Andishumdihun elementary school encouraged the school leader to employ a more systematic implementation of thinking maps by having them posted on walls of all class rooms for students to learn and get to know them . 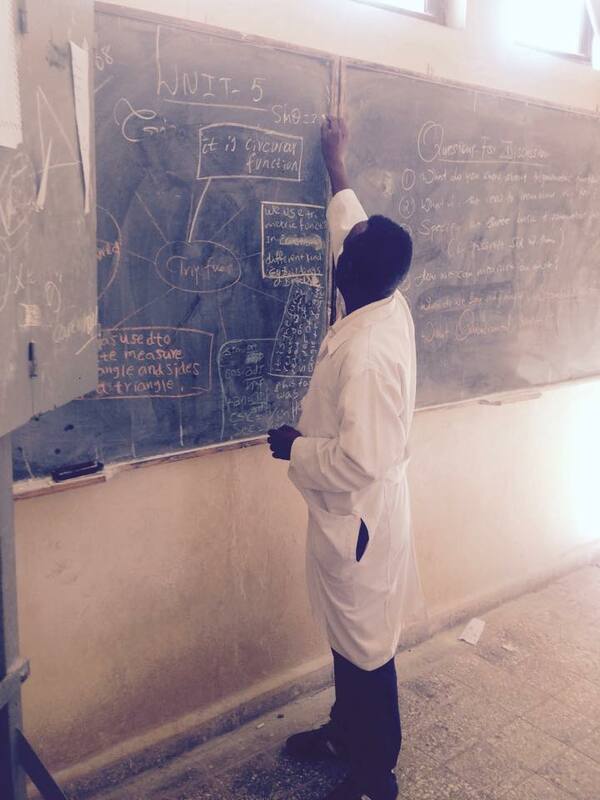 Some vibrant teachers at the school were part of the demonstration lesson done in a physics class room . 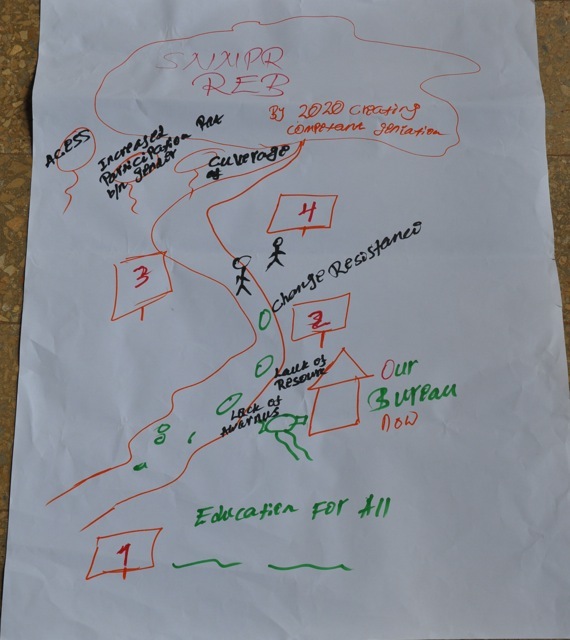 Taking a lead in terms of modelling the actual use of the maps in class rooms for supporting student centred learning . 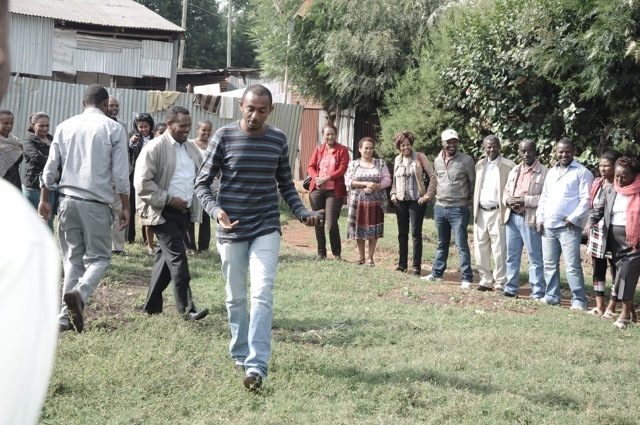 Below are some of the still pictures taken of the site visit. 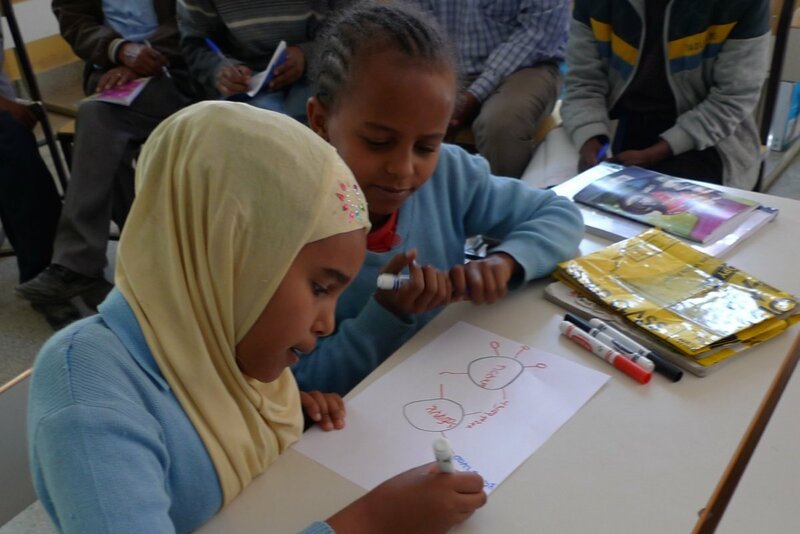 The photos and video show students of Meri Primary School using Thinking Maps to explore different topics (generating, discussing, clarifying, sharing perspectives on and organizing information and ideas) in a project that is aimed at summarizing contents (General Science) taught in a semester for 3rd Graders. 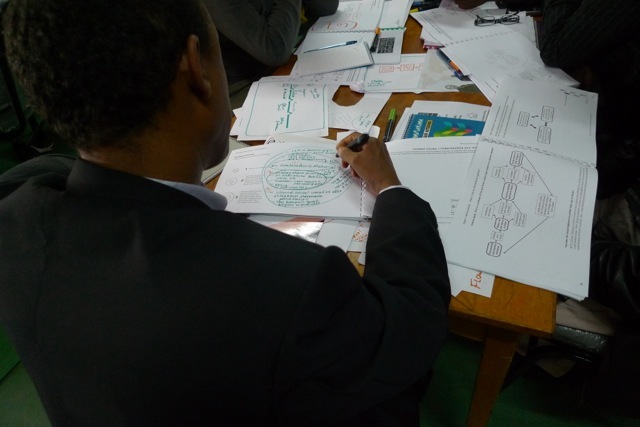 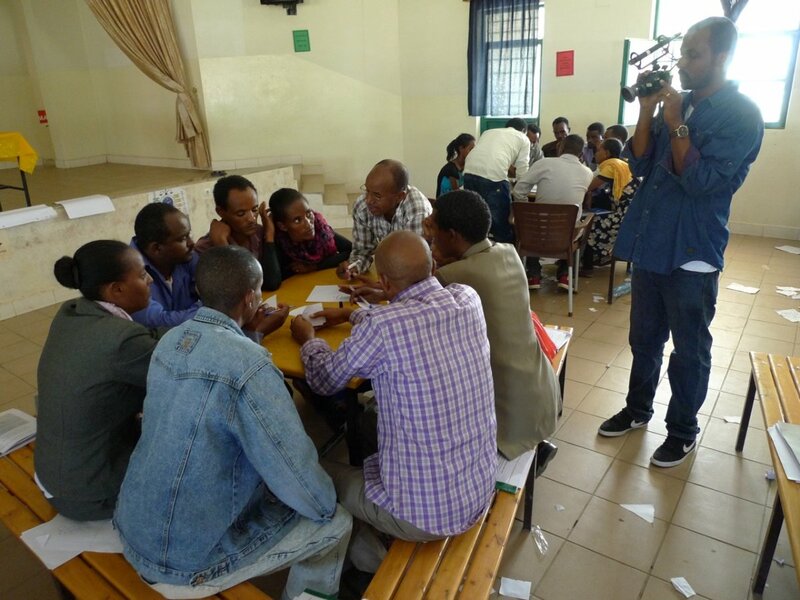 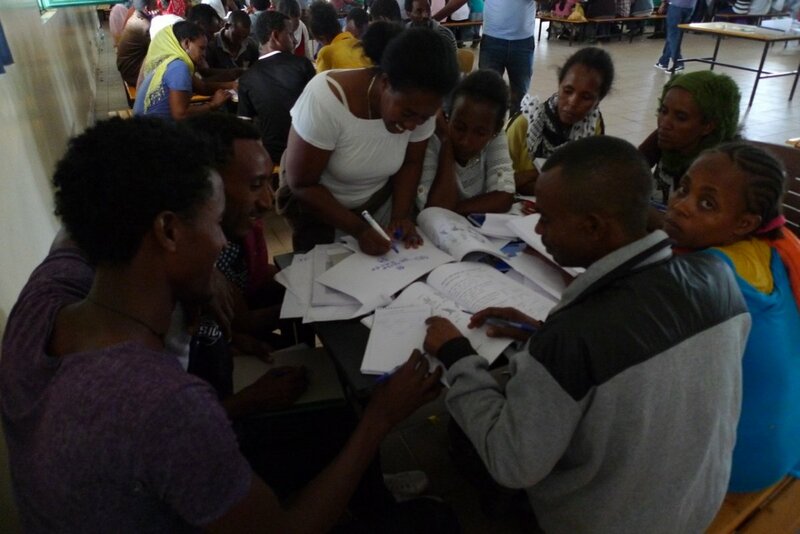 This happened after a daylong refreshment training facilitated on class room use of Thinking Maps as tools for supporting collaborative groups’ learning in actual class rooms of the Addis Ababa Education Bureau school system (300+ large schools). 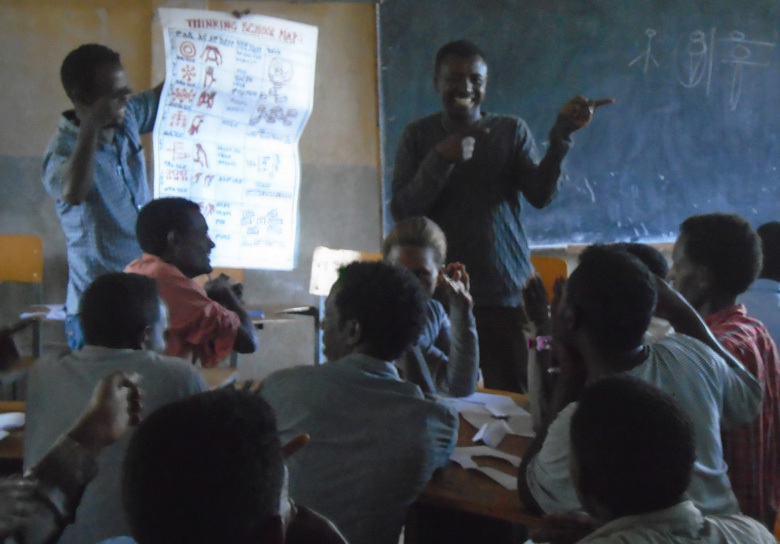 earning could be when it happens with lead students playing active roles facilitating the generation, discussion, elaboration, and organization of information and ideas. 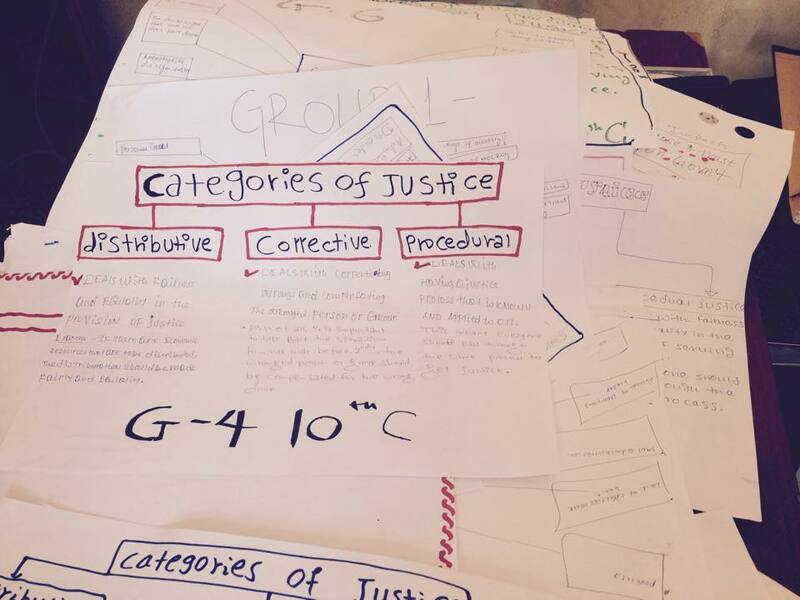 Such a model of collaborative learning groups is in accordance with the bureaus’ model of students centered 1:5 collaborative learning groups model in which a lead student facilitates, directs and takes care of the management of the groups work. 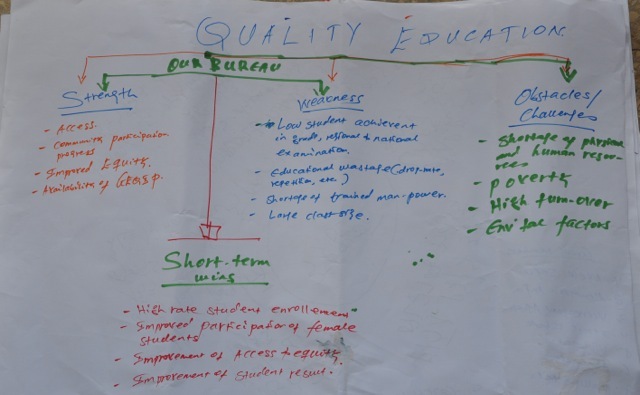 With all students playing active role surfacing information and knowledge from their respective backgrounds /perspectives equally, the model, implemented regularly, progressively and creatively, could bring about all the desired students’ outcomes. 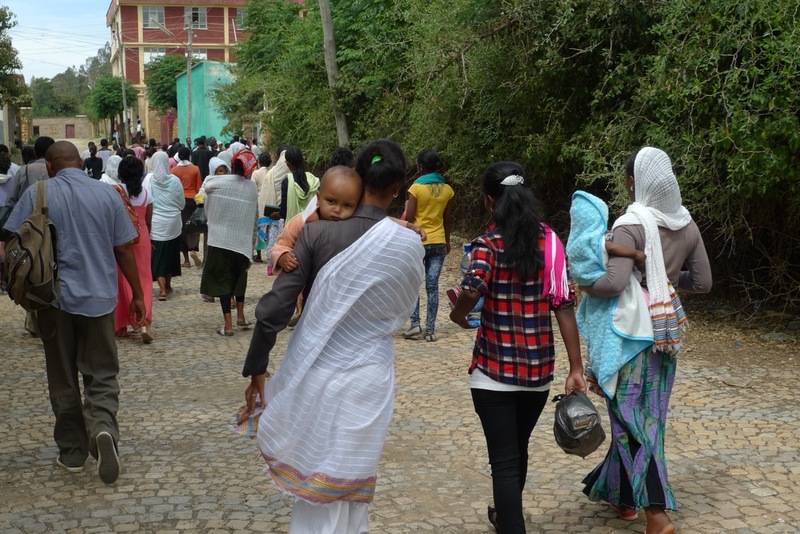 More than 200 years ago, the English historian Edward Gibbon wrote about a people who ignored the world and nearly lost their society. 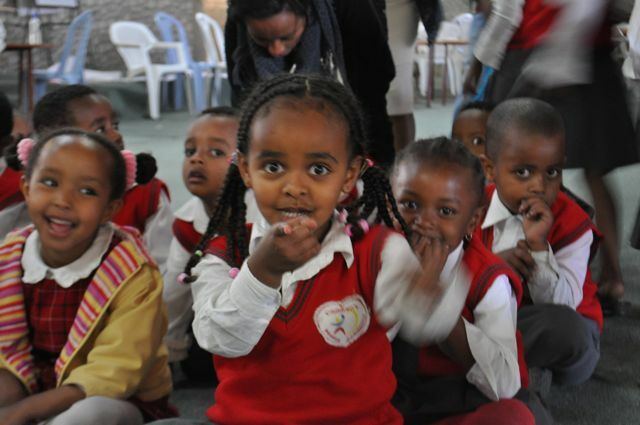 Today, Ethiopia is one of the oldest countries in the world, and at 94 million people, it has the second-highest population of any African country. 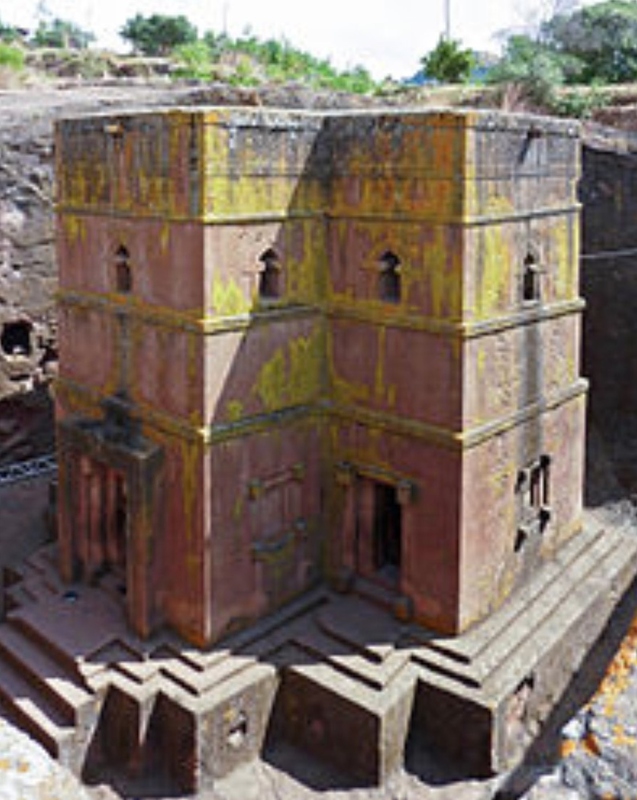 By ignoring what was happening in the rest of their world, the ancient Ethiopians made a dangerous mistake. 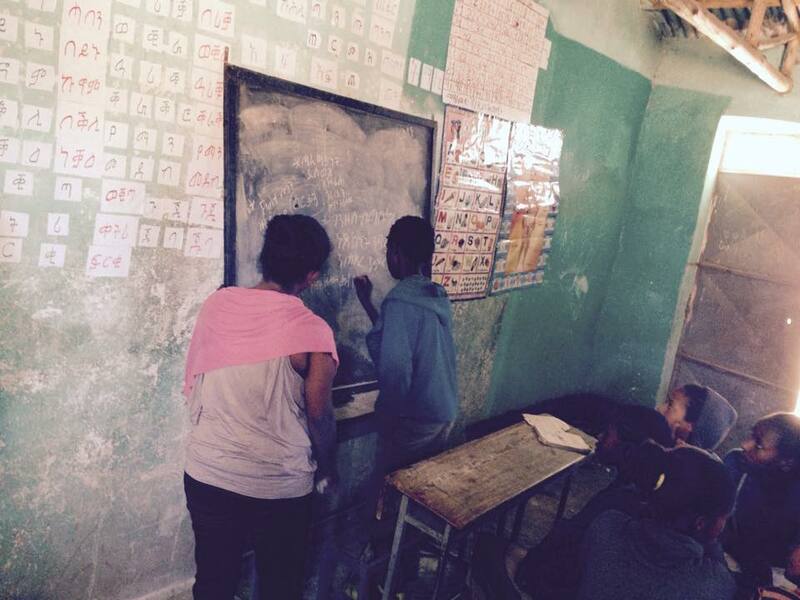 But theirs is more than a history lesson. 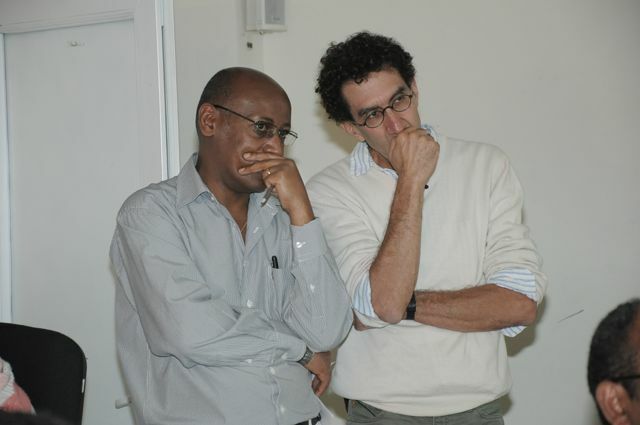 The “sleep” Gibbon wrote about centuries ago has implications for modern societies — not only Ethiopia, but also here in the United States and elsewhere. 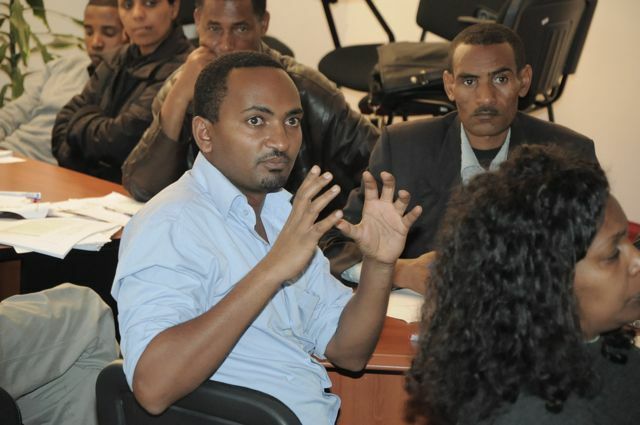 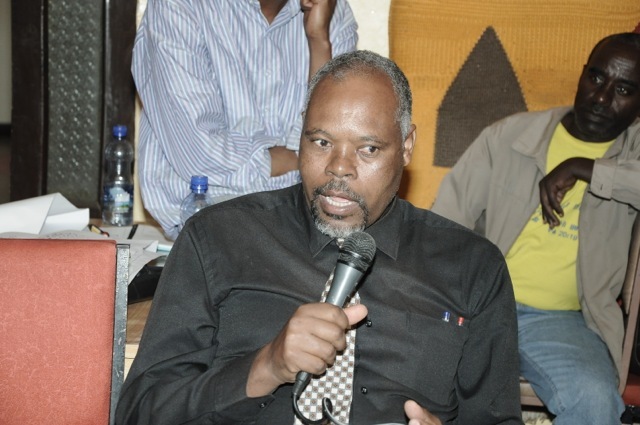 It is a different type of “sleep” — a lack of appreciation for historic struggles for human rights and racial and gender equality that bind people throughout the world — yet it, too, threatens the future and prosperity of young Blacks and people of color in the United States, Ethiopia and across the globe. 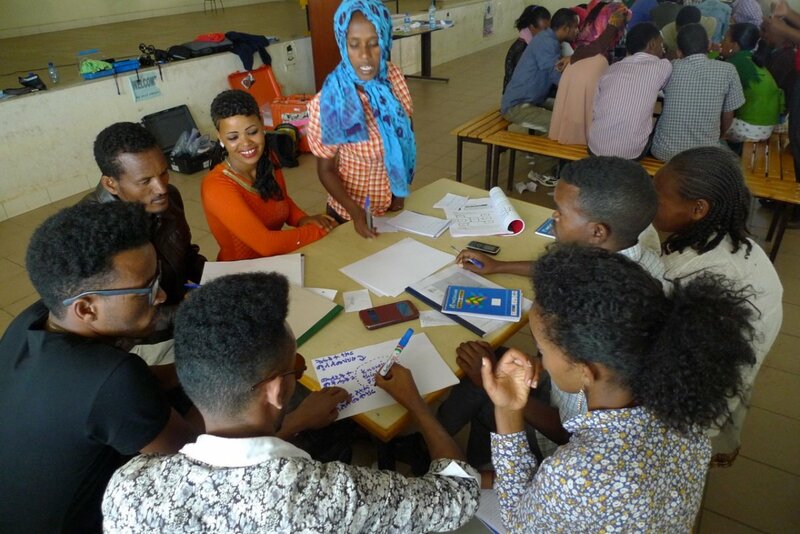 Young people need the tools and skills to connect past, present and future. 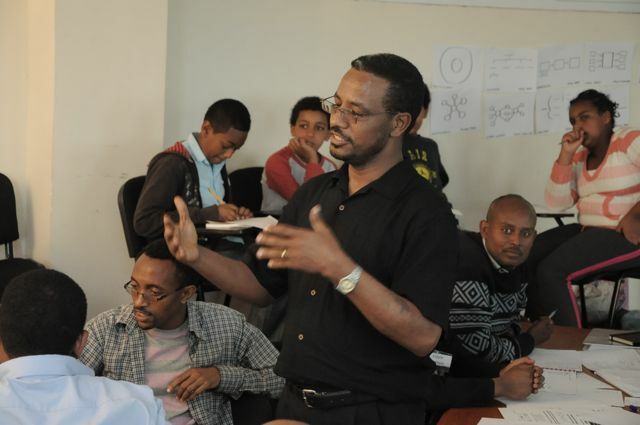 They need educational approaches that teach them to understand and respect different perspectives — and to harvest those perspectives for mutual benefit, in a way that allows them to solve problems collaboratively, whether they are battling City Hall or consulting as an adult with a multi-national business halfway around the world. 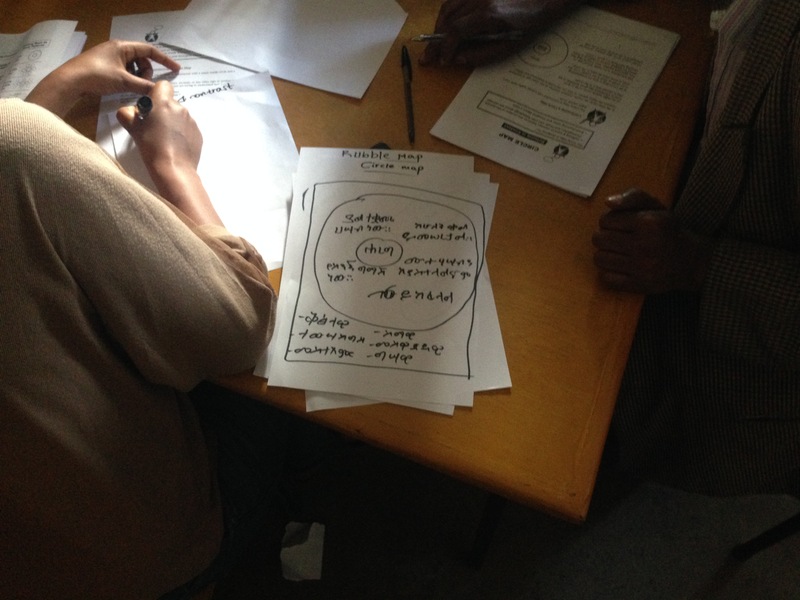 Without this level of awareness and engagement, it is Blacks, people of color and those struggling with poverty who are endangered. 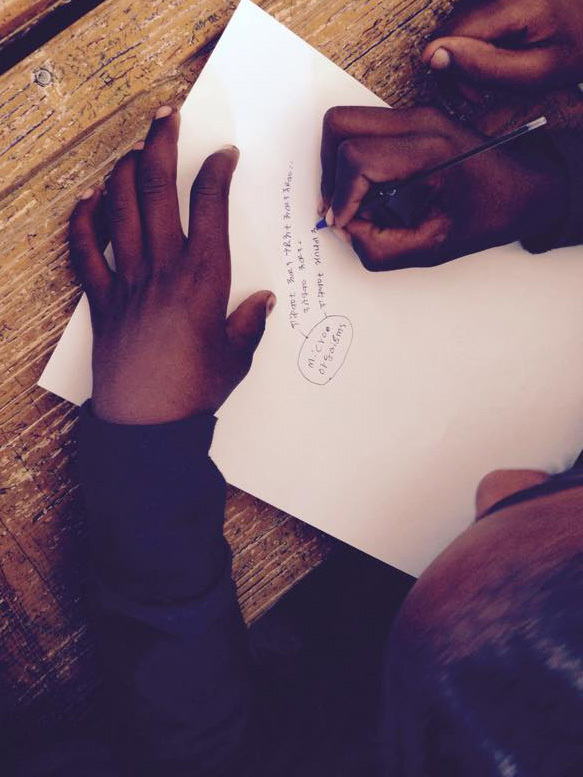 It’s not enough to say Black Lives Matter. 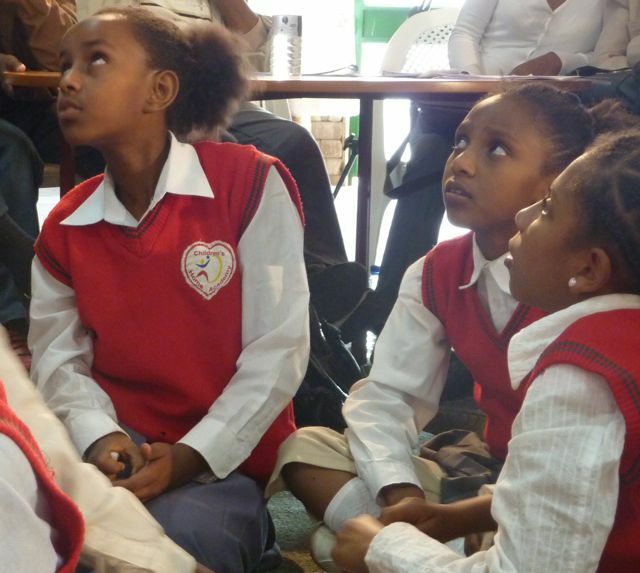 We must believe Black Minds Matter. 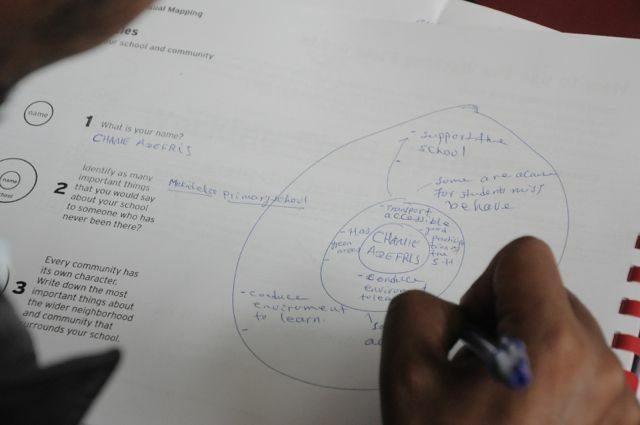 We must teach every young person not only content, but also the processing and evaluation skills — or the pedagogy — needed to give subject matter context, and employ it to solve society’s problems. 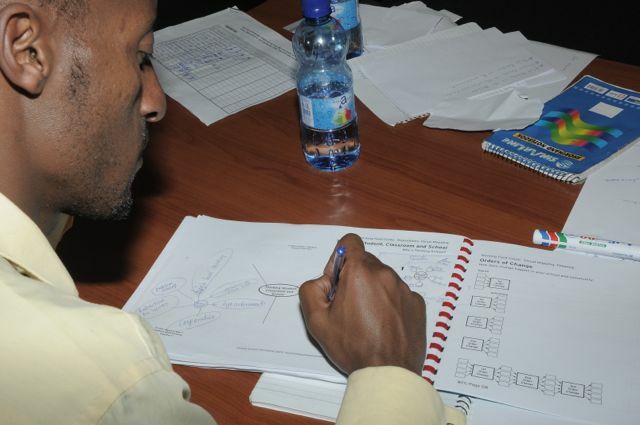 Skills to be taught and learned for 21st century success include: global awareness; international collaboration; critical thinking; synthesis; creativity and computing. 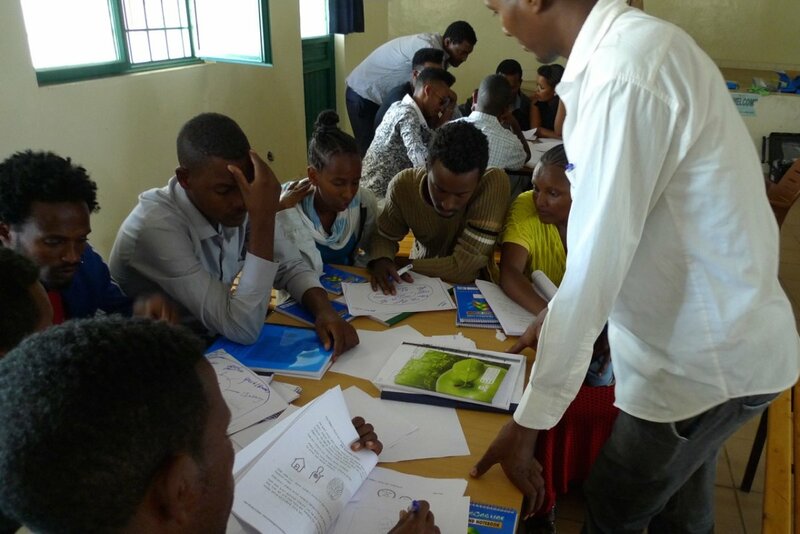 This is how we create confident, inquisitive, lifelong learners who will build a better world by protecting the environment, addressing poverty, managing unprecedented human migration and deepening the support for human rights. 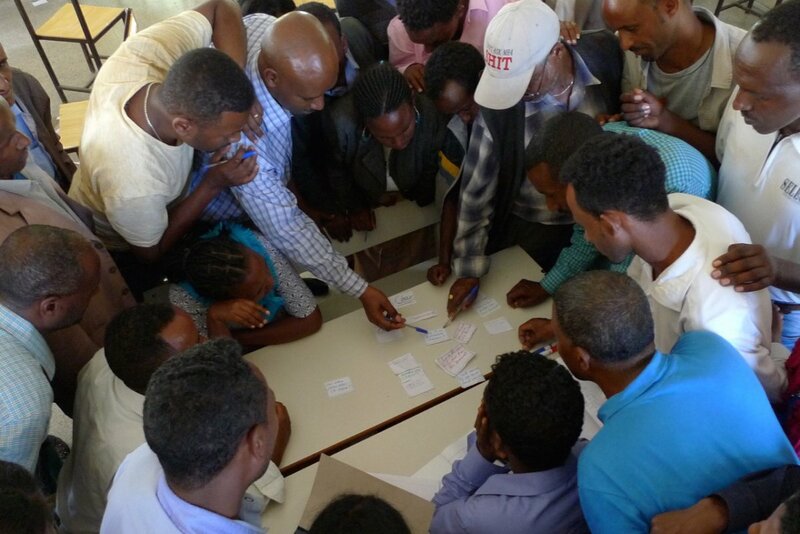 Time and again, we have seen what happens in the United States when people from different backgrounds fail to acknowledge each other’s reality. 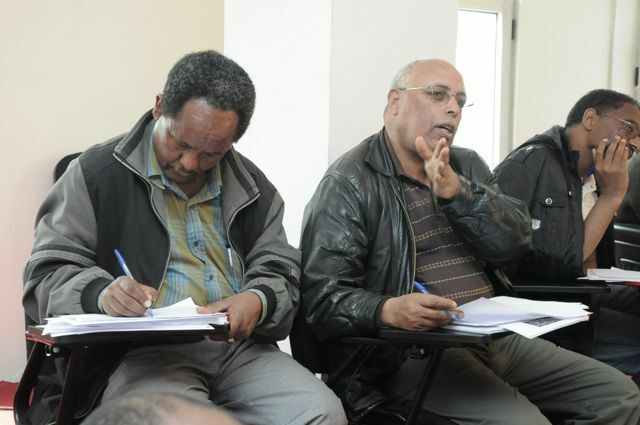 This continues to split people of color and many Whites — causing fear of change and strident calls for retrenchment and changes in governance. 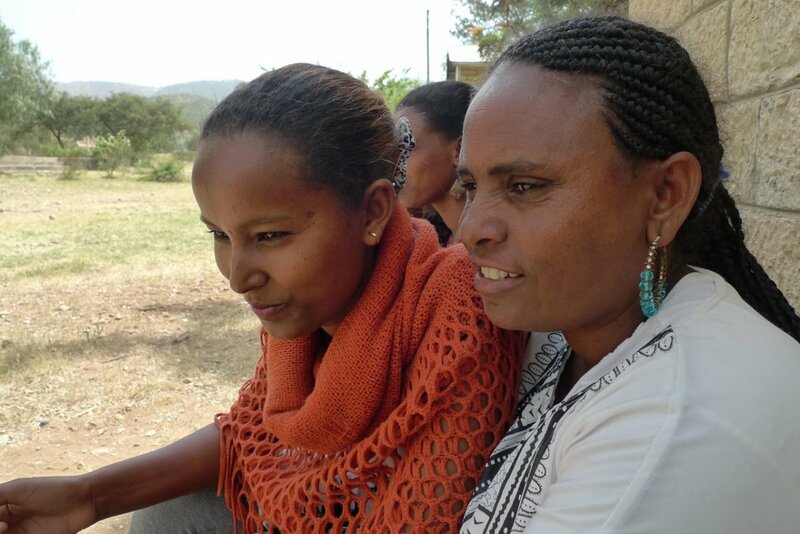 In Ethiopia, where gender inequality is a top social issue, the divide often occurs between men and women. 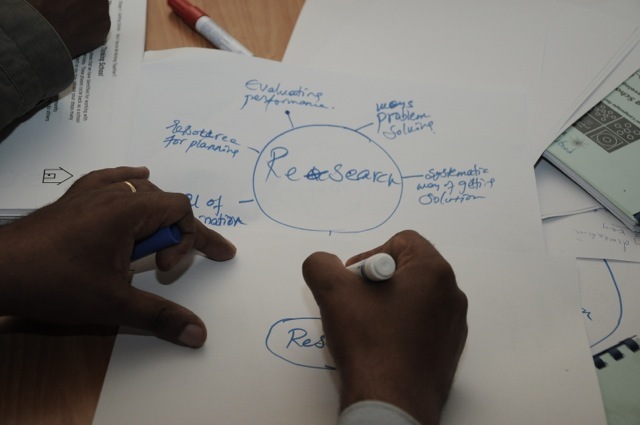 We must continually mediate these and other issues before they become entrenched and pervasive misunderstandings. 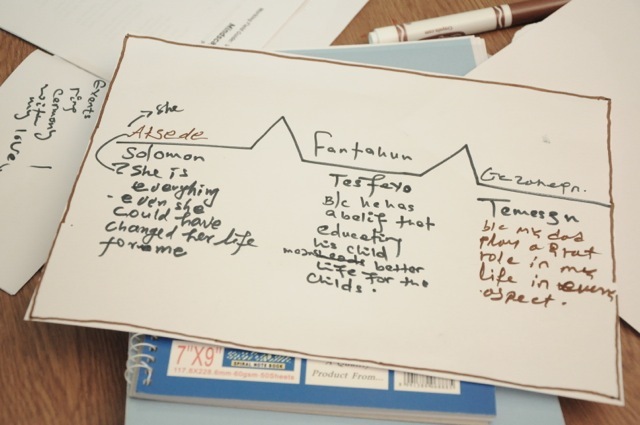 We must accept that “frame of reference” is an important part of the “prior knowledge” necessary for bridging academic gaps. Not all knowledge comes from a book, lecture or classroom teacher. 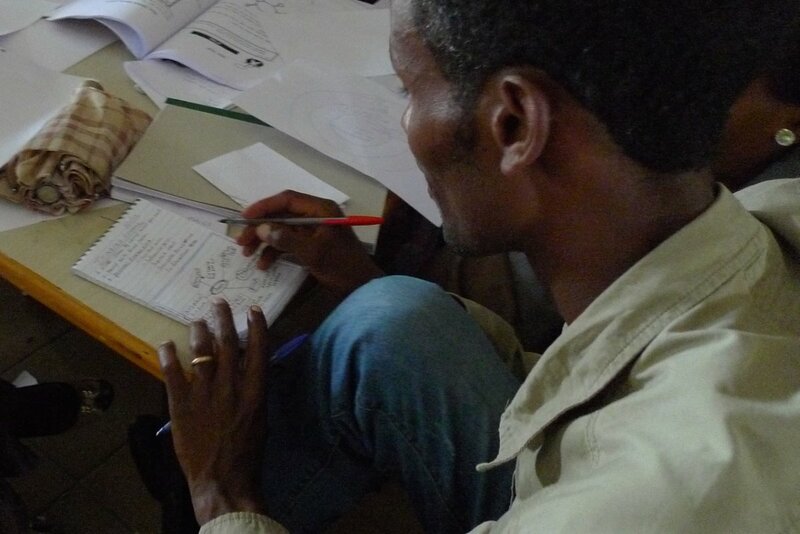 Knowledge also can be witnessed, felt, perceived, experienced. 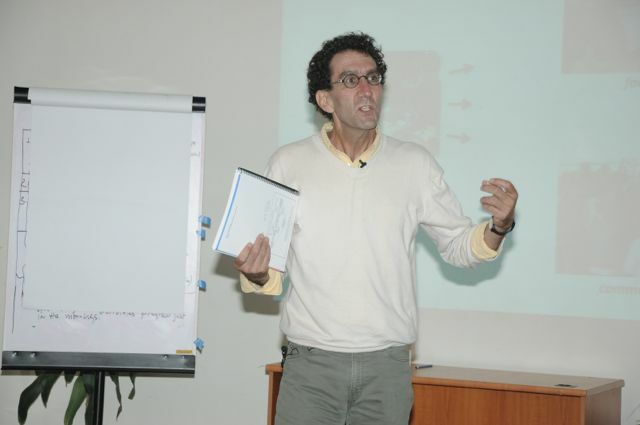 And that “frame of reference” can enable us to relate to events we do not personally experience. 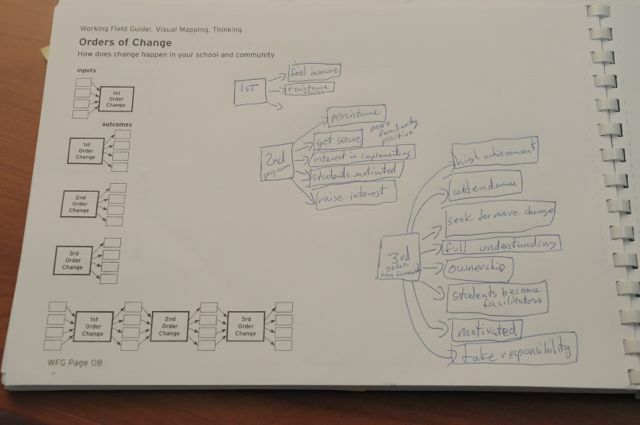 Education models of change are well underway. 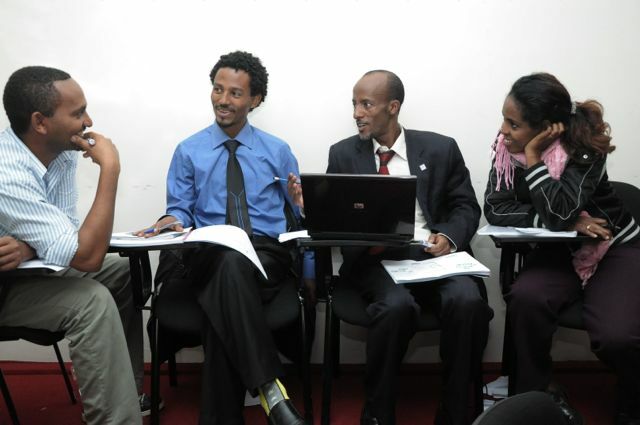 For example, in the United States, the National Urban Alliance for Effective Education provides professional development so educators can harness a student’s culture or “frame of reference” and use it to help every student, regardless of race or cultural or economic background, to reach his or her potential. 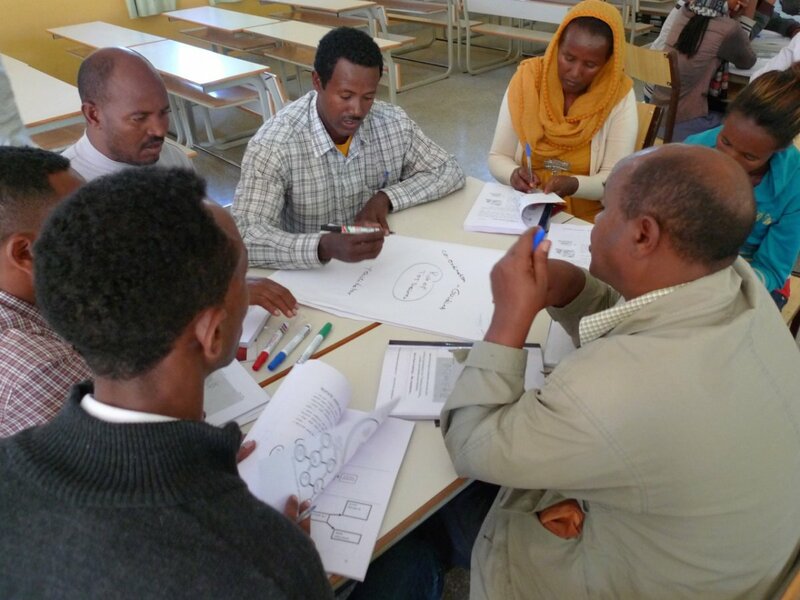 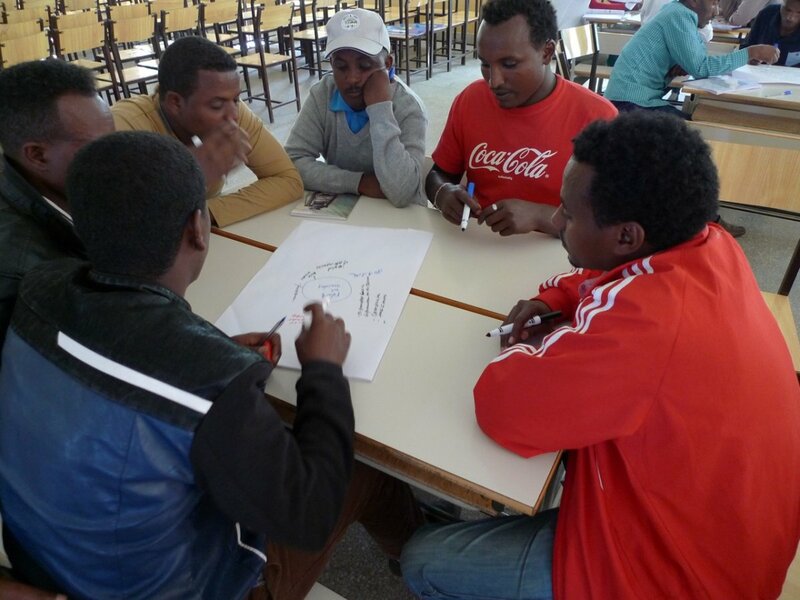 In Eastern Africa, the Thinking Schools Ethiopia project uses a pedagogy that includes frame of reference, inquiry and collaboration. 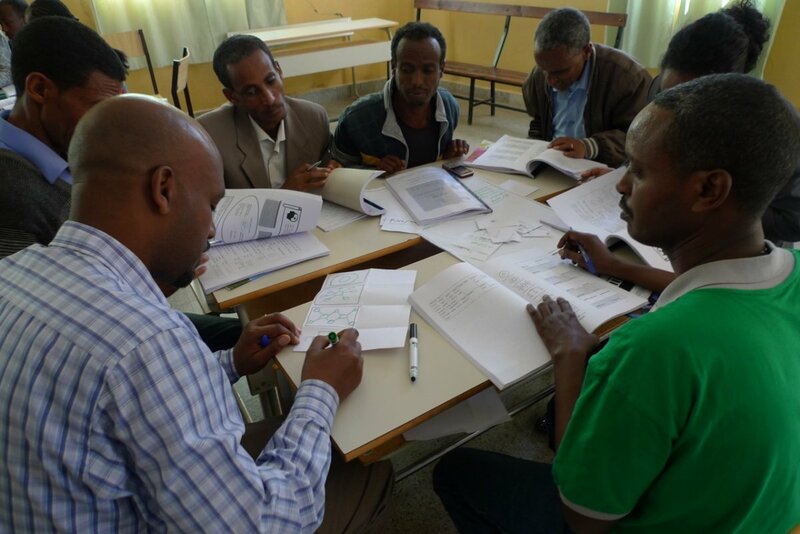 The pedagogy explores subjects such as relationships between historic oppression and the subjugation of the Black experience in Ethiopia today. 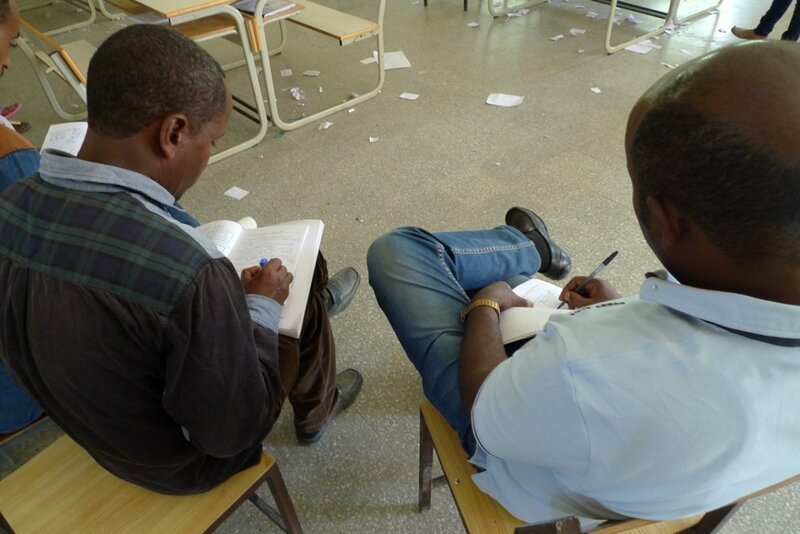 By so doing, commitment to learning and effort is expanded and lives are improved. 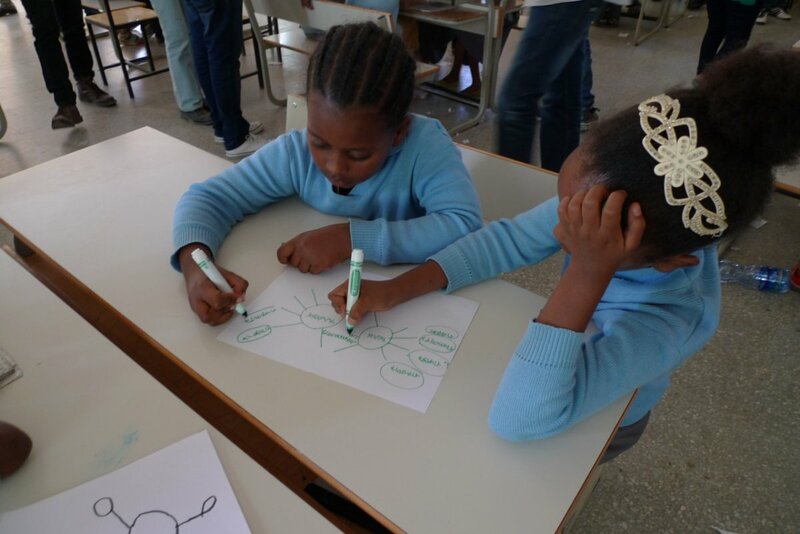 The classroom can and should be the incubator for change — the great equalizer for children and communities across the globe. 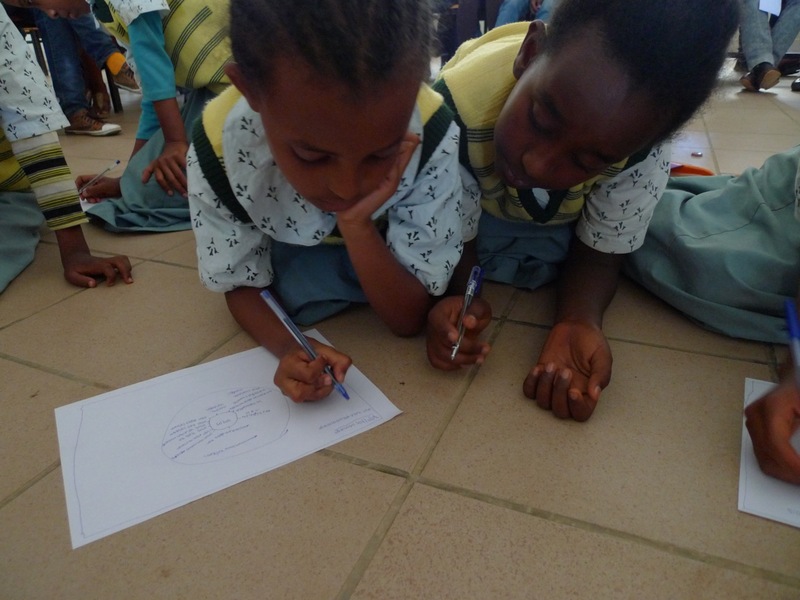 In an age of global strife, to lose sight of the role of progressive education in the lives of children is to admit defeat in a war of ideas we cannot afford to lose. 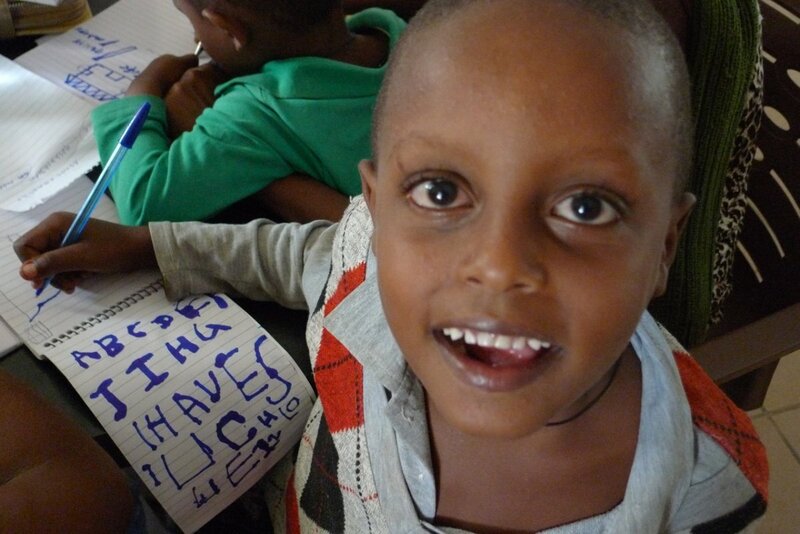 What do we tell the children when the lives of so many remain in turmoil? 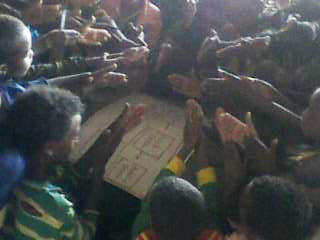 Is it not the responsibility of adults and children to defend the values of social and human justice in a diverse world? 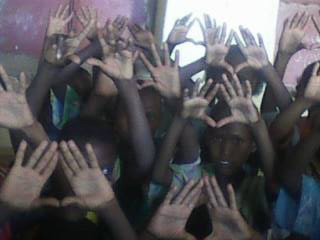 The children deserve answers in an increasingly scary global community. 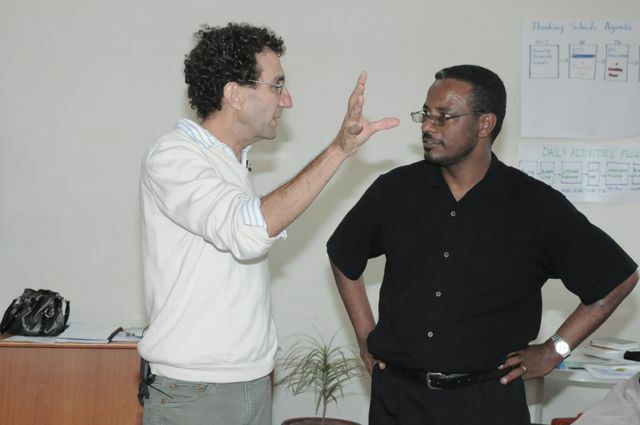 Robert Seth Price is director of Thinking Schools Ethiopia www.thinkingschoolsethiopia.com. 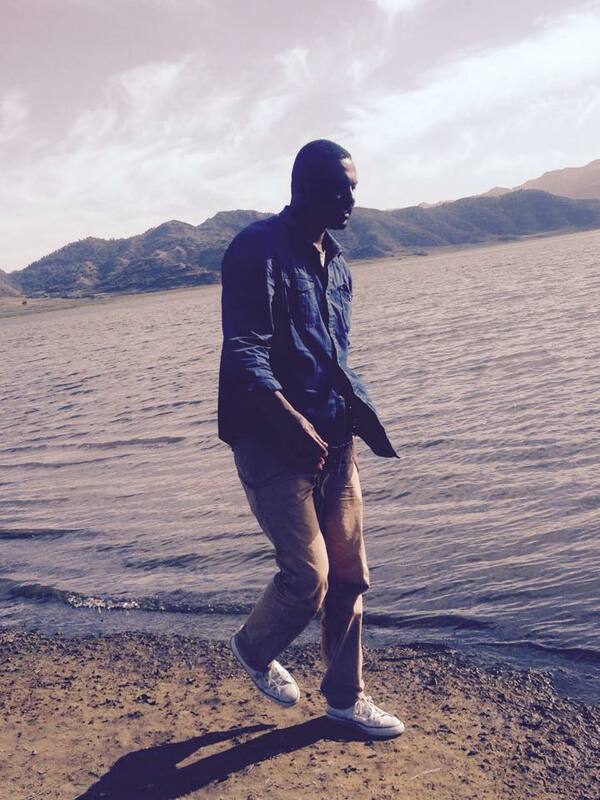 He can be reached at robert@eggplant.org. 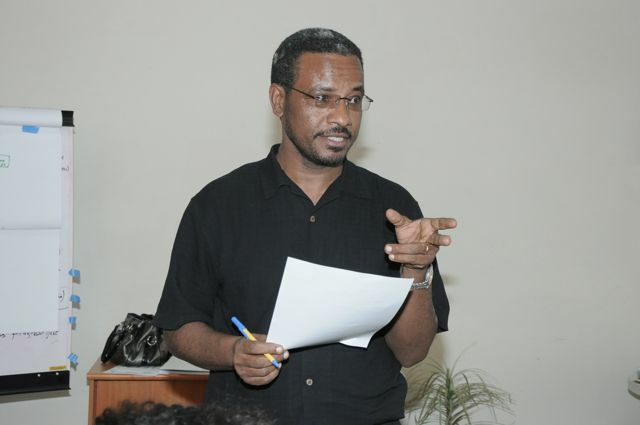 Eric J. Cooper is the founder and president of the National Urban Alliance for Effective Education, a nonprofit professional development organization that provides student-focused professional development, advocacy and organizational guidance to accelerate student achievement. 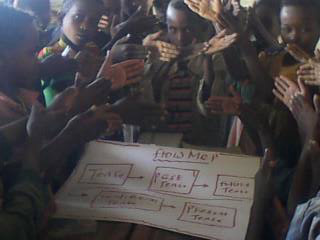 He can be reached at e_cooper@nuatc.org. 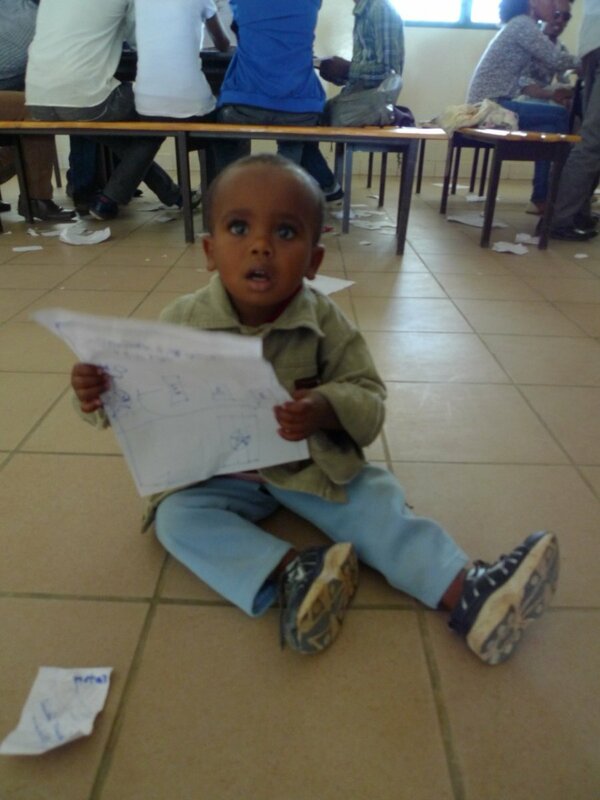 He tweets as @ECooper4556. 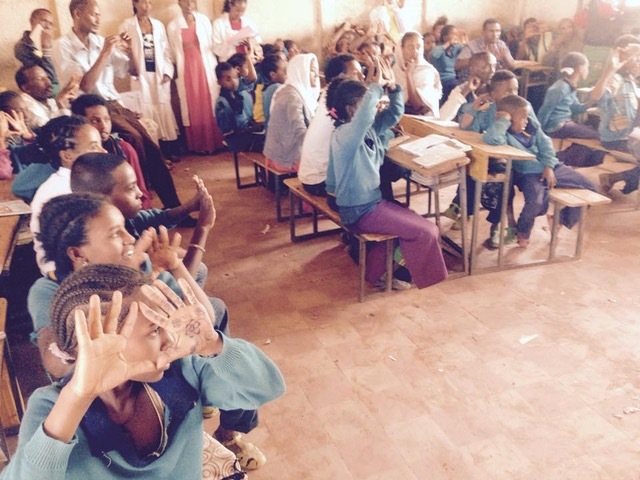 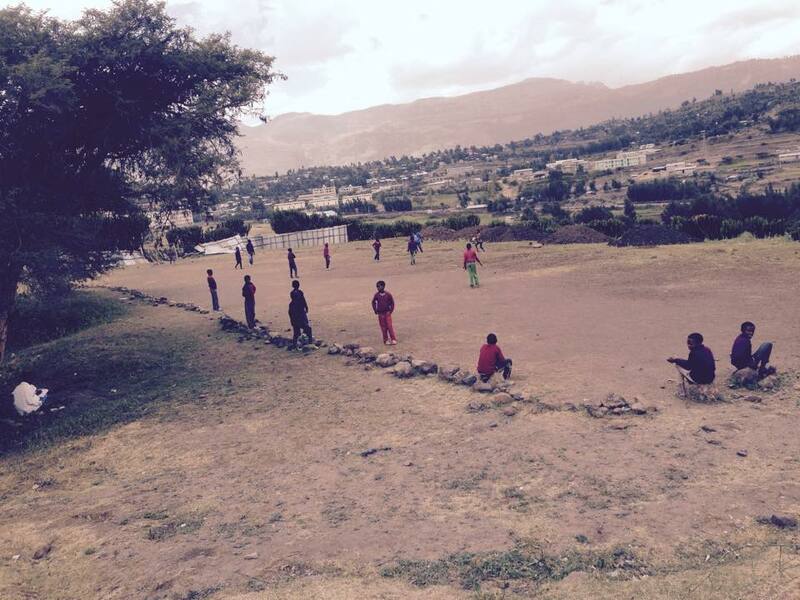 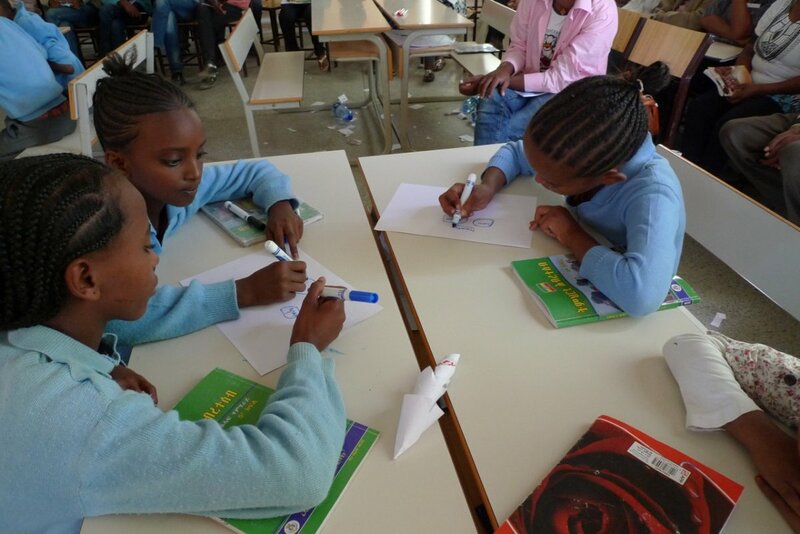 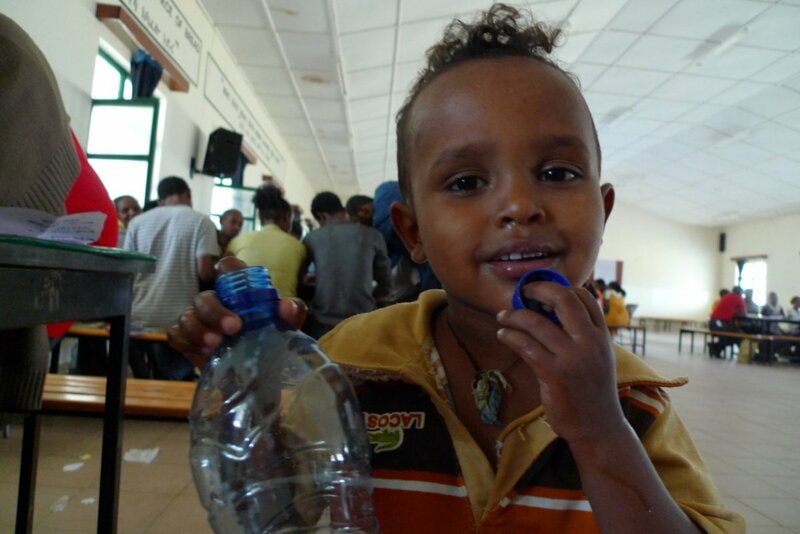 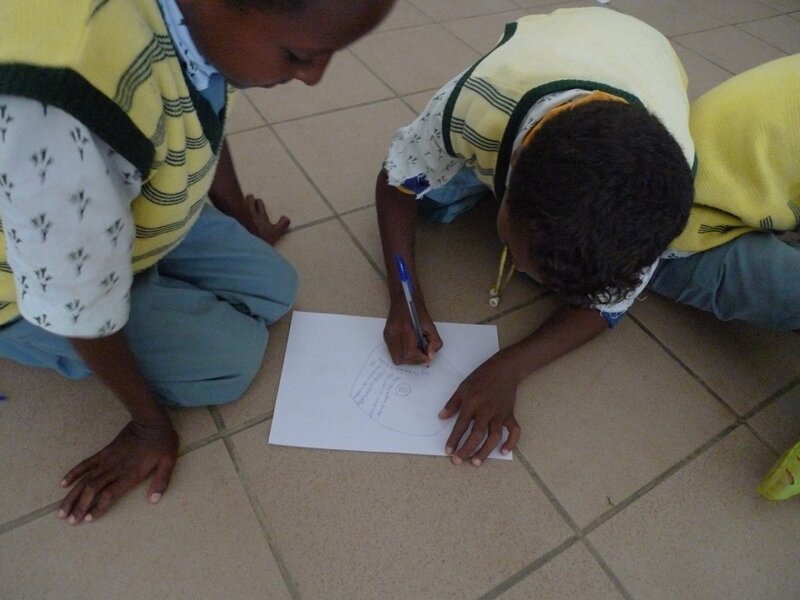 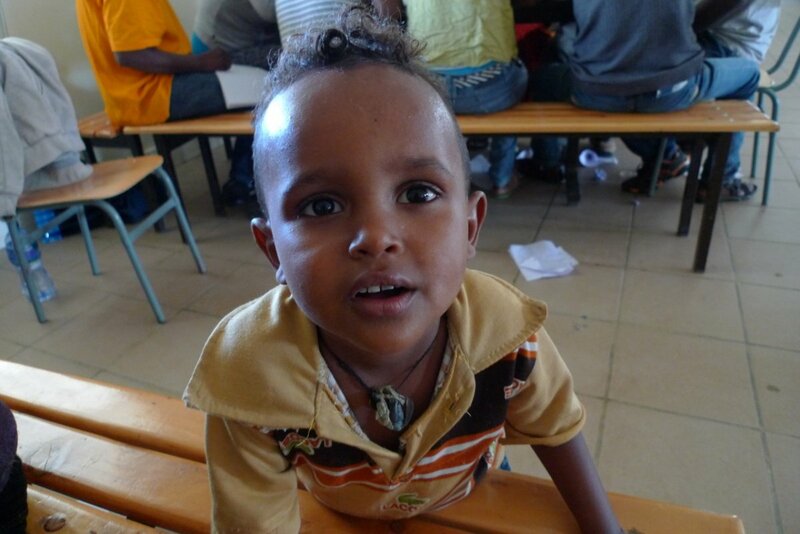 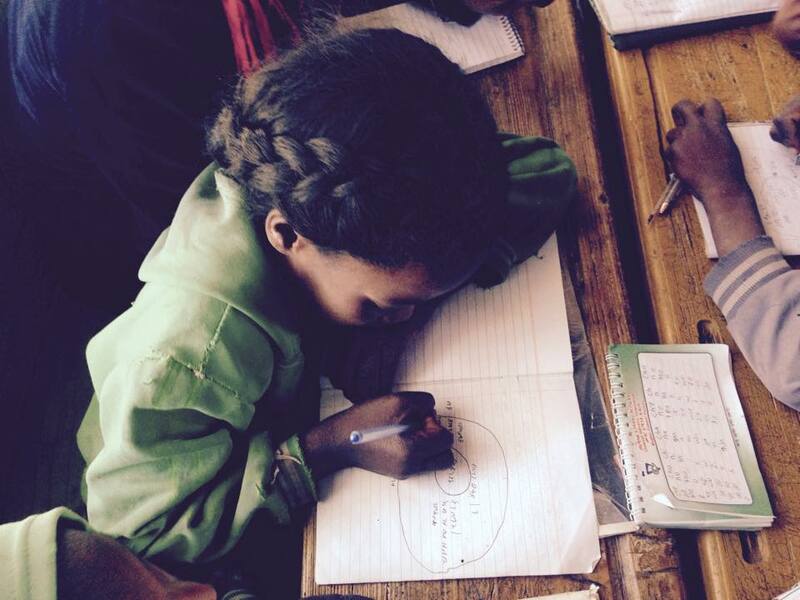 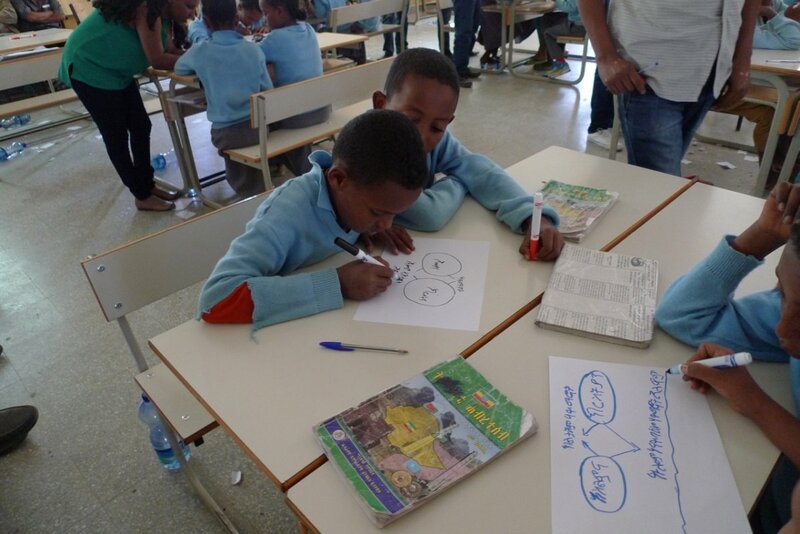 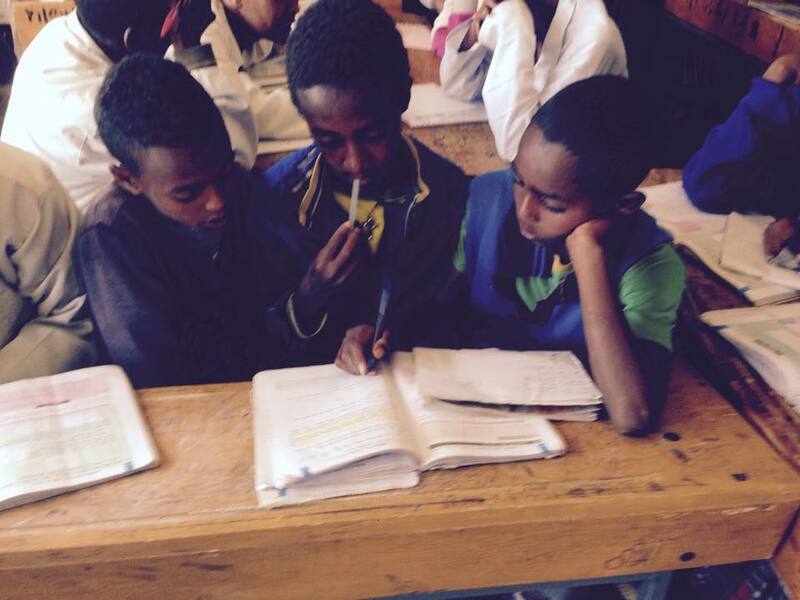 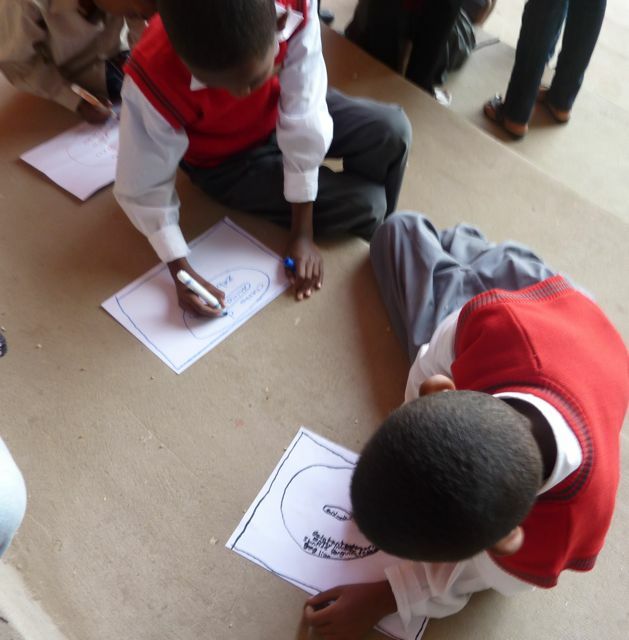 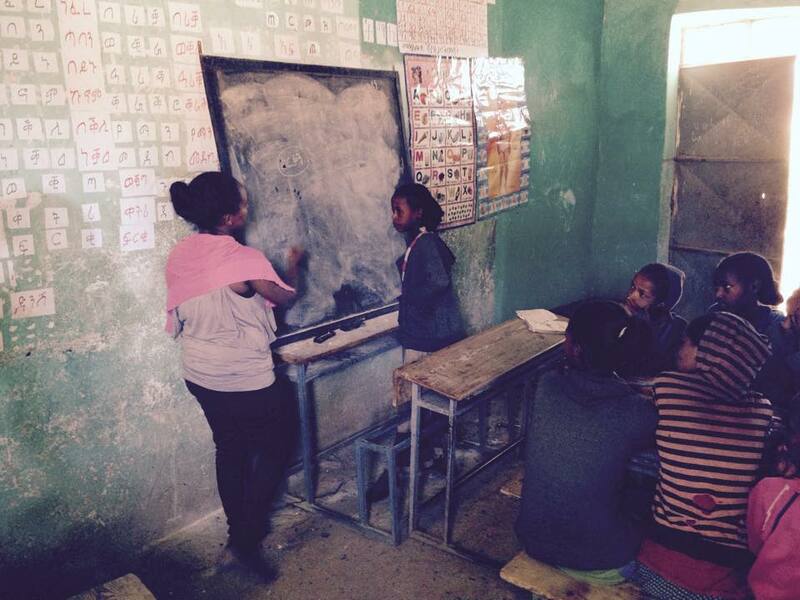 The photos above and below are from Seka Elementary School in the Aksum region in Tigray Ethiopia. 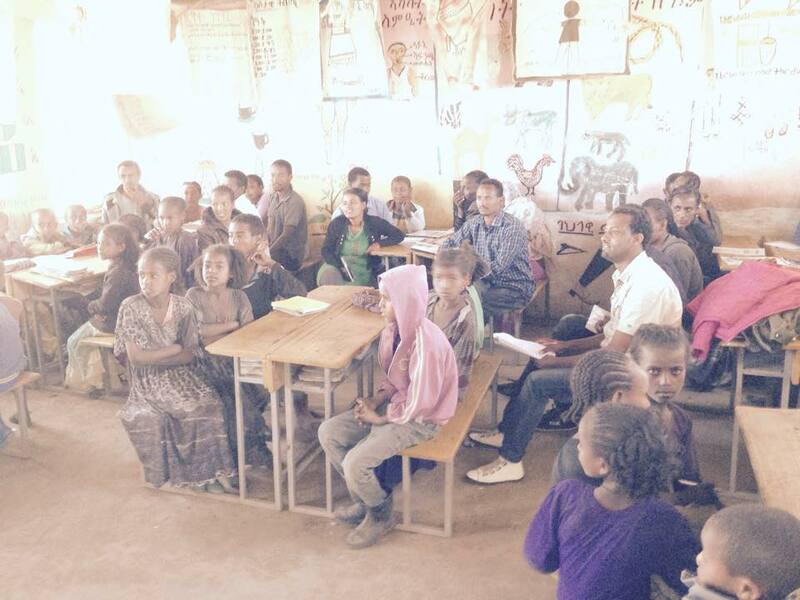 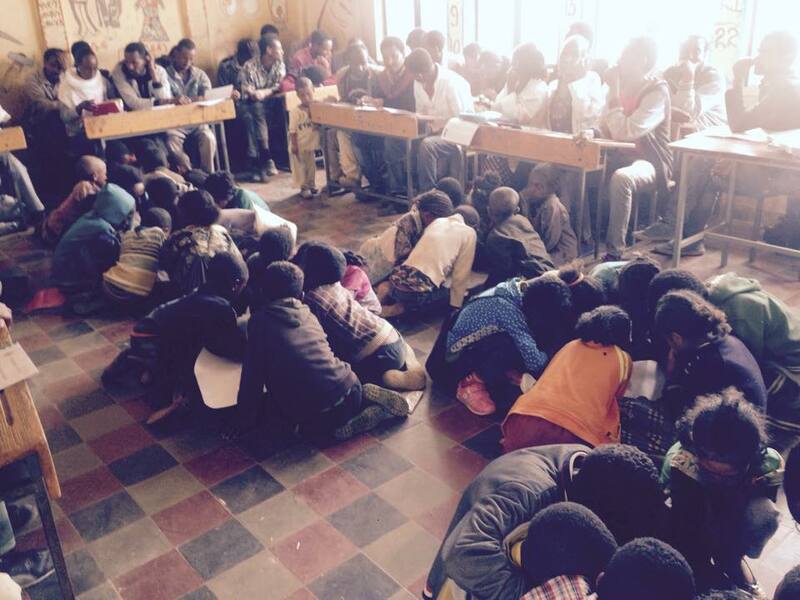 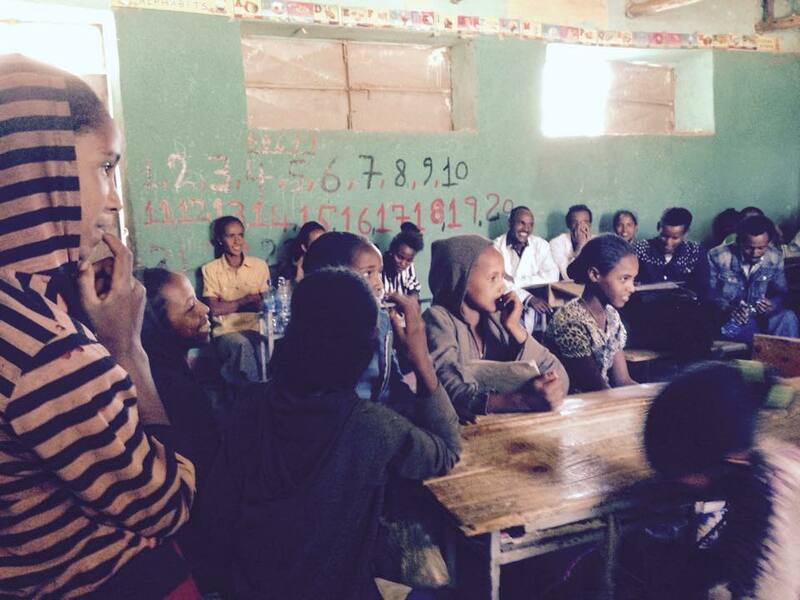 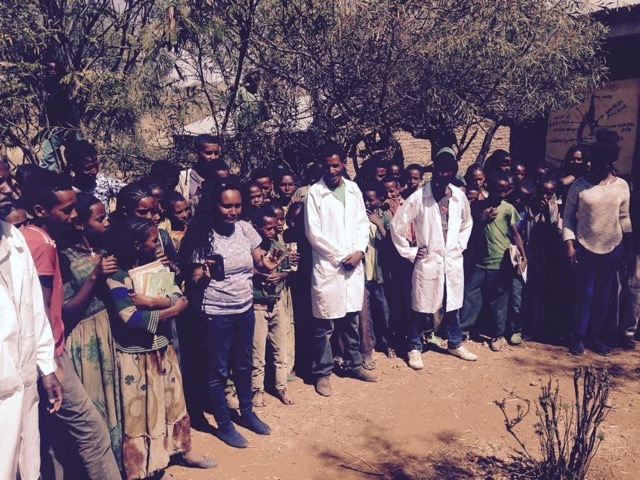 Seka Elementary School is one of 37 model laboratory schools part of the Thinking Schools Ethiopia Tigray project. 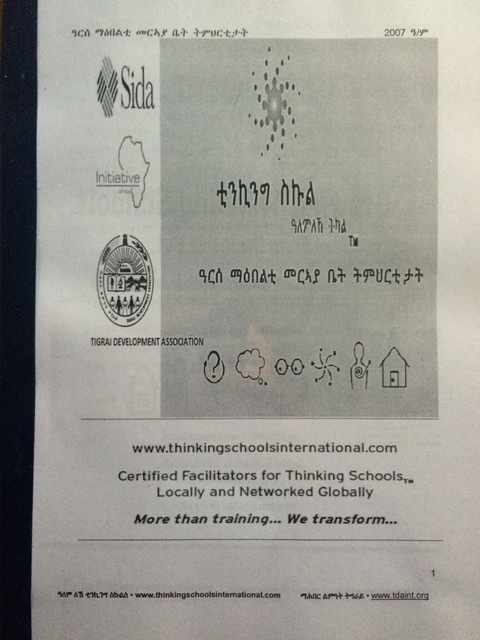 First we are given some training about the Thinking Schools Ethiopia training. 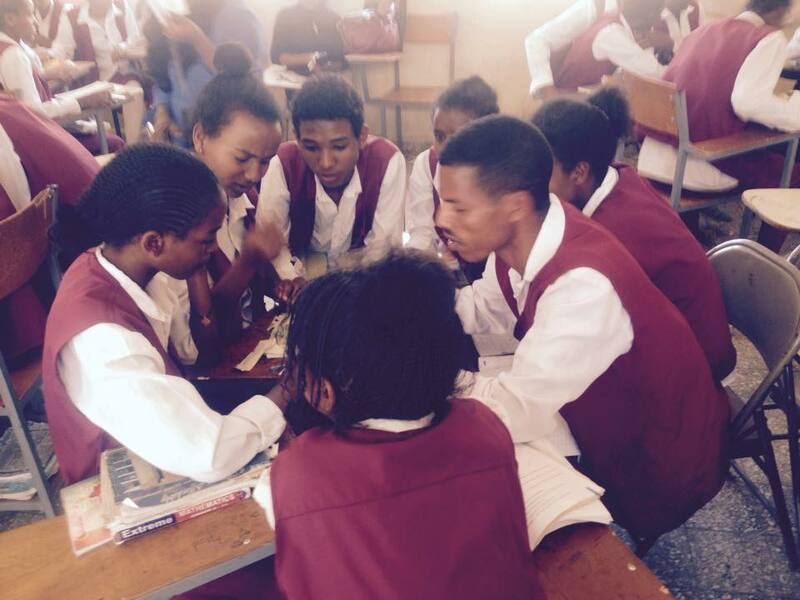 After that these photos of students are when the teacher teaches for the students about the topic in the English subject. 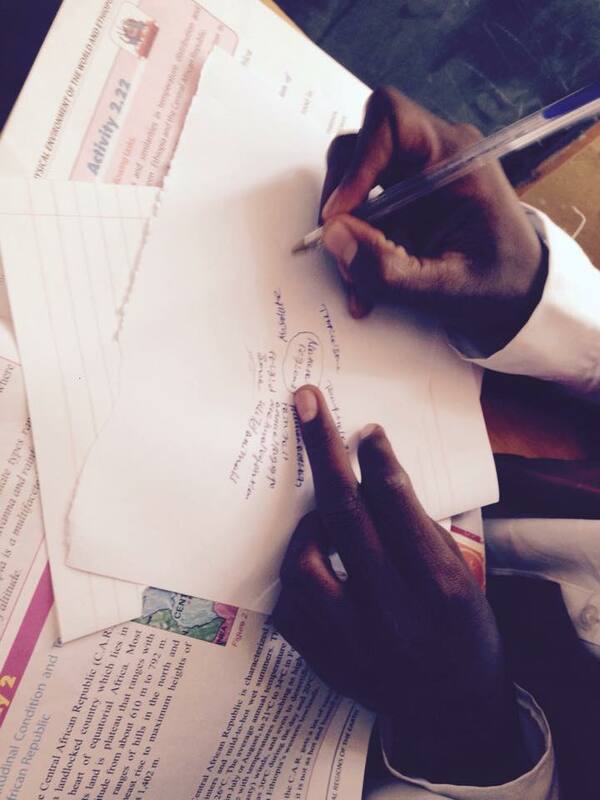 The students are learning one topic about TENSE using the map of Circle Map in English subject. 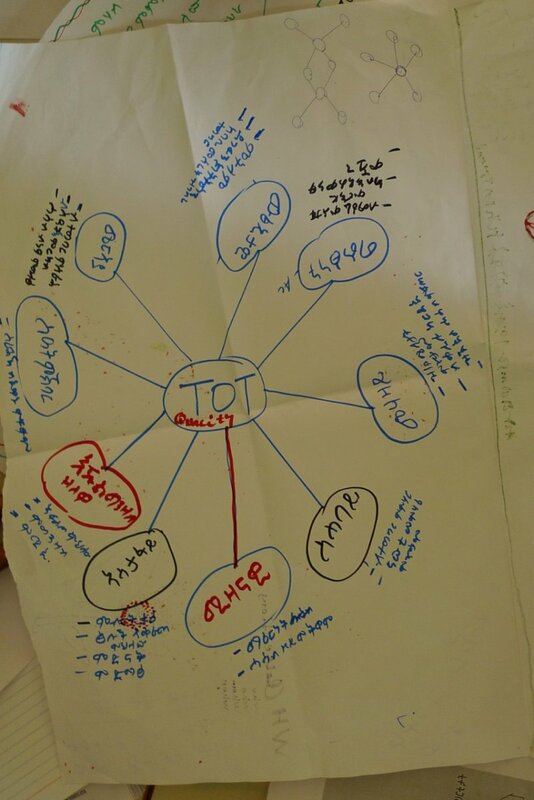 The teachers use Circle Maps and Flow Maps and other Thinking Maps in Seka Full Elementary School. 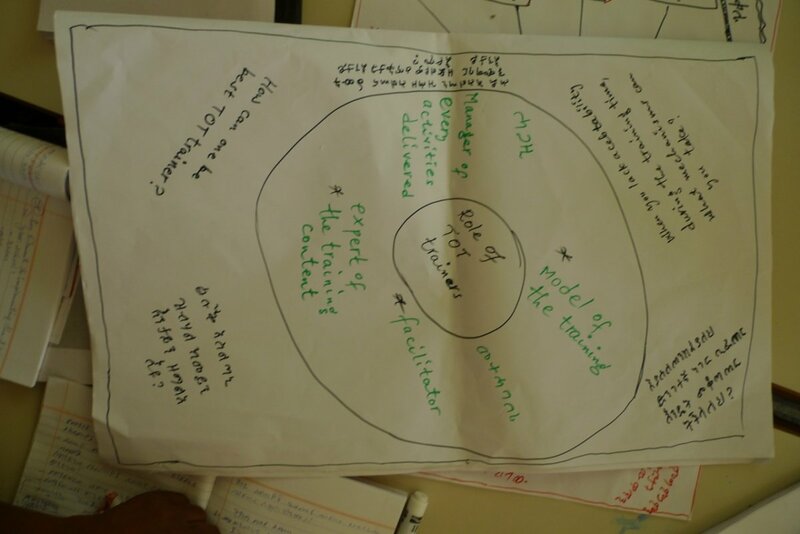 The other Thinking Maps are being regularly used in our whole school. 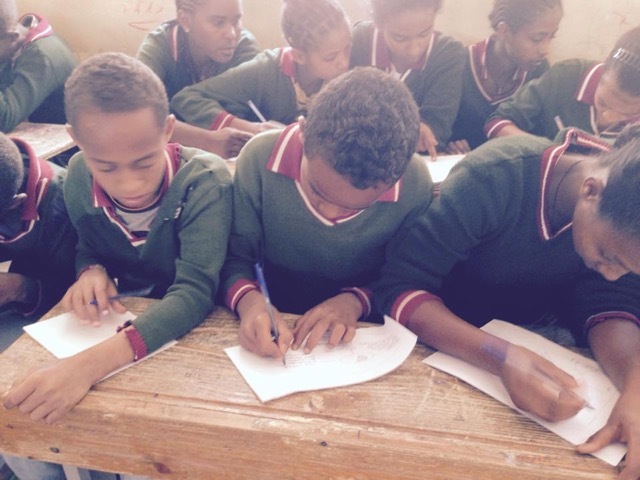 We have been starting grades 1-8 especially with math & English subjects. 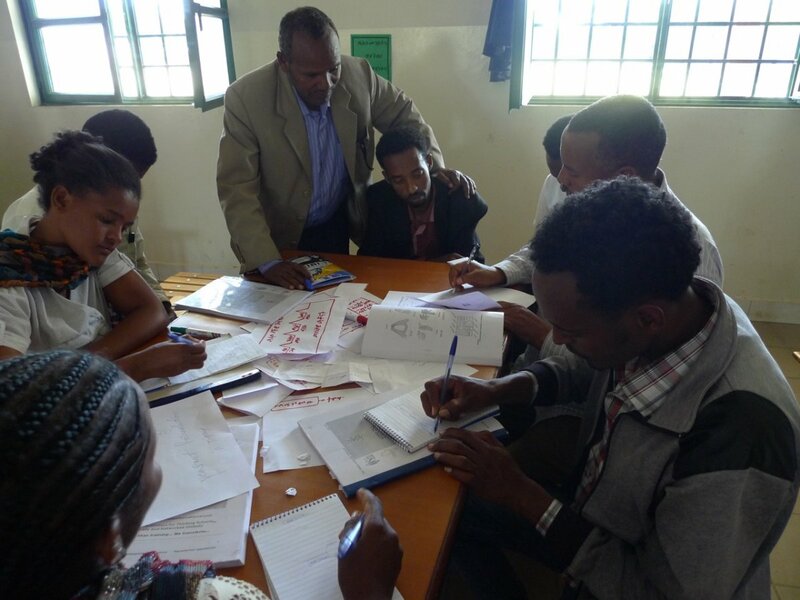 The school recently participated in both the Trainer of Trainers professional development and the whole school training with the Trainer of Trainers under the guidance of Thinking Schools International Global Trainer Robert Seth Price and the Thinking Schools Ethiopia County Trainers Atsede Tsehayou and Dagim Melese. 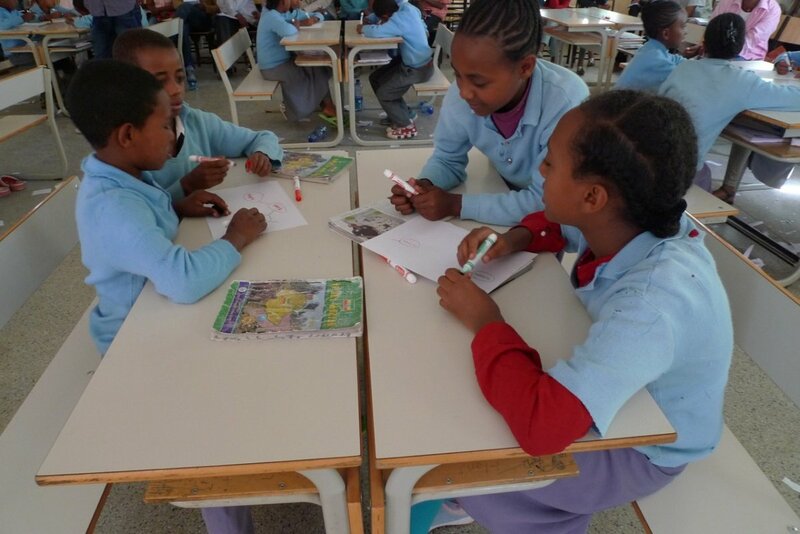 Thinking Schools Ethiopia – Tigray is a collaboration of Tigray Development Association and Thinking Foundation for 37 model schools in 12 Woredas located in all 7 zonal administrations with funding administered by Initiative Africa for a Girl’s Empowerment Whole School Change grant from Sida (Swedish Development Agency) that began as a grass roots project by Robert Seth Price along with lead country trainers Atsede Tsehayou and Dagim Melese. 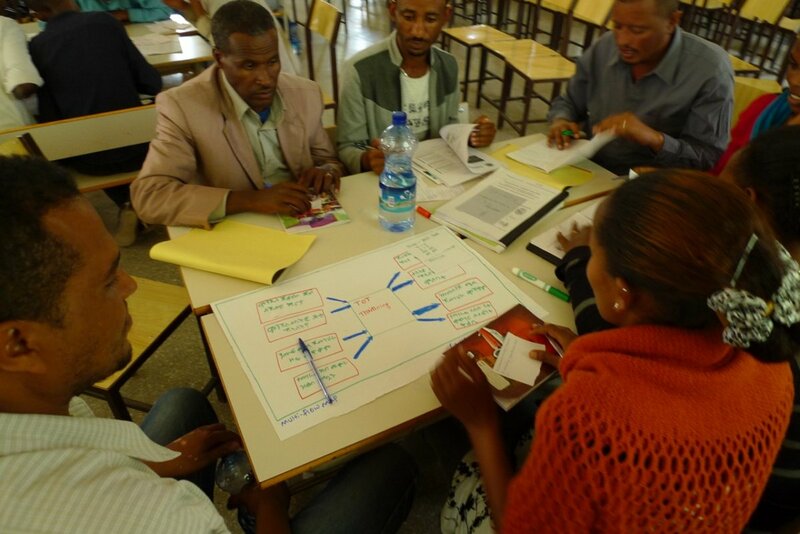 Read the chapter on Ethiopia in the Corwin Press book Pathways to Thinking Schools. 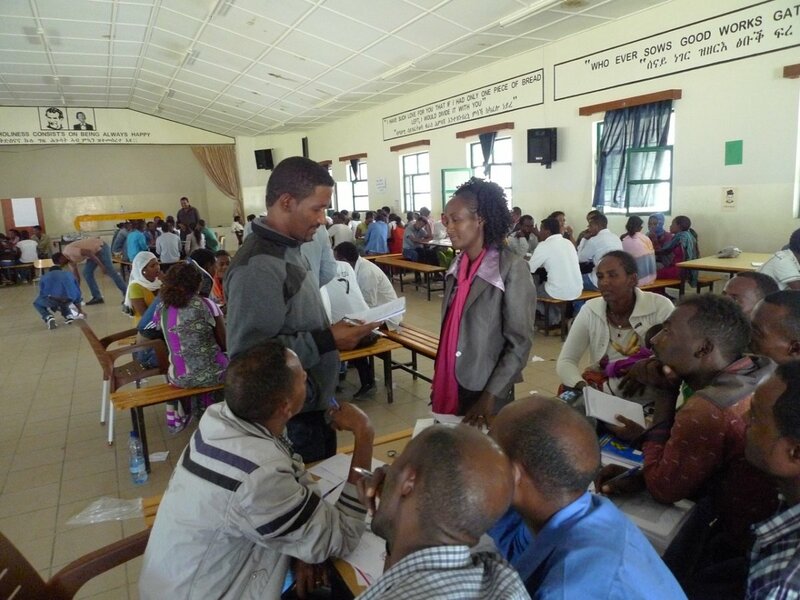 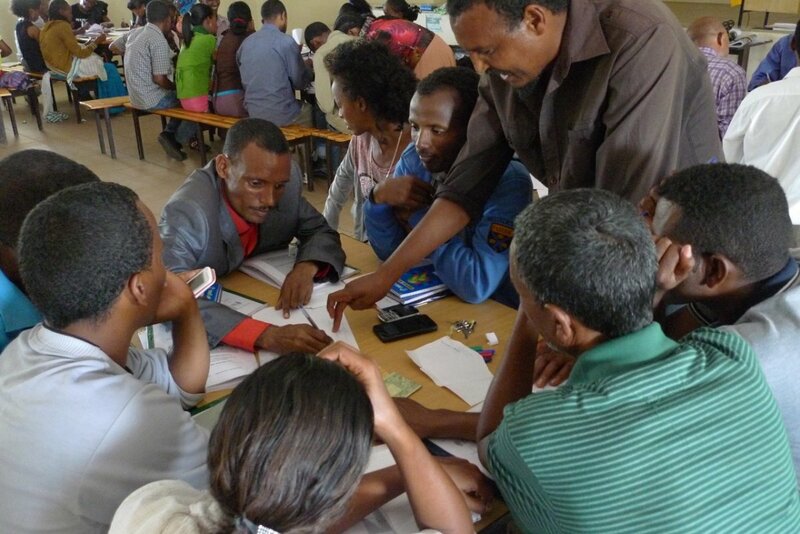 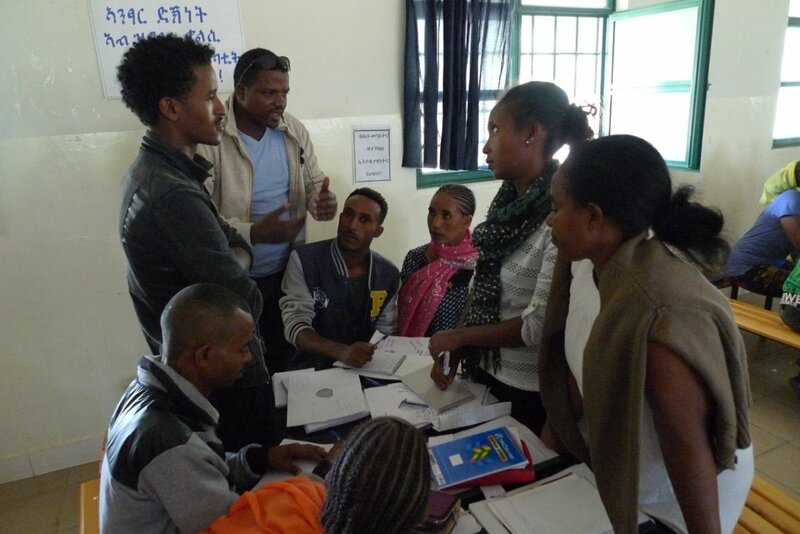 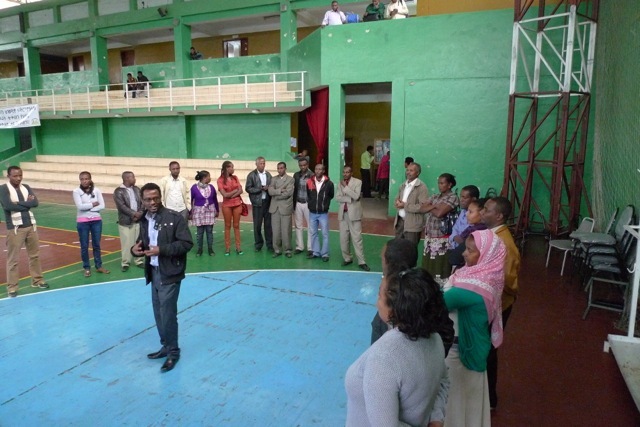 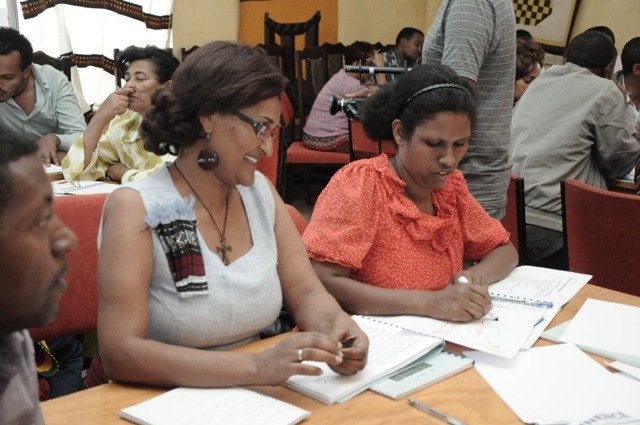 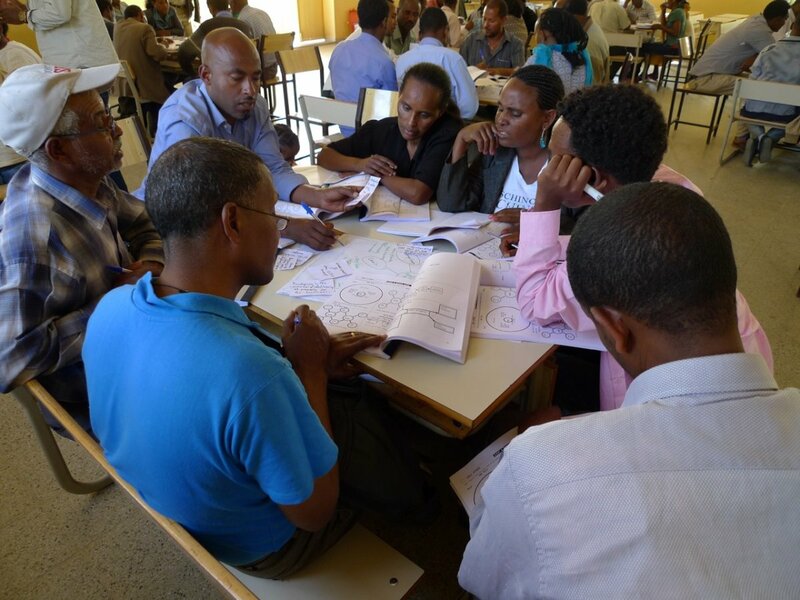 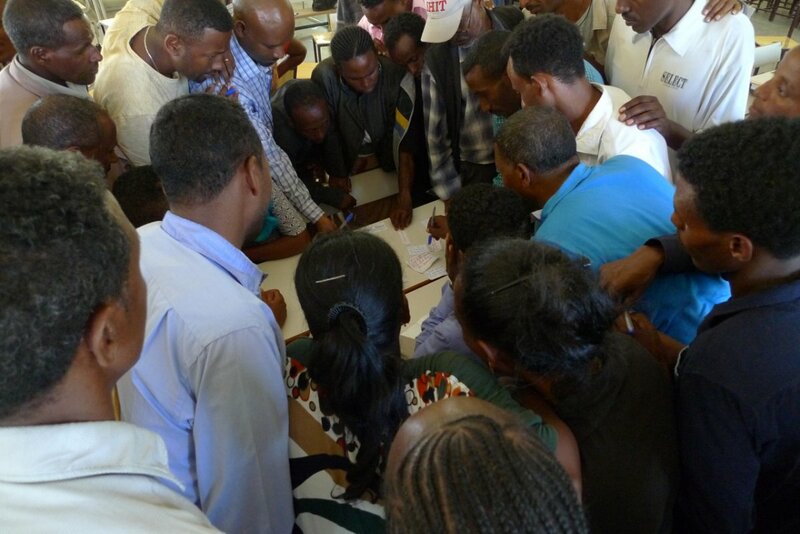 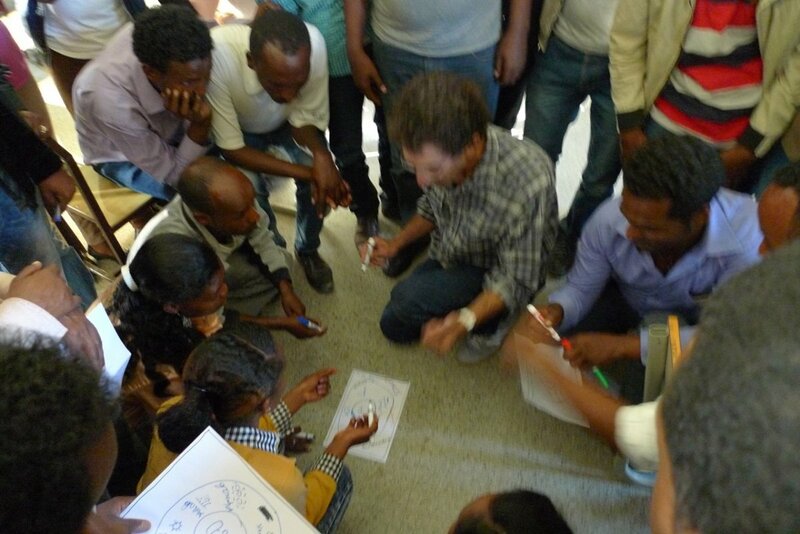 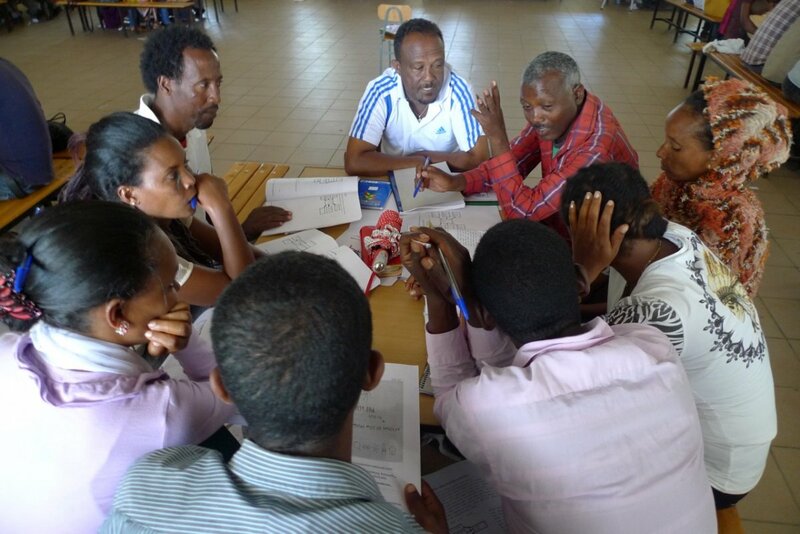 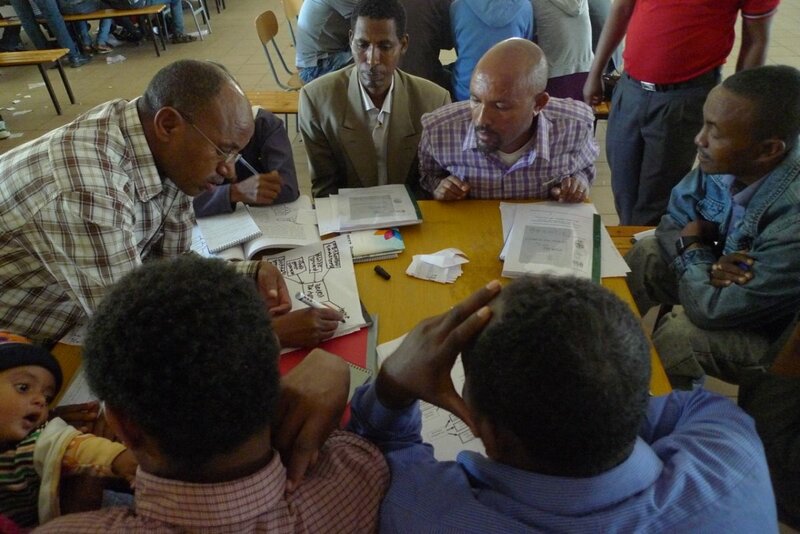 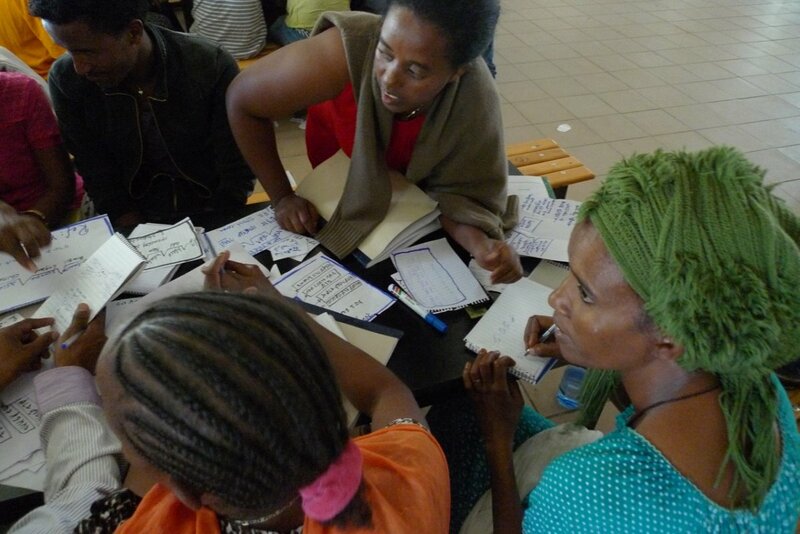 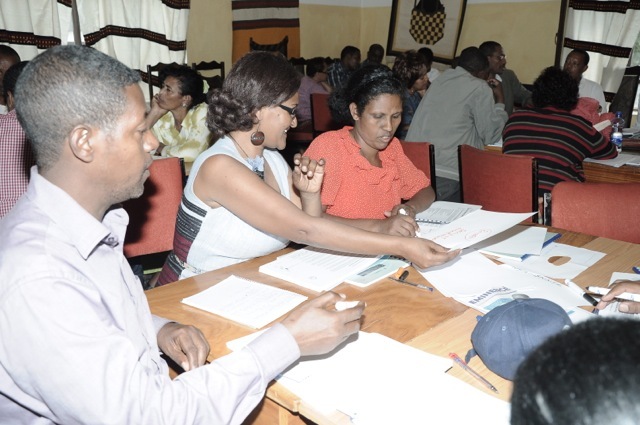 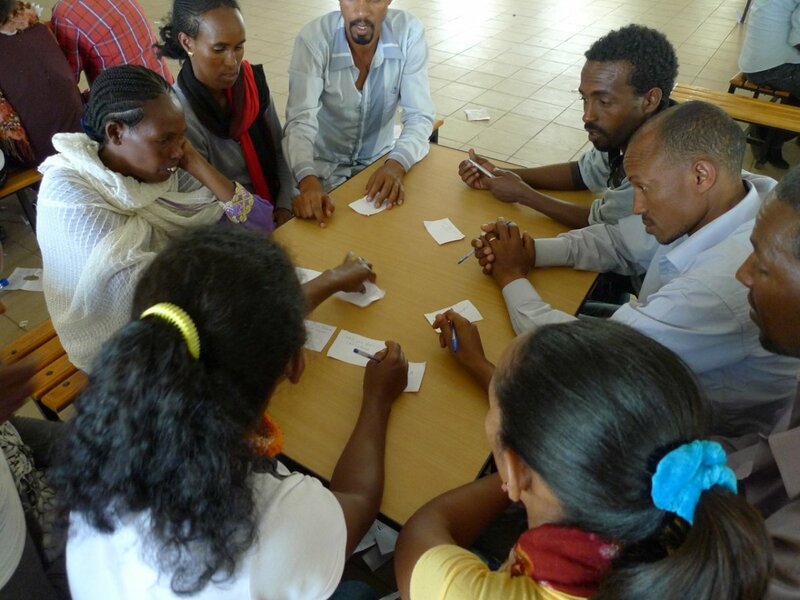 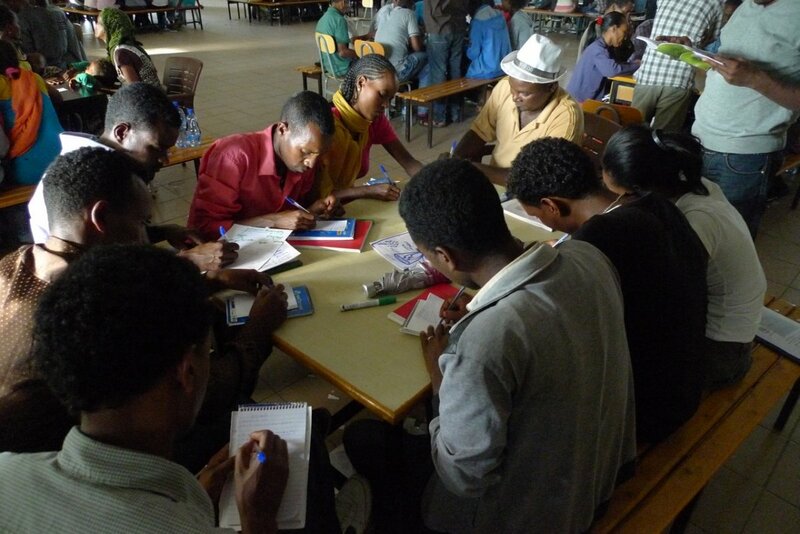 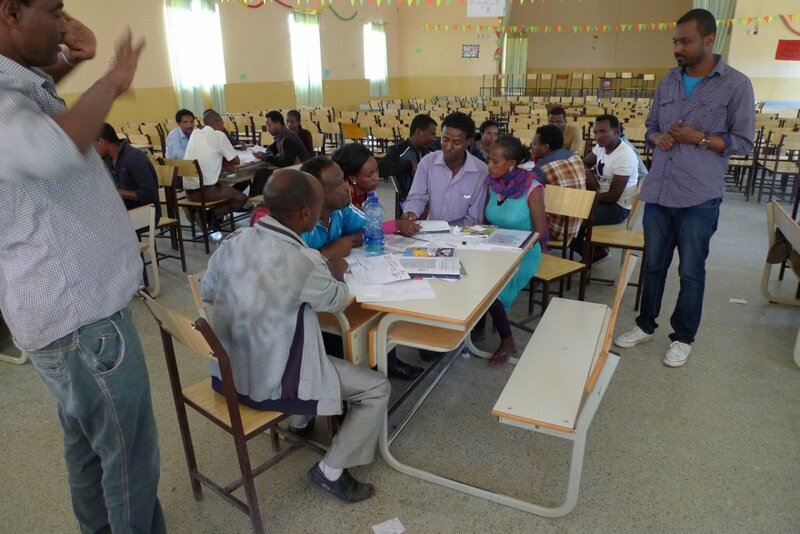 Whole School Staff Training for developing models of Thinking Schools in Tigray region. 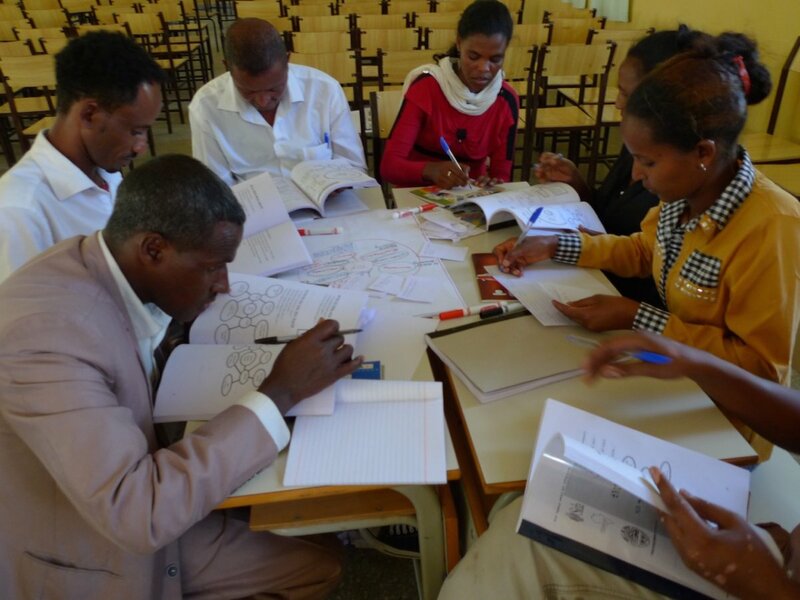 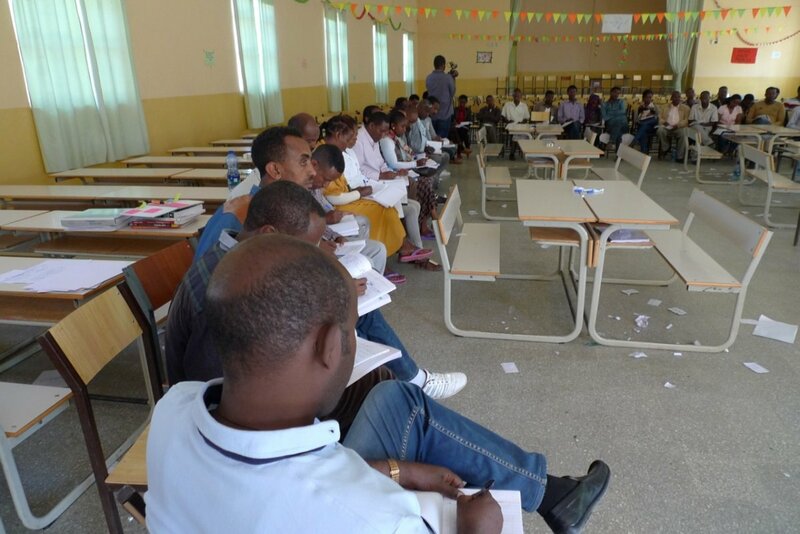 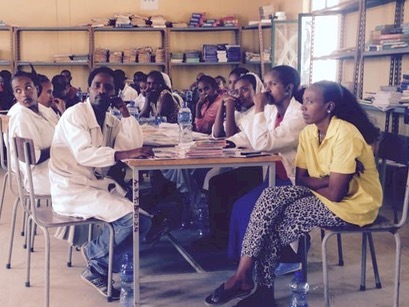 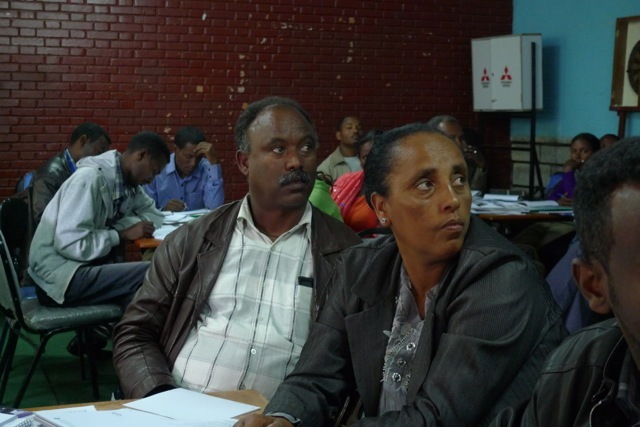 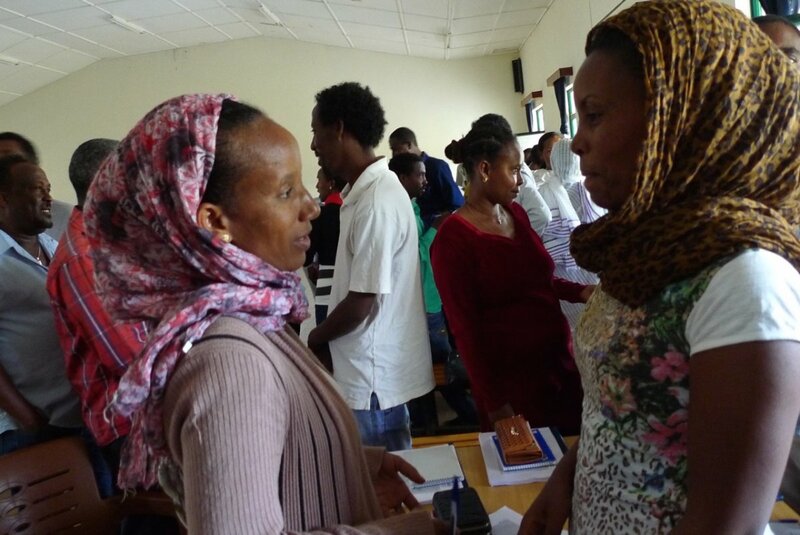 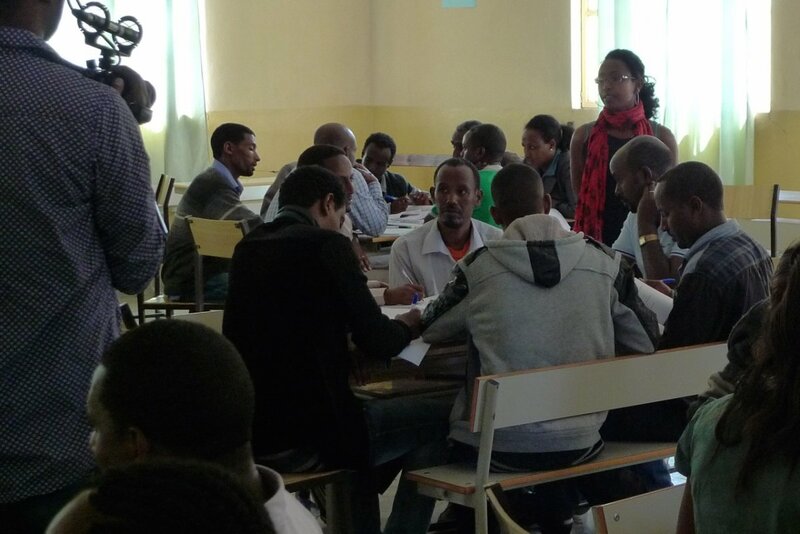 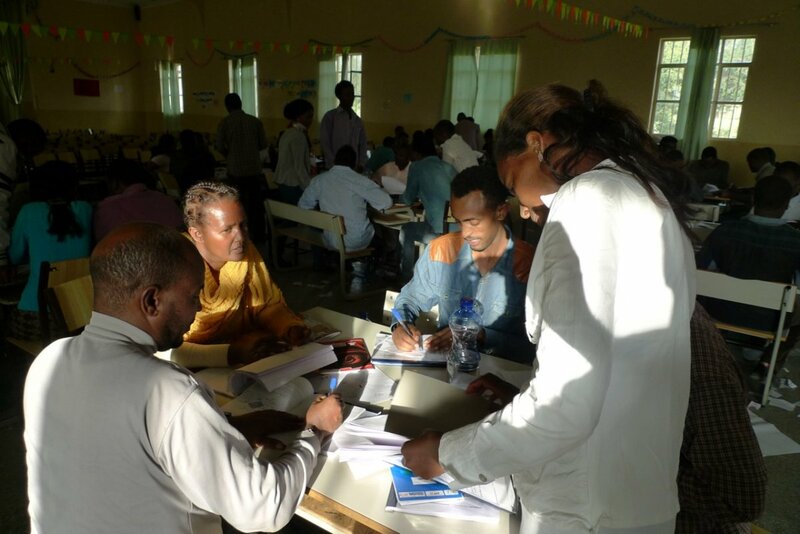 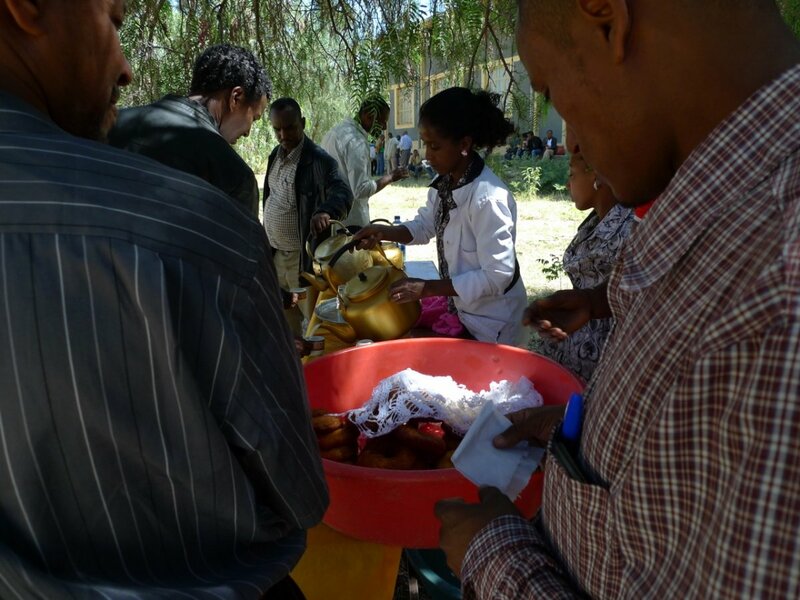 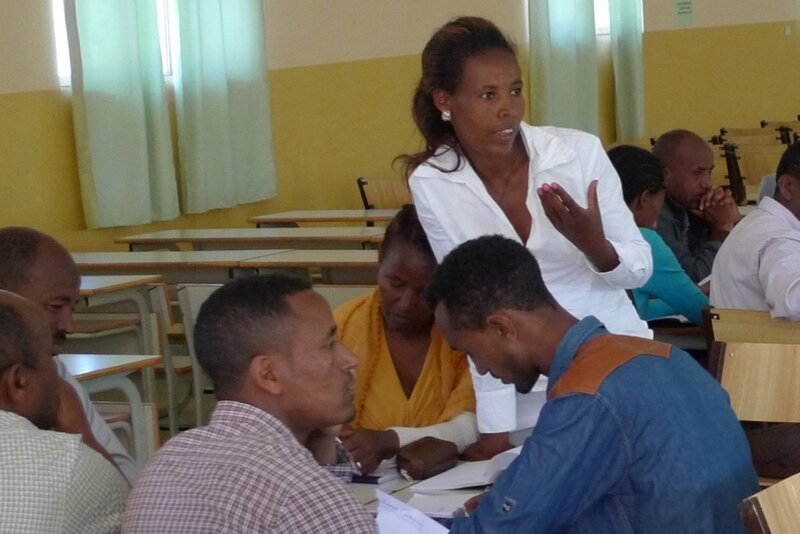 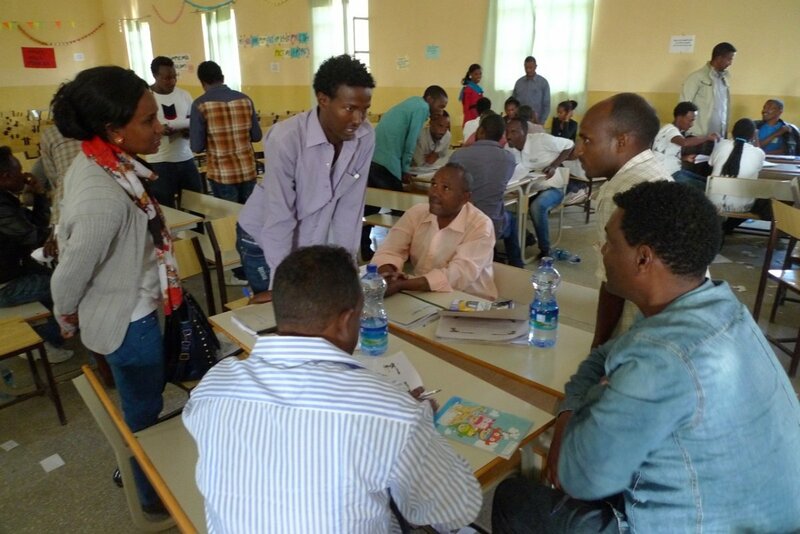 Thinking Schools International (TSI) and Thinking Schools Ethiopia (TSE) facilitated whole staff trainings for educators of 37 laboratory schools in Tigray region. 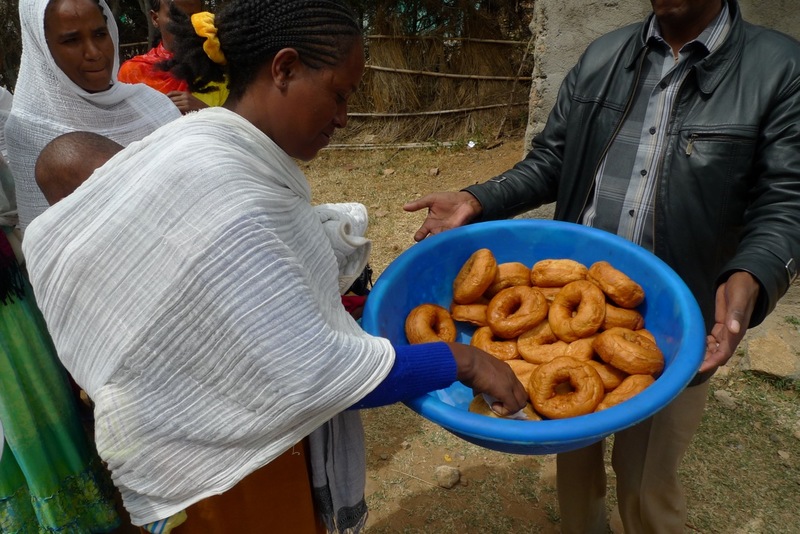 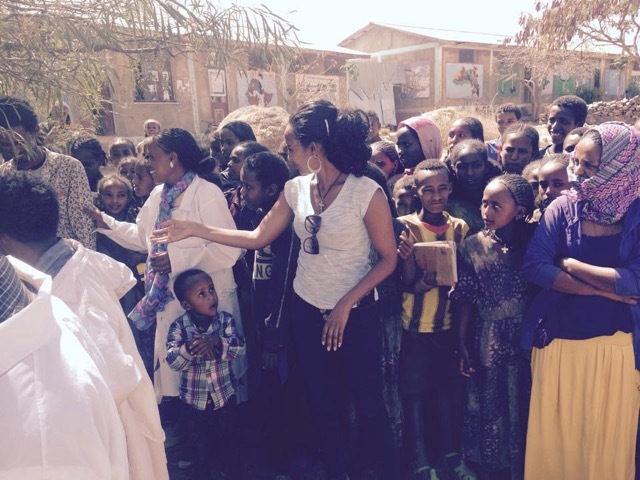 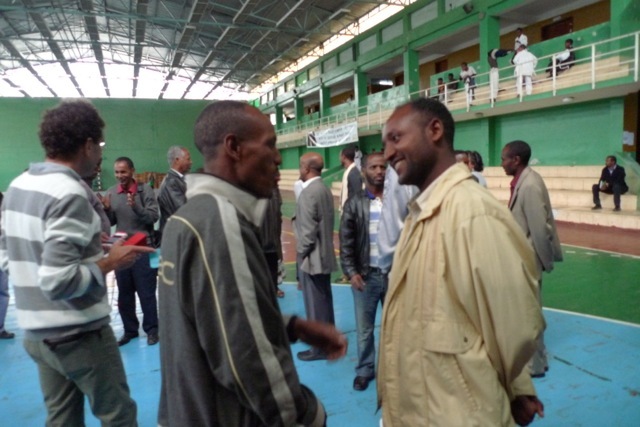 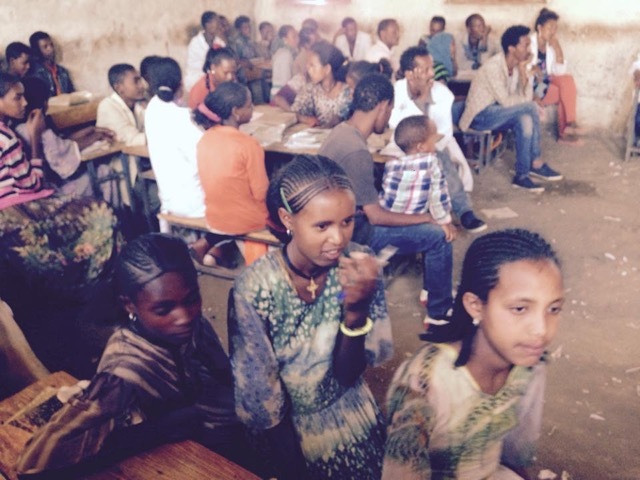 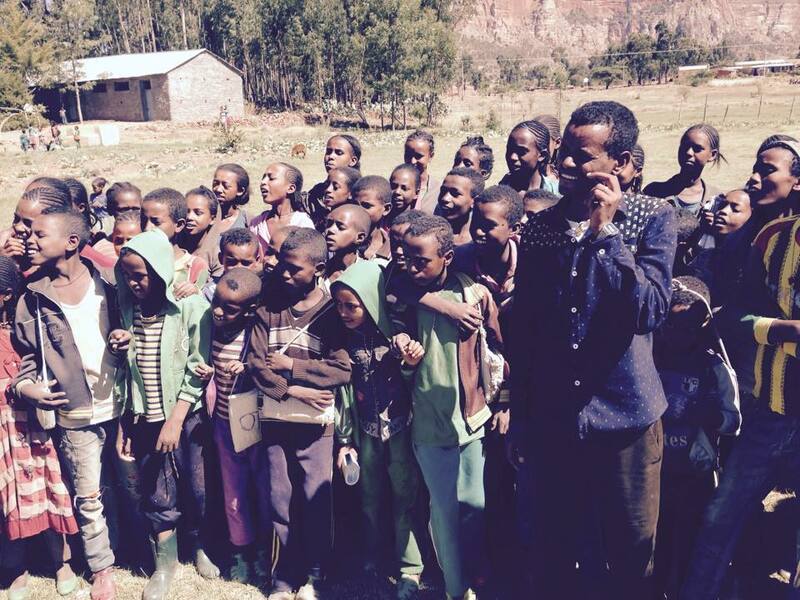 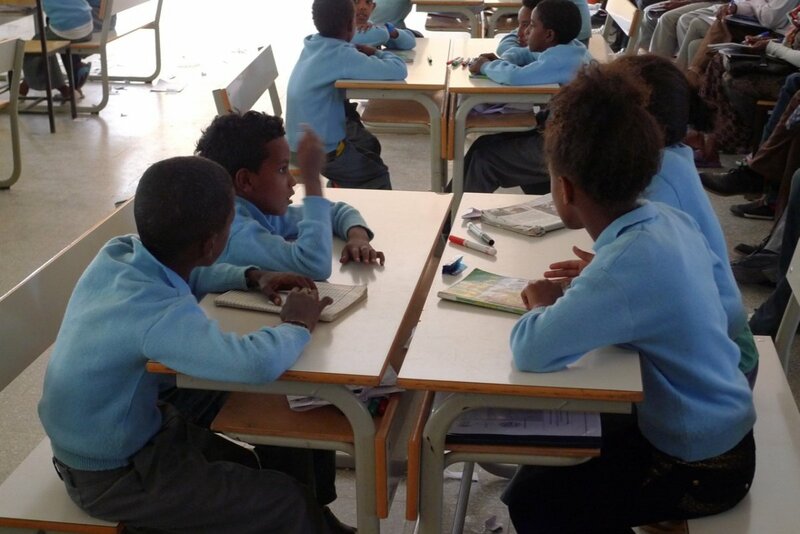 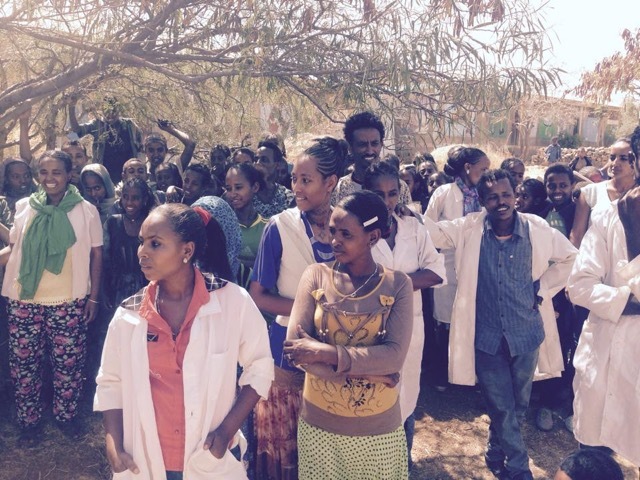 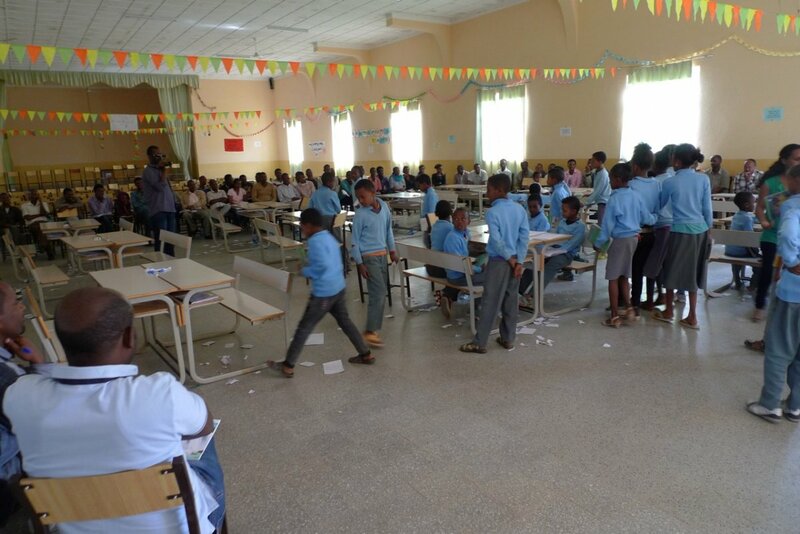 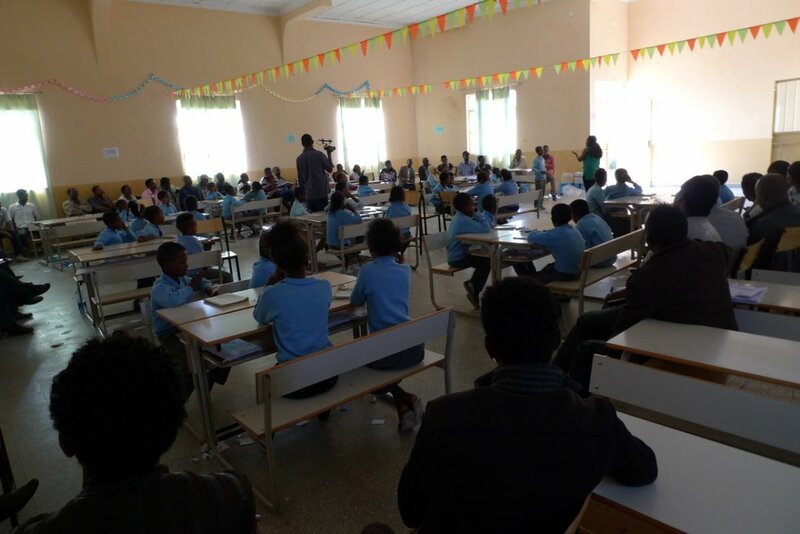 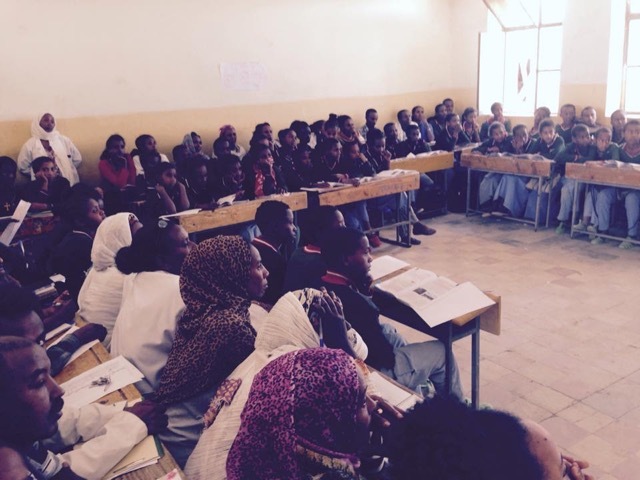 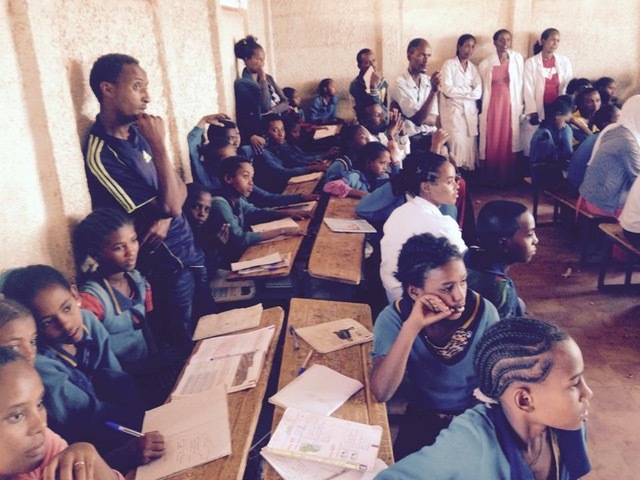 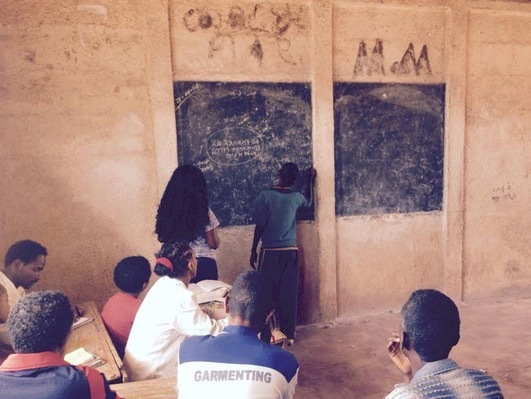 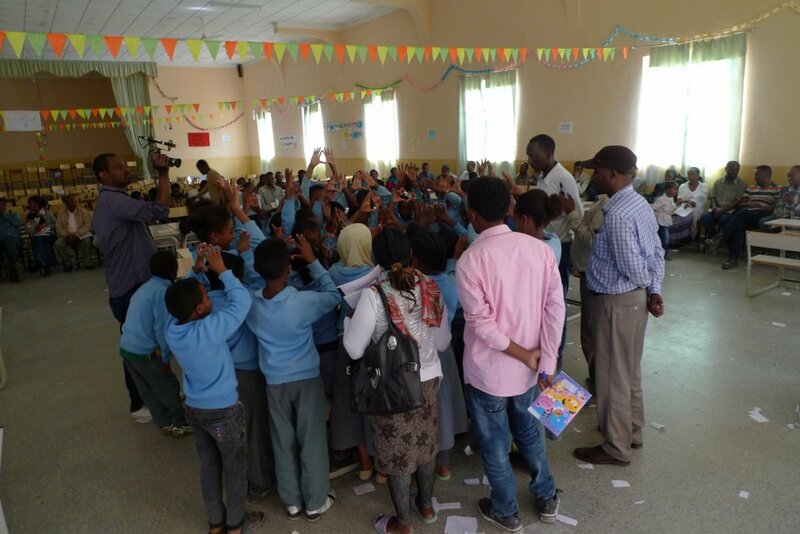 The schools involved two primary schools and a high school from each of the 12 Weredas of the Zonal Administrations in Tigray and one additional school in the Mekelle area. 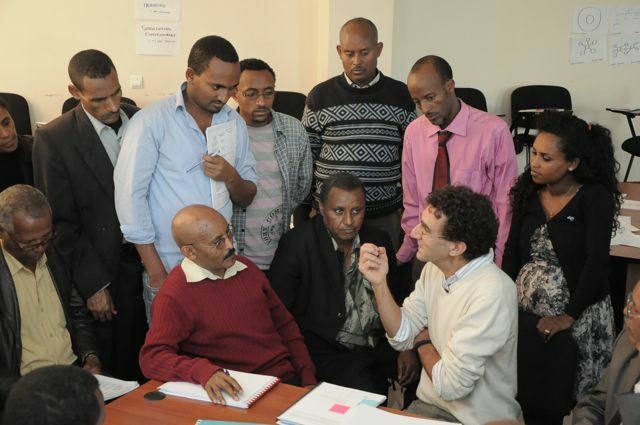 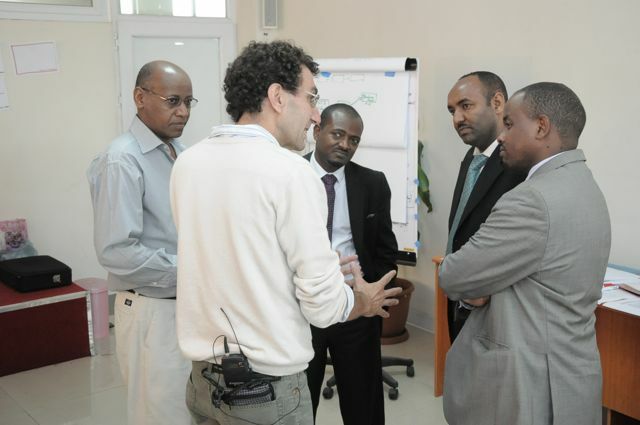 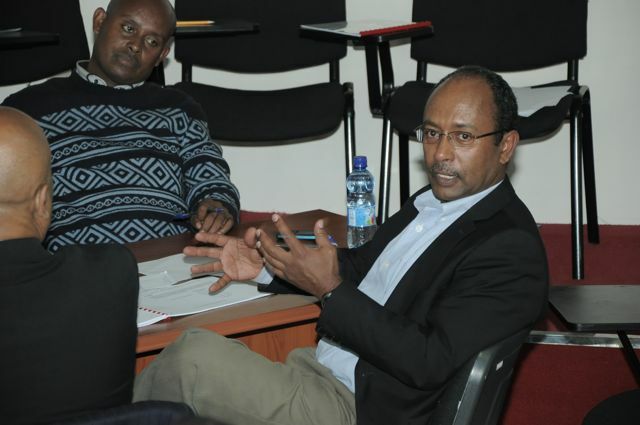 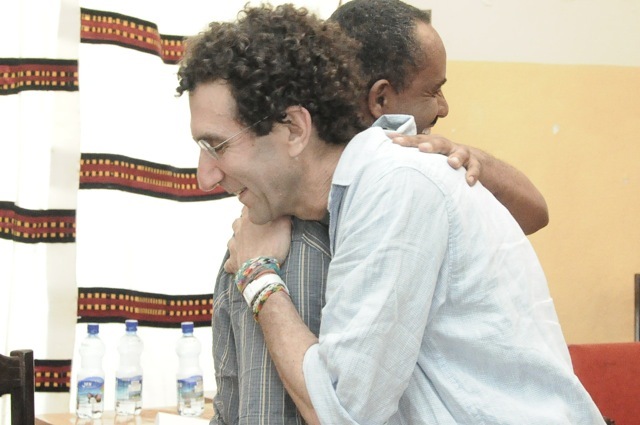 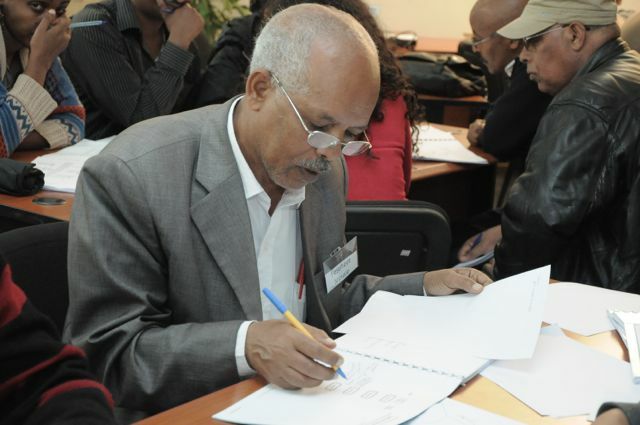 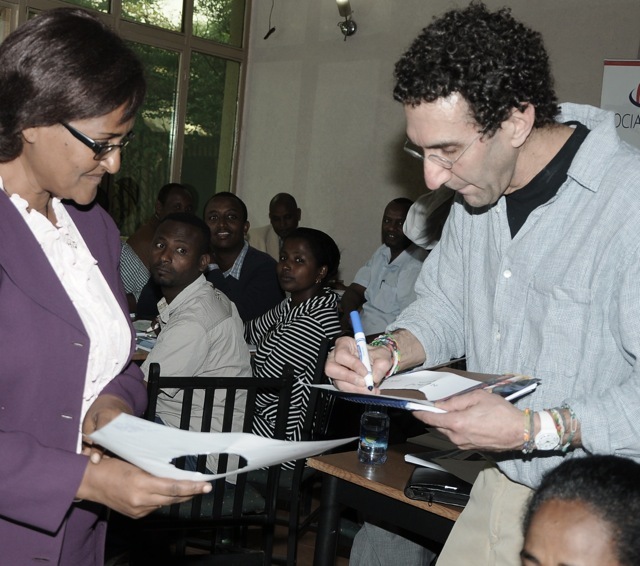 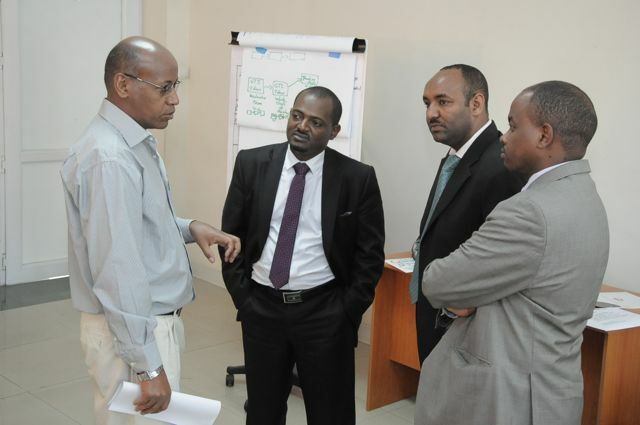 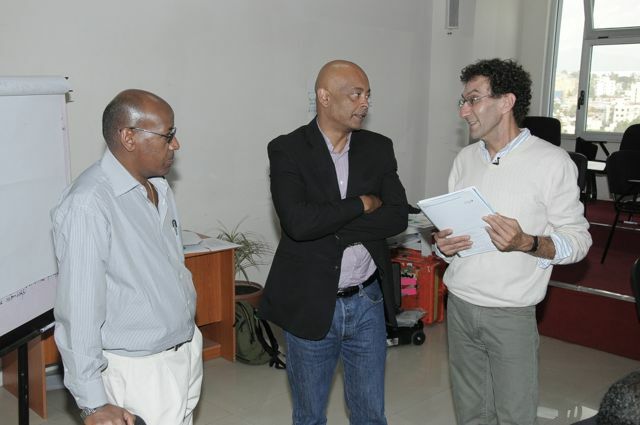 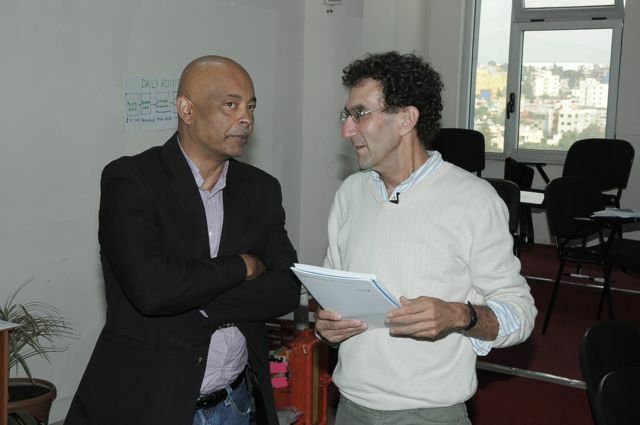 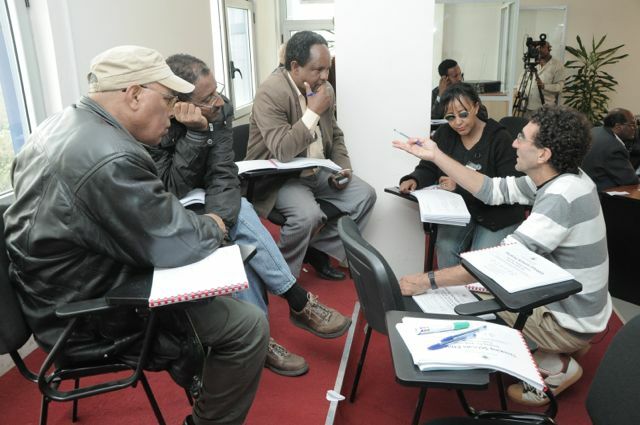 The TSI Global Trainer Robert Seth Price, and the TSE Global Trainers Atsede Tsehayou and Dagim Melese collaborated on facilitating the professional development. 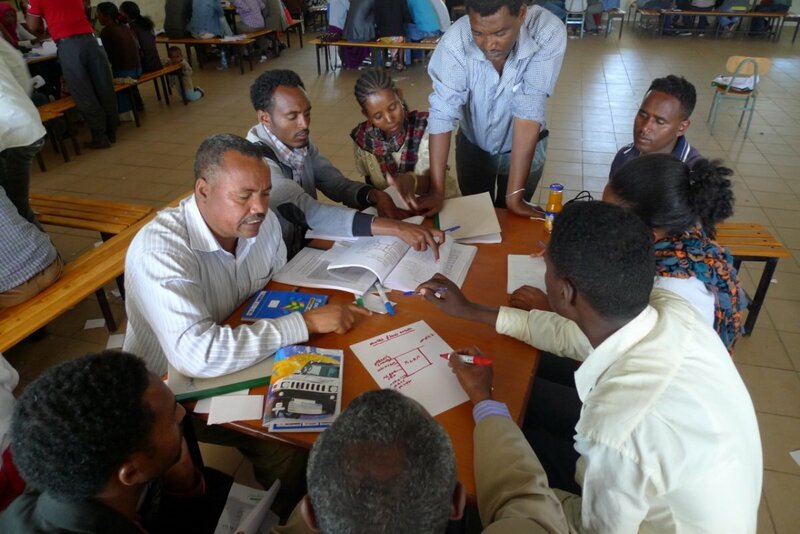 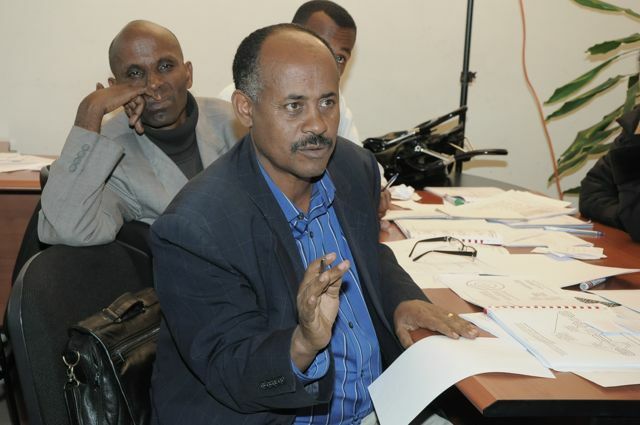 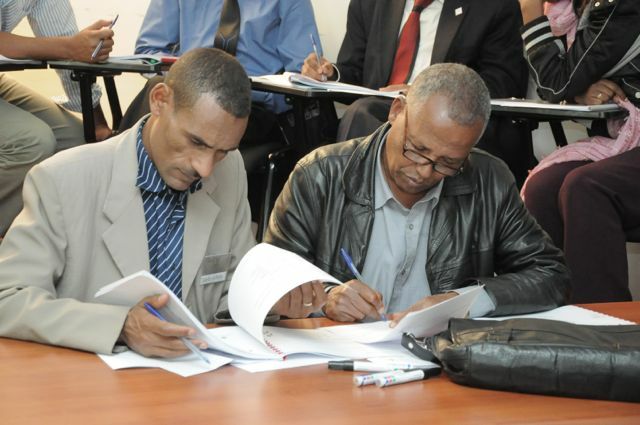 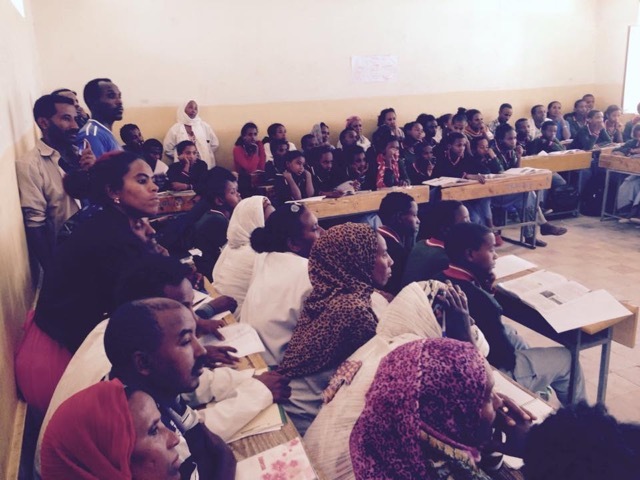 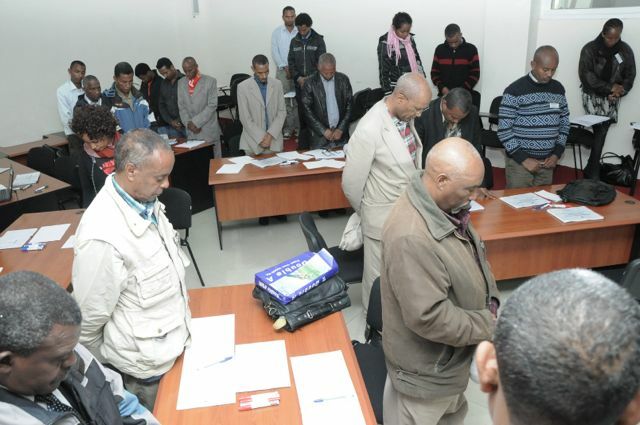 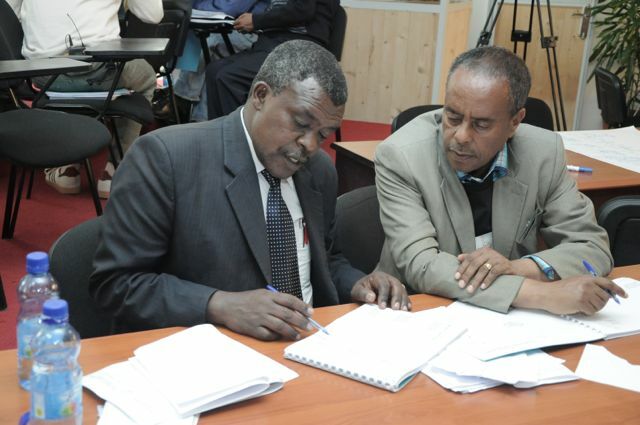 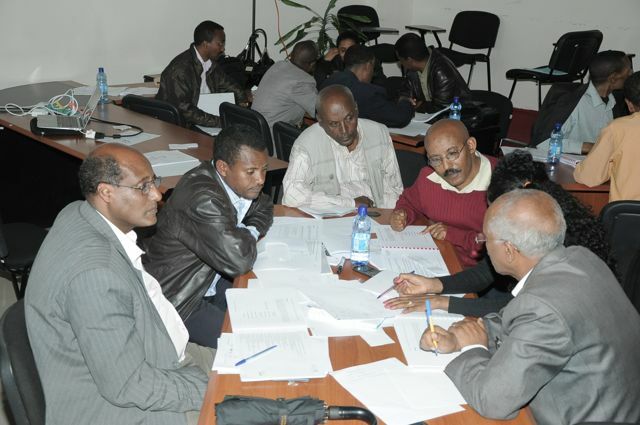 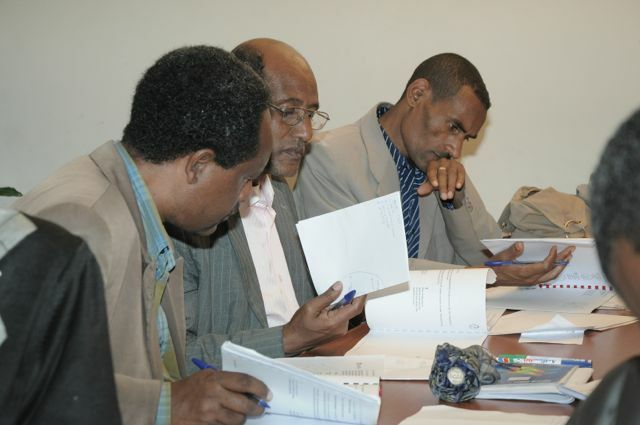 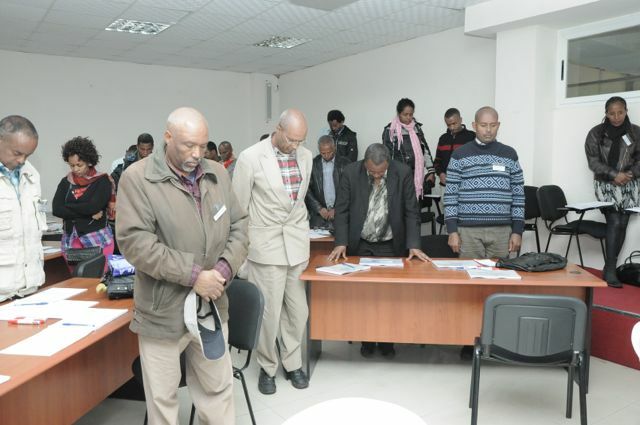 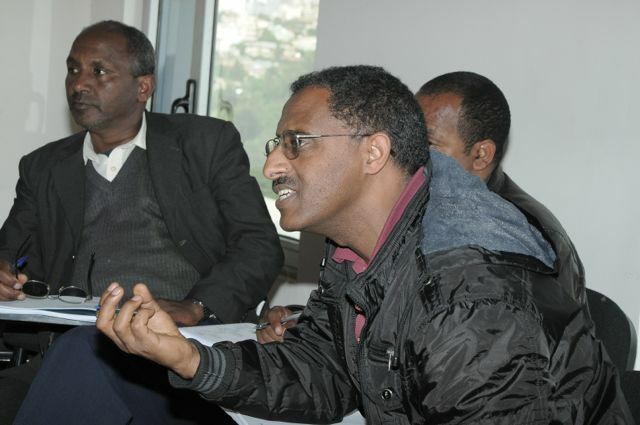 the region TDA (Tigray Development Association) planned the development of 37 Thinking Schools in 12 Weredas of the region. 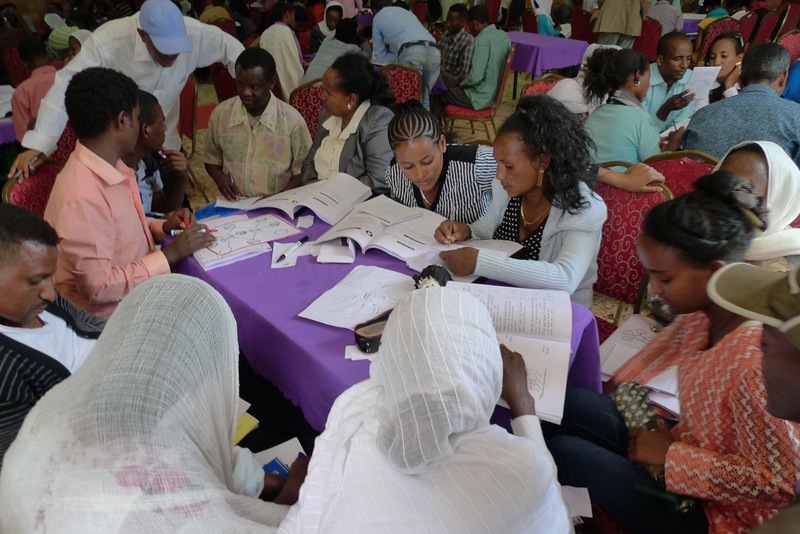 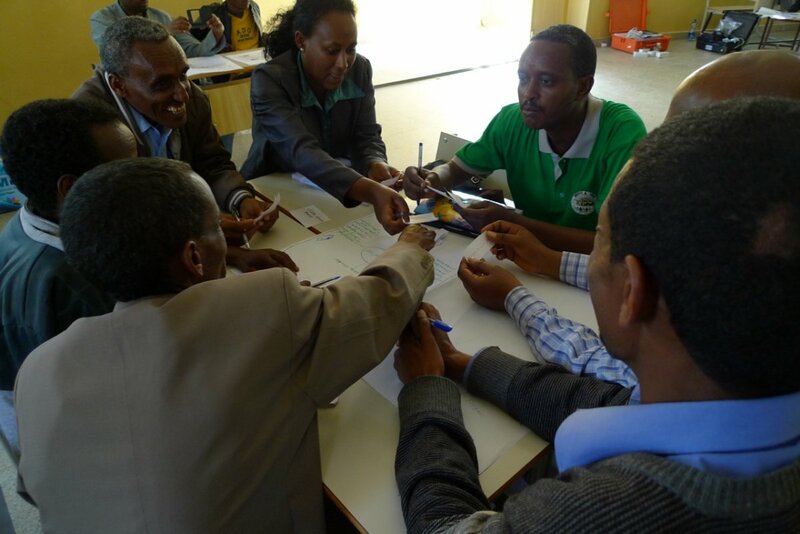 Following from the principle of whole school transformational change processes the training then was facilitated to most of educators at Wukiro , Aksum and Shira training sites. 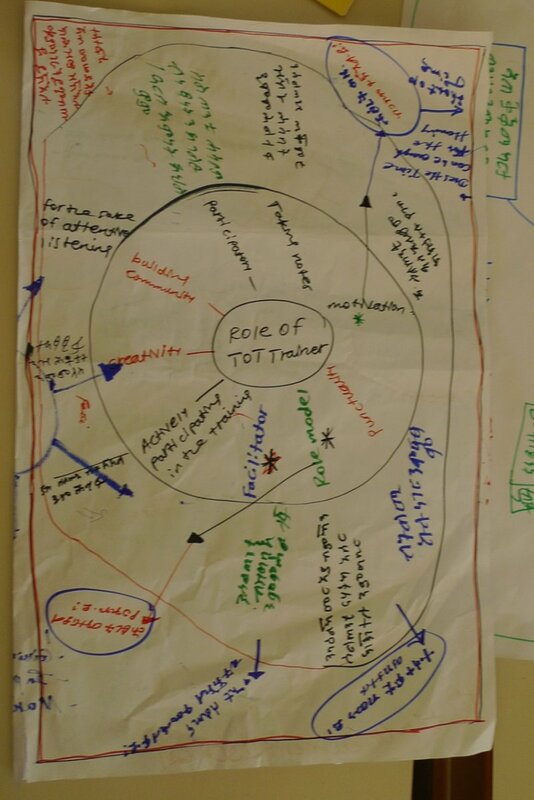 A strategic plan by TSI global trainer, Robert Seth Price, had it that a successful trainings of about 850 educators was forethought to be facilitated involving ToT trainers assuming leadership roles. 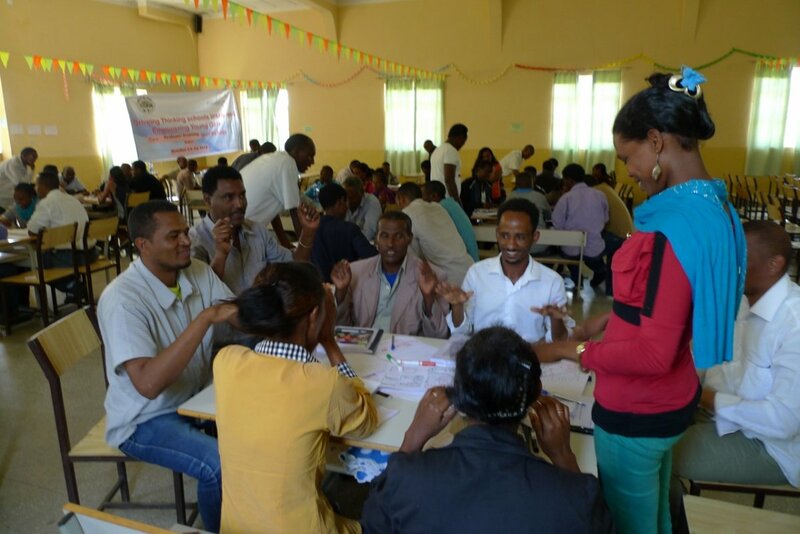 Accordingly , a four days hands on, highly interactive and participatory training was conducted for about 74 ToT trainees. 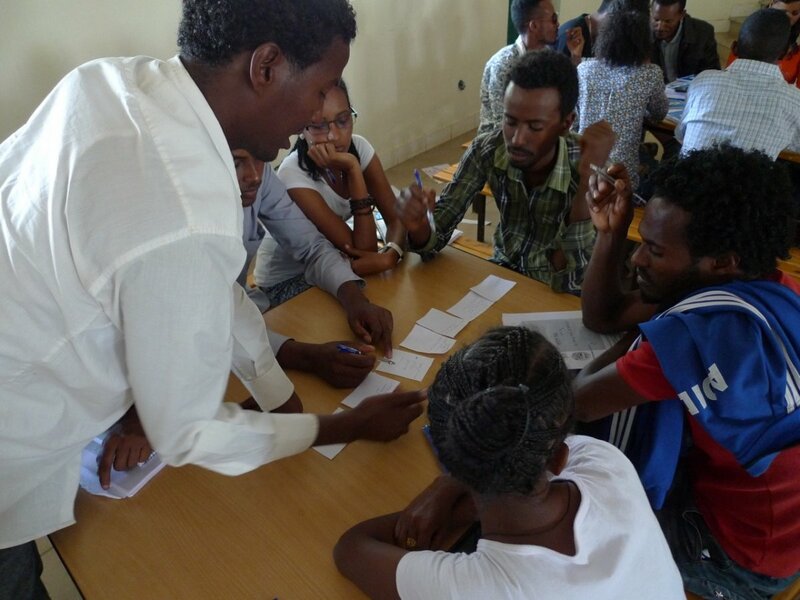 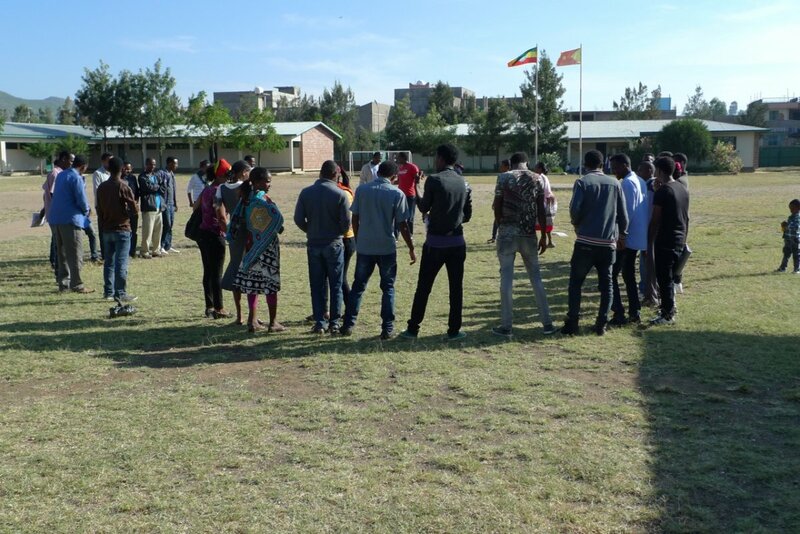 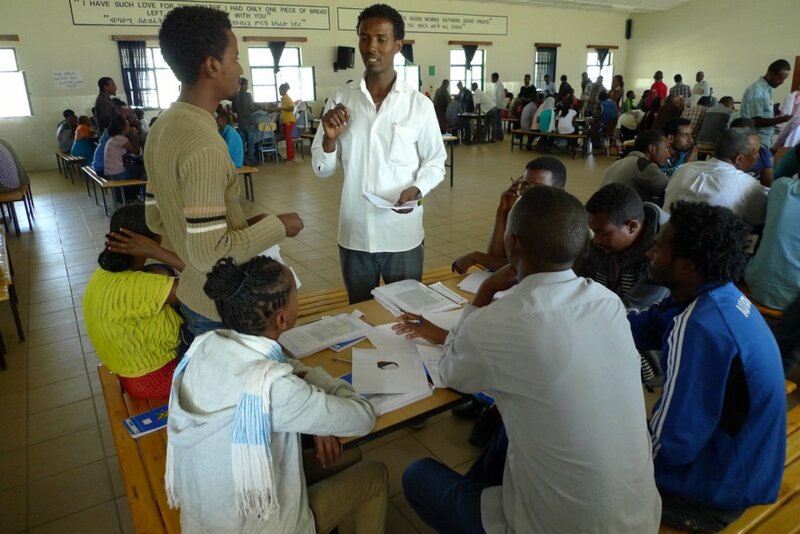 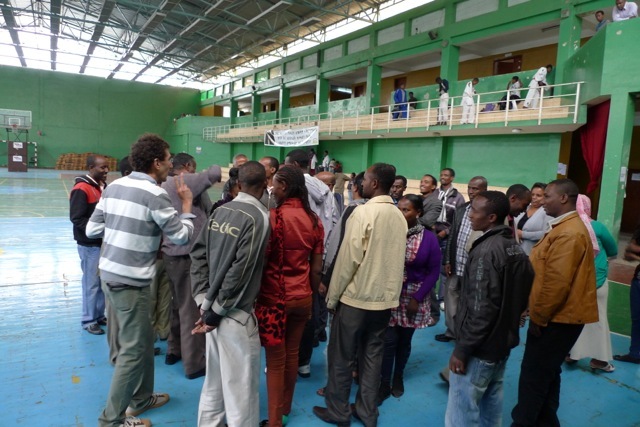 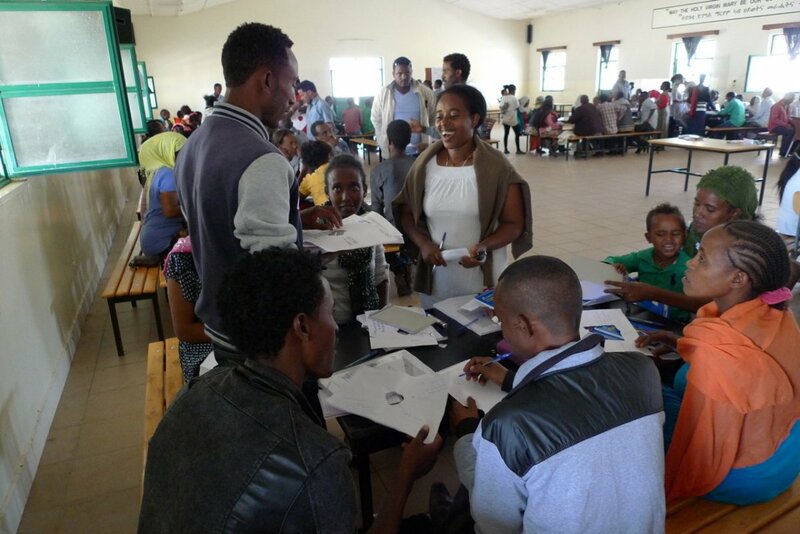 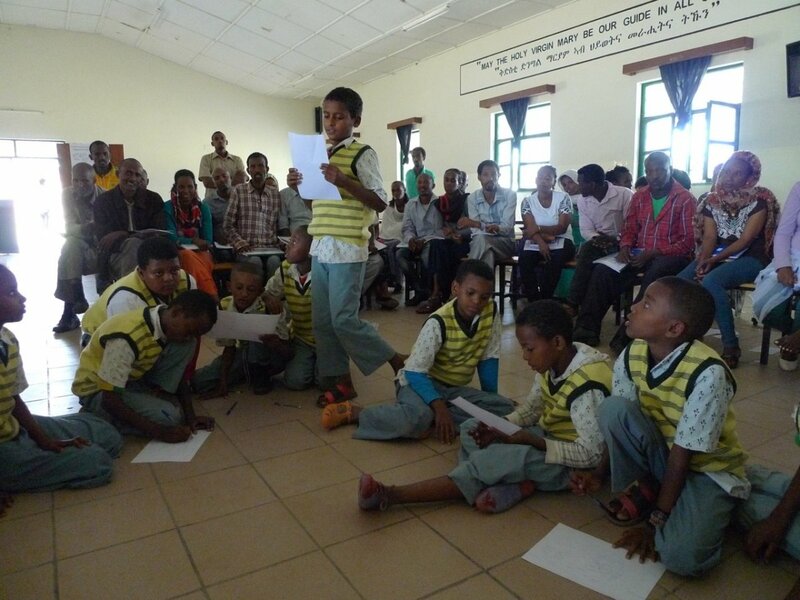 The training involved a demonstration lesson with students conducted by a TSE trainer Atsede Tsehayou while the ToT trainers were observing, recording their questions and observations. 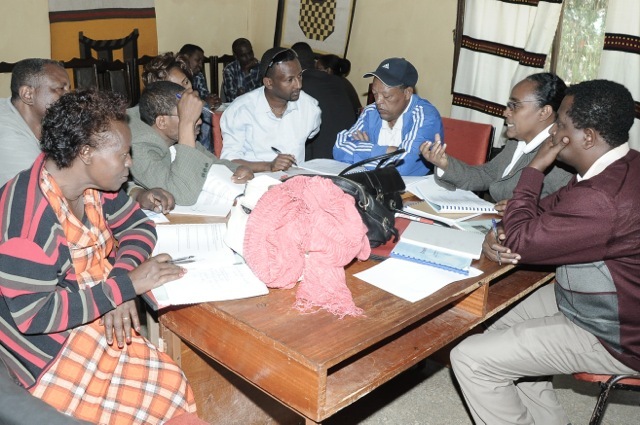 This was followed by discussions on the questions raised and observations aired. 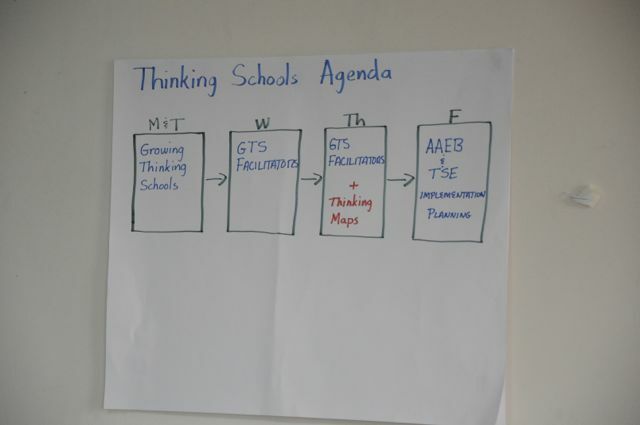 The demonstration lesson enabled ToT trainees to see the practical aspects of the pedagogical strategies, and tools the thinking schools model provides. 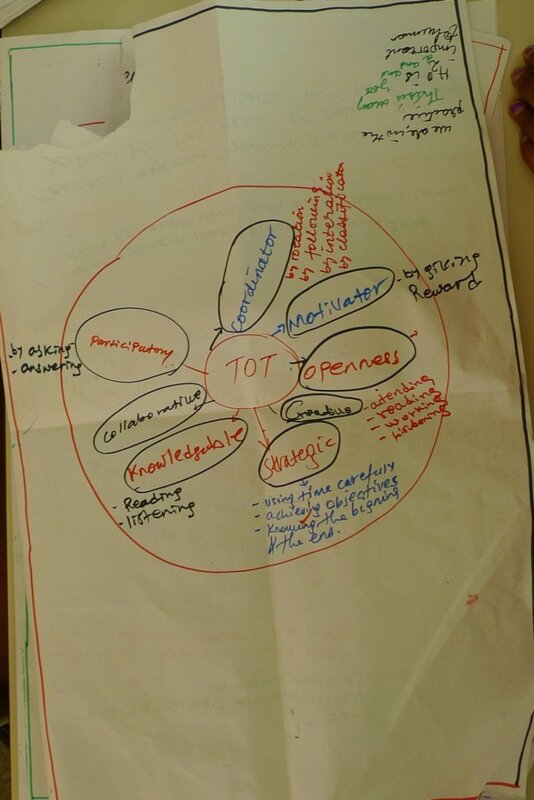 Mastery of use of Thinking Maps with frame of reference, exercising elements of collaborative networking of ideas, and planning the steps/events of whole school implementation of Thinking Maps, and other pedagogical strategies were the key elements of the TOT training. 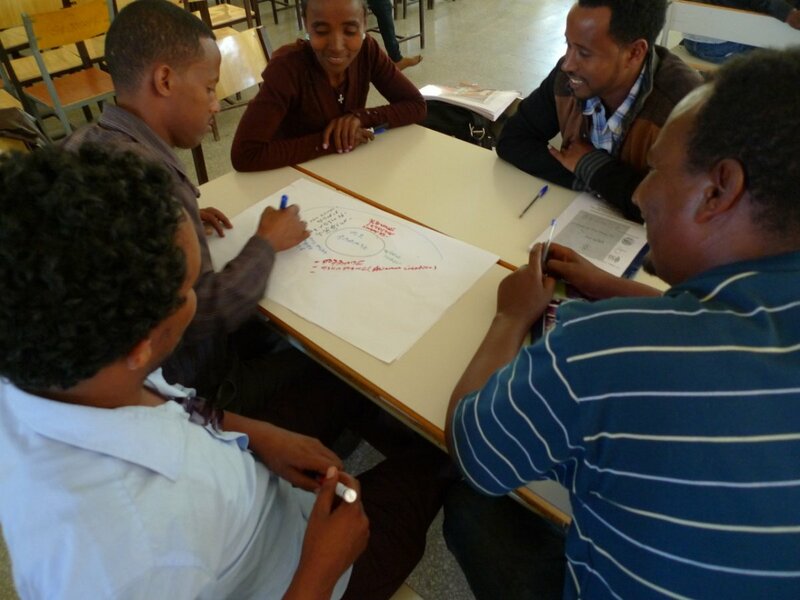 Other pedagogical methods included question for inquiry, community building exercises, and collaborative learning methods. 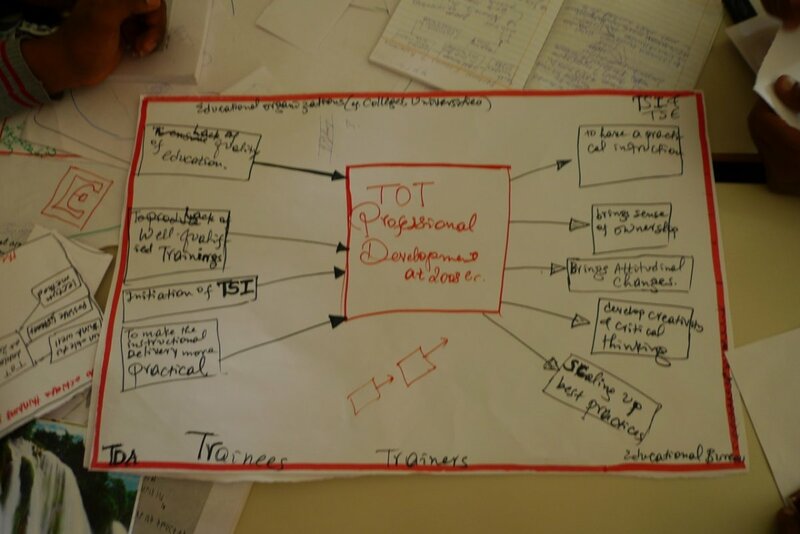 Subsequently a two days whole staff training was undertaken for over 320 teacher educators under the leadership role of the ToT trainers . 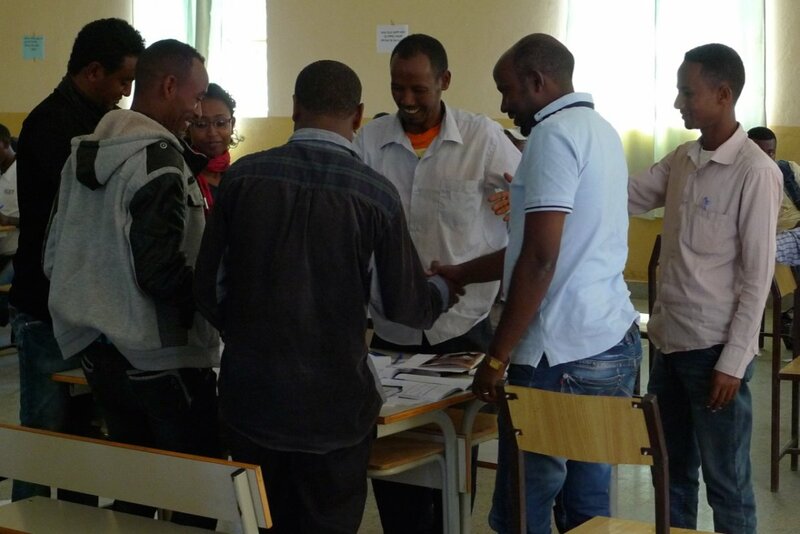 The ToT trainers played key role in effectively transferring via modeling the essential components of the training to ALL educators from Wukro. 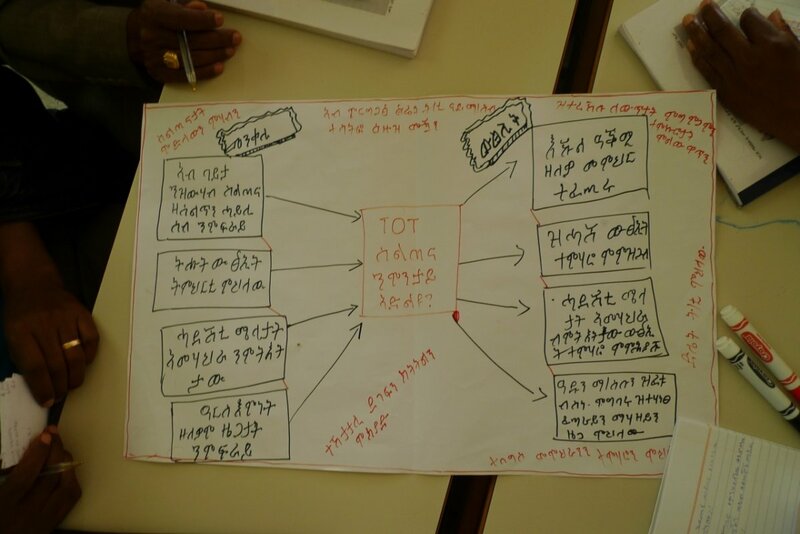 After the two days training teachers from 2 primary and 1 secondary schools from each Wereda came up with their plan (in a Flow Map) of whole school implementation of Thinking Maps in their respective schools. 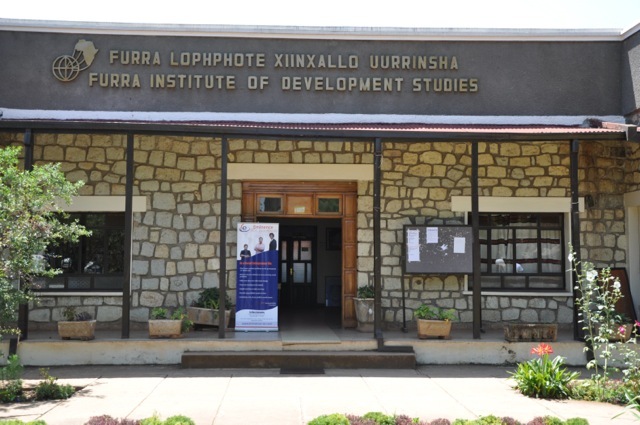 Worth mentioning it is, here, that the training hall chosen at Wukro site contributed a lot to the success of the overall training. 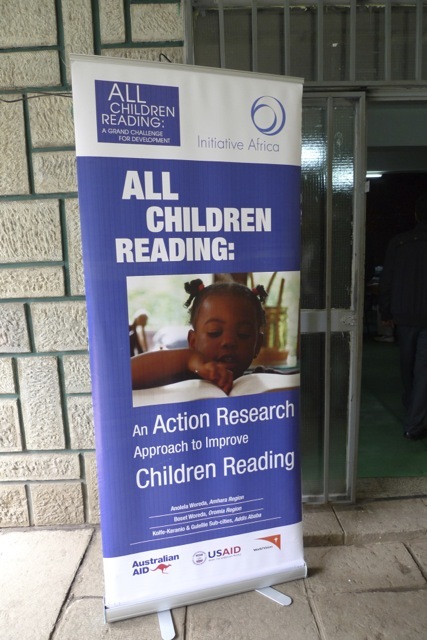 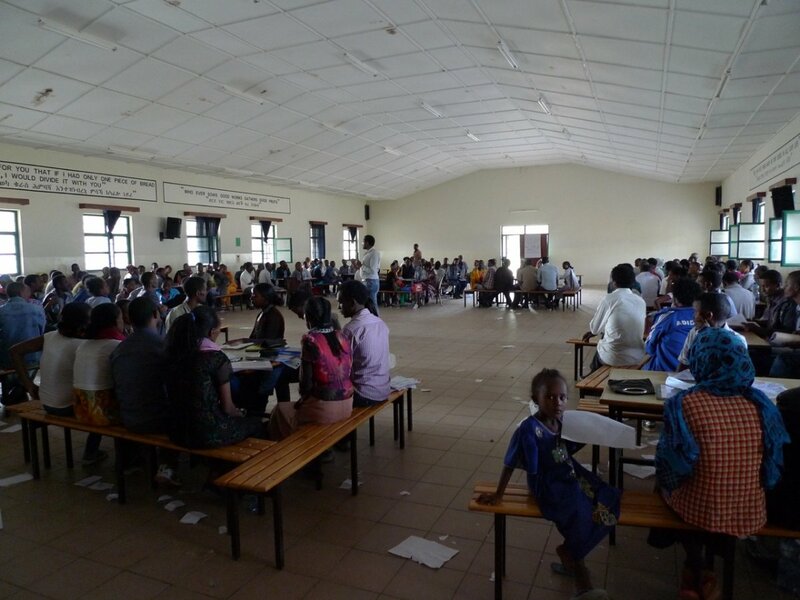 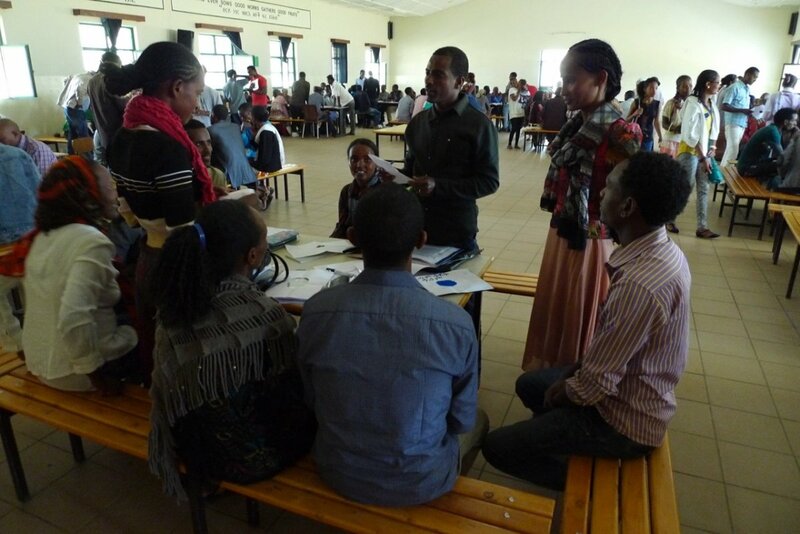 The training was in the auditorium within a Catholic School located in Wukro. 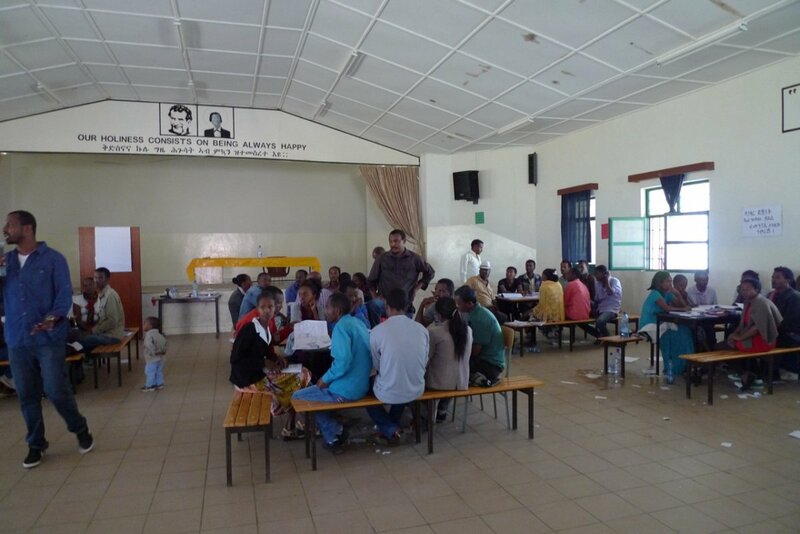 It was superb in space, excellent in sound, and sufficient quality chairs and tables for the large group. 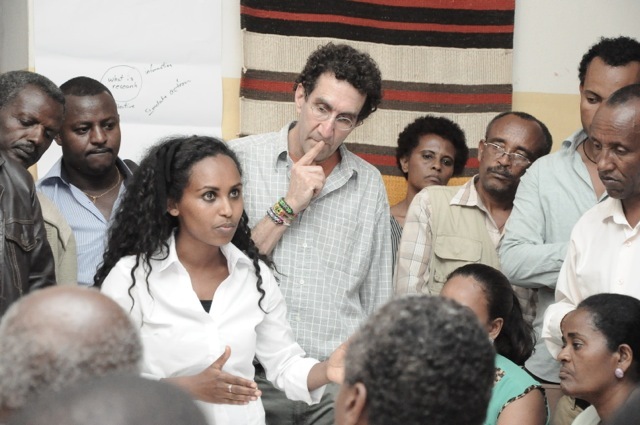 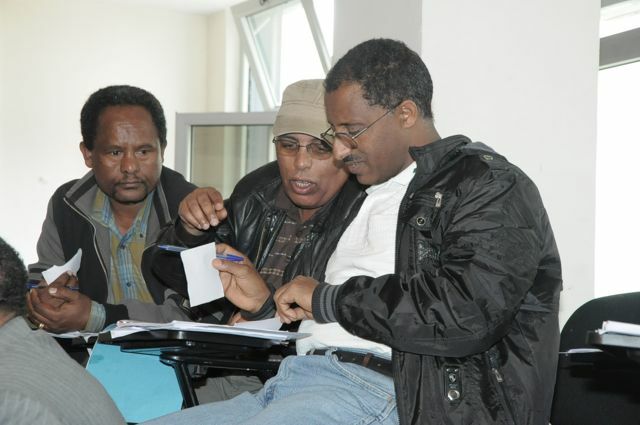 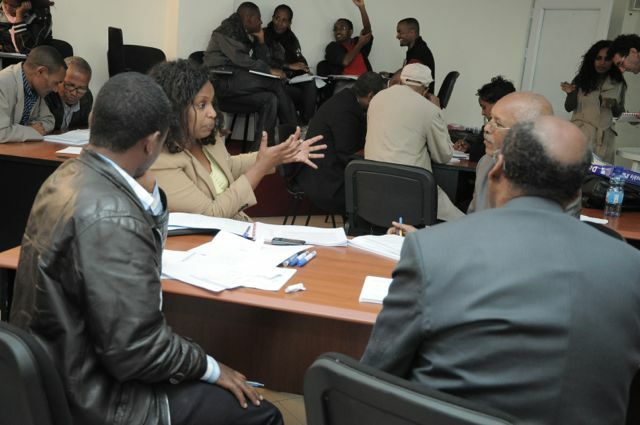 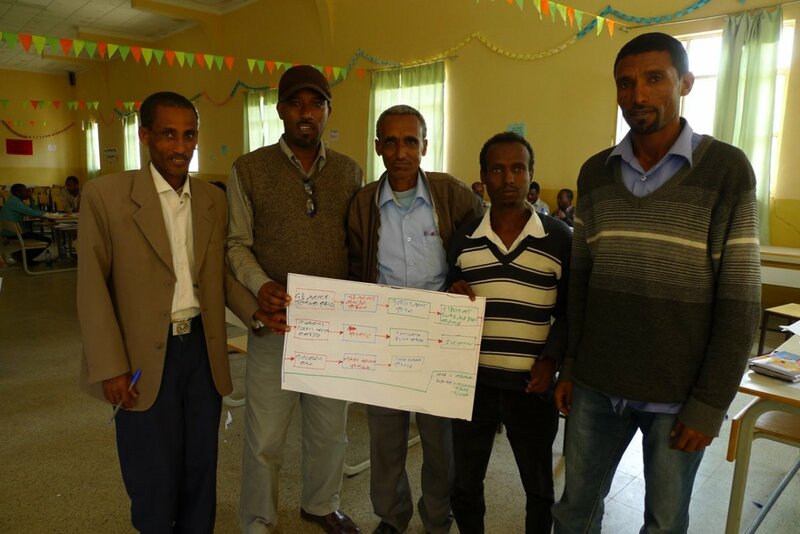 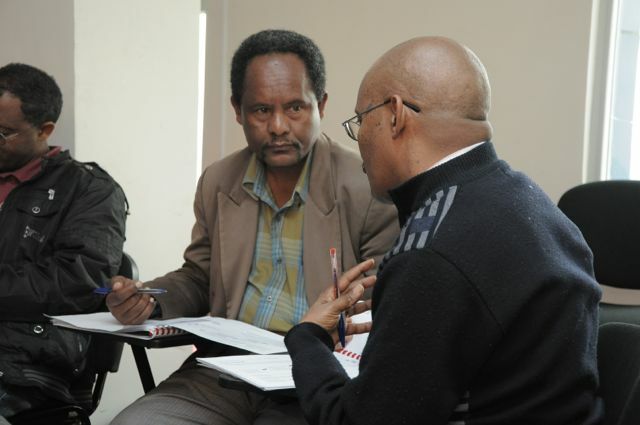 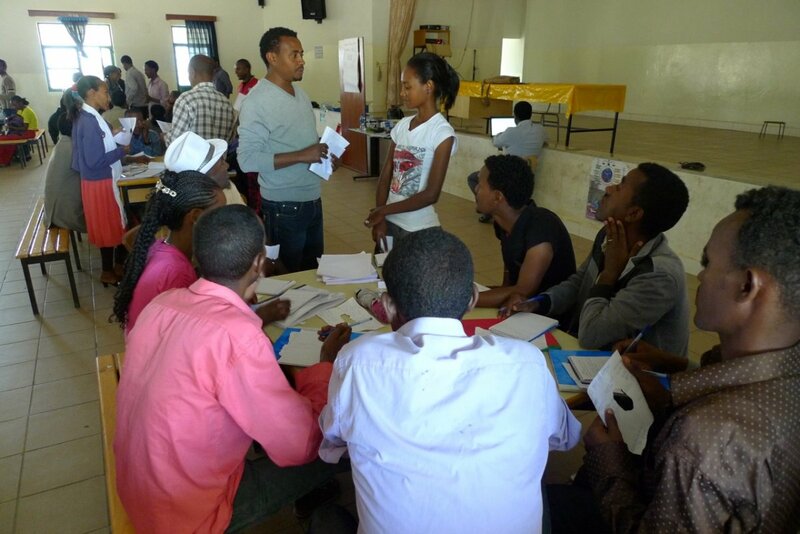 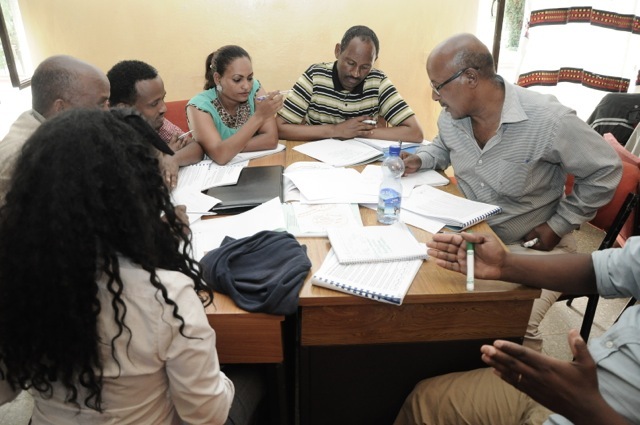 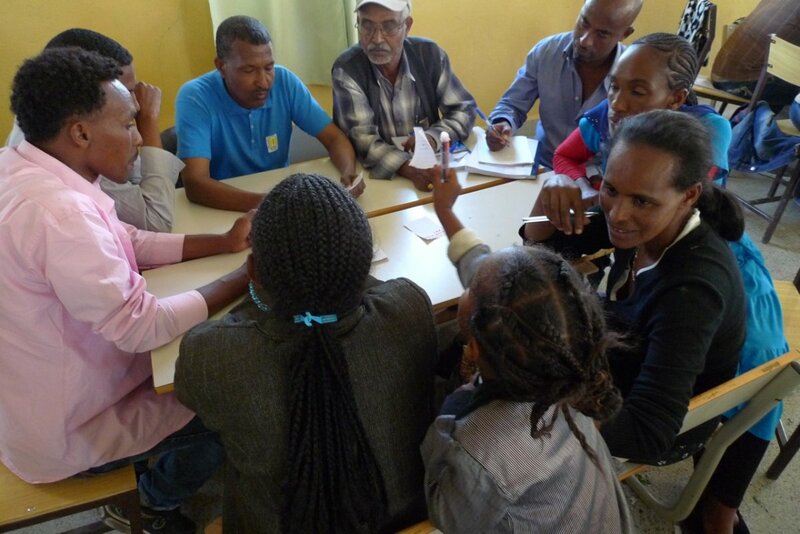 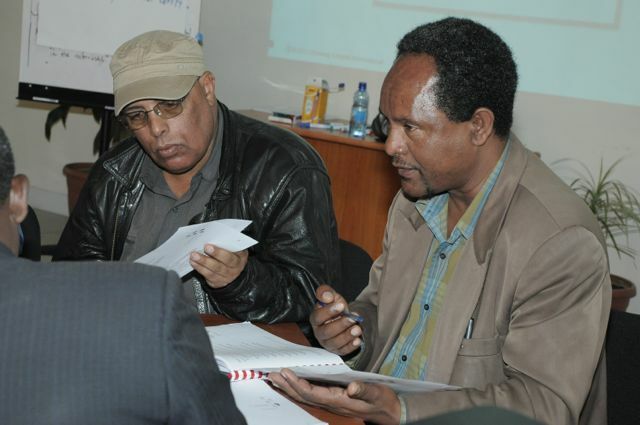 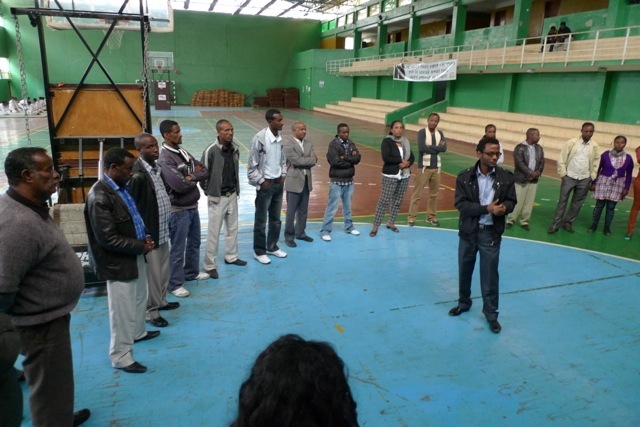 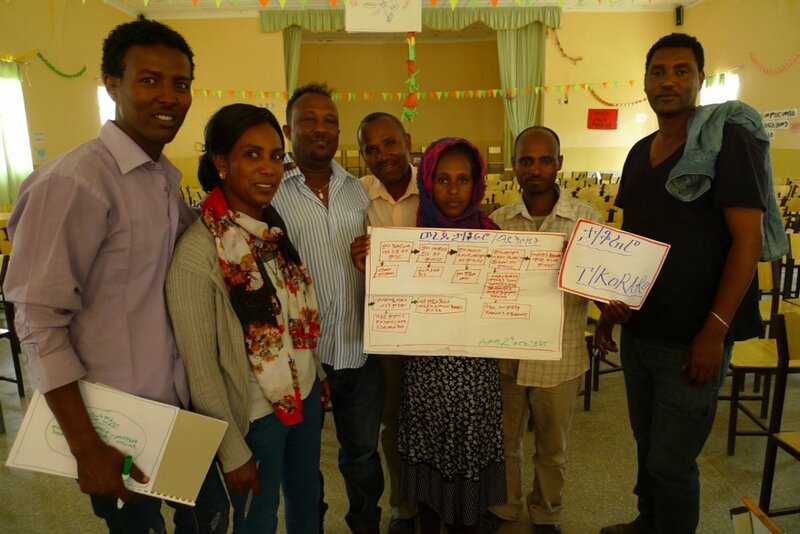 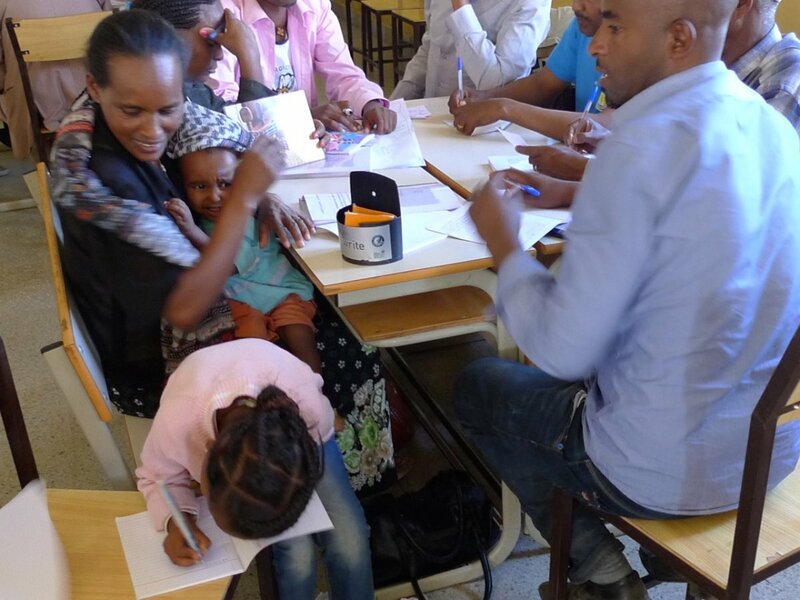 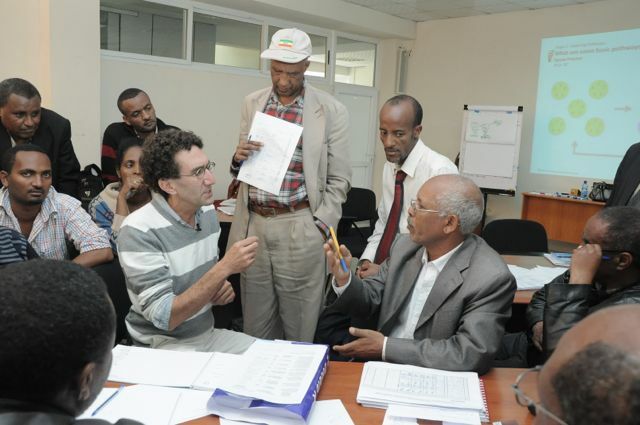 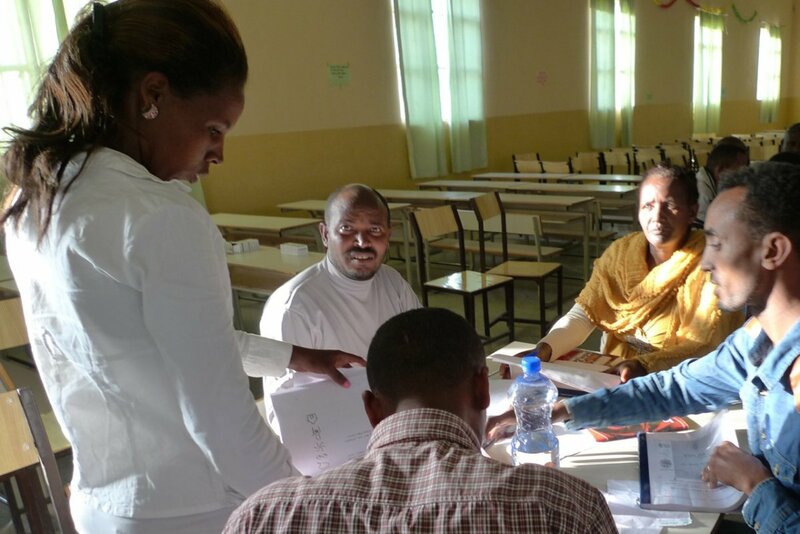 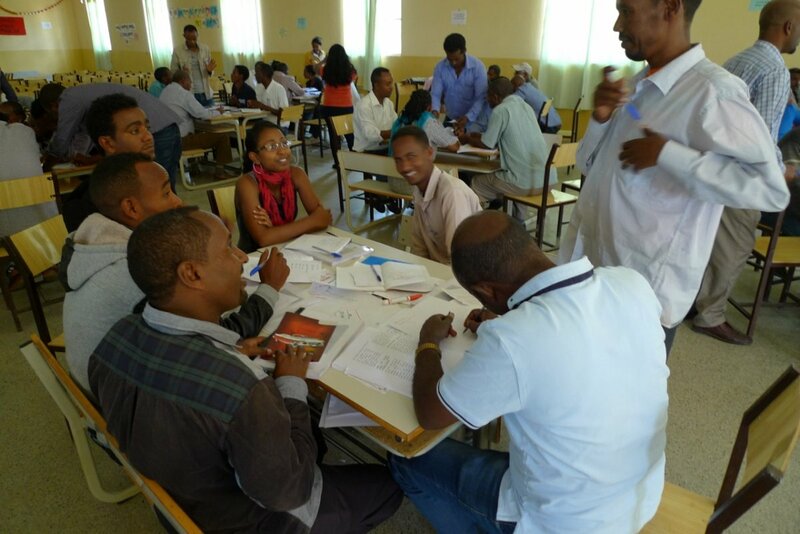 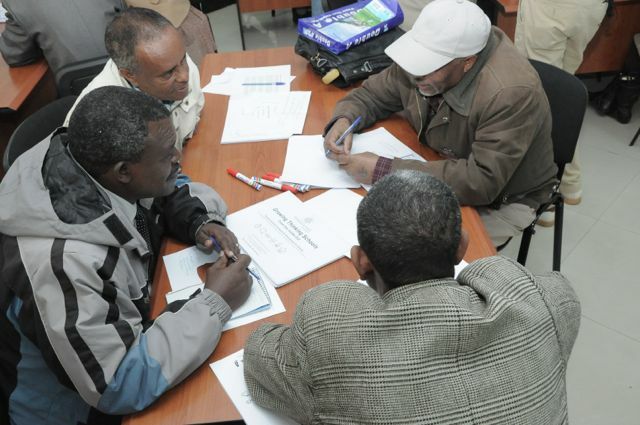 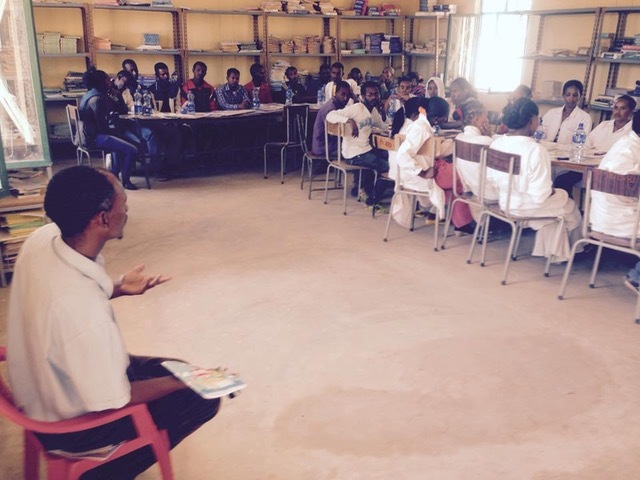 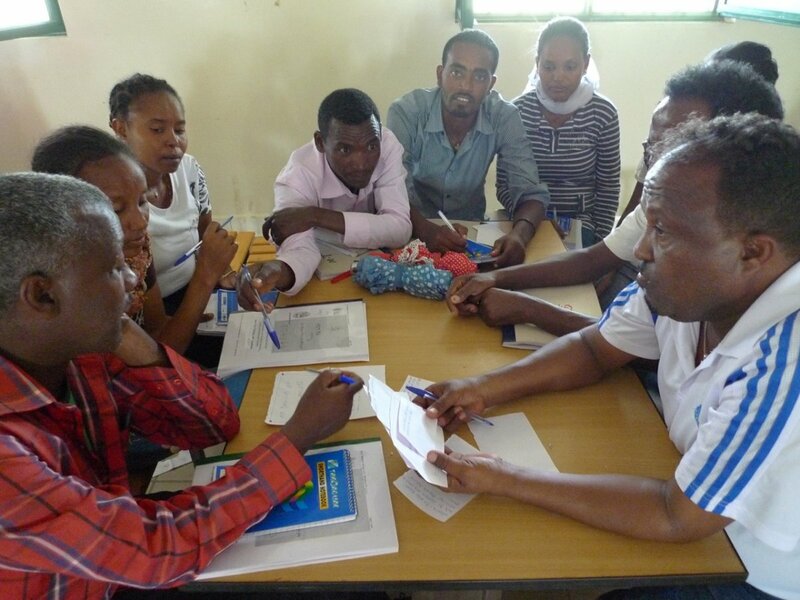 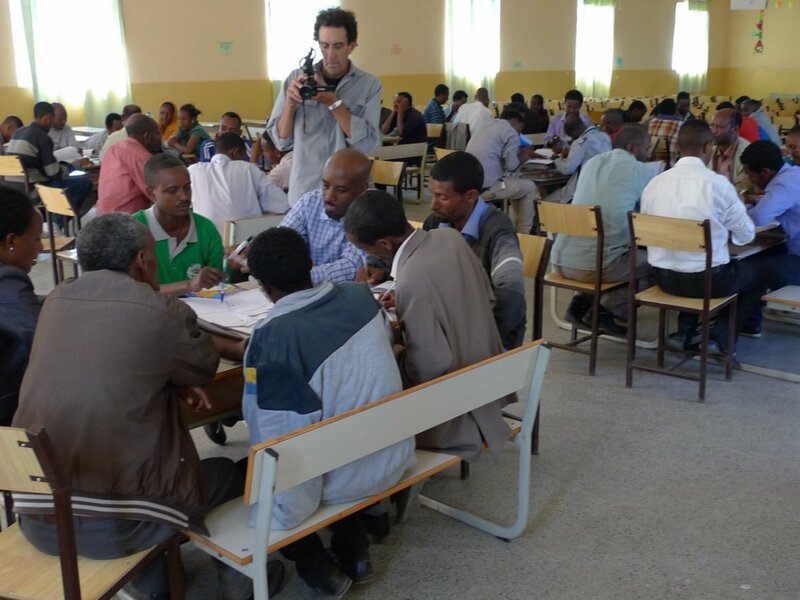 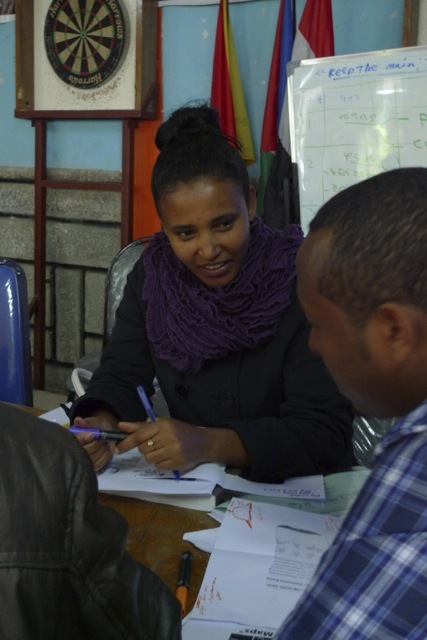 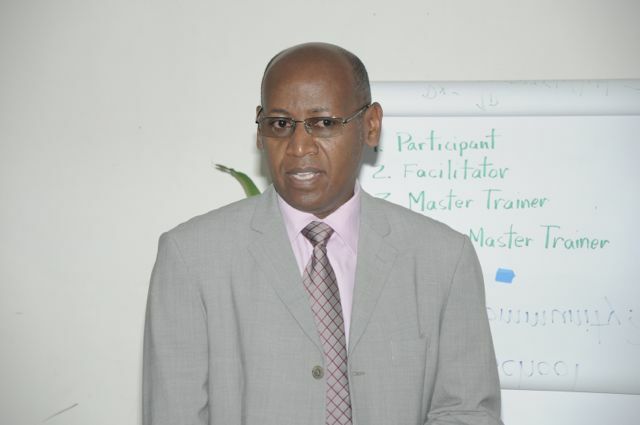 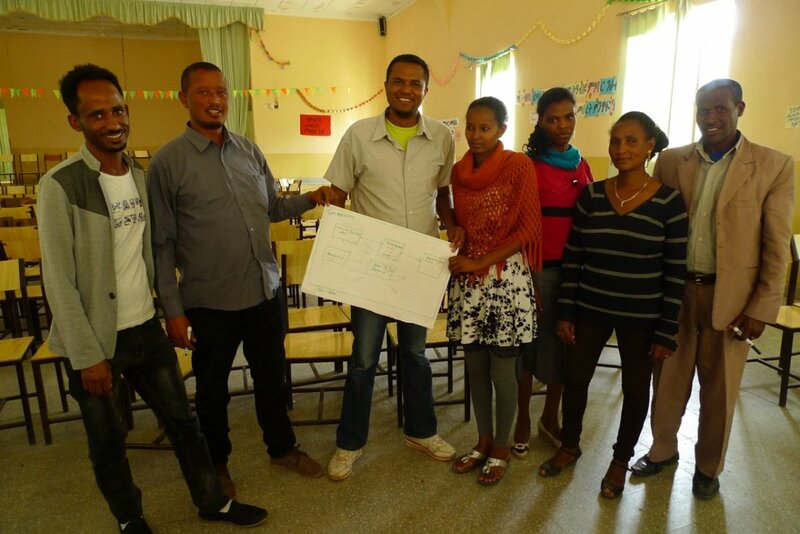 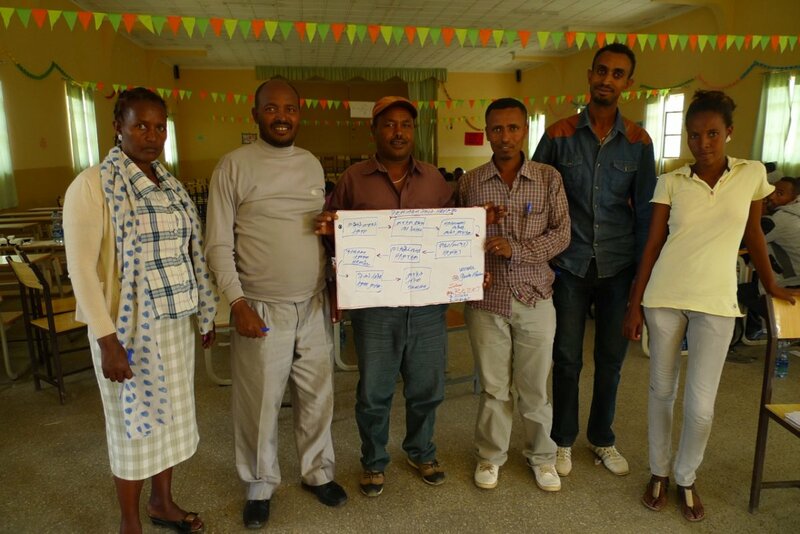 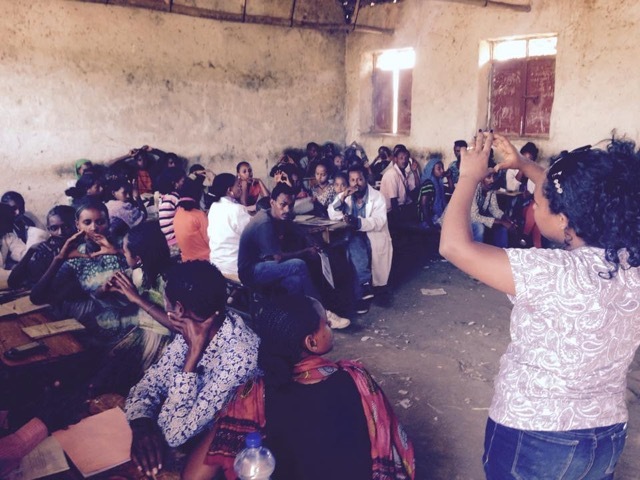 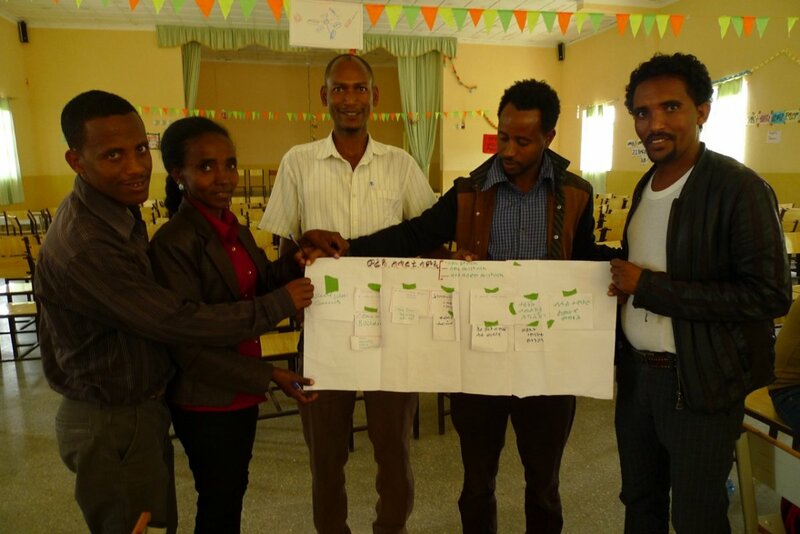 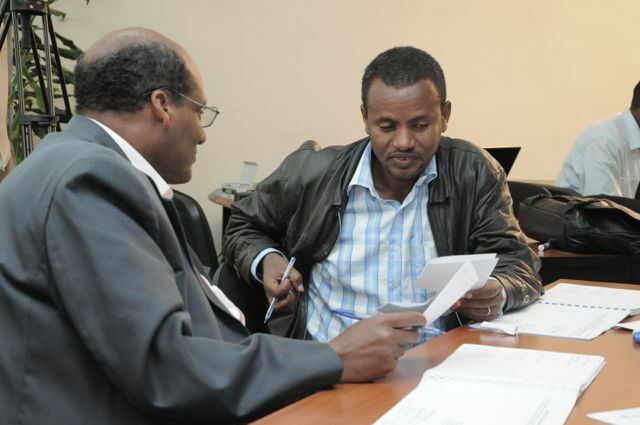 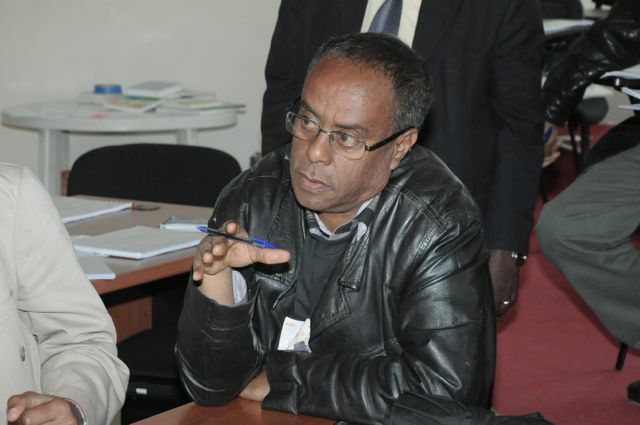 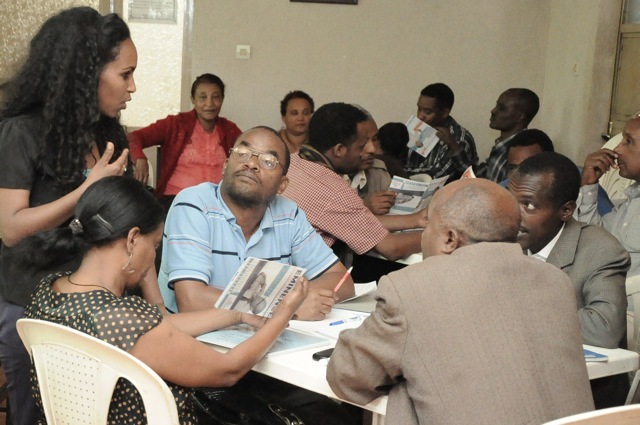 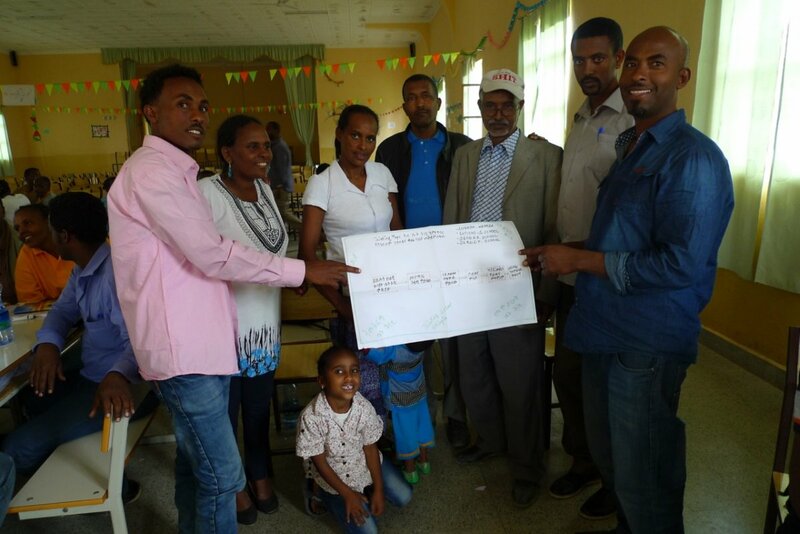 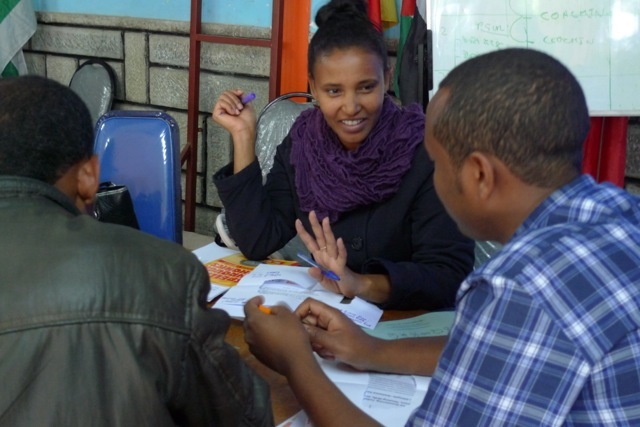 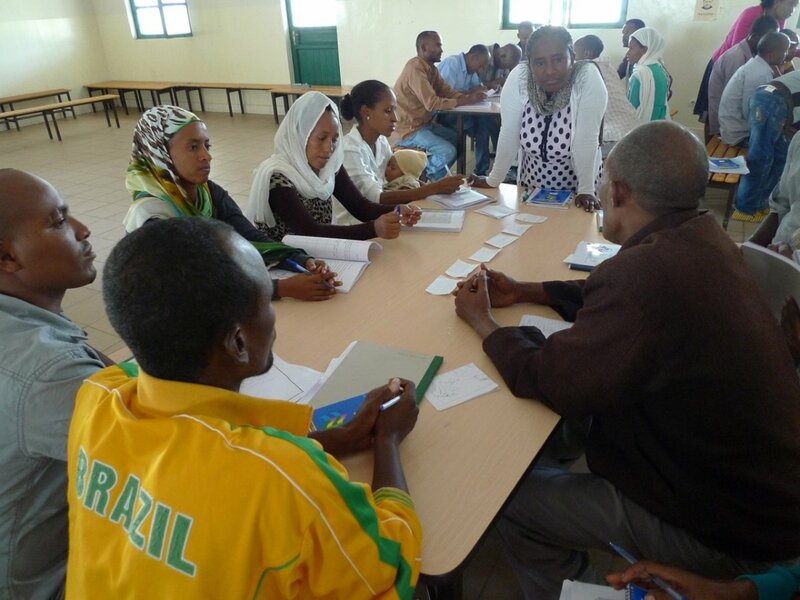 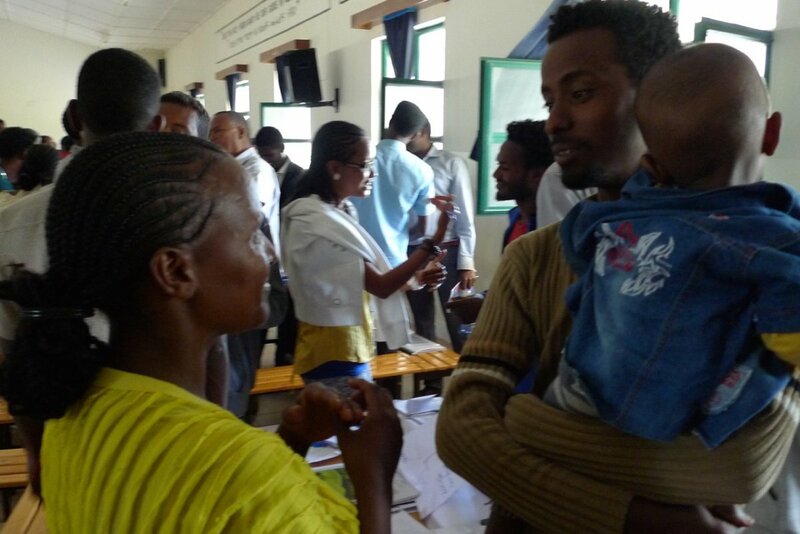 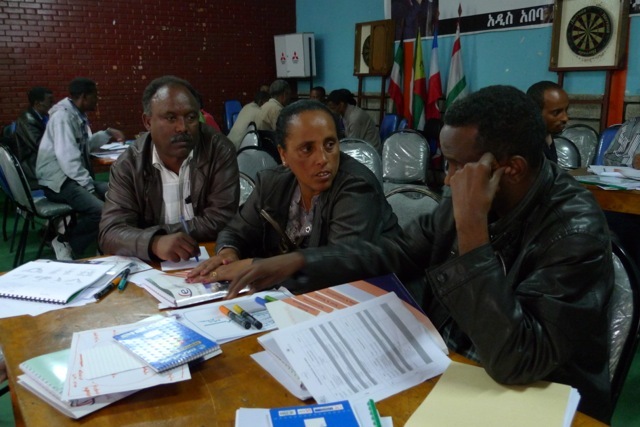 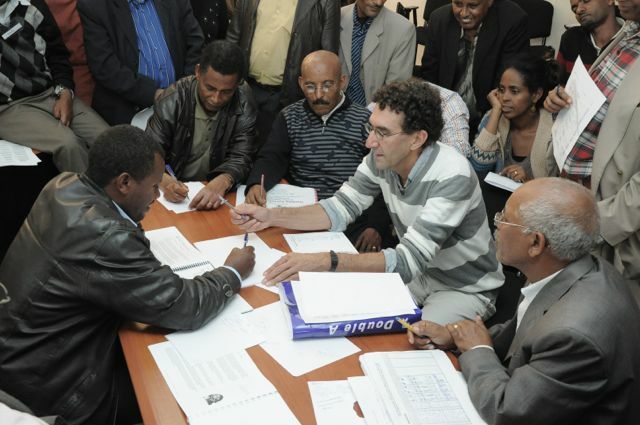 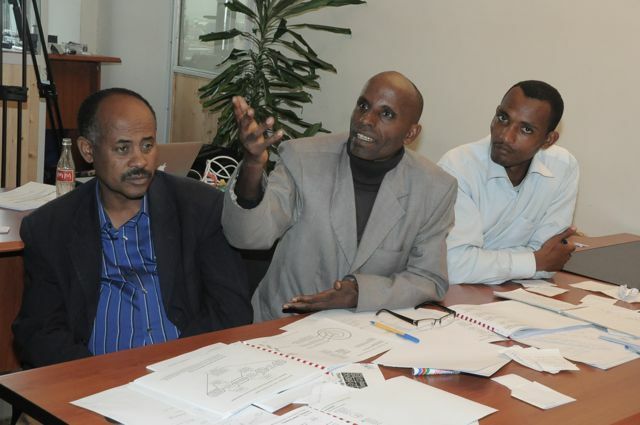 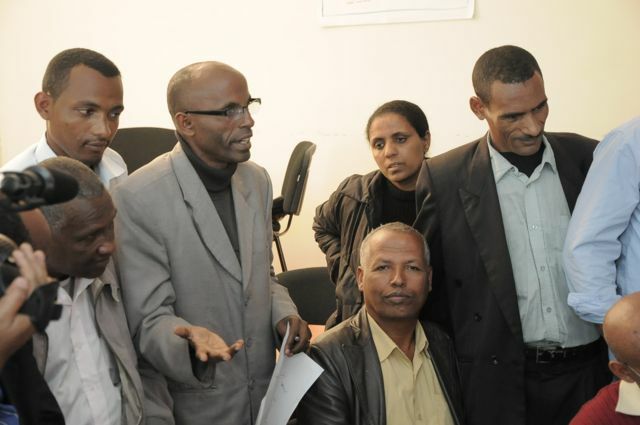 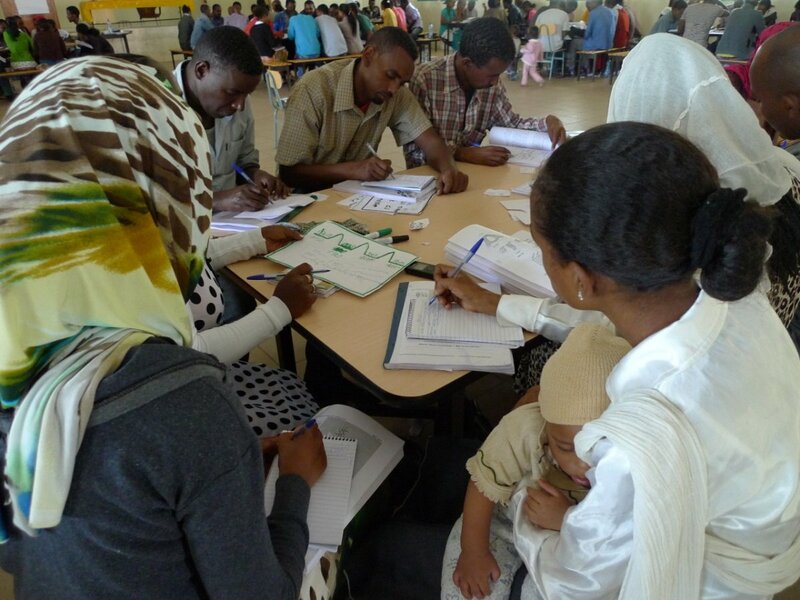 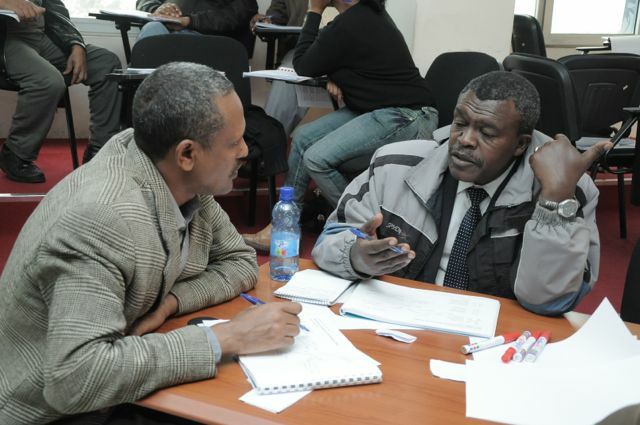 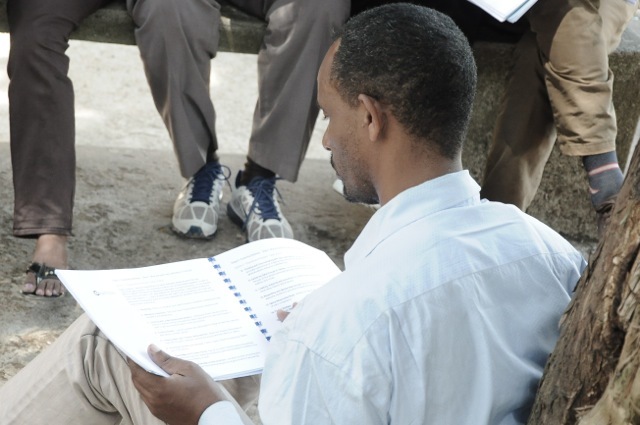 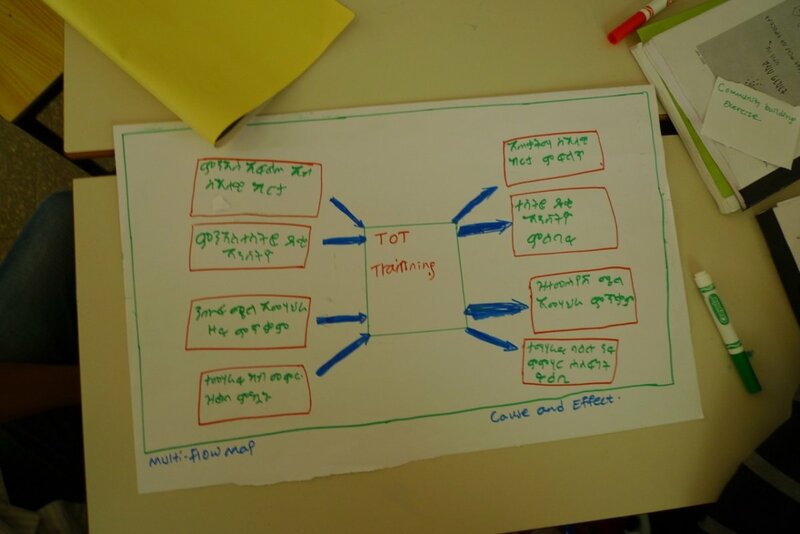 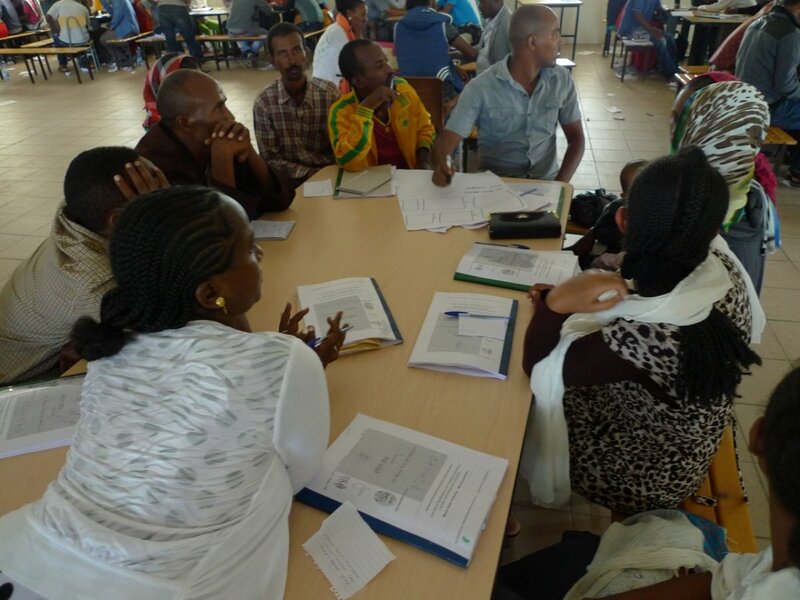 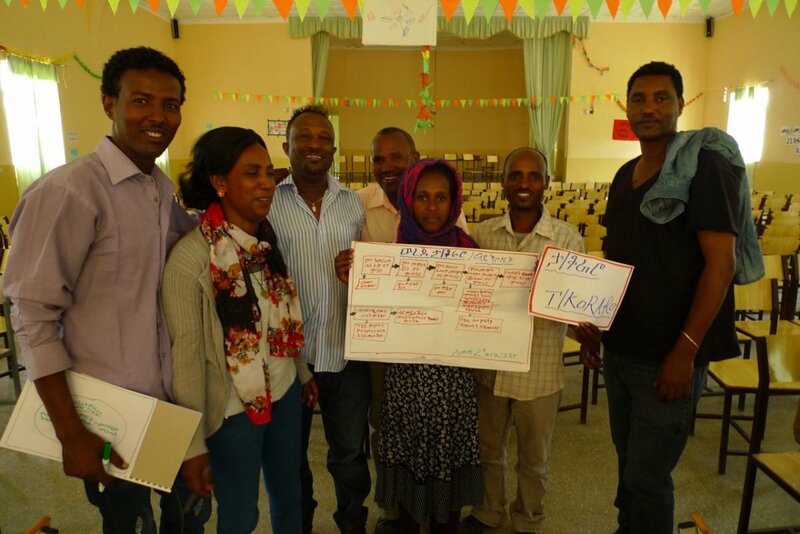 The Trainer of Trainer model implemented with the Thinking Schools Ethiopia: Tigray project is equal parts ToT and Leadership professional development. 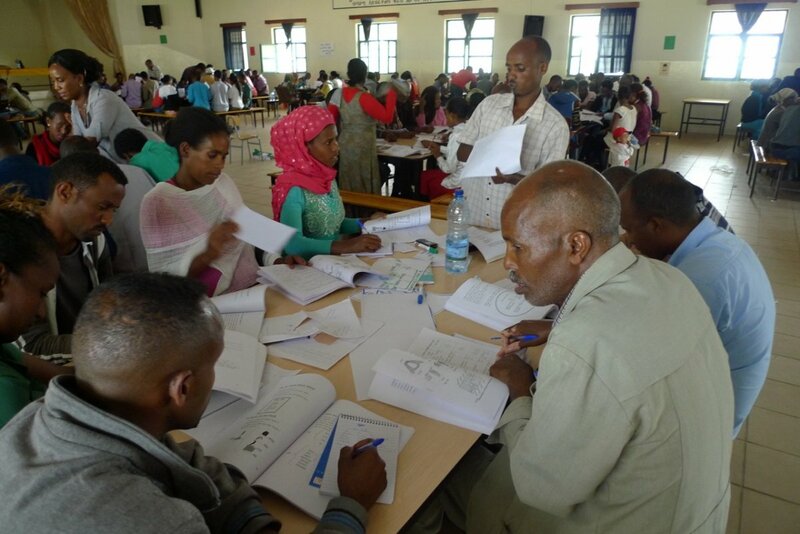 The first four days were training for the ToT educators with two from each of the 37 school. 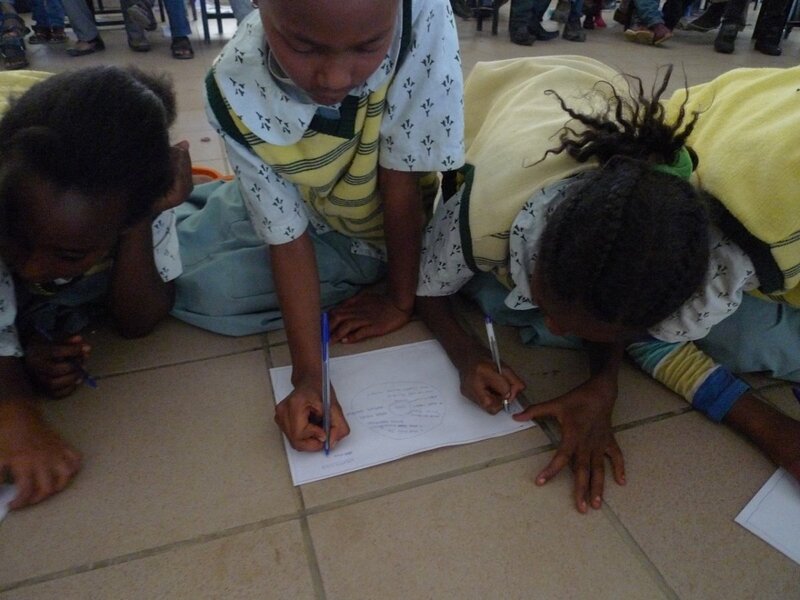 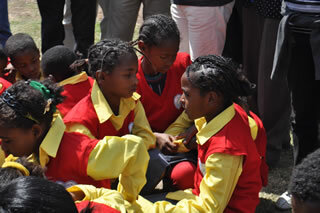 The goal is to have equal gender representation as role models in respect to the Sida support with ‘girl empowerment’. 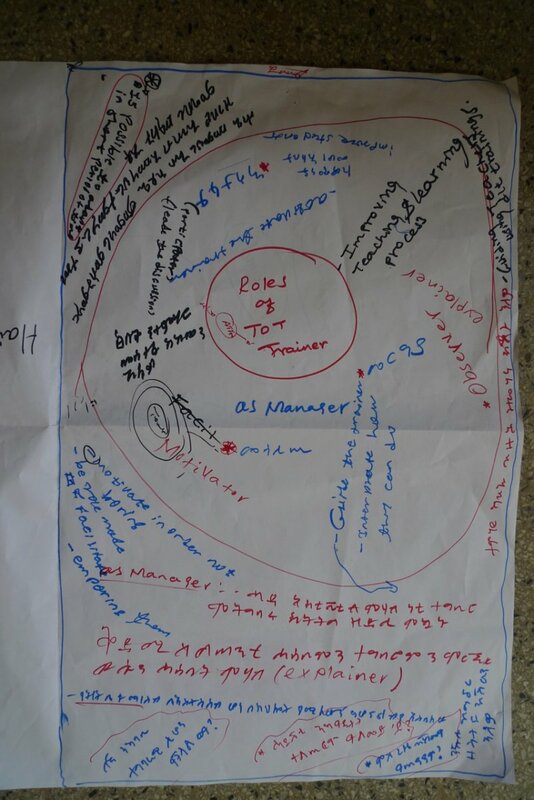 The second ‘step’ of the ToT training has the ToT trainers leading their schools while ‘apprenticing’ under the leadership the the TSI Global Trainer and TSE Trainers. 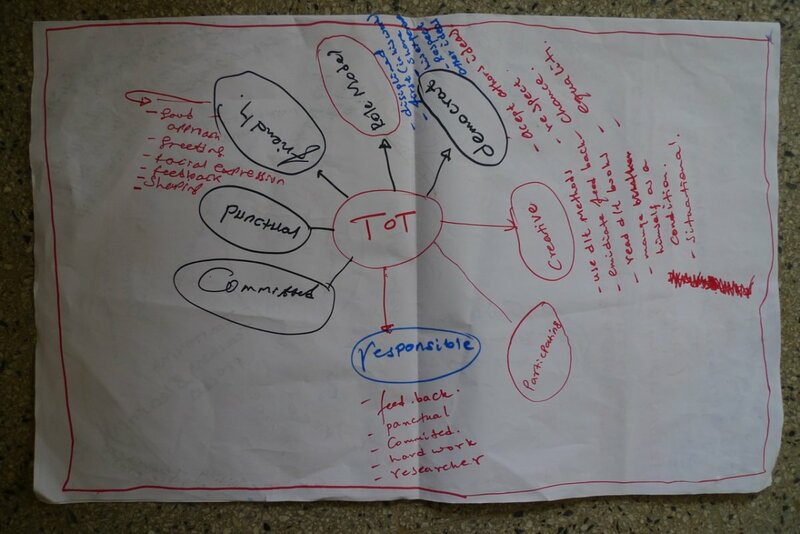 The ToT trainers clearly took the roles as leaders in facilitating what was modeled within their respective school contexts. 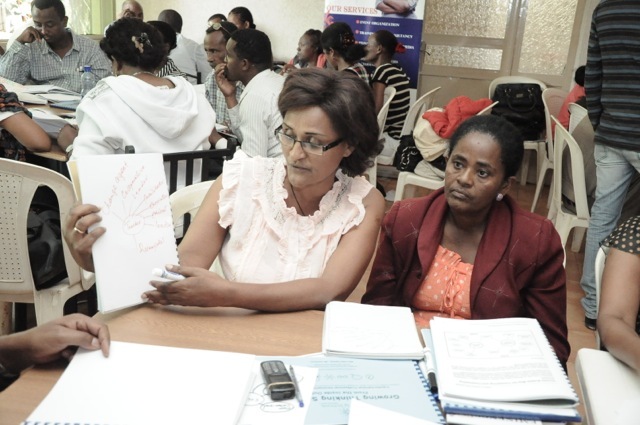 In addition to the leadership with their schools, the ToT were very supportive of coaching one another. 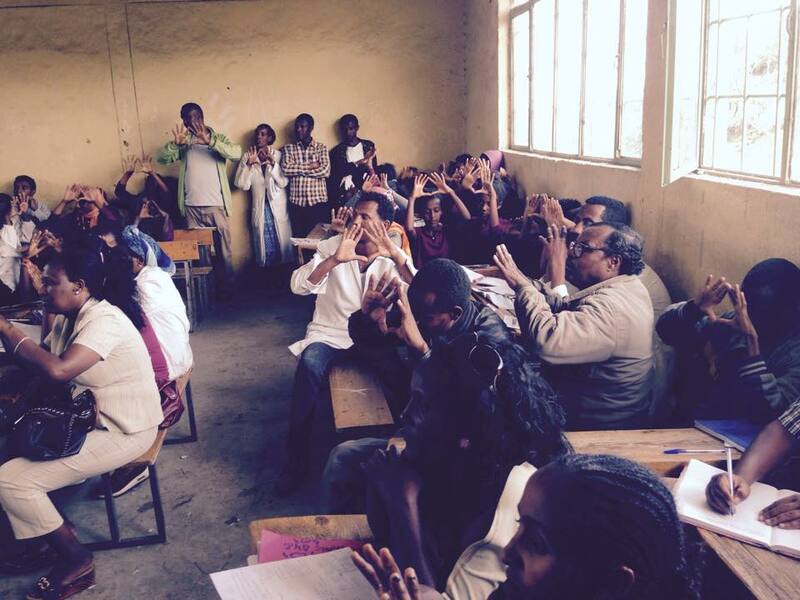 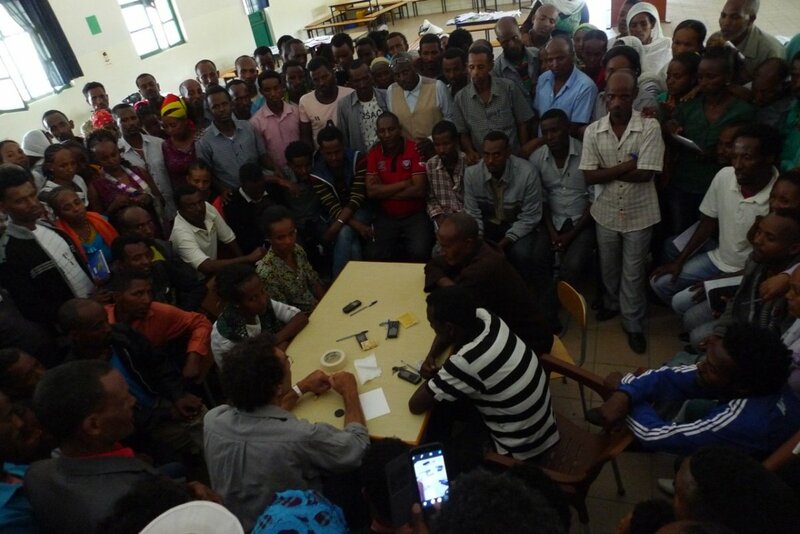 This is reflective of Ethiopia being a collaborative society as a much as the professionalism of the educators. 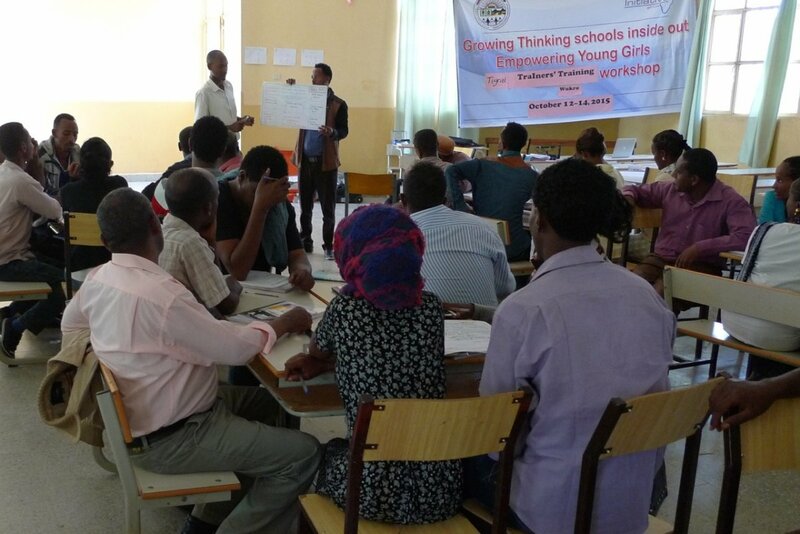 The Growing Thinking Schools Inside Out handbook guide was translated to Tigrinya which was welcomed by all the participants, especially the ones who had been in the initial school leadership trainings when the guide was in English. 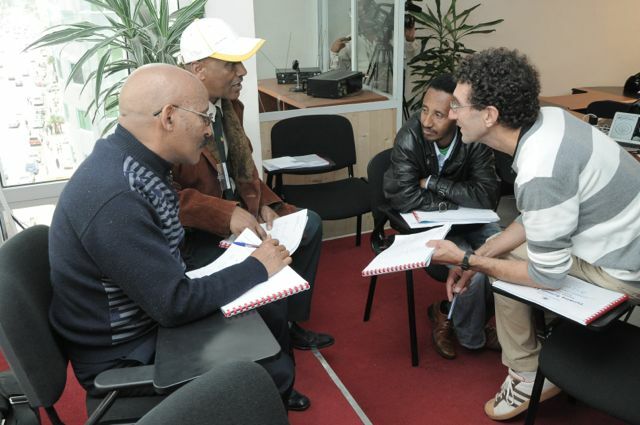 From this training, we will further refine the translation. 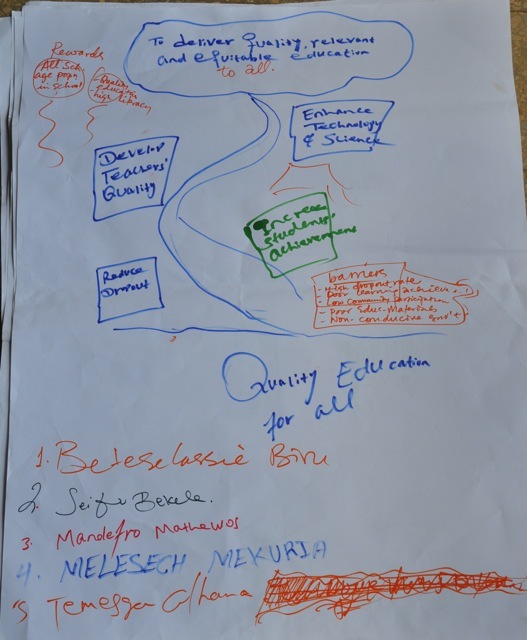 Additionally a Student Practice Guide was developed and shared with all participants to comment on prior to translating the final guides for primary and secondary implementation. 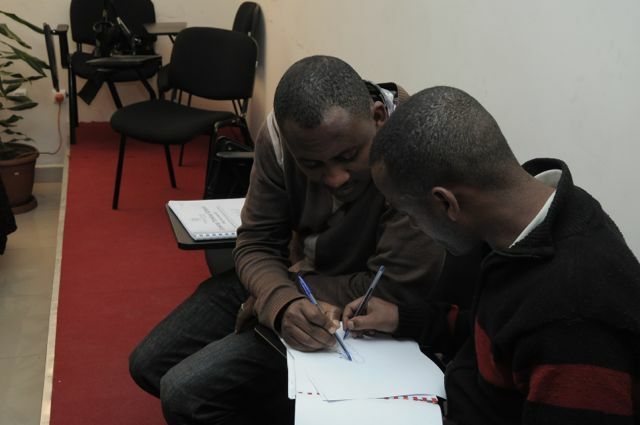 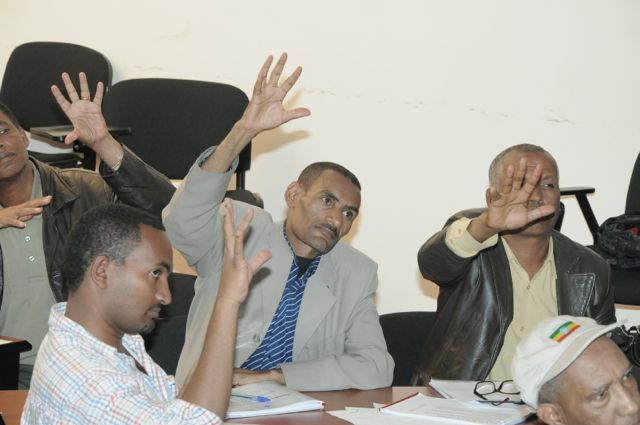 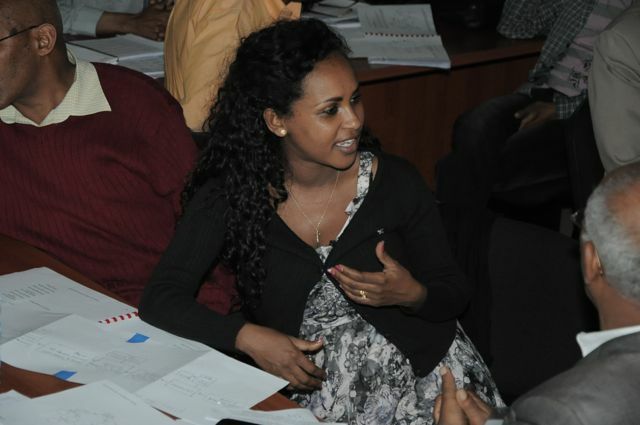 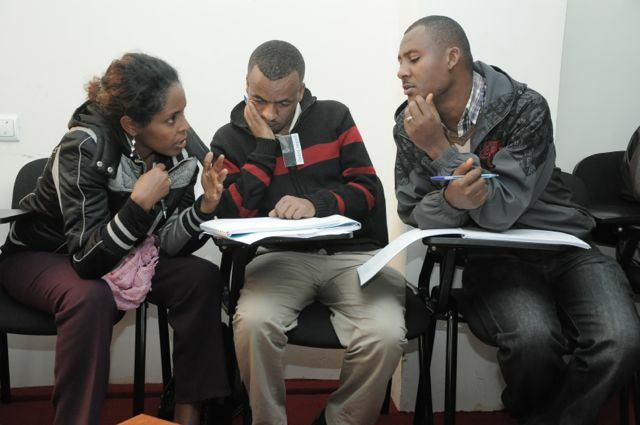 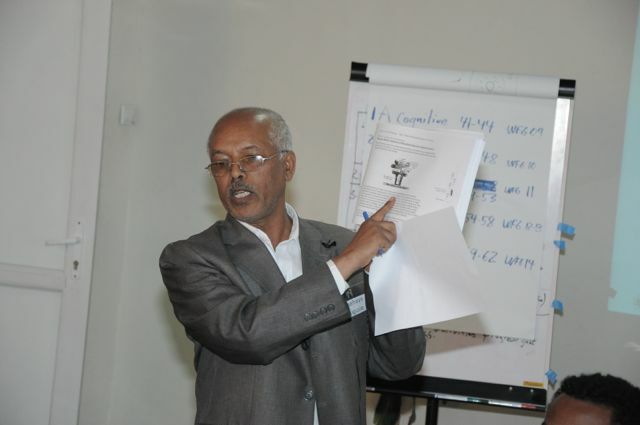 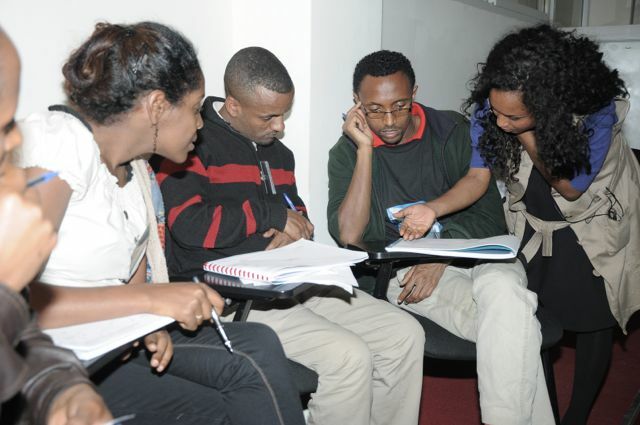 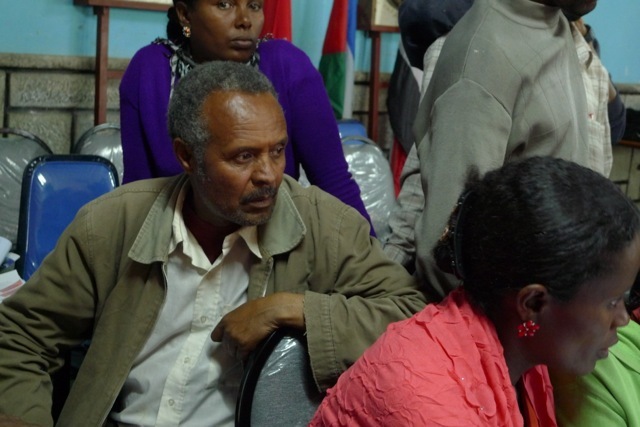 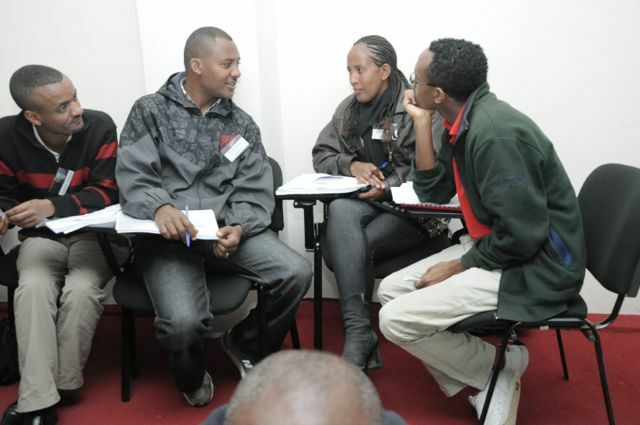 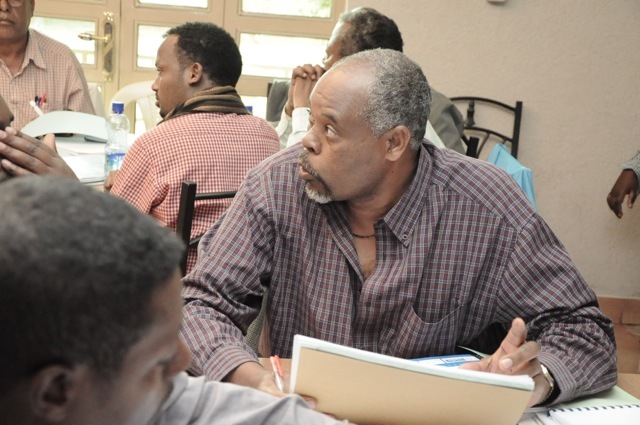 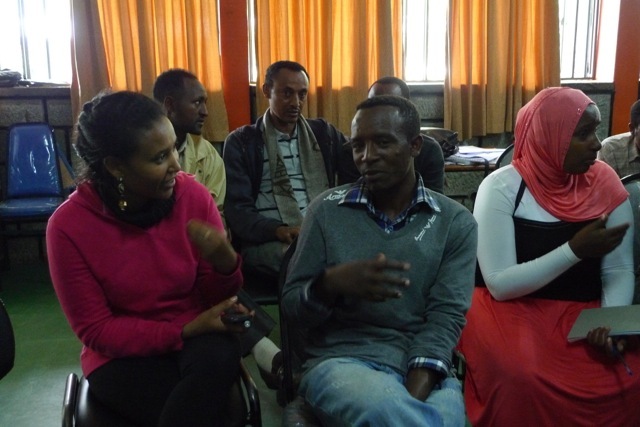 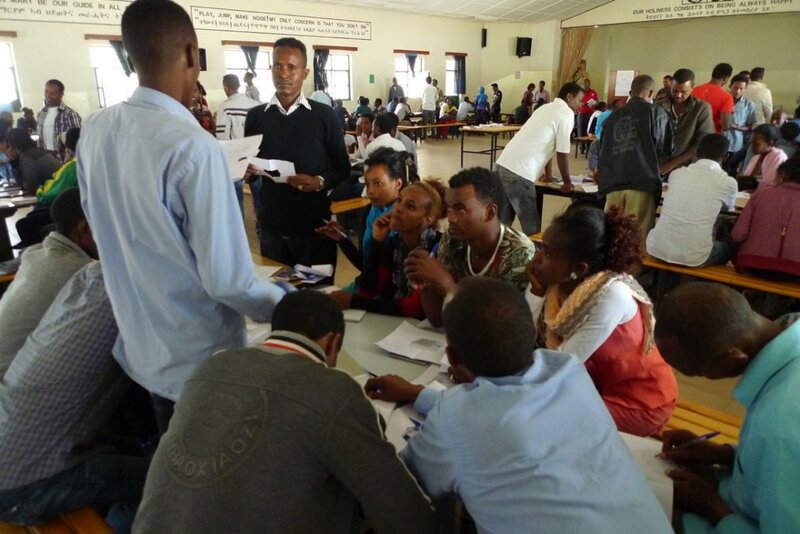 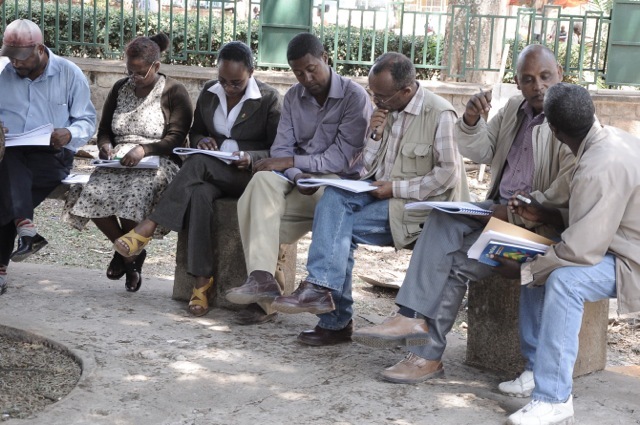 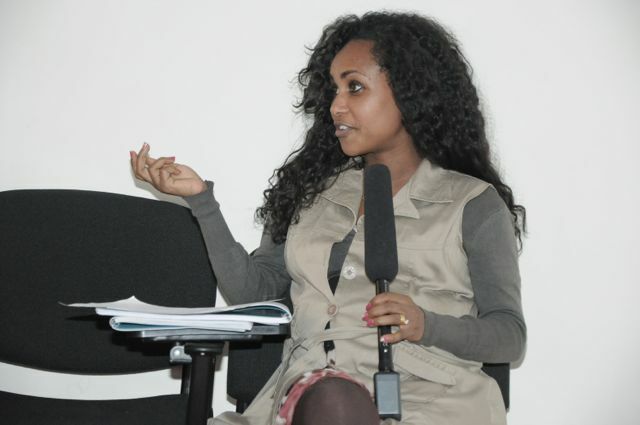 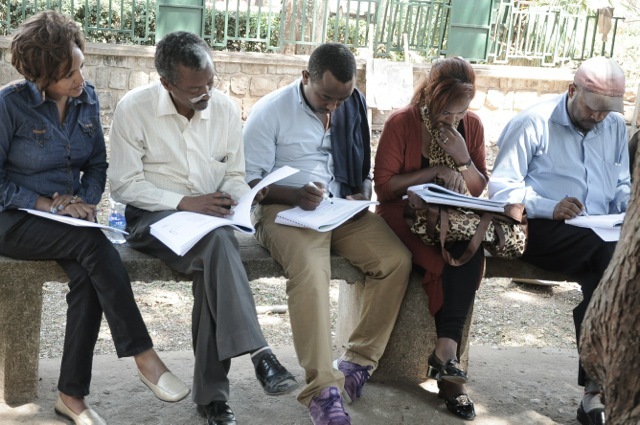 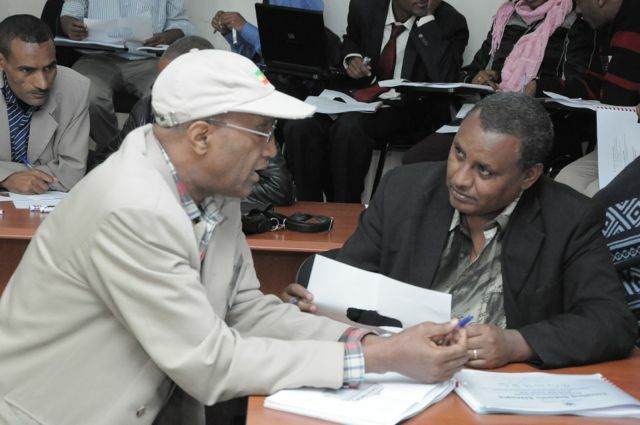 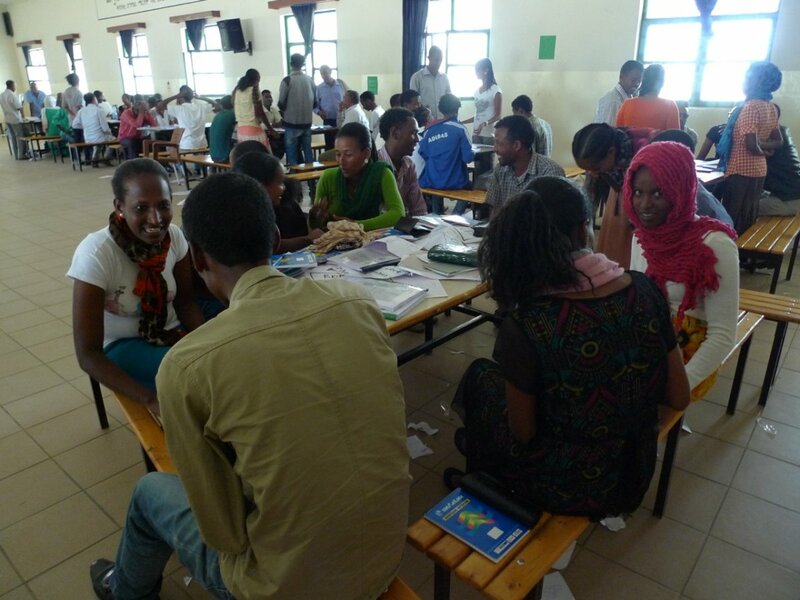 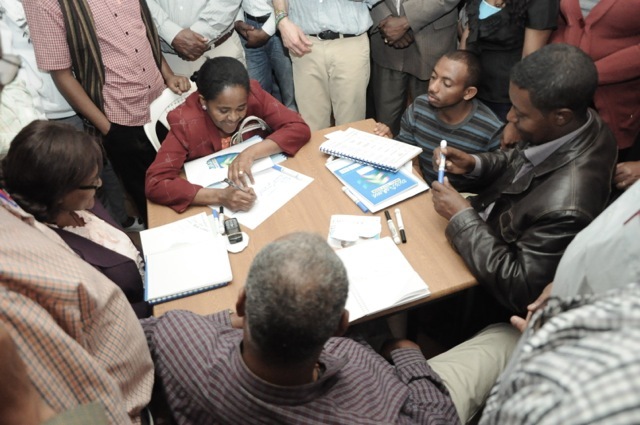 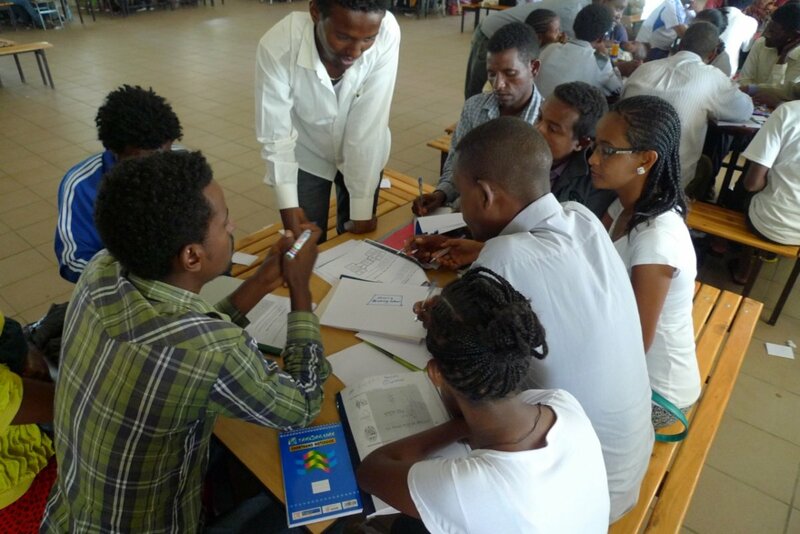 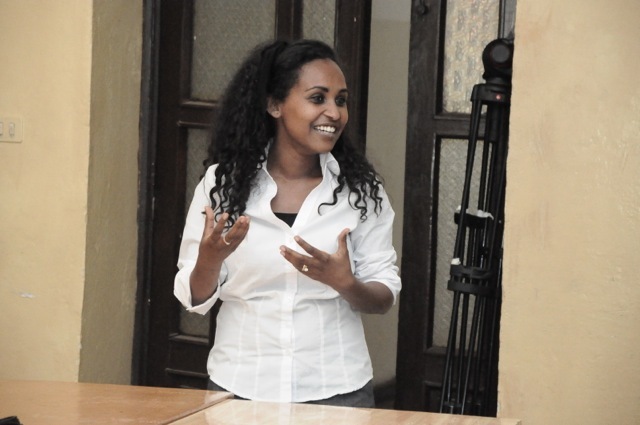 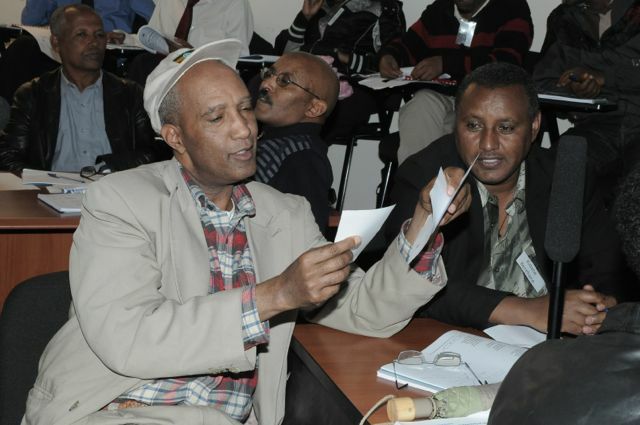 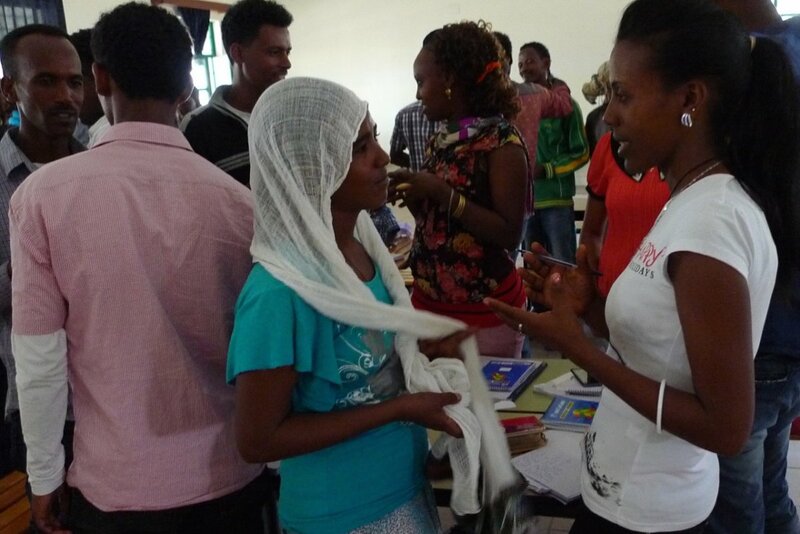 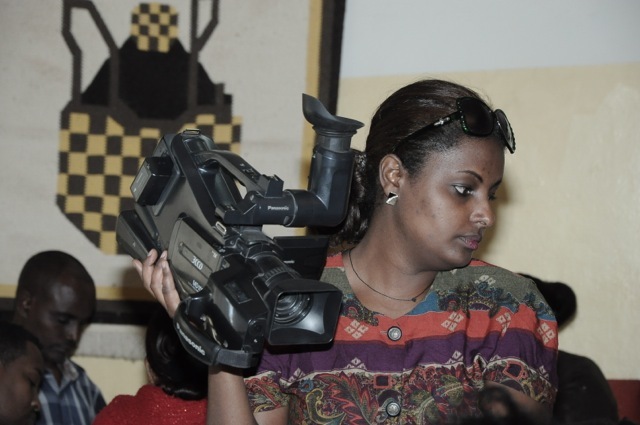 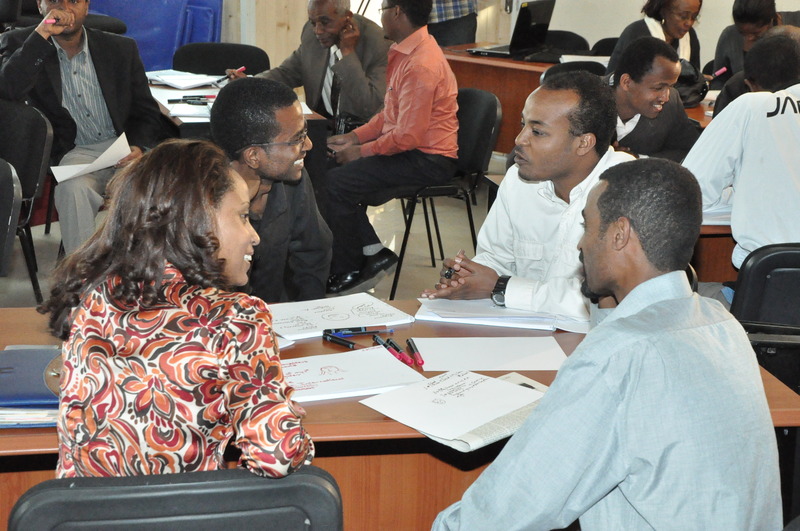 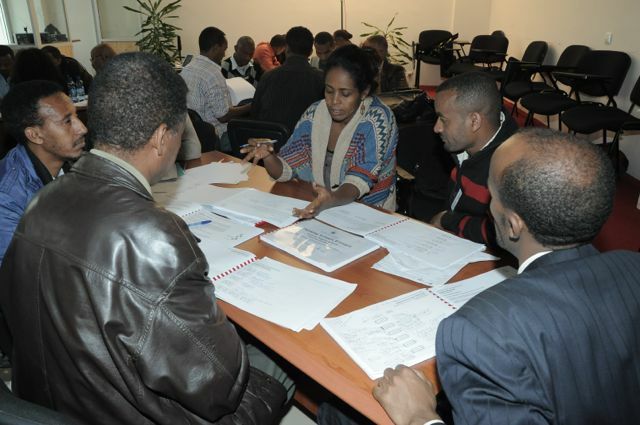 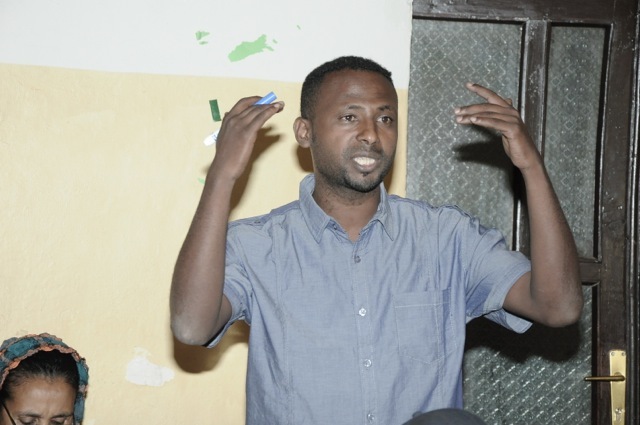 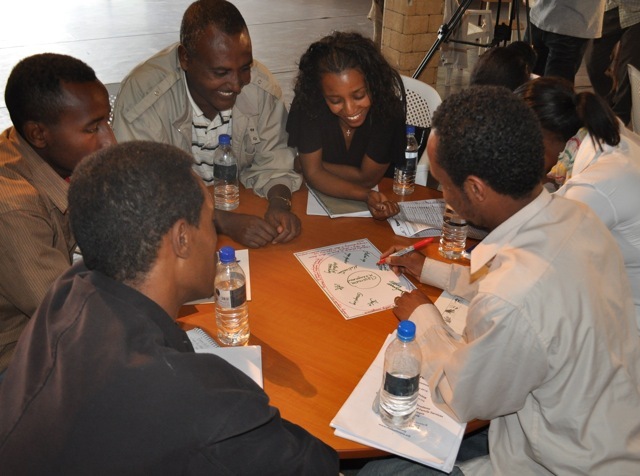 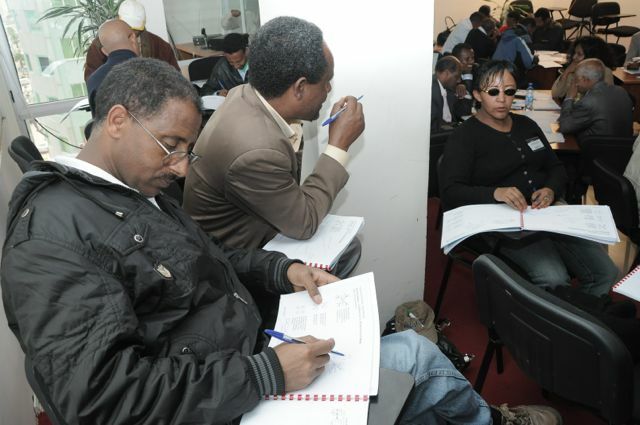 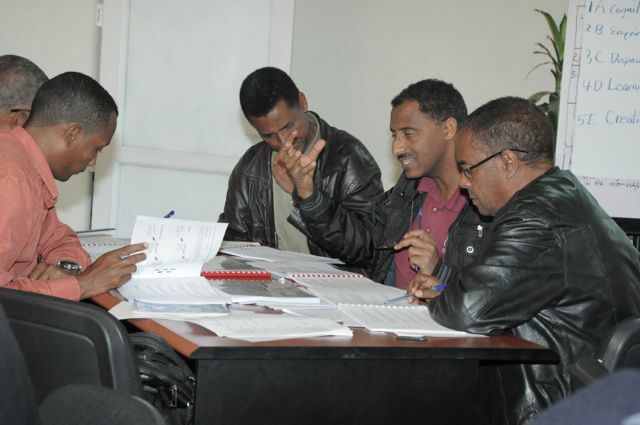 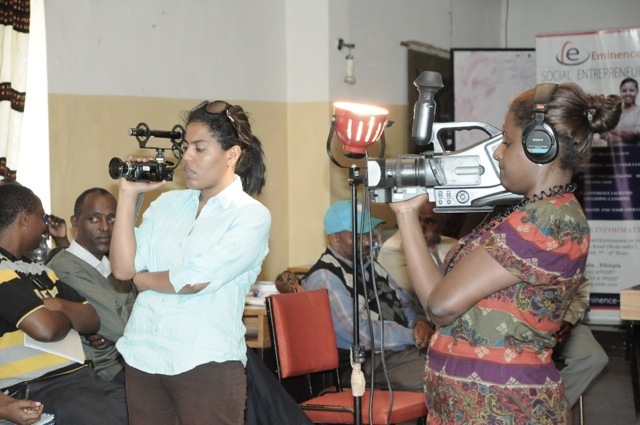 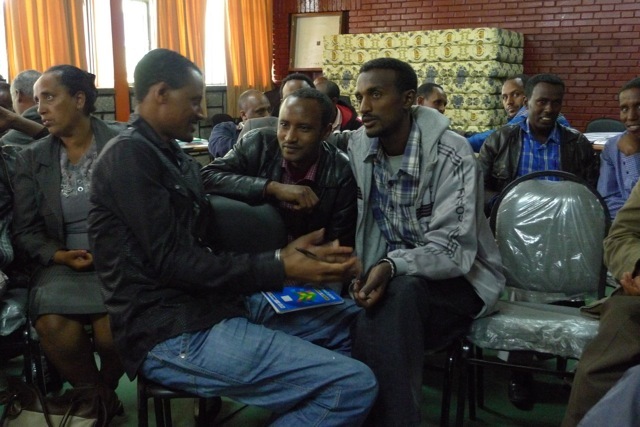 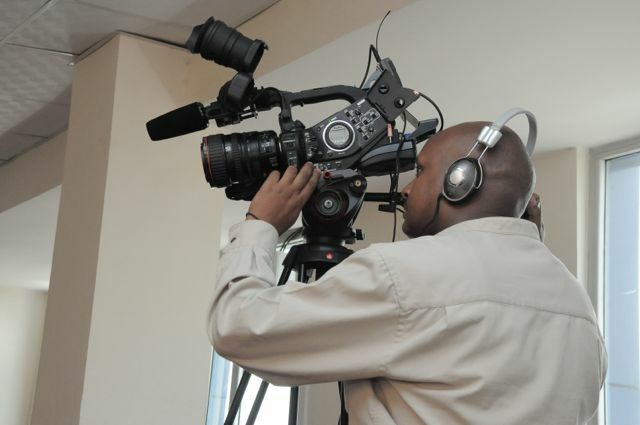 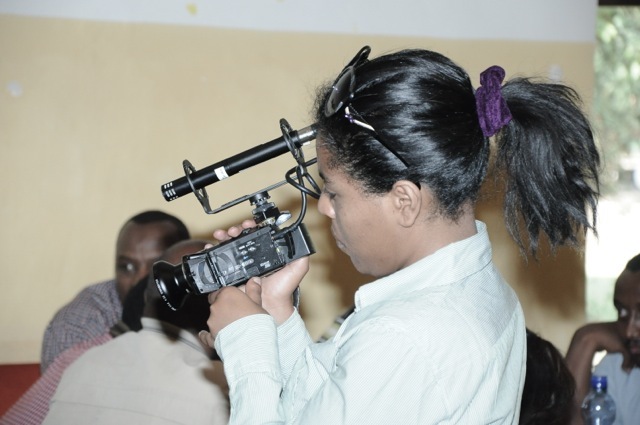 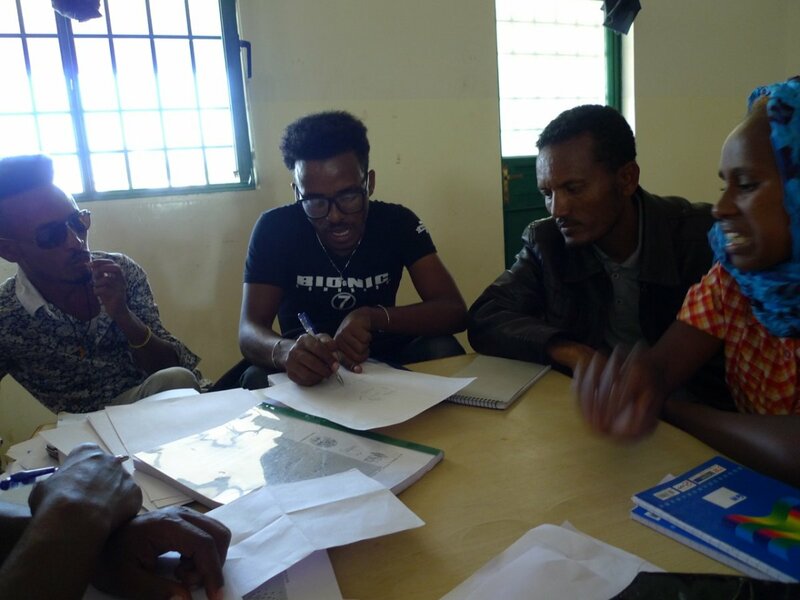 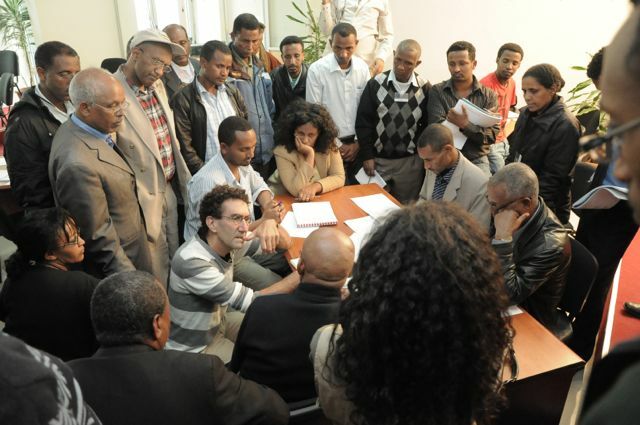 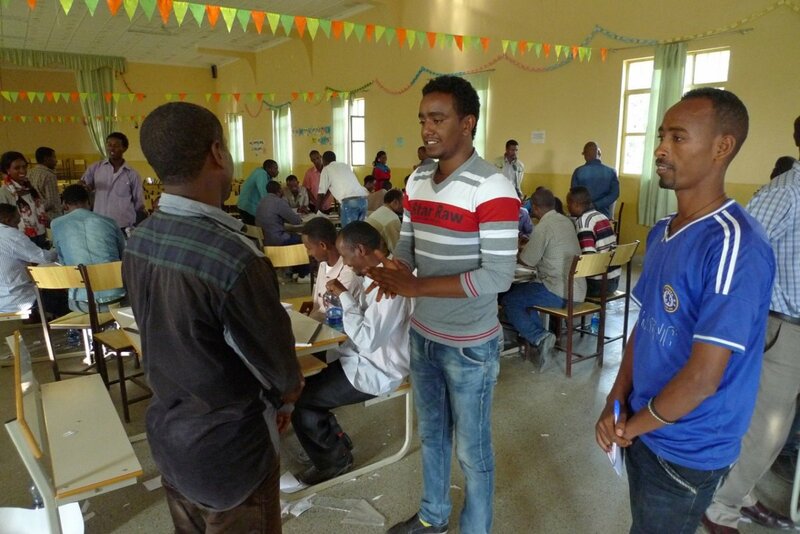 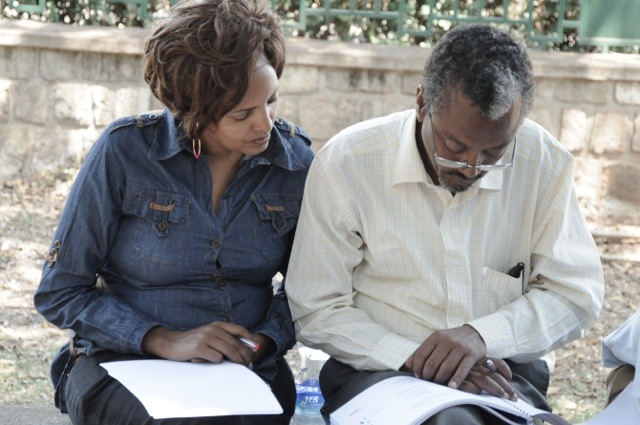 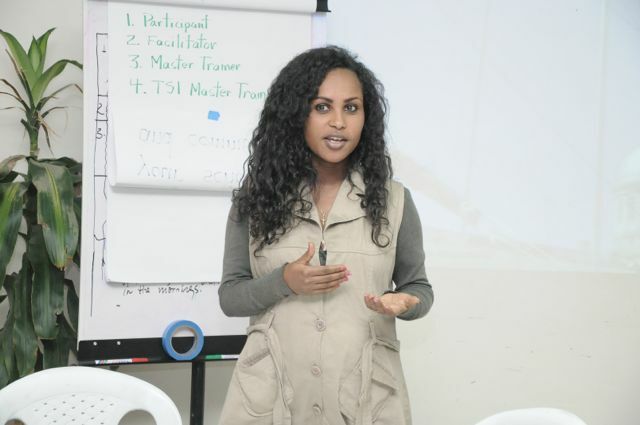 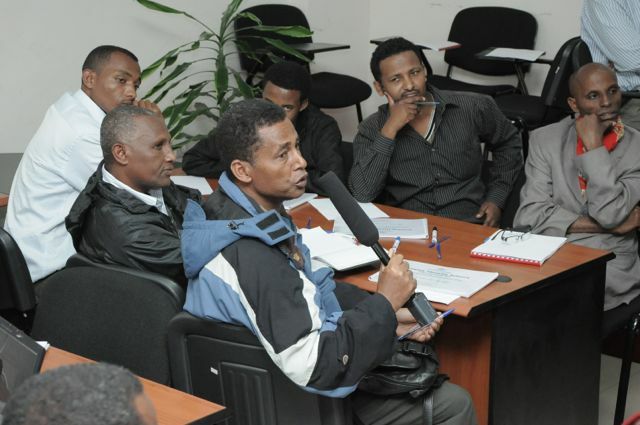 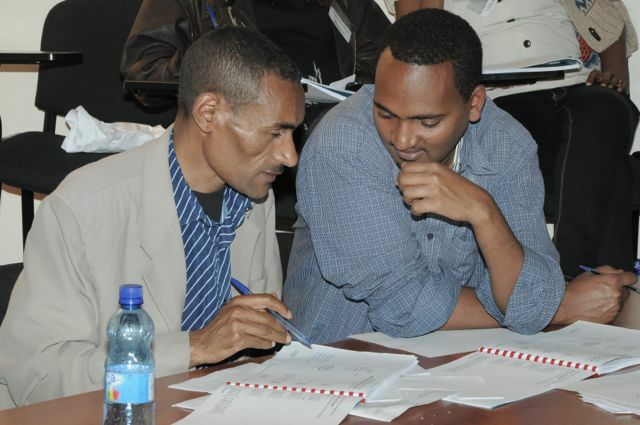 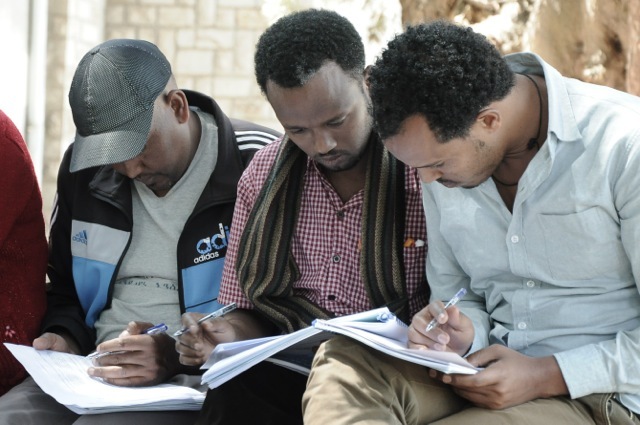 The trainings are conducted with the TSE trainers whom speak both Tigrinya and Amharic. 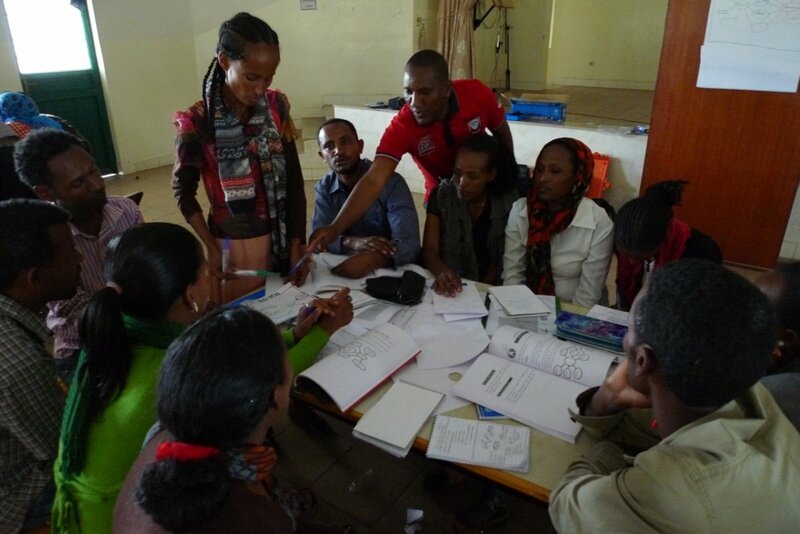 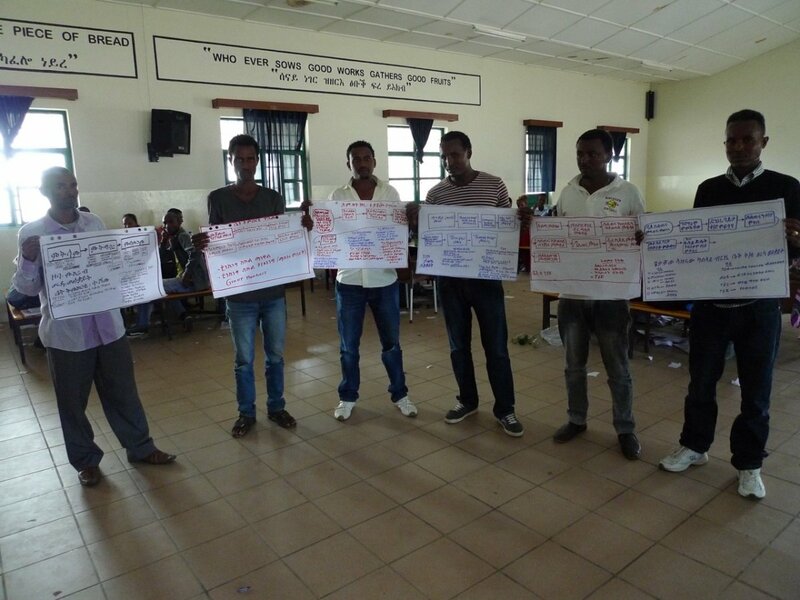 The ToT facilitators also took leadership roles in regards to translating. 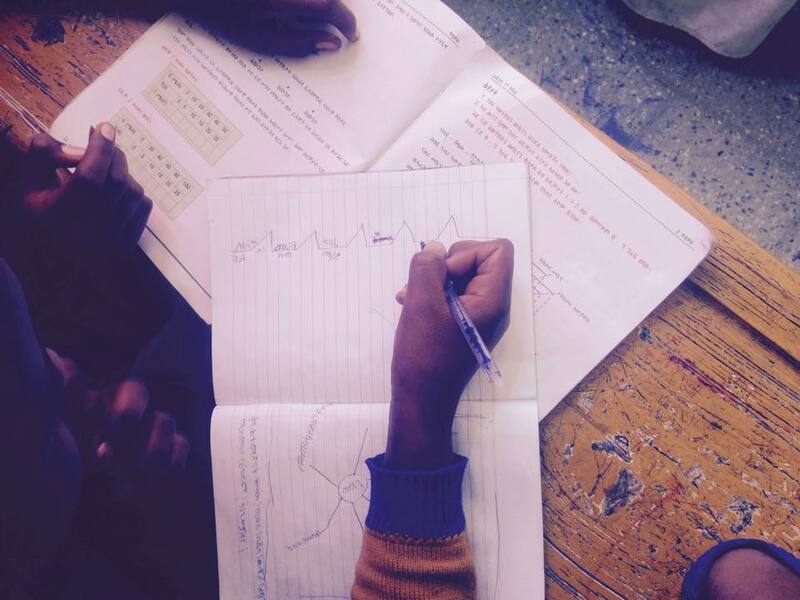 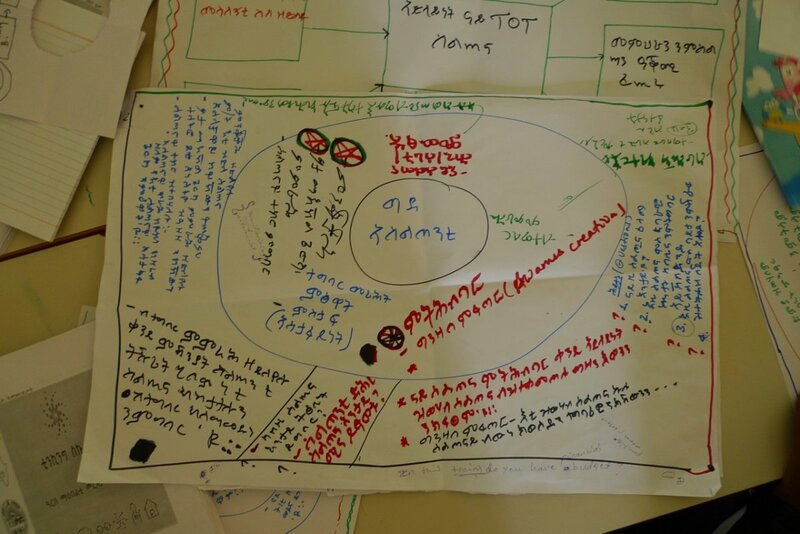 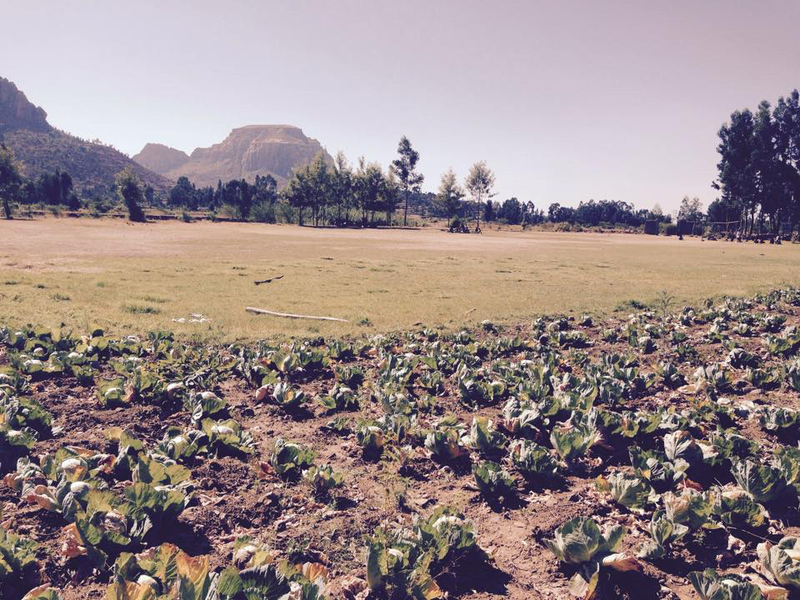 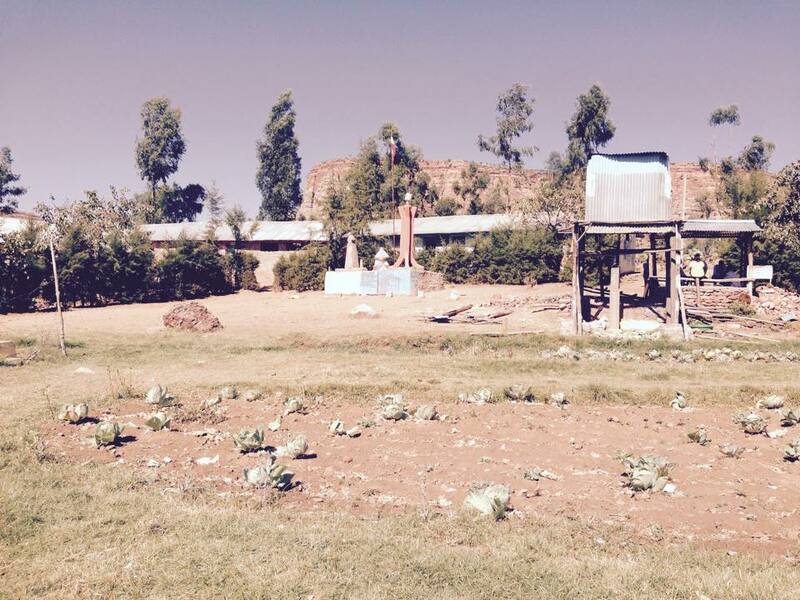 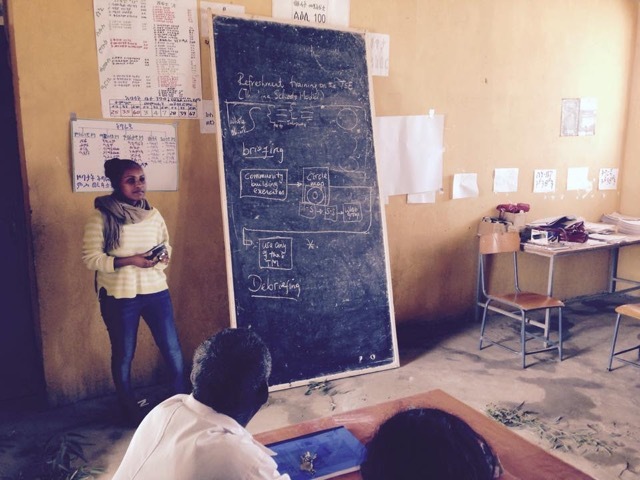 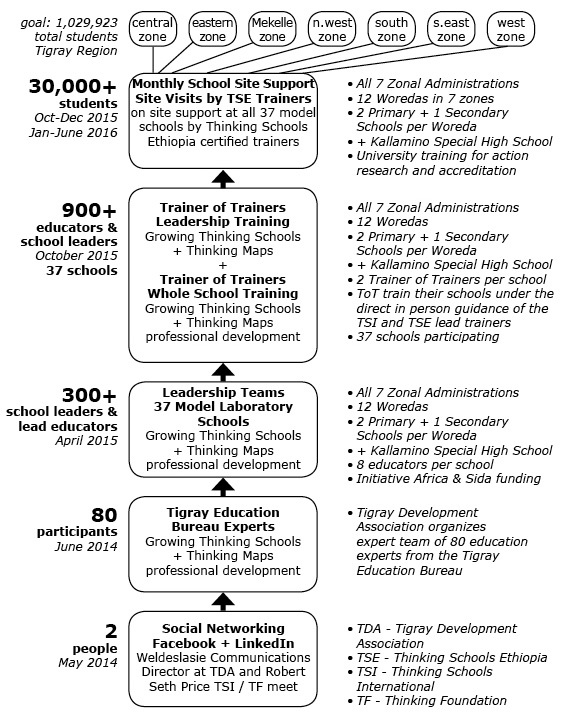 Visual overview of the Growing Thinking Schools Project in Tigray Ethiopia. 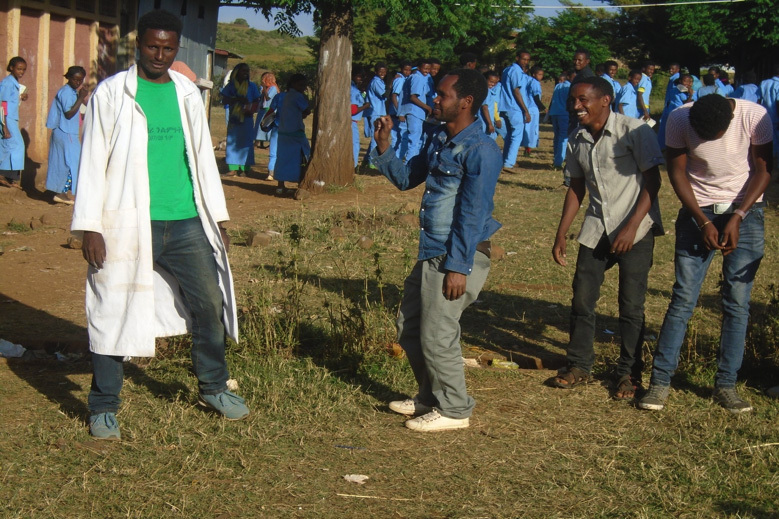 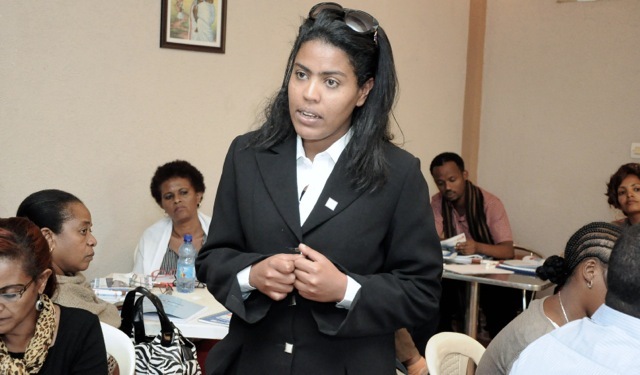 What began with a social media connection is now 37 laboratory model schools representing 12 Woredas in all seven Zonal Administrations. 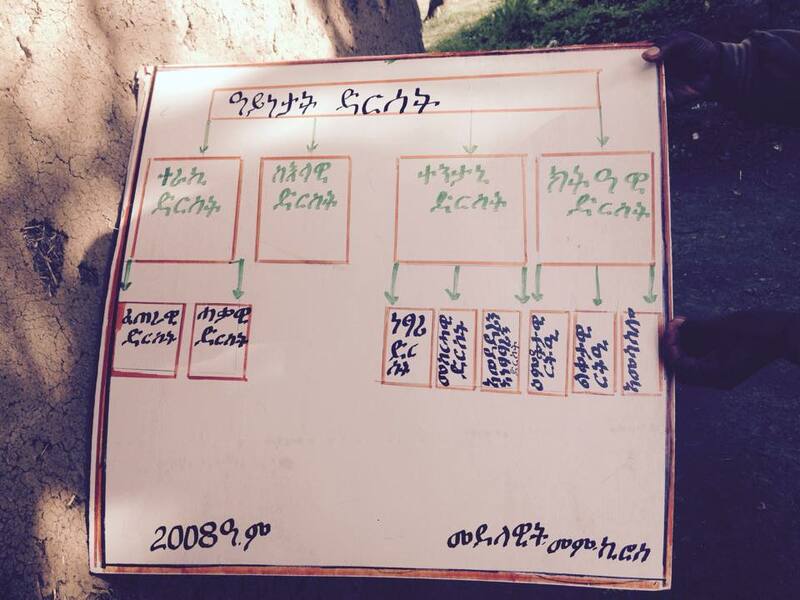 Each Woreda has 2 primary and 1 secondary model laboratory schools. 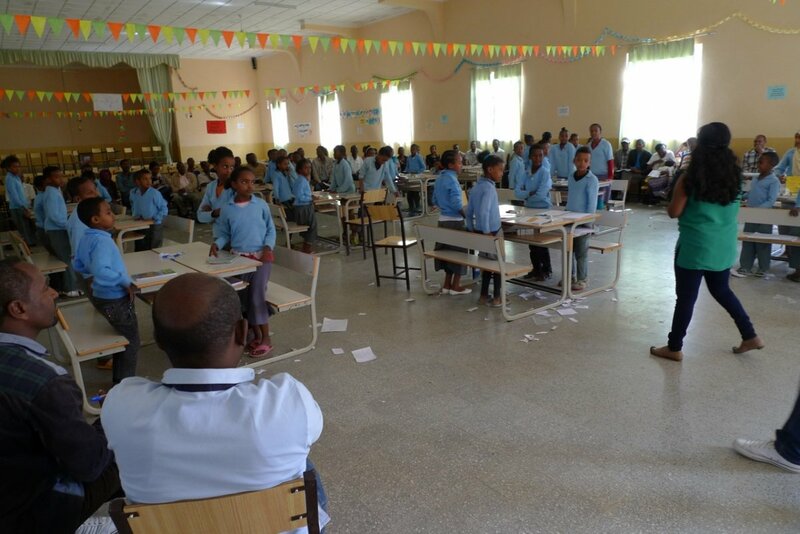 In addition to the 36 schools, there is one additional model laboratory school in Mekelle: Kallamino Special High School for a total of 37 model laboratory schools. 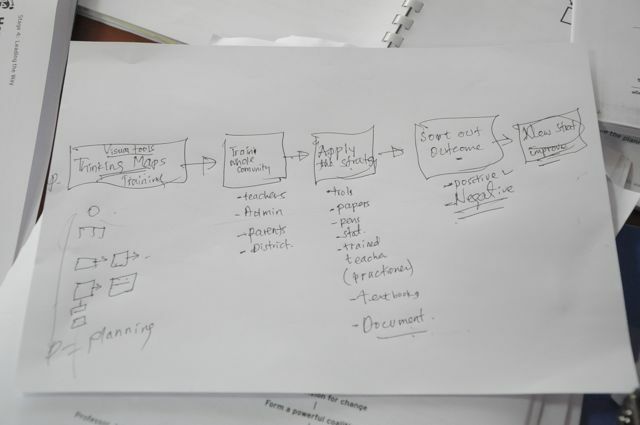 beginning the planning stage for the short and long term process of explicitly and systematically integrating “thinking” processes into the existing “learning” processes within your school. 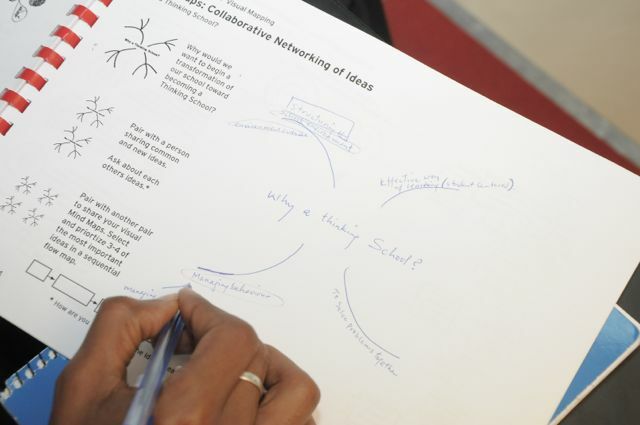 This guide does not provide an answer, but offers starting points for the journey toward becoming a “Thinking School” of the 21st century. 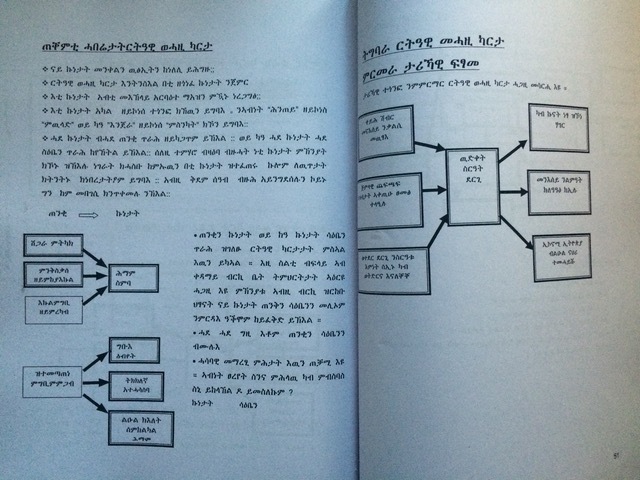 At the back of this guide is a pullout document called the Working Field Guide. 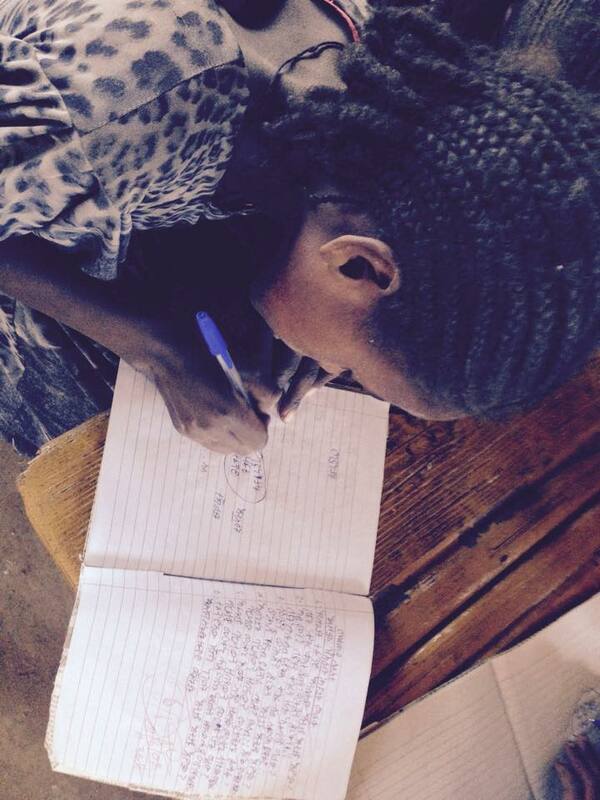 This is like a journal that you might take along on trip for writing down your ideas. 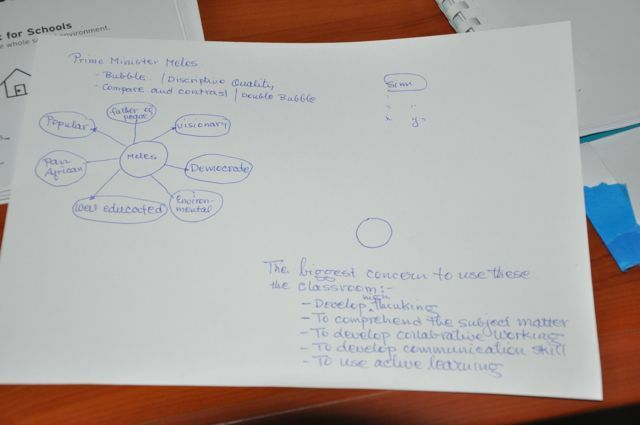 In this case, you will be collaboratively mapping out your ideas and reflecting on uses of thinking tools, techniques and strategies with your colleagues. 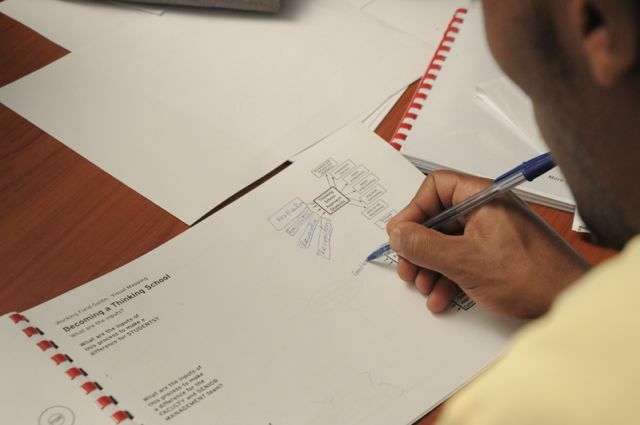 It is a place for you to be creative, to capture ideas, and for reference as you move forward.